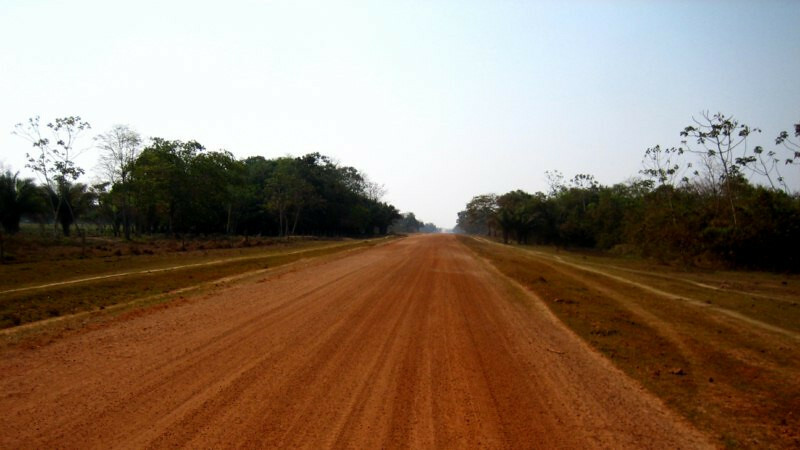 From Itaituba, the TransAmazonica is more busy and was not as enjoyable as the section west of there. 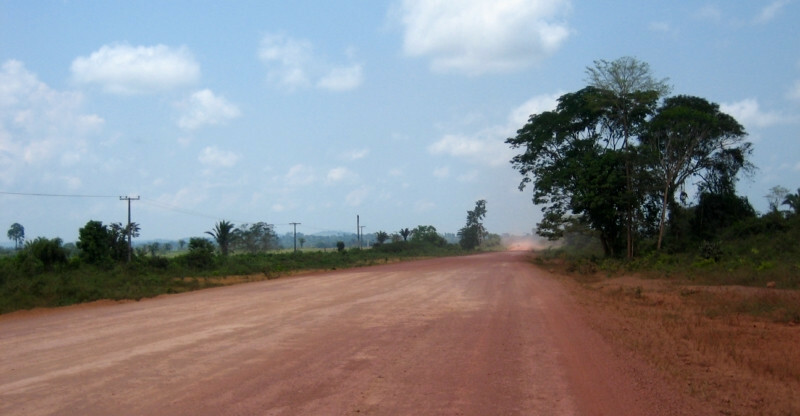 It was another 1,000 kms (620 mi) to Maraba, where the dirt road ends and then I turned north for Sao Luis. Oops, I made a boo-boo. 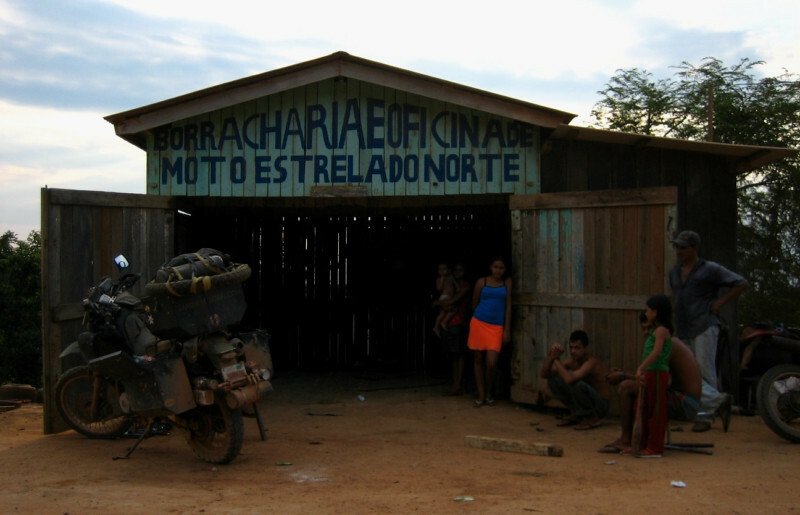 I pulled into Itaituba and went about setting up camp at the side of a petrol station. The station manager insisted that I move in front of the office so that he could keep a proper eye on me for my safety since it was too unsafe in the shadows. But, as I parked the bike up front, I didn’t pay attention to the slope and sanDRina went crashing down on her right side. These poor Happy Trail panniers are sure taking a beating, but I’m quite impressed with their strength. I used a hydraulic jack from a nearby tire shop to straighten out the box so that it would close again. The box was the lesser worry because I found my subframe had cracked on the opposite side. 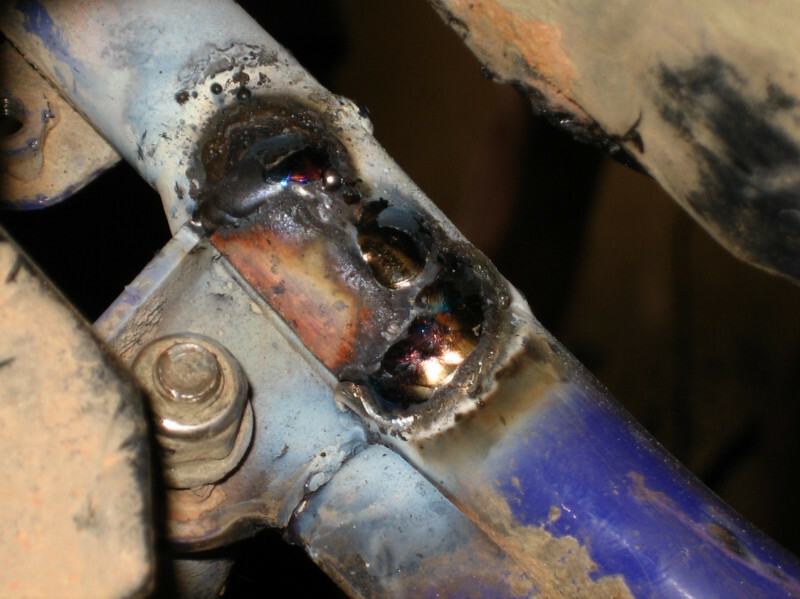 As the bike fell on its right side, the weight of the left pannier impacting the subframe through the pannier rack was too much for it and it sheared around the joint. 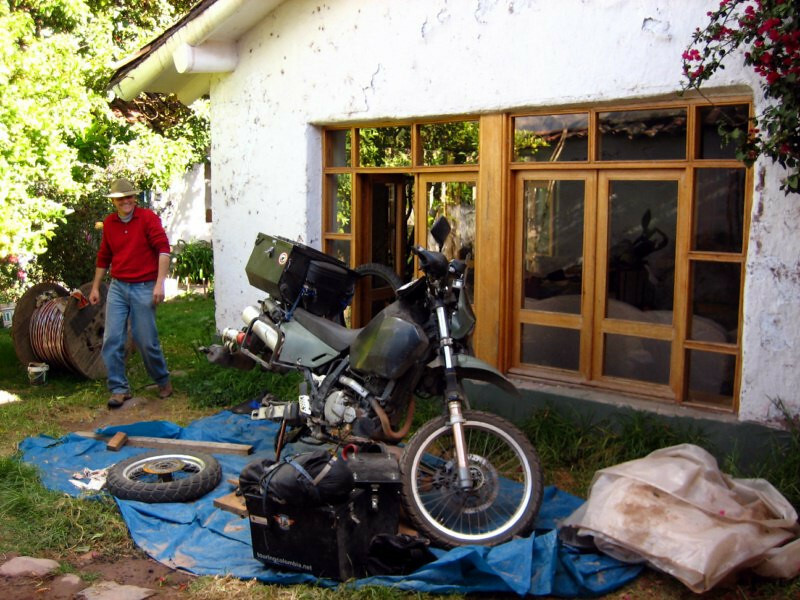 Note: this is not the actual frame of the bike, but the part called the subframe, which supports the rider and the luggage. A welding shop was nearby and the guys got right to work. They were quite young, but looked experienced in the jobs they were doing. 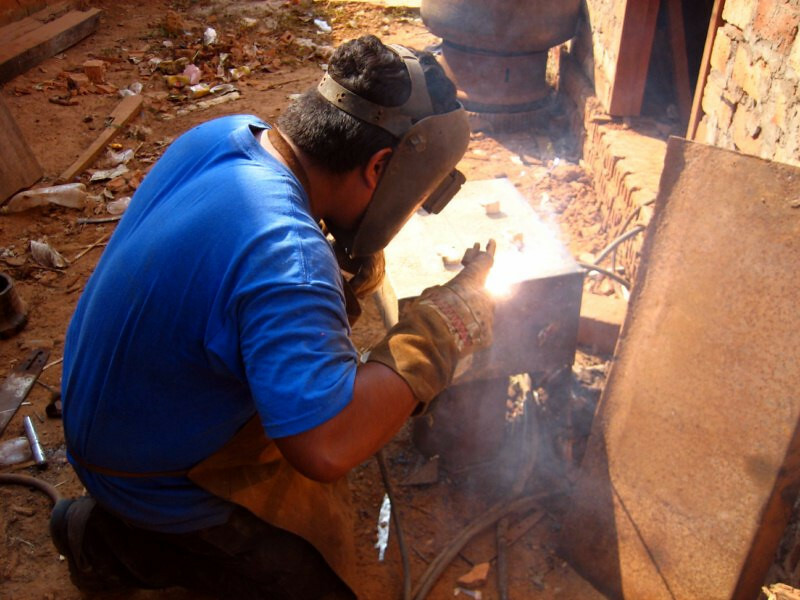 Lots of cracked crankshafts, wheel rims and other heavy duty vehicle parts were being welding up by these guys. In the process of filling in the hole. They did a good job for R$ 20 and it hasn’t shown any signs of weakness, yet. Ready to hit the road with the bike all put back together. 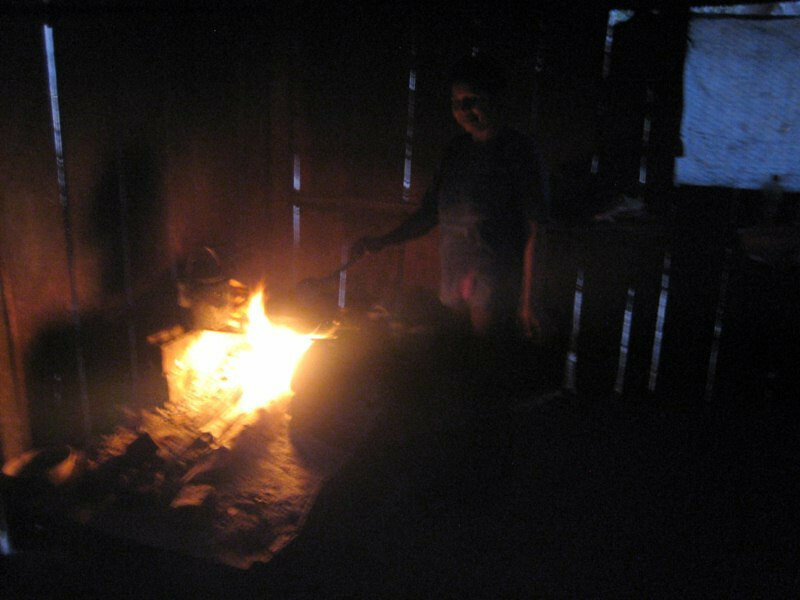 That’s Edson, the son of the petrol station owner who let me use some free internet and wanted to practice English with me. I slept on the sidewalk there with my tent, but it was too hot at night and I was sweating buckets. I was ready to throw in the towel, but I didn’t want to move sanDRina with all the luggage until I could fix the subframe. 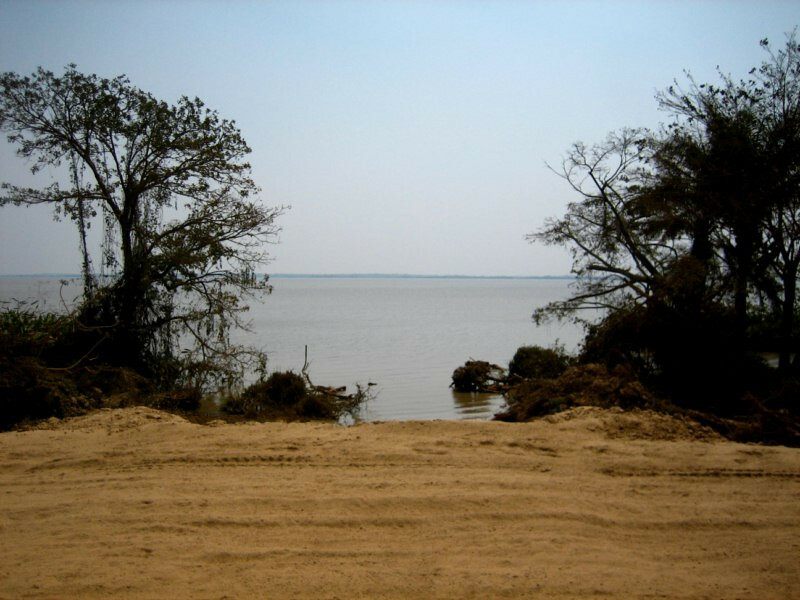 On the shore of Rio Tapajos in Itaituba. 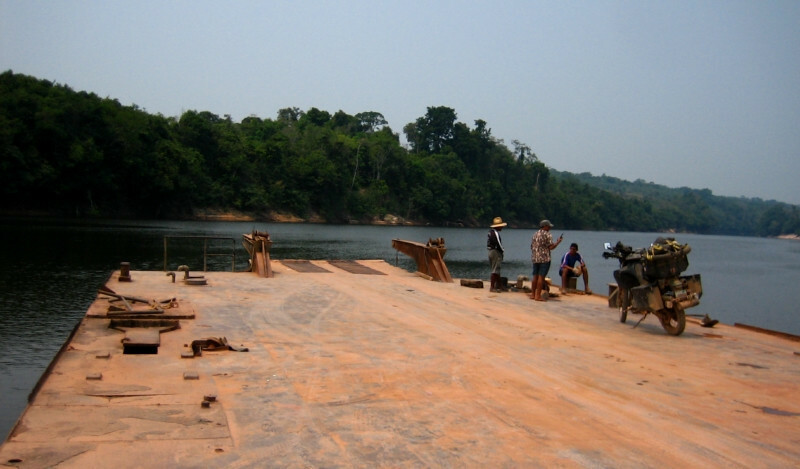 Boarding the ferry across the wide Rio Tapajos, which left once every hour for a 20 minute ride to the other side. 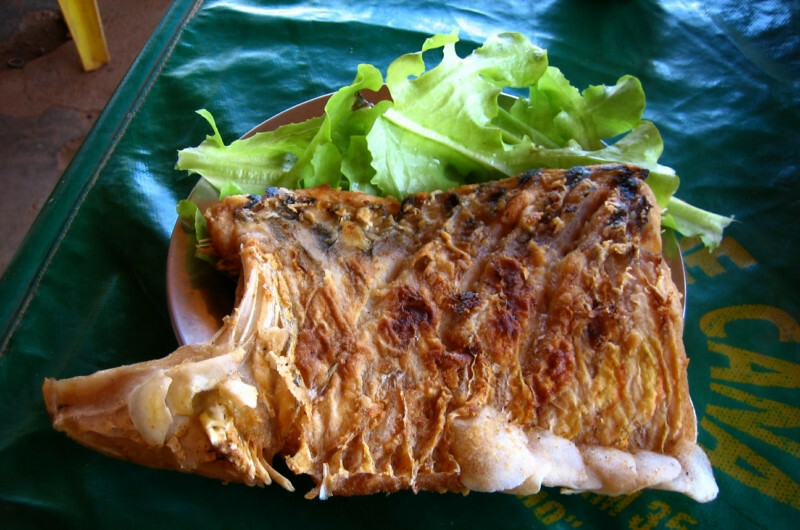 Having a quick snack of a pastel (pas-teu), a typical fried snack found all over Brazil. It’s a puffy pastry shell with meat or cheese inside. Goes well with hot sauce. 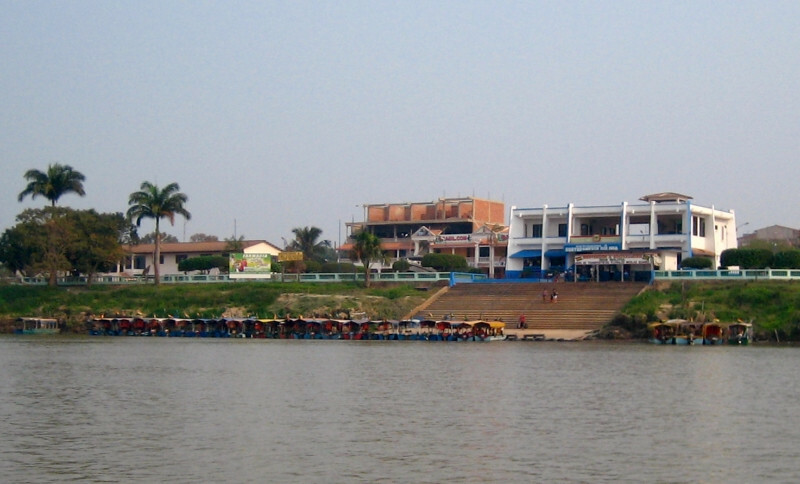 Looking back at the shores of Itaituba from the ferry. I didn’t get to see the Amazon River, but I can imagine how grand it must be, compared to these gargantuan tributaries. 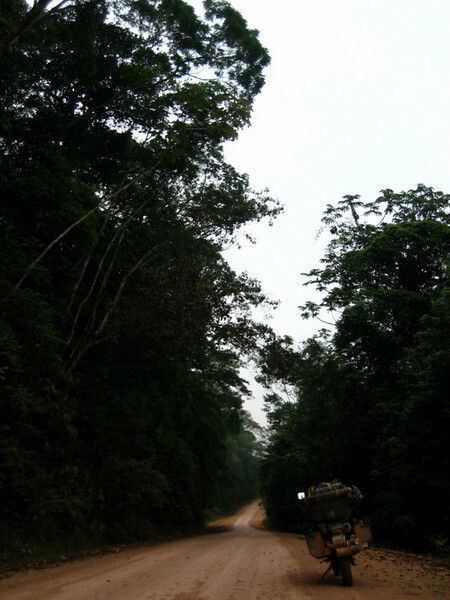 On the final stretch of the TransAmazonica Highway. It immediately felt less interesting of a ride with trucks and buses rushing by with hordes of small motos swarming like mosquitoes. There was lots of construction and looked like they were getting ready to make it a 6-lane highway, uggh. My first lunch since the churrasco. 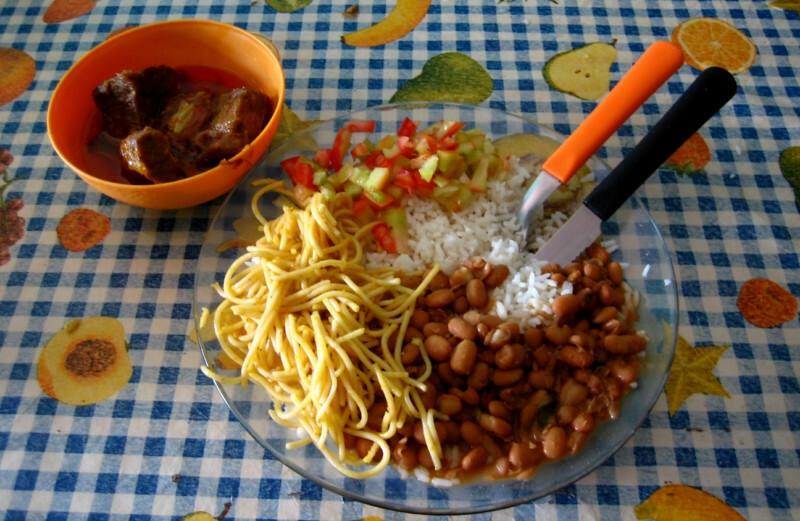 A typical Brazilian meal of rice, noodles, beans, meat and some salad for R$ 5. 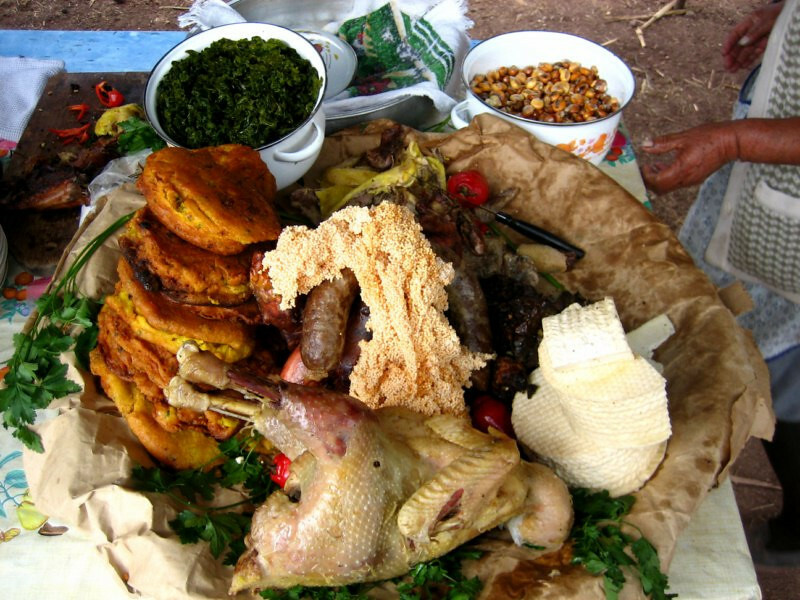 I was happy not to get the post-meal-sleepies after such a heavy lunch, which is the biggest meal for most Brazilians. 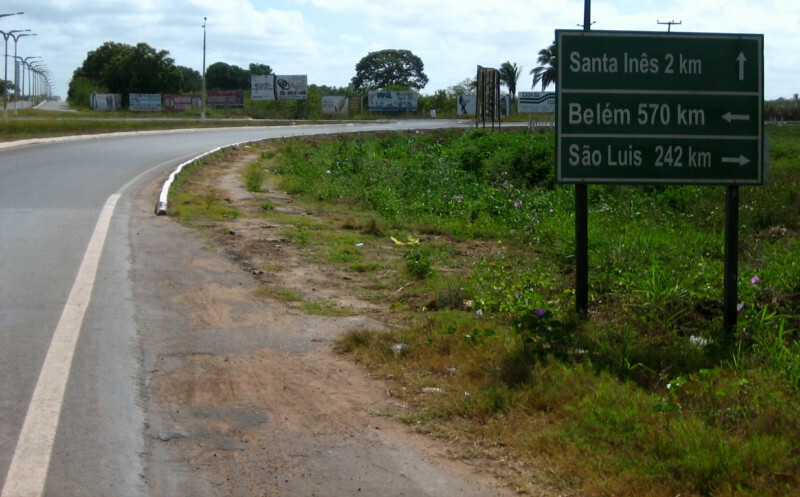 A distance board at the intersection to the road heading north to Santarem on the Amazon River, where you can take a boat up to Manaus. I was heading to Altamira in two days. Filling up at a Shell station, but since the roads were all dirt, so was the station grounds. The construction sections were sandy and I just couldn’t get over how wide the road was in places. 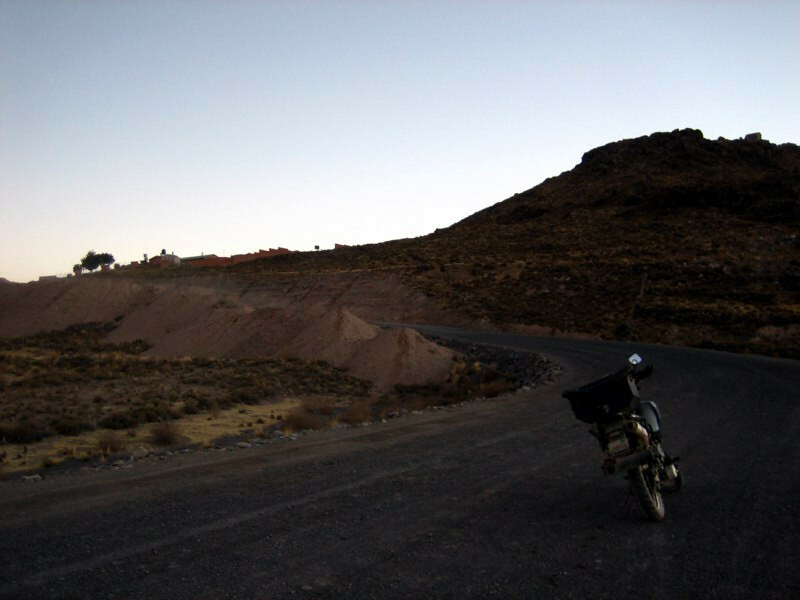 Towards the end of the day, I felt my clutch finally losing grip on the steep hills and knew it was time to put in the last spare KLX disc that I was carrying from La Paz. I pulled up to this tire repair shop, called a borracharia (bo-ha-cha-ria) and asked the mechanic if I could borrow an oil pan to drain my oil. A few people gathered as I set about installing the last good clutch fibre plate that I had. 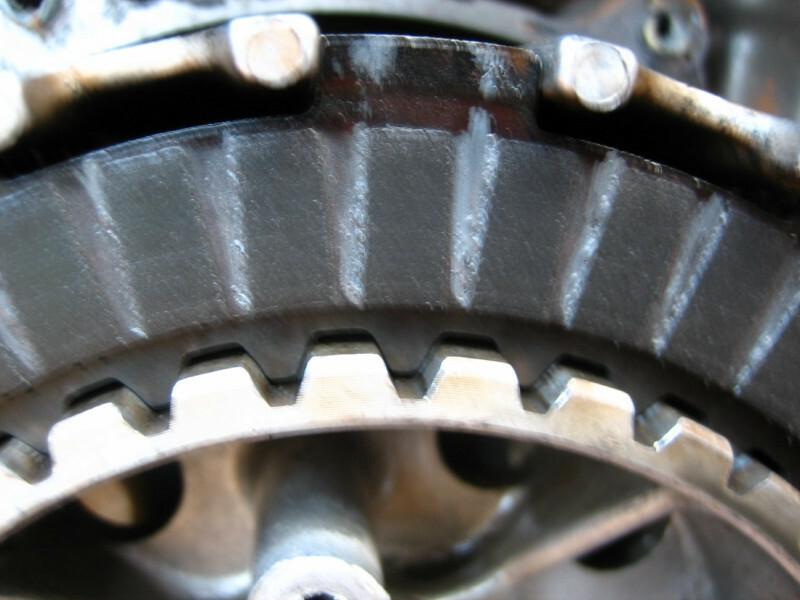 Excuse the blurry image, but you can see the edges of the fibre wearing, causing the clutch to slip. 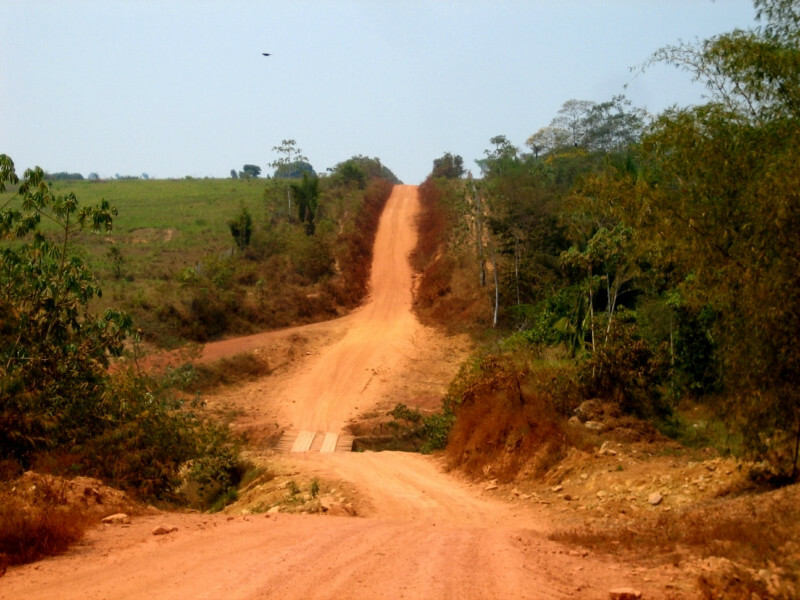 The fix got me to Sao Luis and then all the way down to Sao Paulo. The mechanic said I could camp there for the night. 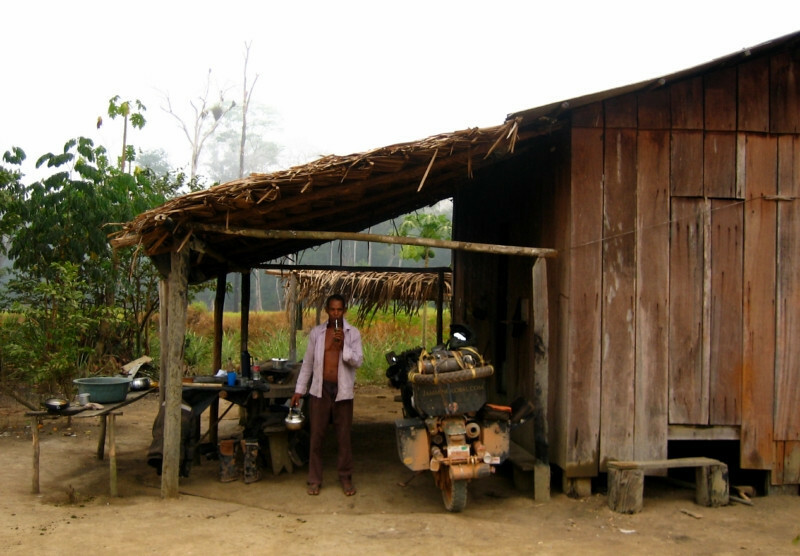 His family were running a small rural bar and convenience store. It soon became quite hot and I took a break under a bus stop stand. 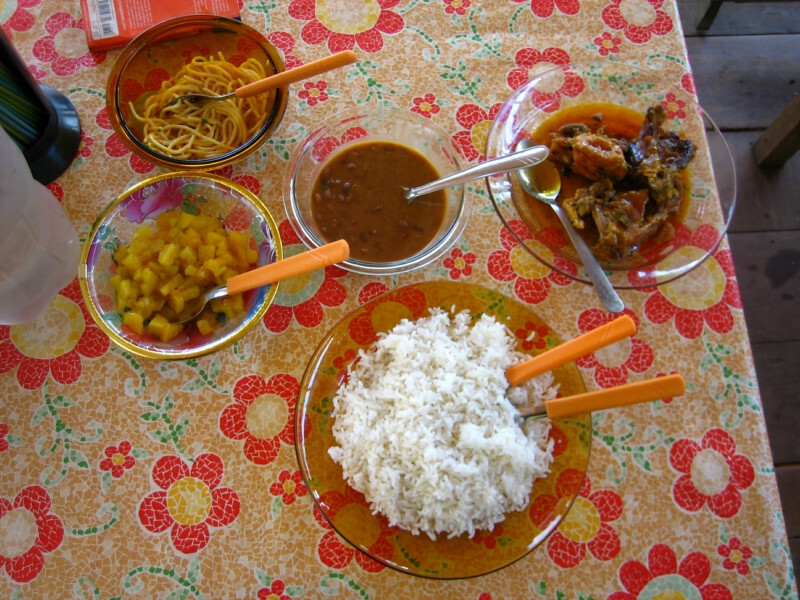 Similar lunch of rice, noodles, beans, meat and some veggies. I only found out later that if the food comes in separate dishes, it’s R$ 8, but if it comes on one plate (like yesterday), then it’s R$ 5. This is a lot more than I’ve been used to eating in the last few days. 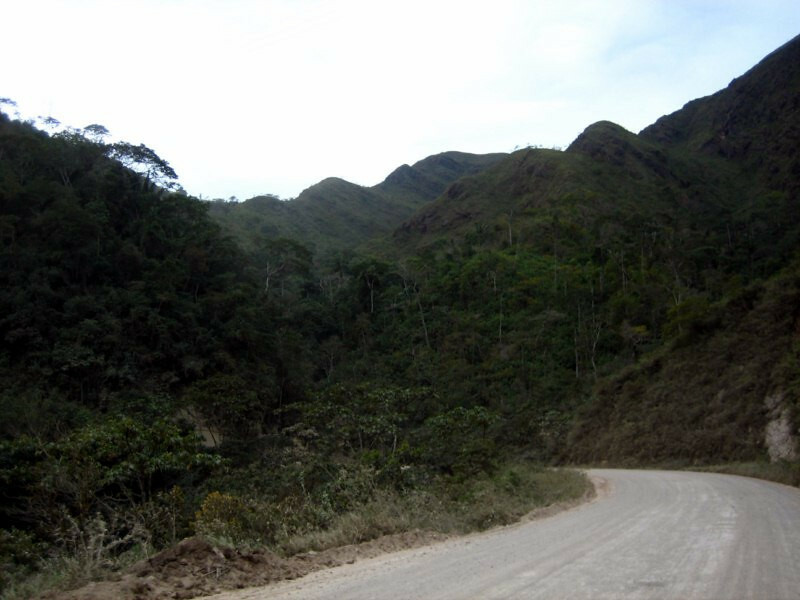 The scenery was pleasing as I got closer to Altamira. 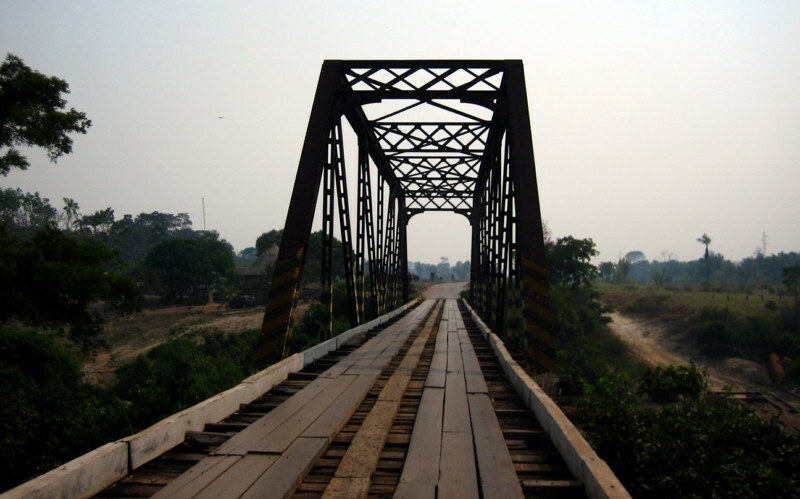 An old bridge deteriorating as the new bridge is being built. 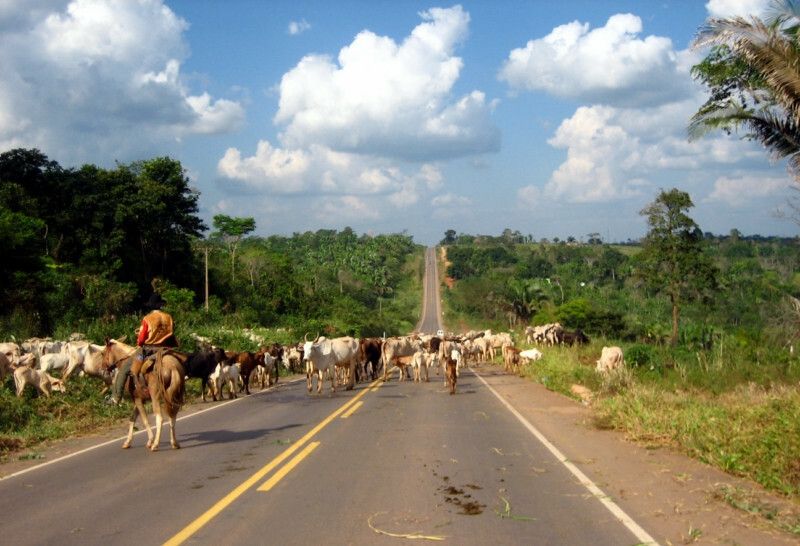 The pavement beginning outside Altamira with cattle being herded down it. But it ended soon for construction. I decided on no more tenting it in cities, since it’s too hot at night with no breeze blowing through. I got a R$ 25 room (negotiated down from R$ 35) at Hotel Paulista in Altamira and most hotels in Brazil come with breakfast included. 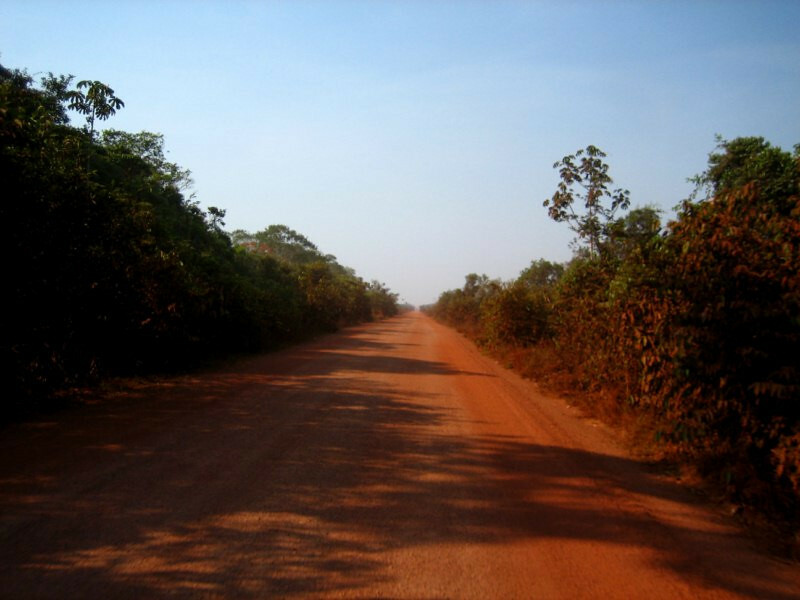 Setting out the next day for the last 500 kms (310 mi) to Maraba. 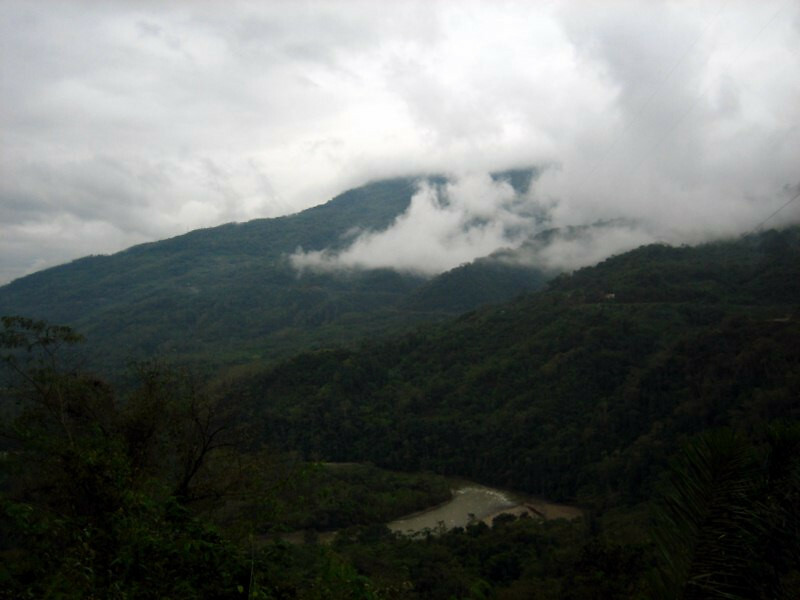 The dark clouds only threatened a few times with drizzles, but I was glad to traverse the whole TransAmazonica without encountering any rain. 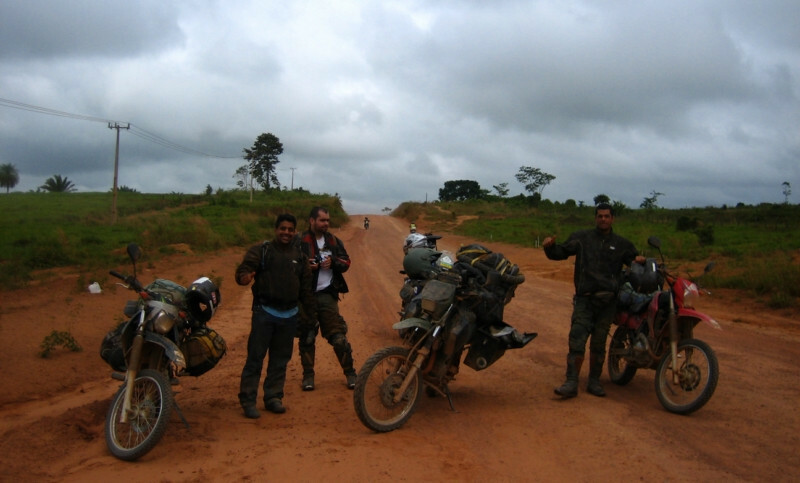 As I stopped to reduce the air pressure in the tires for the off-road, these three Brazilian bikers from Belo Horizonte showed up. Homemade panniers. They were making a big loop around Brazil and did BR-319 up to Manaus and were coming from Santarem. 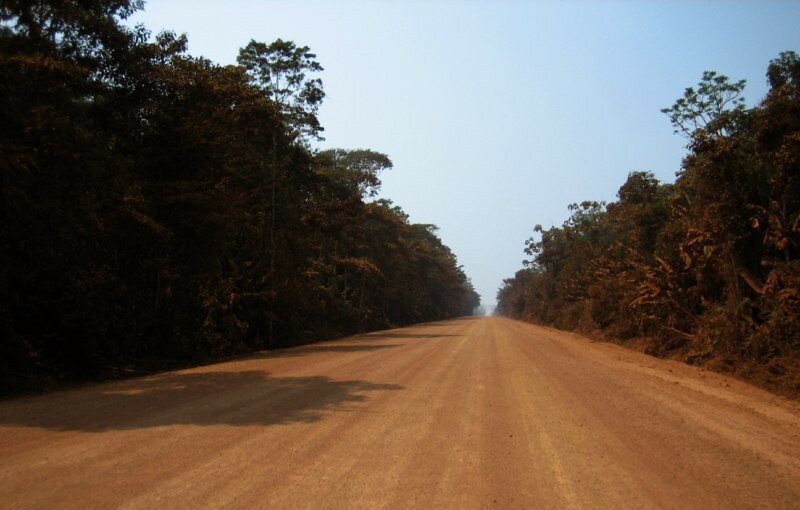 The first bit of washboard that I experienced on the TransAmazonica, giving an indication to the traffic and the speed they fly at in this more crowded section of the route. 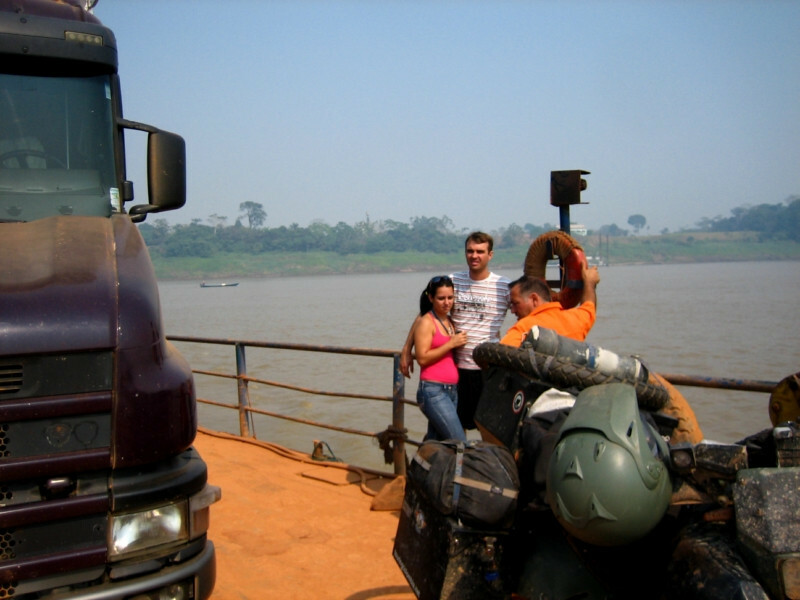 I met up with the guys again at the ferry across Rio Xingu. 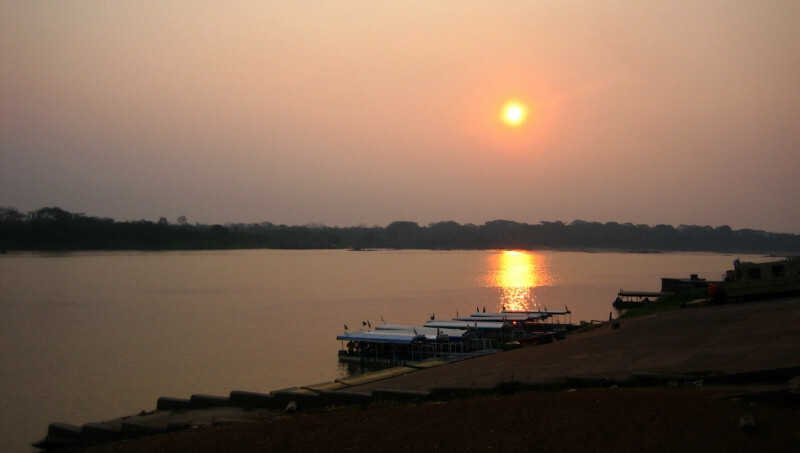 This river has made international news as the government wants to build the Belo Monte Dam on it to create the world’s third largest hydroelectric power station. 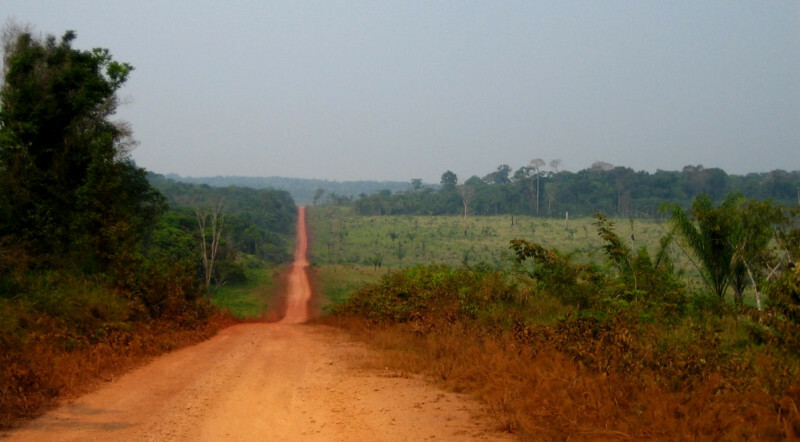 The proposal has so far been stalled since the 1990s due to strong opposition from numerous groups in Brazil and abroad. 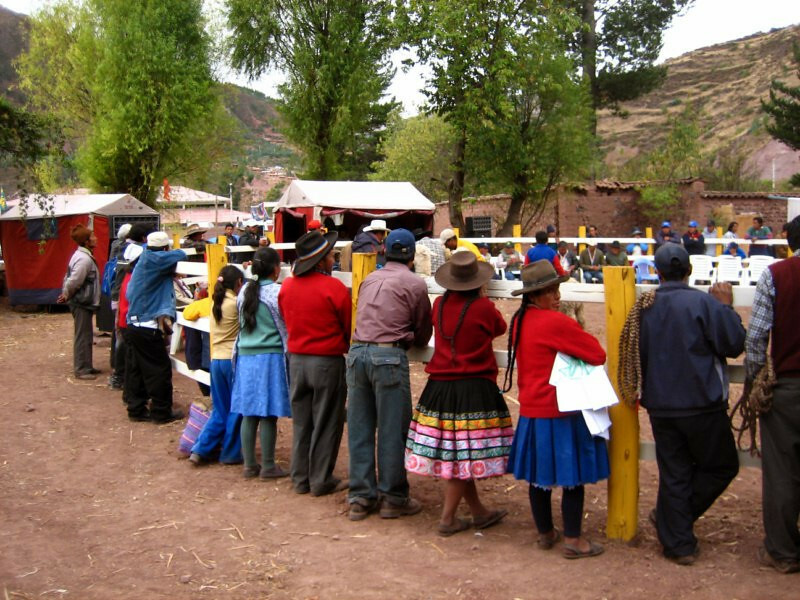 The main reason being that the social costs of the dam outweigh its benefits. 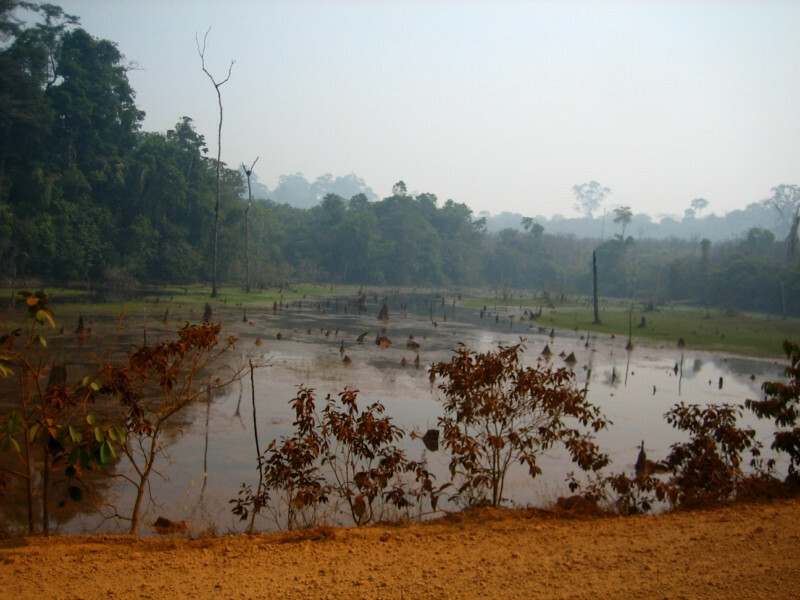 The dam would flood 400 sq km (154 sq mi) of low-lying forest and this flooding will lead to an increase of methane emissions, which are far more deadly than CO2. 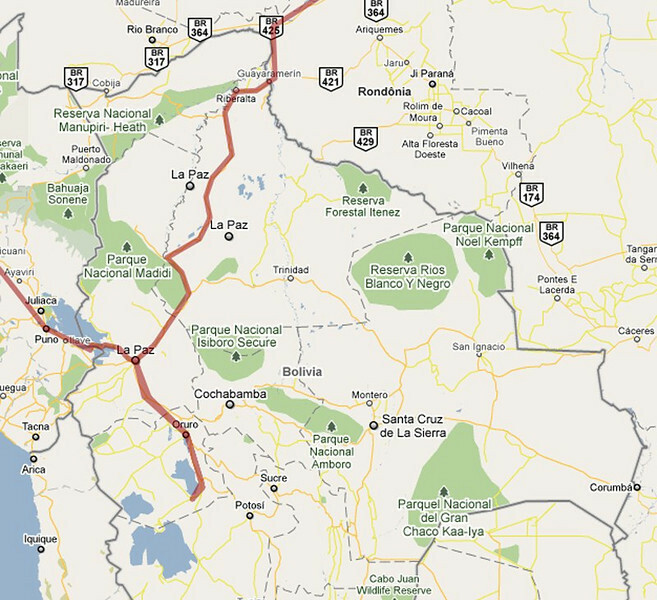 Also, two huge canals, bigger than the Panama Canal would need to be carved up to divert water for the dam. 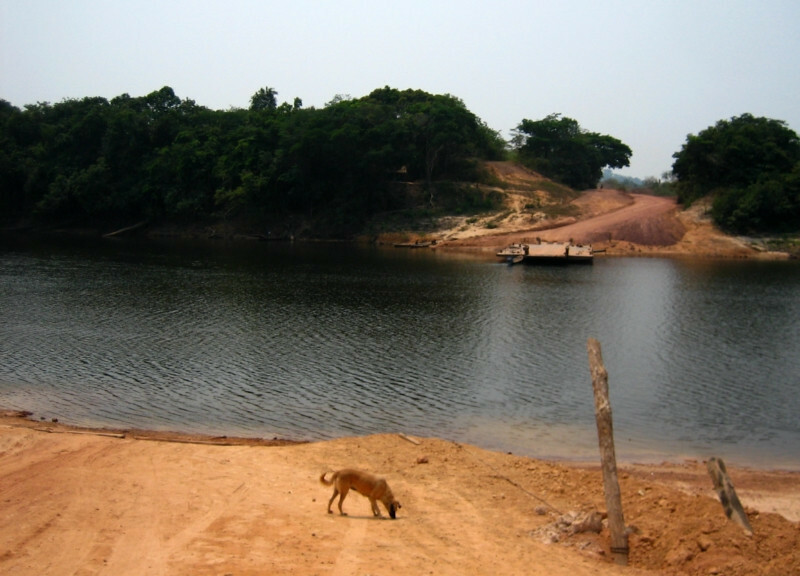 With Brazil’s new discoveries of massive offshore oil fields, it’s been suggested that the environmental and social impact of producing electricity from burning oil would be less than that from this dam. Let’s see the direction the new president takes this project. 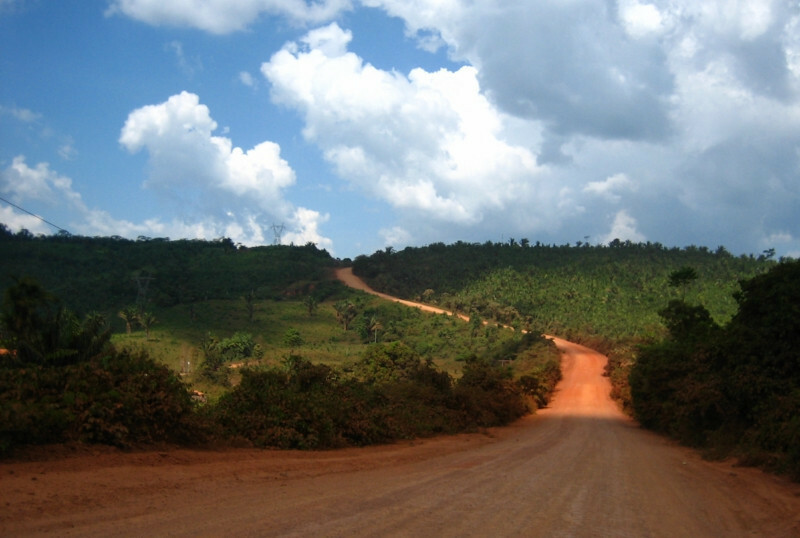 Enjoying the road again as it resembled areas west of Itaituba, winding up and over hills. Riding too much washboard and this is what happens. The bracket holding this tool tube onto the pannier frame finally gave way and swung on to the tire, chewing a hole through it. 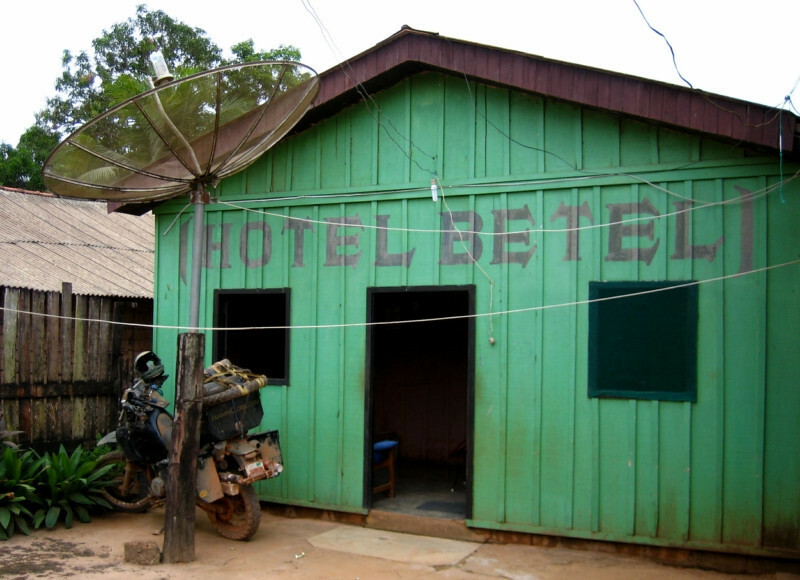 Getting a cheap bed at Hotel Betel for R$ 15. They had a newer section to the right with beds for R$ 40. 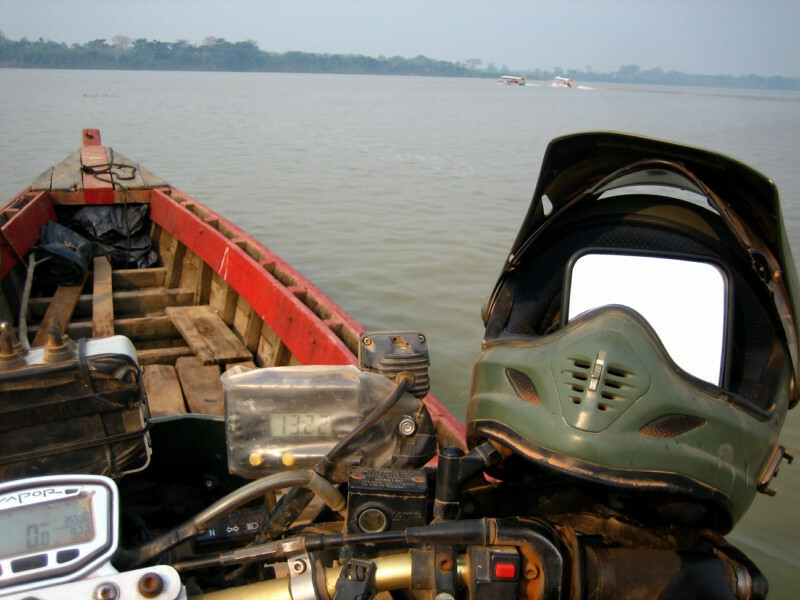 The last day on the TransAmazonica. While I was ready for the dust clouds to be done with, I sure did enjoy the remote riding. 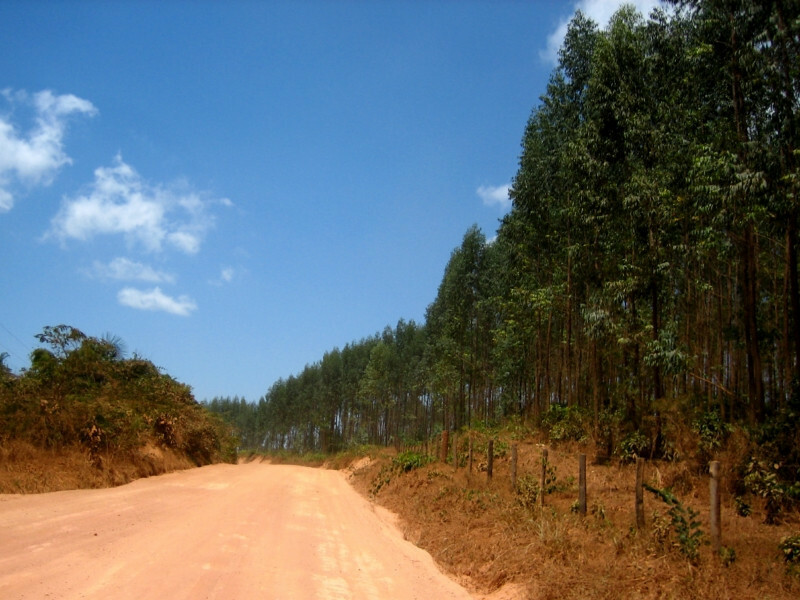 You can tell civilization is close when you see plantations of eucalyptus trees, instead of indigenous forests. 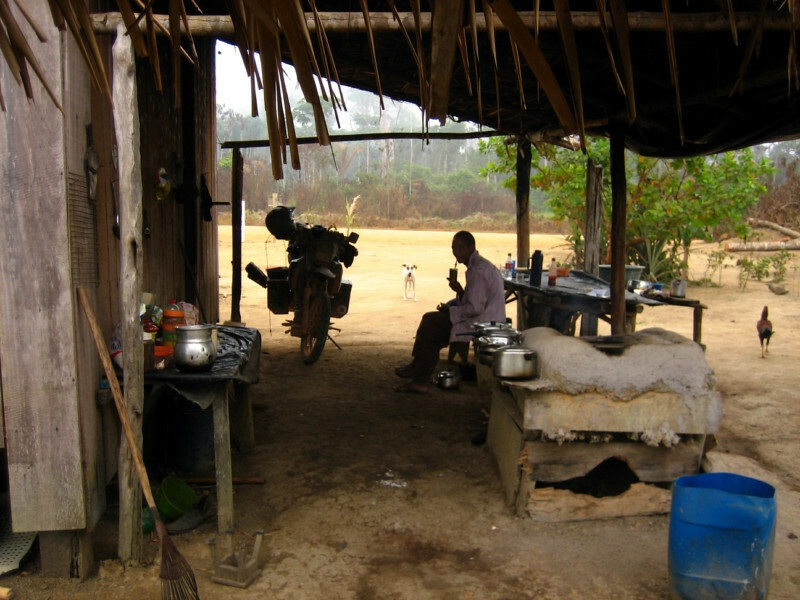 Getting some lunch close to the end of the TransAmazonica. 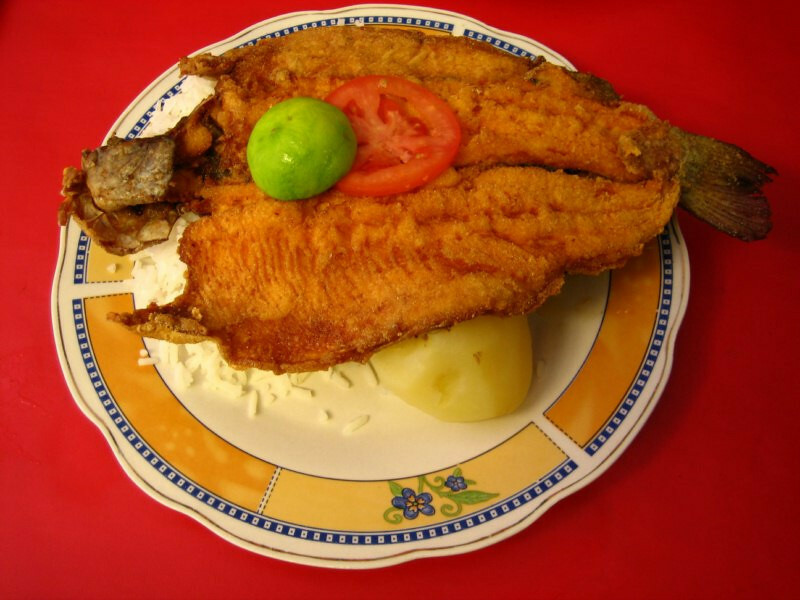 Having a huge piece of fried river fish that the lady said she caught that morning from the nearby river. 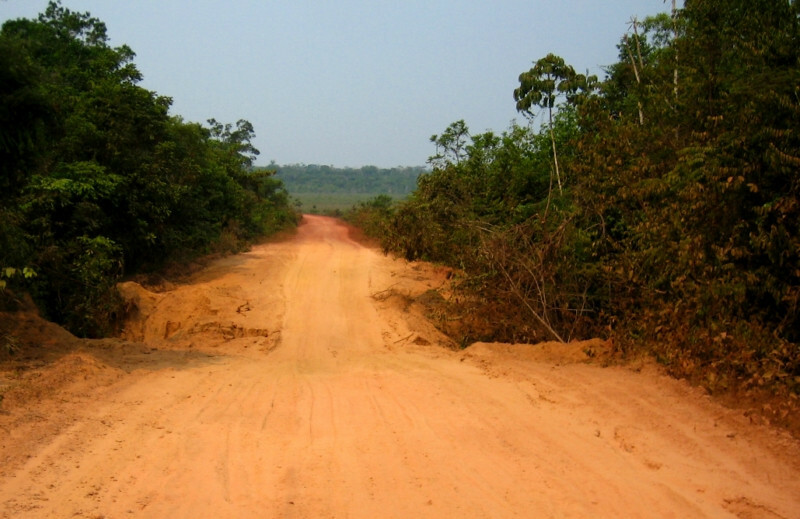 Coming to the end of the off-road section of the TransAmazonica. 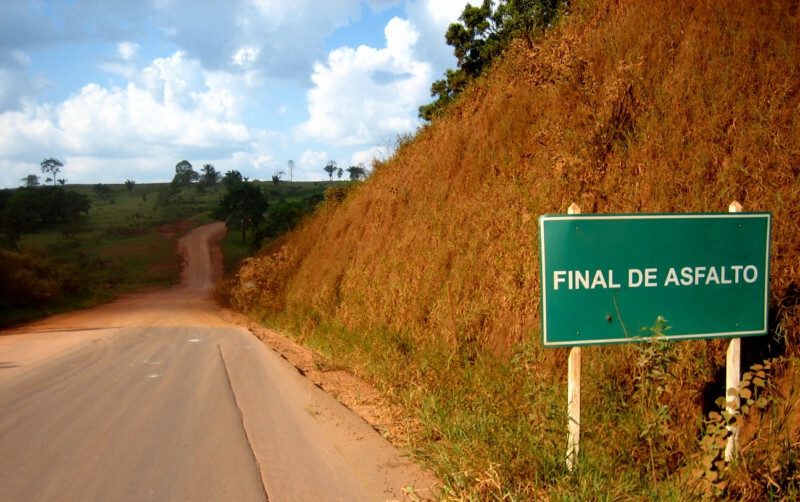 Wow, it was a long journey but totally worth it and glad to provide proof that this fabled road does exist indeed. 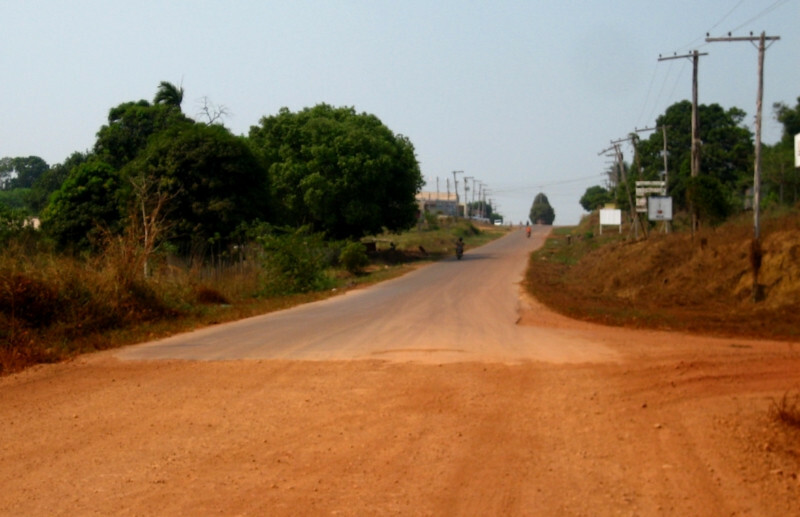 The pavement beginning outside Maraba. BR-230 carries on for another 1,880 kms (1,167 mi) to the coast, terminating at Joao Pessoa, but I was turning north for Sao Luis from here. 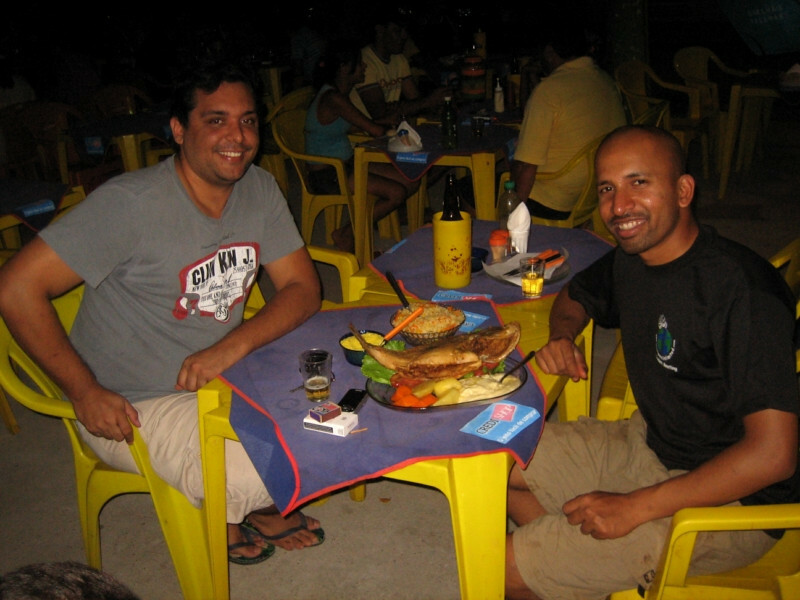 Meeting up with Guilherme, through CouchSurfing in Maraba. 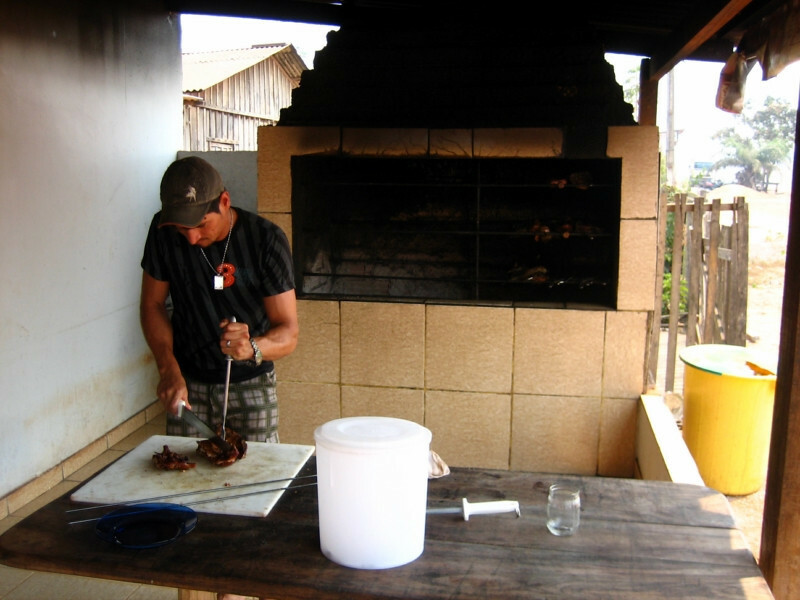 He’s an architect from the state of Minas Gerais and moved out here to this ‘frontier’ town as business is booming. 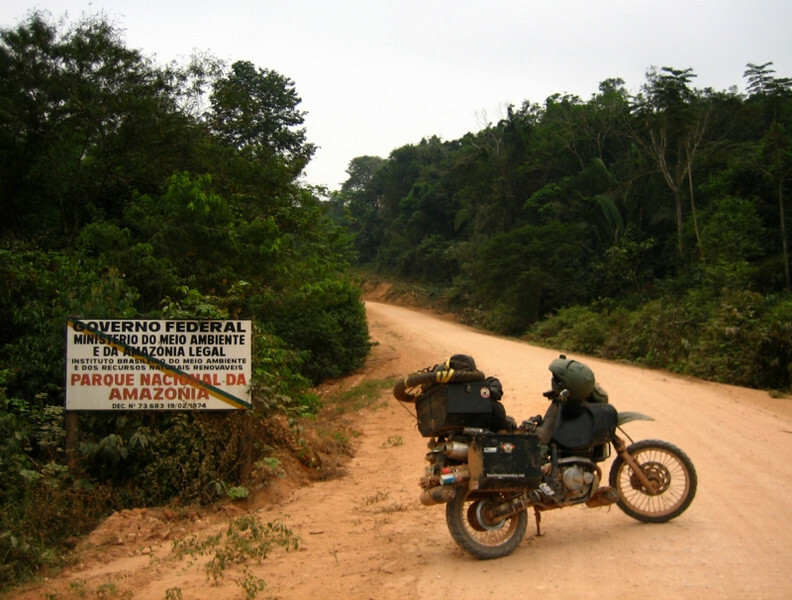 He wondered how I was actually going to ride from Porto Velho to Maraba and didn’t believe the TransAmazonica actually existed, but I’m living proof. 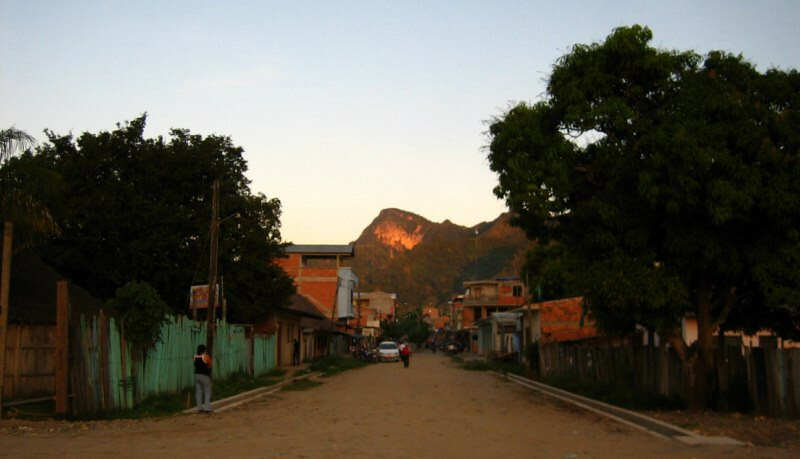 From Maraba, it’s a different kind of Brazil, the more developed part. Having more tasty river fish with some veggies. 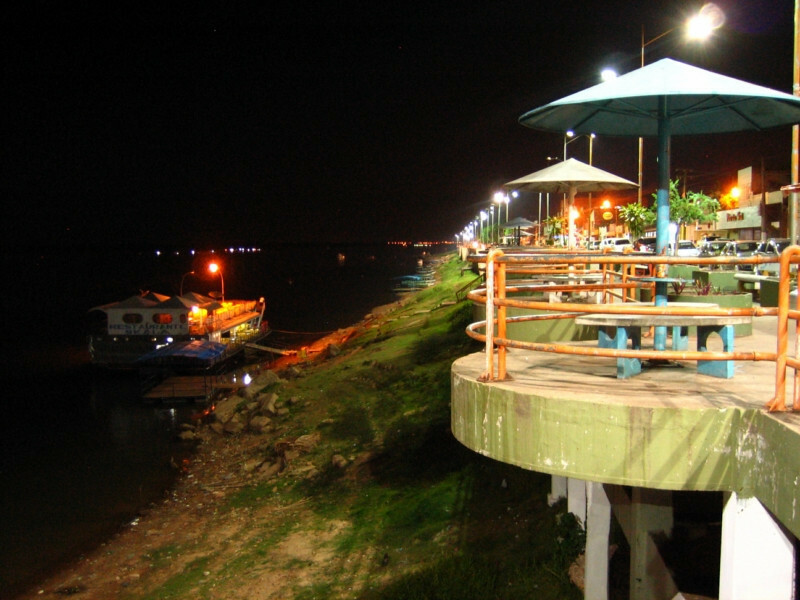 We had dinner by the riverside of Rio Tocantins, the central fluvial artery of the country. It flows directly into the Atlantic at Belem, not meeting the Amazon River. 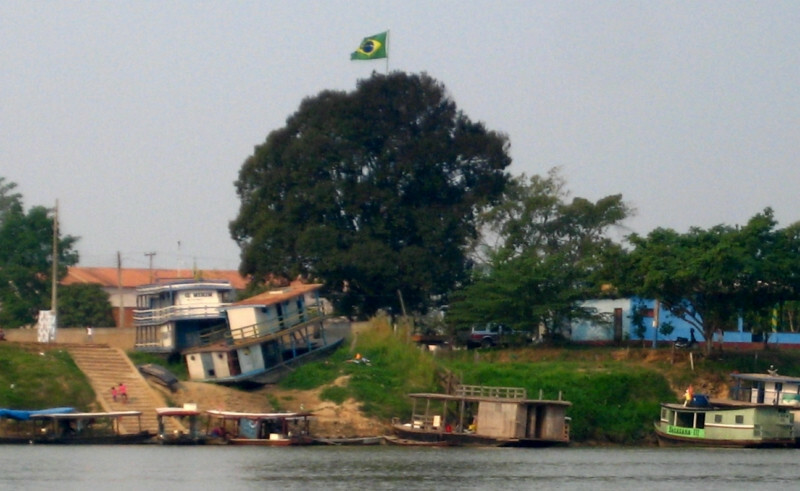 Guilherme said in the rainy season, the rising river level brings up that floating restaurant up to road level, even flooding some of the surrounding streets. 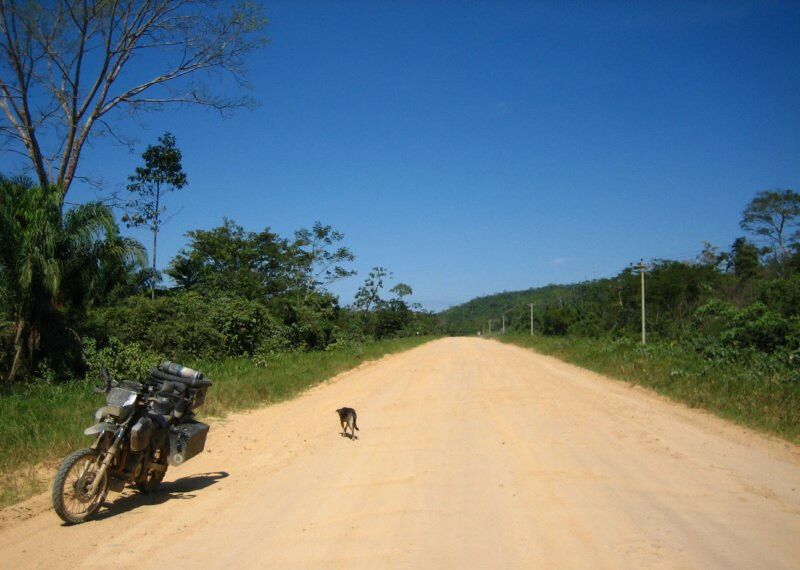 Riding the smooth highways up to Sao Luis, where I was looking forward to resting my sore body and giving sanDRina a break, as well. I also really wanted to wash everything. My helmet and gloves were feeling nasty to put on towards the end. 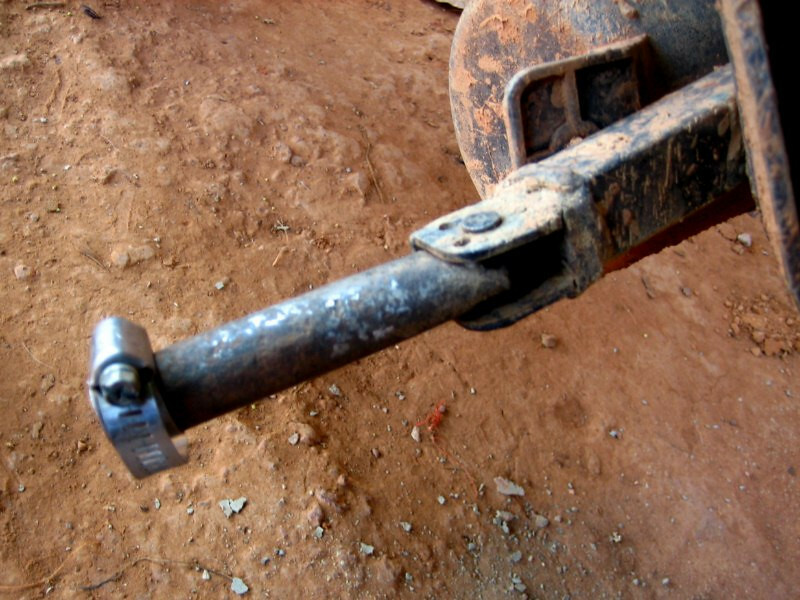 I picked up this nail just 135 kms (84 mi) from Sao Luis. I was so close. 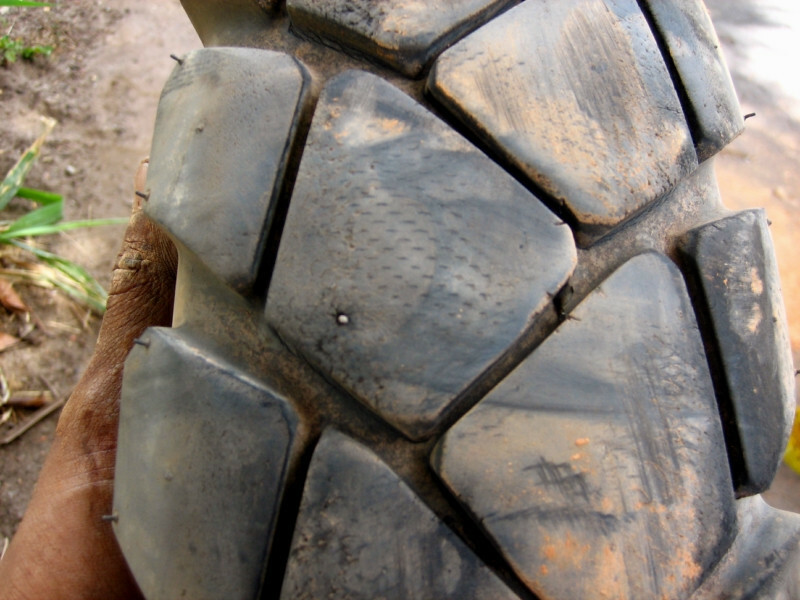 The reason I like using a heavy duty tube is that when it does goes flat, it doesn’t deflate all the way and still has some structure to it, which helps in not ruining the tire. But I thought running a heavy duty tube would make punctures more rare. Who knows, maybe lots of punctures were averted by running this tube, but I’ll never know, since I only pay attention when it does get a puncture. 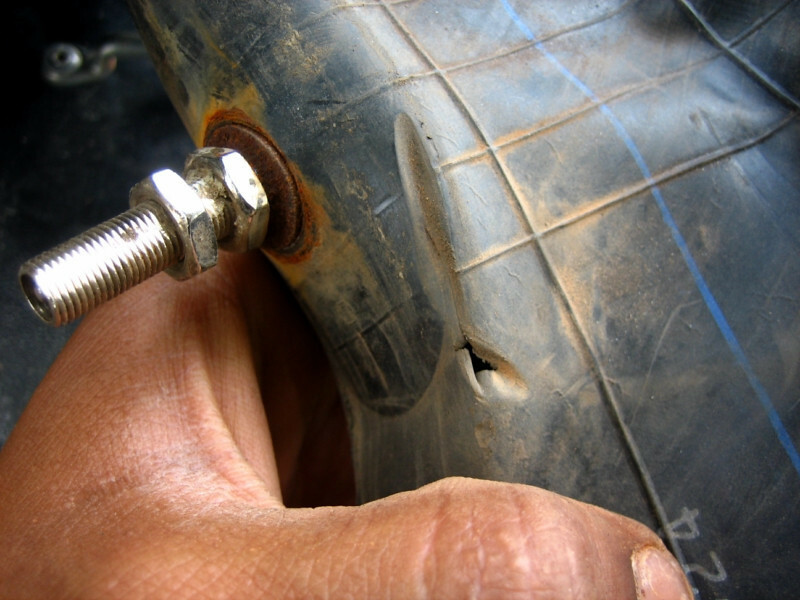 When the tool tube broke loose and rubbed against the tire, that friction wore a hole through my spare rear tube. My heavy duty tube is made from a different rubber compound and the patches I have don’t stick to it. What to do? Try and fix either tube with lots of patches and hope it holds till Sao Luis? Like an angel appearing in a time of need, Bianca stopped by and after explaining my situation, she offered to take my tube to the nearest borracharia to get it hot vulcanized. 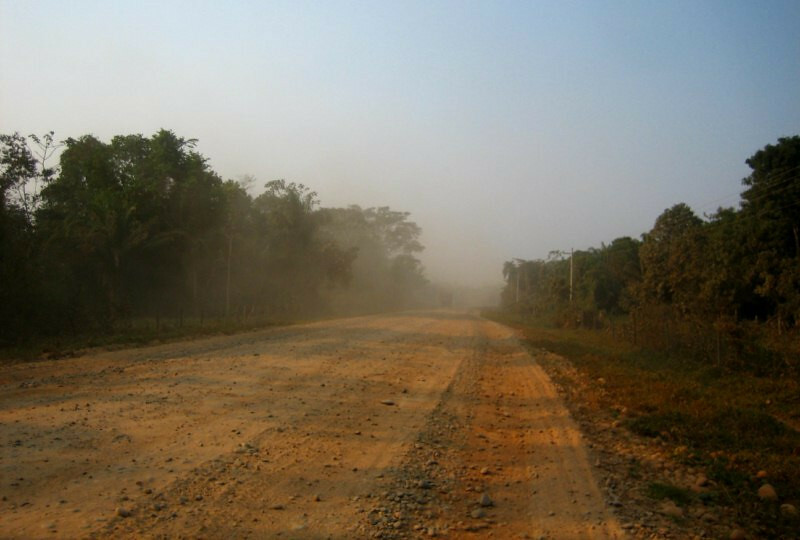 After a few hours delay, I rolled into Sao Luis and rejoiced in the accomplishment of having crossed the great TransAmazonica Highway. 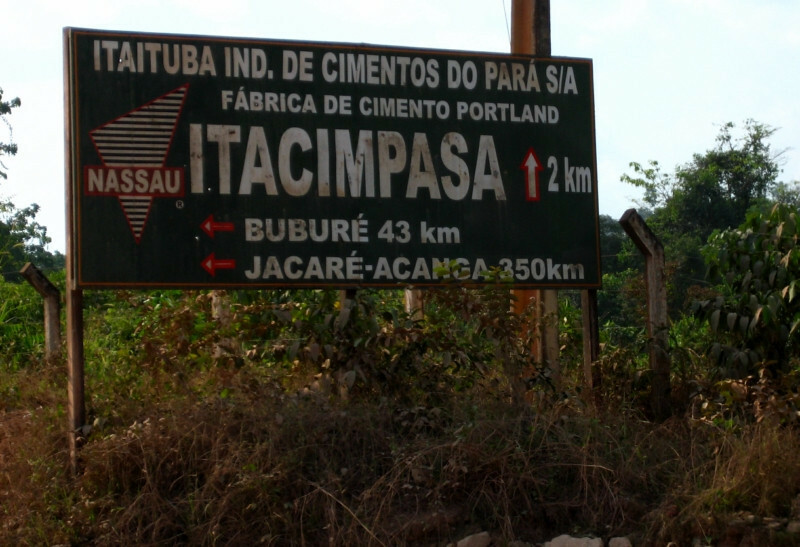 From Apui, it was 700 kms (435 mi) to the next big town of Itaituba. This was the remotest section of the route and most memorable. 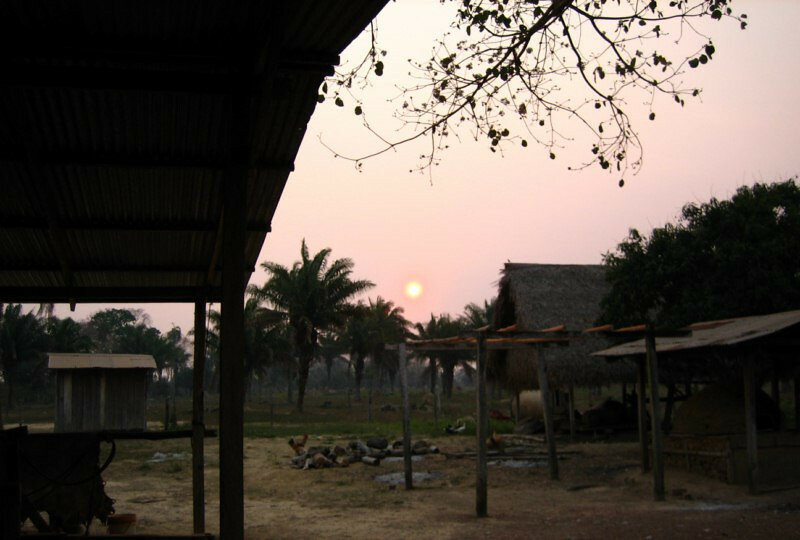 Sunrise in the Amazon on the fazenda that I stayed at near Apui. 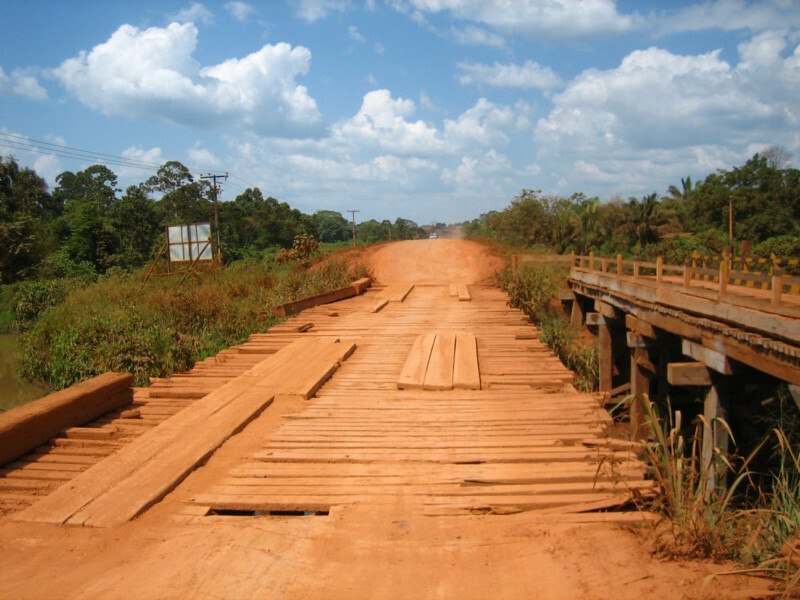 A long wooden bridge. I tried to see all the way across before choosing which side to cross on. Some of the planks would rattle as I rolled over them. sanDRina enjoying a refreshing Coke. 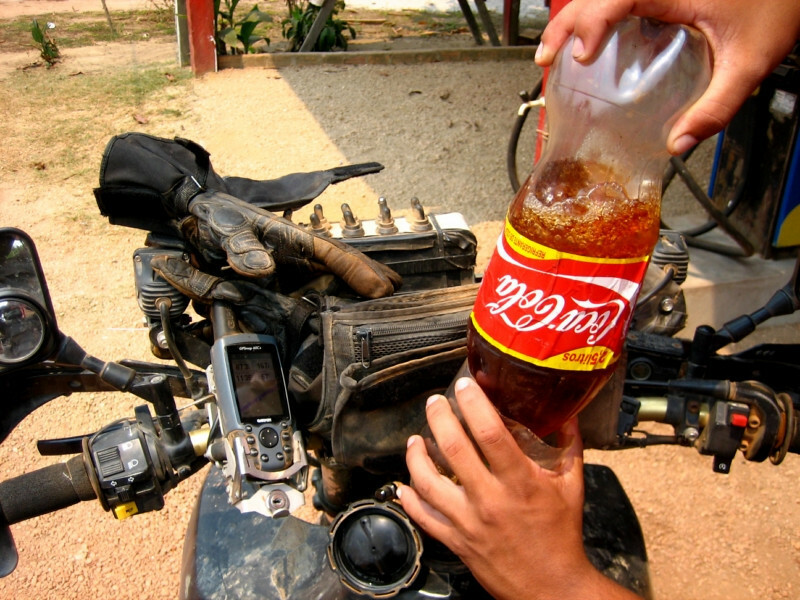 The gasoline in Brazil has 25% ethanol from sugarcane mixed in and that gives the fuel its red color. 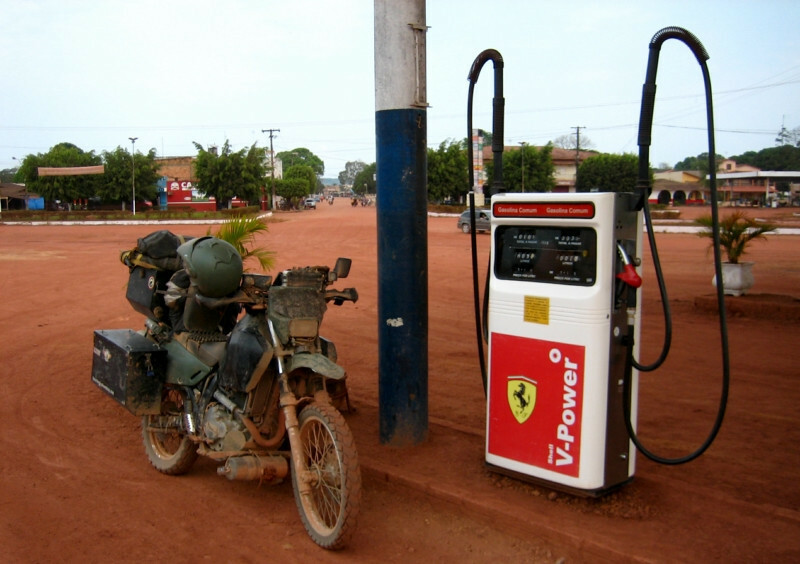 I had enough fuel to make it to the next town of Jacareacanga but, better to be safe than sorry. This is in Sucunduri and it cost R$ 3.40/lt. Calling out to the boatsmen on the other side of Rio Sucunduri. After a few minutes, they made the relaxed journey over to collect me. The ferry was powered by this little outboard motor. A massive ferry for just one bike and this ride was free. I paid between R$ 4 and R$ 10 for all the ferries. 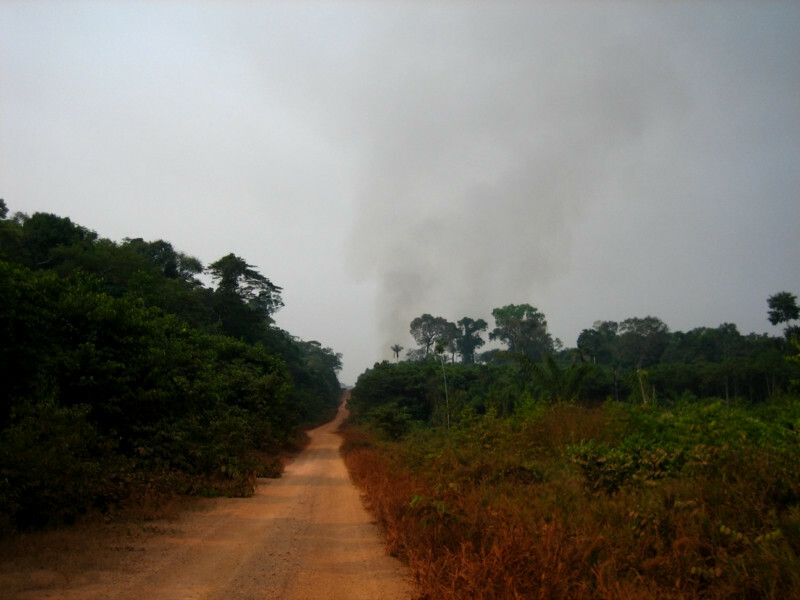 The clearings and burning of the forest took place close to the road, with the intact forest back there, a few hundred meters away. 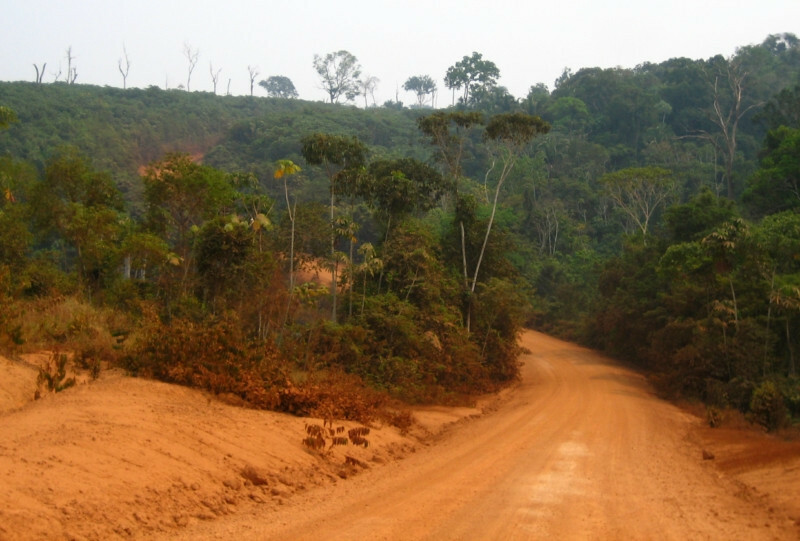 That says something about the link between deforestation and road building. Ah, the reason for all this burning. Not much shade to take a break under. 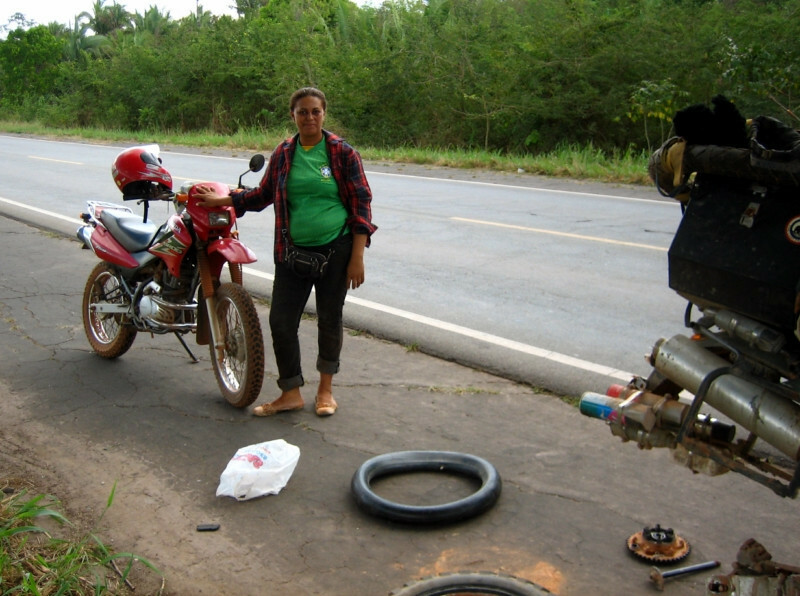 Local riders in Porto Velho told me the road is constantly being maintained and improved by the government. But, I don’t think it’s going to get paved anytime soon due to the lack of traffic. 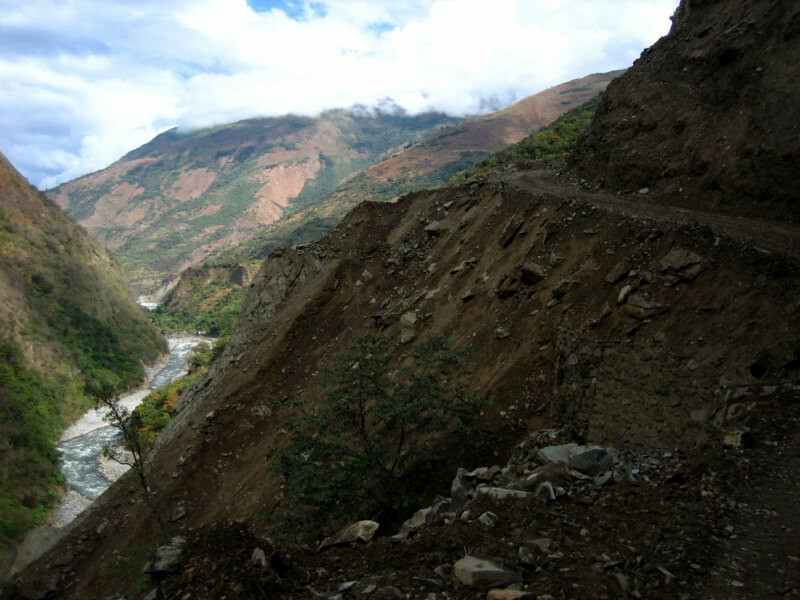 The route getting narrower in places, with foliage right by the road. However, this was the more usual sight; huge clearings. 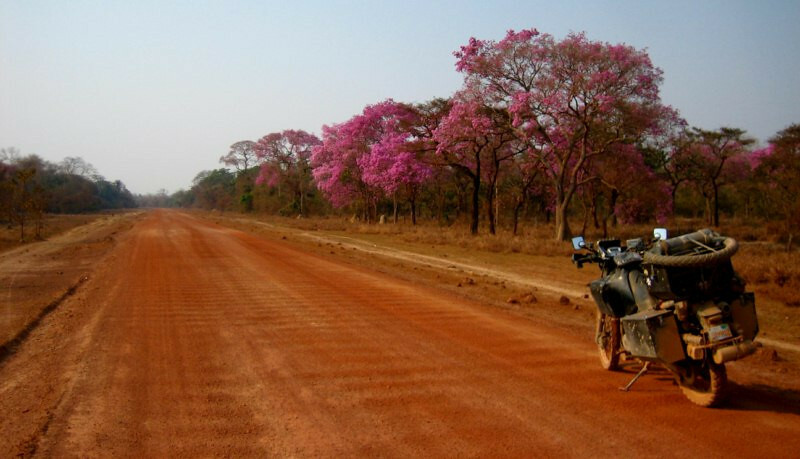 A few trees left standing and the purple flowering tree. 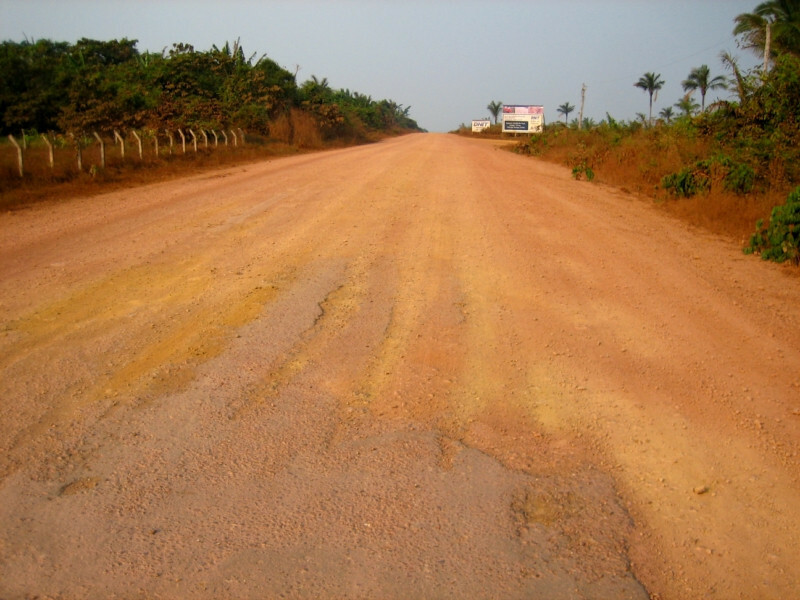 I was taking my time and chugging along, because the road surface would change repeatedly from hard pack to sand. 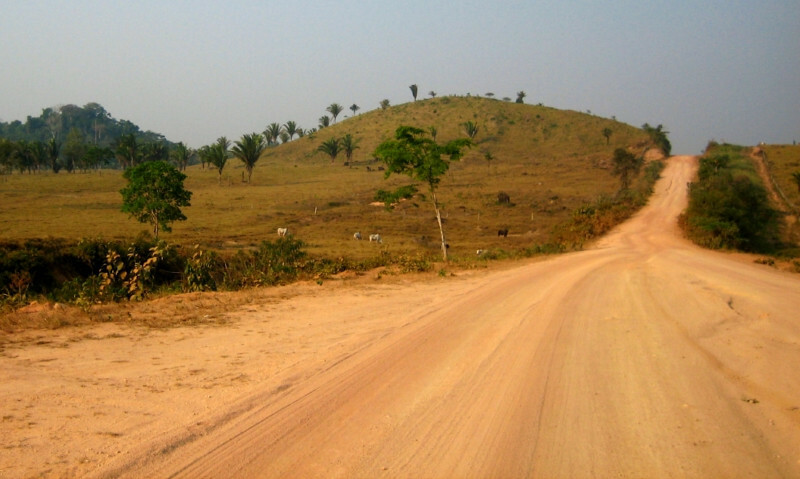 Intact jungle on the right side and recently burnt, shaved hillside on the left. 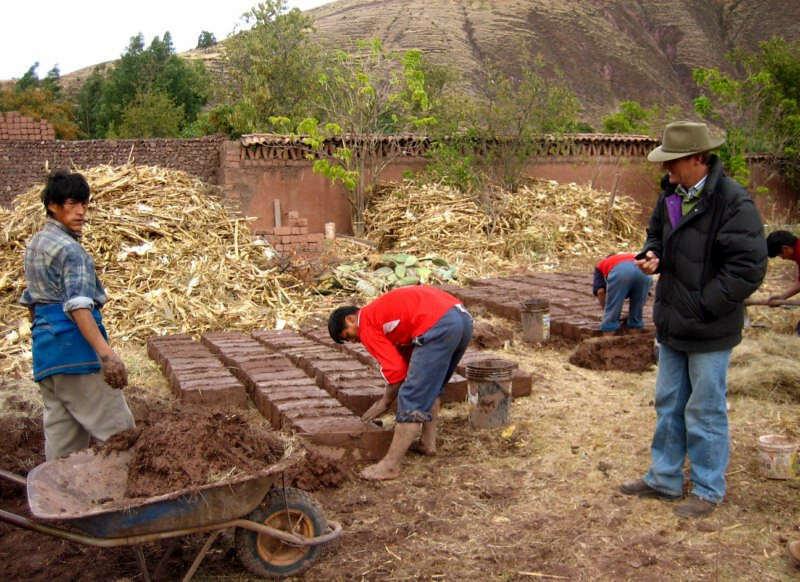 I didn’t see any fazendas around, but maybe they were preparing land for their move in. When there wasn’t sights of burnt jungle, it was a nice ride. Uggh, didn’t have to go far to be turned down by man. 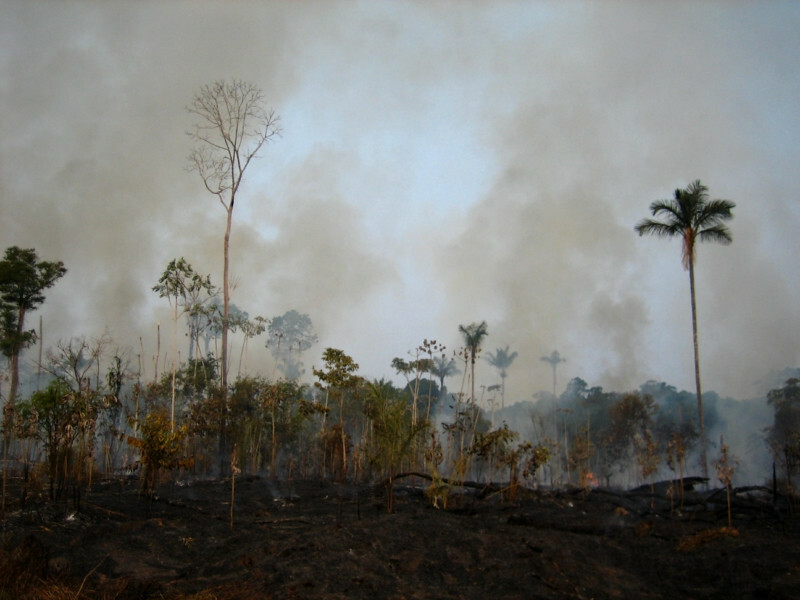 A fire in progress of virgin Amazonian jungle. A truly sad sight. I stopped and reflected on the damage man can do to his own home. This is my planet as it is everyone else’s and it’s only our short-sightedness that perpetuates these actions. 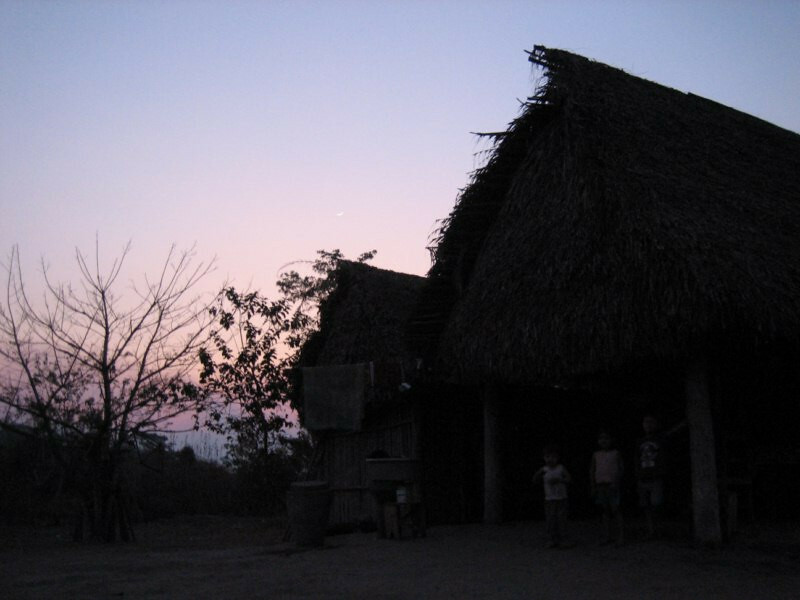 There’s signs of hope though with the World Bank stating at the UN Convention of BioDiversity that all nations will be economically held accountable for the damage done to their natural ecosystems since the Amazon doesn’t belong just to Brazil, but to every human. 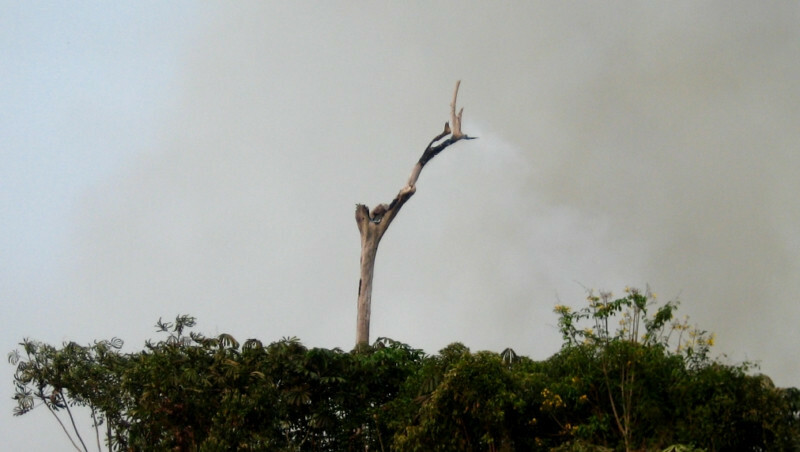 This tree was about 60 m (196 ft) tall and you can see its tip has been charred by the high-reaching flames. 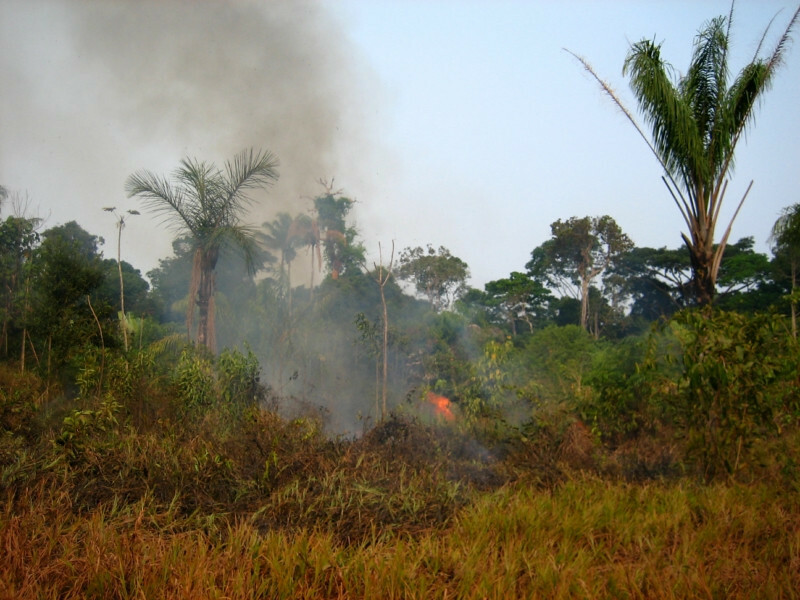 I was told that sometimes these wildfires were started on fazendas to clear a small patch of land, but then they get out of control and start burning protected areas. This has also been an exceptionally dry season for the Amazon and Brazil in general, with reports of huge wildfires across the region. Where are the helicopters with those mega buckets to pick up this water and douse the flames with? 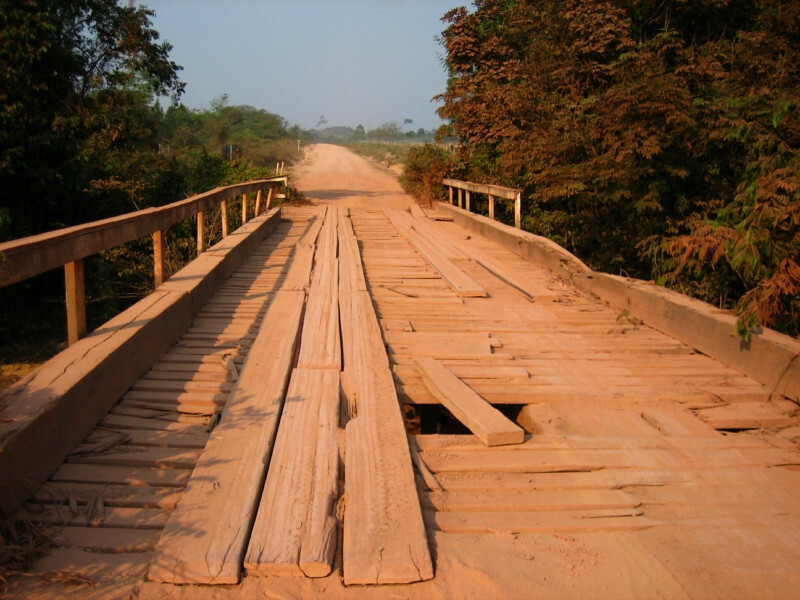 A well-maintained bridge towards the end of the day. 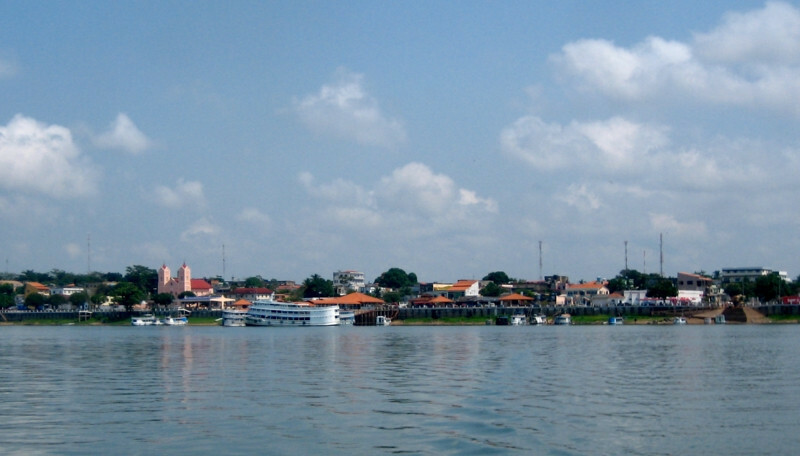 Getting close to the next big town of Jacareacanga. 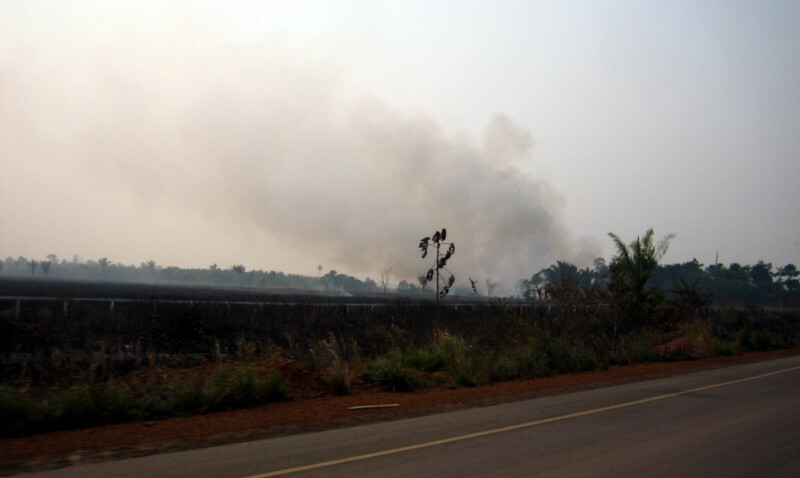 Riding through some thick jungles softened the rage from seeing all the burning today. 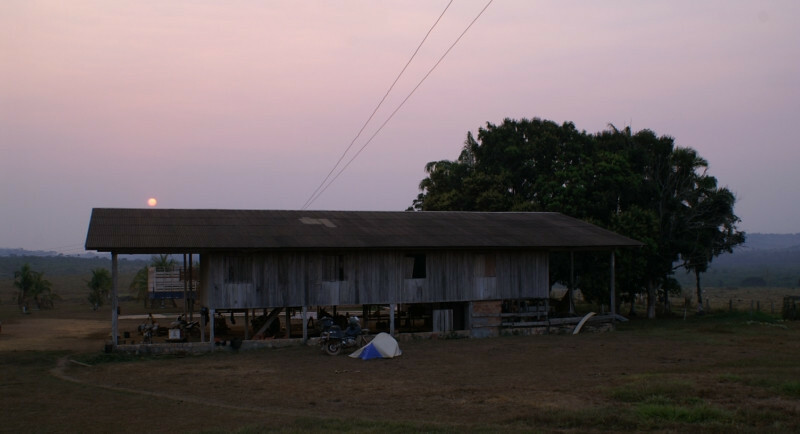 Before the turn off into Jacareacanga, I came across this fazenda and asked if I could stay for the night. I was glad to have some covering for the tent and the bike, since the morning dew is quite heavy. 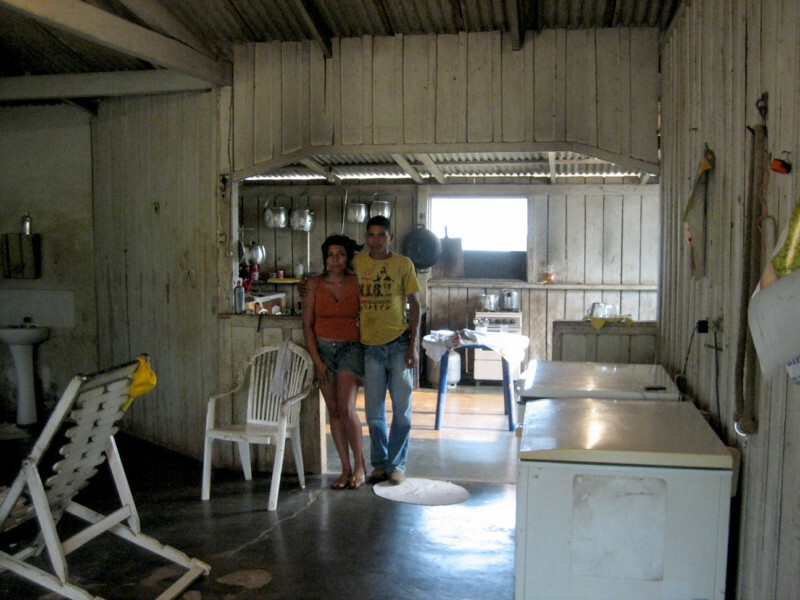 The young couple taking care of this fazenda, while their owners were visiting Itaituba. 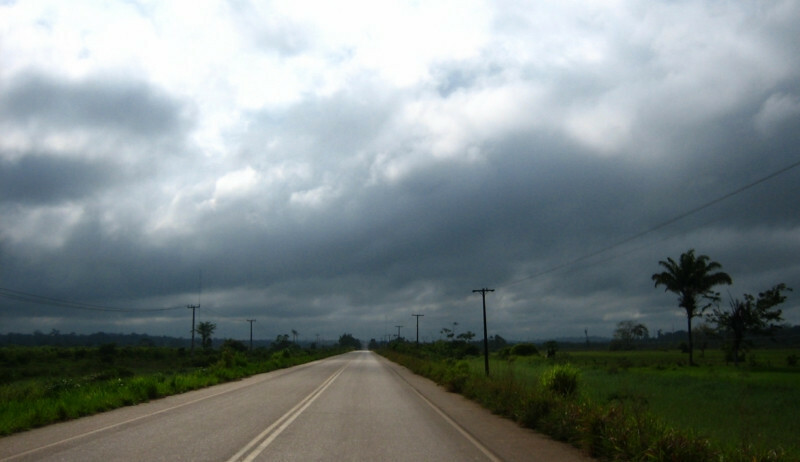 After gassing up in Jaca, I turned north towards Itaituba, 400 kms (248 mi) away, going parallel to Rio Tapajos. The locals drive like they’re in a hare race and said on my big bike it’ll only take 6 hours to cover the distance. Ha, I took two days. 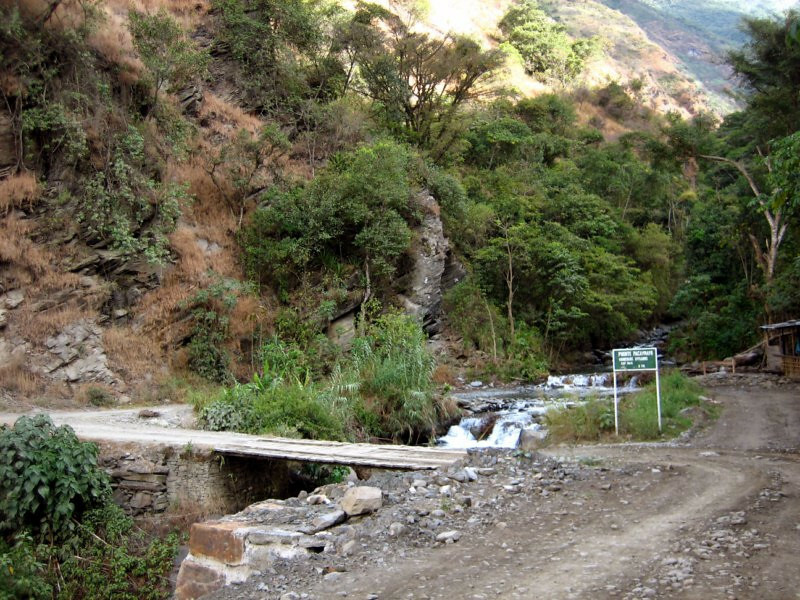 This section ahead had the steepest hills of the route, with the expected bridge at the trough. Elevation was around 100-200 m (328-656 ft). 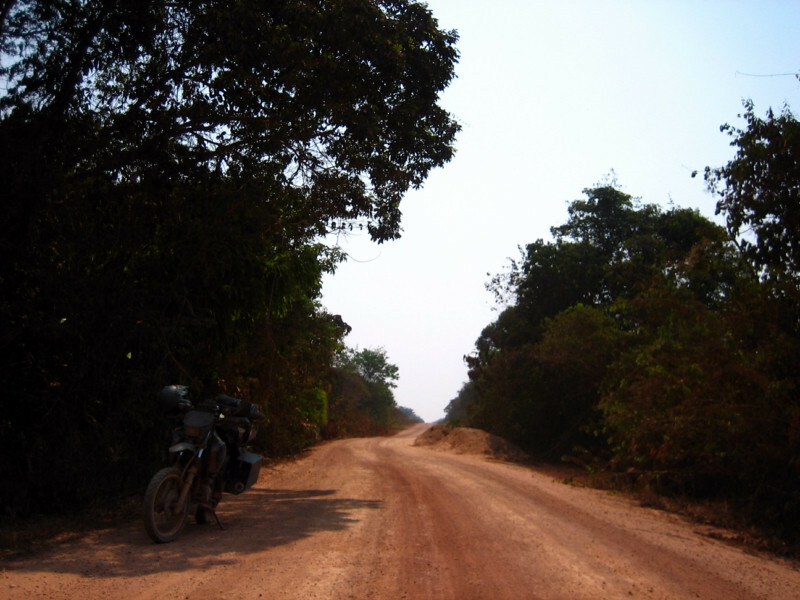 The road got narrower and it felt nice to be riding through a proper jungle. There were also very few straight sections on this part of the route, with enjoyable twists and turns. 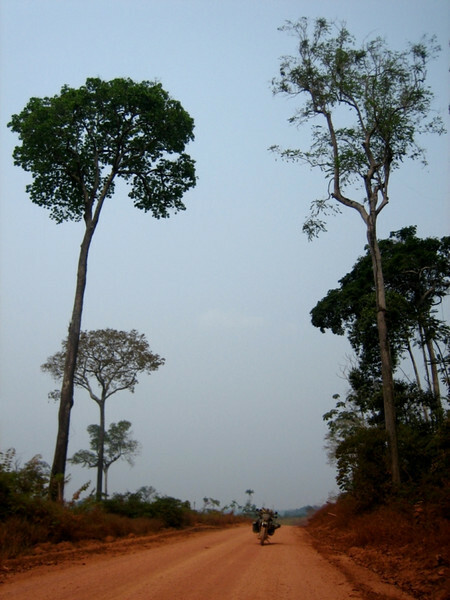 The grandness of the trees in the Amazon. They must be over 80 m (260 ft) tall. 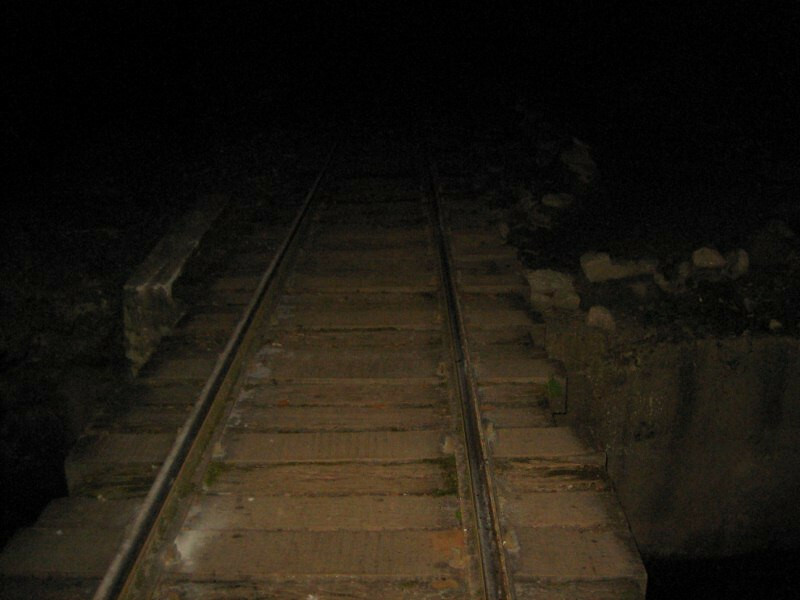 A good reason not to be riding at night. 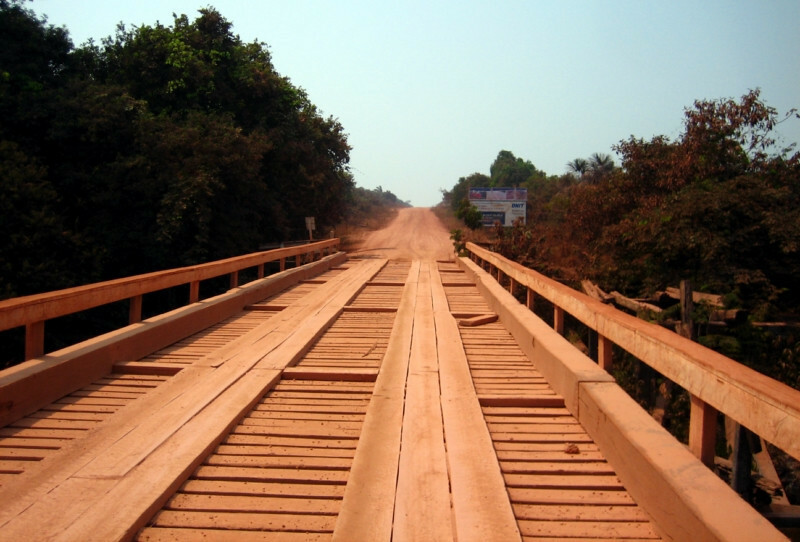 This bridge reminded of Simon Thomas and his fall from a bridge on his RTW trip. Just my luck that I should encounter the little traffic that exists on this route during the sandiest portions of it. Oh well, everything was already grimey, so go ahead and dust me. Construction laying down some new wet mud to harden up and provide a smooth surface. Taking a break as the thicket closed in on the road. 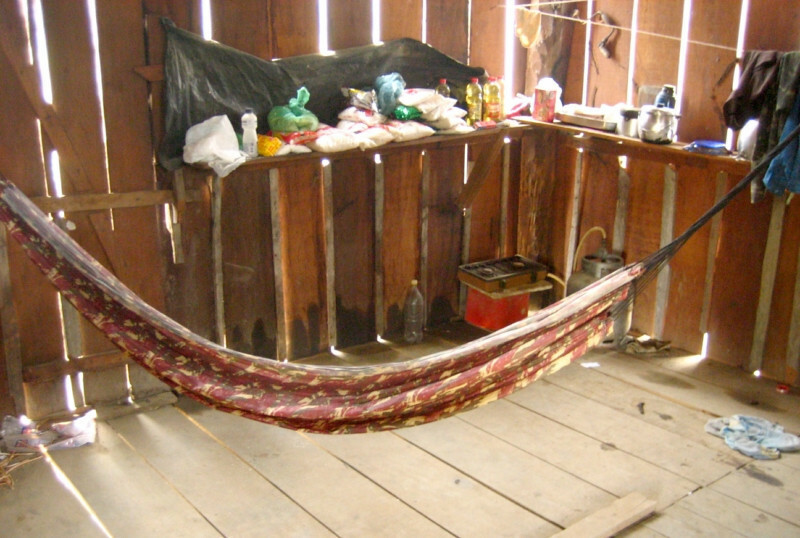 Inside his little house that he keeps stocked with food from Itaituba. He invited me to sleep on the hammock, but I was more comfortable on my mattress on the ground. I hoped no crawlies would want to keep me company as I slept, but the raised floor helped in that respect. 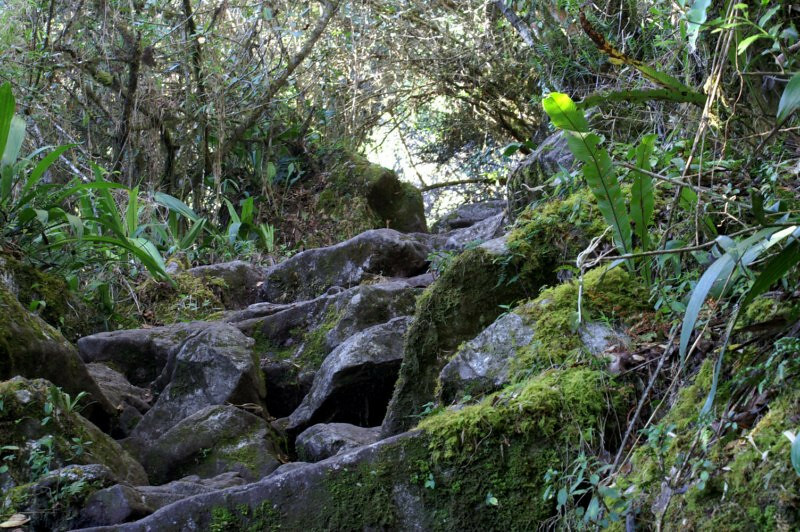 He asked me if I wanted a bath and took me about 15 minutes into the jungle to a small clearing where a stream of cool, clear water was collected. 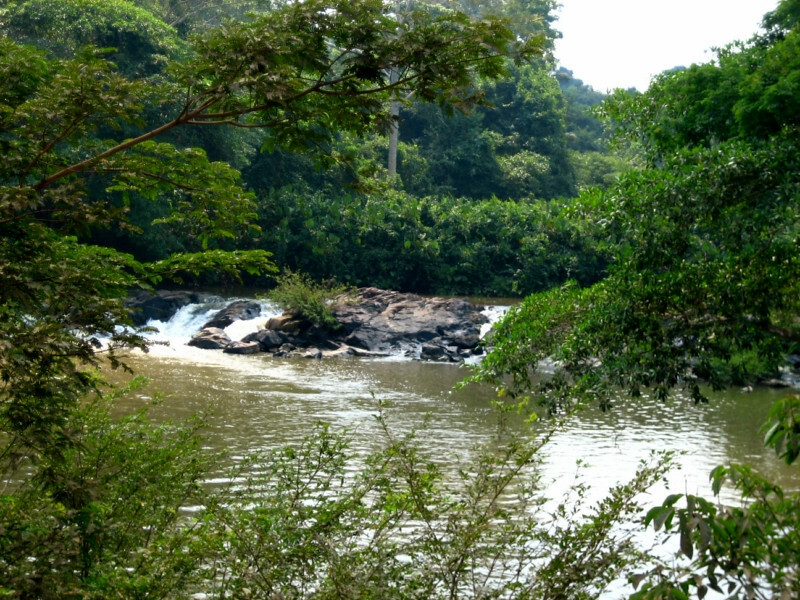 It felt refreshing to take a bath in the thick of the jungle listening to all the birds. The next morning, the fog was very thick. 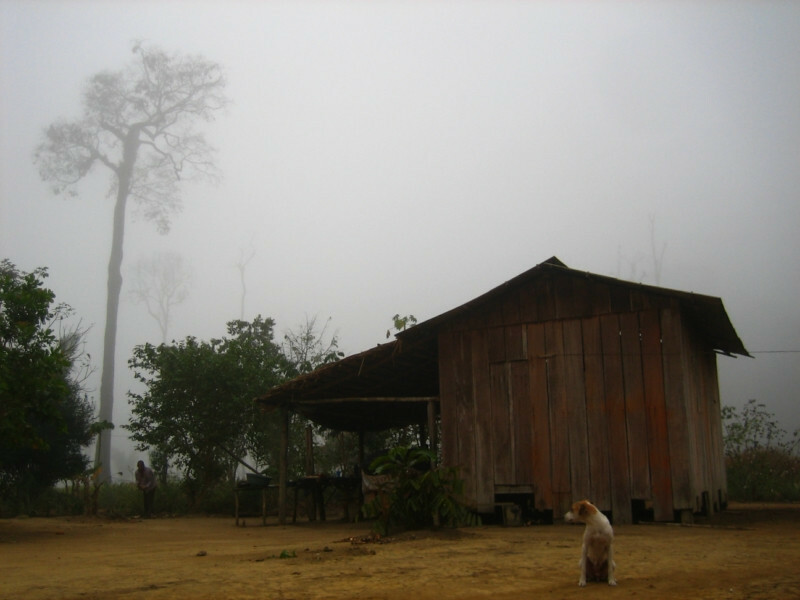 There were trees just a few meters behind his house that were engulfed in the thick forest fog. Felt quite eerie. 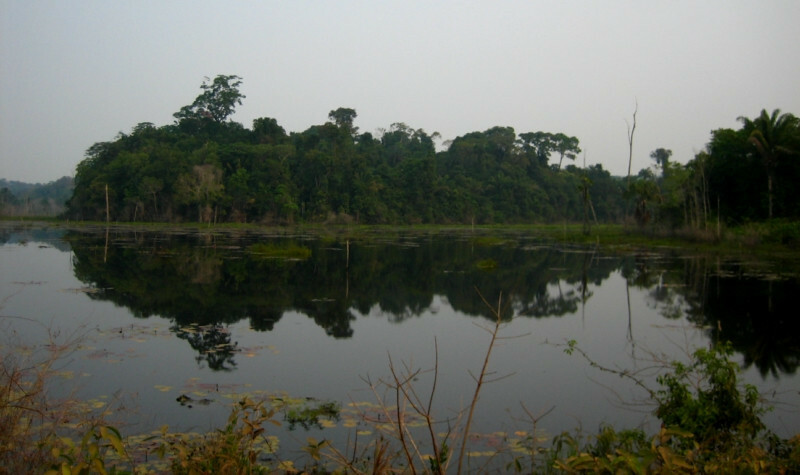 The Amazon, in the midst of man. 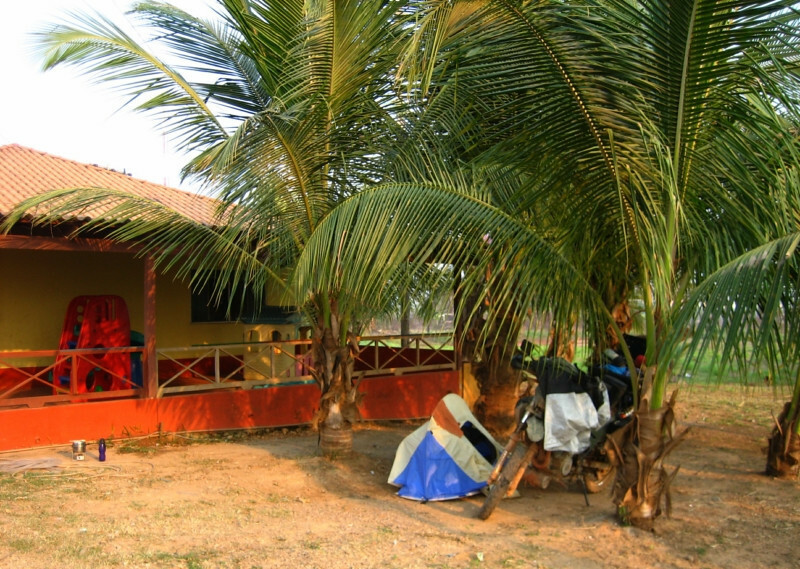 The front porch of Sebastian’s jungle house. 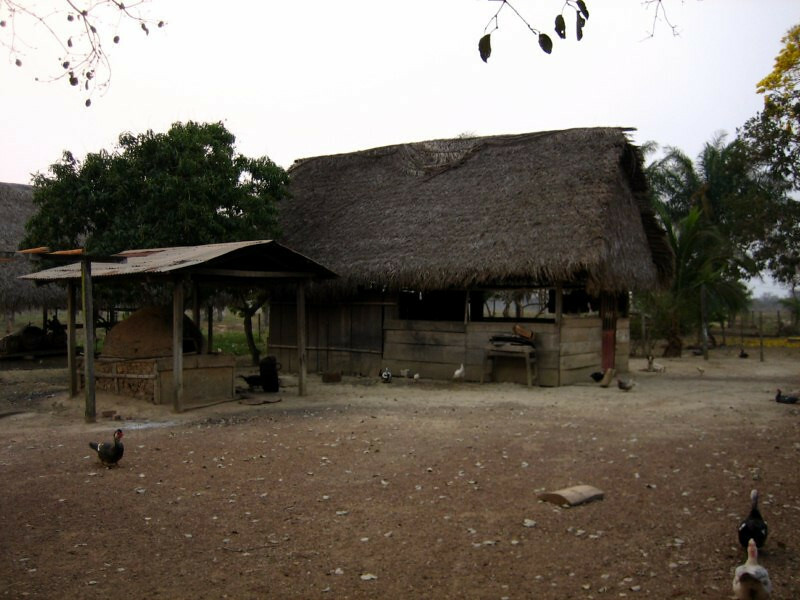 He also has another house in Itaituba, but stays out here for long periods tending to this land. 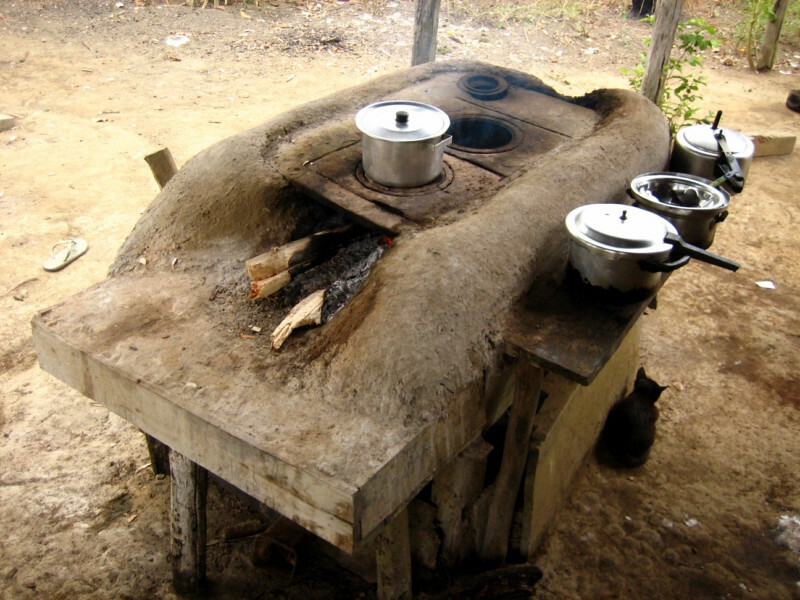 An efficient design of a wood-fire stove. 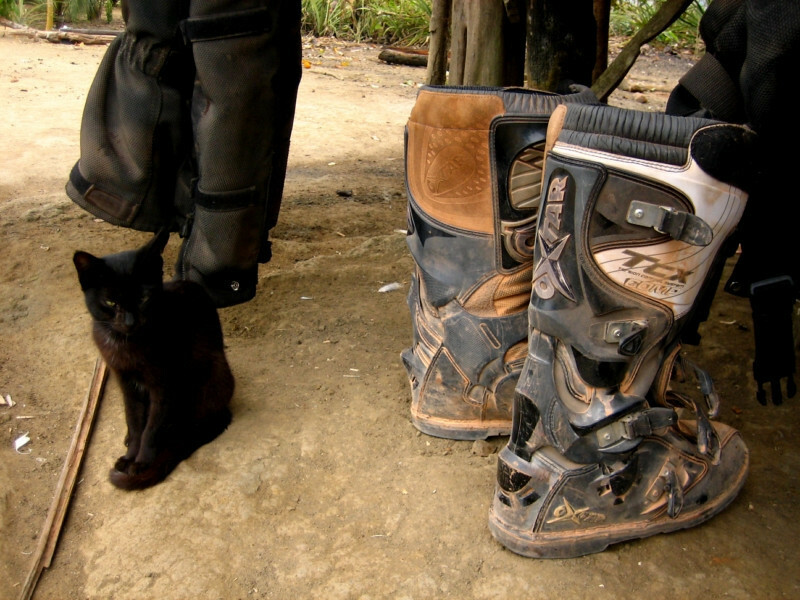 Sebastian’s cat with my Oxtar TCX boots. 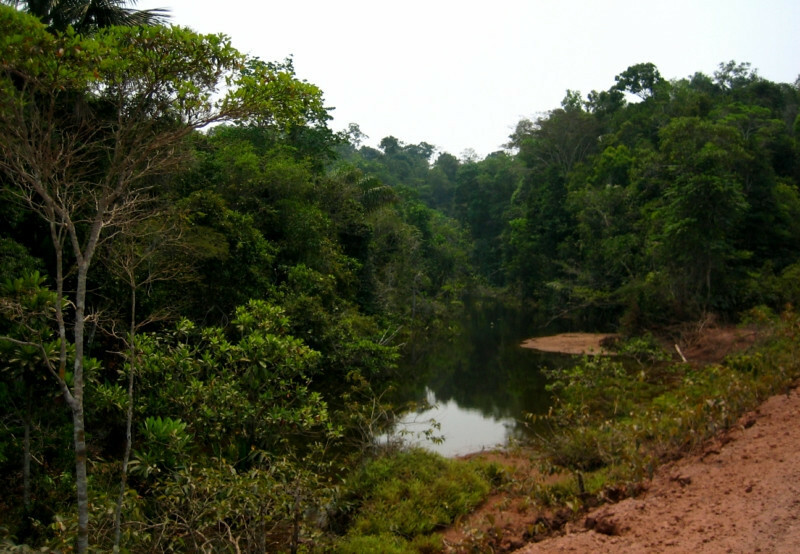 Just north of Sebastian’s place, I entered the official Parque Nacional da Amazonia, the one protected place in this whole massive jungle and that too, it appears it’s just a park on paper with no real enforcement. 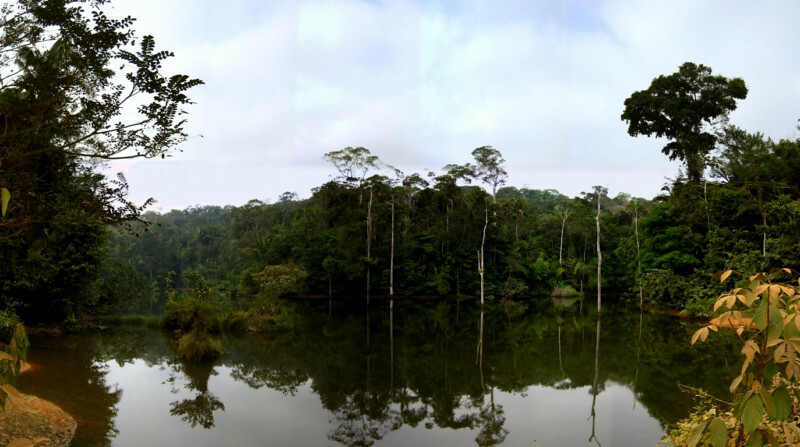 Getting a feel for the thick jungle in this panorama stitch of 12 photos spanning about 180 degrees left to right and about 30 degrees up and down. The only difference about riding through the actual park was that I didn’t see any burning of the jungle. It felt good to ride with the trees leaning over the road. Oops, the trailer slipped into the ditch. There was no one in the truck, so I presume they already went to get help. View of some waterfalls from the road. I wanted to jump in for a dip. The rivers are so huge here they easily resemble a lake, but that’s Rio Tapajos, emptying into the Amazon near Santarem. 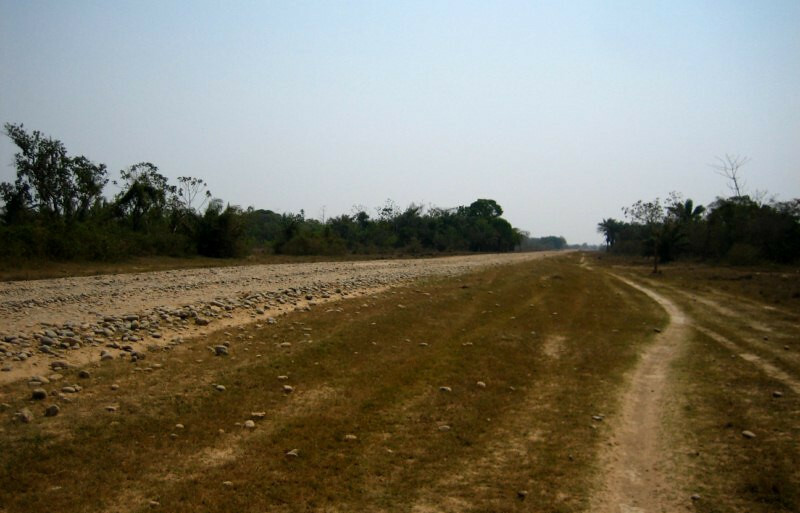 For the last 160 kms (100 mi) of this river, it is between 6-14 kms (4-9 mi) wide. 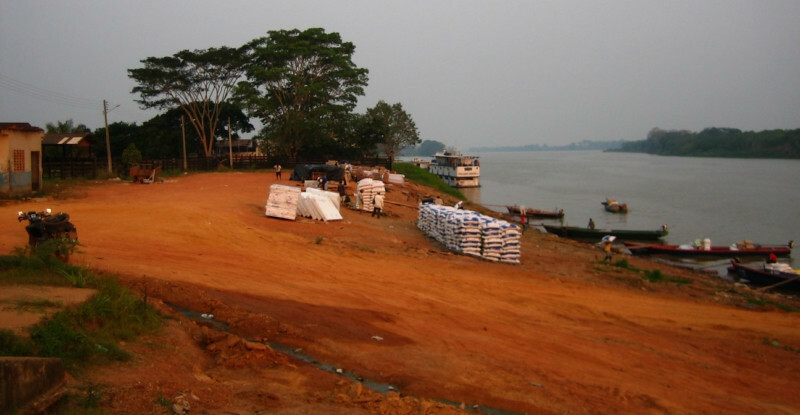 Arriving in Itaituba, the end of the fun part of the TransAmazonica. 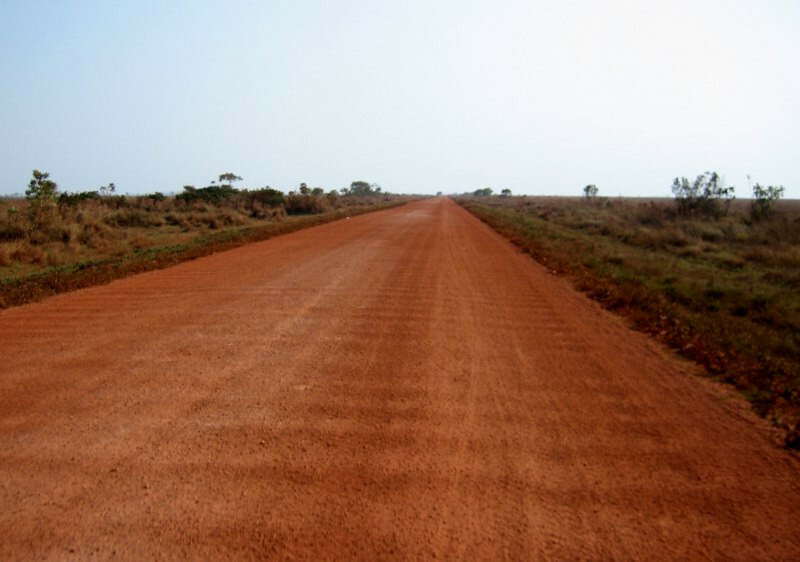 From here, there’s another 1,000 kms (620 mi) of dirt to Maraba. 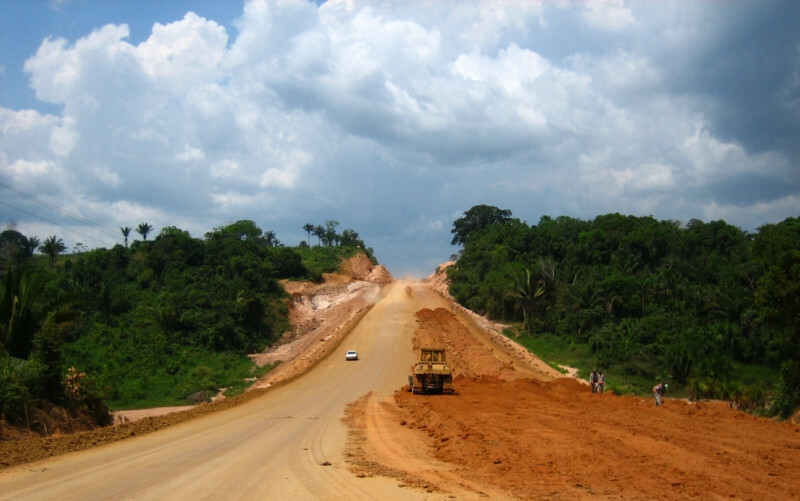 August 13 – 16, 2010After the preparatory journey across the Bolivian pampas, I was excited to be entering the allure that is Brazil, the largest country in the region and one of the pillars of the new Global South power regime. Apart from being the only Portuguese-speaking country in Latin America (and thus Brazilians not being considered Hispanics), the Brazilian culture feels different from the rest of the region. Perhaps it’s due to its strong economy and the development that it has brought to its people or perhaps it’s the immense fertile land and long, luxurious coast line that helps define the people of this area. 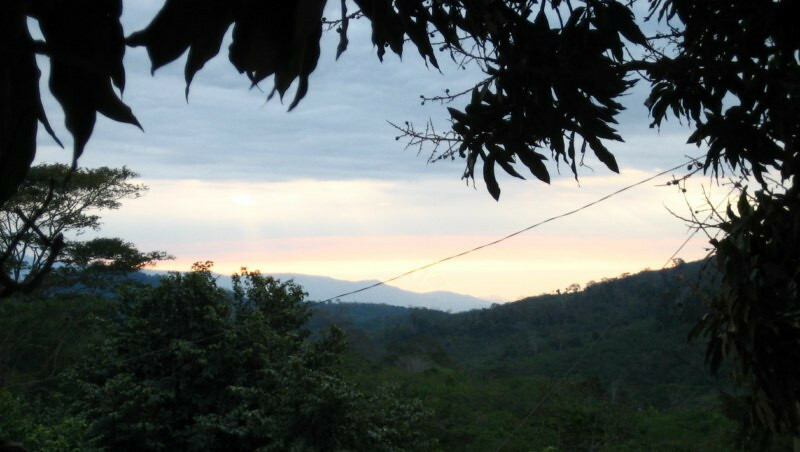 Being identified primarily with the Amazon as opposed to the Andes that touches most of the other Latin America countries also aids in creating the distinction. The difference I noticed right away was the warmth of the people, a kind that I haven’t noticed from the general populous in other countries, so far. Not that I haven’t met amazingly warm and beautiful people in all the countries that I’ve traveled through, but a good vibration seems to be emanating from all Brazilians. 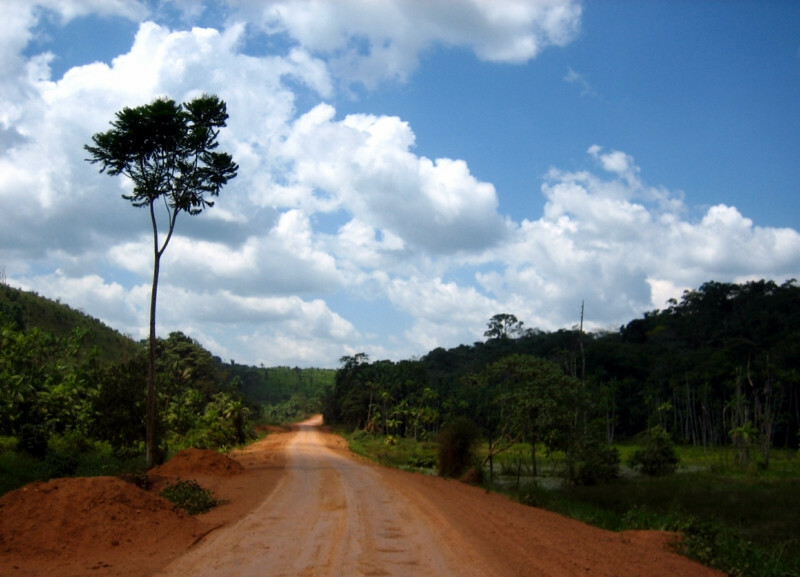 The biggest attraction in Brazil for me was the Amazon. After reading about these lungs of our planet and the damage being done to them, I had an urge to see for my own eyes. I also had a good friend staying for a year in Brazil and I figured it would be a good place to take a few weeks break from the trip. Spending these three months in Brazil was also a good way to wait for summer to arrive in Patagonia, where I’m headed next. 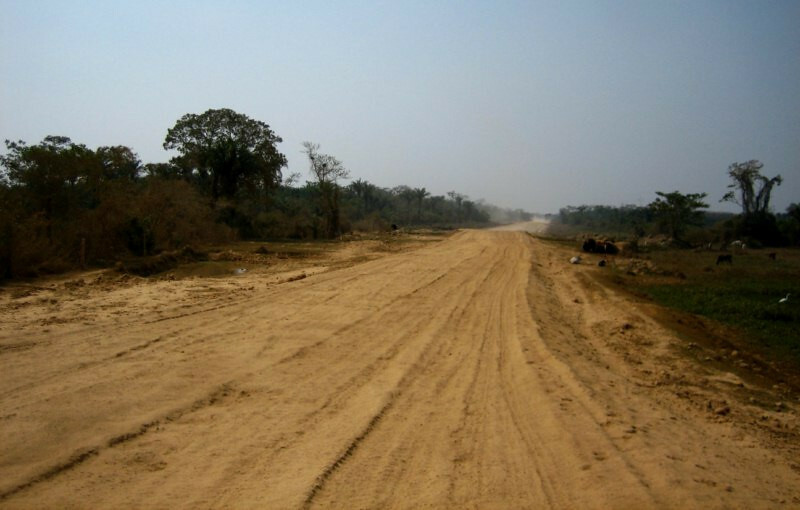 I crossed at Guajara-mirim to begin on the west end of the fabled TransAmazonica highway cutting across the Amazon jungle to civilization on its eastern end. After a few weeks off in Sao Luis, I headed down the coast to Sao Paulo to take care of some things and then relaxed on the beaches on the way to Rio. From there, I turned south for Argentina. Brazil borders all the countries in South America except Chile and Ecuador and most of them have their borders in the Amazon. 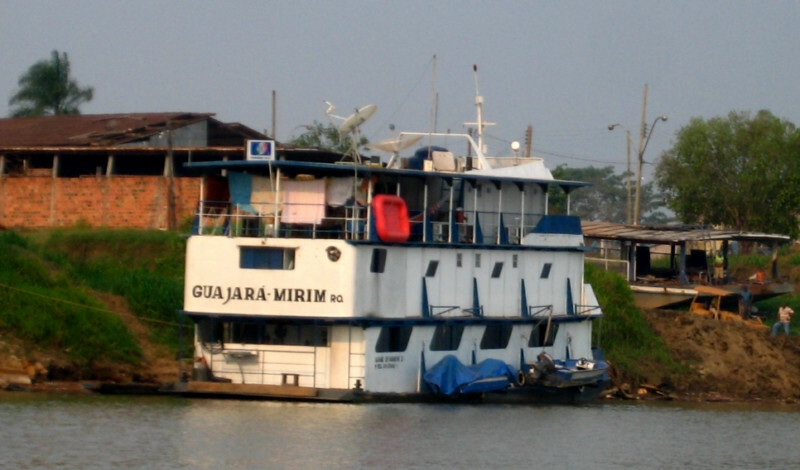 I crossed from Guayaramerin, here in Bolivia across Rio Guapore to Guajara-mirim in Brazil. Being my second canoe trip with the bike, I was now more familiar with how to load the bike and keep it balanced. 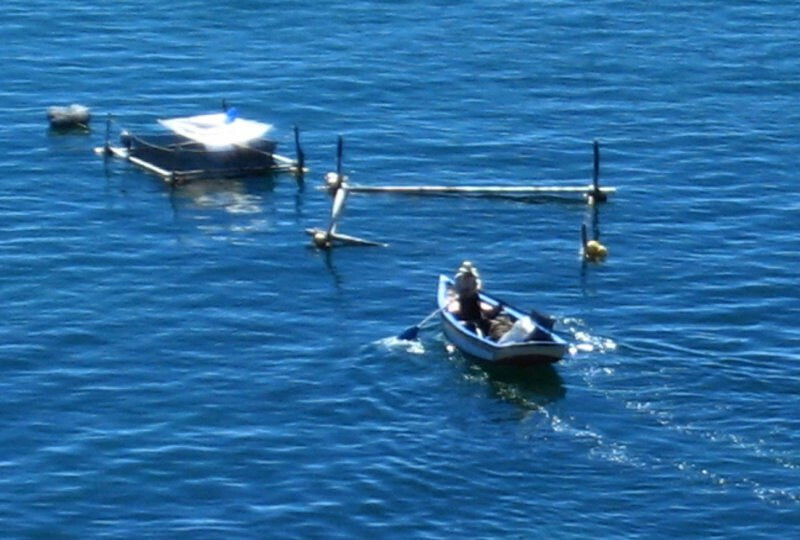 The boatsman removed his outboard motor with the long propeller shaft and using a ramp, sanDRina was pushed in. 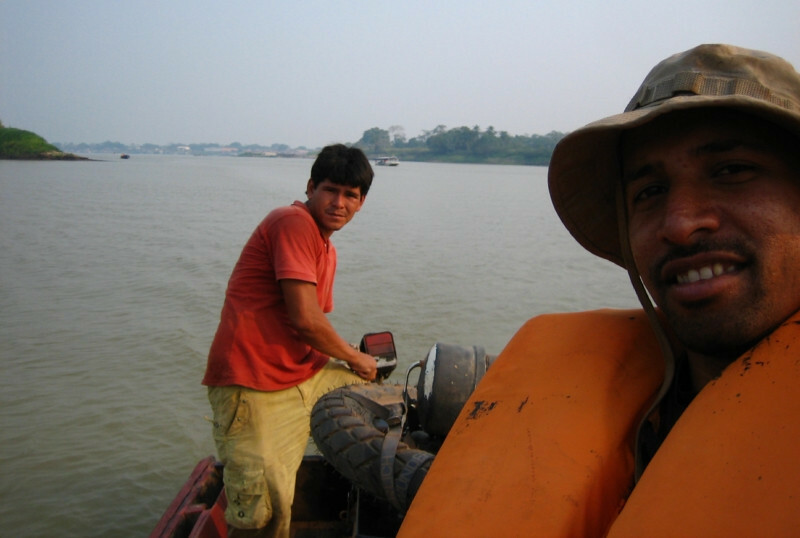 I made a deal with this Brazilian boatsman to take me across for 40 Bolivianos (10 Brazilian Reals, $6). He accepted my initial offer since it was towards the end of the day and he would be returning home empty otherwise. 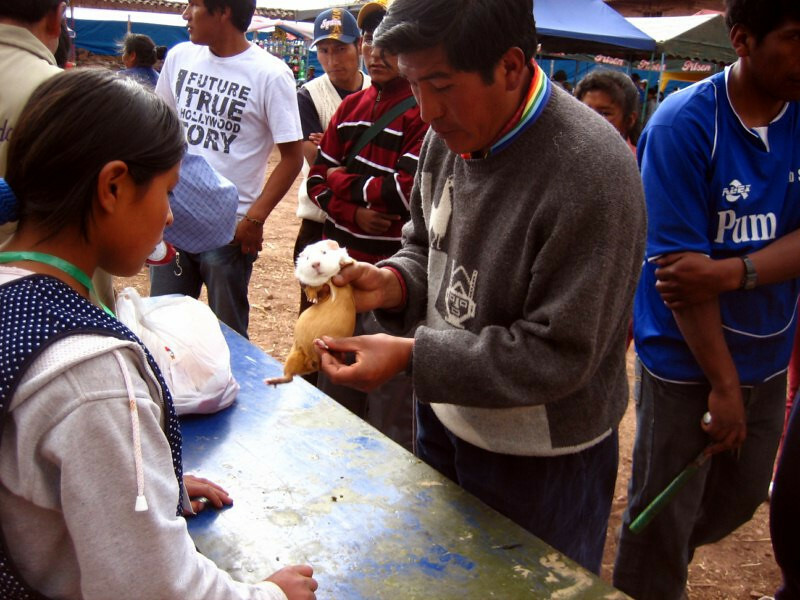 There’s a brisk trade going on between the border towns with Bolivians importing nicer commodities from wealthier Brazil, and sending over less pricey clothes and other items since things are more expensive across the river. At the docks sat these grand vehicle ferries that were chained up, but being cleaned. 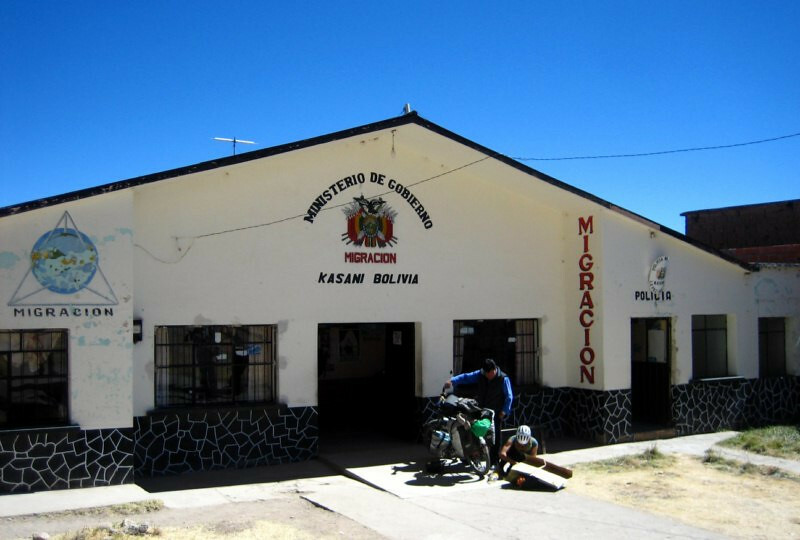 I was told they run about once a week or even less, since there’s very little demand for vehicle traffic across this border (besides all the illegally smuggled Brazilian cars into Bolivia). 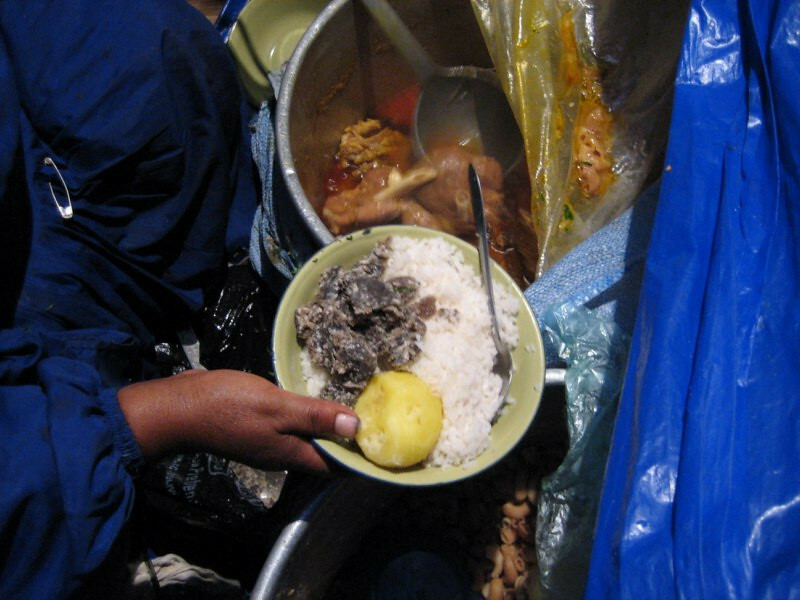 But human ferries were in abundance with Brazilians rushing over to buy some cheap items in Bolivia, have a cheap lunch and then rush back. 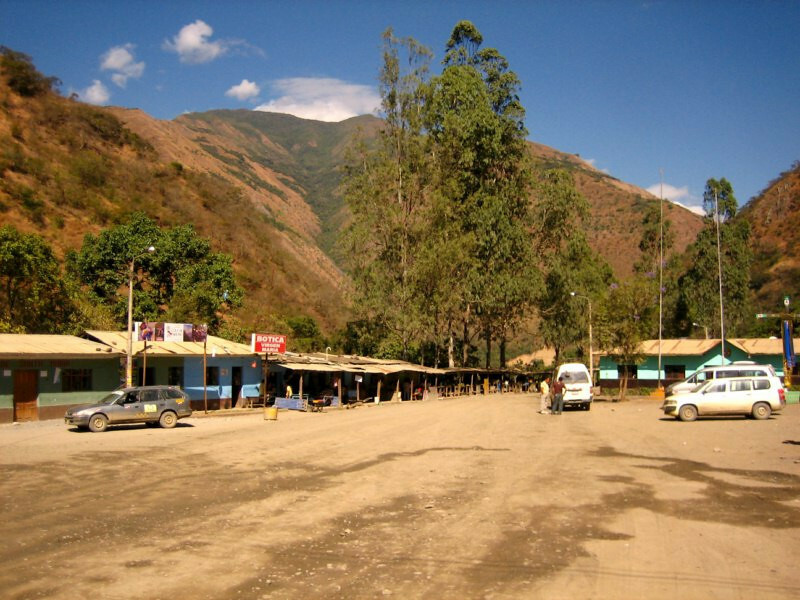 The passenger terminal on the Bolivian side. Racking up some more water miles with sanDRina. I sat on her to keep her balanced. Going around this rocky out crop with the sun fading. 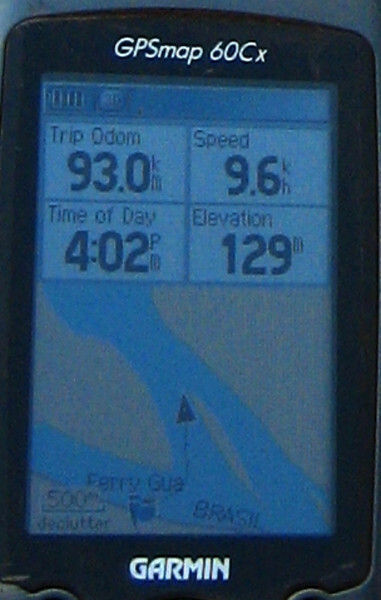 A GPS map of the crossing. Ahoy, Brasil! The river level rises during the rainy season, so maybe these old boats are waiting for the good water. On the canoe with my steady boatsman, nice guy. All passengers are required to wear a life vest, but I guess the skippers are exempt. A boat house near the Brazilian coast. 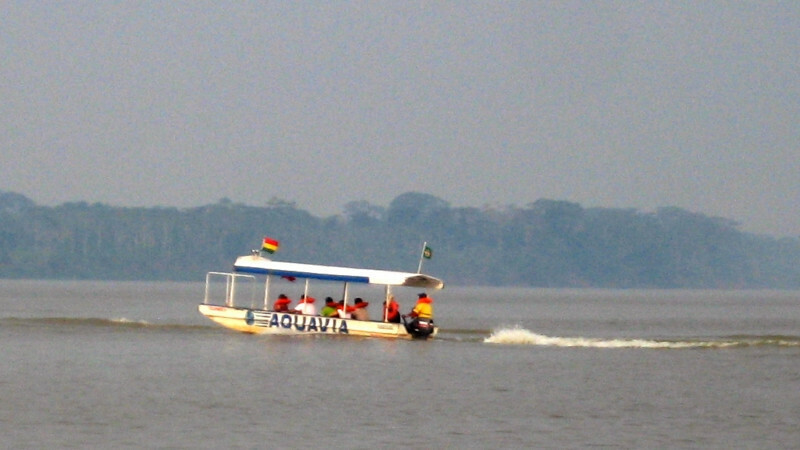 Would be nice to tour the Amazon on a boat like this. 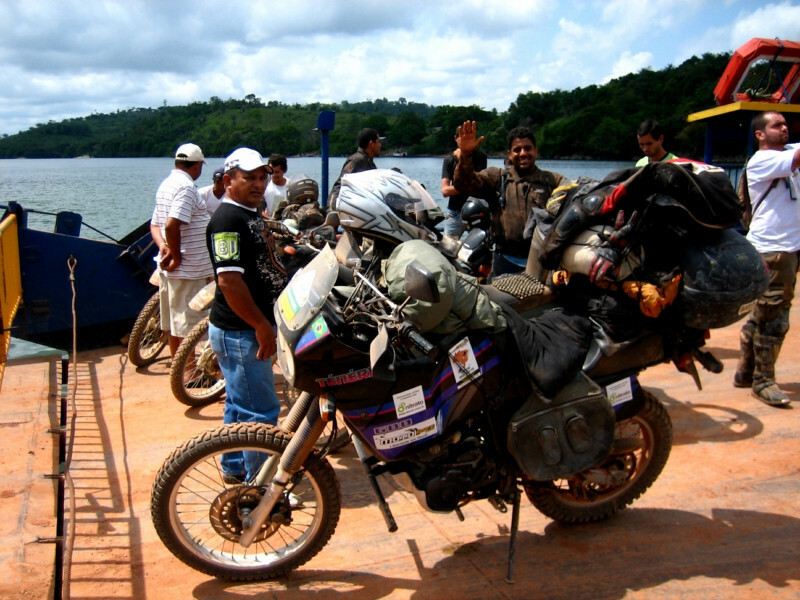 Riding the sandy bank up into Brazil after struggling with a tip over while backing the bike out of the canoe. 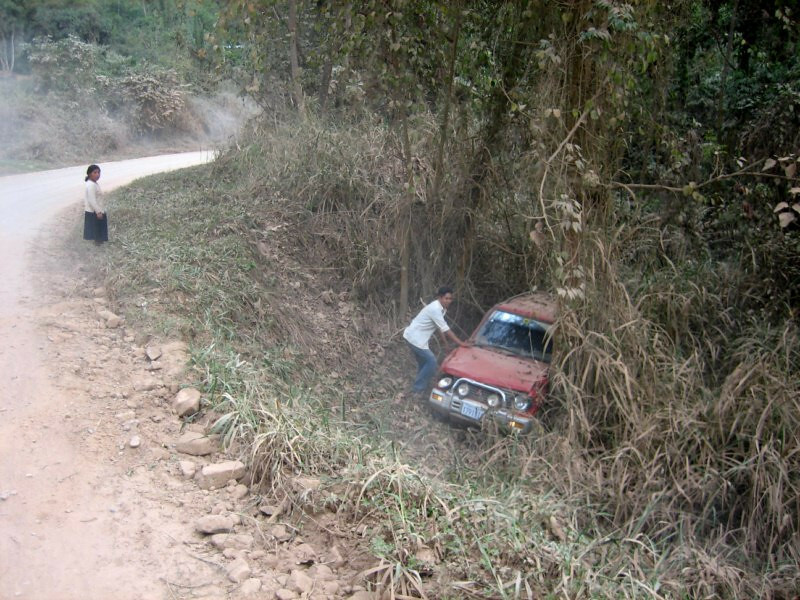 I also think I damaged my already weakened clutch some more on this steep, sandy climb. I got delayed on the Bolivian side since the customs office was closed from noon to 3 pm, so the sun was setting as I arrived in this new country. Not ideal, since time is needed to do all the appropriate paperwork, but I got it all done in time. Not being a regular land border, the offices needed are not all located nearby. 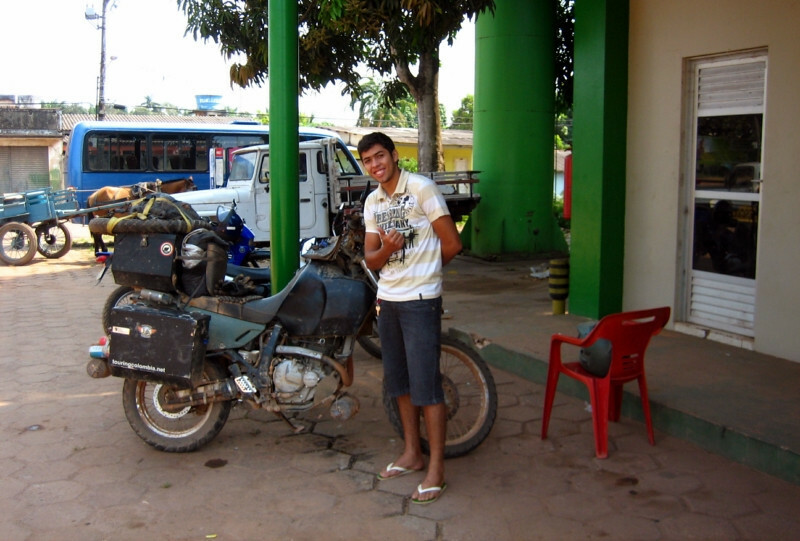 I walked to the Federal Police station to process my immigration into Brazil, then over to the nice guys at customs to process the bike in. The head official was quite impressed that I was entering by motorcycle and treated me quite well with coffee and some snacks. I was already feeling very welcome and comfortable about being in Brazil. 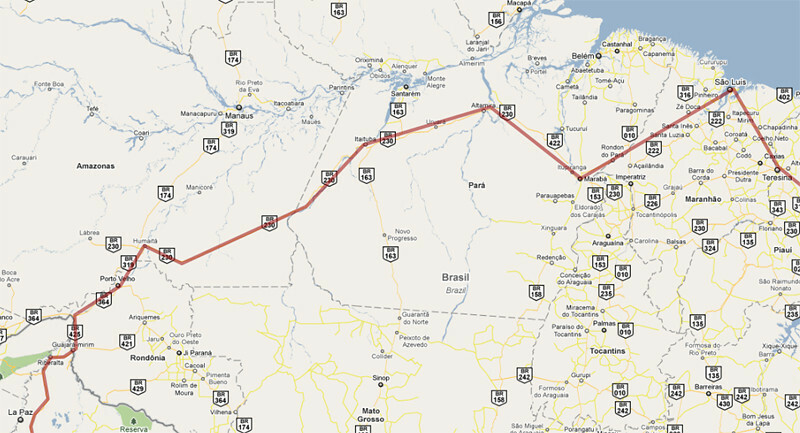 My route map across northern Brazil, entering near Porto Velho and taking BR-230, the TransAmazonica Highway across the jungle to Sao Luis on the coast, a 3,500 km (2,170 mi) journey with about 60% of that being dirt roads. Click on it to go to the interactive version in Google Maps. The Brazilian currency is the Real (pronounced ‘hey-ai’). USD $1 = R$ 1.70. 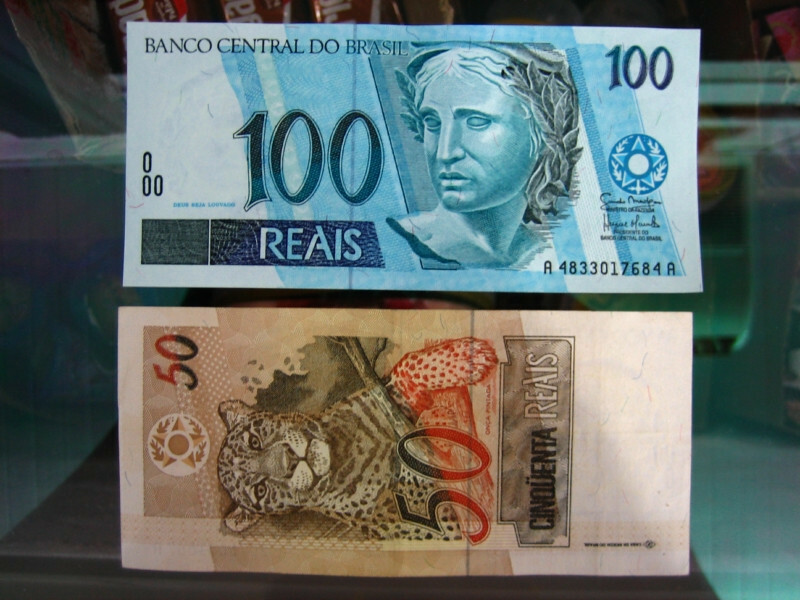 R$ 100 = $58. It’s a beautifully designed currency and the first one that I’ve seen with a portrait print on the backside of the notes. 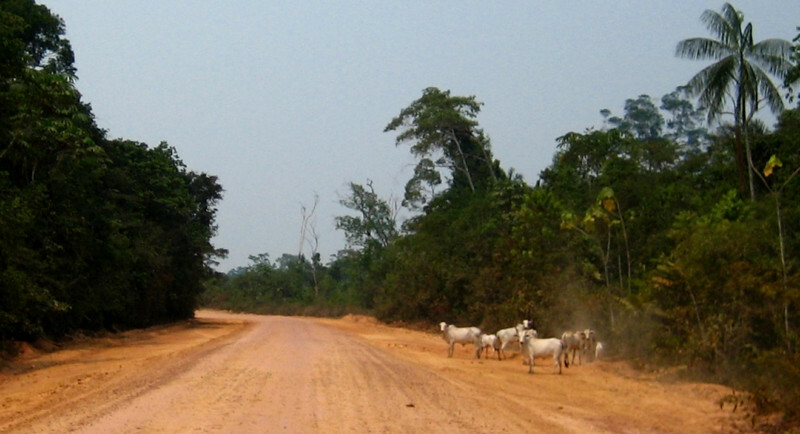 The portraits are of the various animals found in this biologically rich land. This currency was introduced in 1994 to end decades of hyperinflation in Brazil, which was also timed nicely with Brazil’s rise in economic power. Since I was going to be camping in the wild a lot more now, I figured I needed some sort of protection at night in case I was approached by would be bandits or jaguars. It’s the snakes I was really afraid of, so I bought this machete in La Paz for $3. 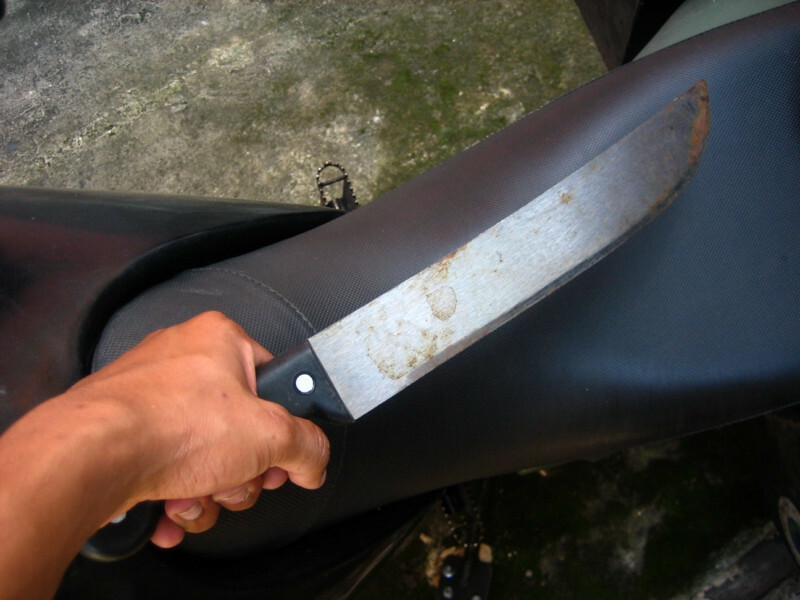 In Portuguese, a knife is called a ‘faca’ and a big knife is called a ‘facão’, pronounced ‘fackauwn’ – sounds deadly just saying it. When tenting it, I slept with the facão by my side with my hand ready on it. I covered it in a sweatshirt until it would be called upon. Just hope the police don’t find it during a regular search; would be hard to explain but I’m going to try saying I need it as a meat cleaver, being a cook and all. Throw me a chicken and it’ll be diced up in 5 minutes. I got released from customs around 6 pm and since it was dark already, I stopped at the first hotel. But they were all booked out for a festival and not having the energy to go scouring the town for another hotel, I asked them if I could just camp out back in the garden. Sure, no problem and they even said I didn’t have to pay but could still take a shower and use the facilities. I was starting to accept that all Brazilians were really nice and warm. There was also ice-cold water for the taking and I gulped down as much as I could before setting out the next morning (resulting in frequent pee stops). 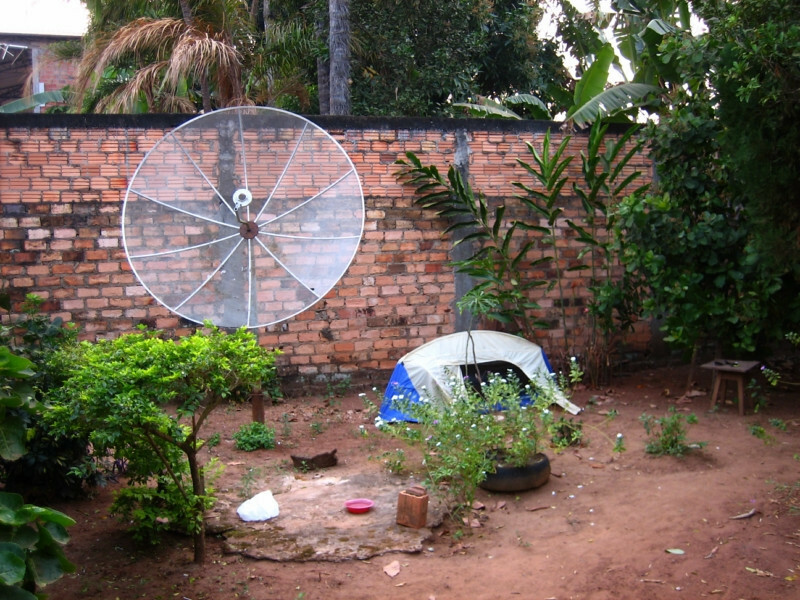 I tried tapping into the satellite dish to get the results of the latest Formula 1 race, but no dice. 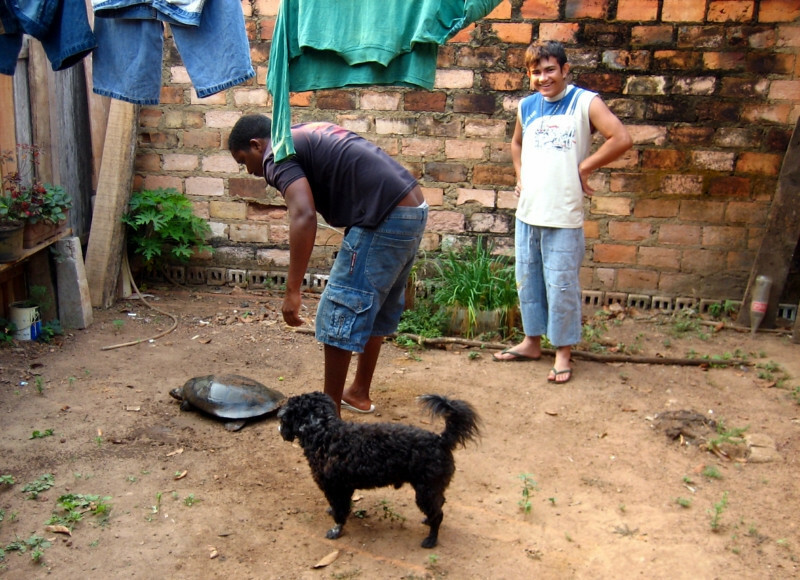 The next morning, the family running the pousada (small hotel) was getting ready for a feast and this river turtle’s throat was slit and laid to die so that it’s meat could be cooked and enjoyed. They kept the turtle fresh in a small bucket of water until it was to meet its destiny. When I was young in Zambia, I wanted to go see a goat being killed for a party that we were throwing, but my father warned me that it would affect my taste for meat. It still has the same effect and perhaps everyone should be obliged to see how their food is killed before it appears on the dinner plate. 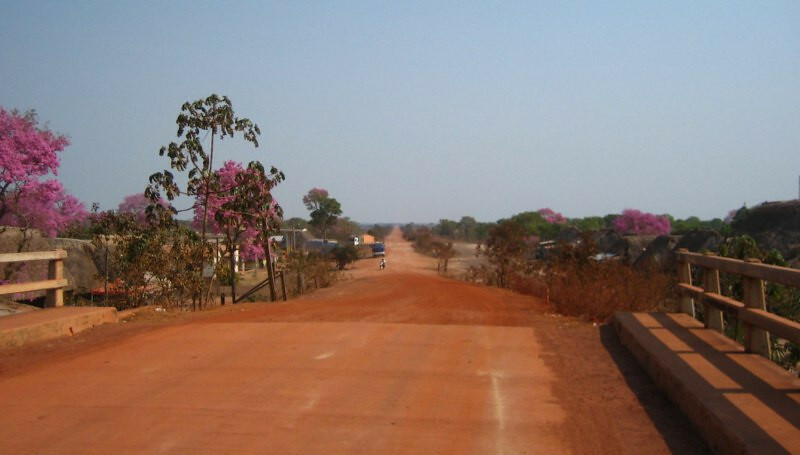 Heading out of Guajara-mirim on 530 kms (330 mi) of asphalt through Porto Velho and onto Humaita, the start of the fabled roads through the Amazon. 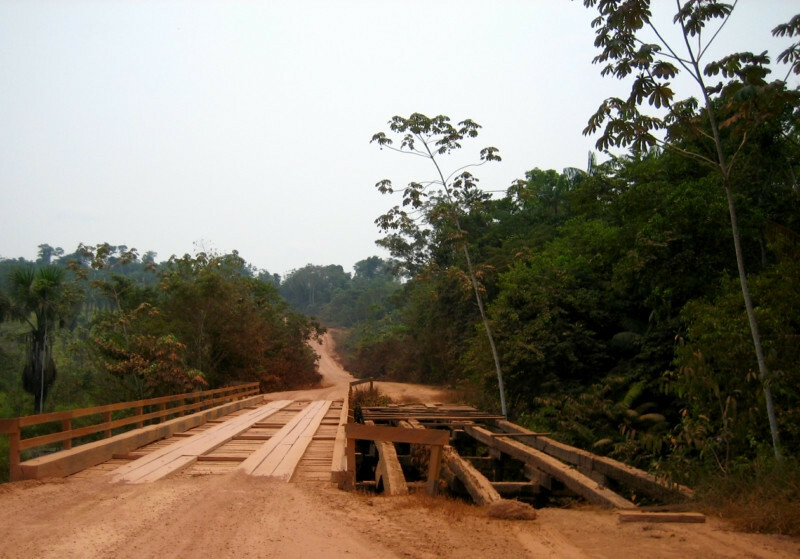 Crossing a wooden bridge; a taste for things to come. 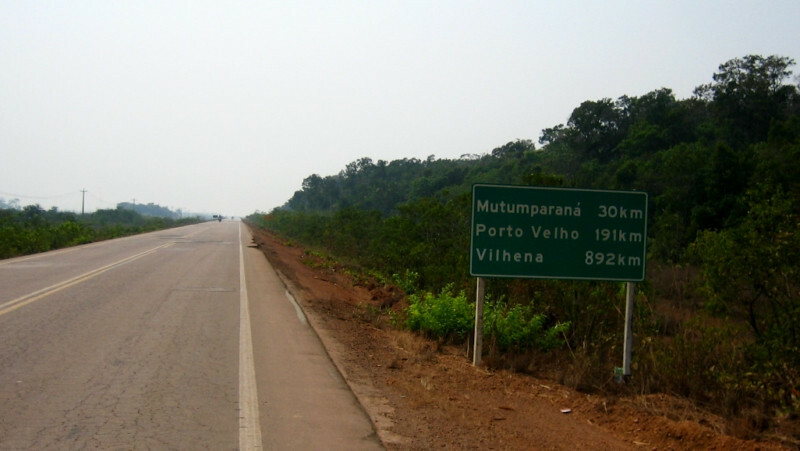 Distance board on highway BR-364 heading to Porto Velho, an example of the well-signed roads here. 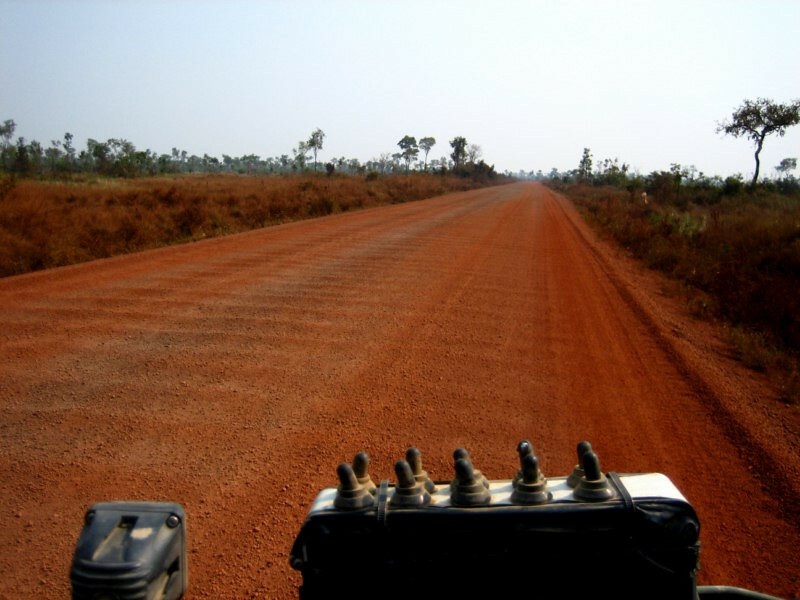 The road was being paved in areas, but overall, the riding was smooth allowing me to cover lots of ground. 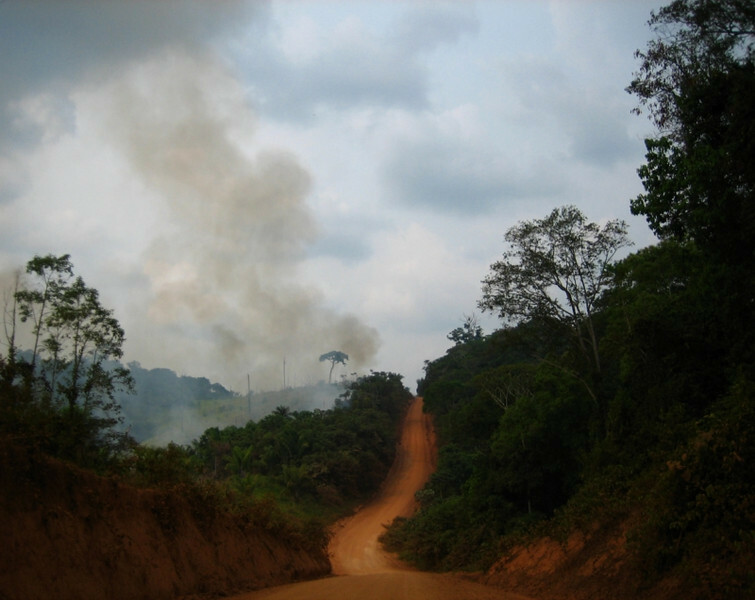 Smoky haze, a sad but true reality of development in the Amazon. Knowing I would be frugal with my food expenses from here on and celebrating my first day here, I treated myself to a R$ 10 Brazilian Churrasco (barbeque) for lunch. 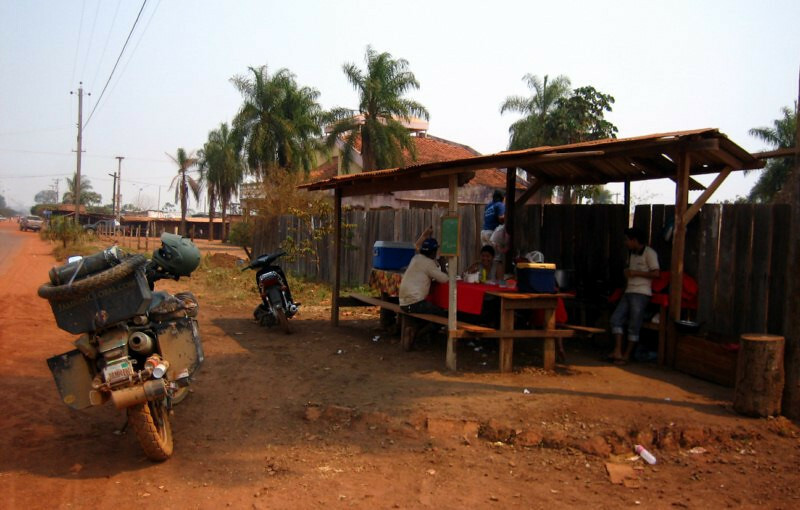 These type of restaurants are available all across Brazil and are considered the typical road food. I had two plates of meat cuts (sausage, ribs, roast beef, chicken) along with plates from the buffet line that had a good selection of salads and veggies. Brazilian food in general isn’t spicy like all other South American countries, but all tables come with a local hot sauce; here it was chillies preserved in oil, which went well with the meats. Primarily drinking water (from my filter), I also treated myself to a R$ 2 Coke, which was great for washing down all the grease. 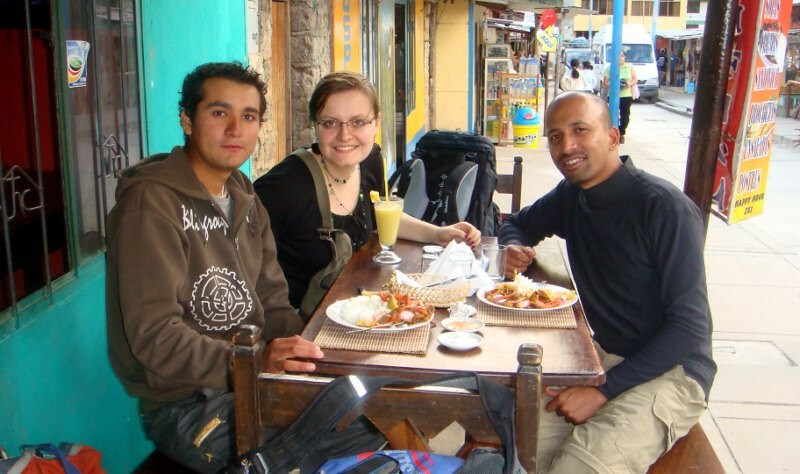 This meal was blowing my food budget, but I learned from Holger and Anja (RTW riders from Germany) that even though you need to keep a tight budget to do a trip like this, you should treat yourself once in a while if you’re in this for the long haul. 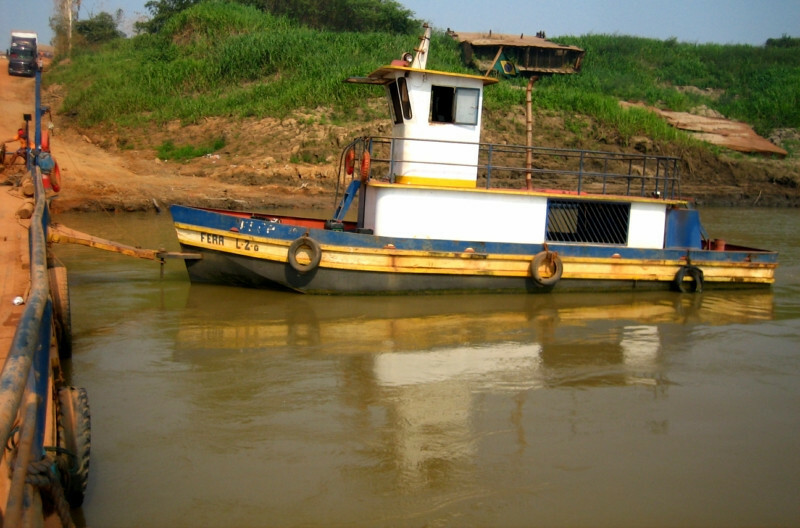 Catching the first of many ferries across the numerous rivers of the expansive Amazon River basin just outside Porto Velho. 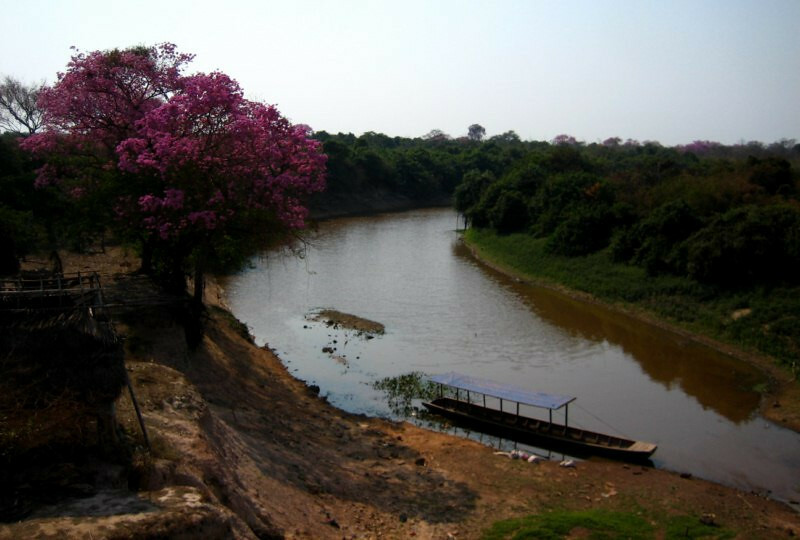 This is Rio Madeira, the biggest tributary of the Amazon River, which is further north. 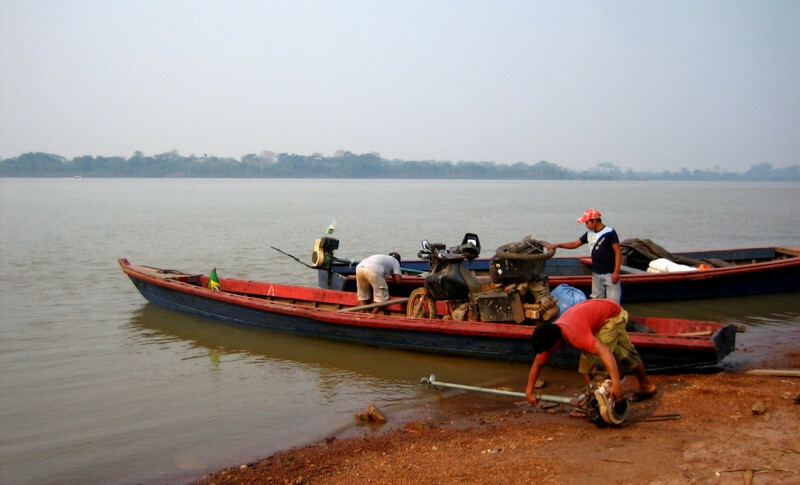 Locals working in Porto Velho, the biggest city in the area, returning to homes on the other side of the river. 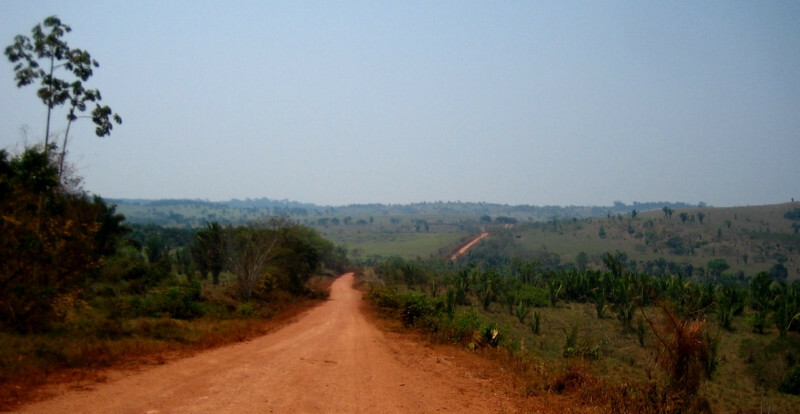 An elderly rider was very impressed with the sight of my bike and invited me to stay on his farm (fazenda) a few kilometers on the other side, but I had more ground to cover. 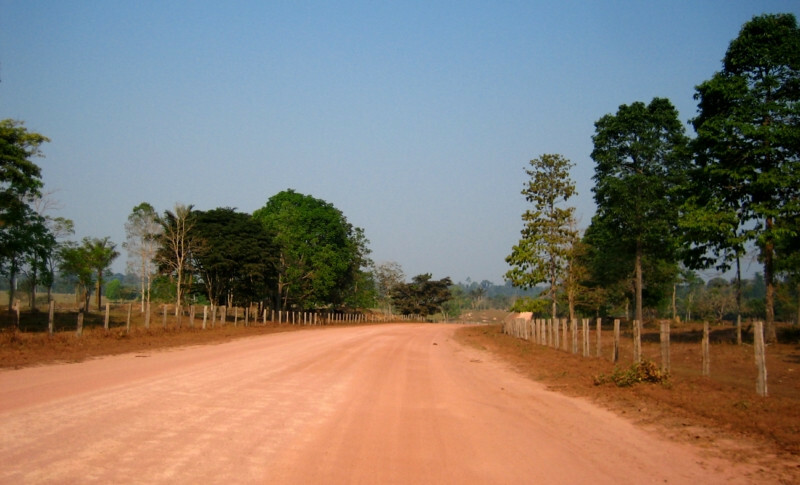 Riding BR-319 towards Humaita, where the pavement stops. 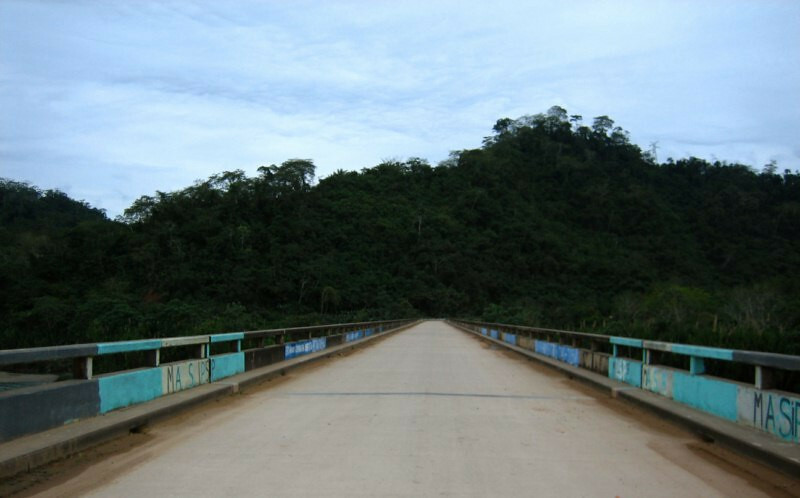 This is one of the two major roads crossing the Amazon and heads north to Manaus on the Amazon River from Humaita. 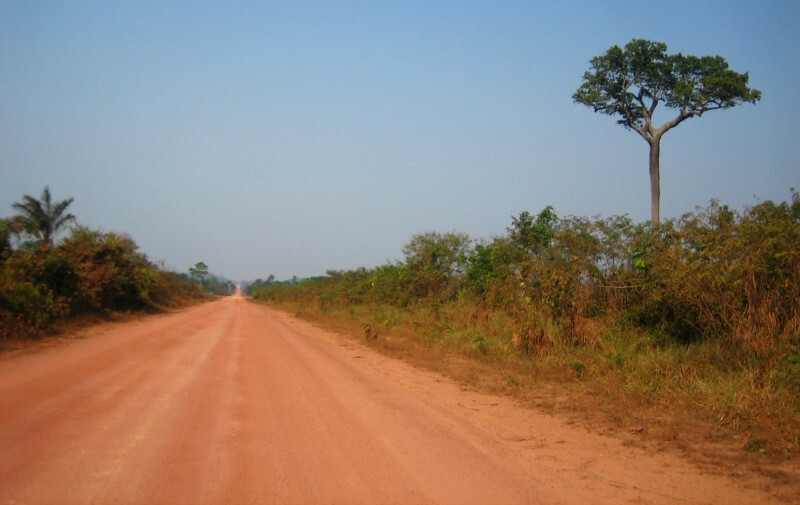 The road is notorious in the rainy season and a call to riders in the dry season, which is now, from July to September. 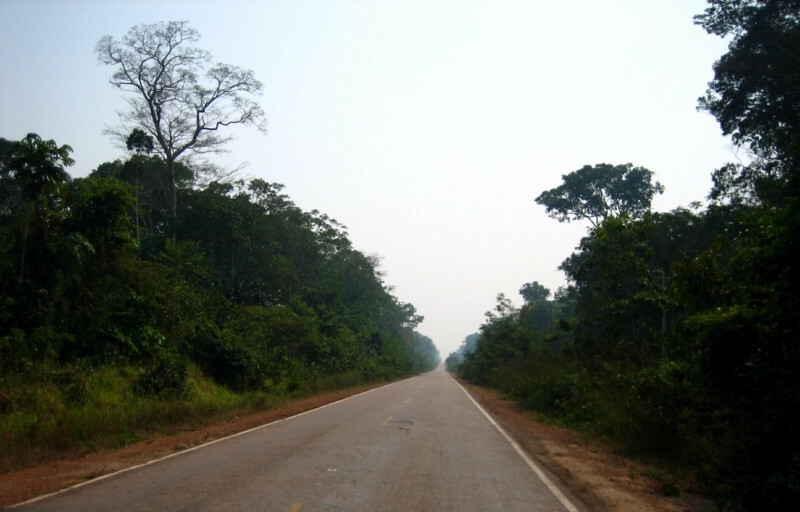 From Humaita, I would be taking BR-230, the TransAmazonica Highway, which parallels the Amazon River a few hundred kilometers inland. 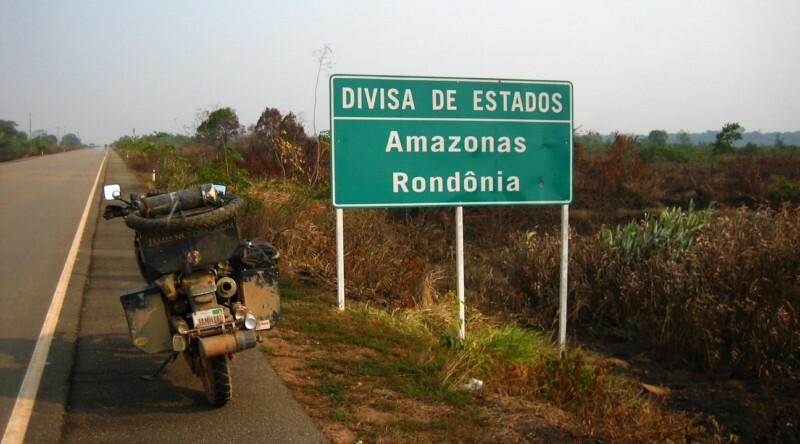 At the state border between Rondonia and the great Amazonas state. More biomass burning for agriculture. 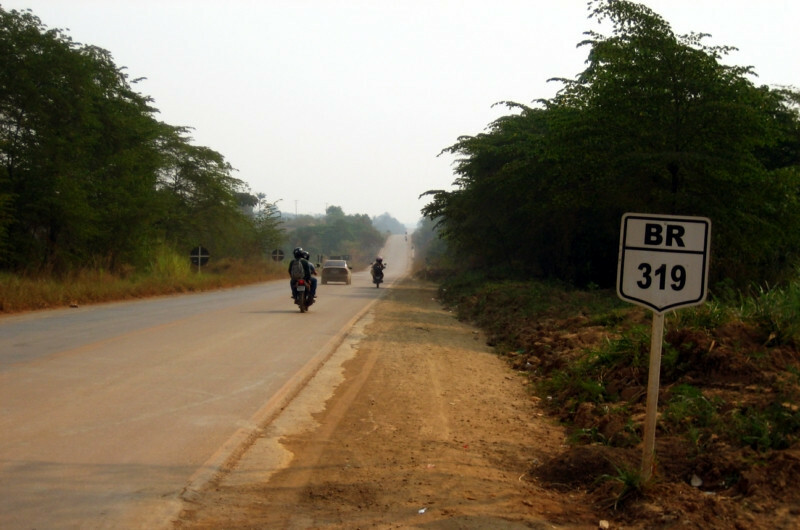 The well-maintained section of BR-319 heading north to Humaita. The sun setting on my first day of riding in Brazil and I covered a huge amount in comparison to my daily average, doing 530 kms (330 mi). 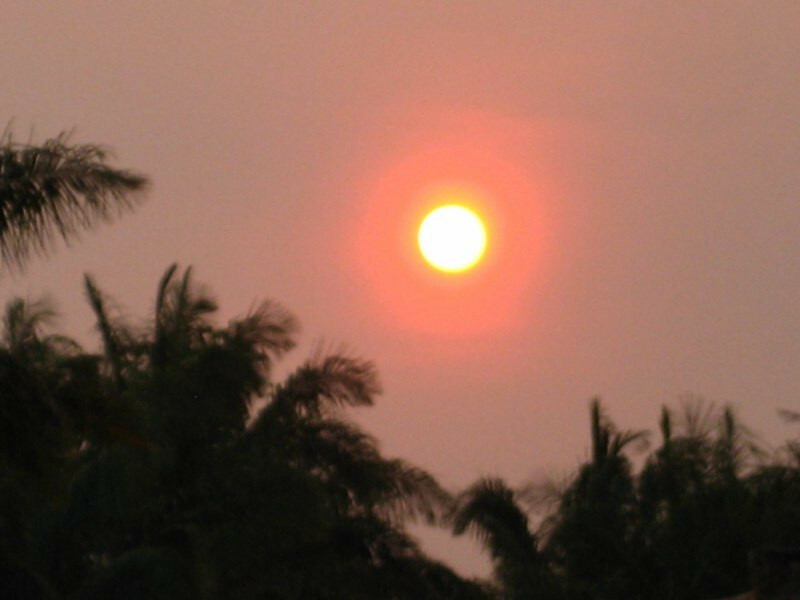 Due to the smoke haze in the air, the sunsets here were similar to those induced by the dust haze in the Bolivian pampas, allowing for the whole sun to be seen for a long time before it finally set. 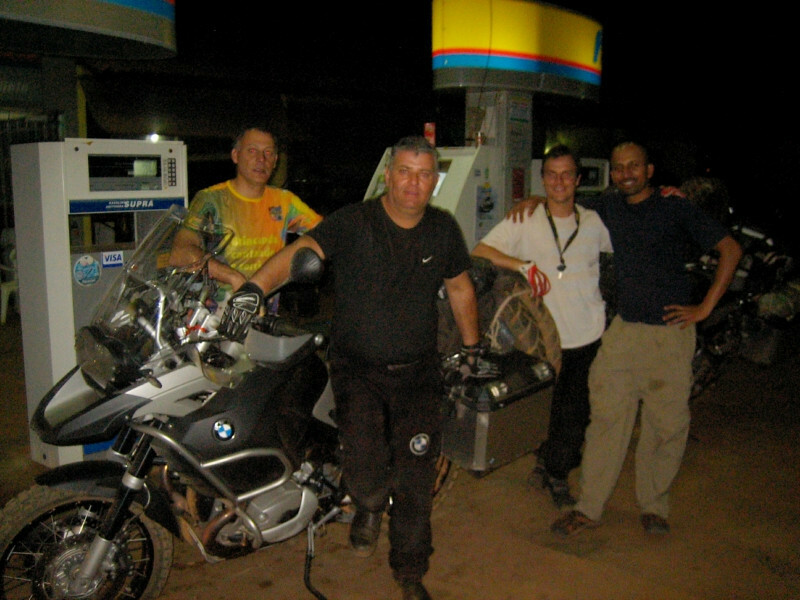 At the gas station in Humaita, I met up with these three Argentinian riders from Cordoba on big BMW R1200GS’s. 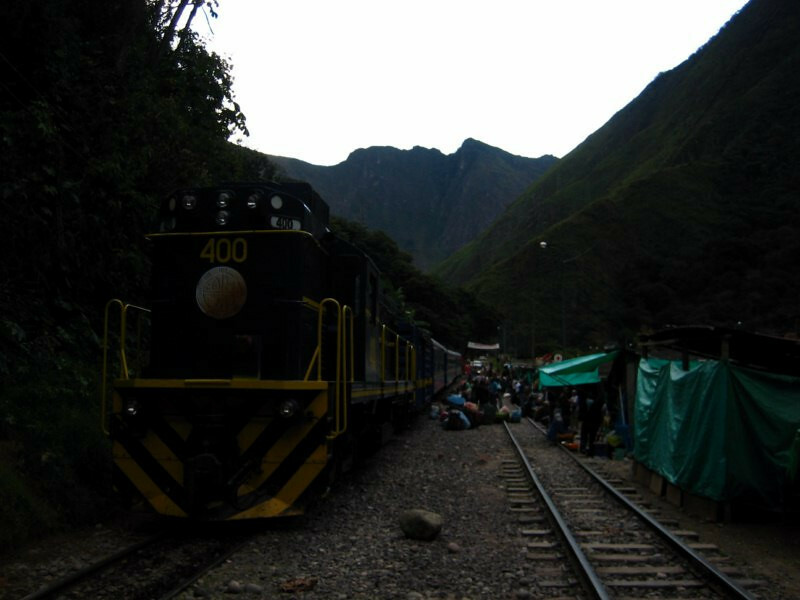 They passed me in the Bolivian pampas as I was setting up camp one night and I got ahead of them today. They were making a loop through Bolivia, up BR-319 to Manaus, over into Venezuela and down the Andes back home over two months. They invited me to visit when I got to Argentina. 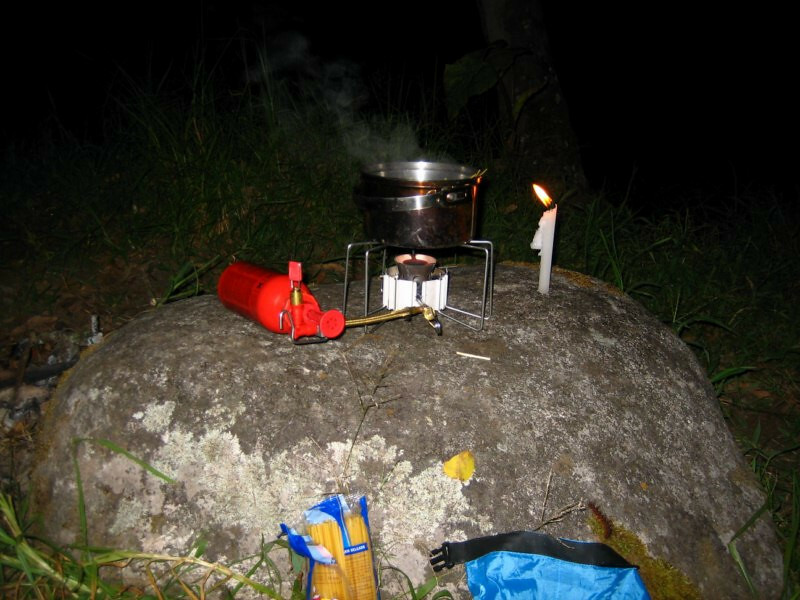 Preparing for the grand expedition that lay ahead, the crossing of the Rodovia Transamazônica, I was rightly in expedition mode, camping and providing my own food. The nice thing in Brazil is that you can camp at the petrol stations for free and they provide showers and ice-cold drinking water (meant for the truckers). Along with gasoline, that’s all I need. 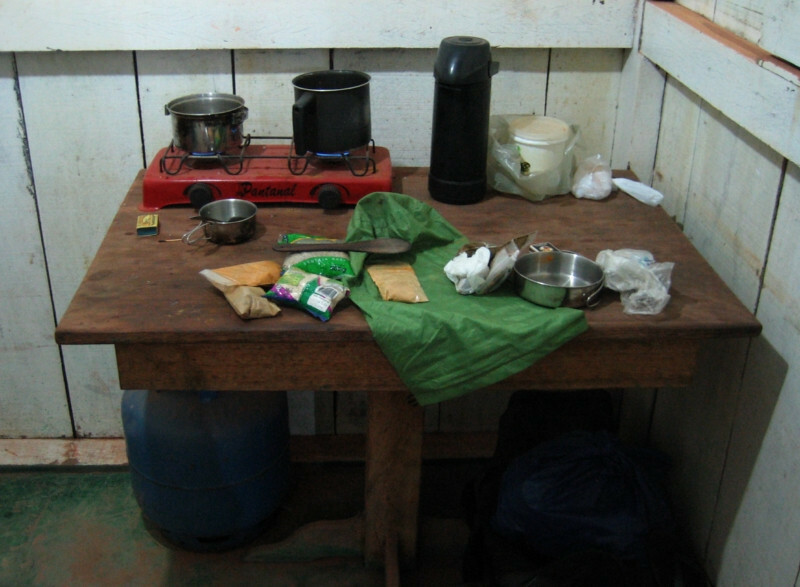 Plus, since most stations are open 24 hours, it adds a sense of security if the attendants can keep an eye on my camp. 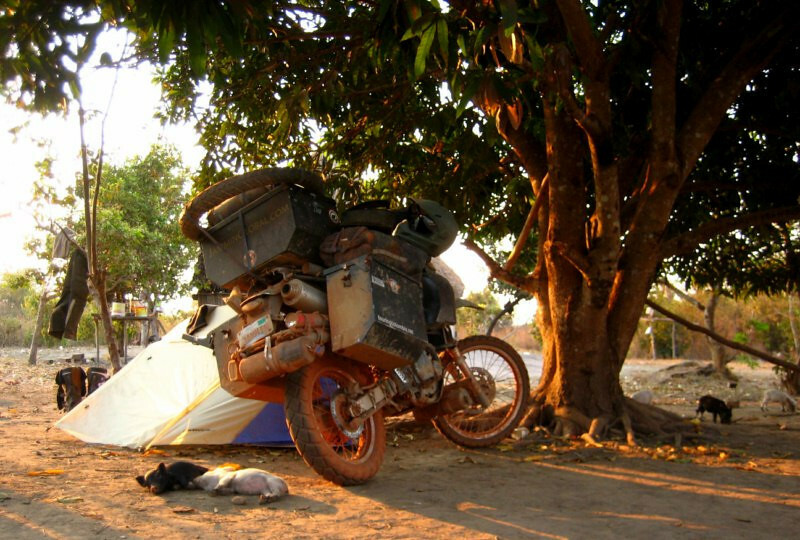 My strategy while camping is to put the bike and tent as close as possible, put my jacket under my legs in the tent since my air mattress is only for the torso, put my riding pants, boots and helmet on the bike seat and cover it all with the bike cover. 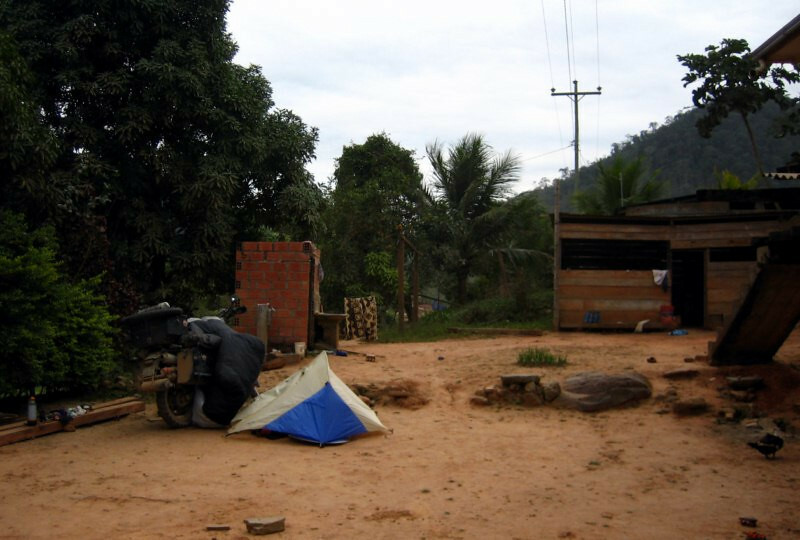 I then run a simple cable lock between those items, the bike cover and a tent peg, so that if someone tried to touch the bike during the night, it would rattle the tent and I would be ready with my facão. 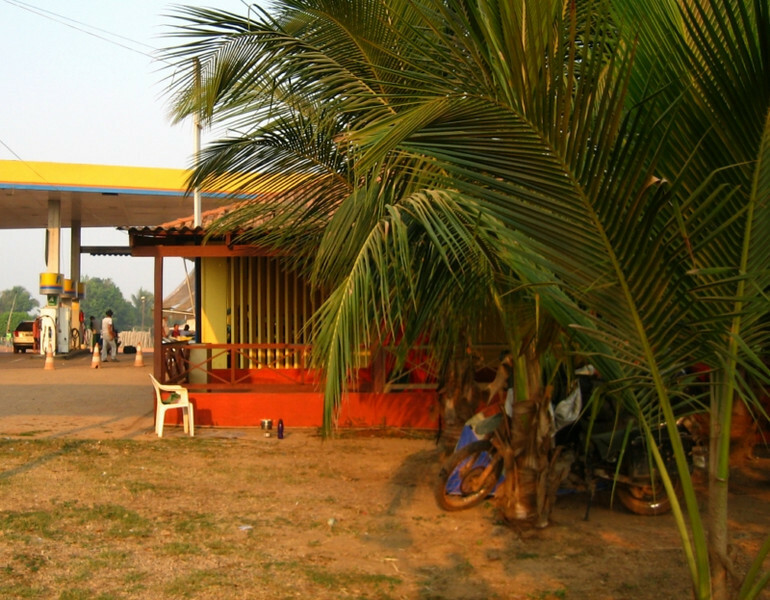 Just to give a sense of location; I was camping to the side of this gas station in Humaita. The attendants told me to camp in a place where they could see me for my safety, but I also didn’t want to camp right in the open, inviting a possible incident. 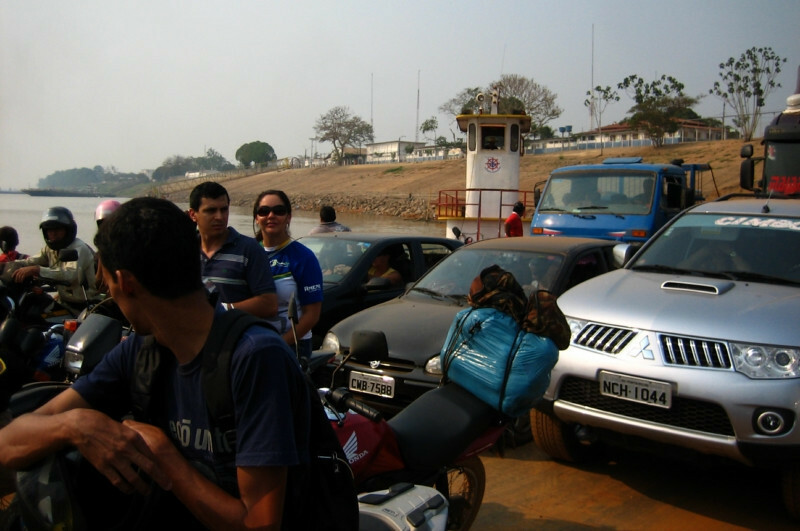 Waiting for the ferry the next morning to cross back over the Rio Madeira. 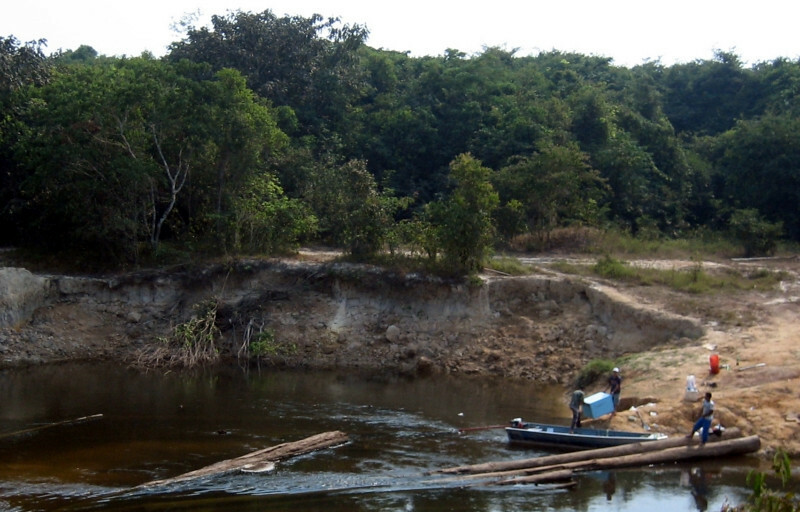 This river runs for about 3,250 km (2,020 mi) before emptying into the Amazon River just past Manaus. 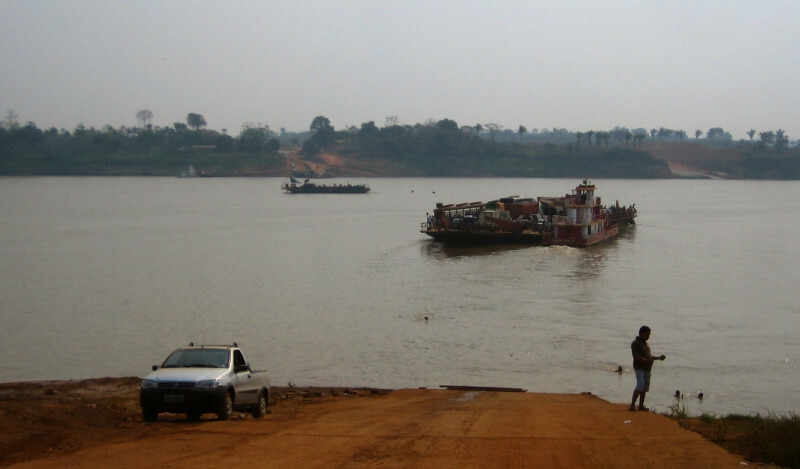 It’s considered the biggest tributary in the world and rises a staggering 15 m (50 ft) in the rainy season allowing ocean-going vessels to sail up to Porto Velho, 1,070 km (663 mi) from its mouth. There’s reasonable truck traffic on this route. 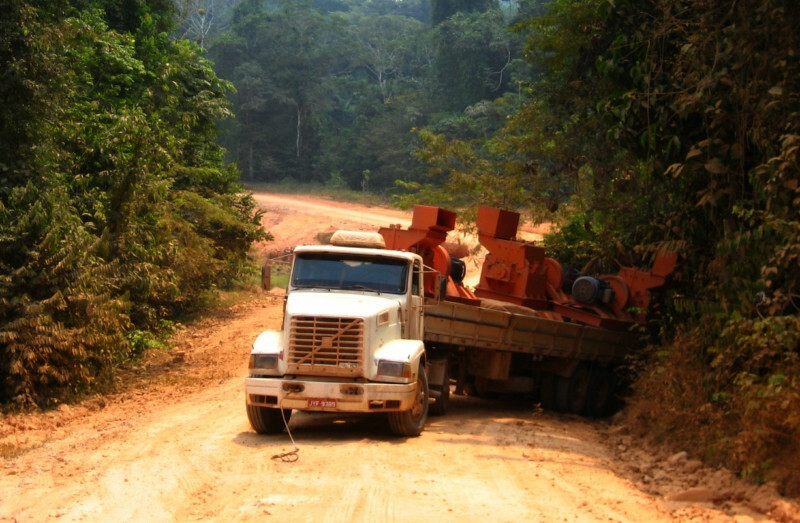 This double trailer (standard issue in Brazil) had to be off loaded one trailer at a time due to the steep angle and sandy approach at the bank. The ferries themselves are unpowered. 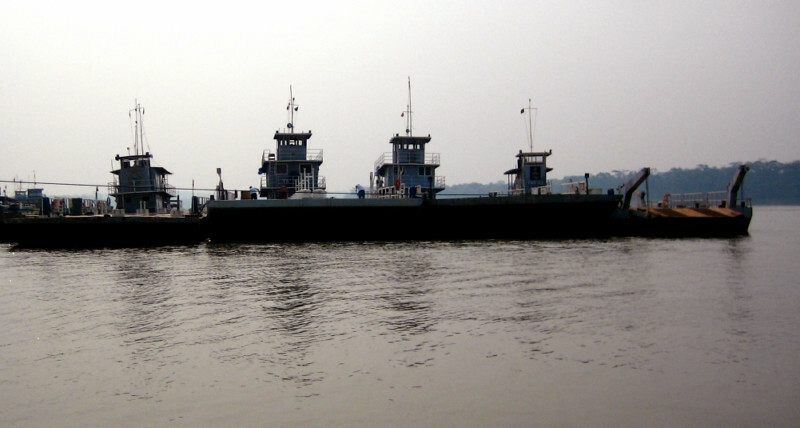 Their locomotion comes from a tug boat attached to the side, which is handy for maneuvering the ferry and changing directions. Trying to get a shot of a Boto, the Amazon Pink River Dolphin, which is revered by the local tribes and has been put into legends of coition between humans and dolphins. I passed this trucking couple yesterday and we stayed at the same gas station last night. 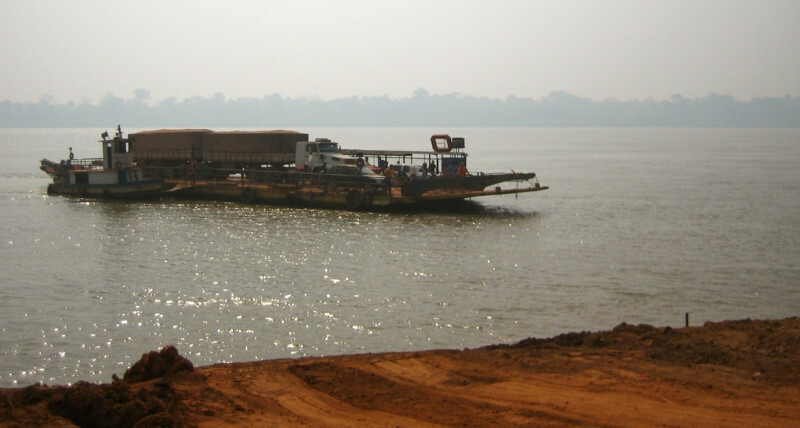 They’re from the southern state of Santa Catarina and are heading along the TransAmazonica up to Apui to pick up a load of timber. It was impressive to see his wife maneuvering the rig onto the ferry as he directed her. My clutch was not excited at the thought of all these sandy banks that lay ahead. 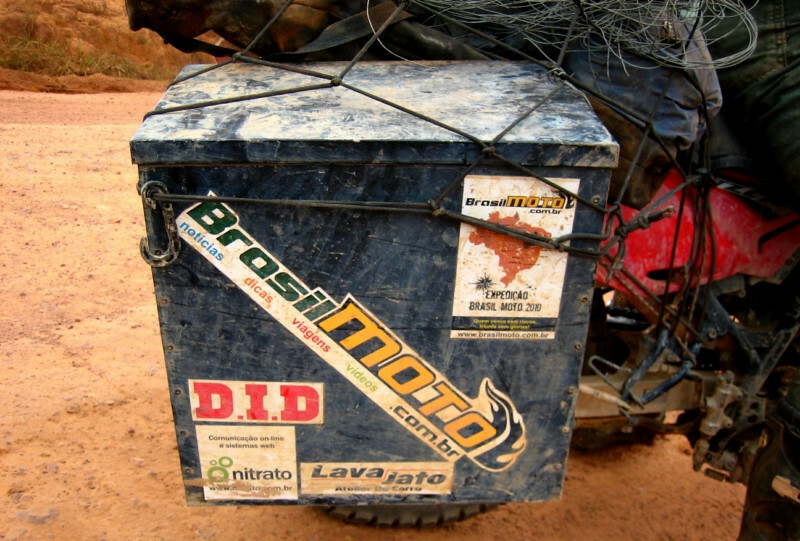 I tightened the clutch cable to get better engagement and I hoped it would last till Sao Luis. I had one more spare KLX disc if things got worse. Woo hoo! 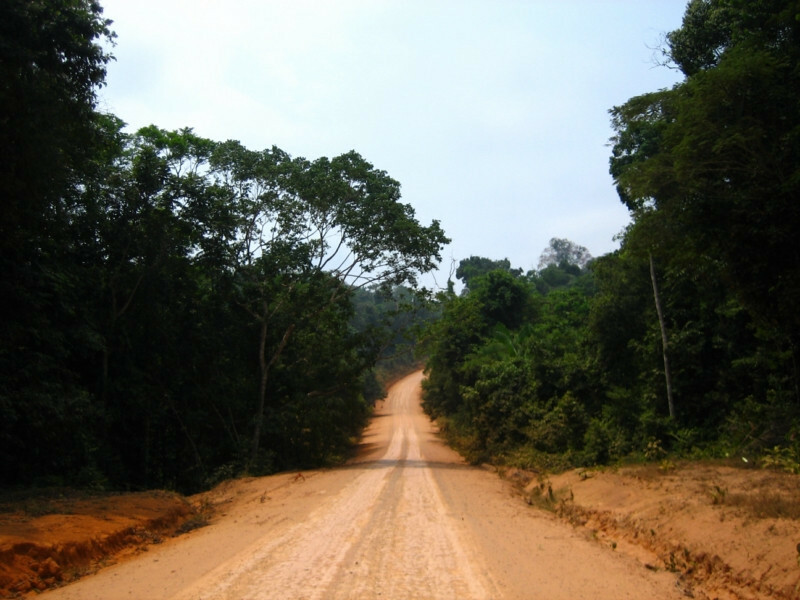 The off-road start of BR-230, the TransAmazonica Highway. 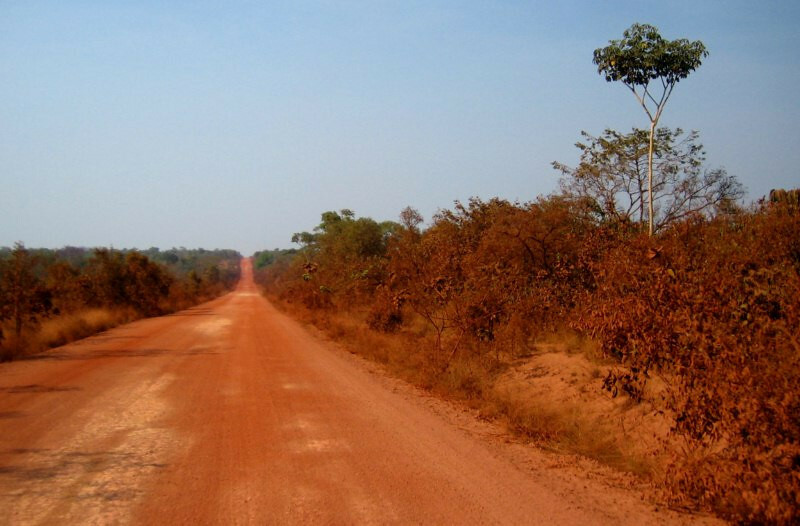 Ahead lies 2,070 kms (1,285 mi) of dirt roads to Maraba and I did about 200 kms (125 mi) a day. It was built in the 1970s when Brazil was ruled by military dictatorships who completed a series of grand construction projects. 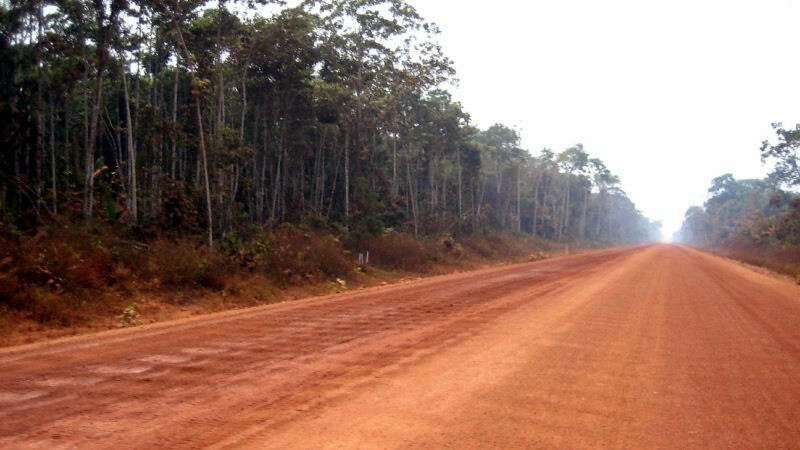 This highway was intended to link the remote northern parts with the rest of the country. 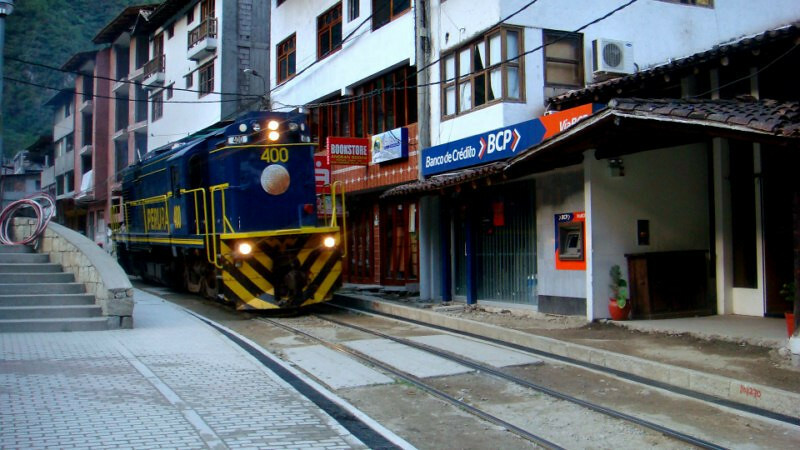 It’s initial design was to run all the way to Peru and Ecuador but that didn’t happen. 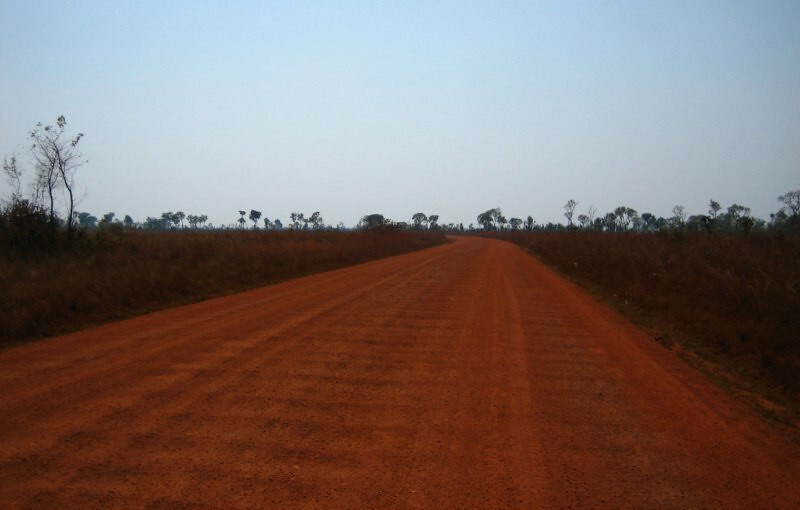 It was also originally designed to be paved all the way, but that too, thankfully, hasn’t materialized along its entire length. 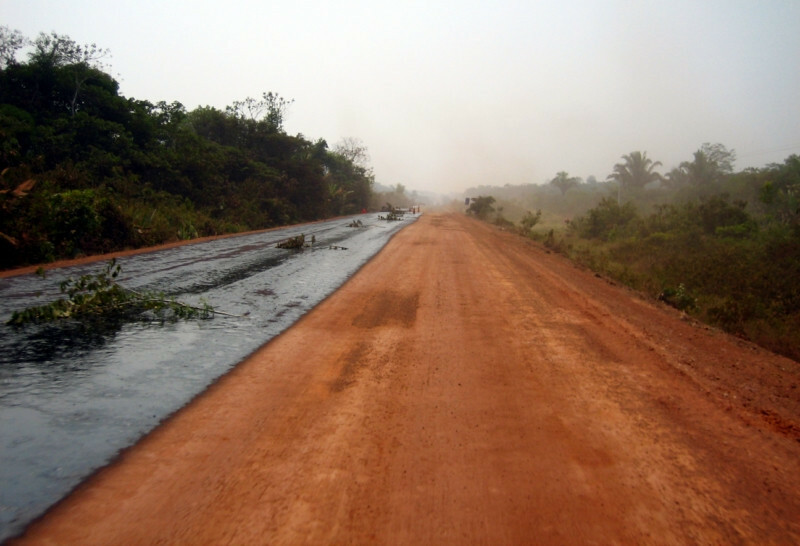 The pavement starts again once it reaches civilization in Maraba. 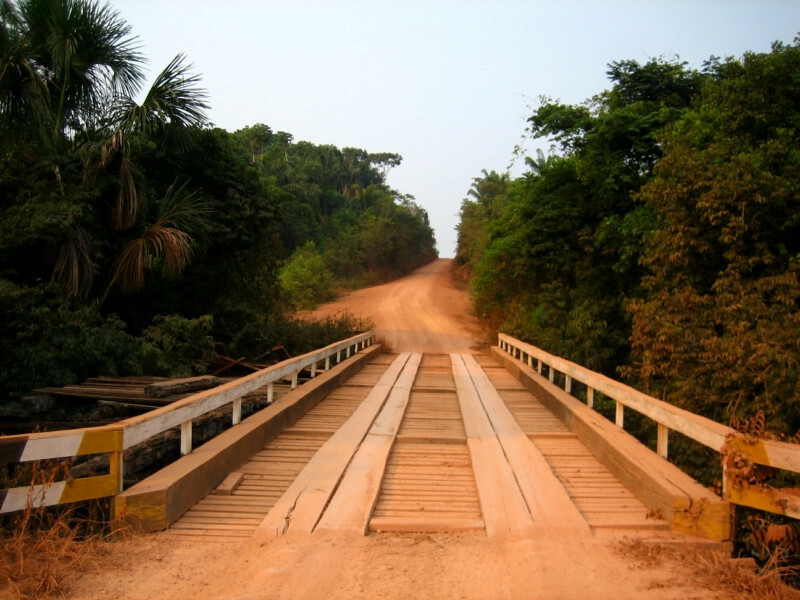 The TransAmazonica is famous for its numerous wooden bridges and I was happy to see a well-maintained one for my first crossing. 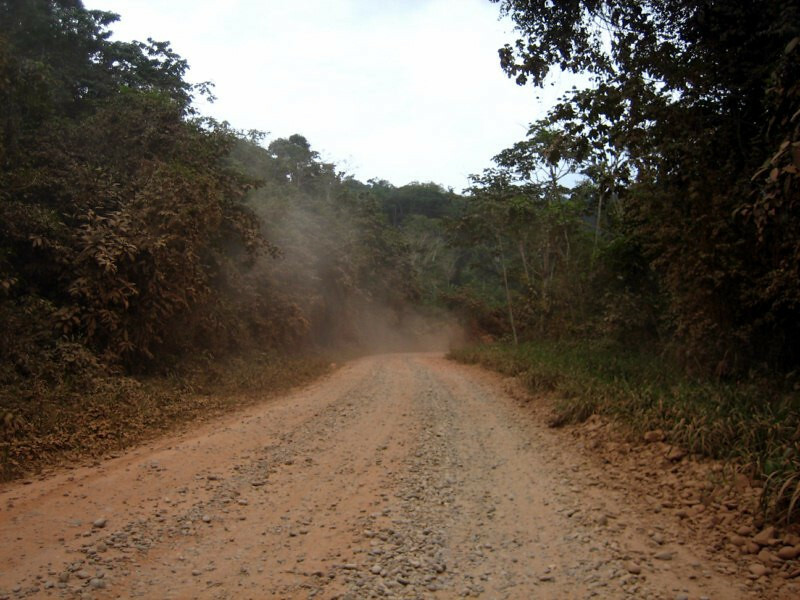 It’s advisable to traverse the TransAmazonica only during the driest months (July to September) as when it rains, the road turns to a sloppy mud halting almost all traffic in their tracks. 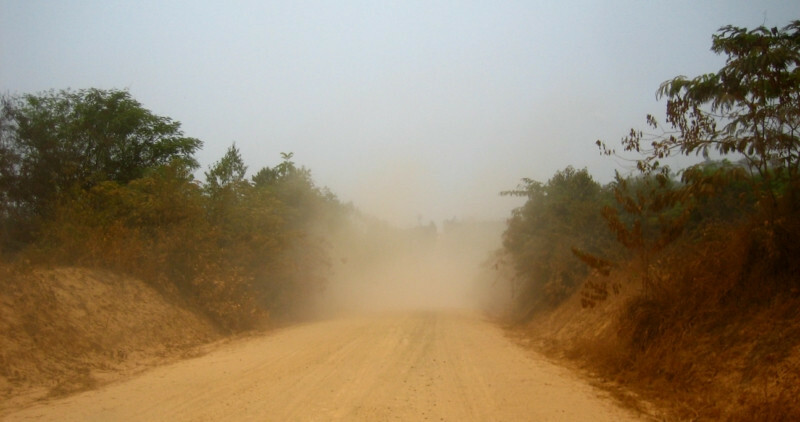 But, being here during the dry season means lots and lots of dust. 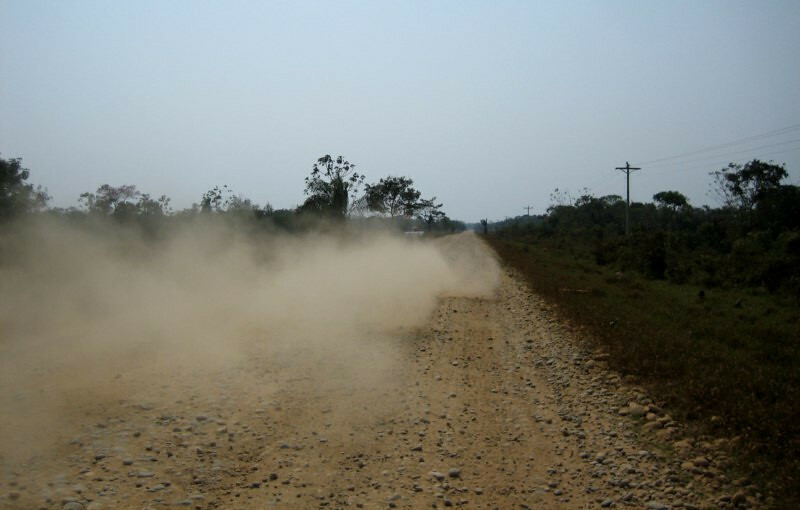 I was already accustomed to the dust by now having crossed the dry Bolivian pampas and told myself, no complaining, just take a deep breath as a dust cloud approaches and get on with it. I was happy to see my trucking friends again, but not so thrilled for their dust wake. 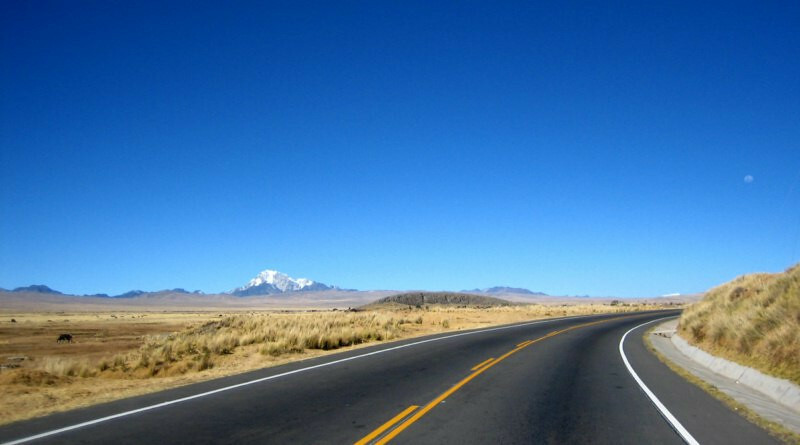 The road is generally well-maintained but there’re a lot of dips and bumps and I was moving on average as fast or slow as the big rigs. 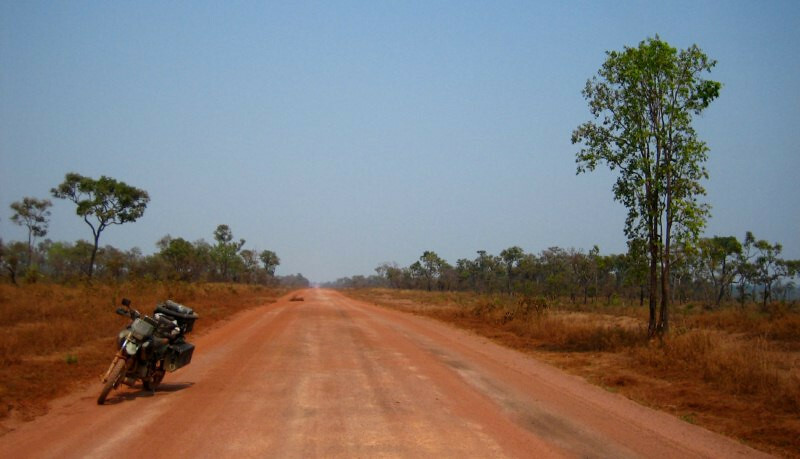 You can imagine what overtaking one of these guys must be like – try and get a glimpse of the road ahead and then ride blind trough the dust cloud, hoping there’s no oncoming traffic. It was hot and there wasn’t much shade around. Taking a break in the shadows, munching on some nuts and prunes and keeping hydrated. I only saw a handful of vehicles all day. 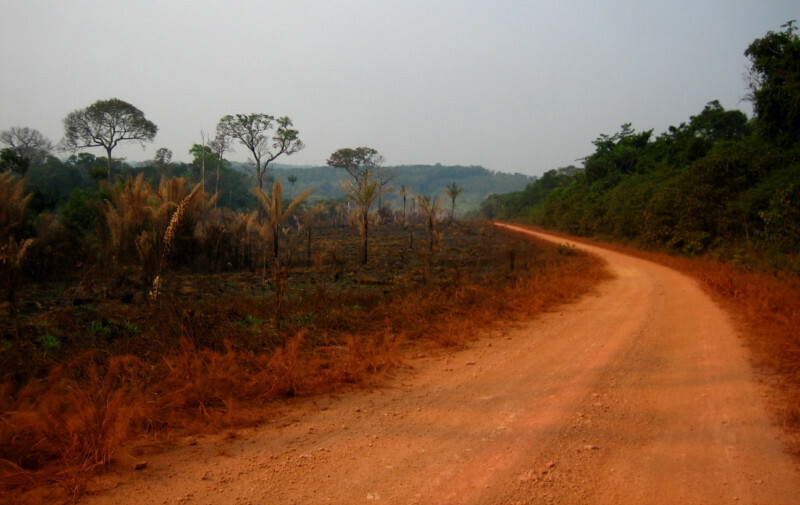 The sad reality of the TransAmazonica is that deforestation of the Amazon jungle is prevalent all along the route and the government encouraged this behavior, giving incentives for farmers and cattle ranchers to turn highly valuable intact forests into single-purpose pasture land to feed Brazil’s domestic and export beef addiction. 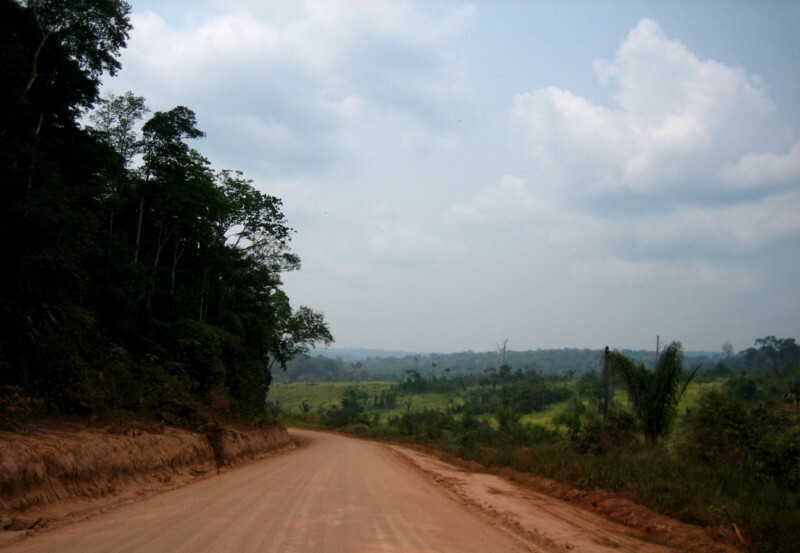 Farms (fazendas) line the TransAmazonica almost all along its entire length. 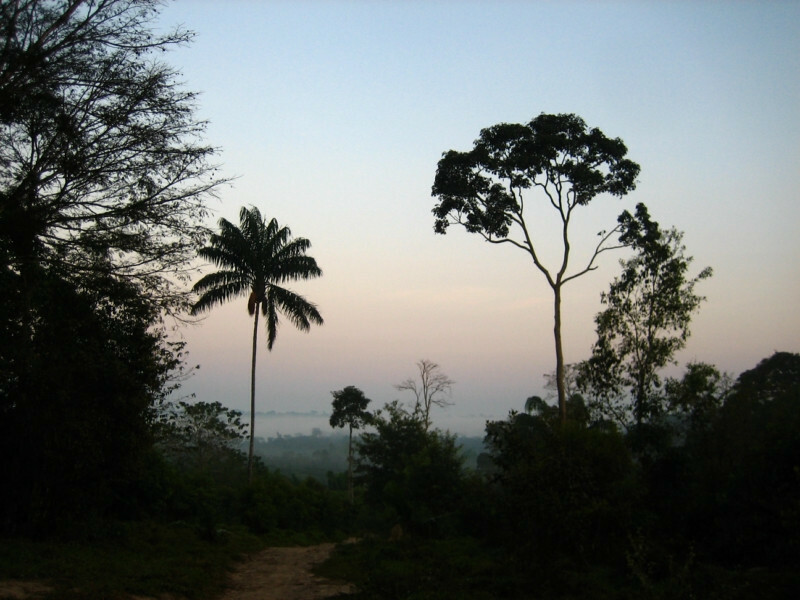 The flora in the western end is mainly shrubs with a few tall trees. I didn’t have to go far to see that the legendary bridges are still out there. Cross planks or not, I guess it’s strong enough to support a semi-truck. 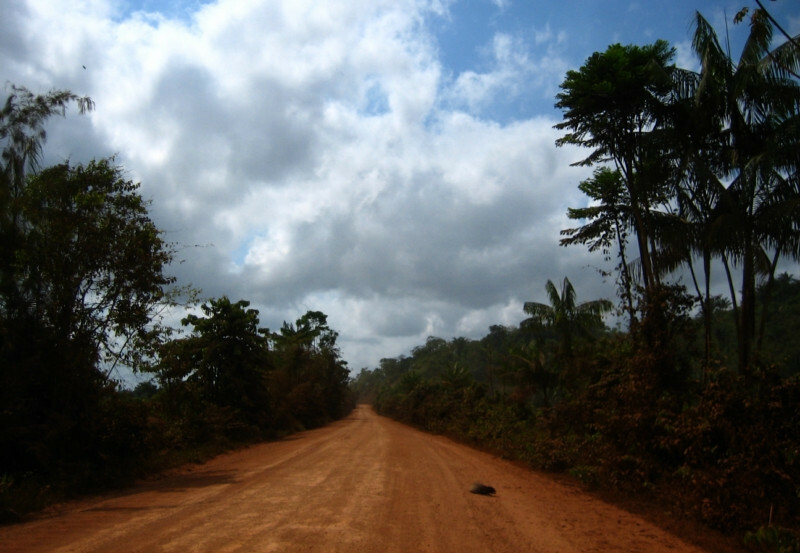 The road got sandy in places, but was generally a pleasant ride. There’s also a lot of hills through this region. 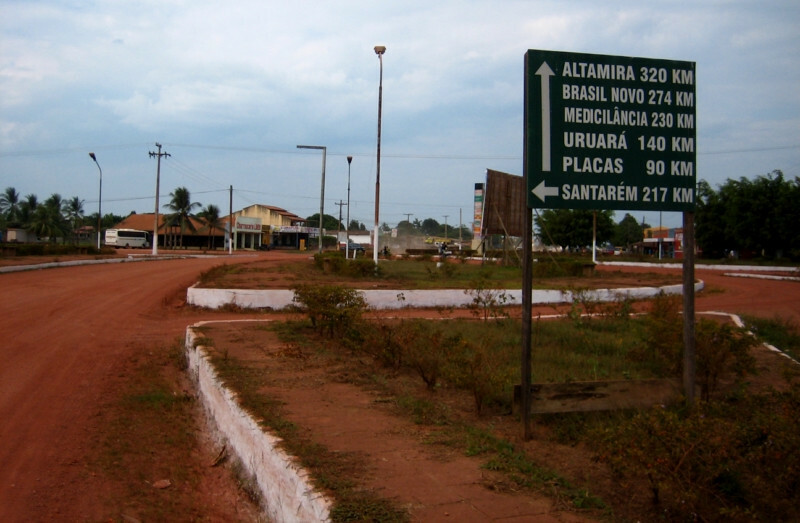 The first town since Humaita is the aptly named settlement of KM 180, being that many kilometers from Humaita. 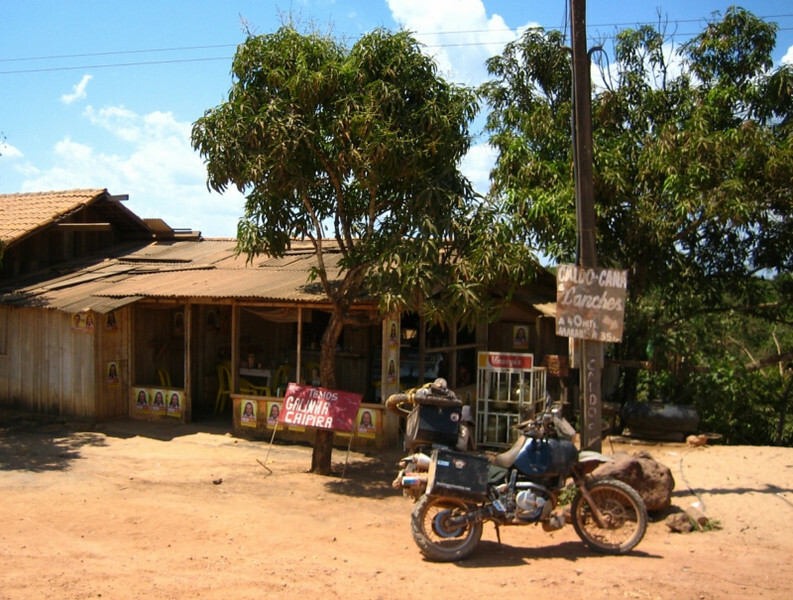 There were hotels, restaurants and petrol stations and most of the travelers stopped here for the night. 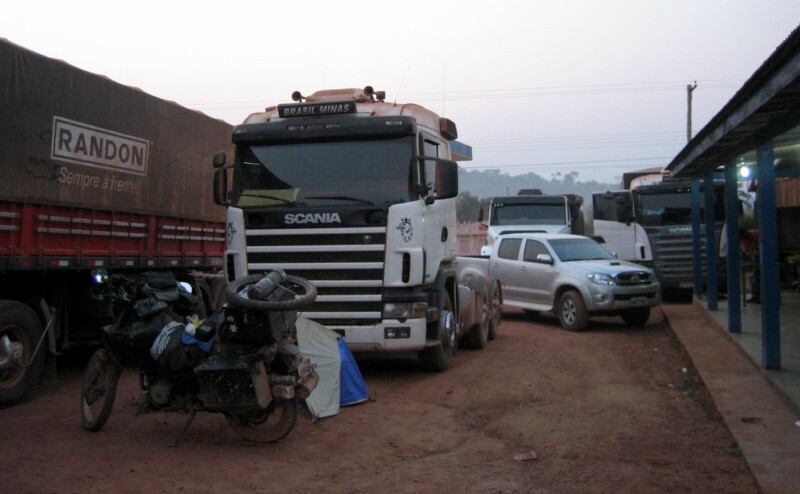 I camped at this petrol station and the truckers directed me to setup camp between their trucks, which was good since it hid my site from the road. Once again, there were free showers, cold drinking water, laundry facilities (washing sink with soap and clothesline) and a stove for use. I washed my base layers and socks every night and it was amazing to see how much dust was collected in them and hence on my body, as well. I love my Motoport suit since it’s all mesh (sturdy kevlar fibers) and keeps me ventilated and protected in hot weather, but the downside is that fine dust particles also get through. I’ll take that if it means those dust particles come along with some cooling air for my epidermis. 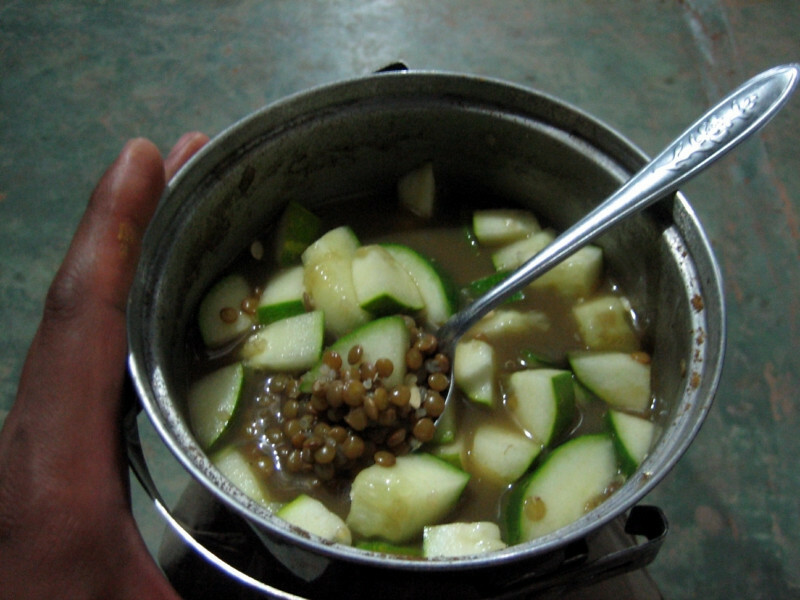 I made some lentils with a cucumber that I was carrying since Rurrenabaque in Bolivia. 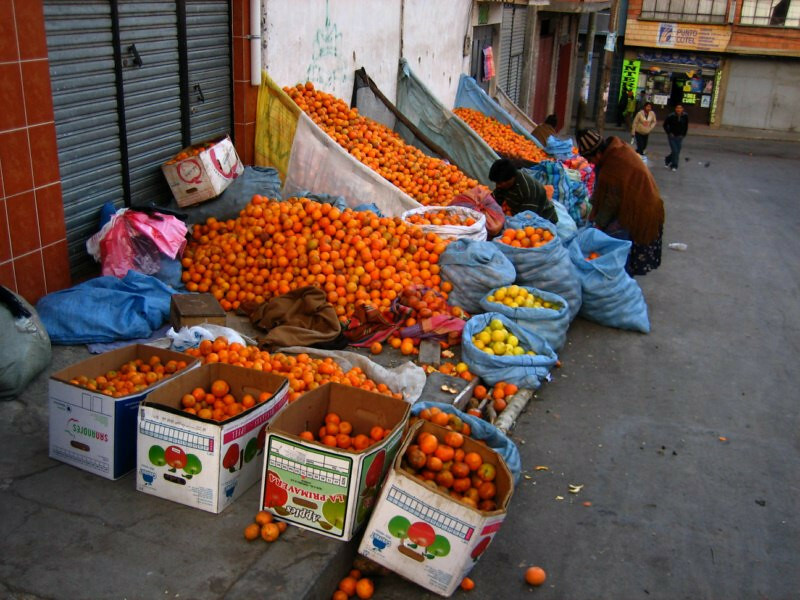 Oooh, I smuggled a vegetable across an international border (it’s a big no-no to transport possible disease-carrying produce across borders). The cucumber was refreshing and hydrating. A simple meal of lean proteins with fibrous carbohydrates. What more does the body need? (A range of vitamins and minerals, for sure.) The truckers got a kick out of seeing what this strange biker was having for dinner. 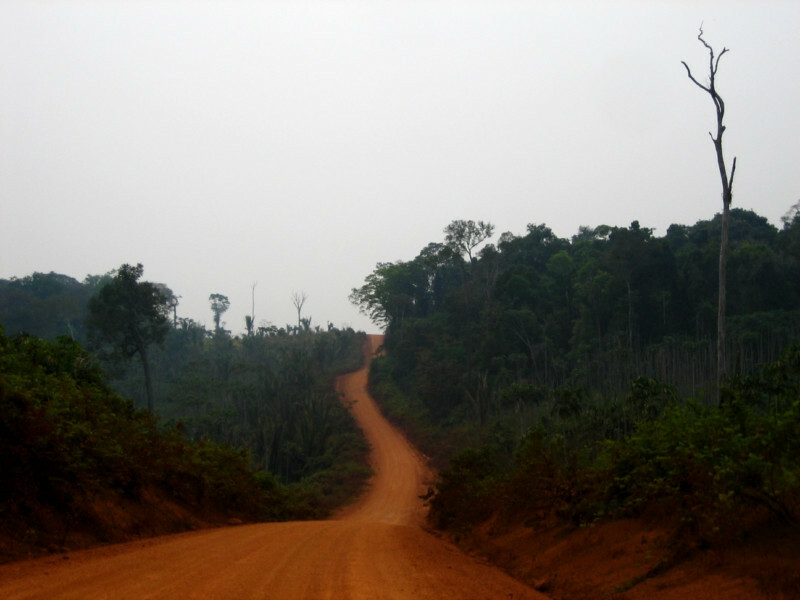 After a good night’s sleep of over 10 hours and guzzling lots of cold water, I headed out towards Apui. 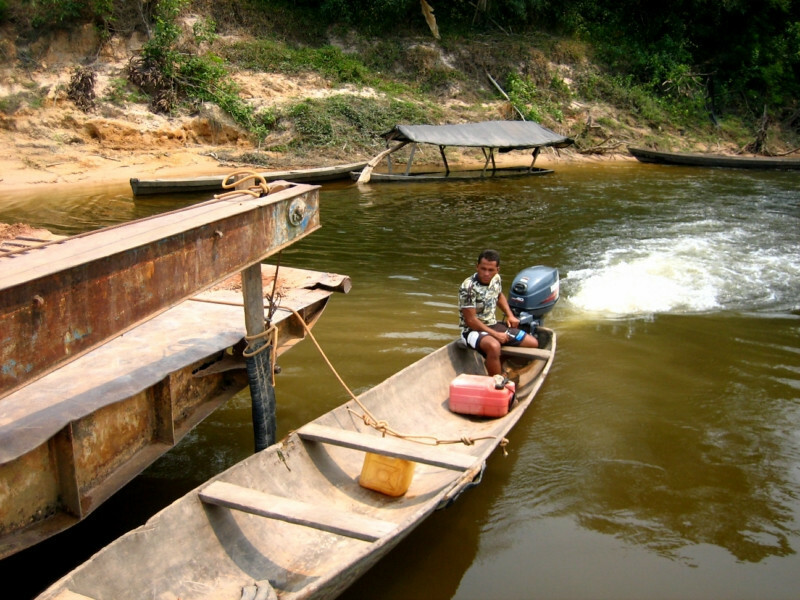 Transporting logs down a river. 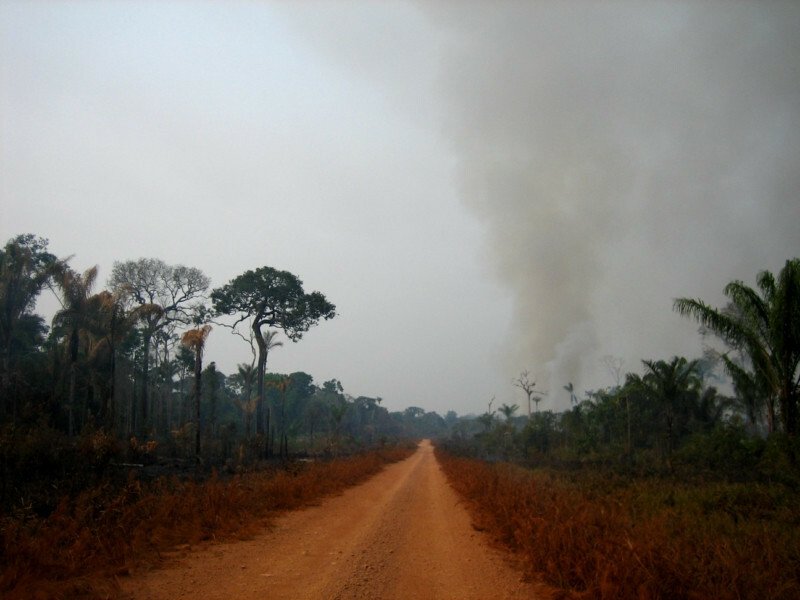 More smoke from the ongoing burning of the Amazon. 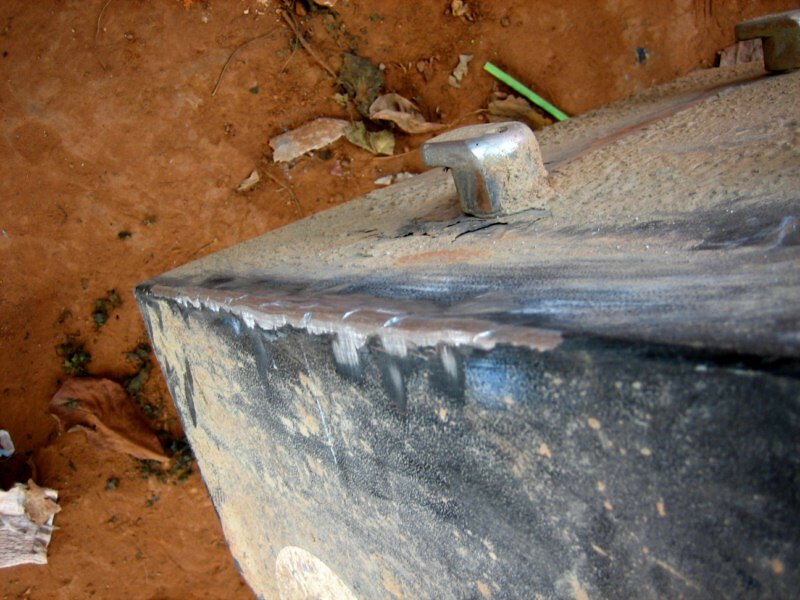 The gateway to the fazenda might point to who could be responsible for this. 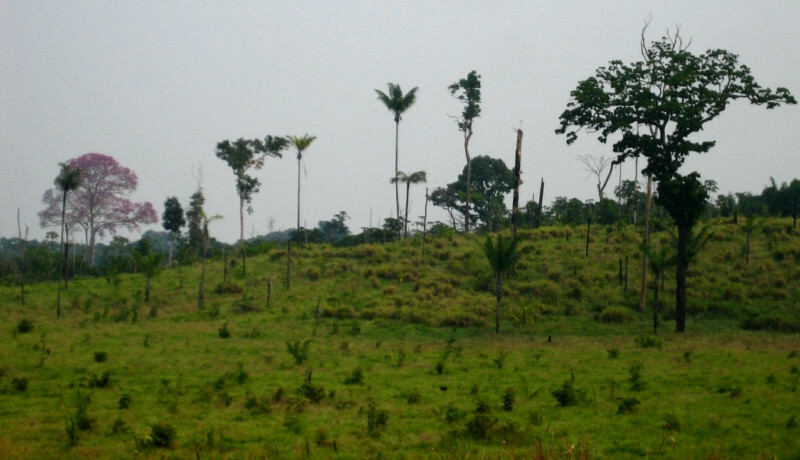 But truth be told, all of us who consume beef share some responsibility for the destruction of the Amazon and other forests. Our actions on the dinner plate are not isolated but interconnected on a vast scale. 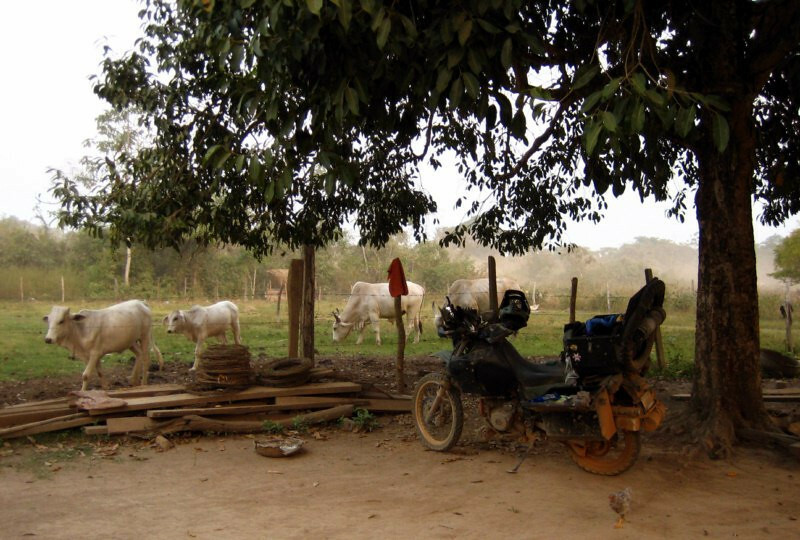 You know I love a rare steak, but is it a justified craving when people around the world aspire to consume more beef as they progress up the development ladder? 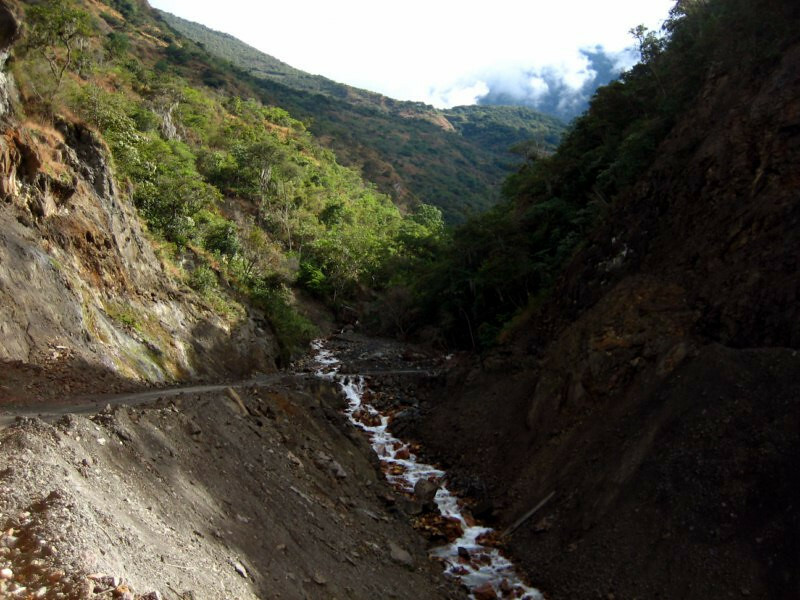 Every now and then the route passed an opening in the foliage to reveal a pond, providing a refreshing view of agua – a respite from the dusty road. 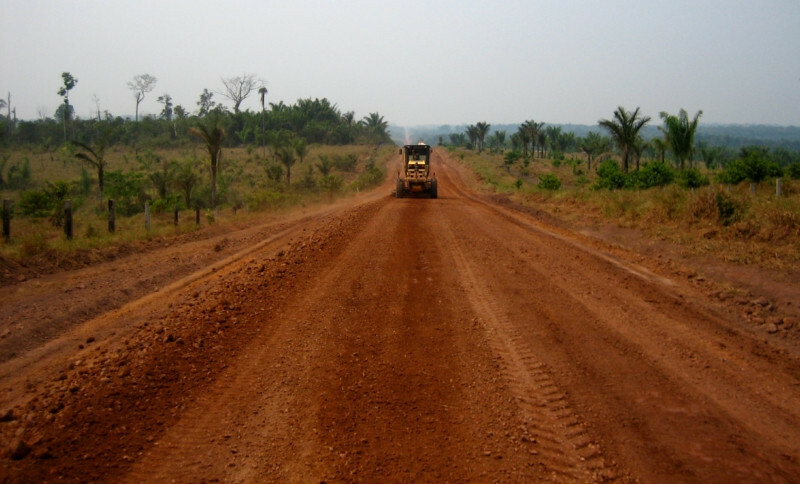 The road surface varied from hard-packed mud like this to loose gravel and sand, but mostly it was well-maintained. 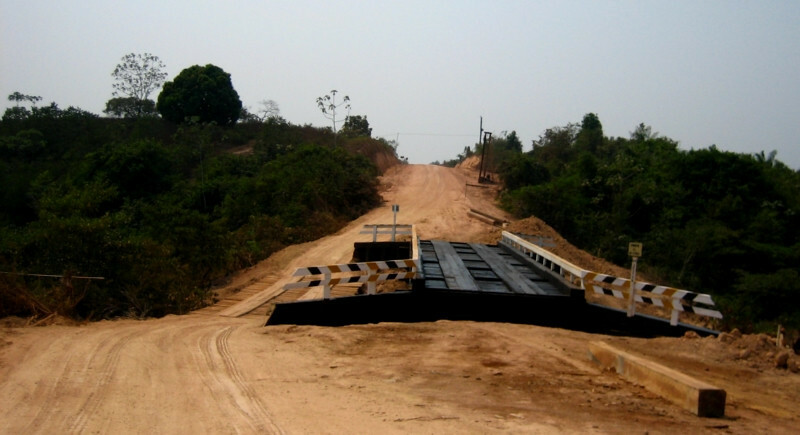 Constructing a new bridge, with the old one not having any guard rails, so don’t fall over. I rolled up to this ferry just as it was about to leave. 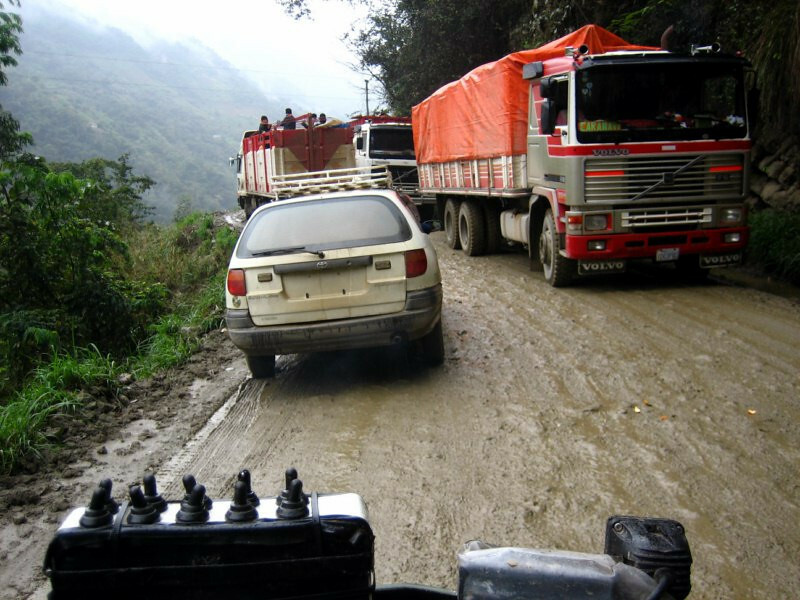 As you can see, the only other traffic on this road was supply trucks of fuel and other products. Fuel was available about every 200 kms (125 mi), except one section further ahead where a 400 km (248 mi) range is needed. 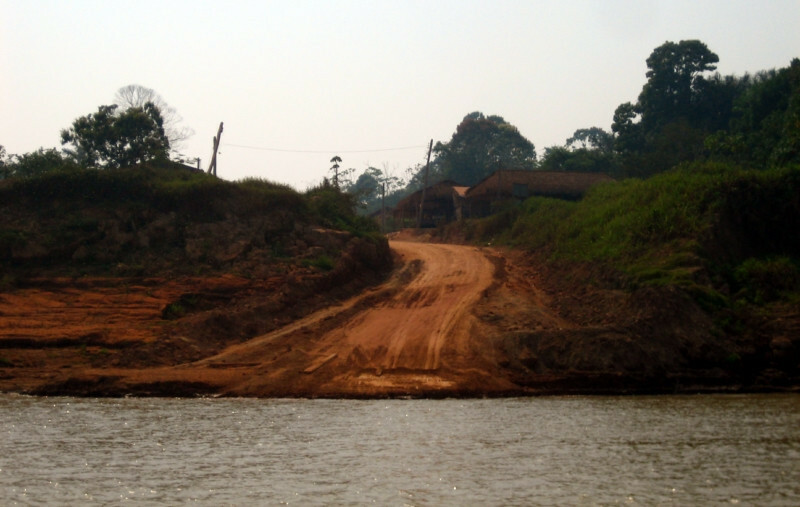 Crossing Rio Aripuana, a tributary flowing into the Rio Madeira and onto Rio Amazonas. 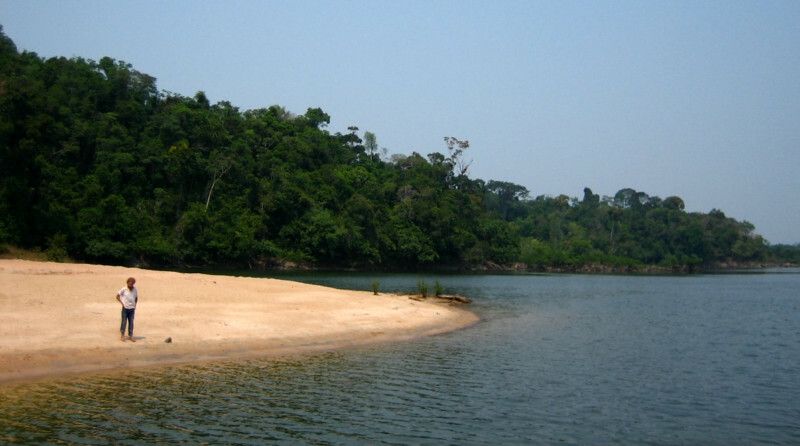 An inviting beach on the shores of Rio Aripuana. Looking across a wide valley with the original forest kept intact at the top of the relief. 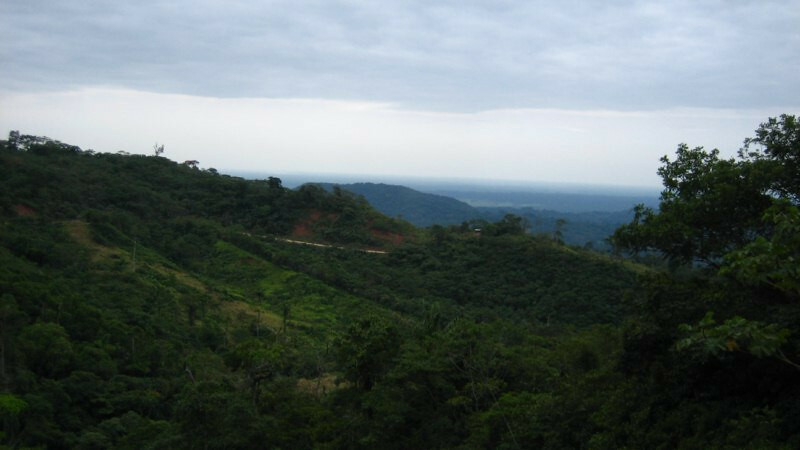 This same method of conservation was used in many places, where it appears the government has allowed the forest to be cleared up to a certain point on hills and preserved a small area on the top for the fauna and flora. While the intention to conserve like this might be a good compromise, habitat isolation and islandization perpetuate the reduction of biodiversity. 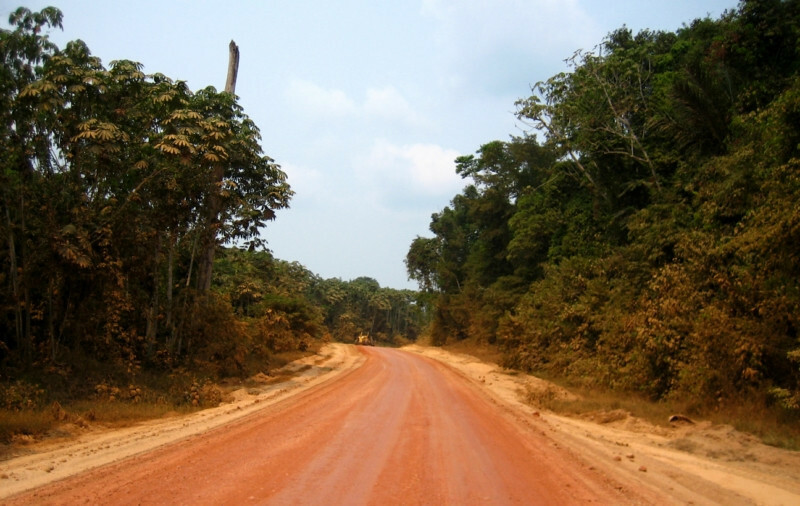 However, it’s encouraging that governments around the world are now recognizing the need to connect all these isolated preserves to create a corridor and networks for the animals to move through and keep a healthy ecosystem intact upon which we all depend on. 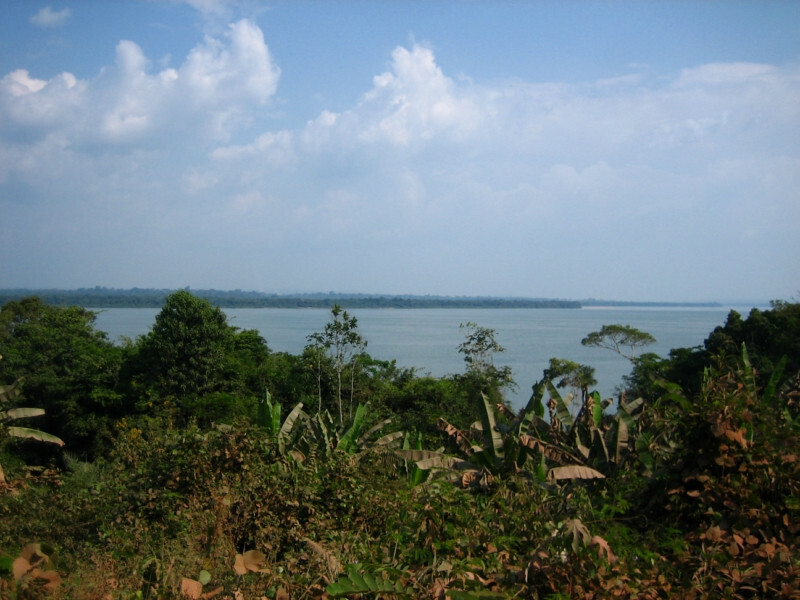 The TransAmazonica following the contours of the land. It was starting to get more hilly and predictably, at the trough would be a bridge with sandy sections on either side. 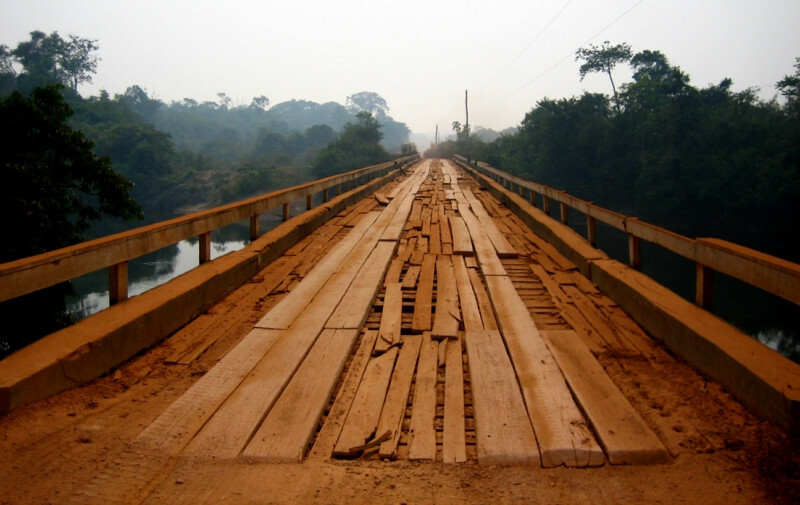 I slowed to a stop for every bridge because there was usually a pot hole or depression leading to the wooden planks, probably from the truck tires. 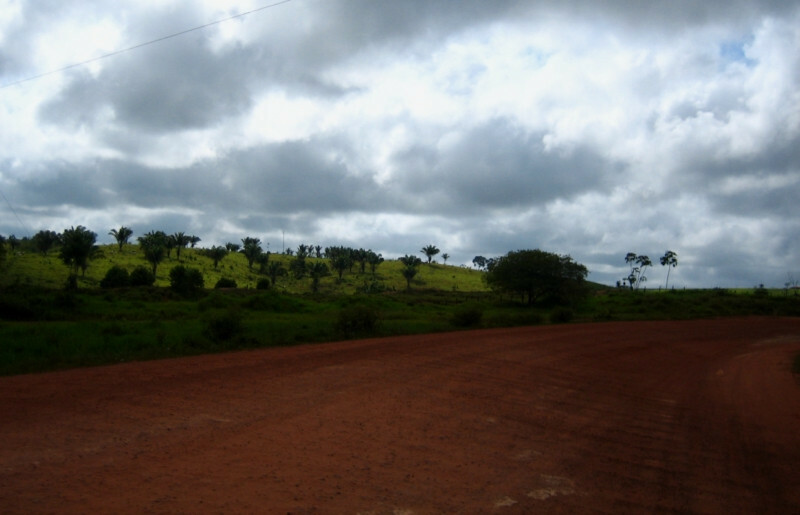 Reaching Apui, the biggest town between Humaita and Itaituba. 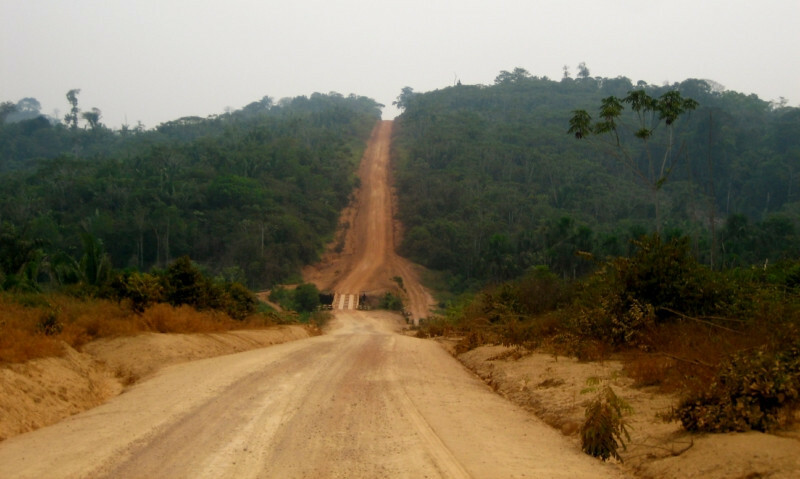 I had covered 400 kms (248 mi) from Humaita and was told by locals that the next 700 kms (435 mi) to Itaituba was the toughest section of the route and most isolated, with trucks going no further. Feeling good about the riding so far, I was looking forward to it. 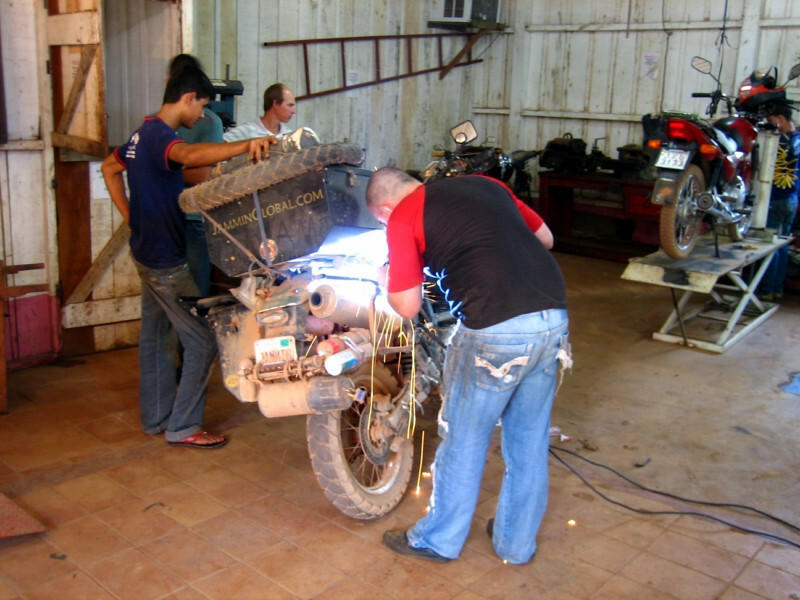 The weld job in Bolivia of my pannier frame wasn’t holding up, so I got it retouched at this Honda shop for R$ 5. 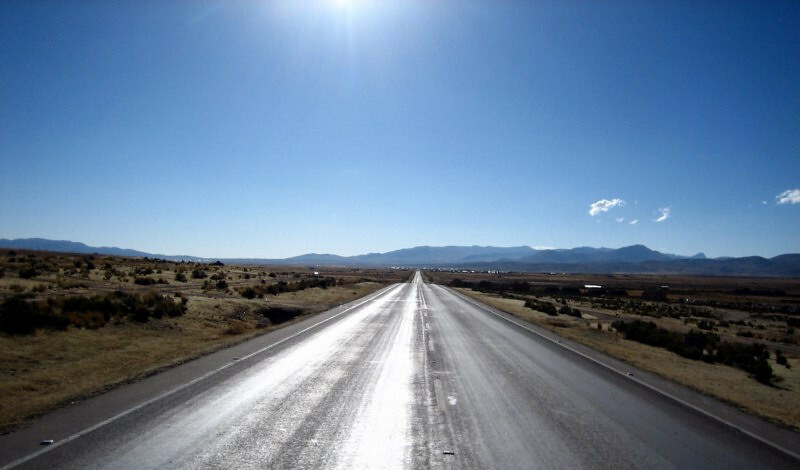 After stocking up on some groceries (oatmeal, pasta and tomato sauce) and posting some updates to the outside world, I hit the road. 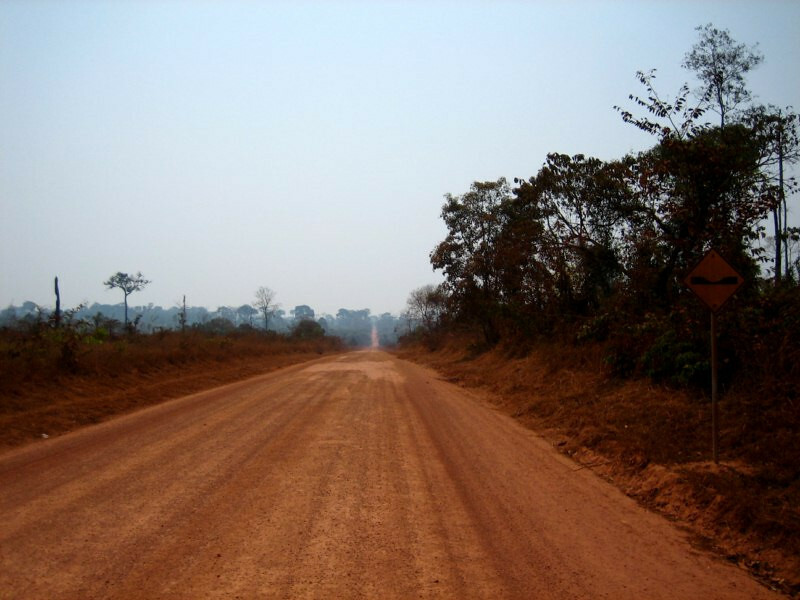 While the asphalt might’ve been a relief for a while, I was looking forward to the dirt since I was running less air pressure in my tires for the off-road conditions, which would be heating up the rubber and wearing faster on the pavement. 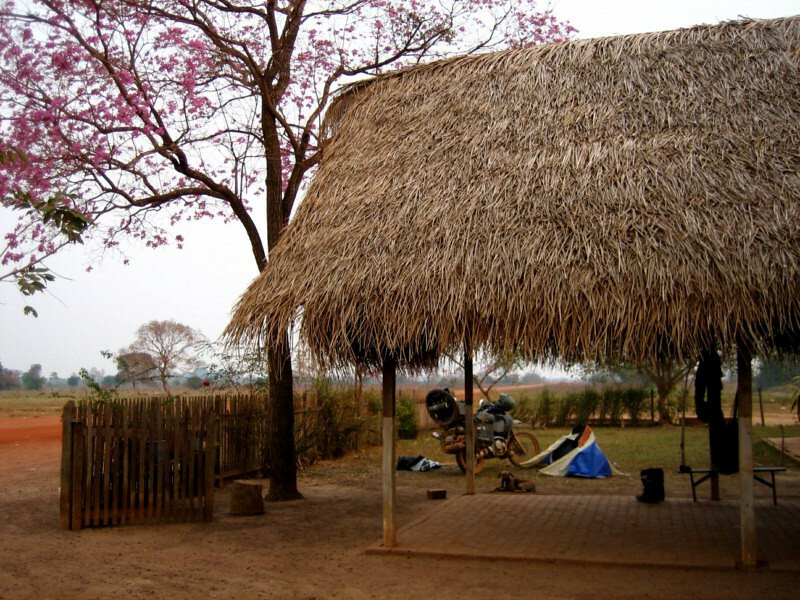 After an hour’s ride, I came across this fazenda and asked the rancher sitting out front if I could camp here for the night. I practiced the phrase a couple times from my Lonely Planet phrasebook and was pleased to be communicating in Portuguese soon after entering Brazil. The rancher’s house is on the left and I camped next to the work shed. 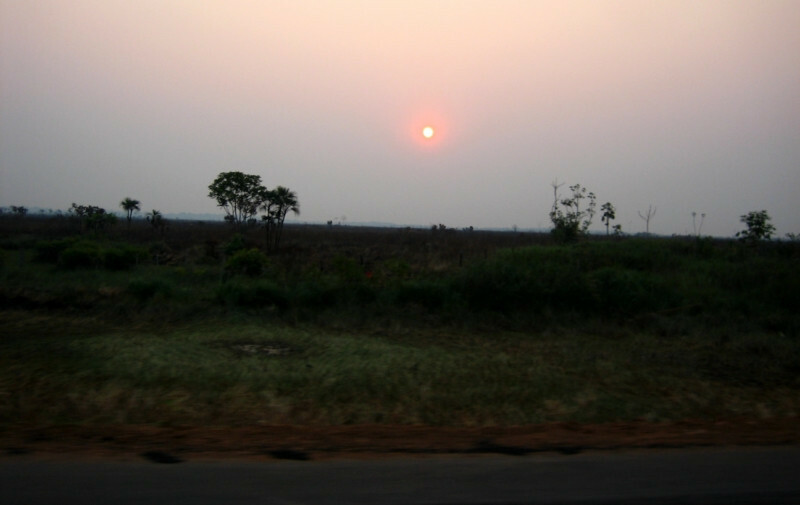 After a refreshing cold shower, I enjoyed the sunset while walking around the fazenda. It’s primarily a cattle ranch. Plus he’s also breeding mules. 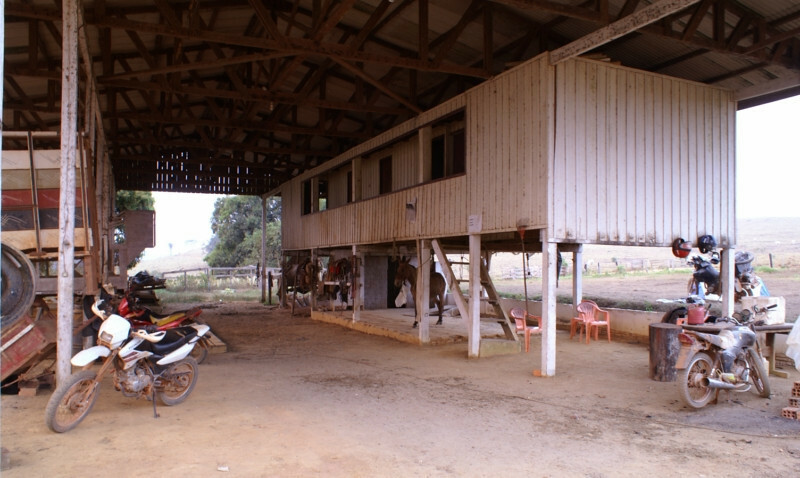 The work shed where the mules got their shoes put on. 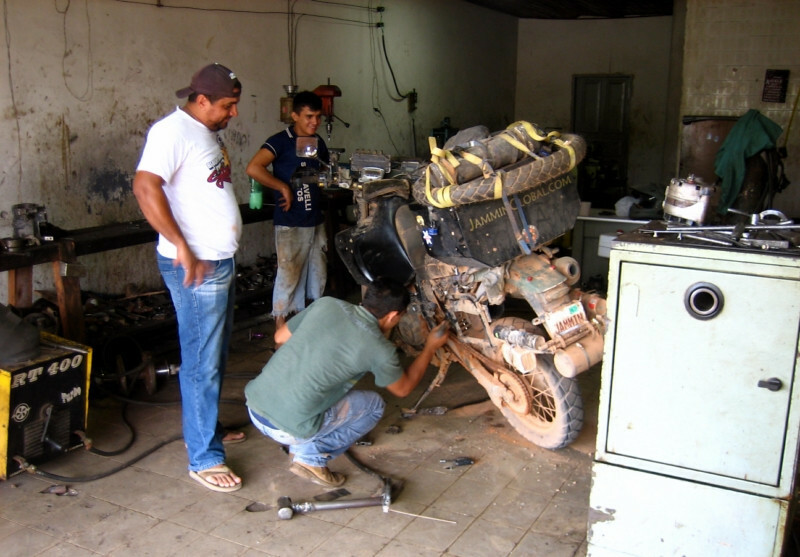 Those bikes are 250 cc Honda Tornadoes, made in Brazil and popular all over South America. 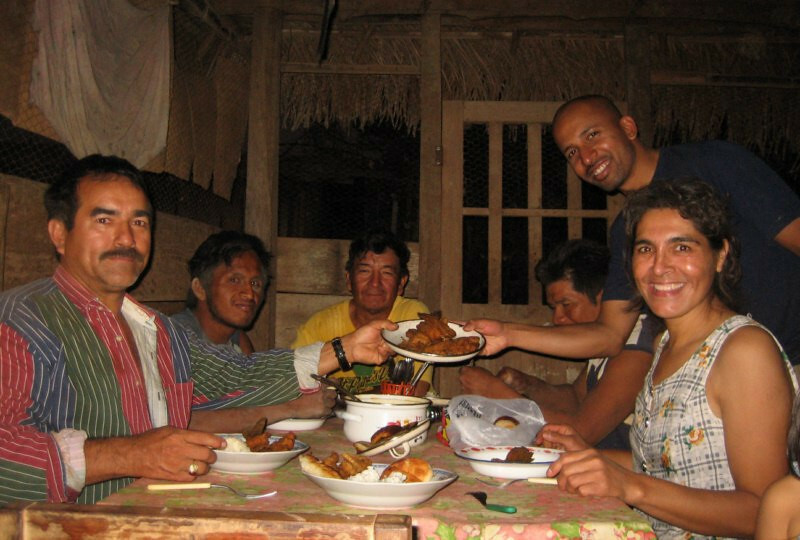 Rancher Jose and his wife inviting me to share dinner with them and his farmhands. There was rice, beans, veggies, some beef and a salad. He was intrigued with India and had lots of questions about the culture and the politics and it was interesting to hear his story. The government gave him an incentive to move out here 10 years ago to create pastureland for cattle and he had a successful operation going. 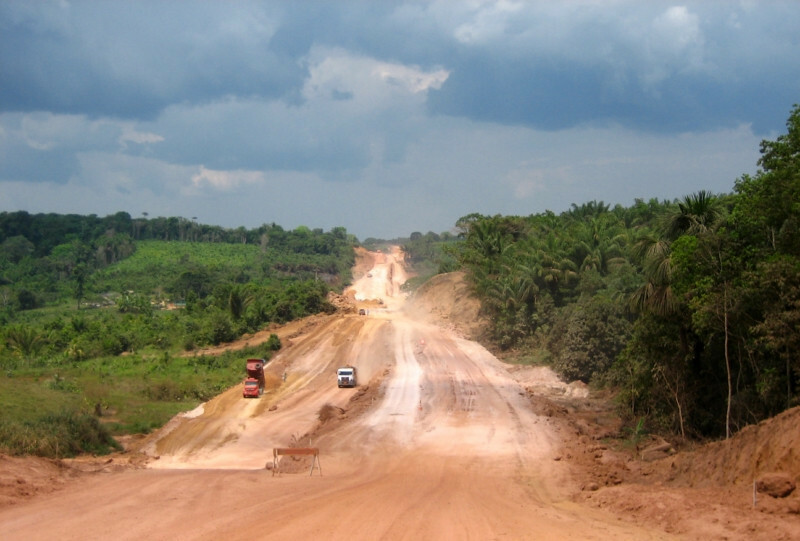 But now the government, feeling pressures from the international community to preserve more of the Amazon, is starting to hamper his business. Elections for the new Brazilian president were coming up in six weeks and campaigning was in full force throughout the country. I tried to get a feel for the issues but only managed to grasp the gist of his talk. He thanked me for stopping by his house since he never met an Indian before and wanted to know more since our two countries are forming a strong bond in the international arena. 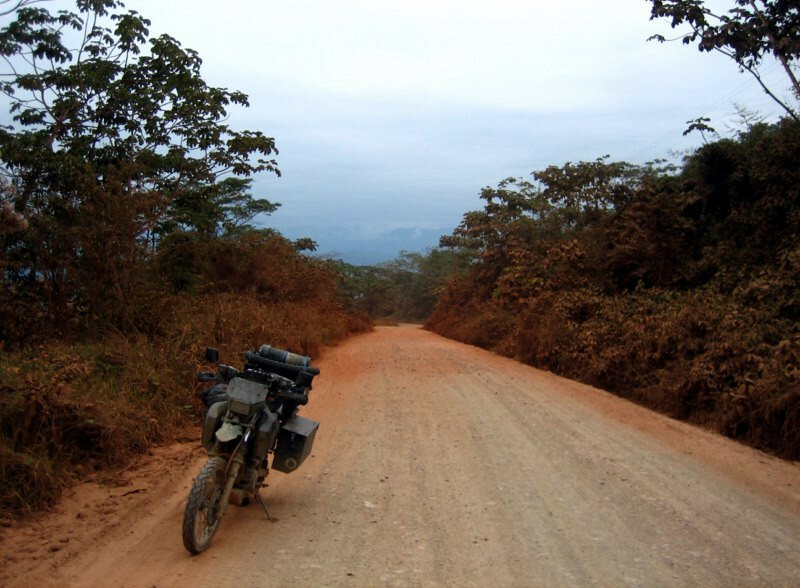 After being stuck in Rurrenabaque, in northern Bolivia, for a few days waiting on petrol, the ride was on again. North to Brazil. 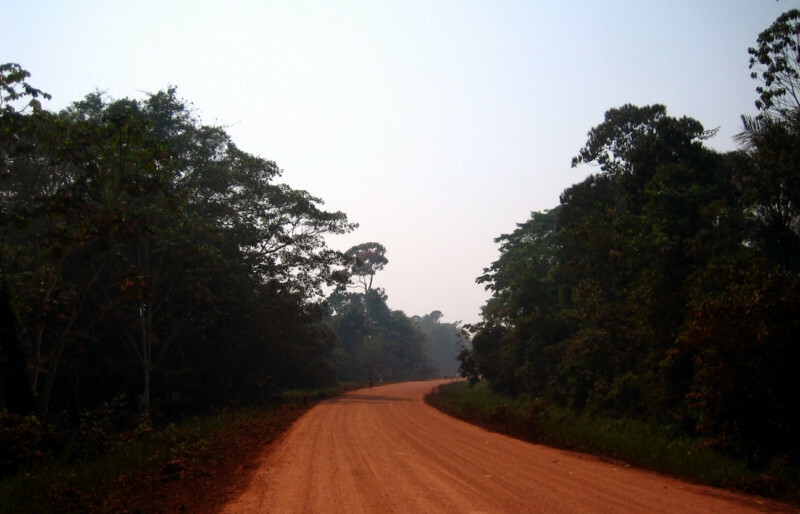 Eager to get back on the trail, I left Rurrenabaque around 3pm after getting petrol and packing up. I didn’t make it far before deciding to find a place to stay for the night. I came across this small farm and asked them if I could camp for the night. 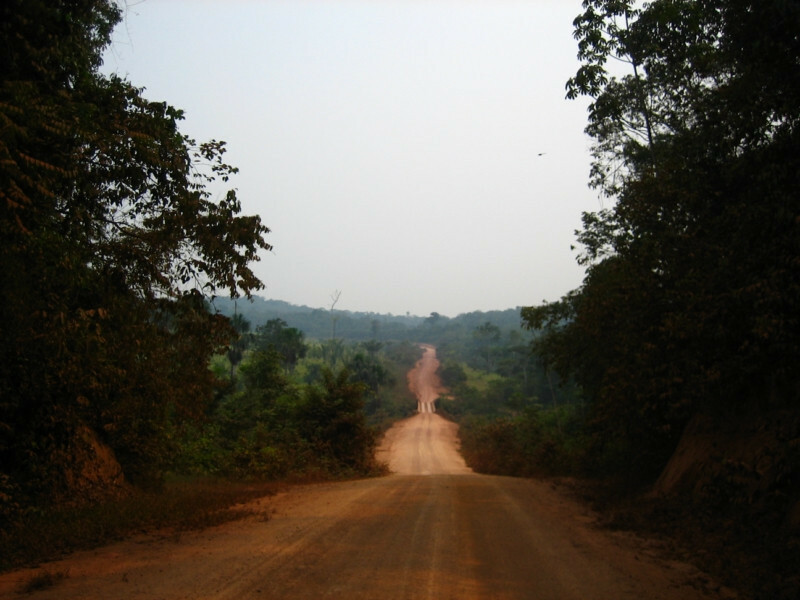 It was a good ways away from the road and the dust and it felt quite tranquil. They were herding cattle and sheep. 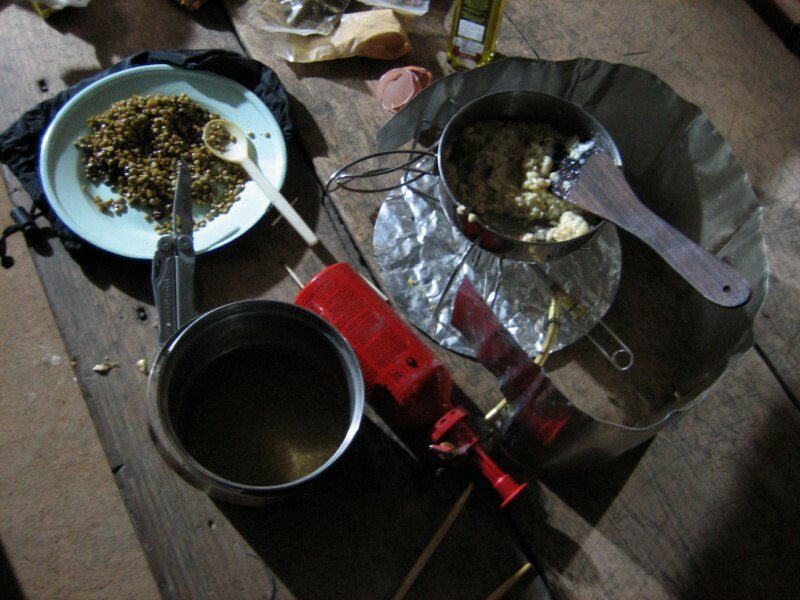 As I set about preparing dinner with my stove, they offered me a plate of food: rice with some eggs. Very generous of them. 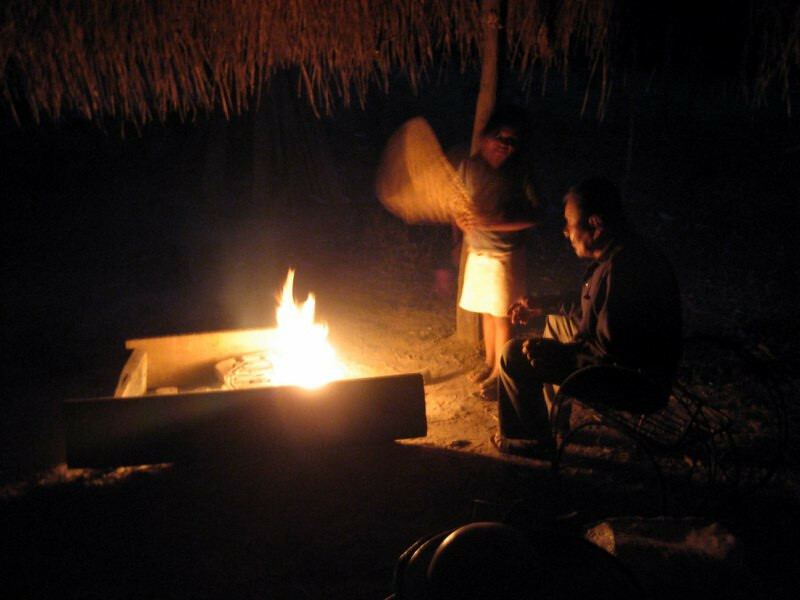 In the evening, as darkness fell, the old man sat by the fire and their young child fanned the flames. The next morning, back on the pebble-riddled sandy track. 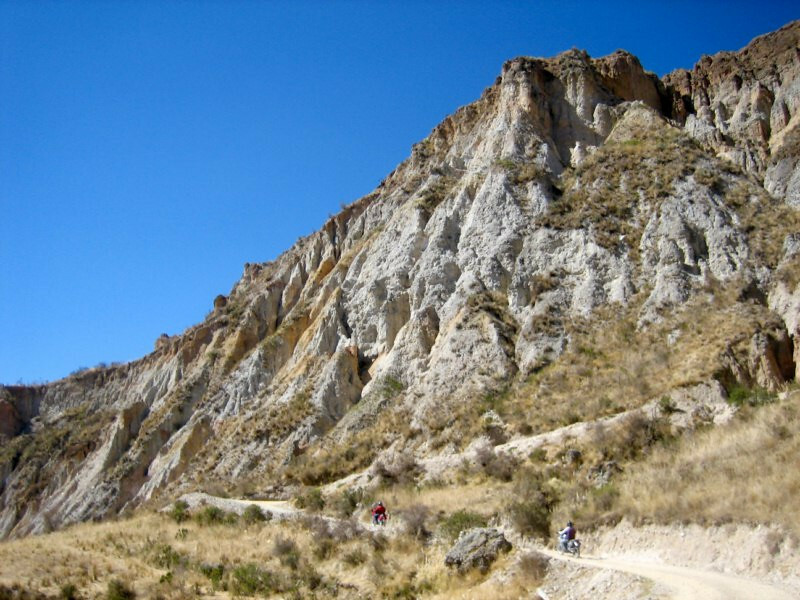 It was going to be hot and dusty for the next 550 kms to Riberalta, the next major town. 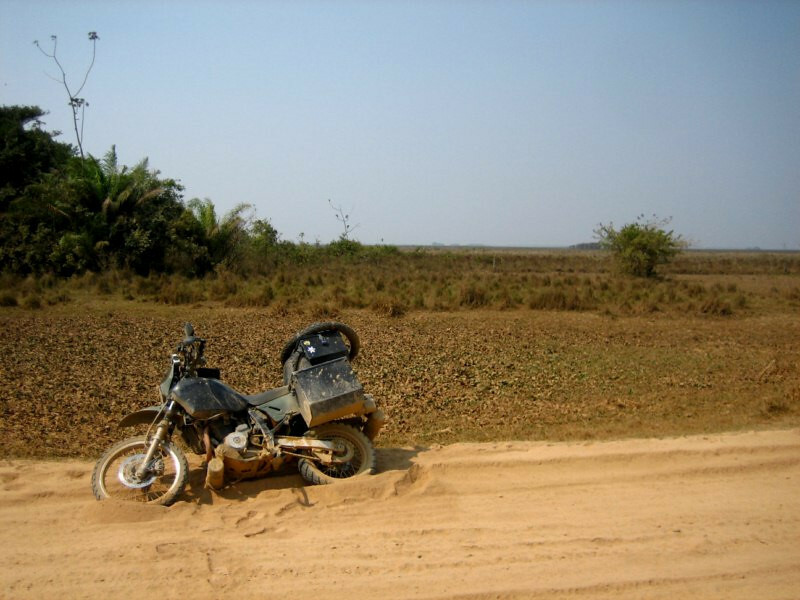 The surface was pummeled into soft sand in places and riding through wasn’t that bad actually. The only downside was oncoming traffic with trucks barreling by with a huge wake of dust in the air, causing zero visibility for a few seconds. Good thing there was a breeze blowing most of the time to clear the road of the dust clouds. 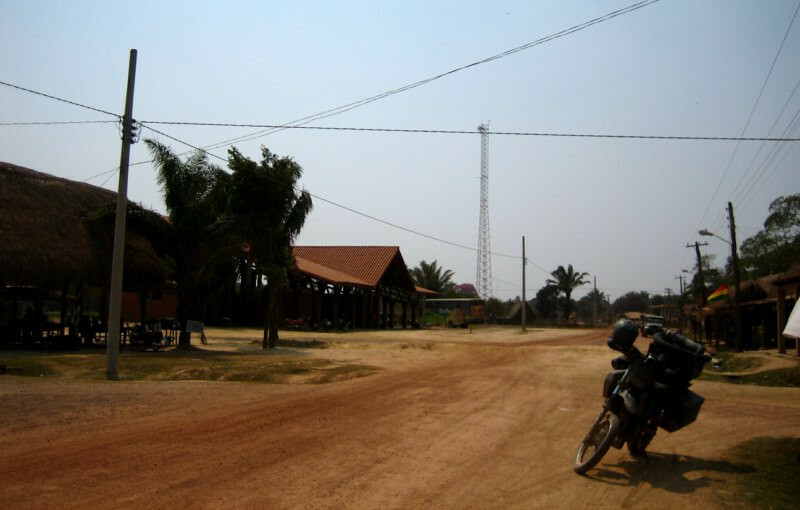 Picking up some bananas in Santa Rosa, a reasonably-sized town about 97 kms (60 mi) from Rurre. 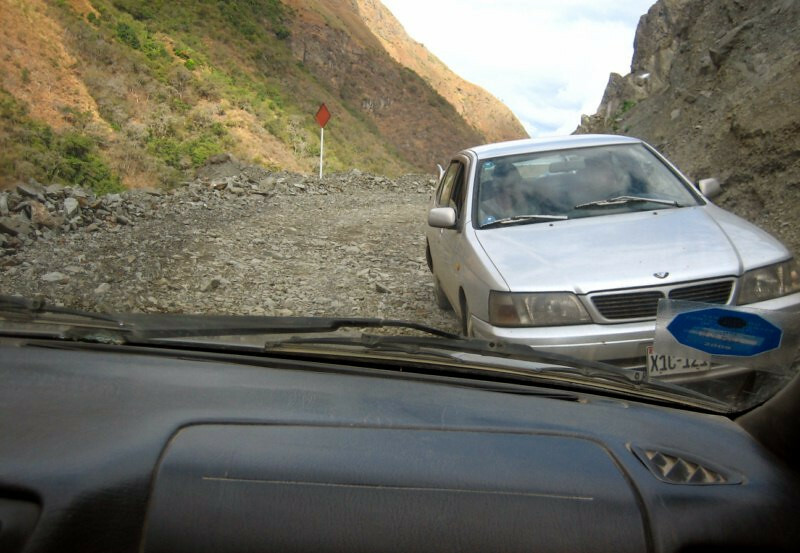 To avoid the bone-rattling rocks, I followed a path on the side of the road in some places. Oops. 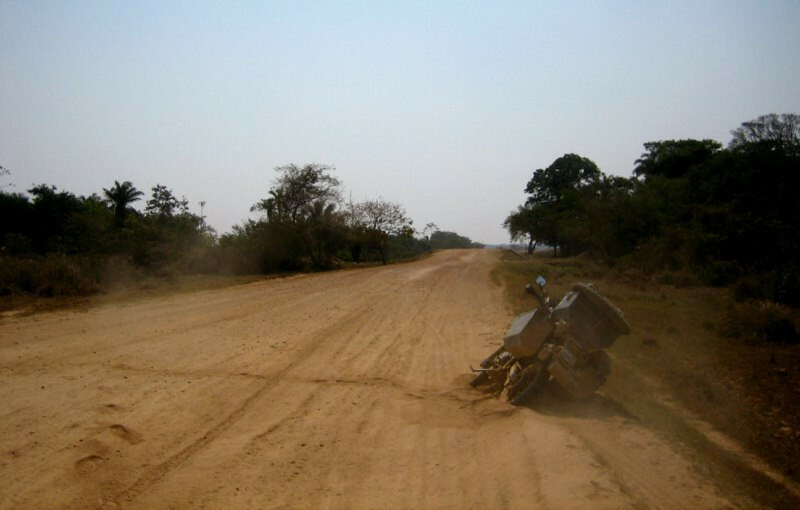 As I was coming back to the main piste from a side track, the heavy sand caught my front wheel and laid the bike down gently, with the pannier resting against the small embankment. It was quite a struggle to wake up sanDRina from her nap and the loose sand not helping. I waited about 15 minutes and a local biker came by who helped me get sanDRina right side up. 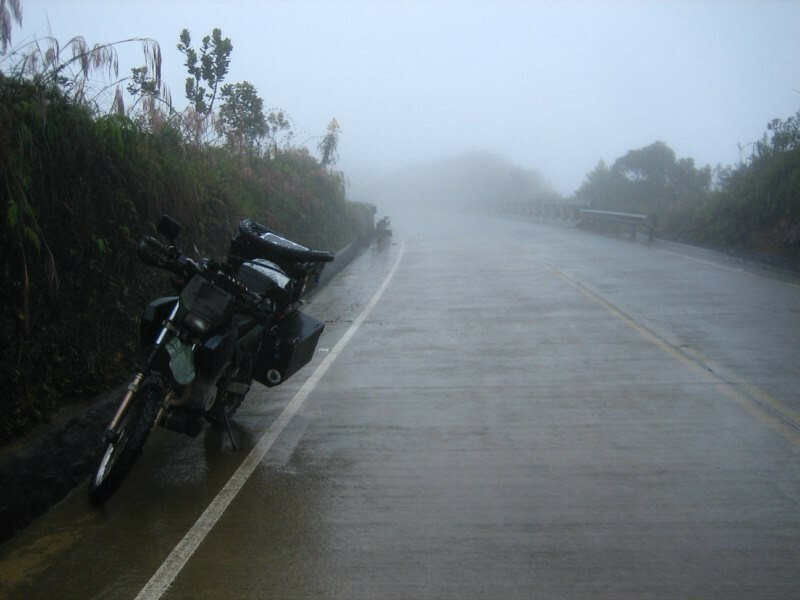 If no one would have come in 20 minutes or more, I was going to start removing the panniers and lightening the bike, but didn’t really want to do that in these conditions. Wow, now that’s a tall bird. 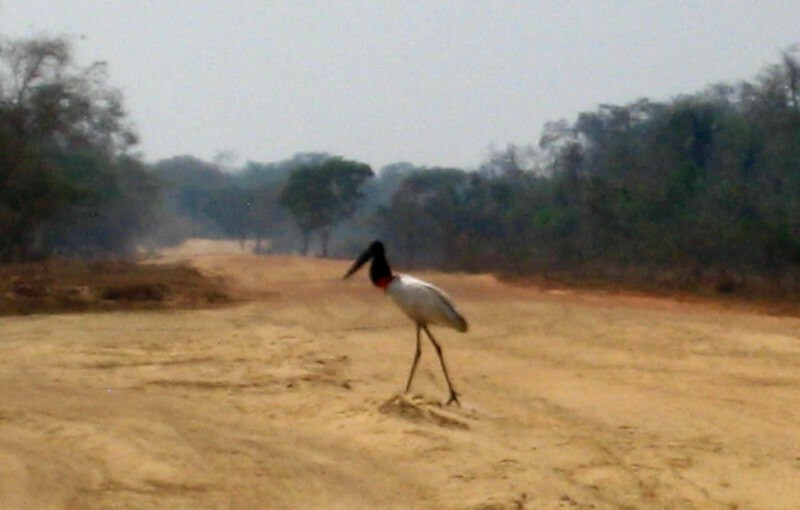 This is a Jabiru and it’s the tallest flying bird in Latin America, standing as tall as 1.5 m (5 ft). As I got near, it was an impressive sight to see this guy take flight. 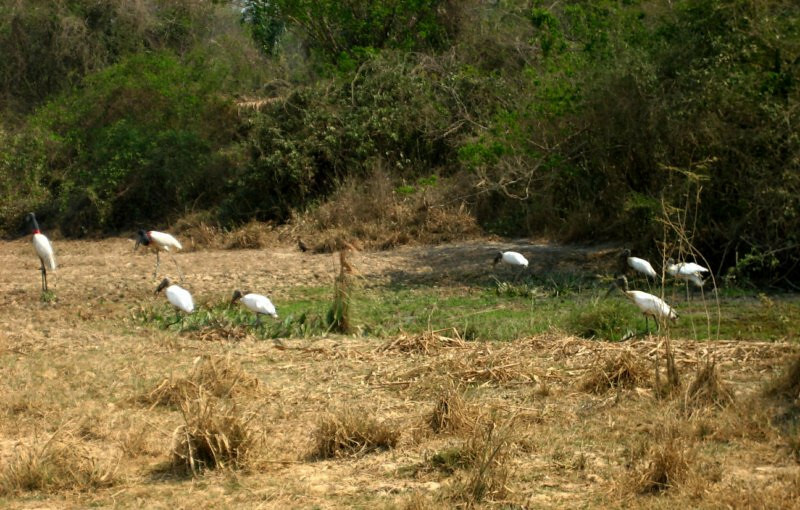 A group of jabirus around a pond in the Bolivian savanna. A welcome sight of water in this dry, hot region. The lose sand made for slow going but I was ratcheting up my sand riding experience as the day wore on. 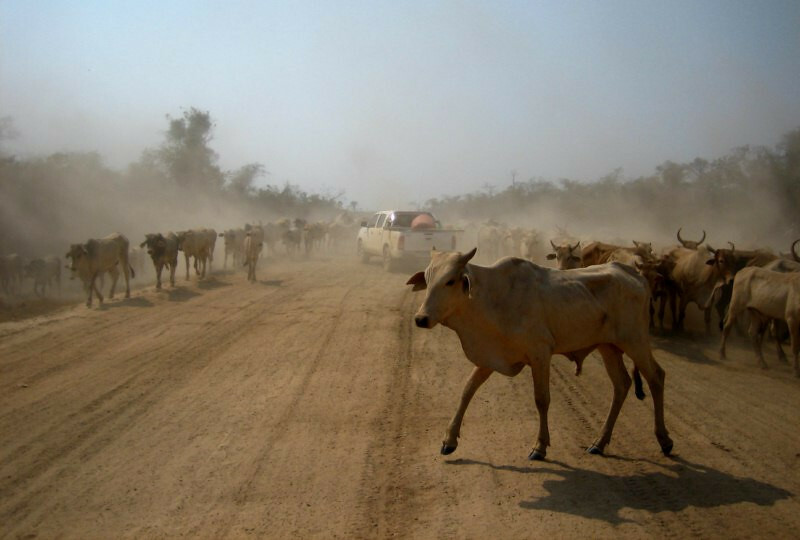 A dust cloud was moving towards me and instead of the usual truck, it was a herd of cattle. I got enveloped in them but the cowboys cleared a path for me. The road condition changed later in the day to a smoother, harder surface allowing me to taste third gear after a long time. 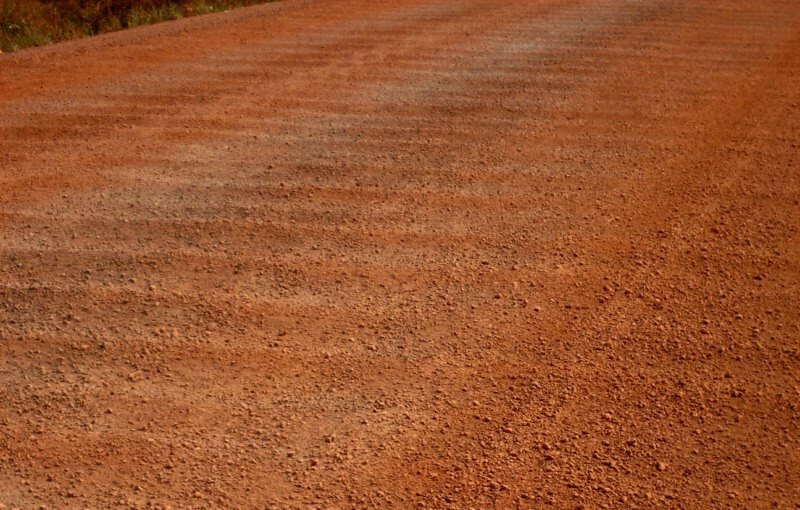 The first sign of natural bright color in a while and the harder surface quickly lead to wash board, a phenomena of undulations that form from the vibrations of heavier traffic as they speed across dirt roads. If everyone would go slower, there’d be less washboarding. 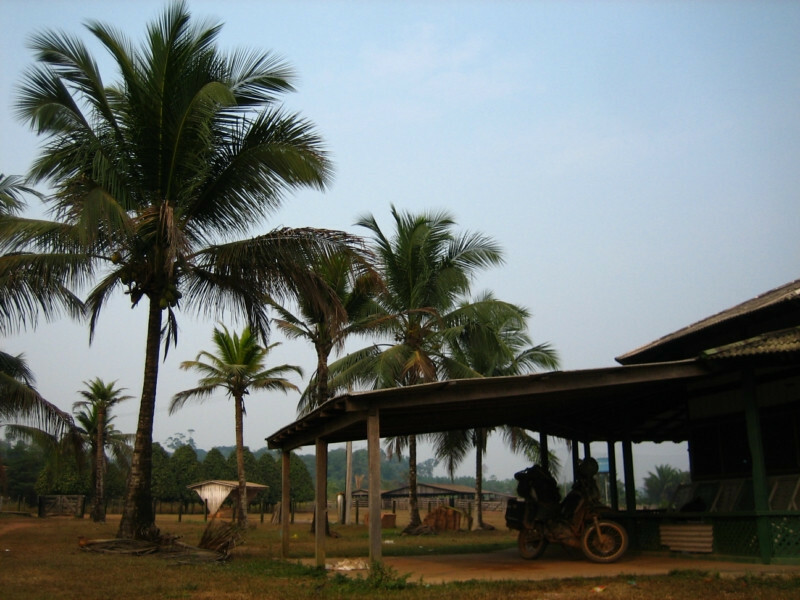 Around 4 pm, I came across this farm and asked them if I could camp for the night, which wasn’t a problem. 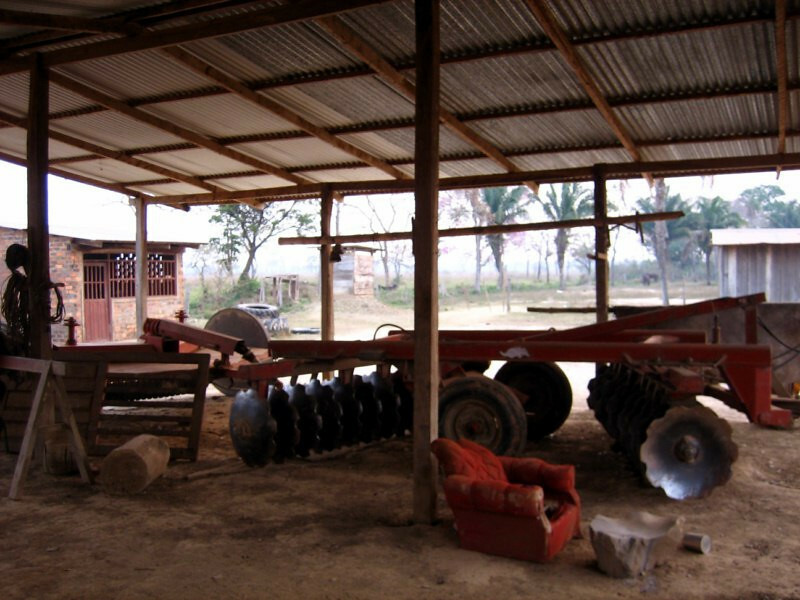 It was quite a big farm with lots of mechanization and they were also herding cattle. Strange sunset in the pampas. The strength of the Sun started fading around 4 pm but dusk lasted till about 7 pm. The outline of the Sun was clearly visible all through dusk until it went under the horizon. I think it’s the fine dust in the air, obscuring the strength of our home star that allows us to see the Sun whole without blinding effects. At night, even with no cities around, I could only see a handful of stars. 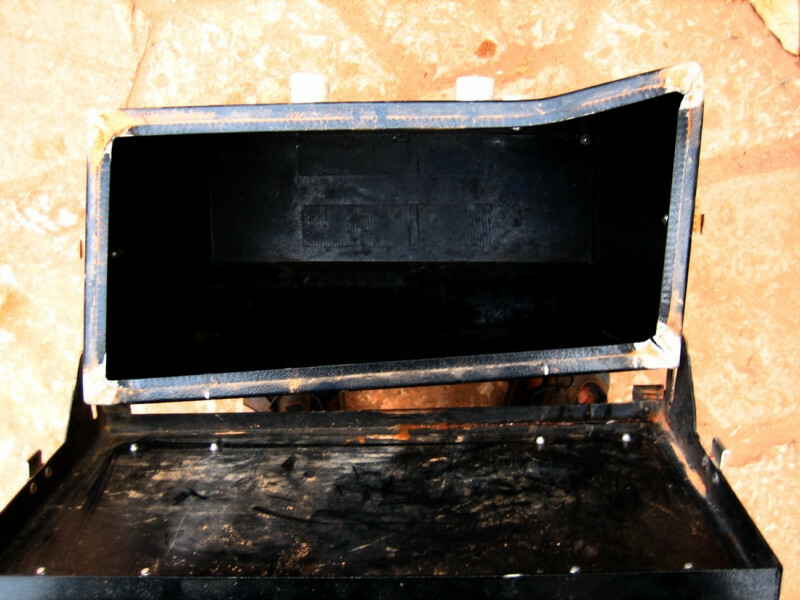 The kitchen on the farm with an outdoor oven. 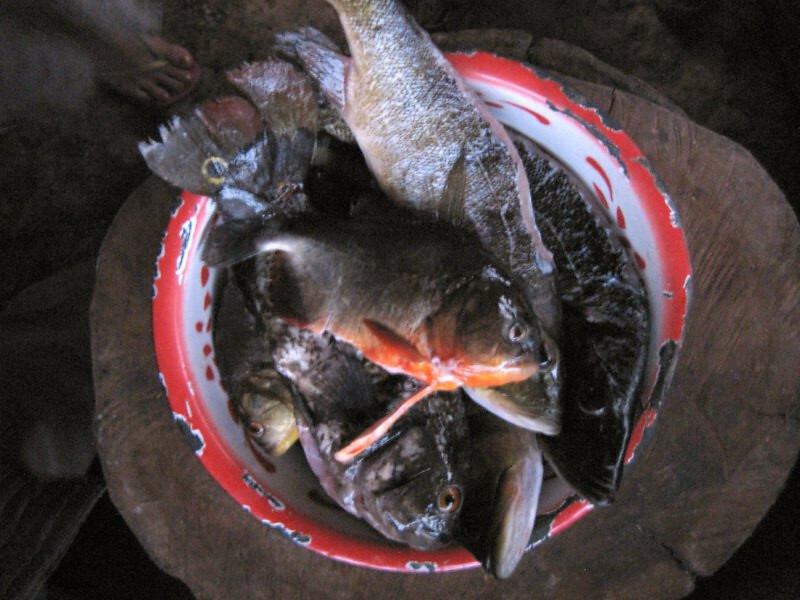 Fresh river fish for dinner and that one with the red stripe is a piranha. 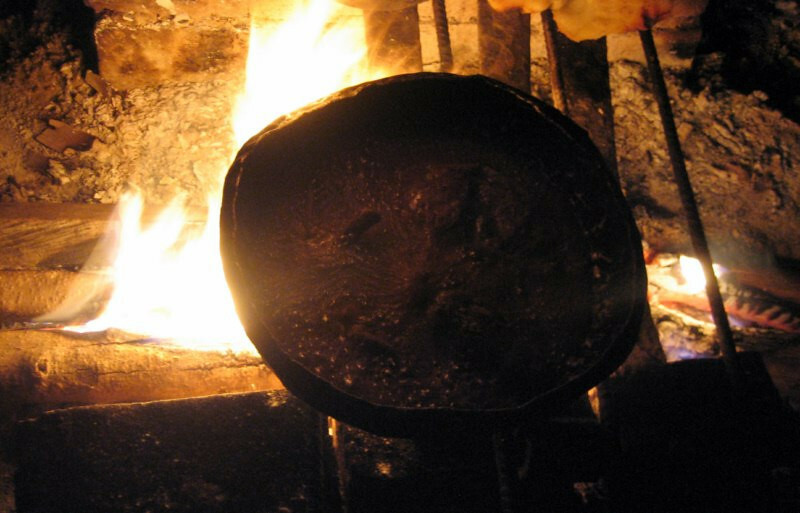 The wood fire stove in the kitchen. Frying up some fresh fish. 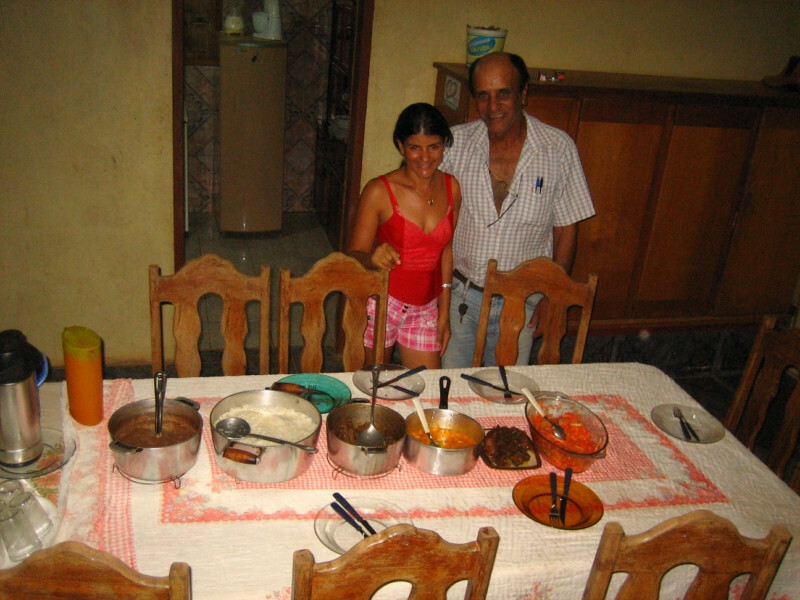 The owner and his wife sharing their dinner and their house with me for the evening. Sunrise the next morning with a similar effect on the Sun. Back to more mind-numbing washboard road. If you’re an expert dirt rider, you can fly across the tops of the bumps by going very fast, but I took the slow route and went up and over each undulation. 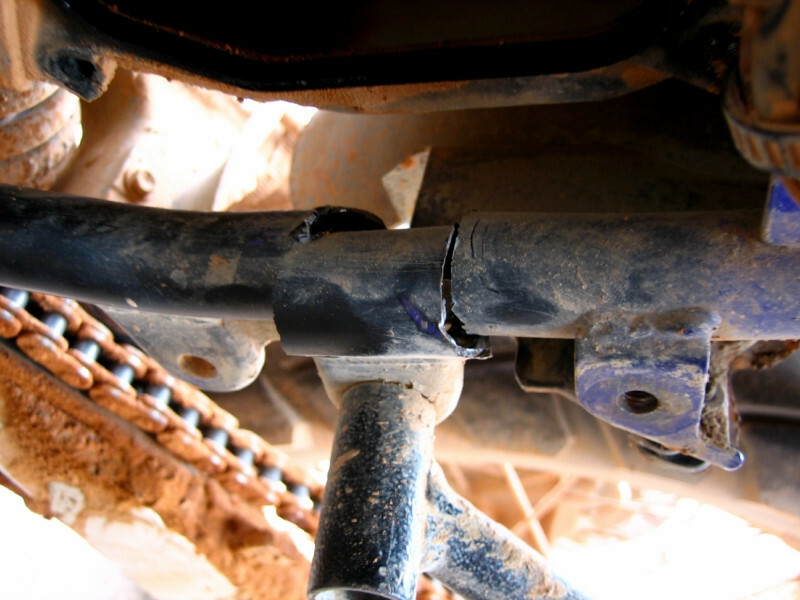 I was more concerned about the health of my rear shock and the vibrations breaking off something on the bike. Riding across the bridge at Yata. A river and colorful trees at Yata. Looking forward to that curve up ahead. To keep my mind focused on the simple task of going in a straight line at slow speed, I had to listen to some audio books to keep my mind engaged. 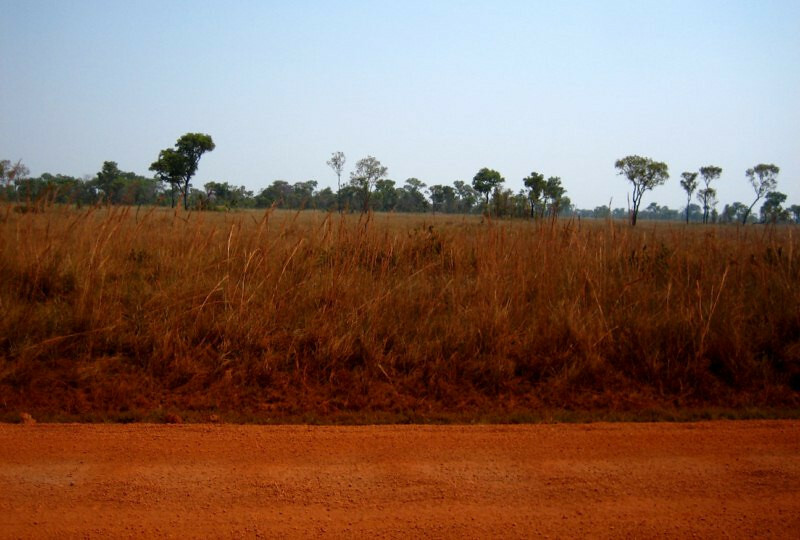 Scenery of the pampas (savanna) of northern Bolivia. 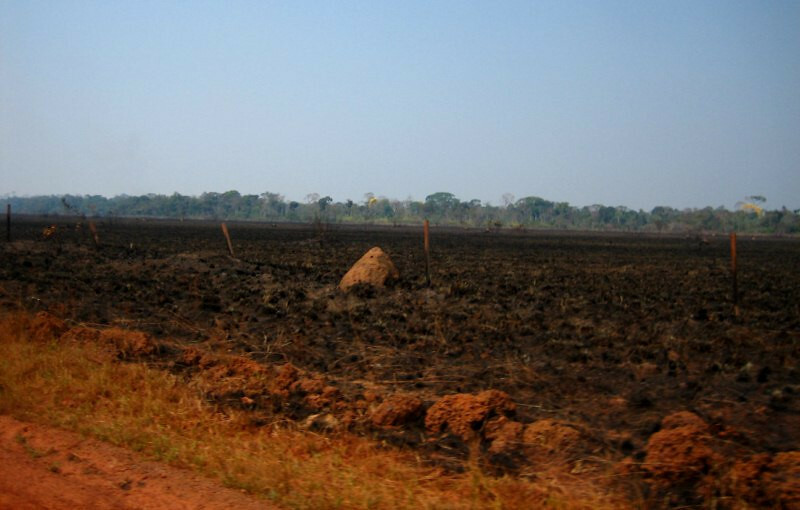 And a lot of it is burned, creating pastures for cattle. 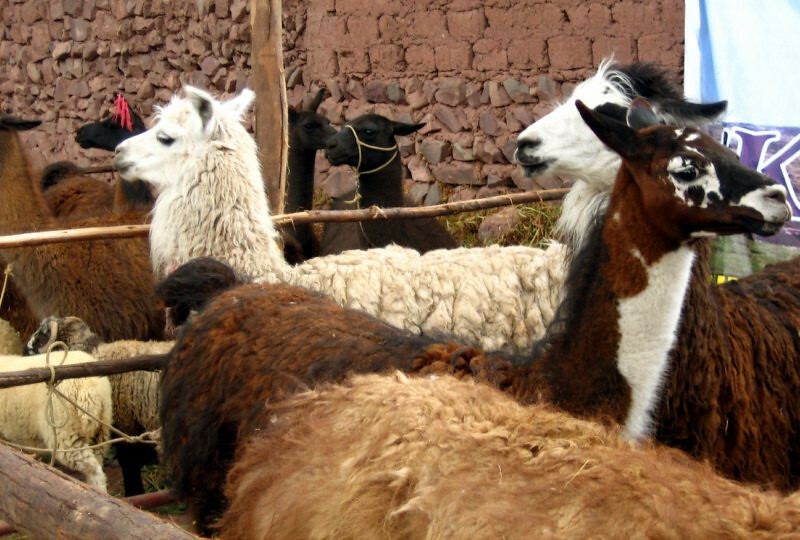 As a country develops, its demand for red meat increases. Look, there’s a hill. Yeah! There were some stretches of respite from the washboard but after a short while, sudden intense vibrations would be felt signaling the return of the dreaded washboard. 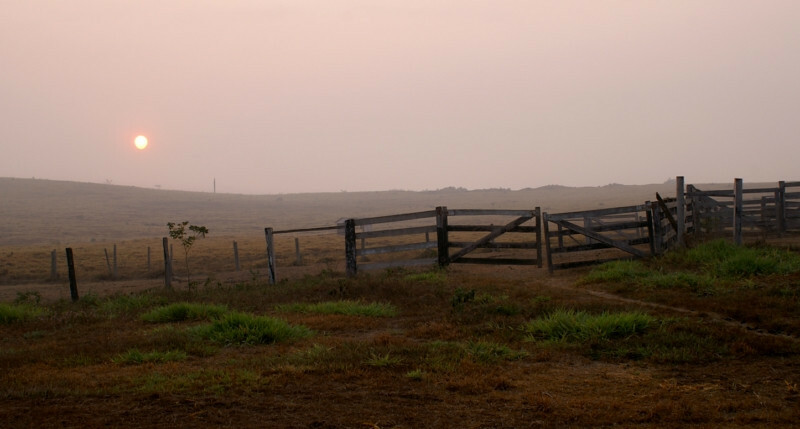 As the sun started to retreat, I kept an eye out for the next farm. 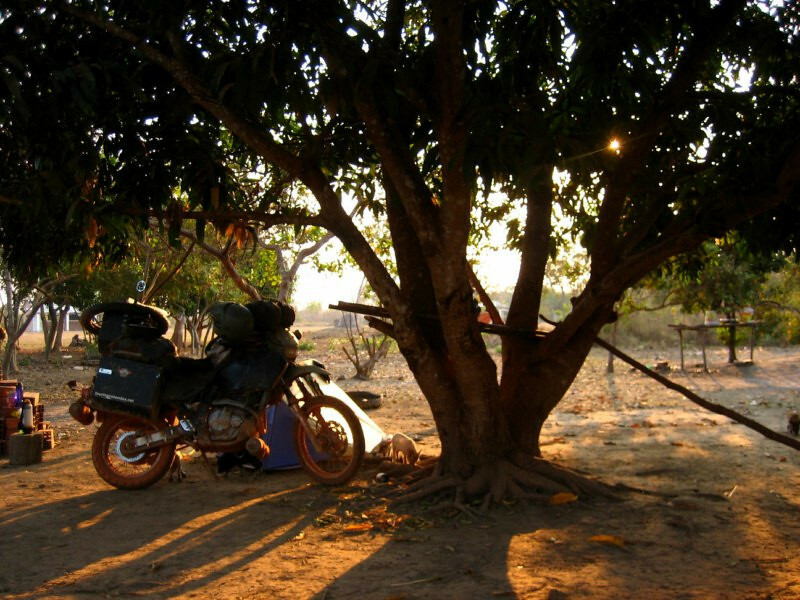 I came across a few clusters of houses in Mariposa and was told I could camp under this tree. 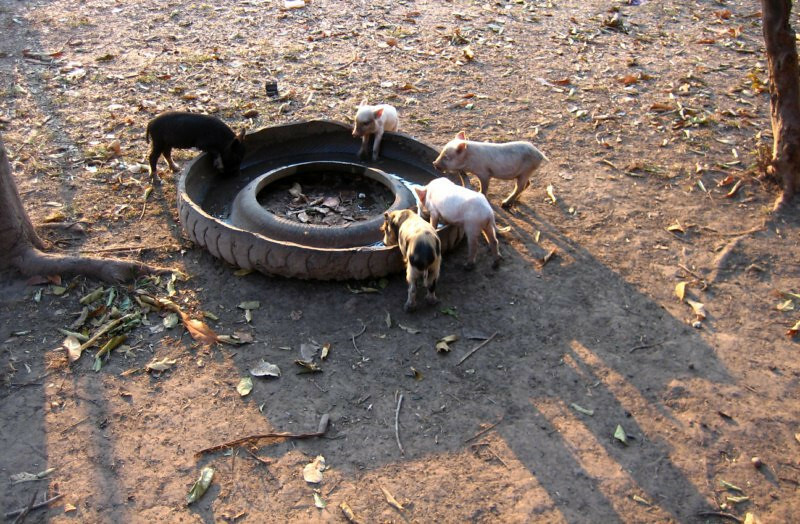 Cute little piglets having a drink from a cut tire-drinking trough. And after I setup camp, they reclaimed their territory and promptly went back to sleep. This little guy tagged along and gave me this Caju fruit, from the tree I was going to be sleeping under. 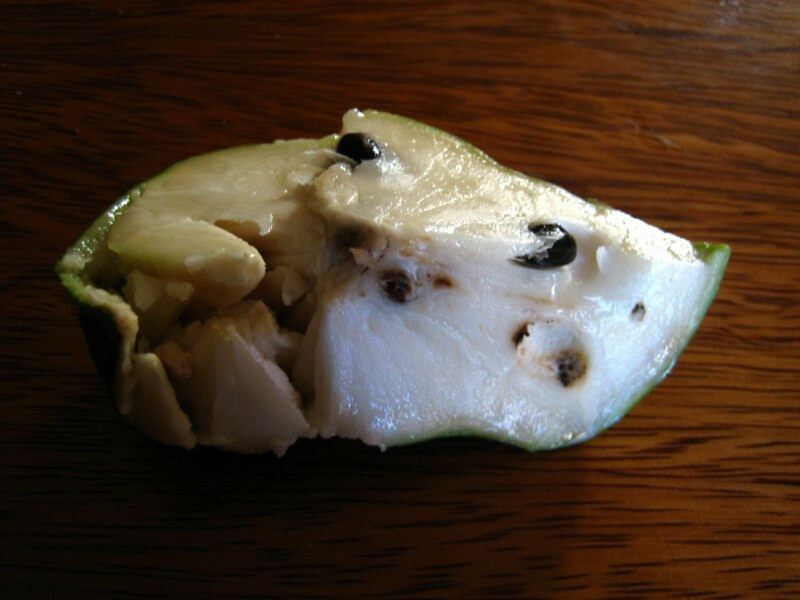 I didn’t know the cashew nut comes from a fruit like this. Looks pretty strange with the nut outside and a sweet fruit attached to one end. 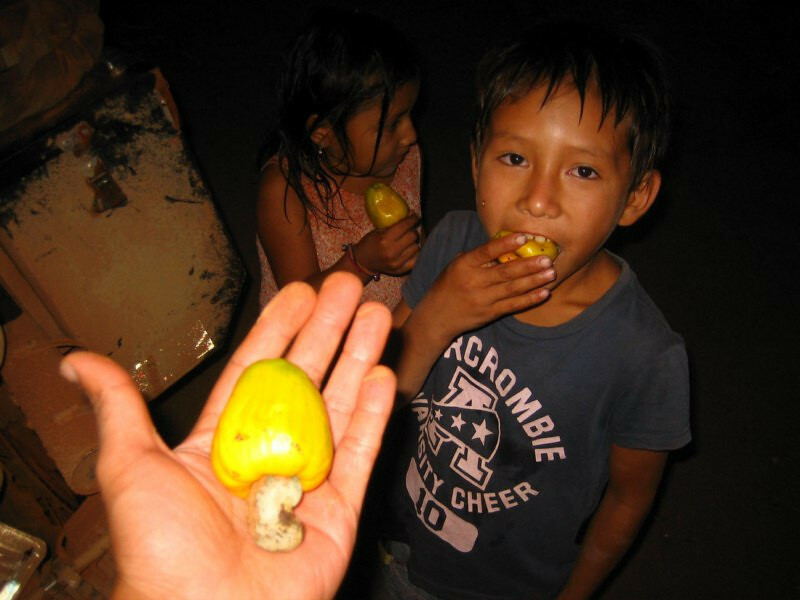 The juice from the caju fruit is very common in these parts of Bolivia and into Brazil. 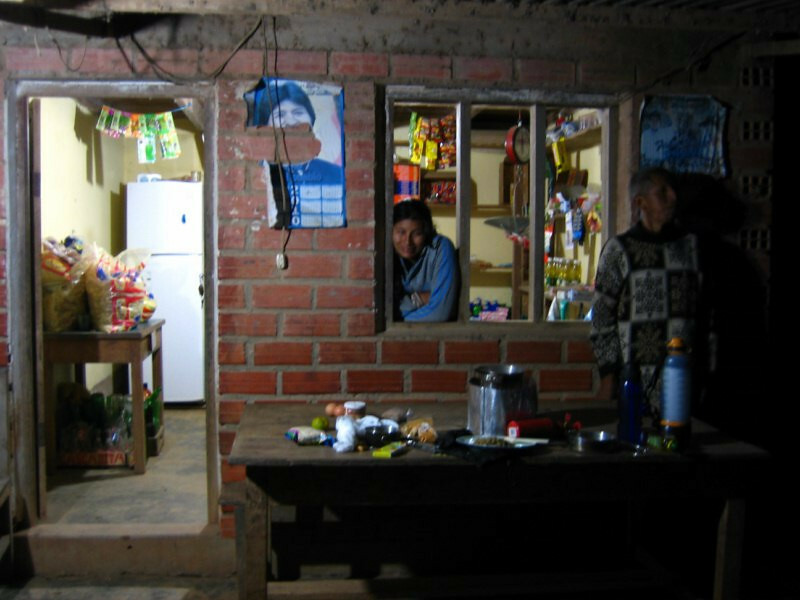 After I took an outdoor shower, one of the locals who told me I could camp here invited me over to his house for some dinner. Some of his and the neighboring kids. Dinner of some fried pork with boiled yuca and rice. 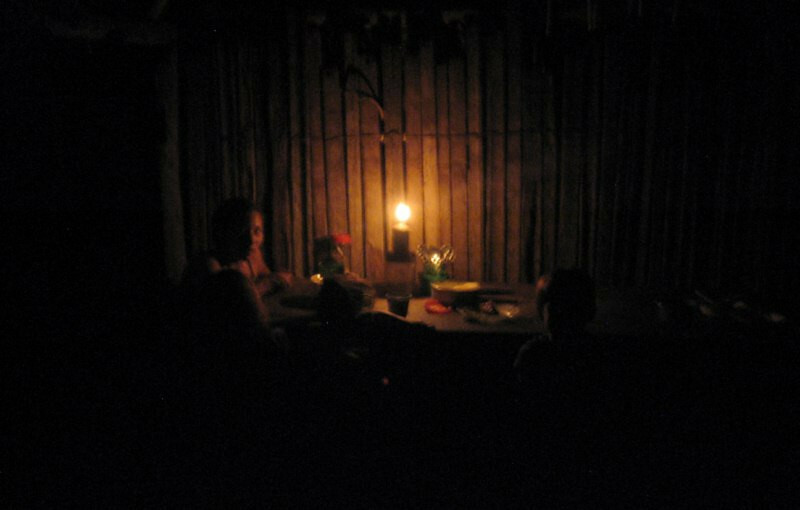 There’s no electricity in these rural parts and sunlight pretty much governs the day with farmers rising at dawn and trying to finish dinner before it gets dark with everyone turning in around 8 pm. I slept well these nights, get as much as 10 hours of sleep, recharging for the next day. On the last stretch into Riberalta. Cars would pass me, flying at around 100 kph (62 mph) while I was chugging along at half that speed. 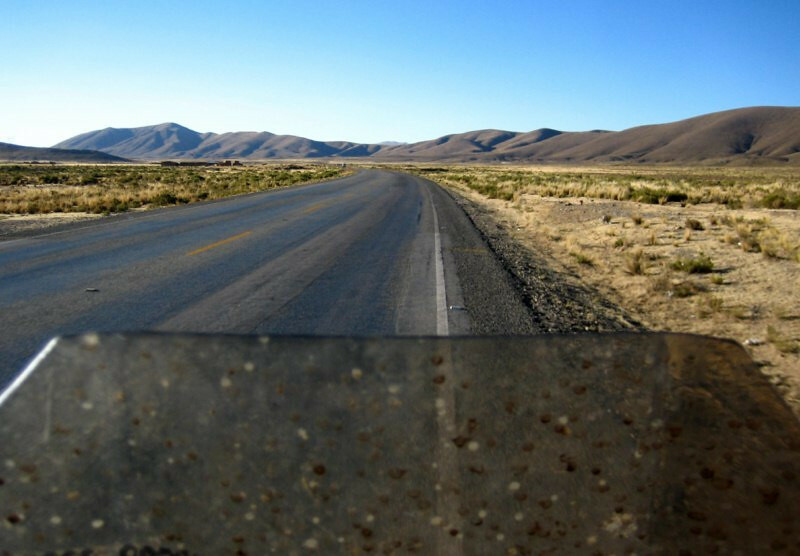 Road engineers have tried to analyze why washboard (corrugated) roads appear, but the cause of the phenomena still hasn’t been figured out with prevention impossible. 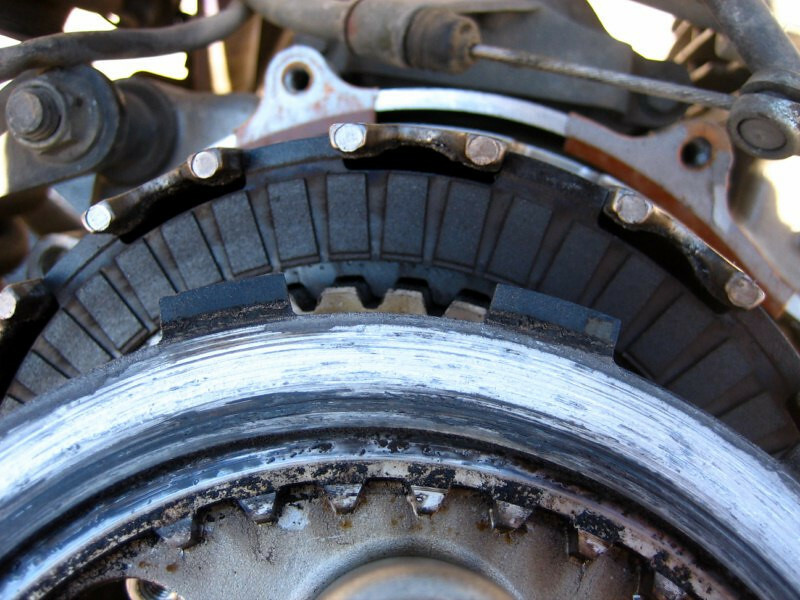 The only remedy is to regrade the road or go slower with lower tire pressures. I think I prefer sand riding over washboard. Finally a road sign to Riberalta. Good to know I was on the right road (thanks to the trusty GPS). 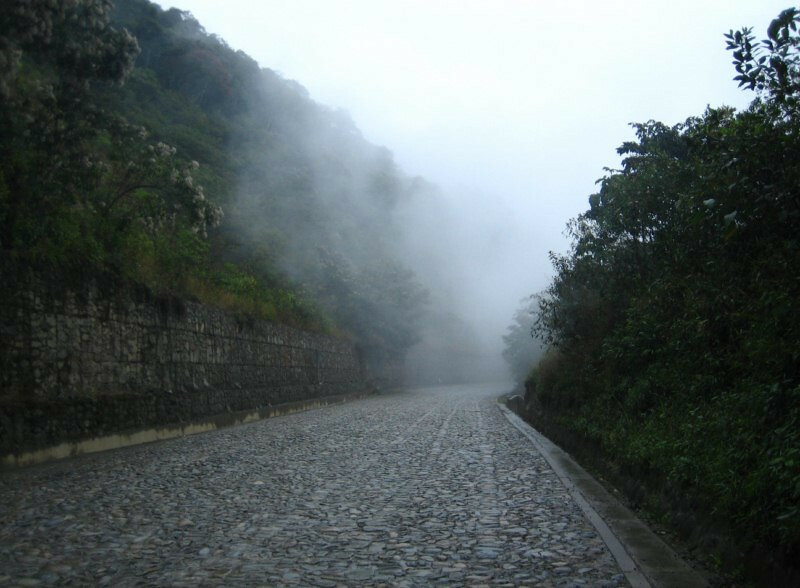 The road got better as I neared Riberalta. You’re going to warn me about a dip after all that I’ve been through? :p Civilization must be close. 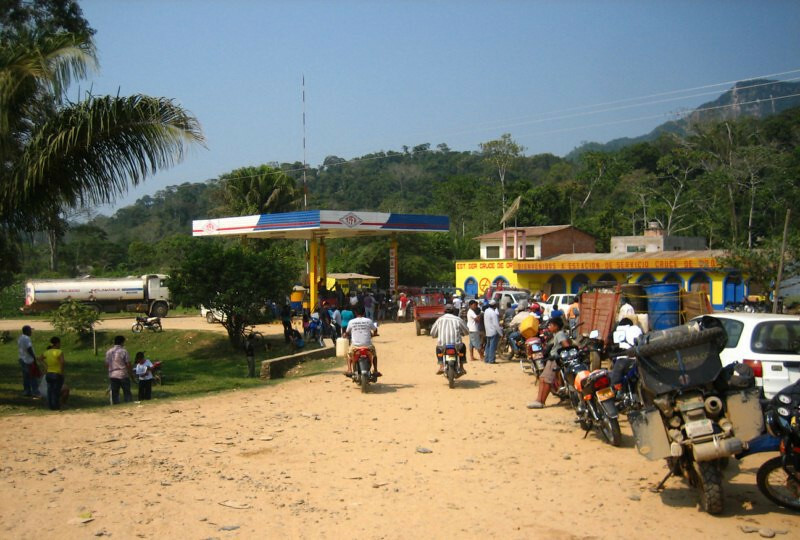 Coming across the first proper gas station since Rurre in Riberalta. 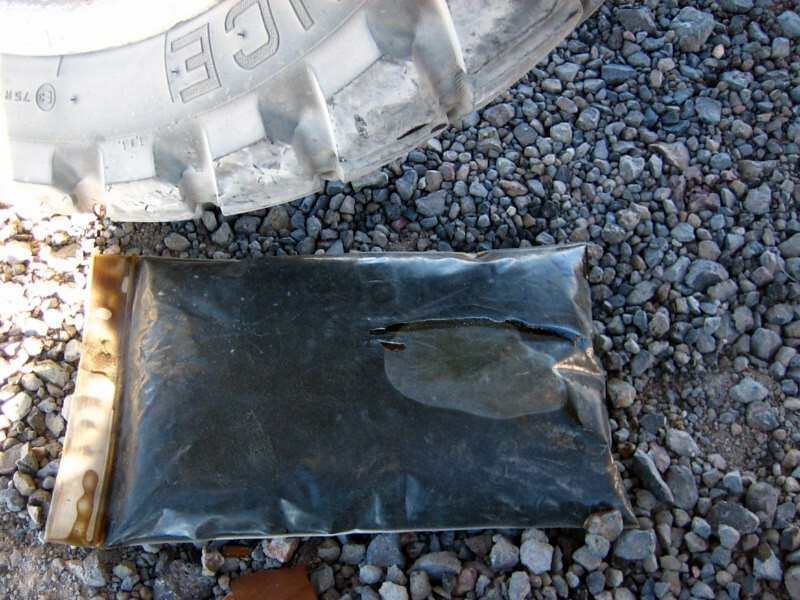 You can find gasoline in the small towns along the way for about 5 Bol/lt. The vibrations of the washboard took a toll on sanDRina and I had the right pannier weighed down a lot so wasn’t surprised to find this crack in the pannier frame. 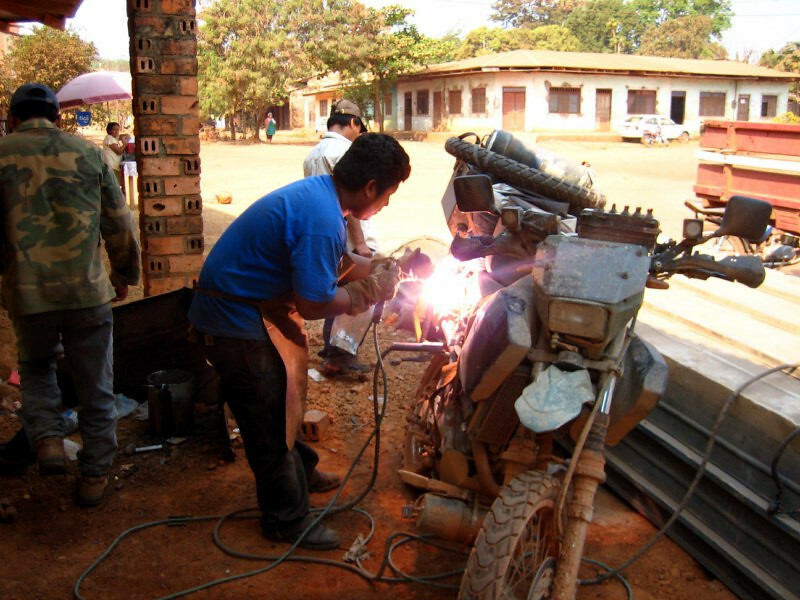 Welder in Riberalta promptly working on the bike. Big, fat weld for 10 Bolivianos. 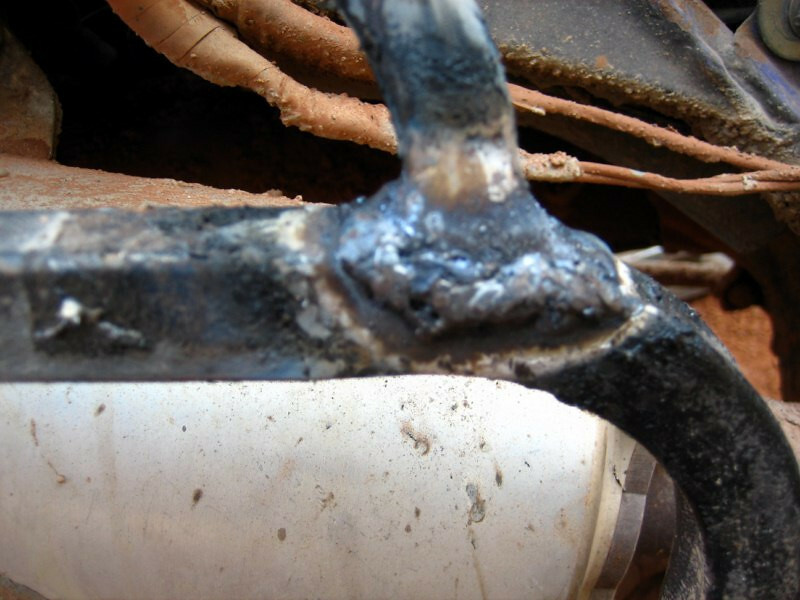 The accident in the fog had cracked a joint in my left pannier and he said he could also do aluminum welding. A fine job of joining the split walls. He also made me a new highway foot peg as the old one got sacrificed in the accident, acting as a frame slider and protecting any damage to the engine. 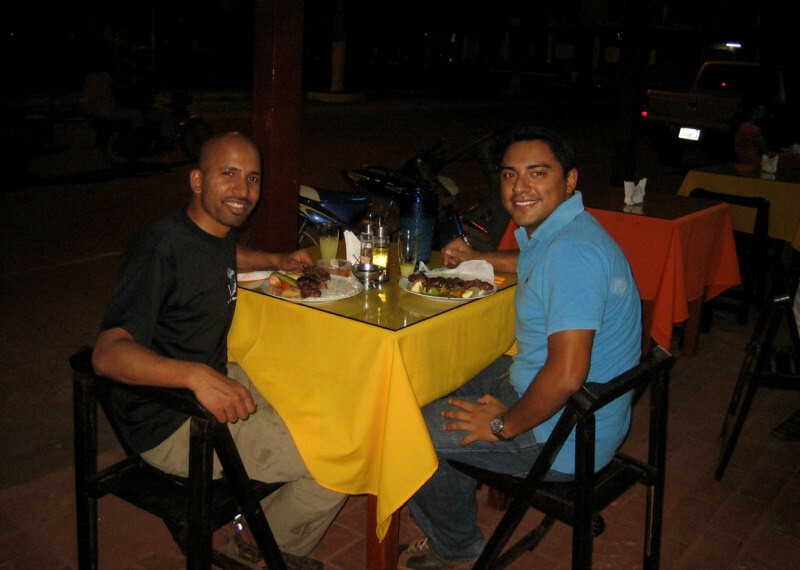 Having dinner with Rodrigo from CouchSurfing. 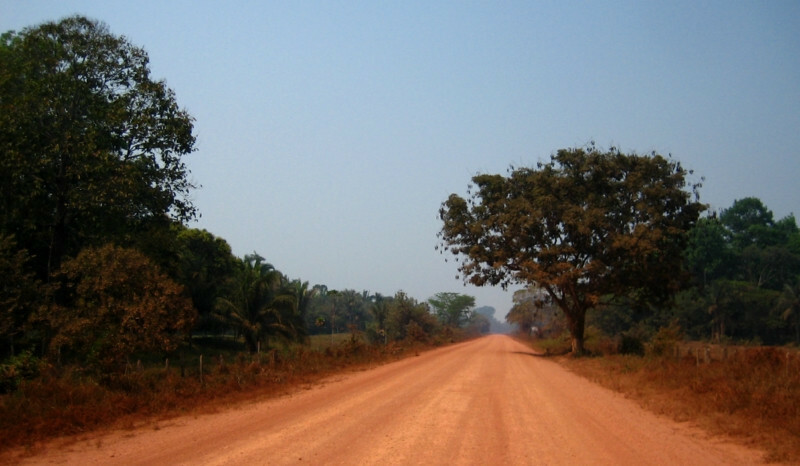 He’s from Santa Cruz but has been working here for a few years as he’s involved in transporting the lucrative Brazil nut, which is gathered from wild trees as it can’t be grown in plantations. Dinner of some grilled beef with veggies and a soupy rice. 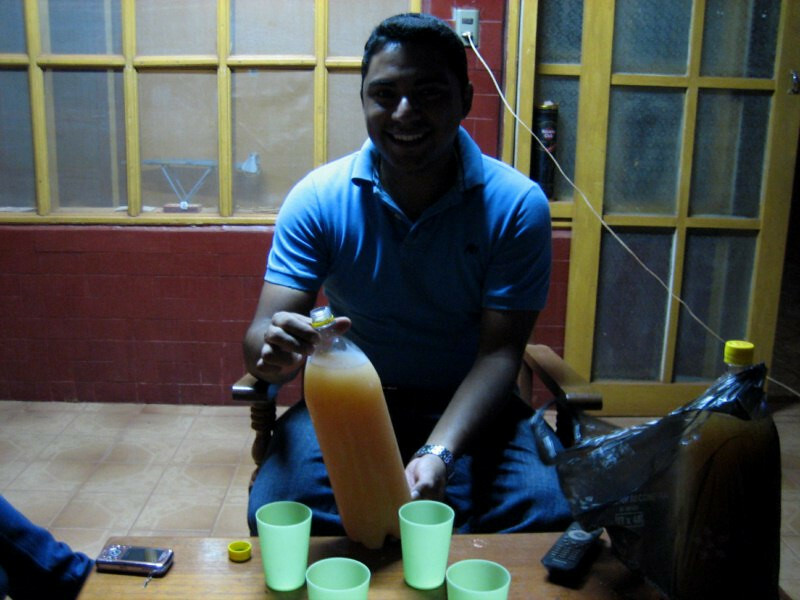 That evening, Rodrigo invited some friends over and we polished off two bottles of a local alcohol made from the Caju fruit. 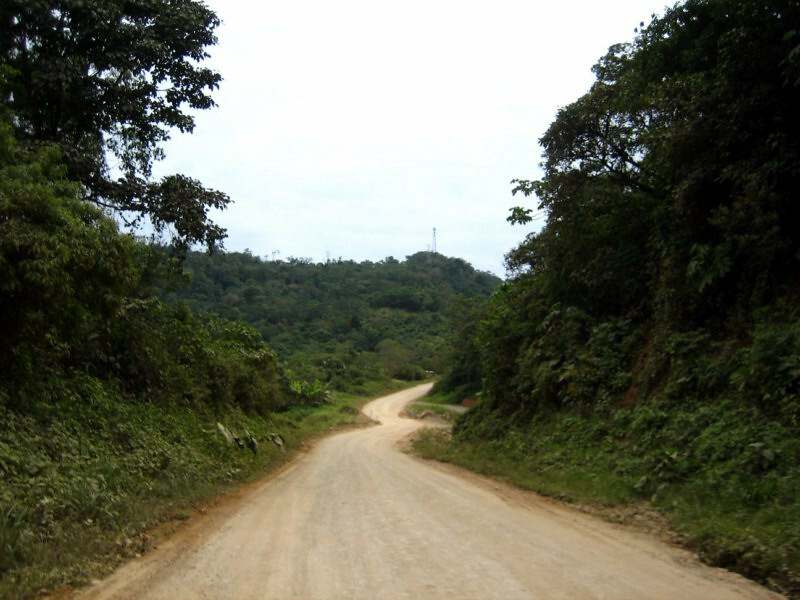 The final stretch of the road in Bolivia, nearing the border at Guayaramerin. 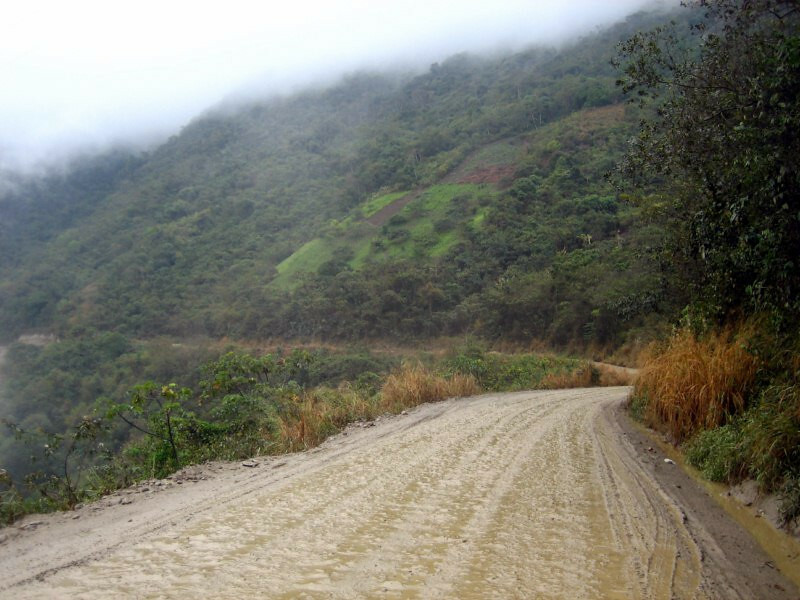 More washboard, but construction was taking place to pave the 96 kms (60 mi) stretch from Guayara to Riberalta. 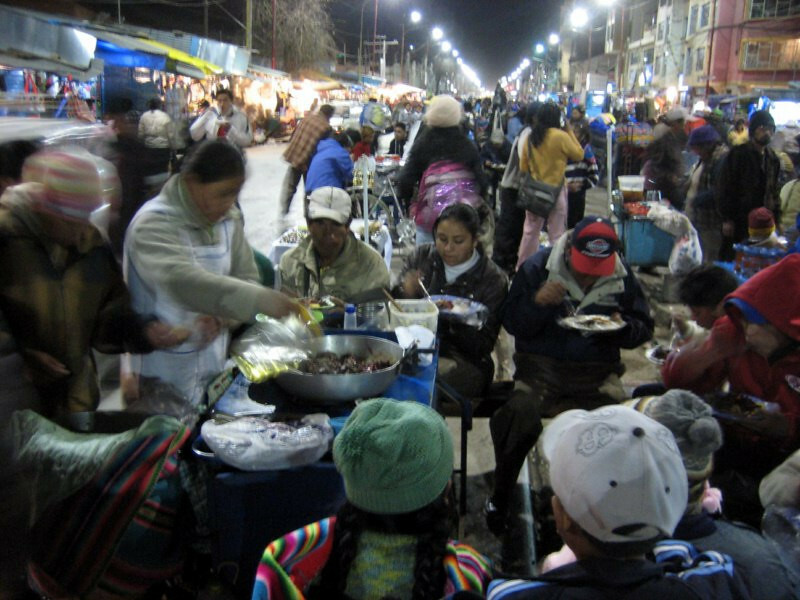 Having one last cheap meal in Bolivia before crossing into Brazil. 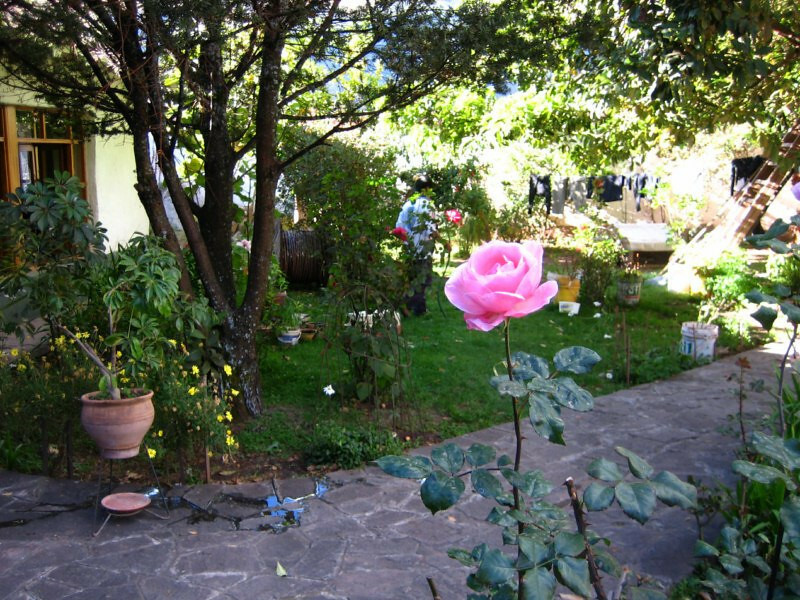 I didn’t get to see what I really came for in Bolivia, the Salar de Uyuni but I had a wonderful time here, nonetheless. The people were warm and the food was good. 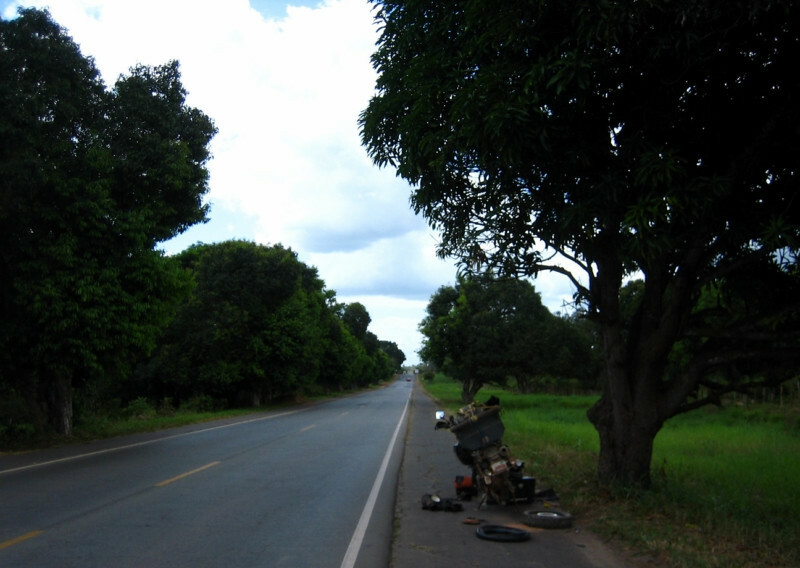 I was shown lots of generosity from mechanics who helped me out with sanDRina and farmers who let me stay with them. 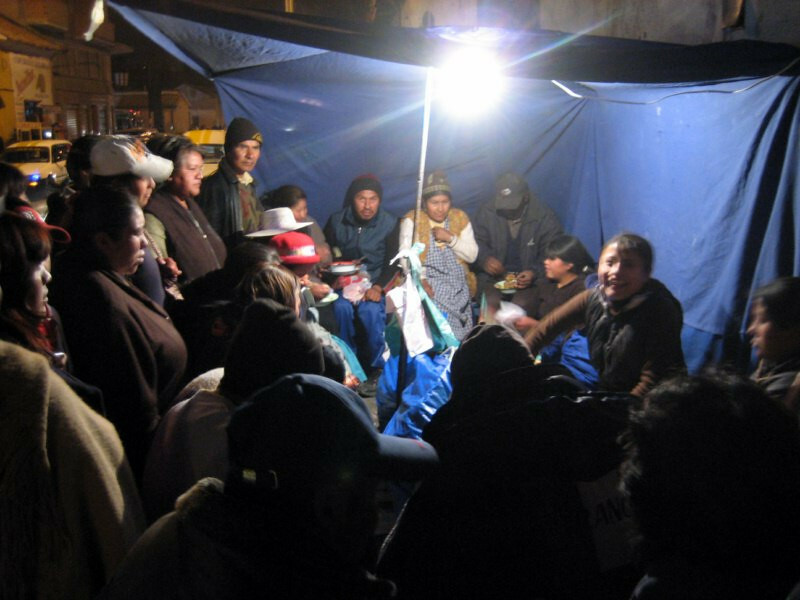 It was a rough journey north of La Paz, but the experience will linger. 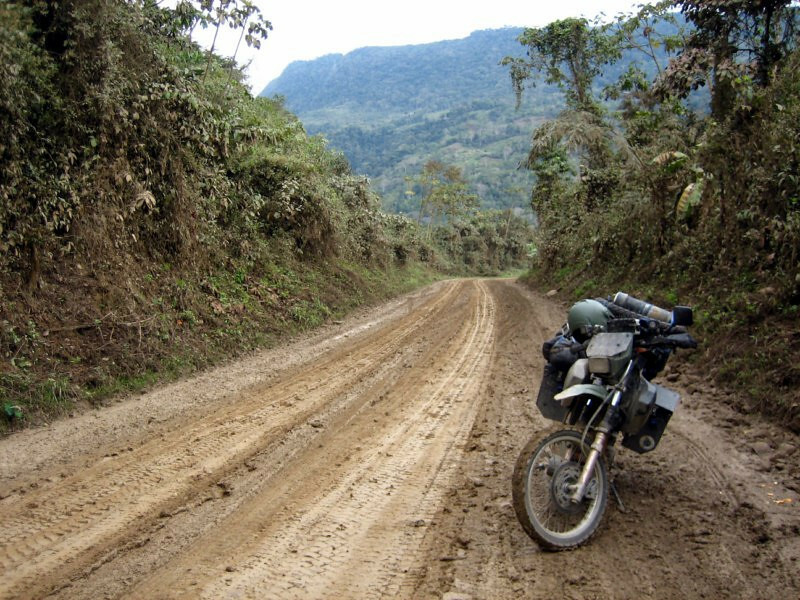 I left La Paz and headed north to more remote regions of Bolivia towards the Brazilian border about a 1,000 km (625 mi) away and most of it was off-road. 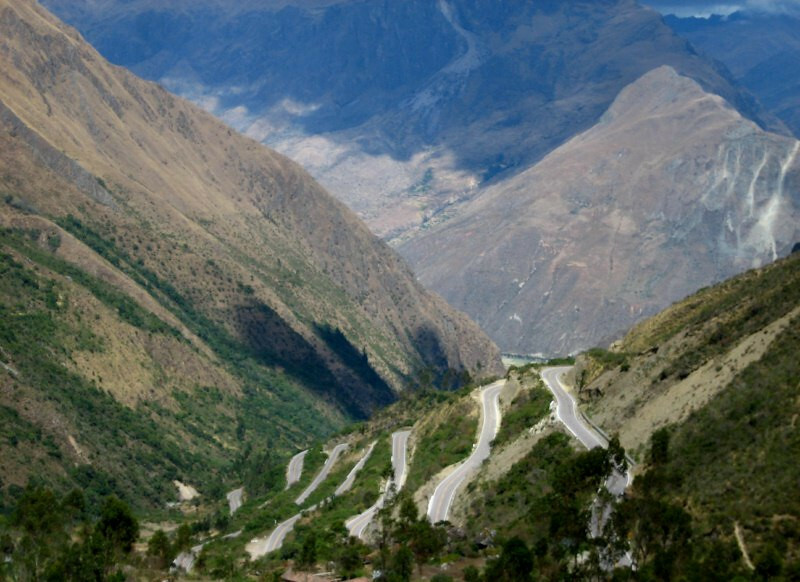 The road plunges from the heights of the Andes, down to the Yungas and finally onto the savanna leading to the Amazon jungle. 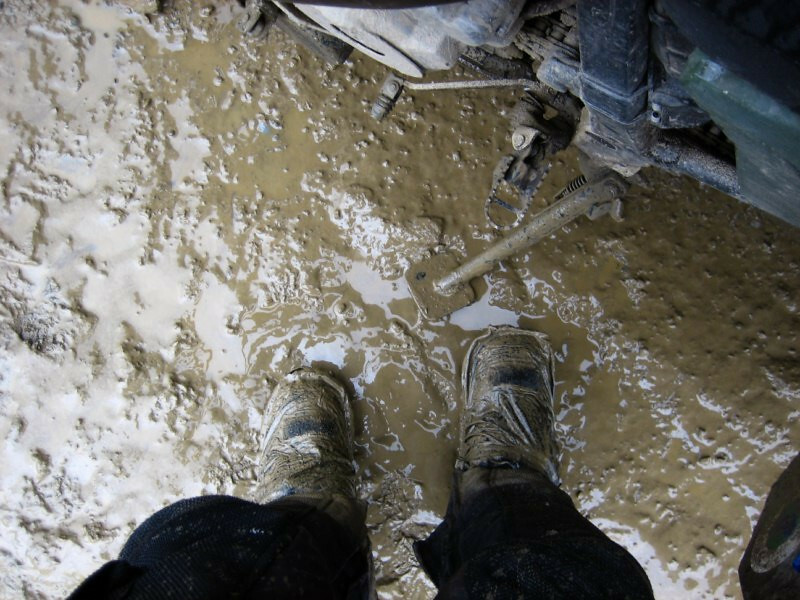 I was in expedition mode, as I knew the terrain and conditions would be tougher. At the peak of the Andes at around 4,670 m (15,300 ft), all going downhill from here. 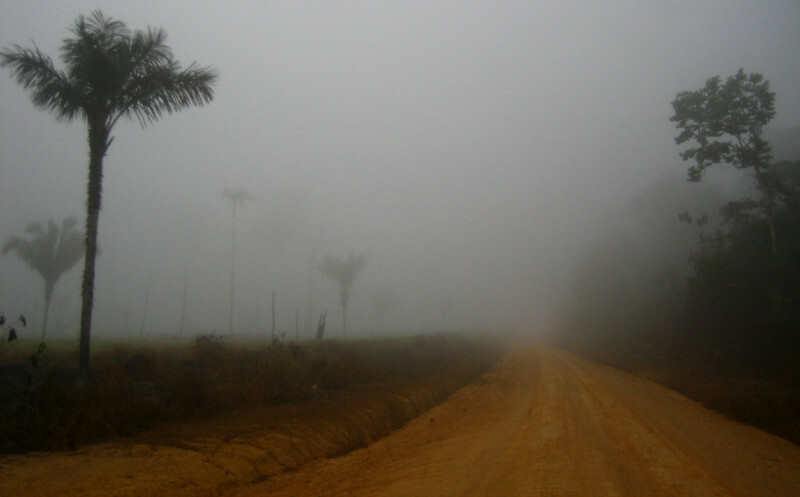 I rode this road to Coroico just last week and it was bright and sunny, but today, fast moving clouds shrouded the route in neblina (fog), greatly reducing visibility. It was also lightly drizzling, making for a slick road surface. Riding into a white-out, where visibility was reduced to a few meters. I slowed down a lot but had to keep moving. 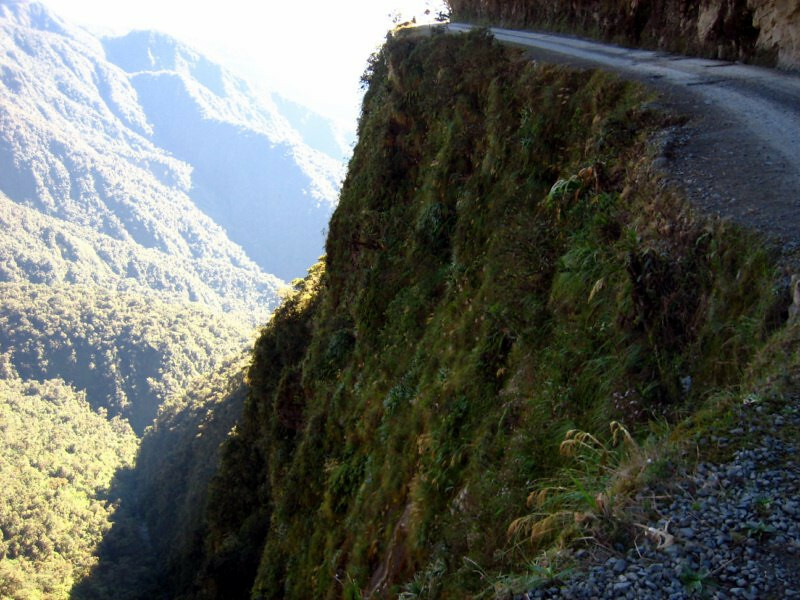 Imagine these conditions on the old Death Road and one can see how it gained its notoriety. But this replacement was going to show me that the danger is still there in inclemental conditions. 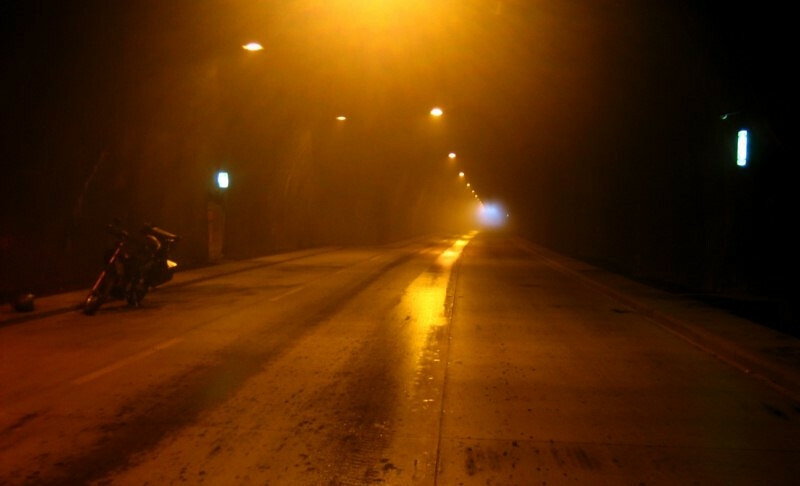 Taking refuge in a tunnel and putting on my rain gear. Unaware of the accident about to happen. Fog didn’t ease up and visibility was still just in front of my face. 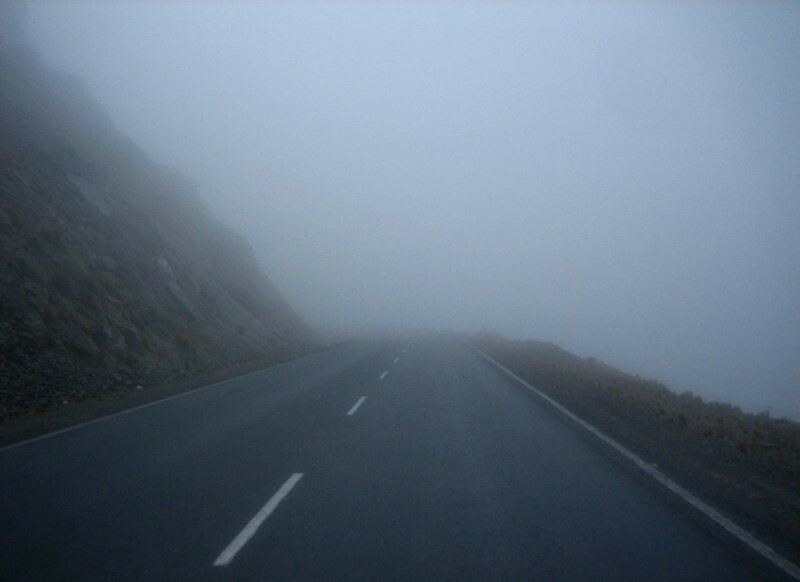 As I was negotiating some tight hairpin turns with my safety glasses and helmet shield fully wet, I saw a truck emerge out of the fog suddenly in front of me in my lane. He was one of the typical vehicles down here that doesn’t have a working rear tail light or brake light. The truck came to a sudden stop, maybe to let me pass but it was too close to me and I knew if I slammed on the brakes, I was going down (reminiscent of my first accident in Costa Rica) so I had to go onto the shoulder to avoid hitting him, but the shoulder was covered in slick mud and I went down instantly. No injury to me, but sanDRina suffered a broken windshield as she hit the right rear tire of the truck. The truckers jumped out and helped me get the bike up and I didn’t know if they were shouting at me or apologizing, but it was all over within a few minutes. I regained my composure and carried on with my eyelids taped open! 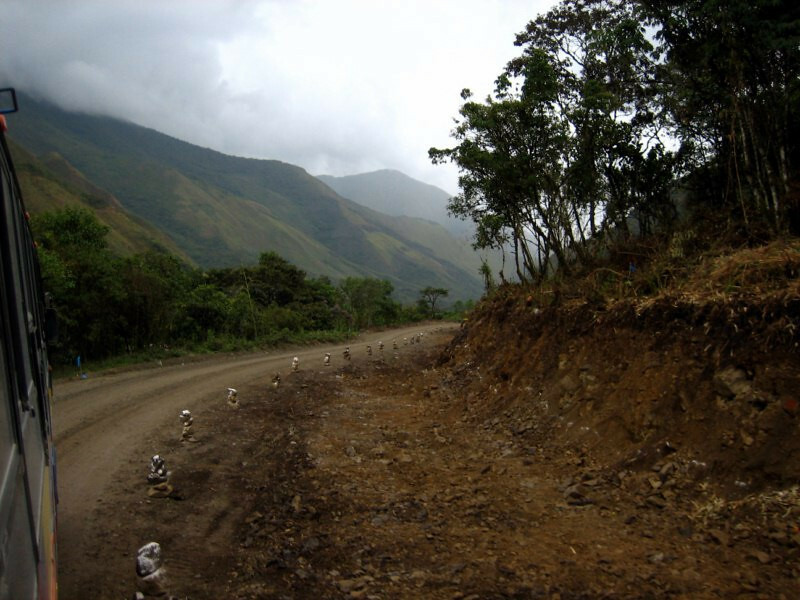 The pavement ended near Coroico and the road turned to cobble stones as I pushed north to Caranavi. And a little further, it went one step further to mud. 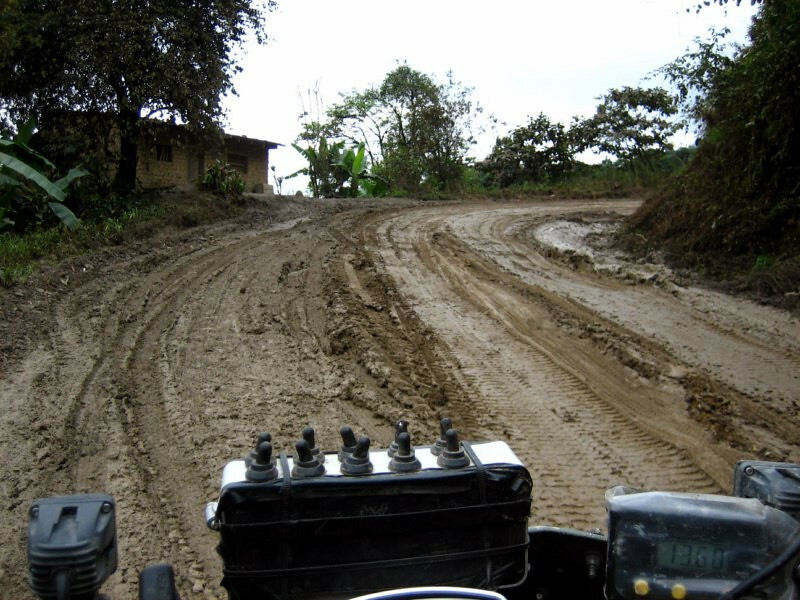 Wet mud was the one road condition that I was most dreading with this heavy bike but was happy to see that it wasn’t so bad to ride through. Just take it easy and go smooth on the bike inputs. This road wasn’t that bad as you can see the wet mud was only a few millimeters deep and underneath was a hard road surface. Pretty nice views of misty valleys with the sun trying to poke through the constant drizzle. Blechk. First time riding in wet mud. 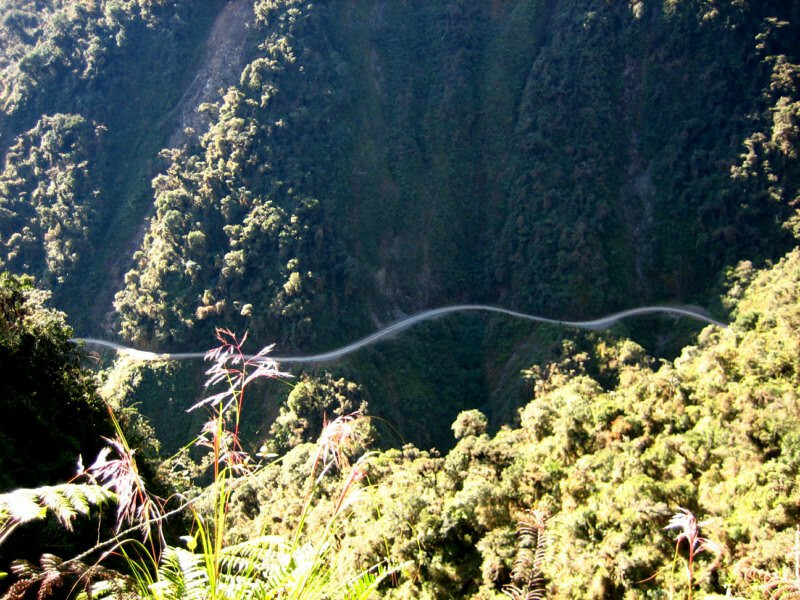 The road from Coroico to Caranavi is cut into the cliffs and is narrow in most places, making encounters with oncoming traffic tricky, especially as this is a commercial route with lots of trucks and buses. 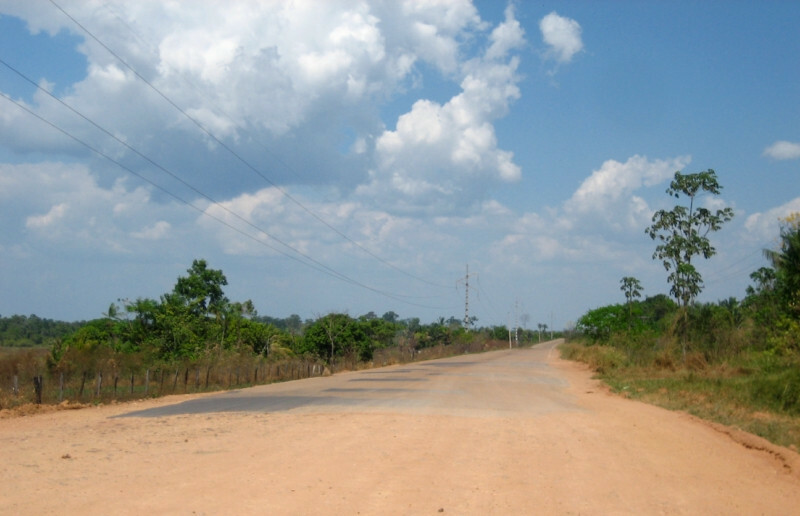 And I didn’t catch on for a while that traffic on this road drives on the left (like in India) – repeated flashes from oncoming traffic on the right side of the road was confusing. 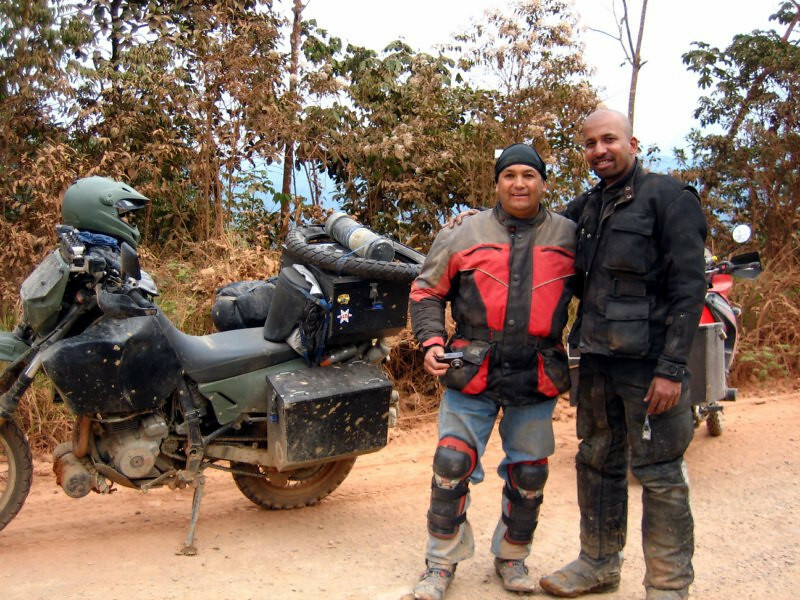 When there was no traffic, it was quite a pleasant ride and I was getting the feel of riding in mud. 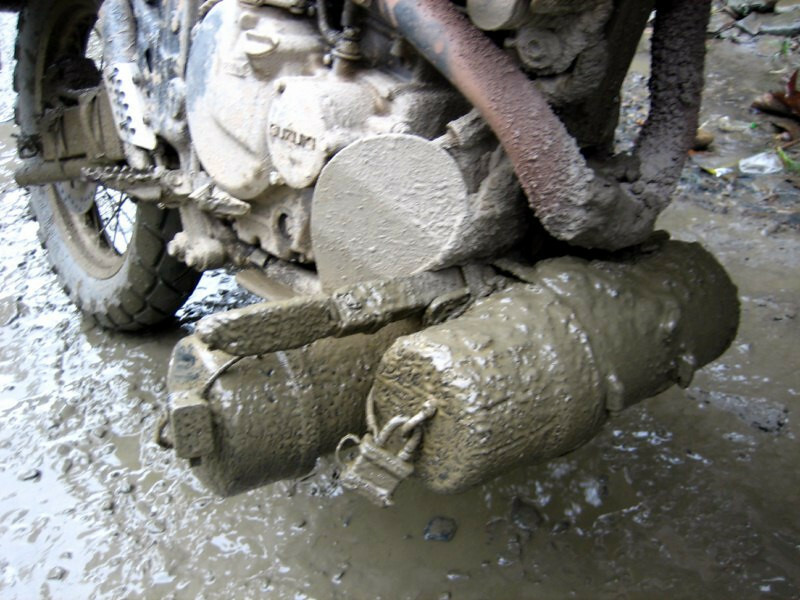 Mmm, everything coated in a thin layer of mud. I was hoping not to get a flat tire in these conditions, cause I didn’t want to touch the bike. 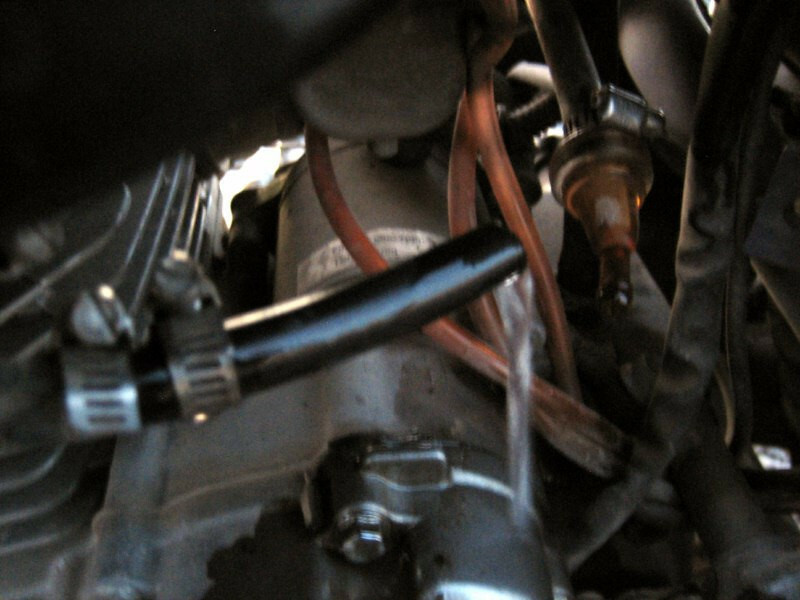 I used a hose near a river to wash off the bike, especially the oil radiator and cooling fins on the engine. 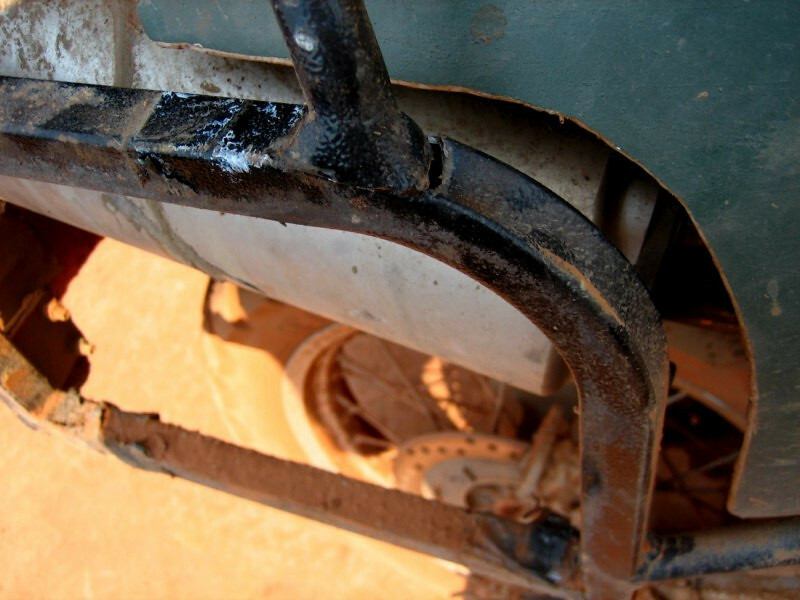 Even with my shortened front fender, there wasn’t much mud on my oil radiator. 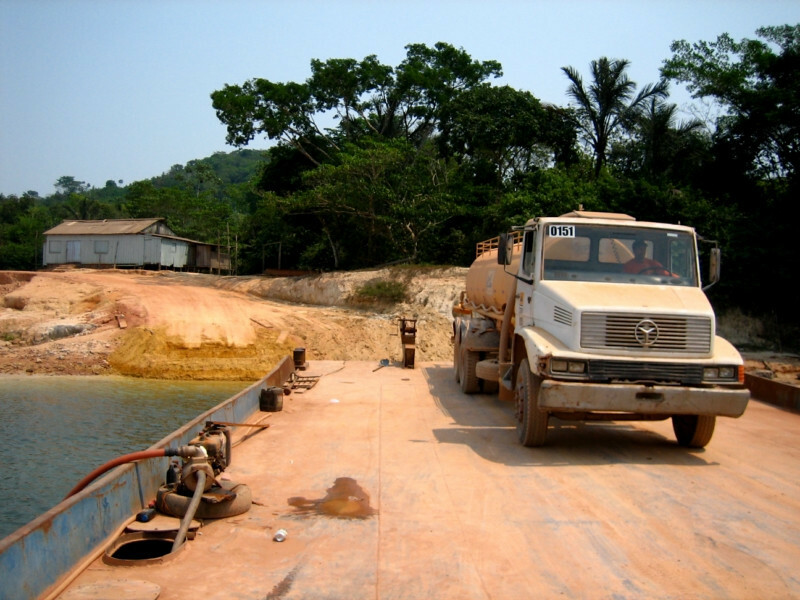 A typical scene of two trucks facing off each other around a bend. It was slow going with lots of stops for traffic encounters but everyone was well-behaved. 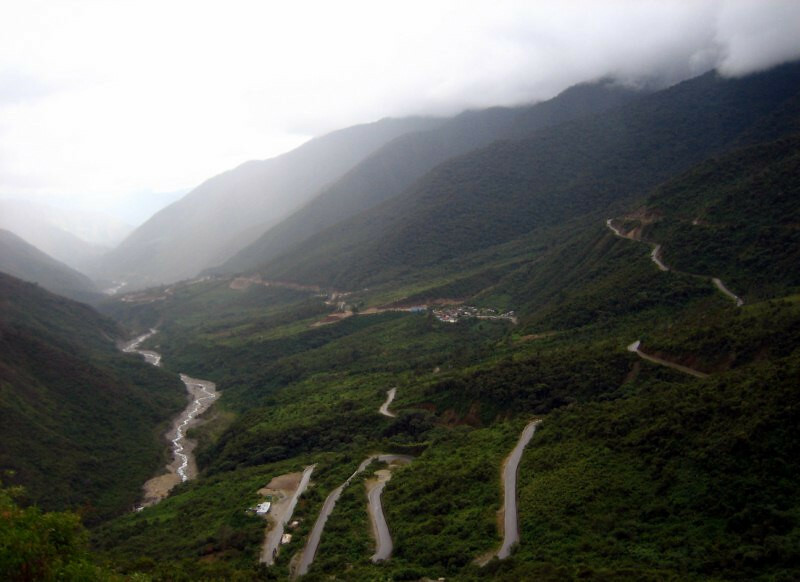 A wide view of the Coroico River as the road winds through the valley. Coming across a natural tunnel, which was underwater. 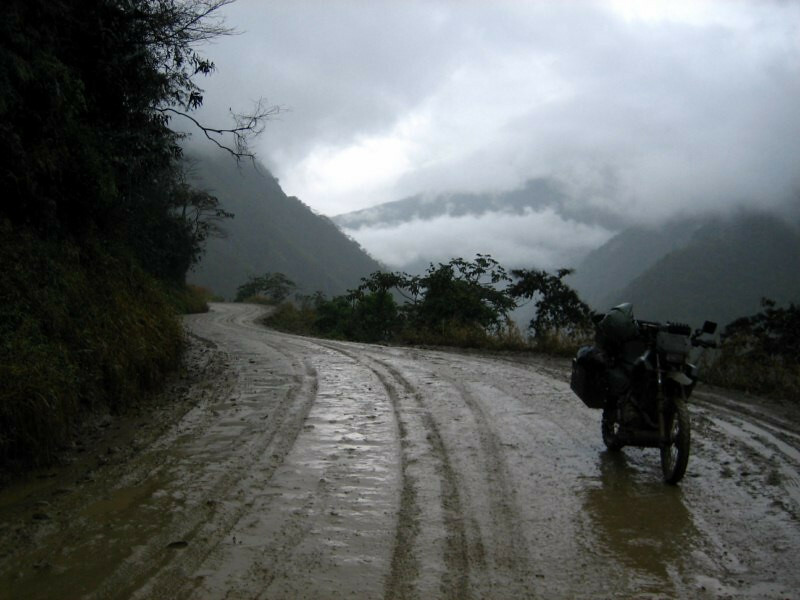 Beautiful ride in this steep valley and besides wetting the road, the misty rain added some epic quality to the terrain. The clouds finally parting as I neared Caranavi, where the first thing I did was wash off the mud again from all the important places. And then soak under a hot shower. Bolivian independence was coming up in a few days and the parade was having a practice through the streets with kids doing some cool synchronized line dancing with some breakdance maneuvers. 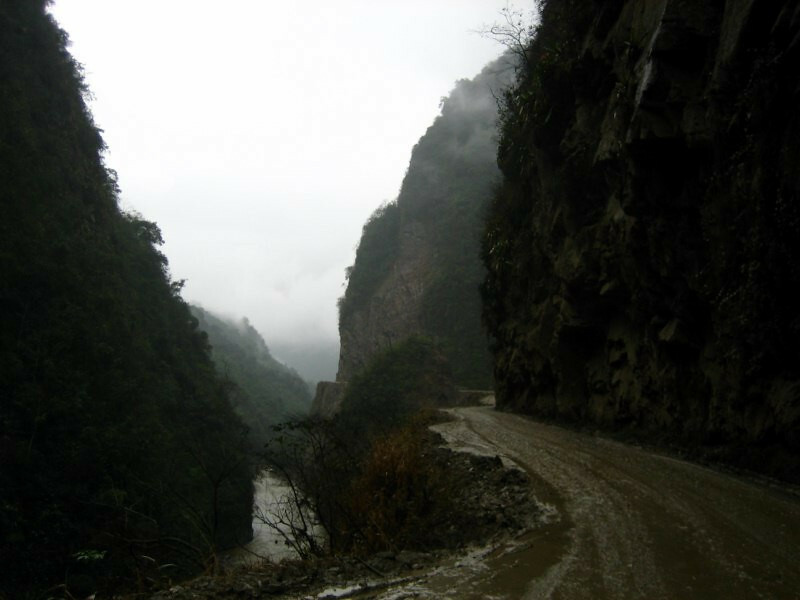 The next day, the rain eased up, but the road was still wet. Oops. Sure thing it’s peligro (dangerous). 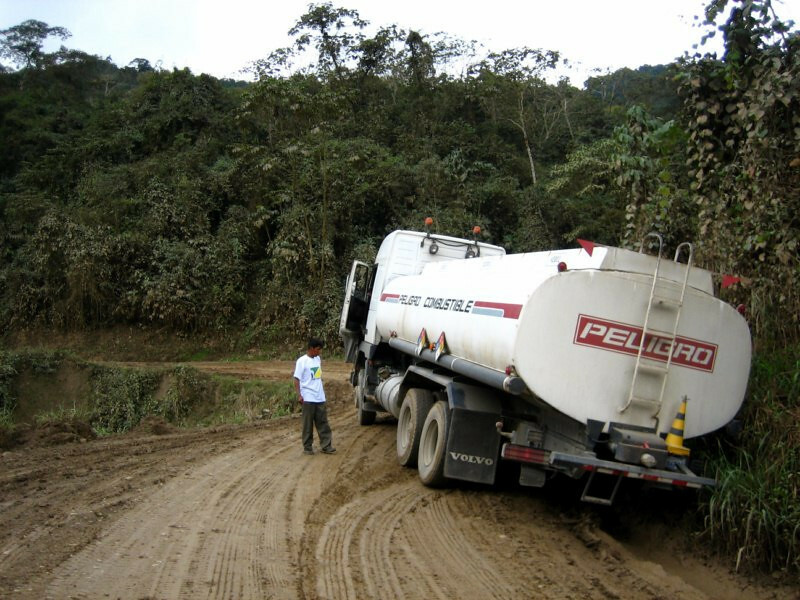 This is a fuel truck and imagine how many times they must slip the other way over the cliff. I was chugging along mainly in first or second gear since I’m no expert mud rider, but that got the engine very hot, so I took frequent breaks. The road climbed up and down over numerous hills and I was impressed that I didn’t get stuck any where, that too with a worn front tire. 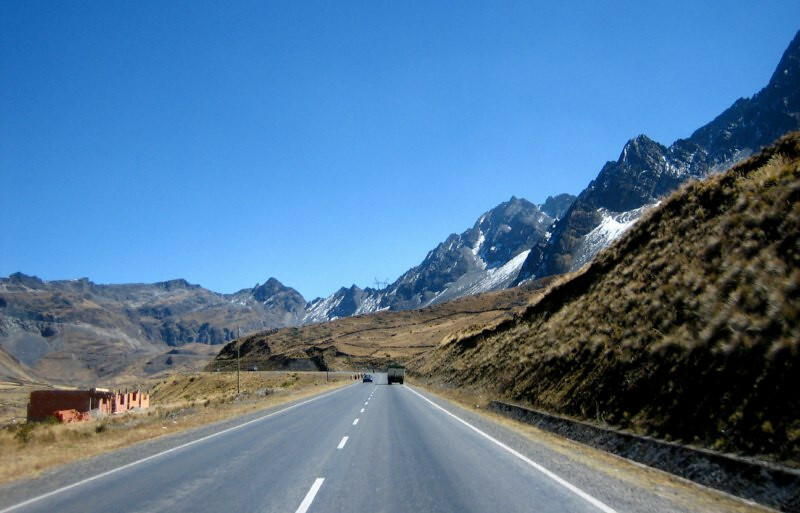 This is the only route from La Paz heading to the northern region of Bolivia so buses and trucks were frequent. 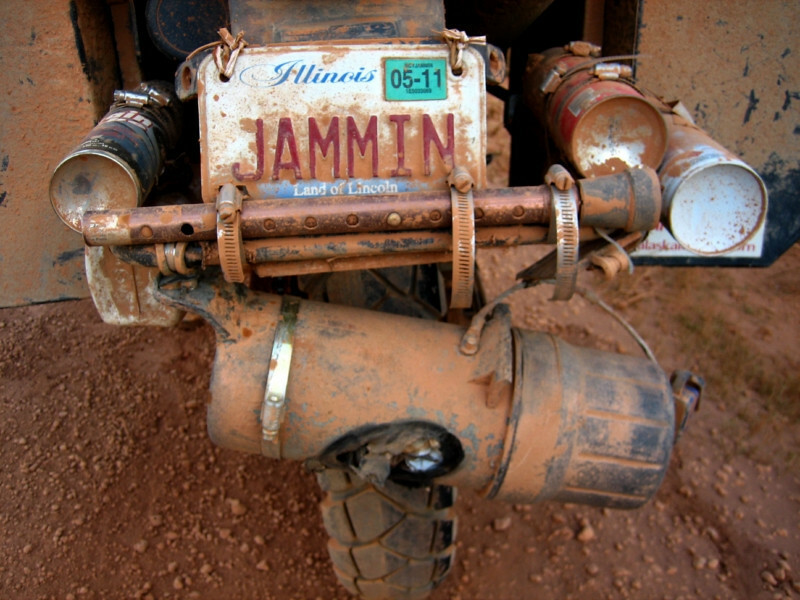 I guess it doesn’t matter what kind of tire you have for mud, cause the tread’s going to get clogged anyway. Taking another break as the engine temperature (between spark plug and cylinder head) soared to 176 C (350 F). I was skating with my feet down through the real thick goop away from the tracks. 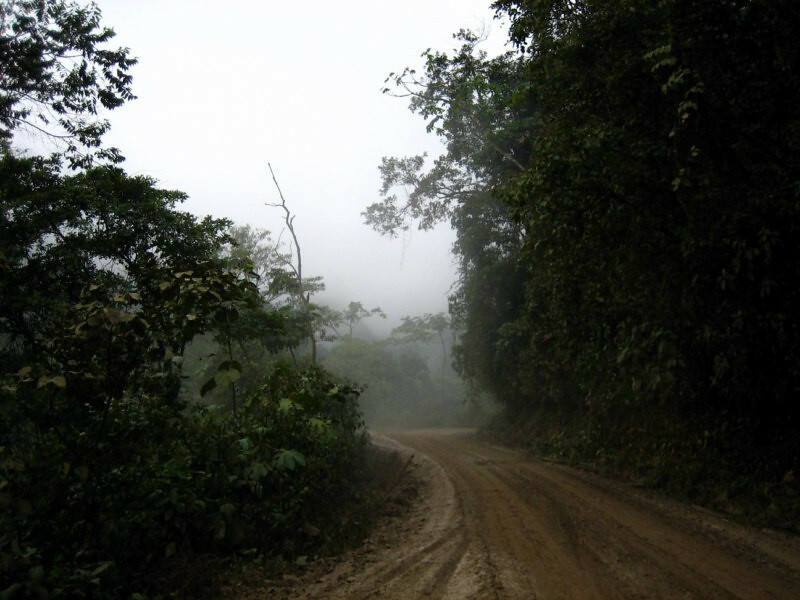 Misty, jungle riding through the Yungas. 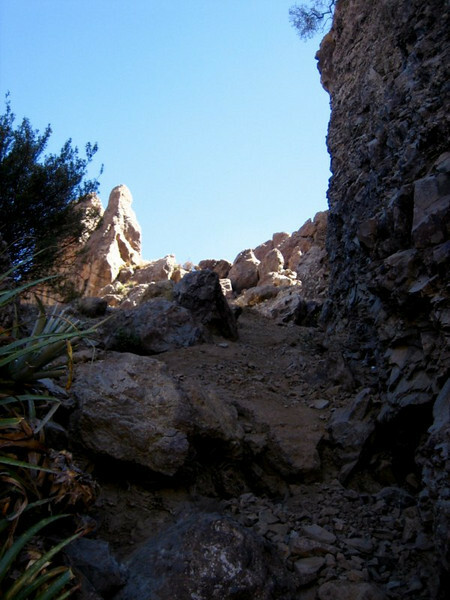 A sense for the terrain that the route passed through. 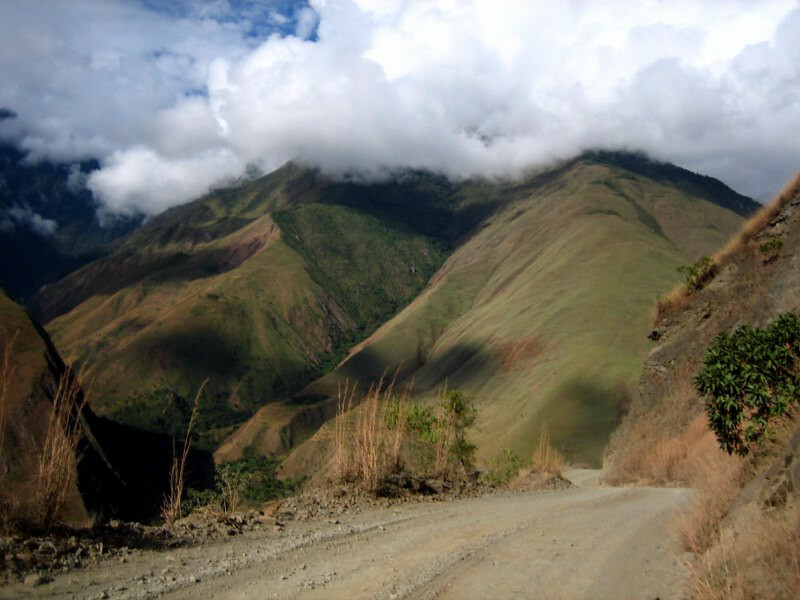 The Yungas are a transitional region of the Andes, a swath of rainy, humid and warm forest along the eastern slopes leading to the savanna below. Reaching the small town of Buena Vista where every driver from the route breathed a sigh of relief at coming across an oasis. Warming up with some typical pasta soup before the meal. 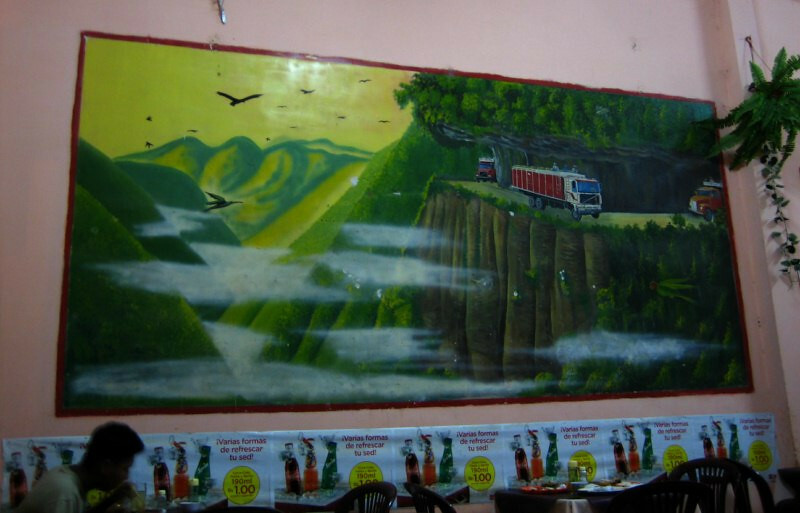 The restaurant owner was also selling coca leaves and home-made chocolate. I loaded up for the dry, dusty straight roads ahead. 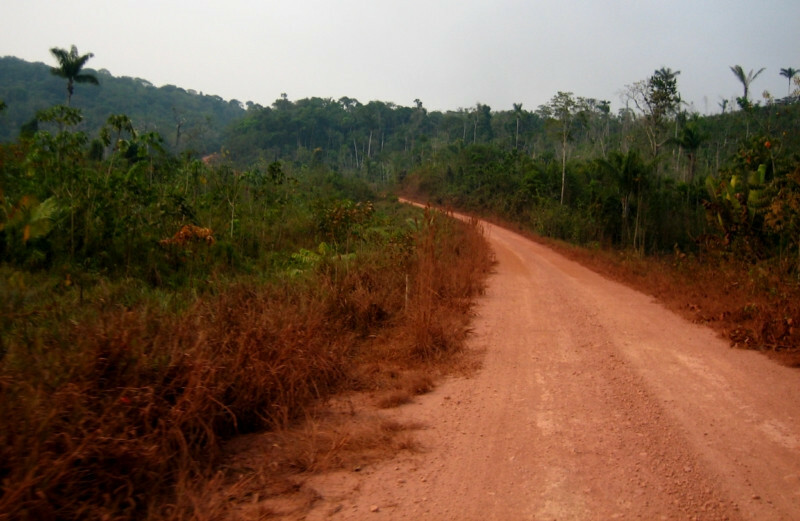 He also said the road gets dry within a few kilometers. Encouraged with the drying track. It’s dry and dusty! 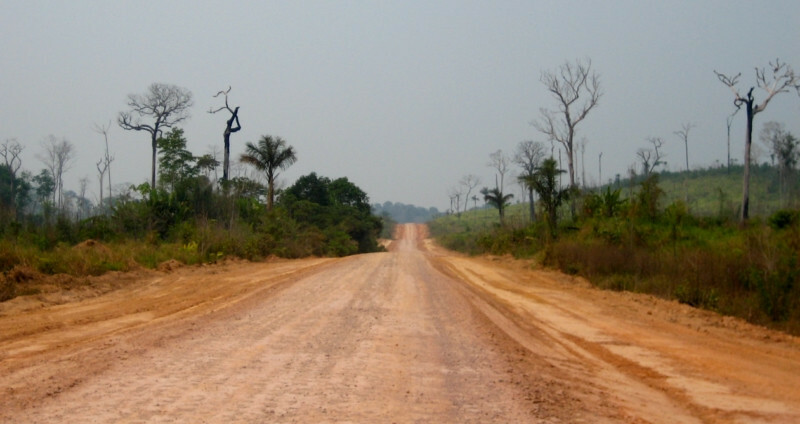 My enthusiasm for the end of the mud roads quickly faded as I realized it would be dry and dusty for the next 4,000 kms (2,500 mi) across the Amazon. 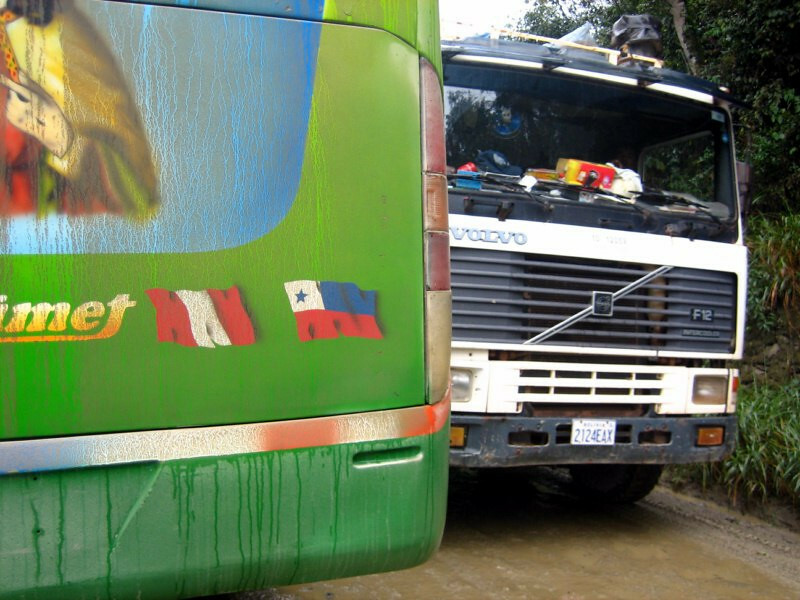 Where are those coca leaves? 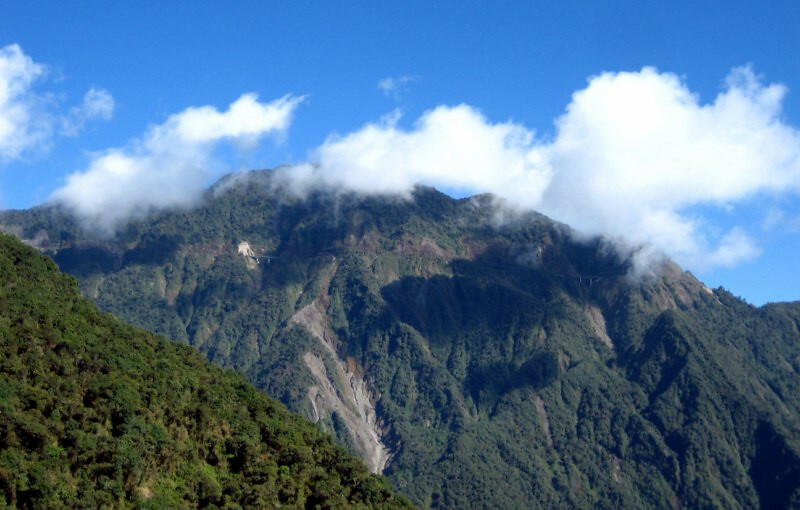 Taking a break for some lunch and looking back at the wet Yungas. Oscar and his wife coming back from a weekend trip. All suited up for dusty riding conditions and I told them about the mud ahead. It was easy dirt riding that afternoon and towards the end of the day, I saw this Mitsubishi Pajero come barreling down the road and in front of me, his left wheels got caught in the trough by the edge of the road and it spun him violently across the road into this ditch against some trees. The guy climbed out and said he was fine. The dust hadn’t even settled yet when I took this picture. Crazy drivers. 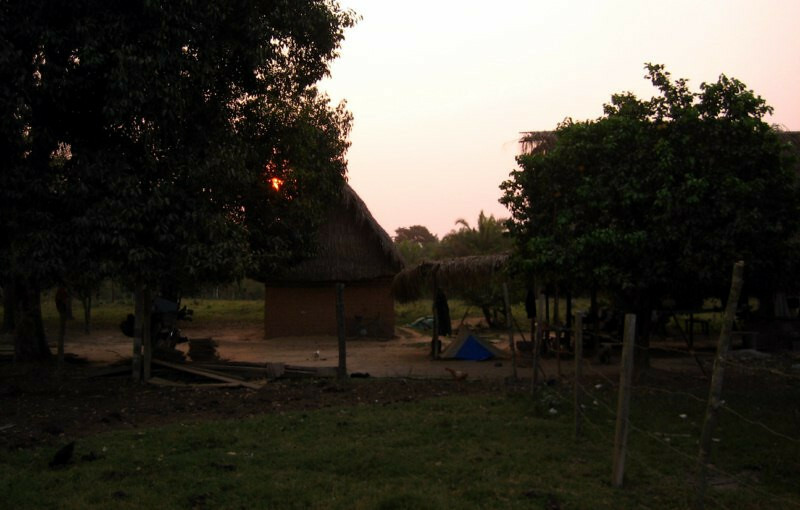 I did about 170 kms (106 mi) today from Caranavi and with the light fading, I asked a lady with a small shop in this building if I could camp here for the night. She said no problem and I had some water access. It was breezy and elevation was about 800 m (2,600 ft). 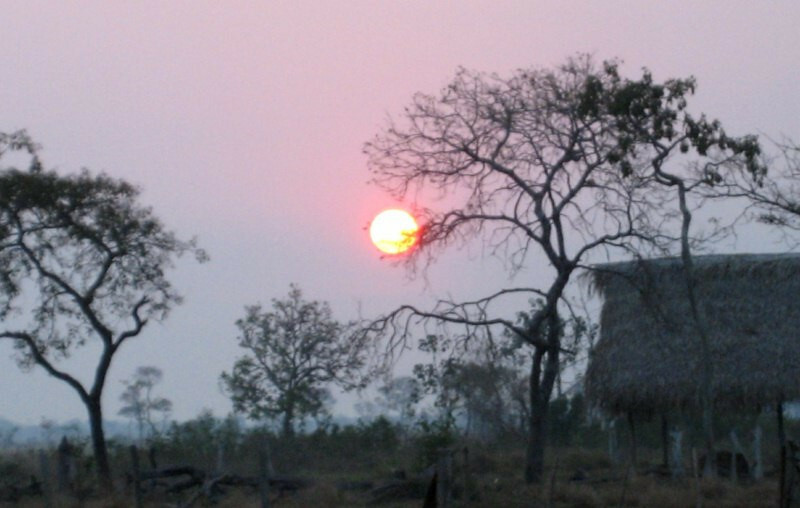 Sunset over the eastern forests of Bolivia. The young lady running the small convenience store and her crazy uncle were intrigued as I setup my kitchen to prepare some dinner. 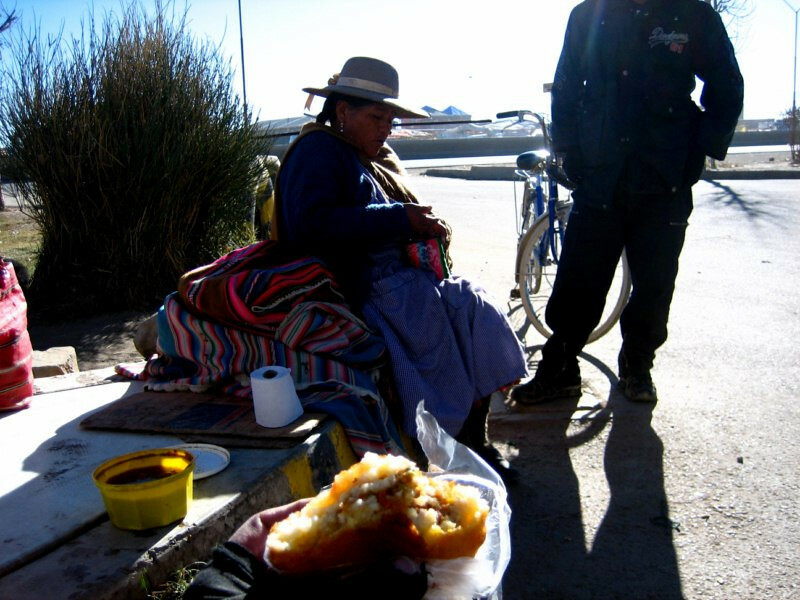 I was carrying lentils and quinoa from Lima and I bought a few eggs from her. 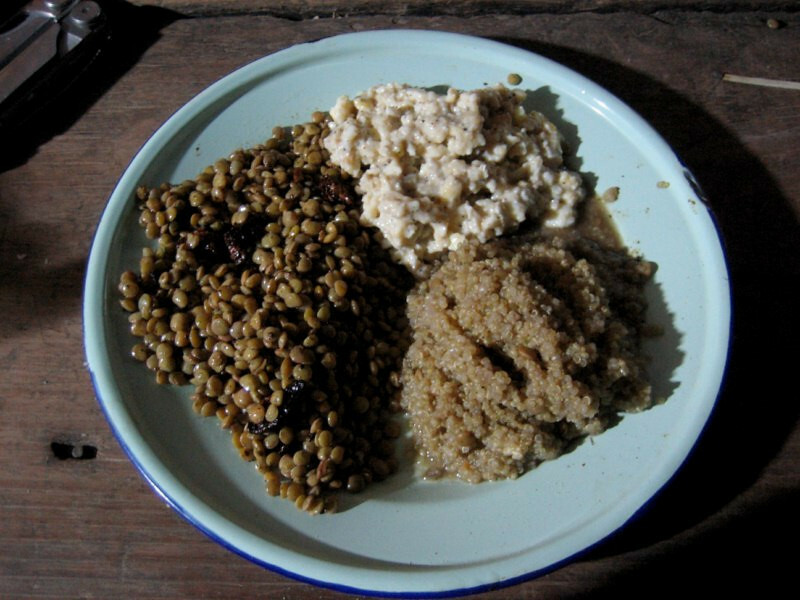 A pretty good high-quality protein meal of lentils with quinoa and scrambled eggs, sprinkled with some Indian spices. Continuing to drop elevation the next day as I pushed towards Rurrenabaque. 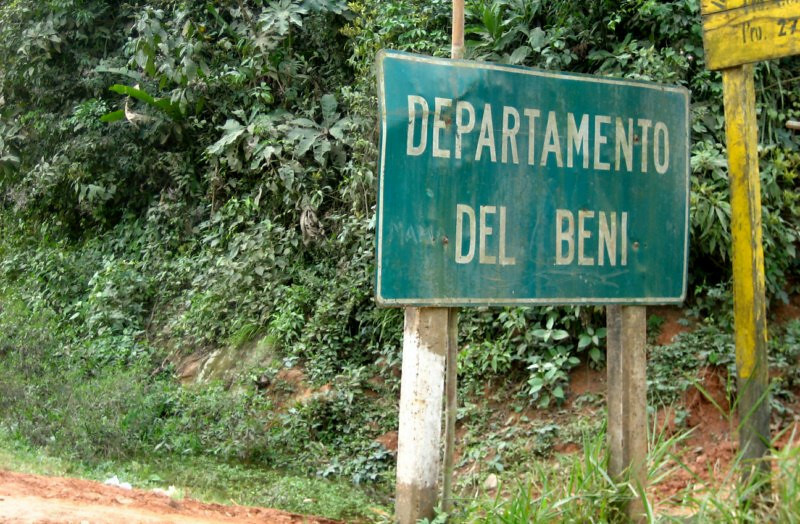 Entering the remote northern state of Beni. The road was in better condition with some stretches of asphalt even. 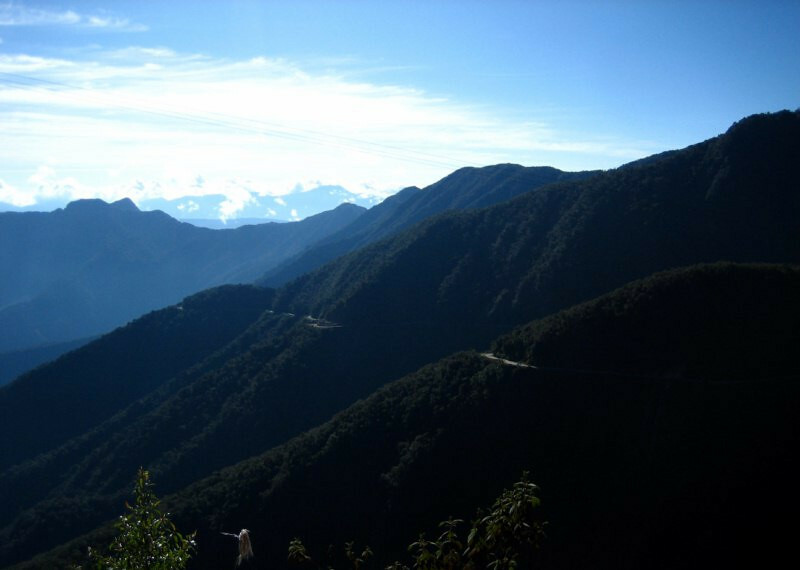 The end of the Andes. 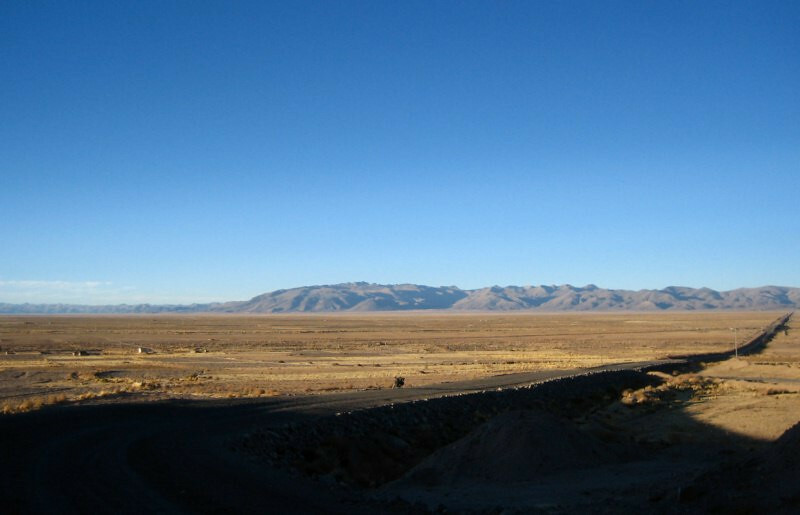 The foothills end and the flat terrain starts. 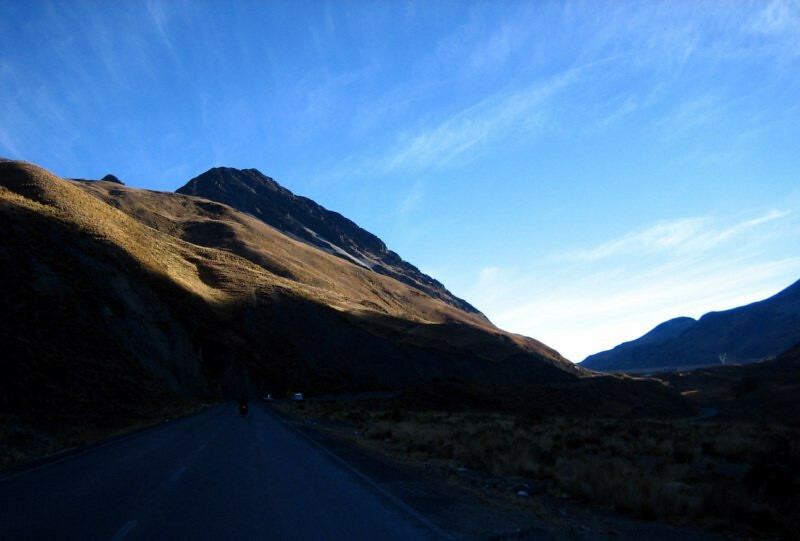 I’ve enjoyed these past months roaming around the majestic Andes and look forward to coming back soon. 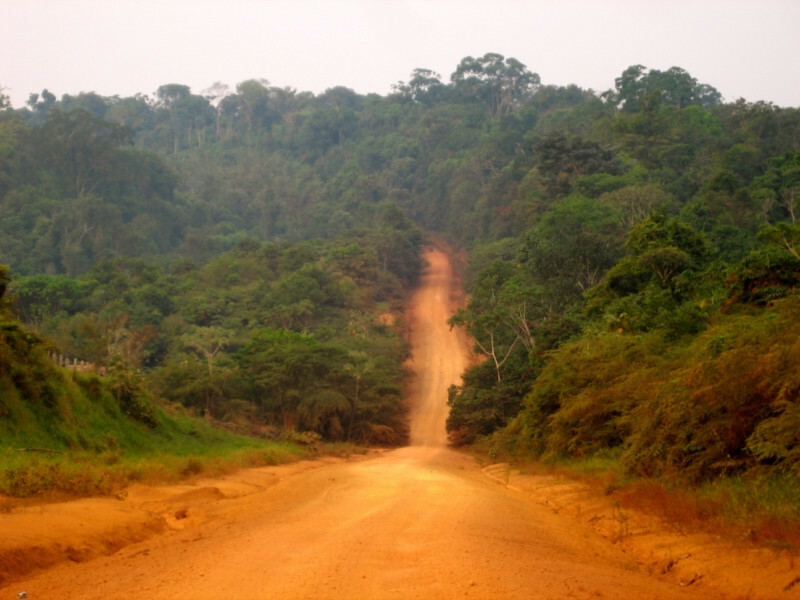 The Amazon lies ahead. 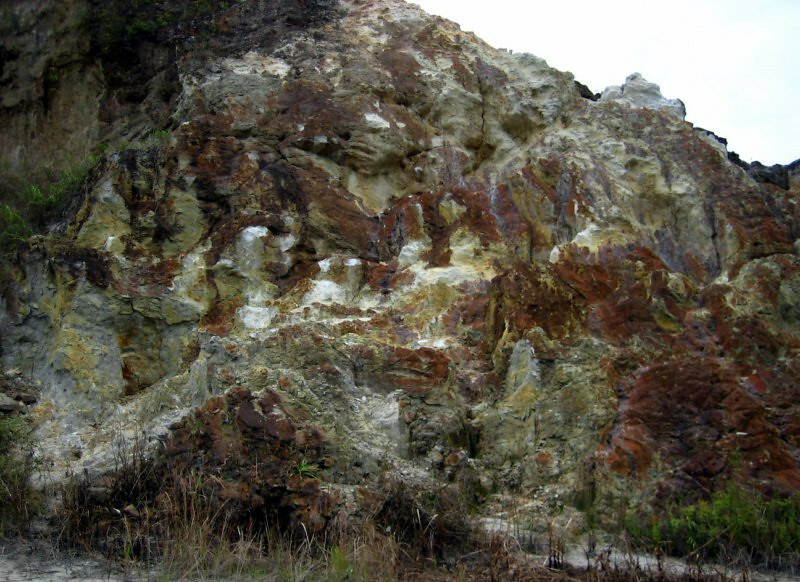 Colorful rock formation as the road touched down onto the flats. Remove the hills and you get a wide, straight road. It was now getting hot for the first time in three months and time to remove my liners that I put in around southern Colombia. 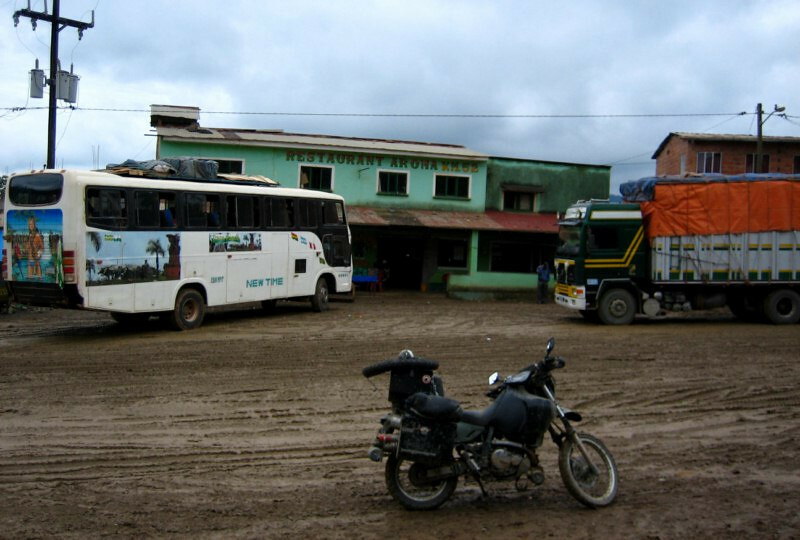 Arriving at the halfway point between La Paz and the Brazilian border at Rurrenabaque, a tourist town geared towards jungle and river boat trips. I didn’t intend to stay in town but as I rolled into the gas station on reserve, the attendant told me they had no petrol and he was the only gas station for around 50-100 kms (31-62 mi). I rode around town trying to find gas but no one was selling. He said the fuel convoy broke down in Caranavi and then later said they were being held up by road blocks. I figured I was going to be here for a while, waiting on petrol to arrive. At least the setting was quite nice. 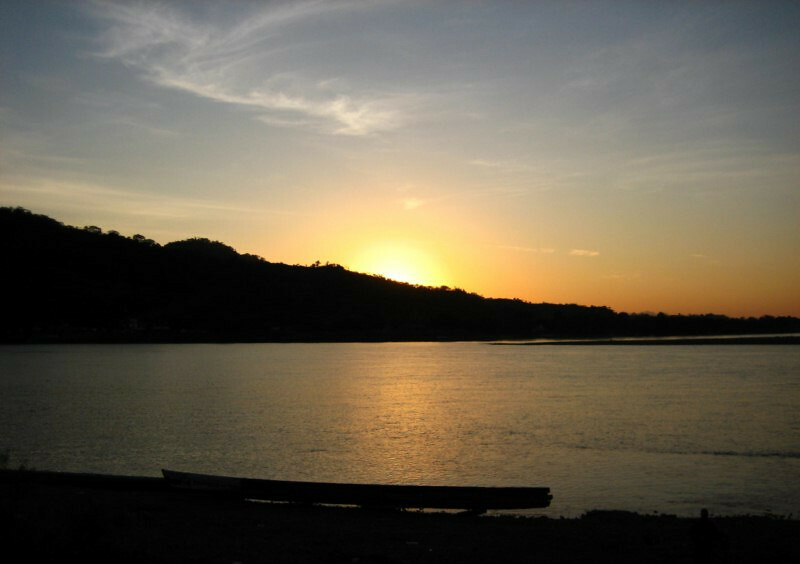 Watching a sunset over the Rio Beni. 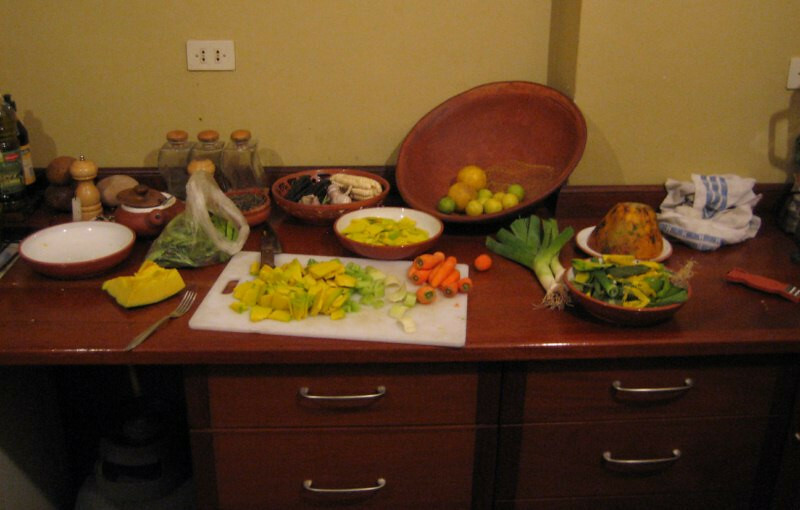 Still in ‘expedition mode,’ I cooked in my hotel room. Preparing some pasta with tomato and tuna sauce. 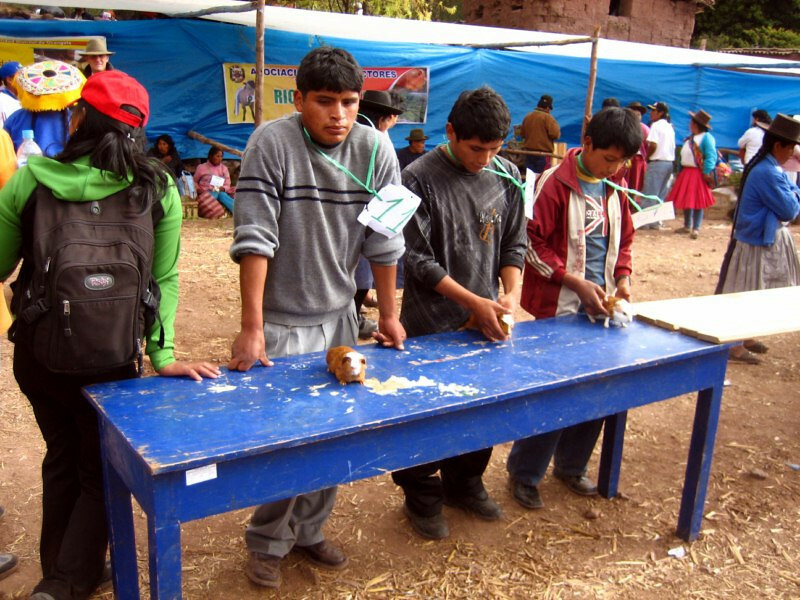 Bolivian independence day celebrations in the streets of Rurrenabaque. 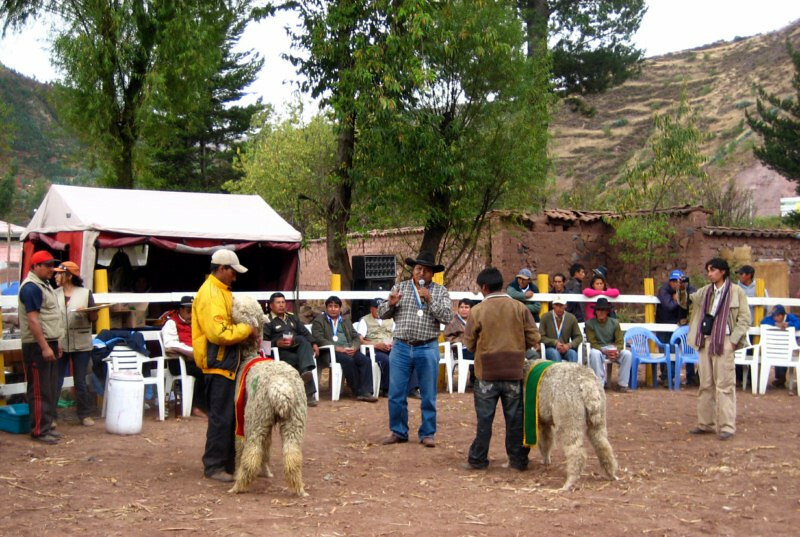 The different colors represent the colors of the Bolivian flag. 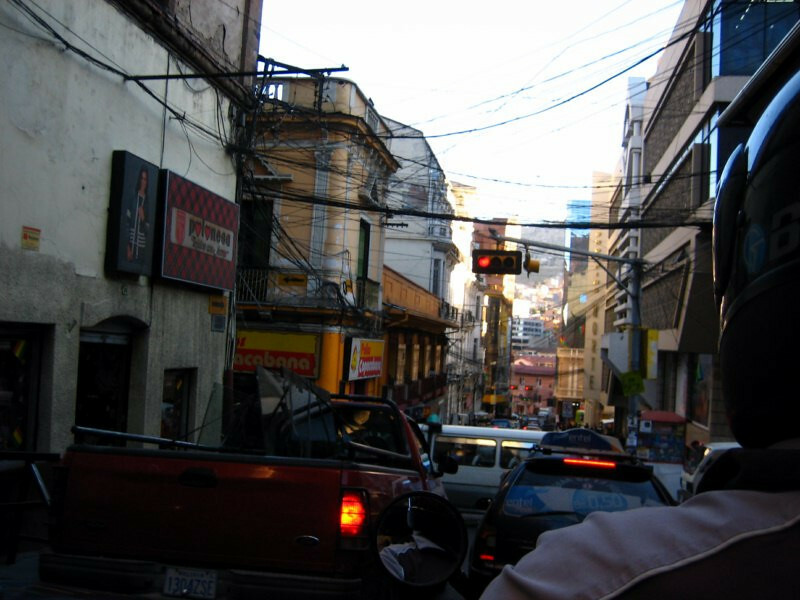 I walked around town, mainly to the food market and spent the downtime learning Portuguese for the upcoming crossing into Brazil. 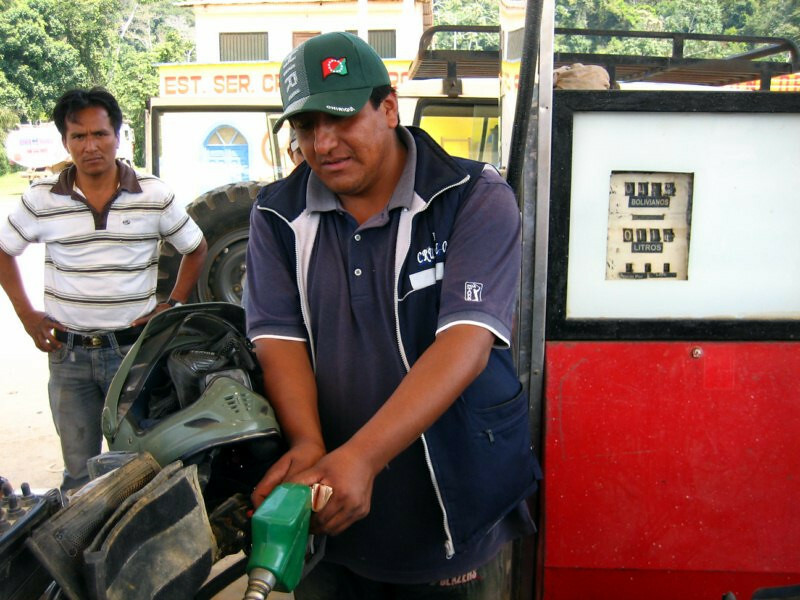 I managed to get a hold of 2 liters of petrol (0.53 gal) for 10 Bolivianos, about 1.25 times the regular price. 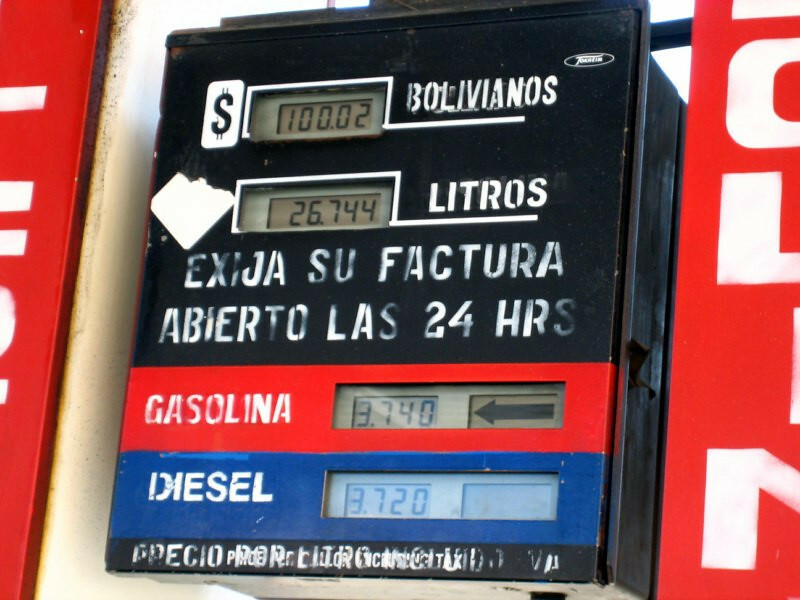 As the days passed, the price for bootleg gasoline kept rising and I was debating whether to bite the bullet and buy 40 liters at now 4 times the regular price at 15 Bol/liter ($8/gal) or keep waiting for the fuel trucks to arrive. As I decided to buy the petrol at whatever price it was, my contact I developed at a local tour agency (where they horde thousands of liters of gasoline to ensure business stability), didn’t follow through. But luckily, on the fourth day, the fuel convoy arrived and everyone in town rushed out to the gas station to queue in lines to fill up their 2-wheelers, cars and spare barrels. It was slow moving and I was in line for about four hours. There was only one pump and the attendant alternated between filling up cars, barrels and the bikes. The moto taxi riders were the most vocal and demanding, but it was generally a jovial atmosphere. 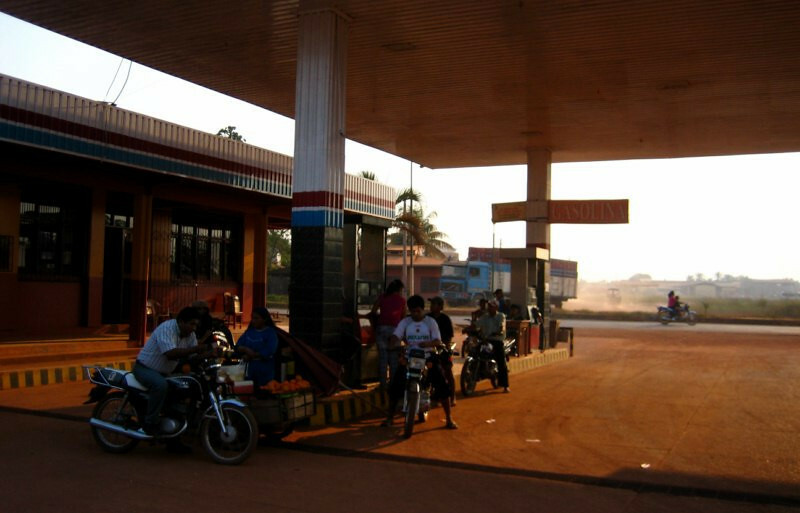 The attendant said there was no rush since three fuel trucks had arrived and there would be plenty of petrol for everyone. He encouraged people to come back in the afternoon to disperse the crowd, but no one was going anywhere until they got a fill up. Those three trucks probably didn’t last till the afternoon. Everyone gathered around to see how many liters my giant tank would hold and with those 2 liters that I dumped in earlier, it swallowed another 39 liters (10.3 gal). And luckily at the regular price of $2/gal. 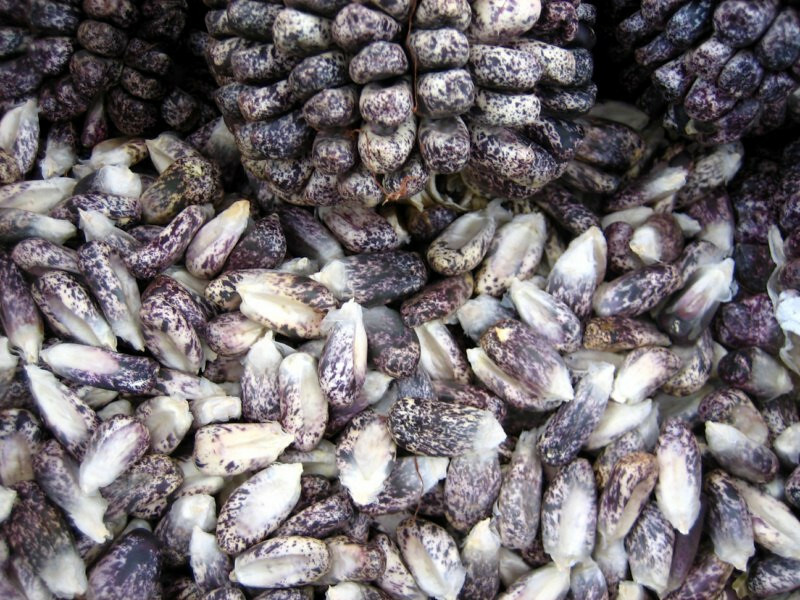 Only when it’s scarce, do you really get a feel of how much our lives depend on this black gold from prehistoric plants that runs our current world. Hopefully it won’t take more severe scarcity for us to realize the finite amount of natural resources on this planet. 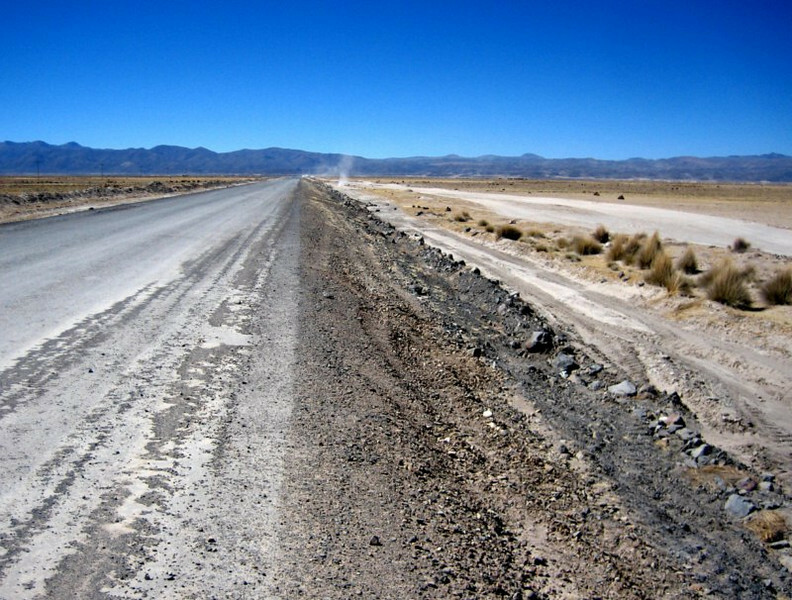 From La Paz, I headed south towards the Salar de Uyuni. 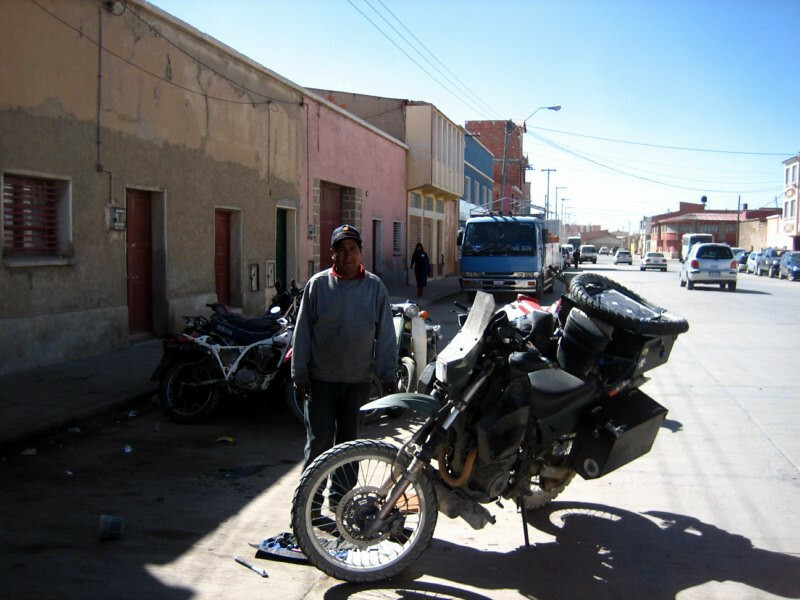 A mechanical breakdown meant I had to return to La Paz to fix the bike. Filling up the tank on the outskirts of the city. 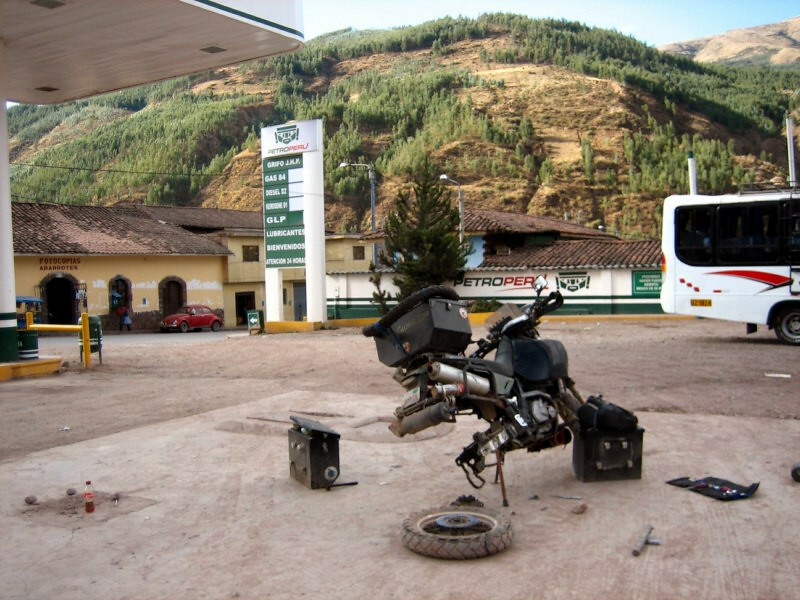 The price of gasoline is fixed all throughout Bolivia and there’s only one grade, I think it’s close to an 86 octane. 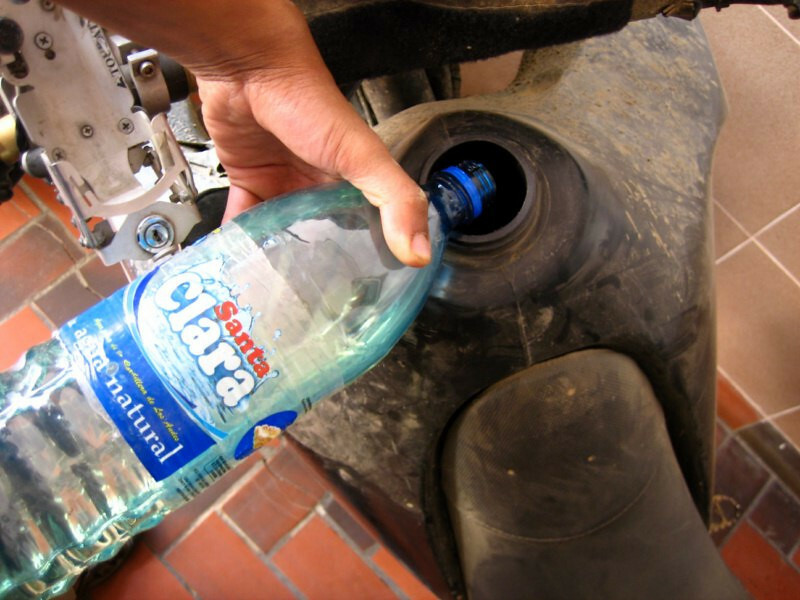 Bol 3.74 / liter = $2/gal, half the price it is from Peru. 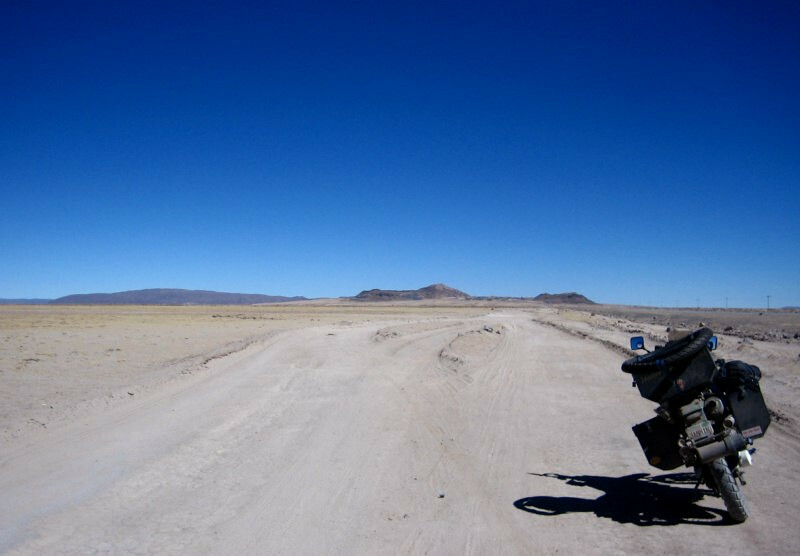 Heading out on the flat altiplano at around 4,000 m (13,120 ft). Sherlock Holmes and Ferrari(?) 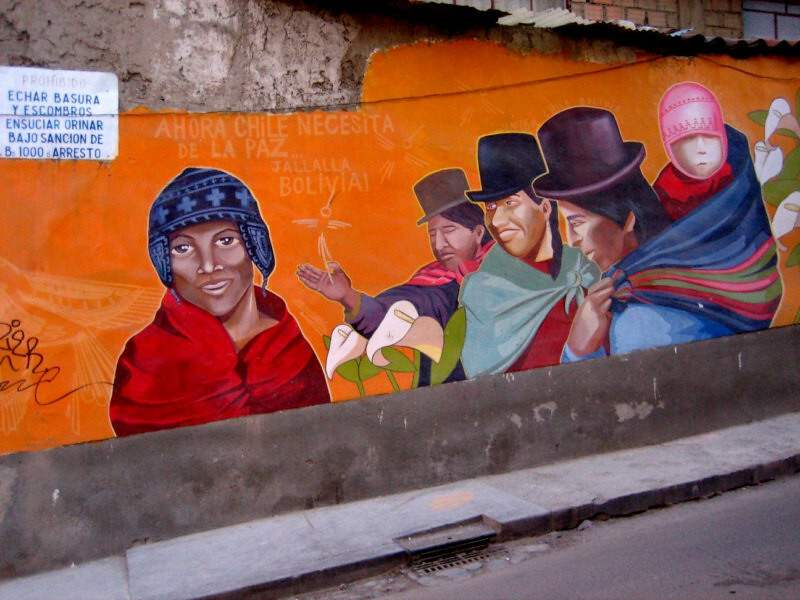 welcoming you to Oruro, a city known for its carnival celebrations. 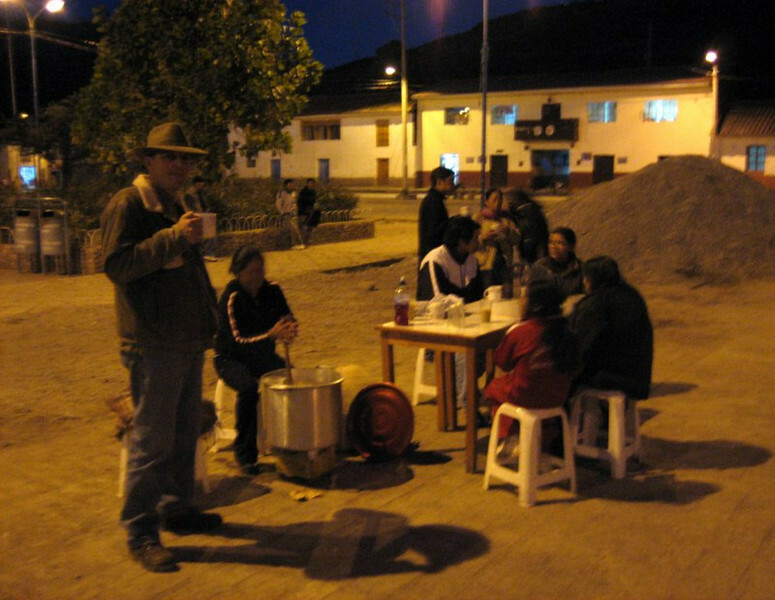 After finding a small hotel, a residencial for 25 Bolivianos with parking, I walked around seeking out a place to eat and where ever there’s a crowd of locals around some pots of food, it’s gotta be good eats. It was a mother-daughter team working rapidly to serve out their food and people were waiting patiently in line for their dinner. 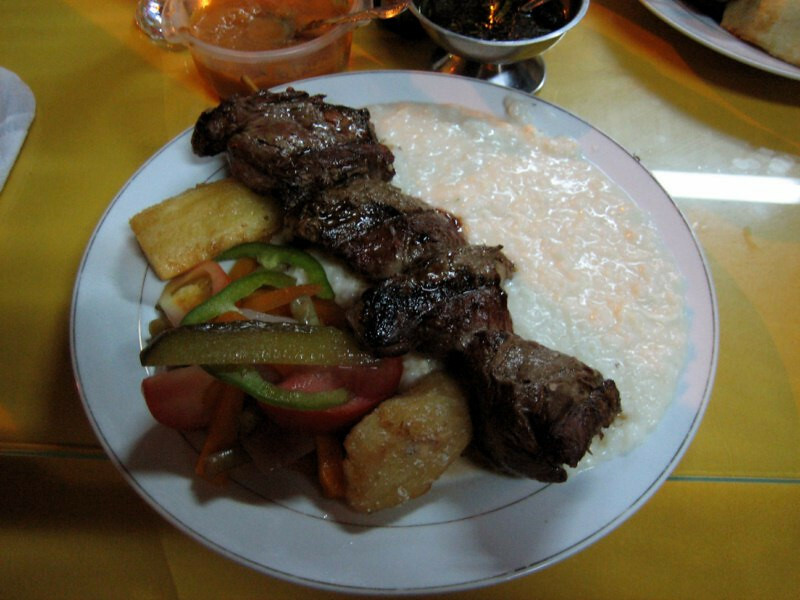 Menu was rice, a potato, some chuno (freeze-dried potato of the Andes) and a meat choice of chicken or lamb (cordero). I went for the lamb. And topped with some onion and tomato salad. 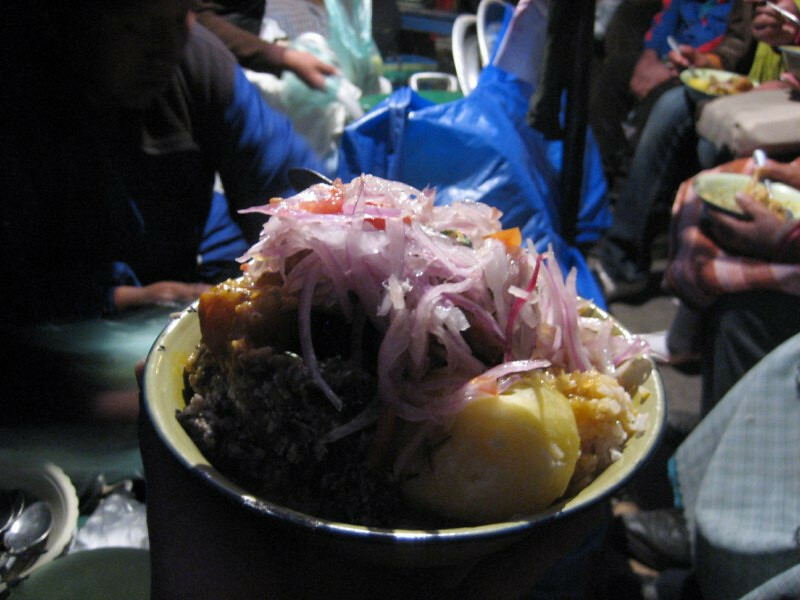 All for 12 Bolivianos ($1.75). 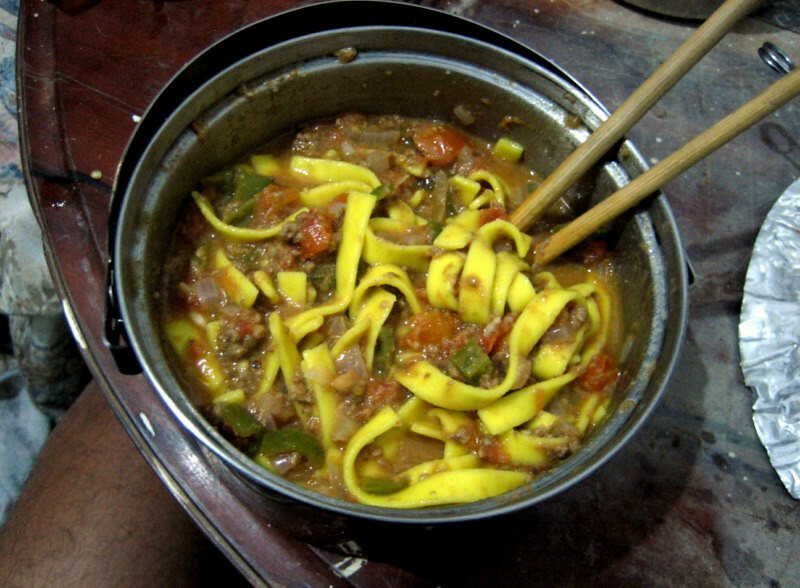 After you empty your bowl, you can get some thin pasta soup for the chilly night. The people welcomed me to sit and dine with them, recognizing I was a stranger when I started taking photos. A busy street near the center where there were numerous juice bars serving up protein shakes. The cakes looked real appetizing but they were in the open air at an intersection and I already consume enough carbon monoxide while riding, so I passed. 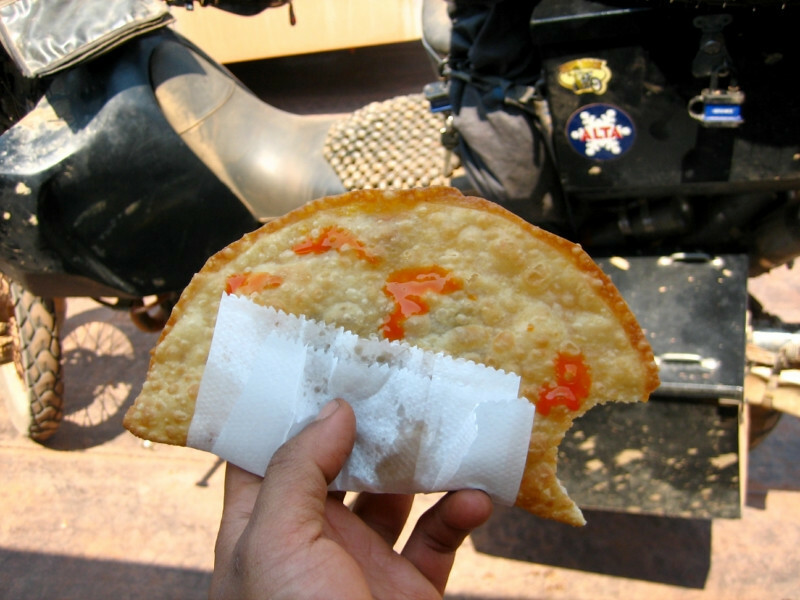 Taking off the next morning and grabbing some quick breakfast at a gas station of an empanada with eggs and some veggies. 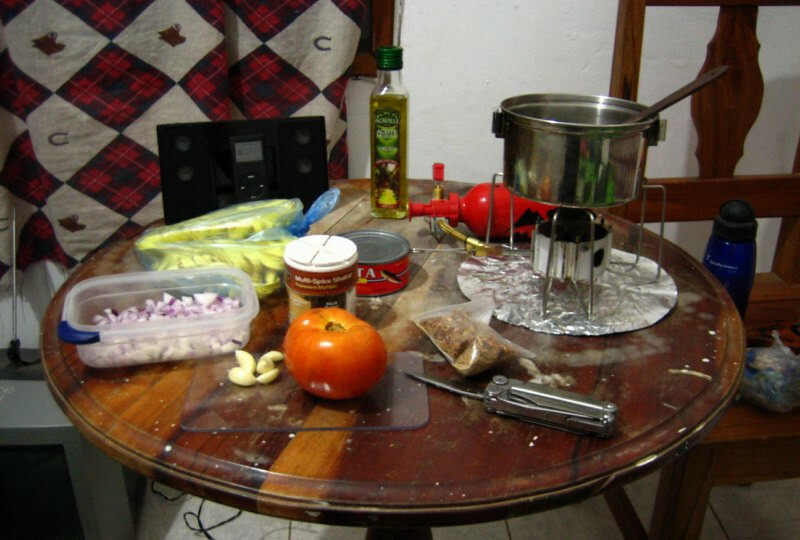 And homemade hot sauce is always around in Bolivia and it’s good. Note the plastic bag that the empanada is served in. In general, I feel people serving food have a good sense of hygiene here. 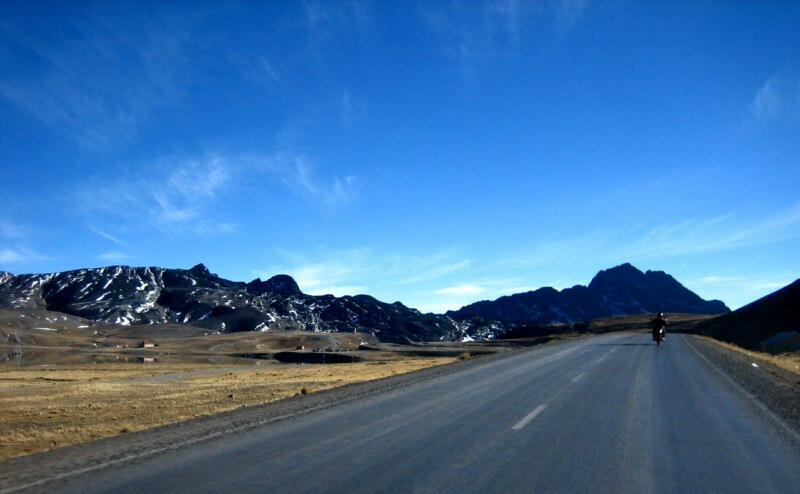 South of Oruro, heading towards the Salar. The mountains on the left grind down to the flat plains on the right. Distance board. 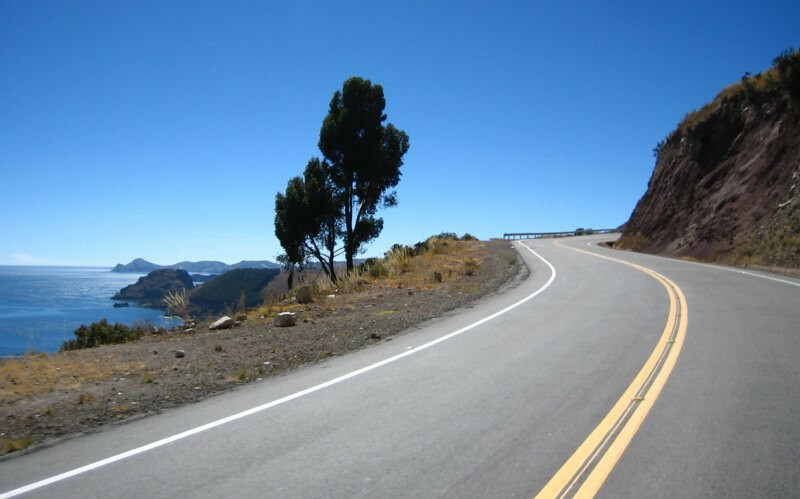 The pavement ends just outside Huari. I wasn’t going to Uyuni directly. 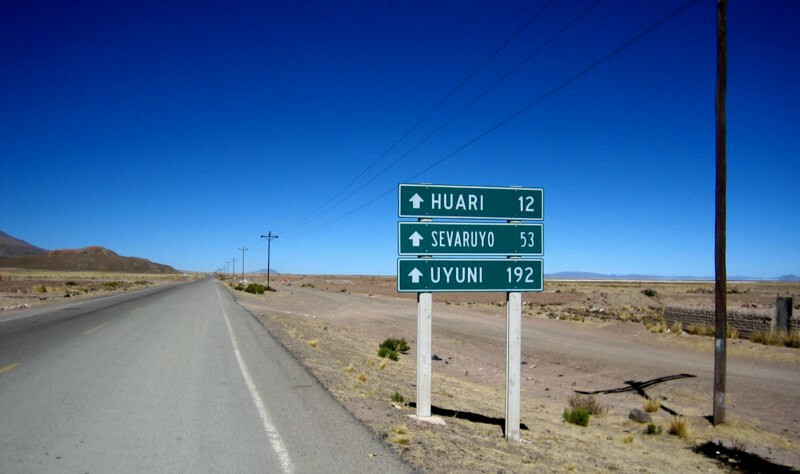 On a turn-off, heading west to the town of Jirira, where I planned to enter the salt plain and ride across the salar to Uyuni. 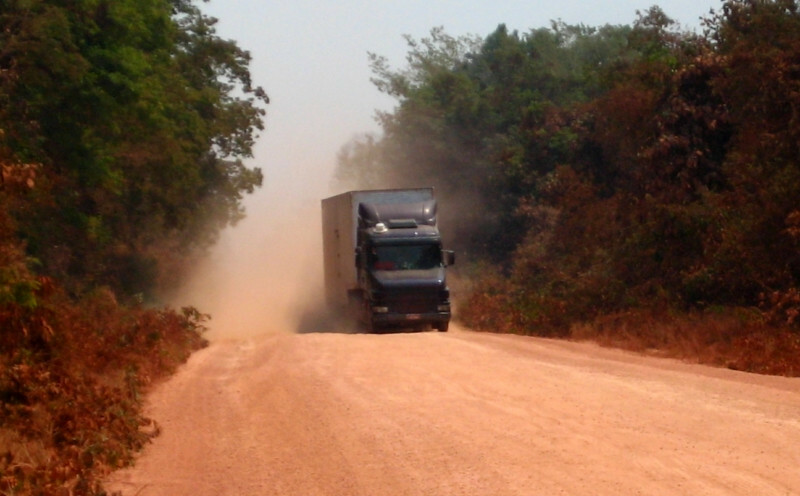 This road was being paved but it wasn’t open yet and there was a wide sandy track instead. After seeing a local biker buzzing by on the new pavement, sneaking through the barriers, I figured I could easily climb this sandy embankment to get up to the asphalt. 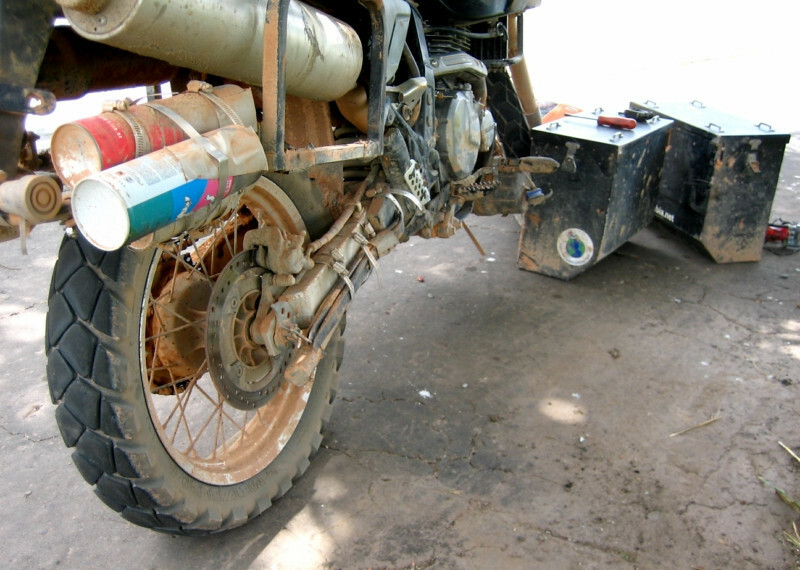 But my rear tire sunk in some soft sand and I gave it too much throttle, which ended up burning a fibre plate in my clutch (heavy rear weight and touring tire – no match for the sand). I managed to climb up the embankment and then realized I couldn’t go faster than 32 kph (20 mph); the engine spinning freely as the clutch wouldn’t engage past slow speeds. 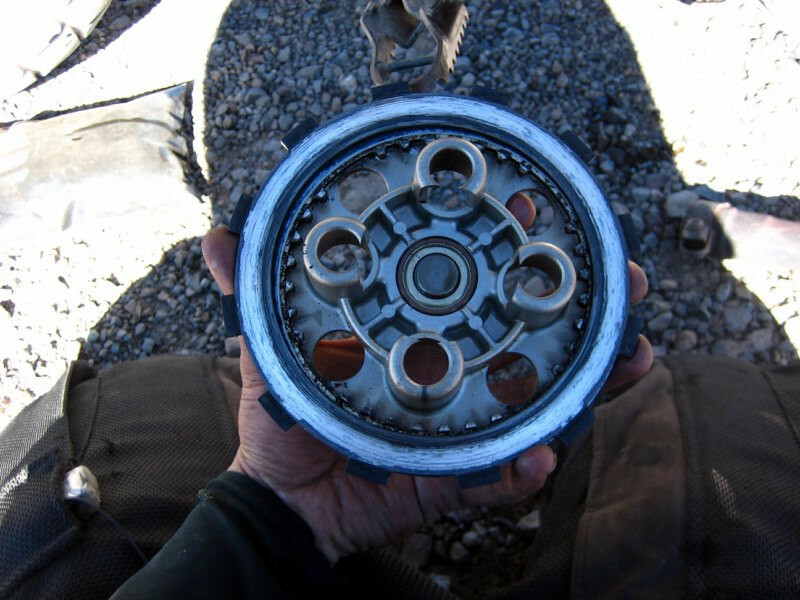 Burnt clutch in the middle of nowhere at 3,600 m (11,800 ft). 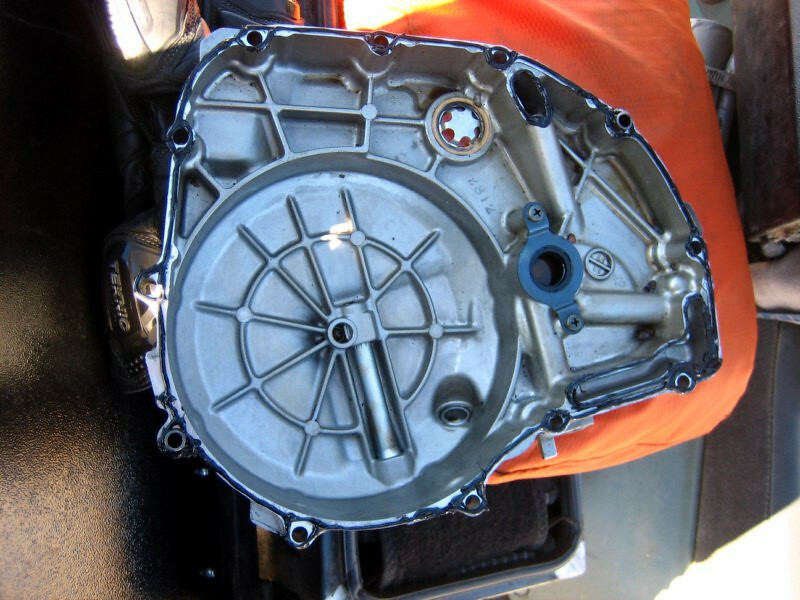 This engine had 36,800 kms (23,000 mi) at this point. At least I had all the necessary tools to go into the engine and diagnose the problem. The fibre on the first disc was completely disintegrated (it’s supposed to look like the disc behind it). Storing the oil from the engine in two zip lock bags as I had to reuse the oil, not carrying enough fresh oil and besides, couldn’t really dump it just on the road. It had fibre bits of the ruined clutch all through it, but what to do. My Scotts stainless steel reusable oil filter catching bits of the disintegrated fibre from the clutch. 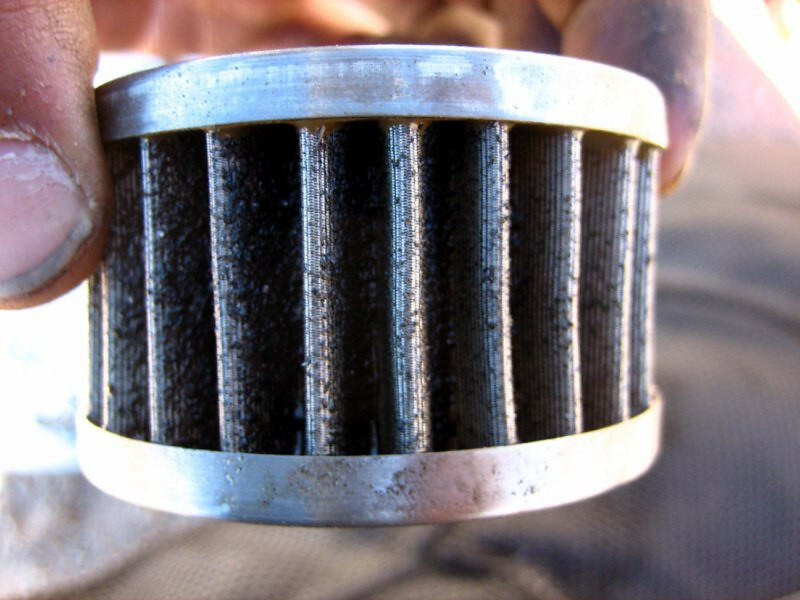 I used some carb cleaner that I have strapped on the bike to clean the filter. I had only ruined one disc, so I thought I could remove that bad one and use washers to exert the needed pressure for the clutch to engage properly. 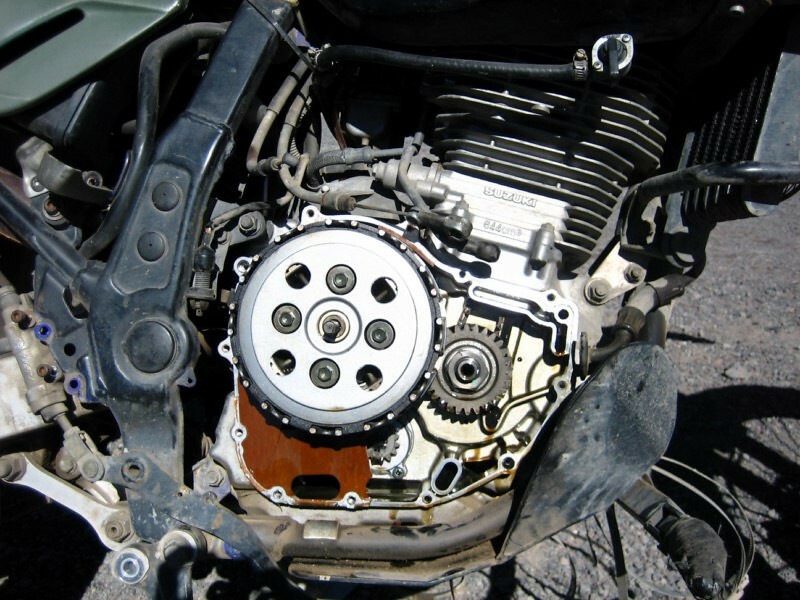 The clutch cover has probably never been open before, so the brittle paper gasket broke in many places. I spent about an hour cleaning the cover and then applying RTV silicone to act as a gasket and it worked great, with no oil leaks. A touring bicyclist that I passed earlier in the day finally caught up with me. 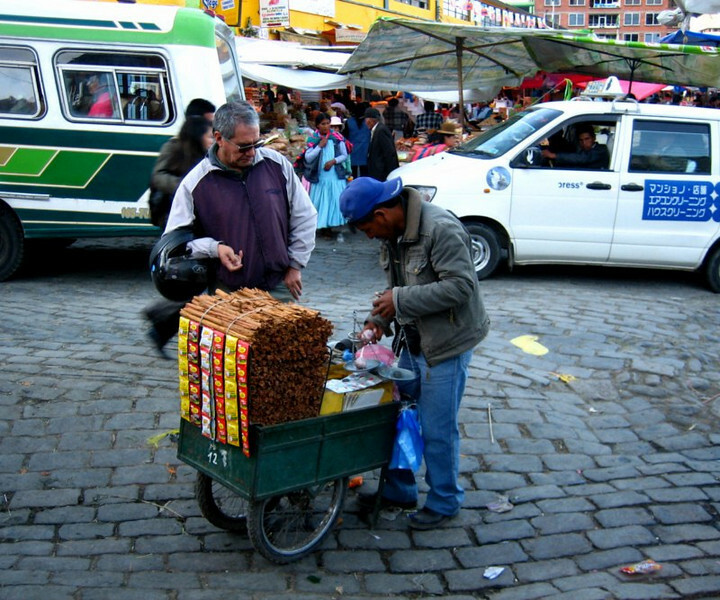 Kevin here is a German-Bolivian and began his trip in Mexico city in late 2008. He stopped and gave me company for a while. 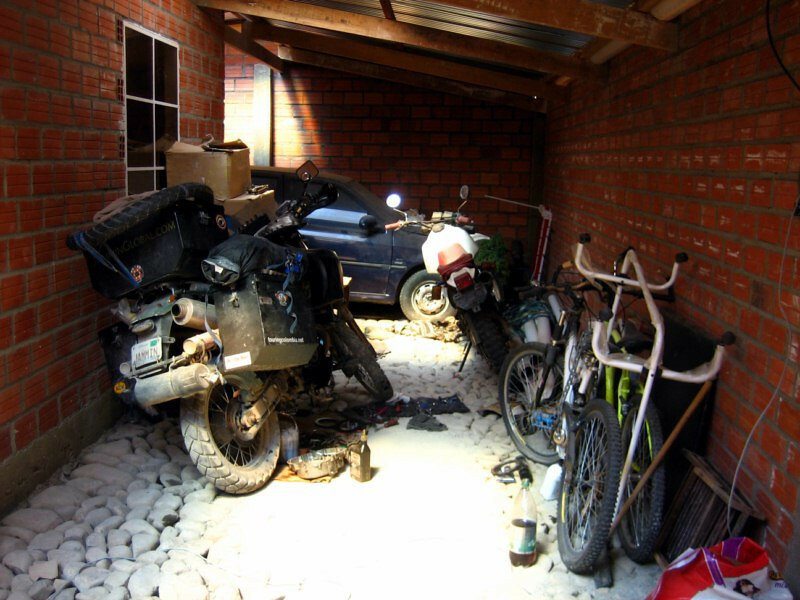 He was a quantum physics researcher in Berlin before deciding to sell off everything to do his dream ride ([URL=”http://urupica.de”]urupica.de[/URL]). 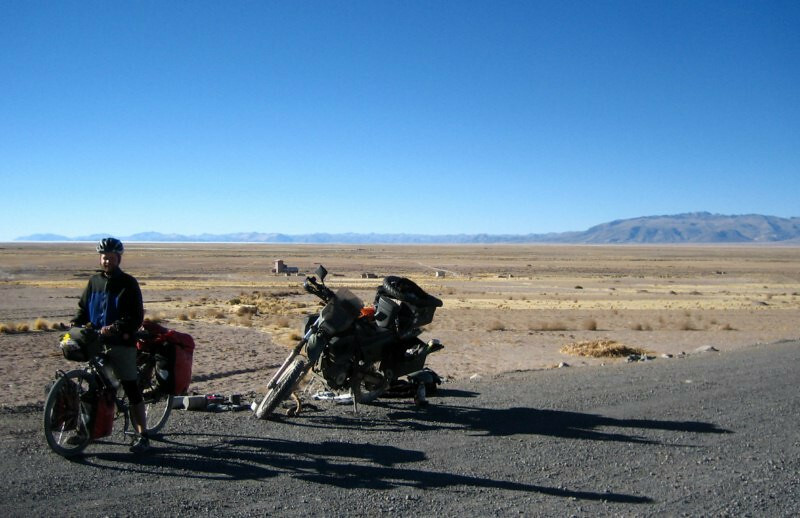 He planned to spend a week riding around the salar, carrying all his provisions and the crazy thing was that he was sleeping outside and this is winter, where temperatures drop to around -20 C (-4 F) at night (my sleeping bag’s only good to 10 C (50 F)). And I always feel guilty when I pass these touring bicyclists creating their own locomotion while I sit on my seat and twist the throttle. Much respect. He told me I had about an hour of sunlight left and if the bike’s not working, I needed to find shelter for me and the bike. My idea of removing the burnt disc wasn’t good and I had no traction in the clutch. To get a sense for where I was, those mountains on the other side are about 15 kms (9 mi) away. 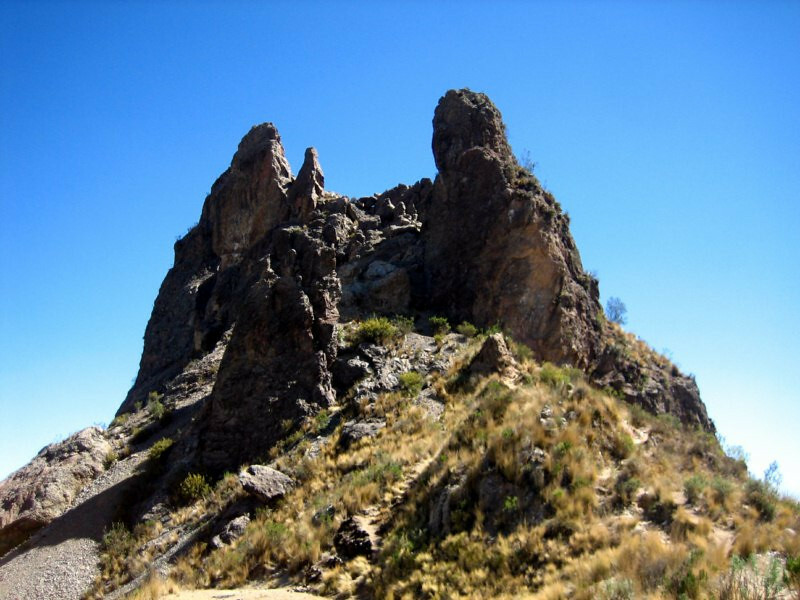 There was a small town at the top of this hill, Santuario de Quillacas. 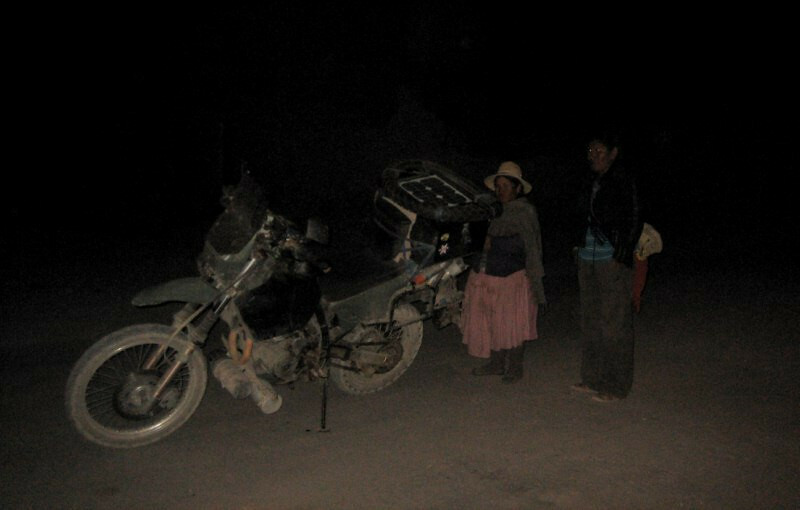 I walked into town and found a place to sleep for the night and then came back to roll the bike up the hill into safety. A few people stopped and told me it was not safe to leave the bike here overnight. 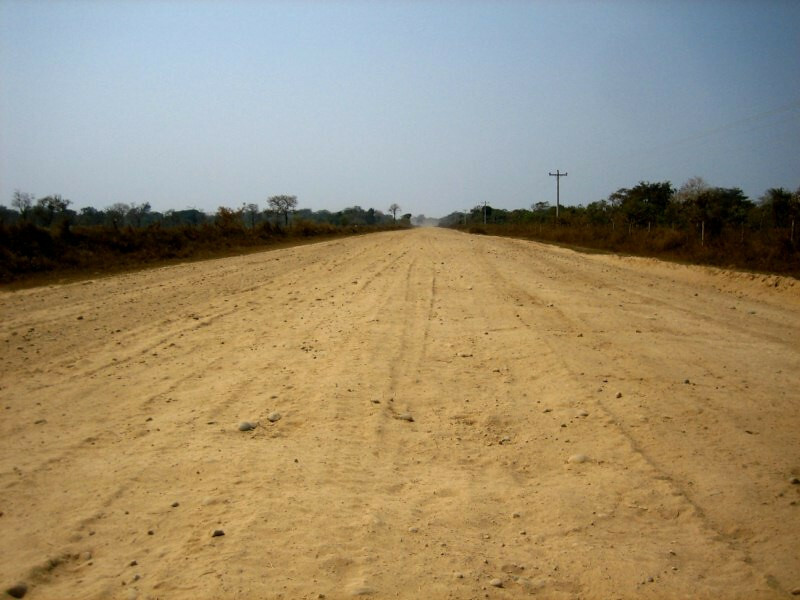 This road is used to smuggle cars illegally into Bolivia from Chile and bandits are rife at night. I was struggling to make any progress up the hill; gaining 2 meters and then huffing and puffing out of breath at this altitude. I figured I had to do it even if it took all night. Don’t worry, sanDRina baby, I got you covered. I filled up all 40 liters (10 gal) in the last town and thinking of how airplanes need to dump fuel before making an emergency landing, I decided to start dumping fuel to lighten the load that I had to push. Besides the environmental hazard, the flow rate was too low to make any difference. I would need an hour just to lose a few liters. But I kept pushing as the fuel drained. 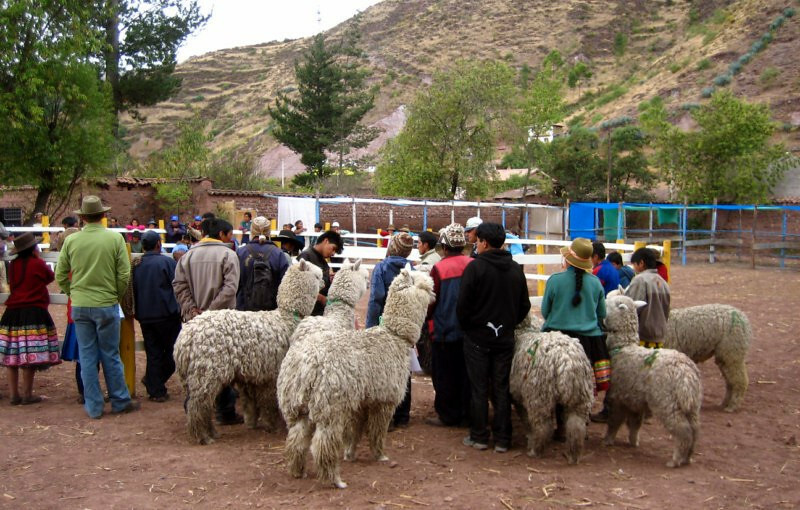 Luckily, a local quechua family was walking back into town after herding llamas during the day and they offered to help. The mother and daughter were quite strong and we made good progress up the hill. Gaining about 10 meters before a 5 minute break. And I didn’t need to waste any more fuel. 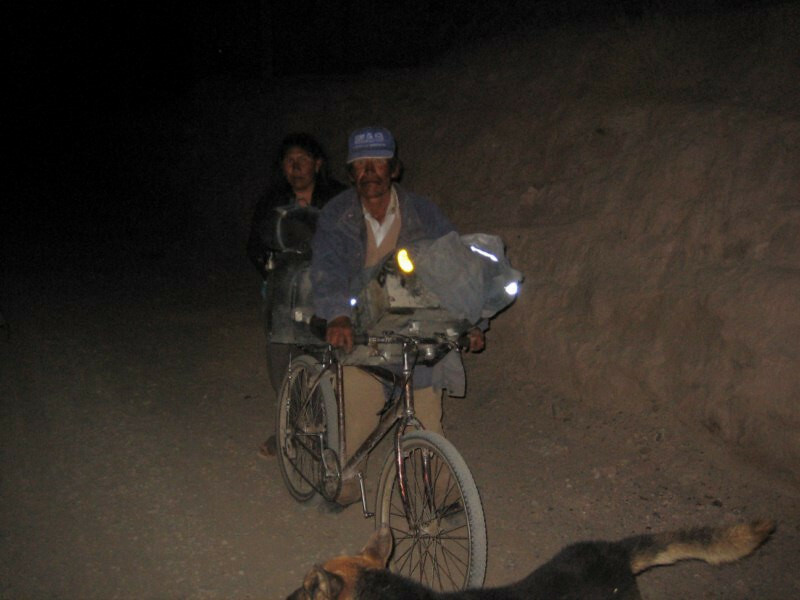 The father put my panniers on his bicycle and struggled up the hill with them. 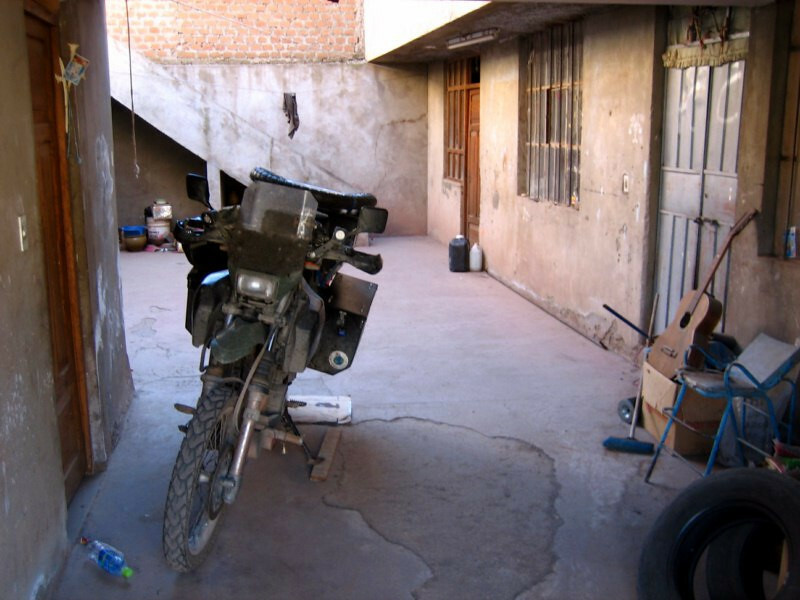 They took me to the local church, the santuario, since it had an enclosed place for safety of the bike. 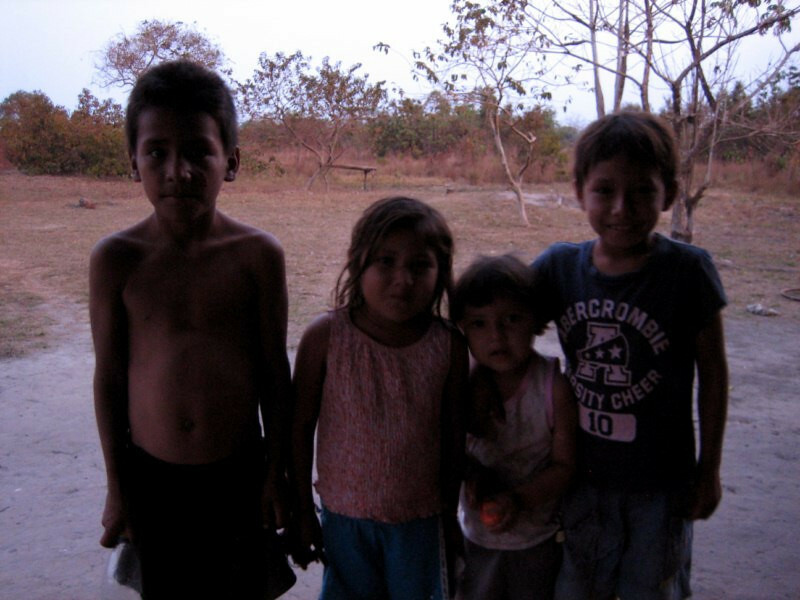 I thanked them for their generous help and they simply said “de nada” – think nothing of it. 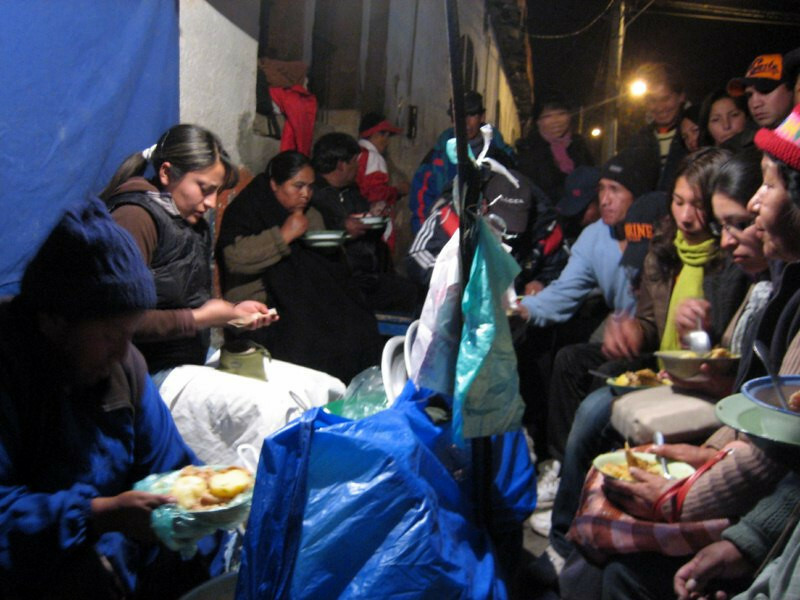 I got a bed with lots of warm blankets for 20 Bolivianos and they fed me some dinner for another 10. They had a long distance phone, so I rang up my mechanic in Chicago, Gus and asked his advice. The $5 phone call told me what I had to do to make it back. 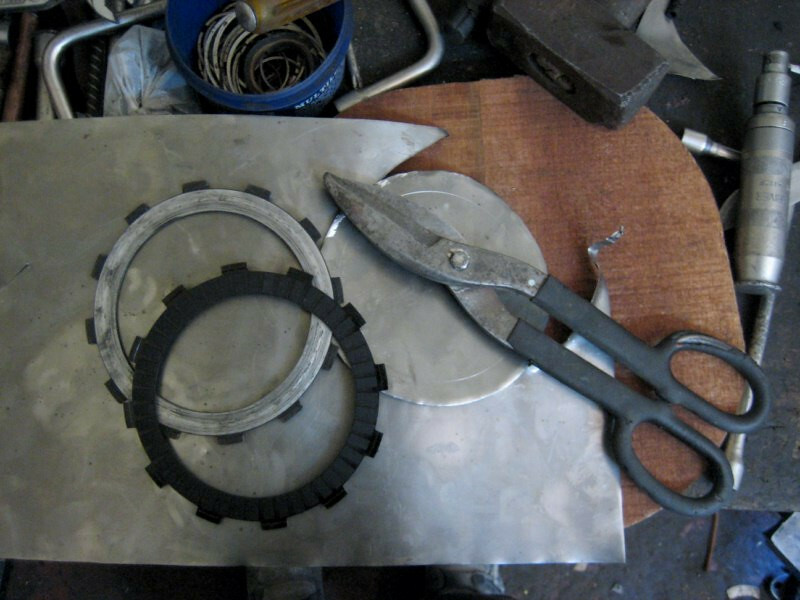 Gus suggested I cut some steel discs to make up the stack in the clutch to get some engagement. 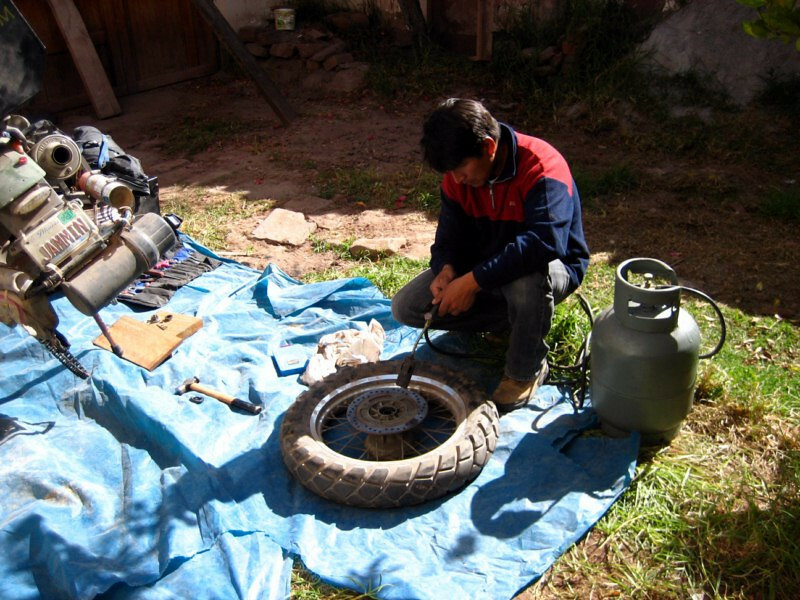 In the morning, I put the burnt disc back in and since the bike was rolling, I figured best to get back to a town where I could make some steel discs to get back to La Paz. 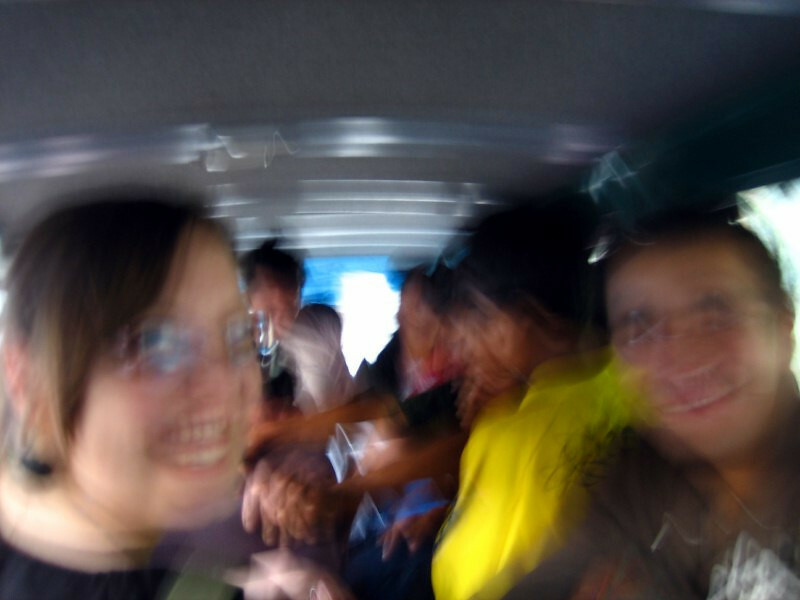 Rolling at 40 kph (25 mph) on the side of the road heading to Oruro. 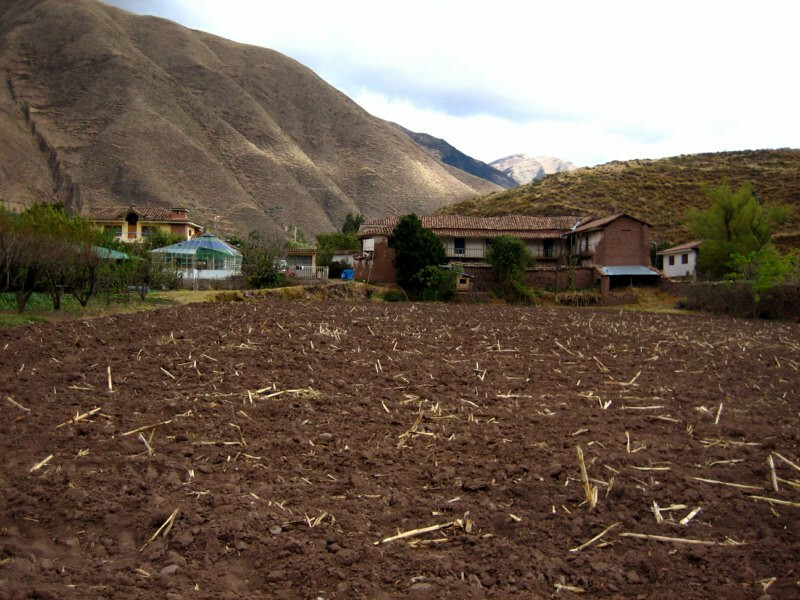 Luckily it was generally flat, thanks to the nature of the altiplano. It took all day and I made it just as darkness fell and the temperatures dropped. I found a residencial close to a mechanic and then when out on town to find some tasty dinner. 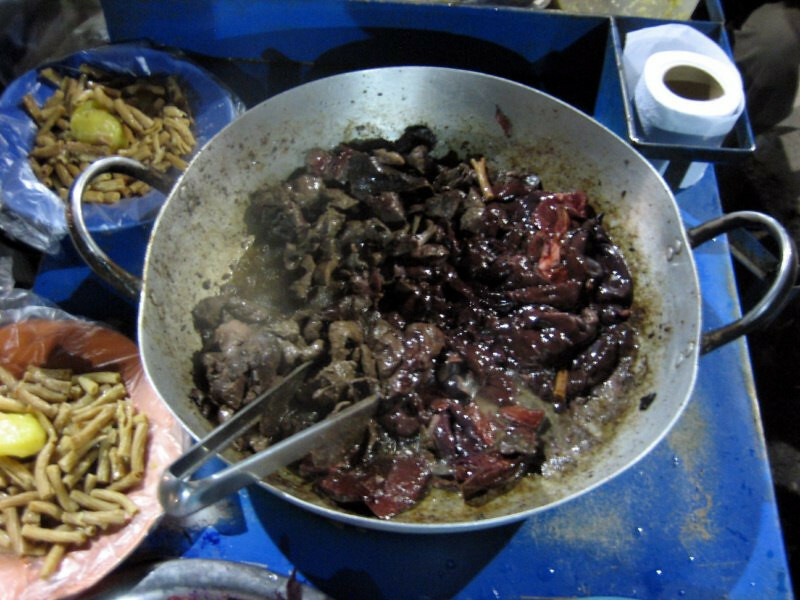 She’s frying up some lamb kidneys and livers. 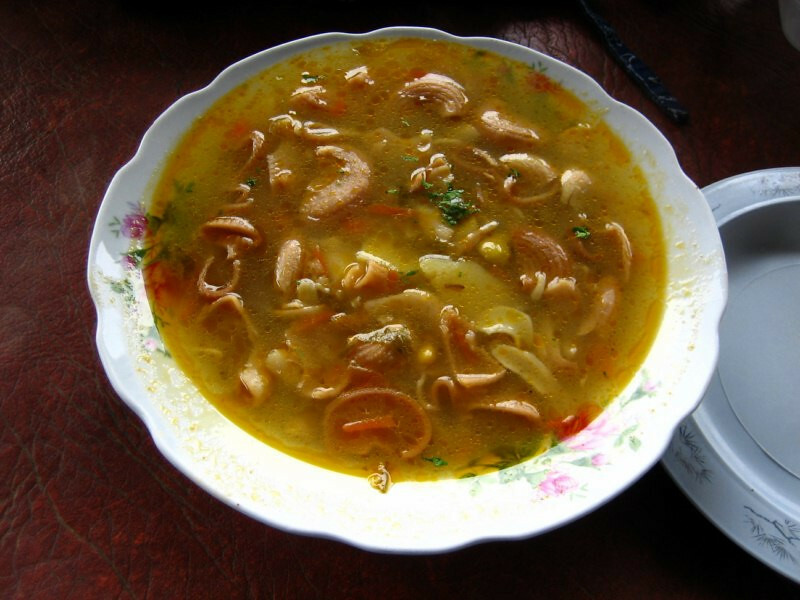 How about some high-quality proteins, loaded with vitamins and minerals. Only downside is high cholesterol. 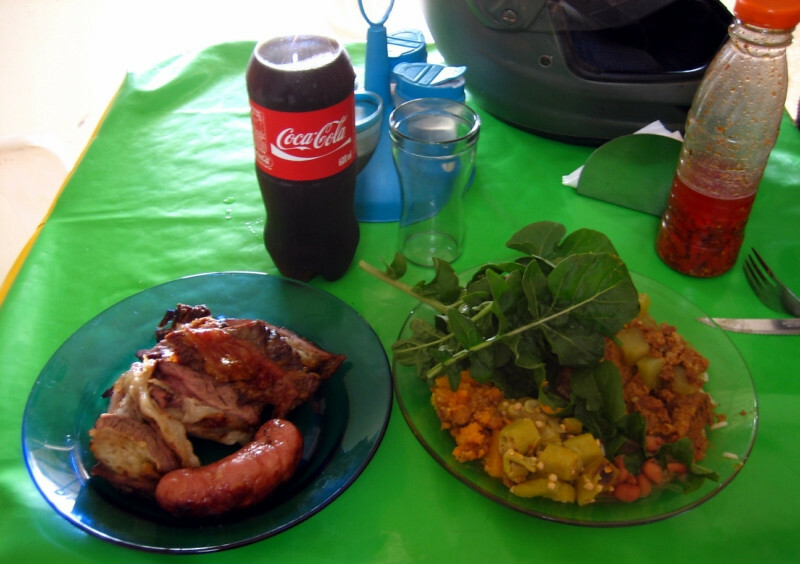 Nice, hearty meal for 5 Bolivianos ($0.71). The plastic covering on the plate ensuring clean food even if the plate hasn’t been cleaned properly. 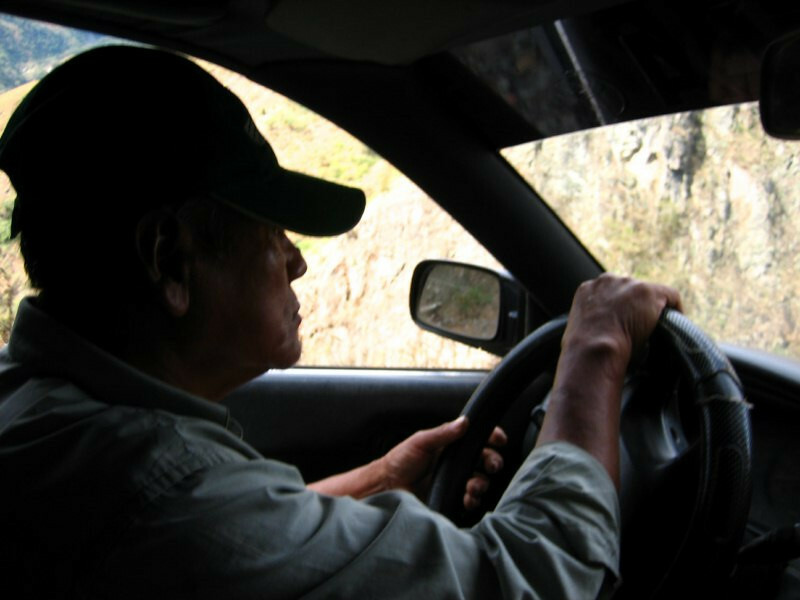 The next morning, Fernando here offered to help to get me back to La Paz. He got me some sheet metal and I set about sniping the discs. 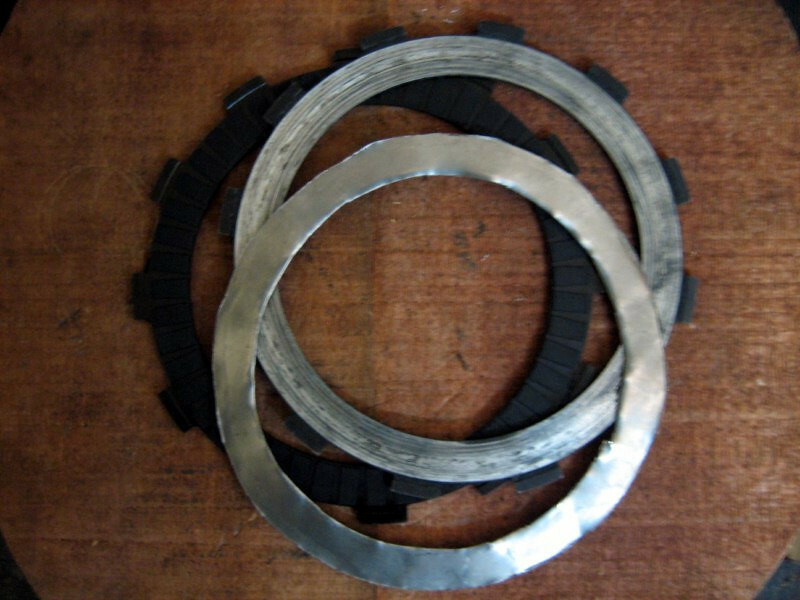 Took quite a while, but I managed to make two discs that would take up the stack of the ruined fibre. Fernando flattening them out to make them fit in the clutch basket. He didn’t accept any payment and said it was a pleasure to help a traveler out. 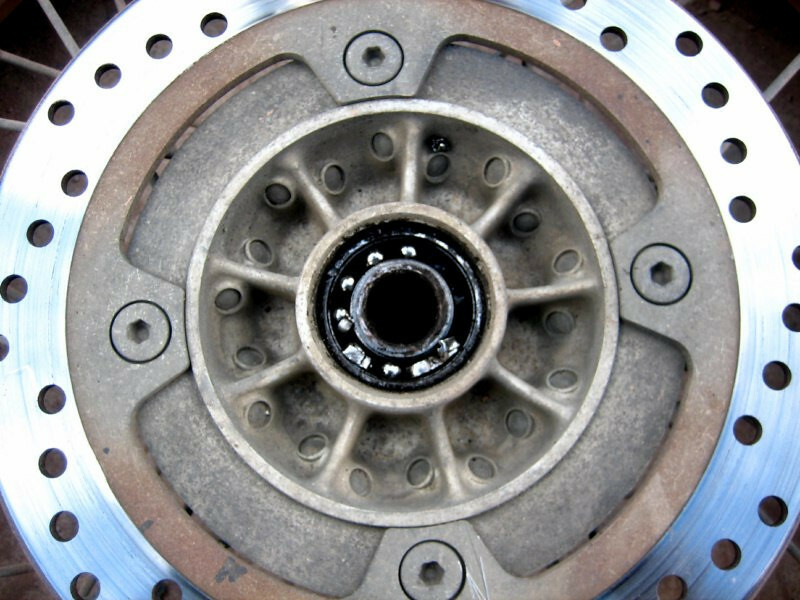 The steel discs worked great and I had full engagement of the clutch through all five gears and speeds up to 100 kph (62 mph). 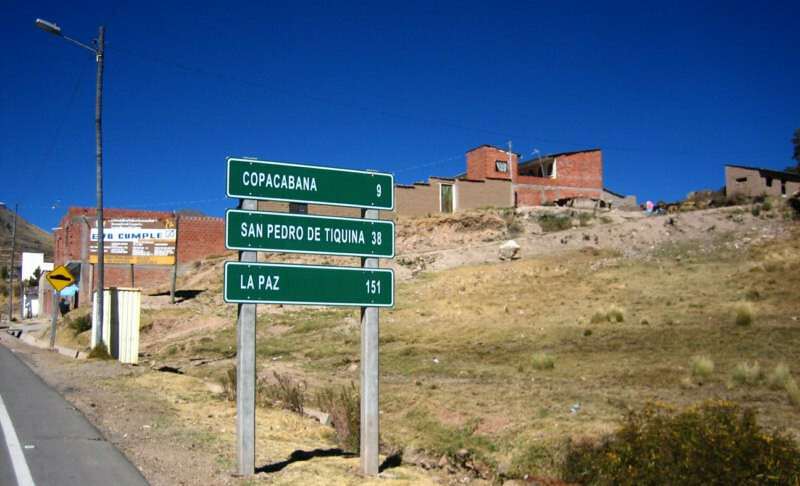 I had about 3 hours of sunlight left for the 200 kms (125 mi) to La Paz. I rode with utmost focus to make it back in time. 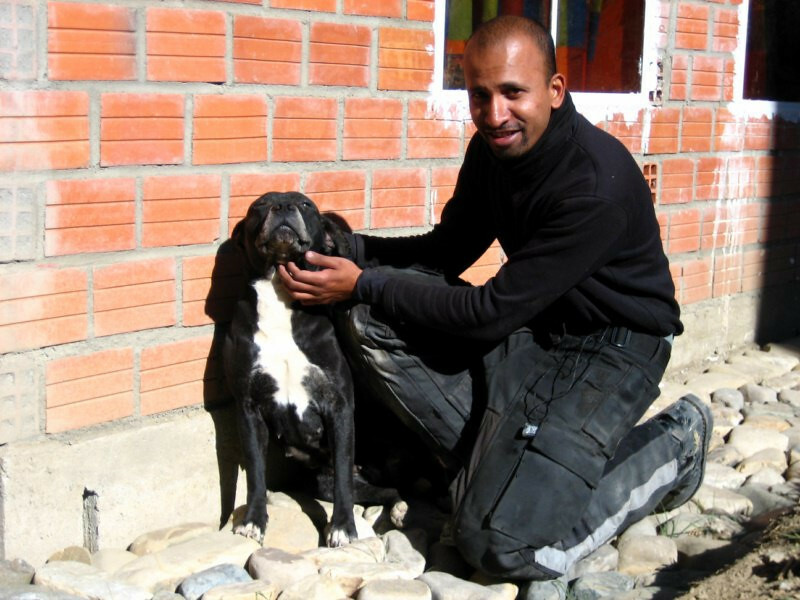 Safe again in Alfonso’s home in La Paz. I was happy to see the clutch still working along the steeps of the city. 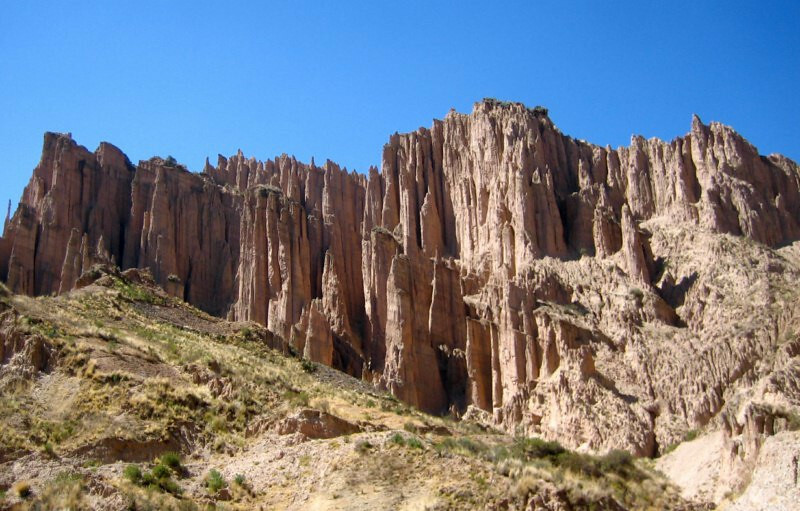 My attempt to tour the southwest of Bolivia came to nought and now I was running out of time to enter Brazil, but I promised to come back again to see the Salar. 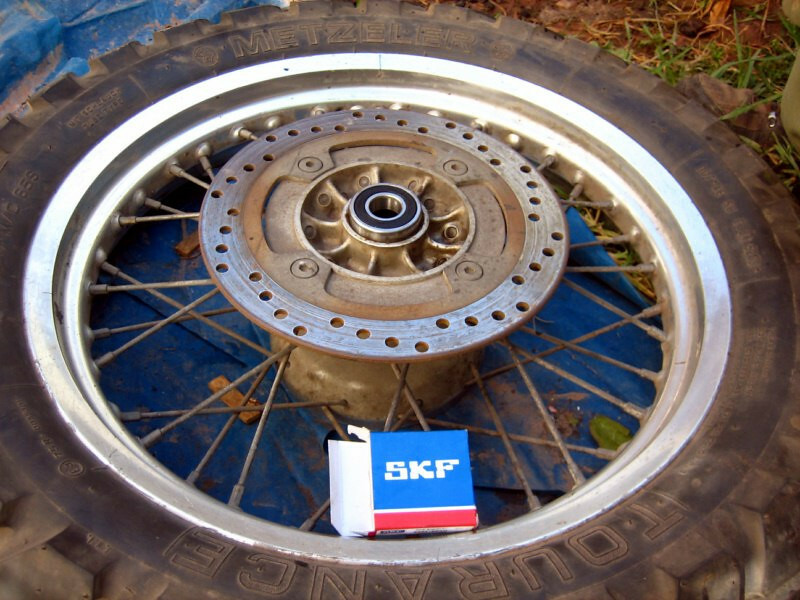 The next day, we went around to some bike shops and luckily I found some clutch discs for a Kawasaki KLX650 that just about matched the dimensions of my clutch disc. The inner diameter was a bit bigger and the teeth were a bit smaller, but it would work and the bike felt great. 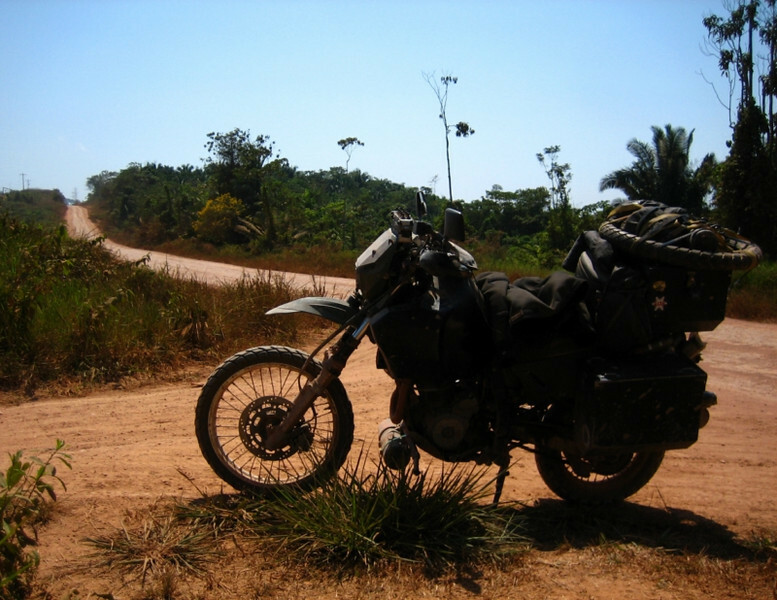 I was confident of making it through the Transamazonica to Sao Luis in Brazil where I planned to get a care package from the States, now with a new clutch. 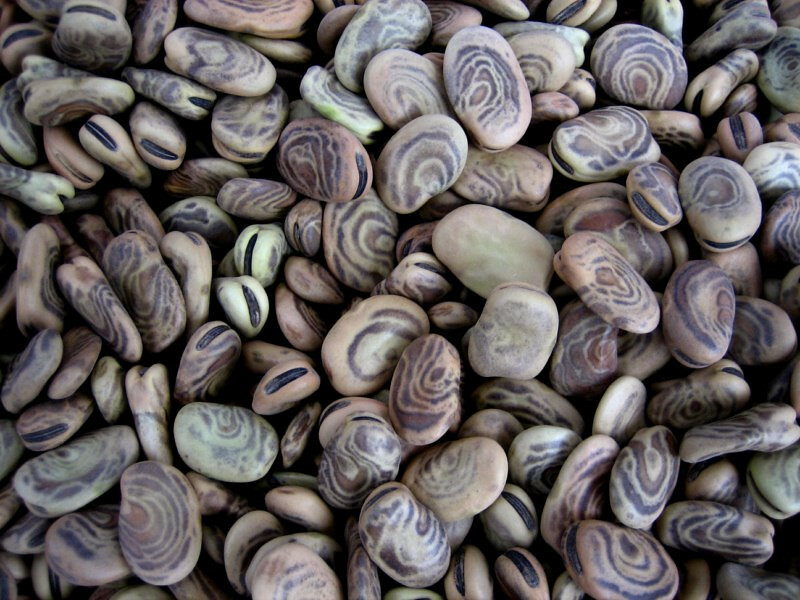 Tasty Saltenas of Bolivia. 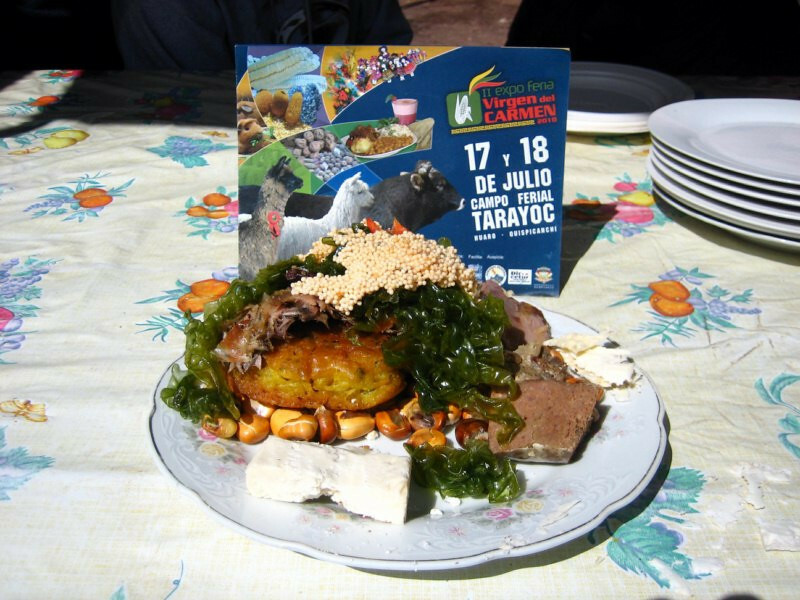 They’re a fried snack from the Salta area of northern Argentina and now are part of the local culture here. We had some the other day at a bike dealership and the guys forgot to tell me that the stuffing is liquid and it dripped all over, but it was so tasty. 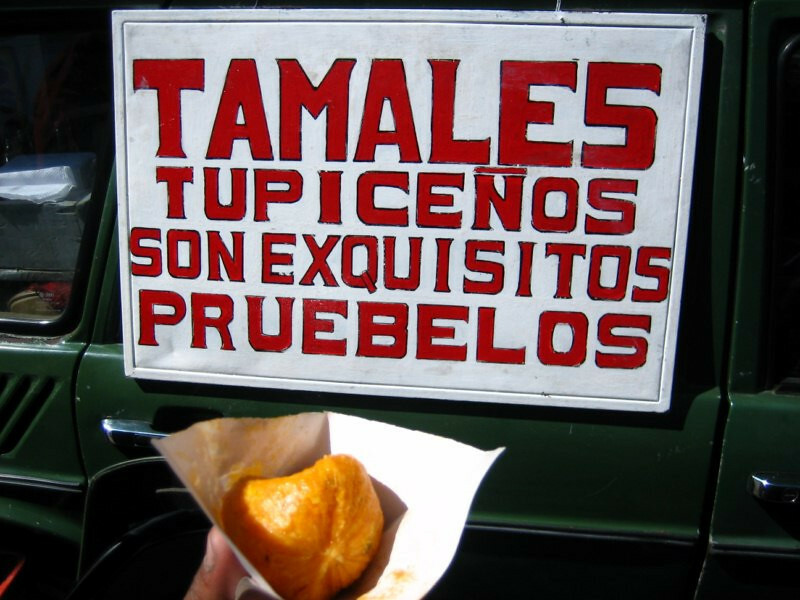 Having a tamale, another street snack. 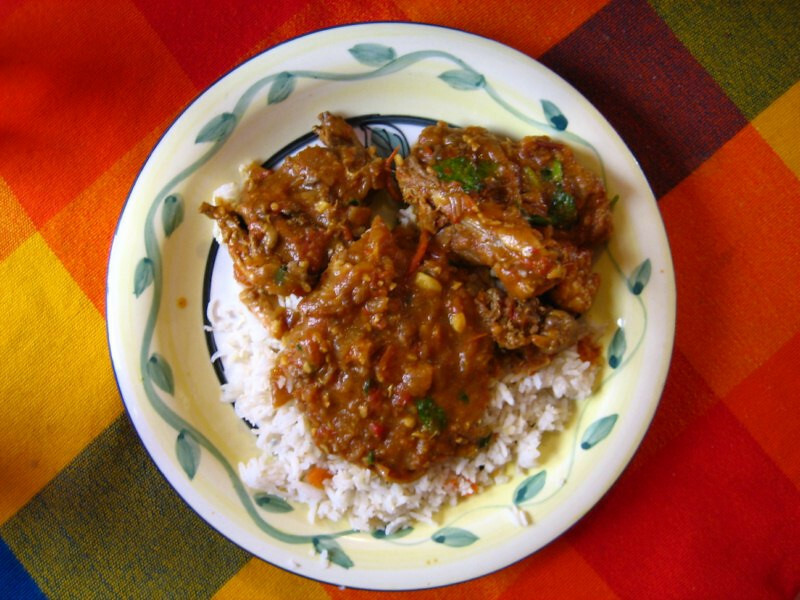 After hearing about my chicken curry at Alfonso’s last week, Gonzalo asked if I could prepare it for his family. Happy to spread the joys of curry. 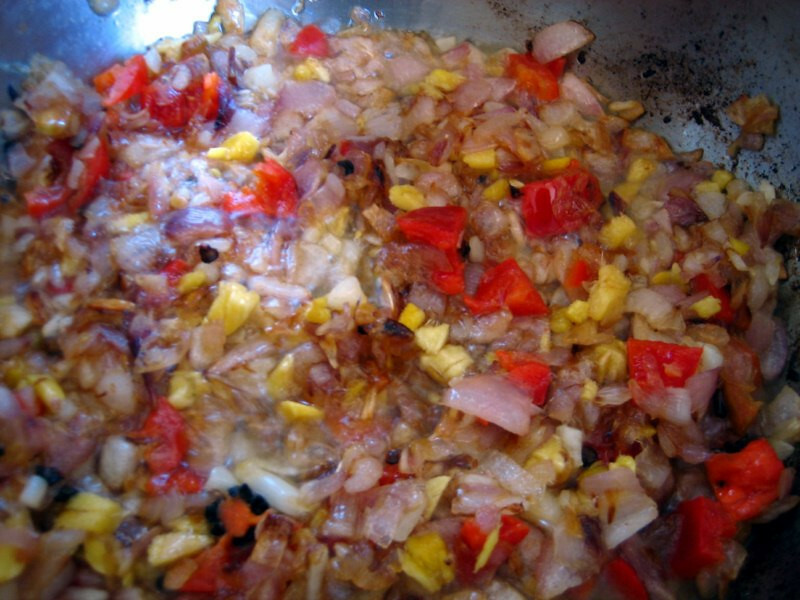 Frying some onions with ginger, garlic and chillies. You can’t go wrong with a base like this. I’m getting better and better at making this particular recipe and I’m happy I can source all the ingredients locally (you can find curry powder everywhere) and it comes out pretty good using different pots and stoves each time. Going for a test ride after lunch to make sure the clutch feels good and it did. 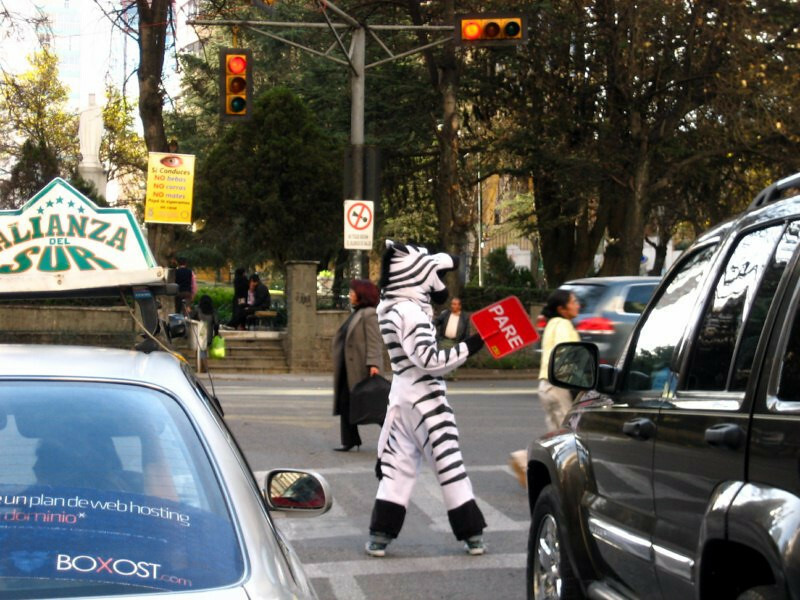 Zebra Crossing Enforcer. 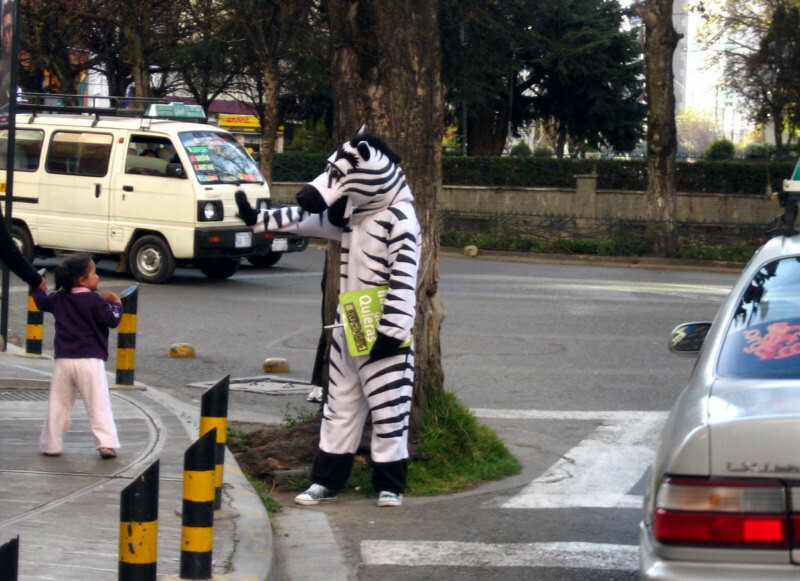 The local mayor’s office has these guys dressed as zebras at various zebra crossings, as their known in Britain or pedestrian crossings for everyone else. 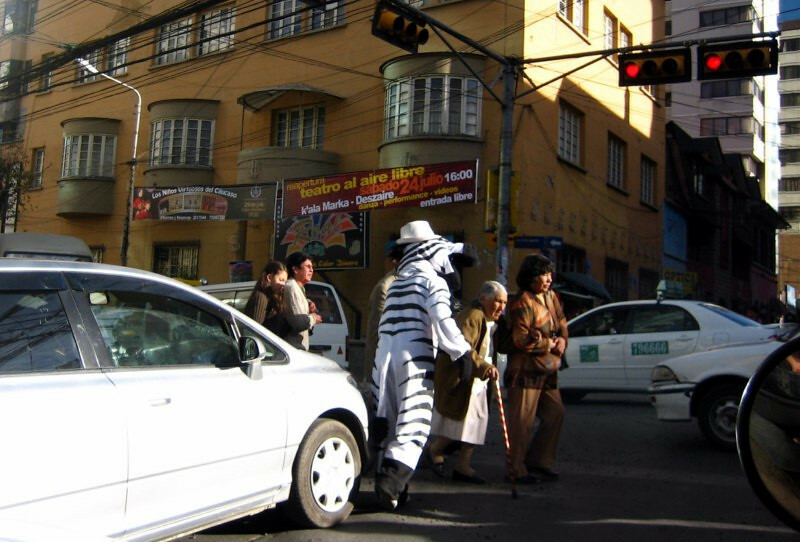 Fun-loving characters and Alfonso said you could be a zebra for a day, volunteering to the city. They’re trying to foster good habits of crossing only at designated places. This car on the left stopped past the white line into the zebra crossing making it harder for this lady to get across and the zebra gave the driver a scolding, making a big drama out of it – you know, a little public humiliation to drive home the message. 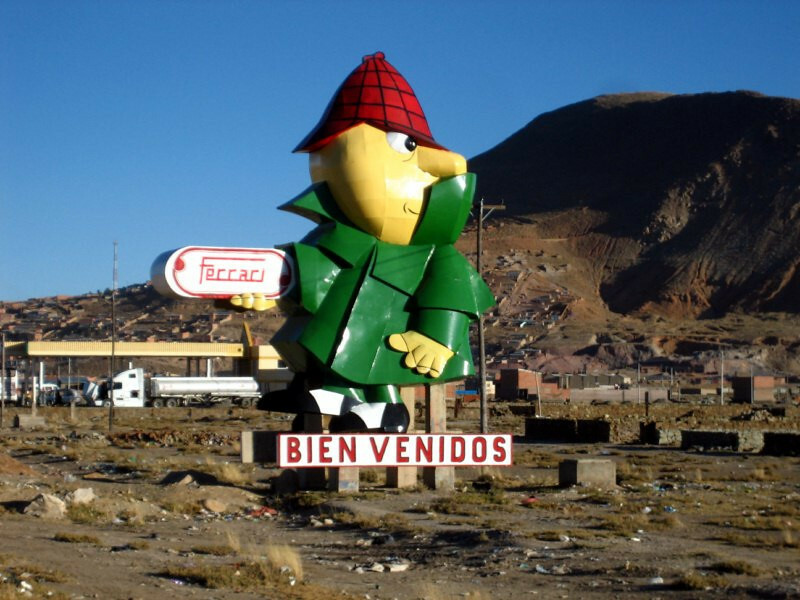 Quite progressive of La Paz to see this. 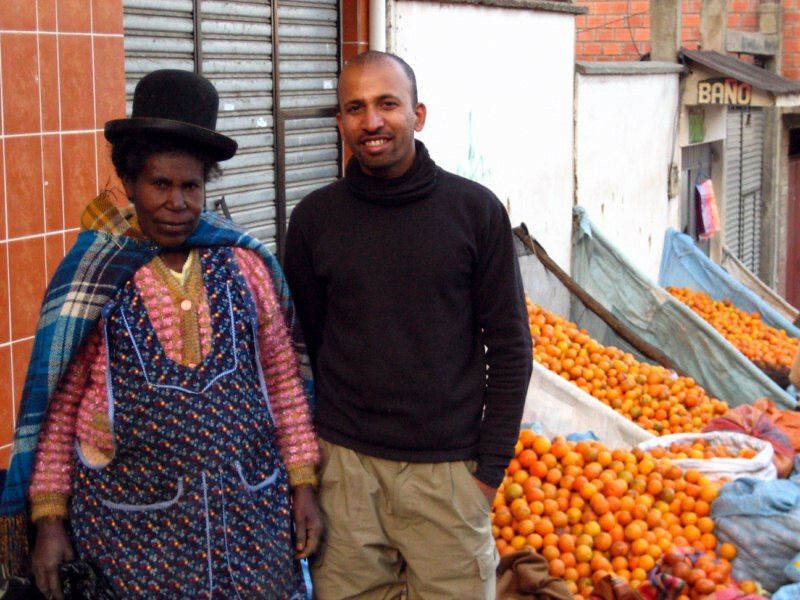 Alfonso’s wife is from the Yungas and her family harvest oranges to sell them in the city. 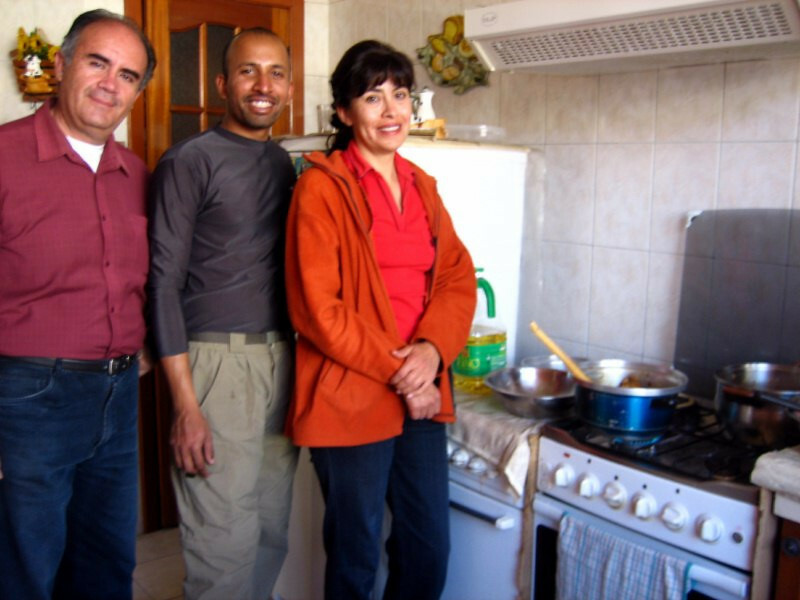 With Alfonso’s mother-in-law, a Bolivian with very strong African ethnicity, where I’m headed next year. One of numerous murals around the city. 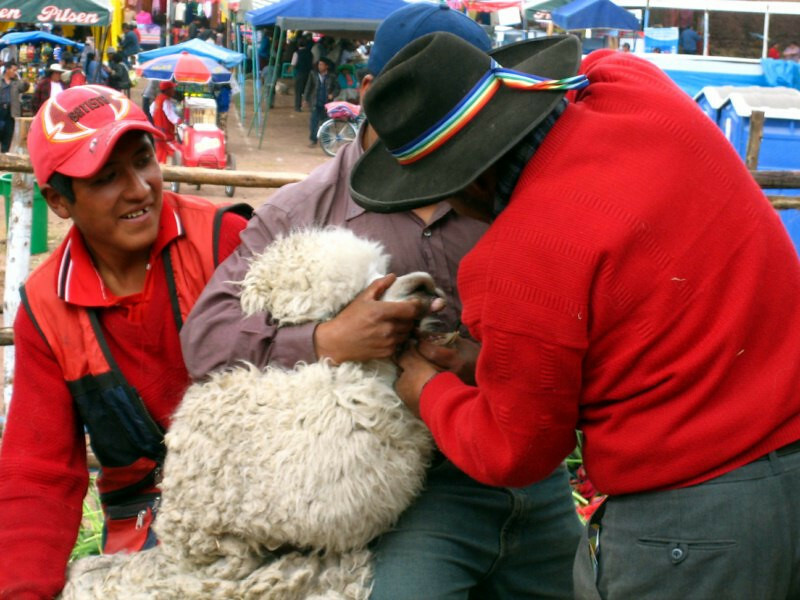 Saying bye to Achira and Alfonso as I head north out of La Paz for Brazil. Thanks for all the help, Alfonso. 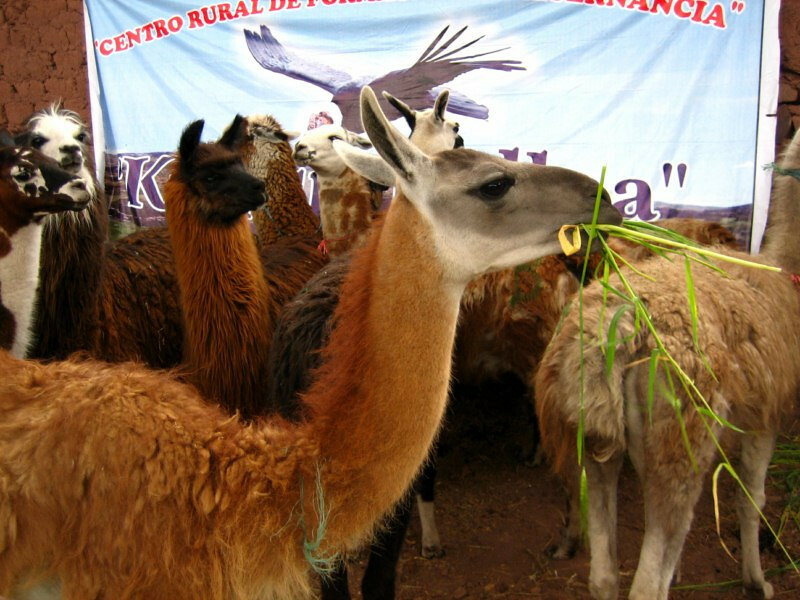 Bolivia is a landlocked Andean nation, known for its breath-taking altitude and its lesser known share of the Amazon. I wanted to take a tour of the country before heading north for Brazil. 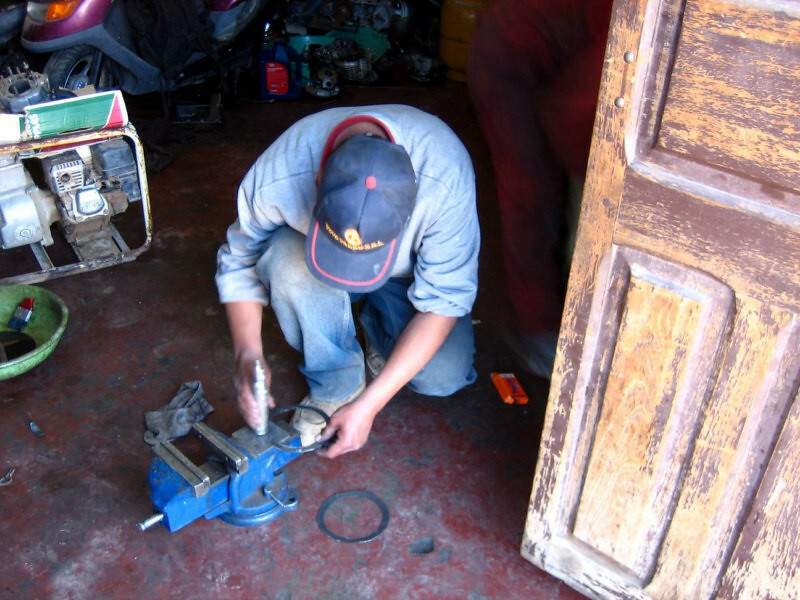 However, I had a mechanical breakdown, cutting my time short in Bolivia. 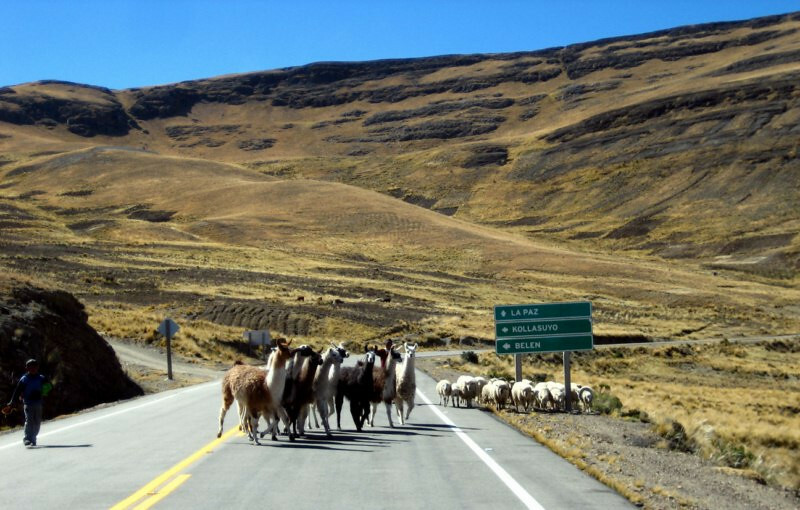 I got a taste for life in the country and vowed to return before leaving South America as I didn’t get to see the Salar de Uyuni on this visit. 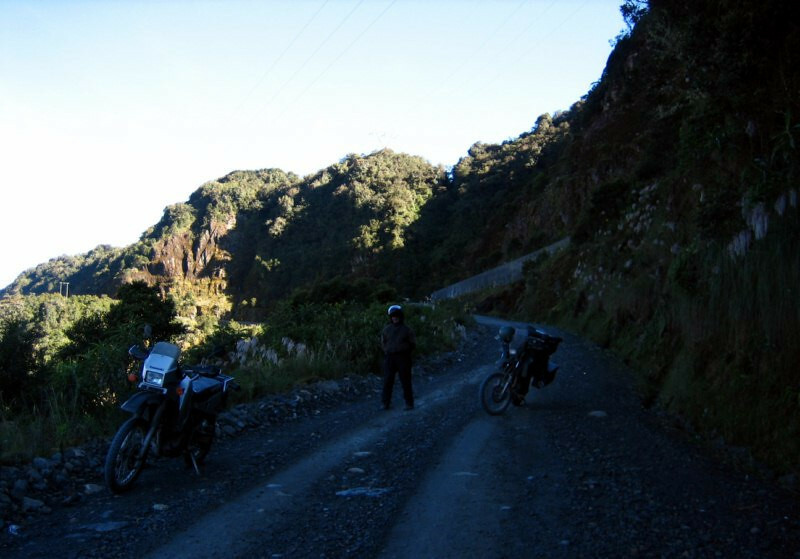 However, I had an exciting ride down the Andes, through the Yungas onto the flat dry savannah heading north. I met many warm people and felt very welcome. 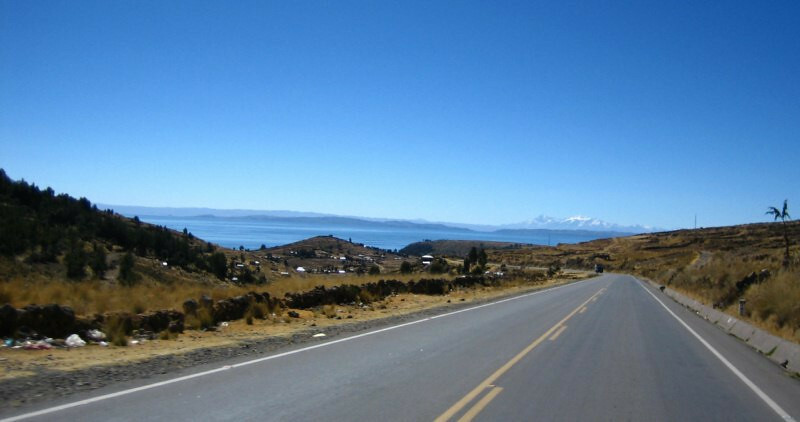 Entering at Lake Titicaca, I went through La Paz, then attempted a visit to the Salar. 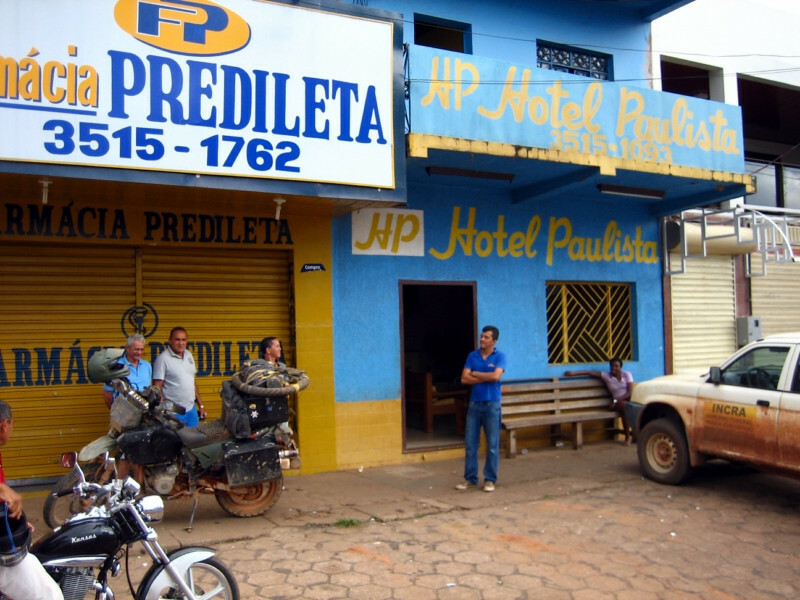 Had to return to La Paz and then continued north to the border with Brazil. 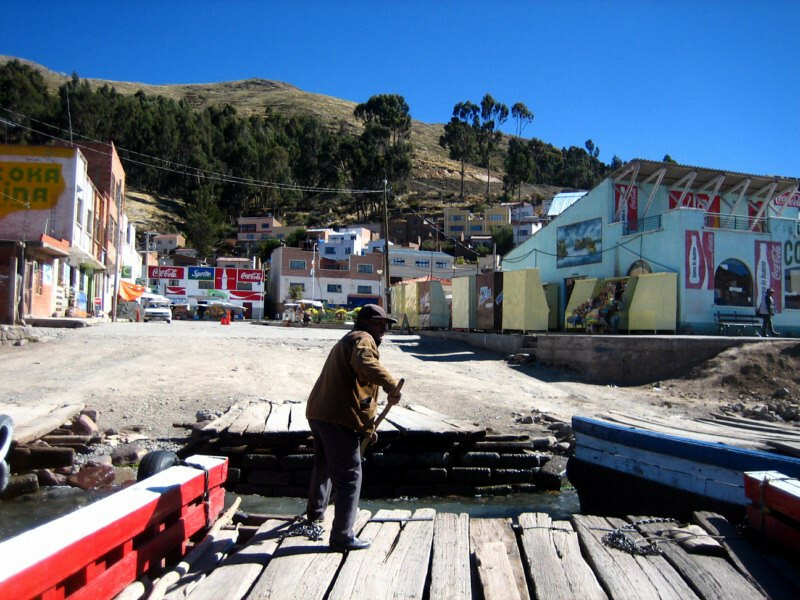 Crossing at Kasani, near Copacabana on Lake Titicaca. Border processing was very smooth. 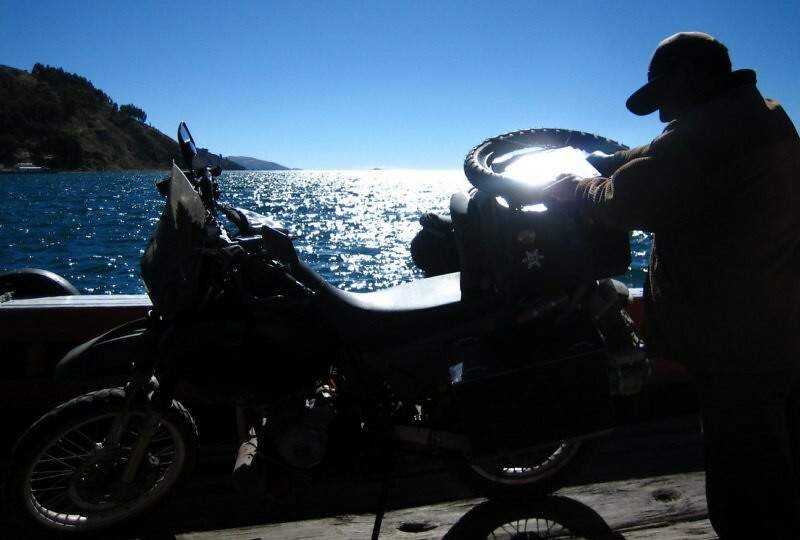 My route through Bolivia: entering at Lake Titicaca, then La Paz, down to the start of the Salar, then back to La Paz and heading north for Brazil. Click on it to go to the interactive version in Google Maps. 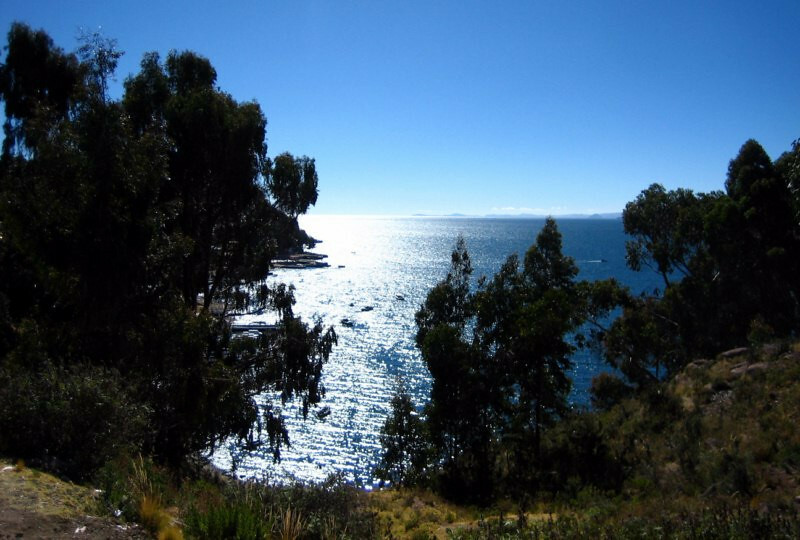 Panorama of Lake Titicaca from Copacabana, about 10 kms (6 mi) from the border. 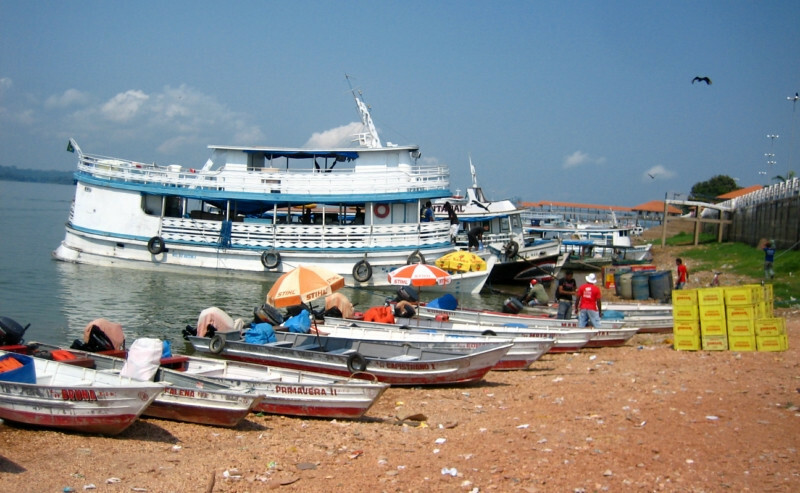 Boats leave from here for Isla del Sol. 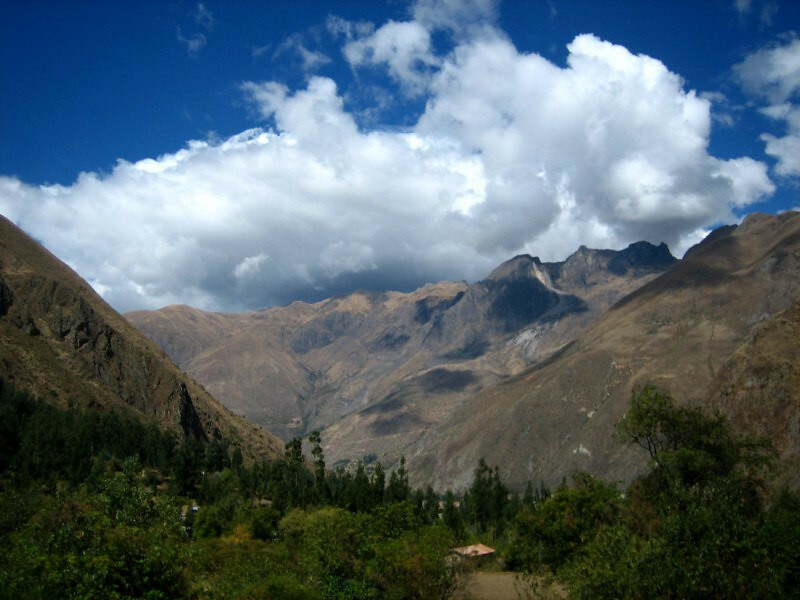 Elevation is at around 3,800 m (12,460 ft). 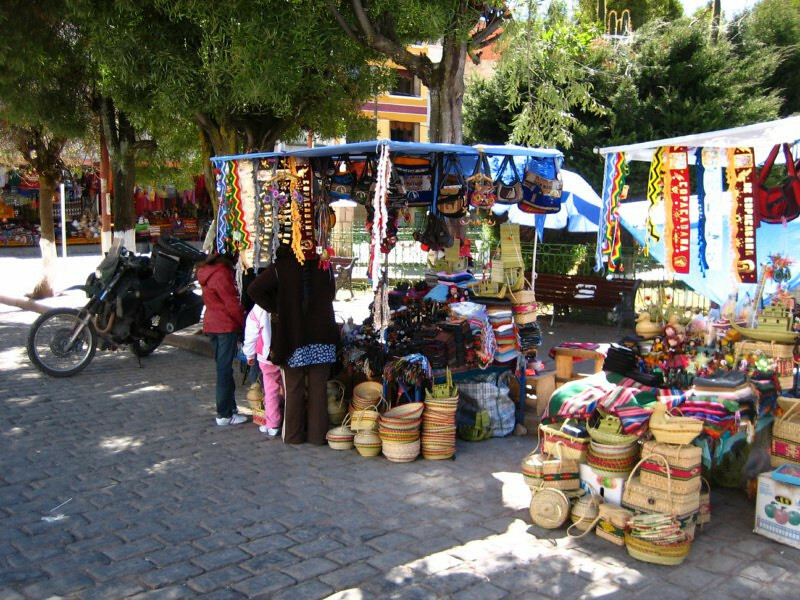 A crafts vendor in the main plaza of the town. 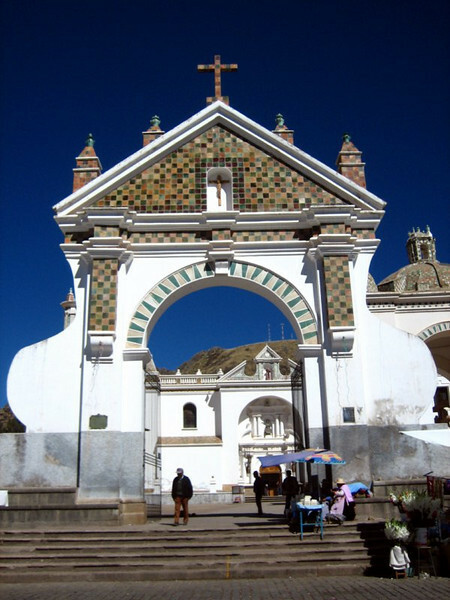 Entrance to the 16th-century Basilica of Our Lady of Copacabana, in front of where the pastor blesses vehicles. Tower next to the cathedral, looking very middle-eastern. 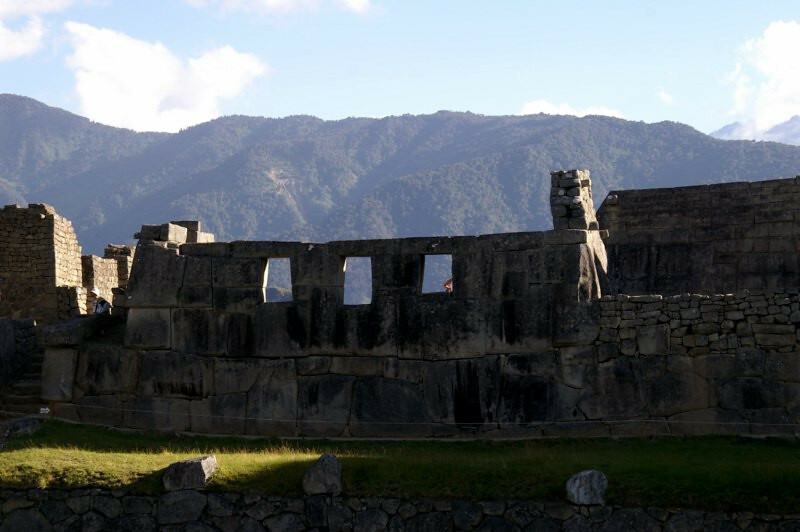 The current Spanish-built basilica sits on top of the once Temple of the Fertility of Kotakawana, scared to the Incas. 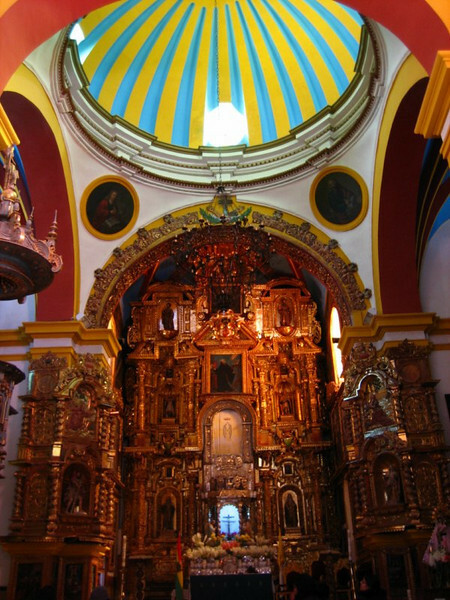 The gold-leaf covered facade of the altar inside. Very intricate. 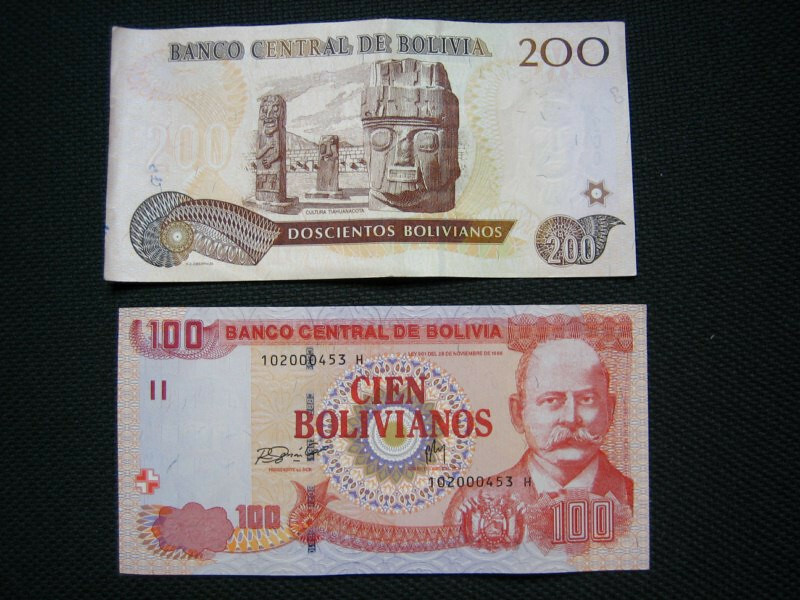 Bolivia’s currency is the Boliviano. 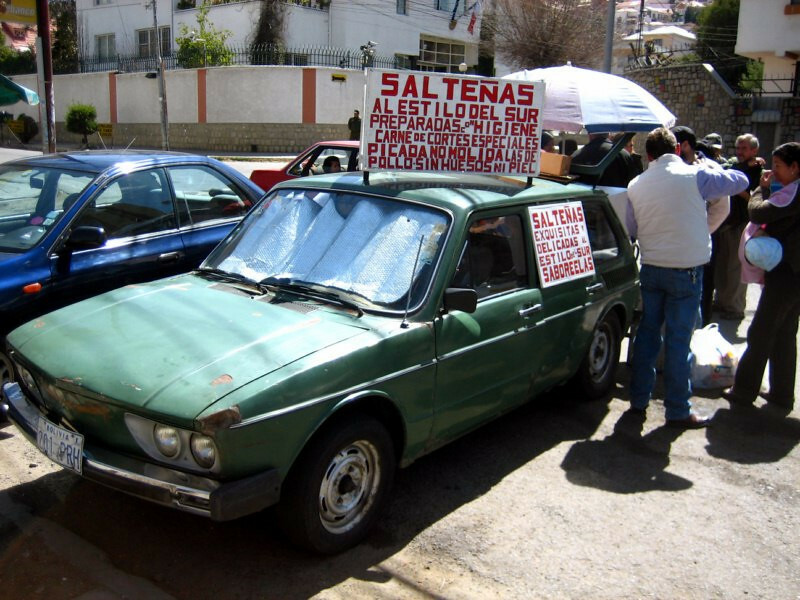 $1 = 7 Bolivianos. 100 Bol = $14. 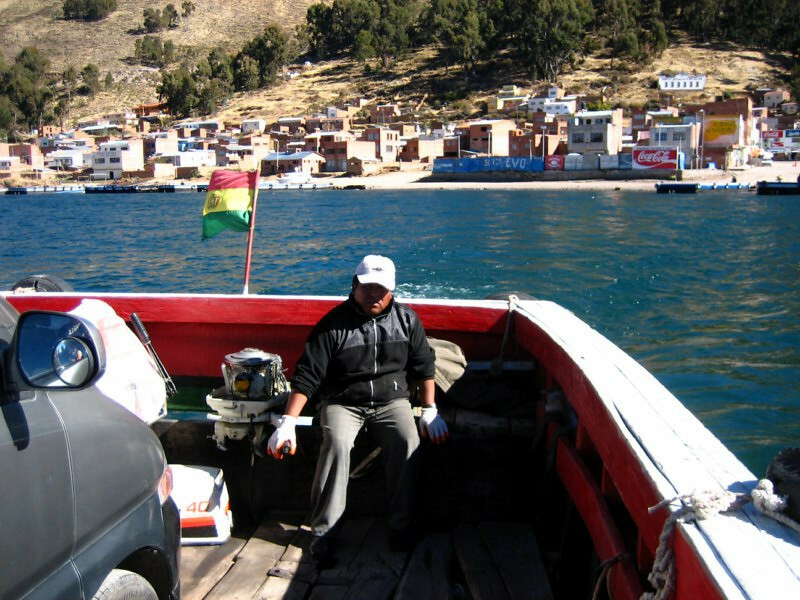 Heading out of Copacabana for La Paz. Panoramic view of Copacabana on the left with the massive, impressive Lago Titicaca stretching beyond the horizon. The road was in good condition and it twisted around the shoreline. The lack of traffic made it an enjoyable ride. Video from Copacabana heading to the Strait of Tiquina. The blue-ness of the lake is very impressive. With snow peaks of the Cordillera Real visible in the distance. 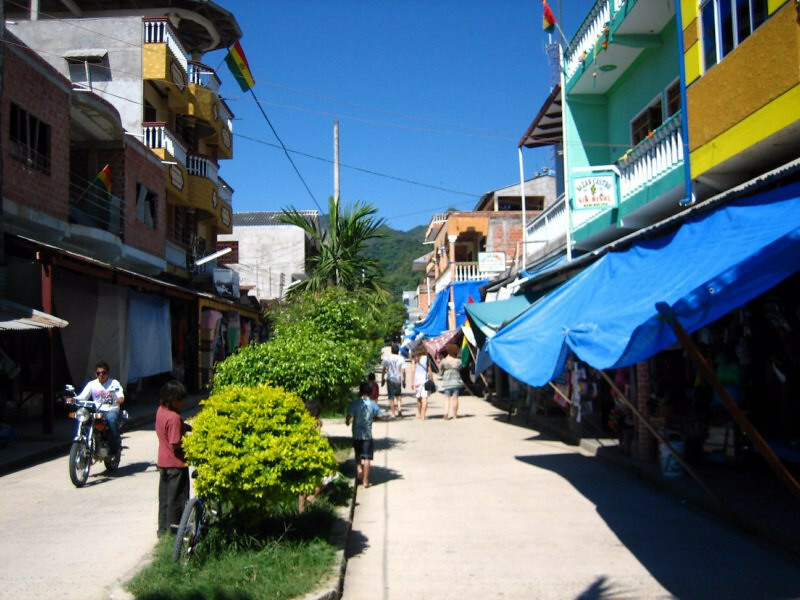 Coming down to the town of San Pedro de Tiquina to take a ferry across the Strait of Tiquina. Pushing off from San Pedro for the 20 Boliviano ride. The water was very choppy and I had the attendant hold the bike while I grabbed some pictures. 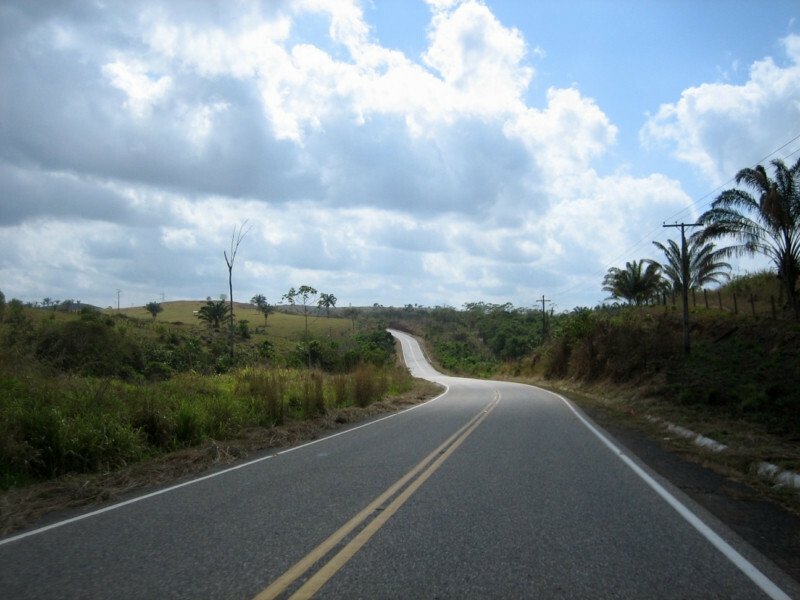 Heading to San Pablo de Tiquina on the other side. 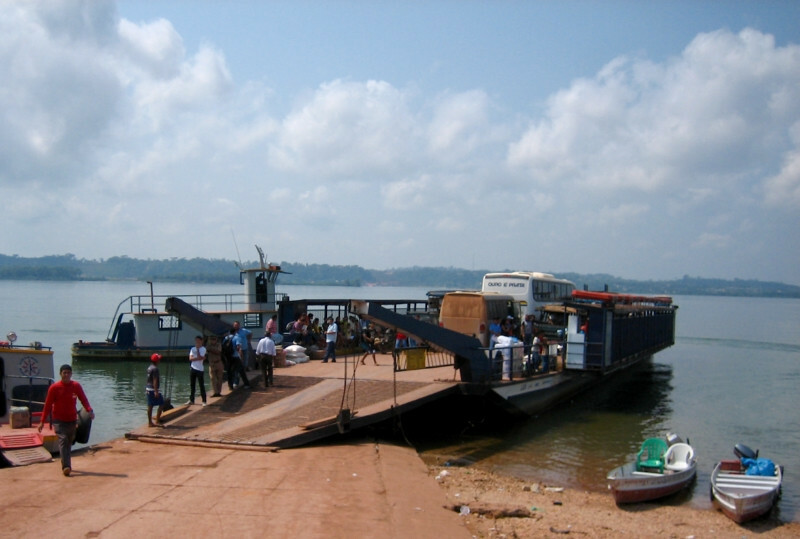 The ferry is powered by a small out board motor. It’s looks so fresh and clean and with no major cities nearby, hopefully it’ll stay that way. 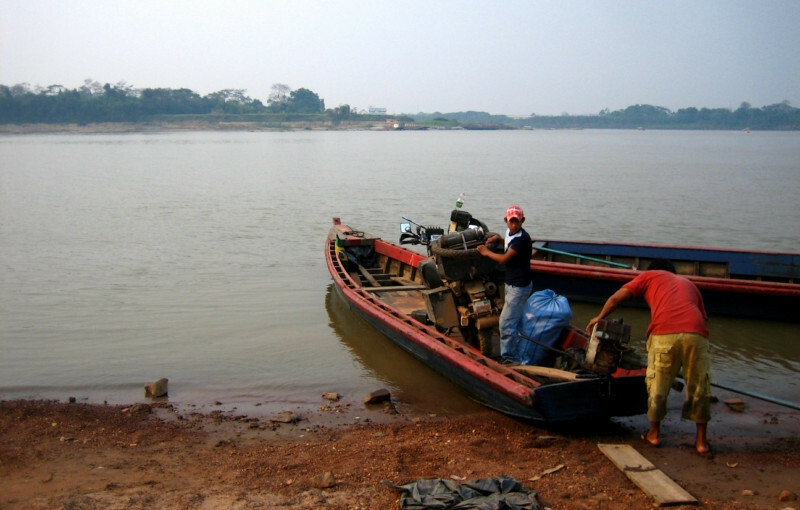 The straits are monitored by the Bolivian Navy, being the only landlocked country to have a navy, which should help in Bolivia’s struggle to regain access to the sea. 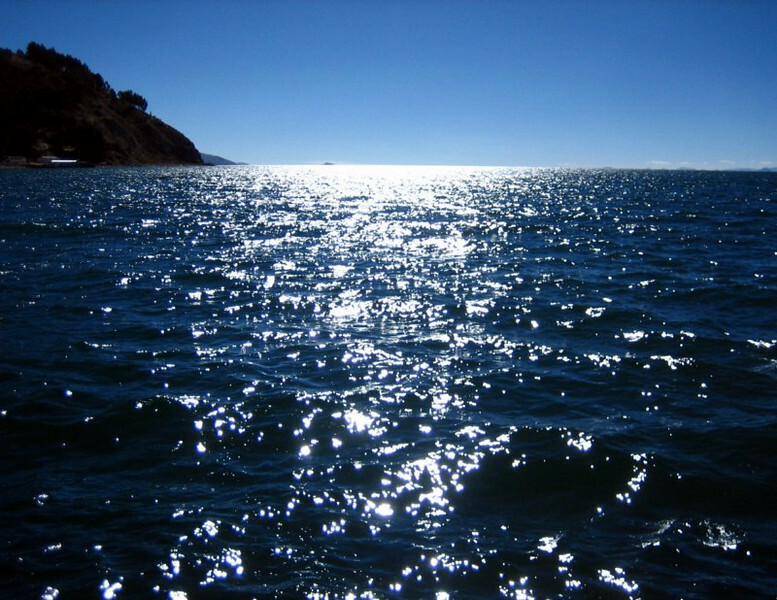 Looking into the sun and absorbing the shimmering rays from the thick surface. Now that’s some good sun for the solar panel. On the other side, enjoying the last bit of riding by the lake. On a clear day like this, the snow peaks in the distance keep calling you further to them. 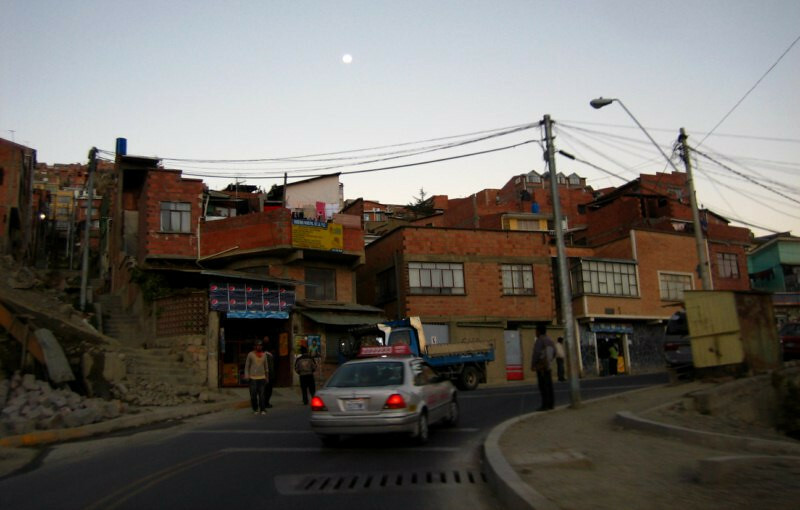 Twisting across the altiplano towards the bustling capital of La Paz. 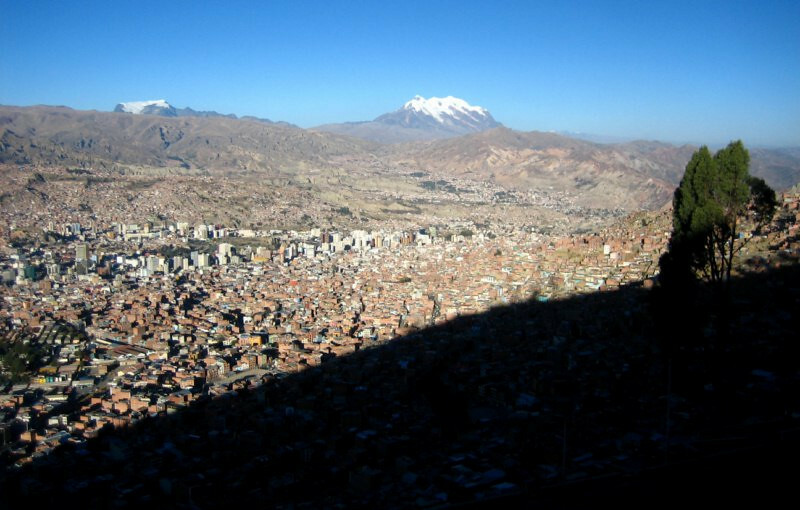 View of the bowl-shaped city of La Paz at an average elevation of 3,600 m (11,800 ft), making it the highest capital city in the world, with snow-peaked Illimani towering over the city. The downtown area is at the trough of the valley and houses sprawl in all directions from there, up and over the surrounding ridge. 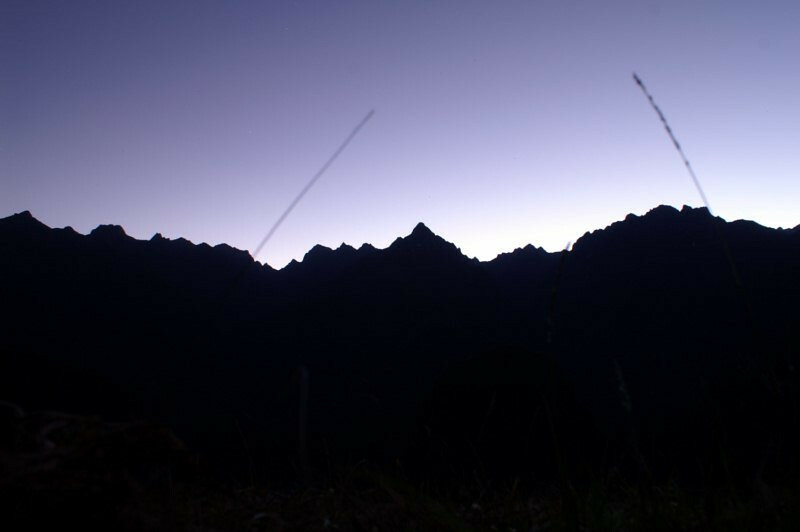 A panoramic view of the city as the sun disappears behind the ridge. New bridges set to open shortly to connect one side of the valley with the other. The city is not flat anywhere and the steep elevation changes are impressive. 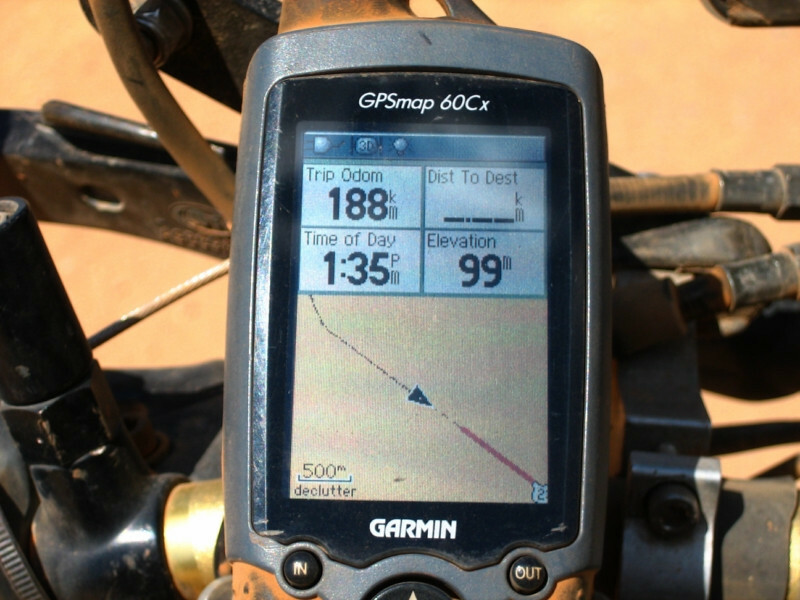 You can drop about a 1,000 m (3,280 ft) and still be within city limits. 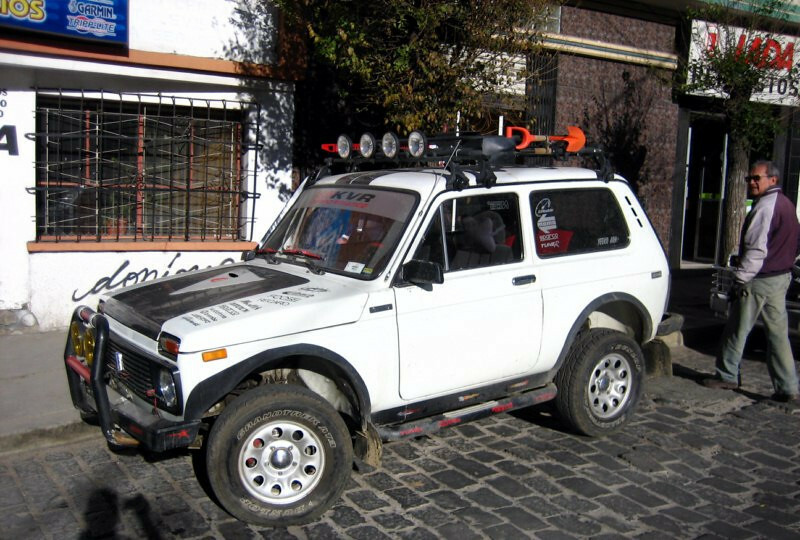 A rally-edition Lada. 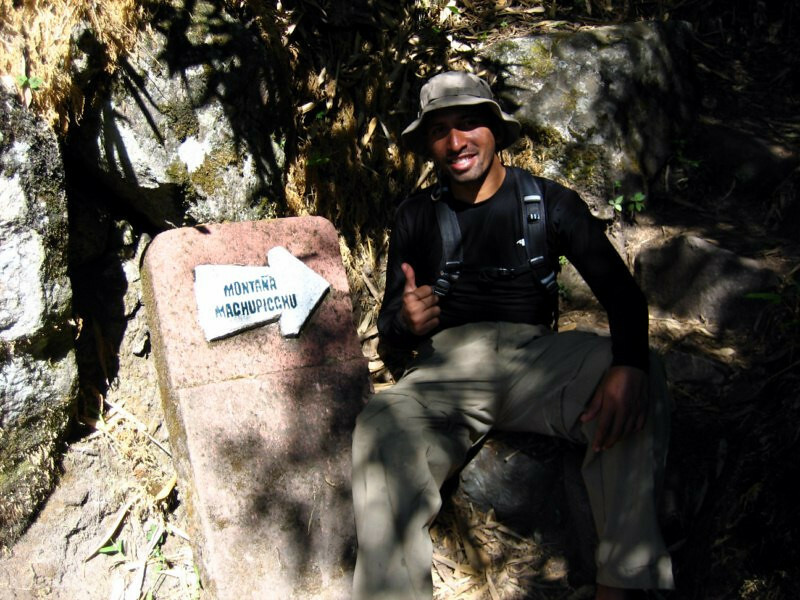 And that’s Alfonso, whom I contacted through HorizonsUnlimited and he helped me take care of a few things around town. 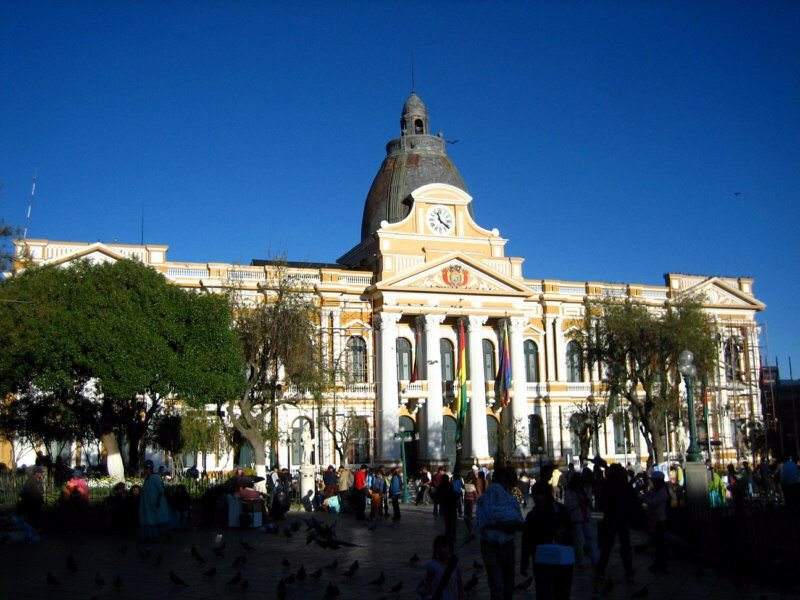 The Government Palace of Bolivia in the main plaza of the city. Not having much flat area, the central plaza is quite small compared to other major cities, but cozy. 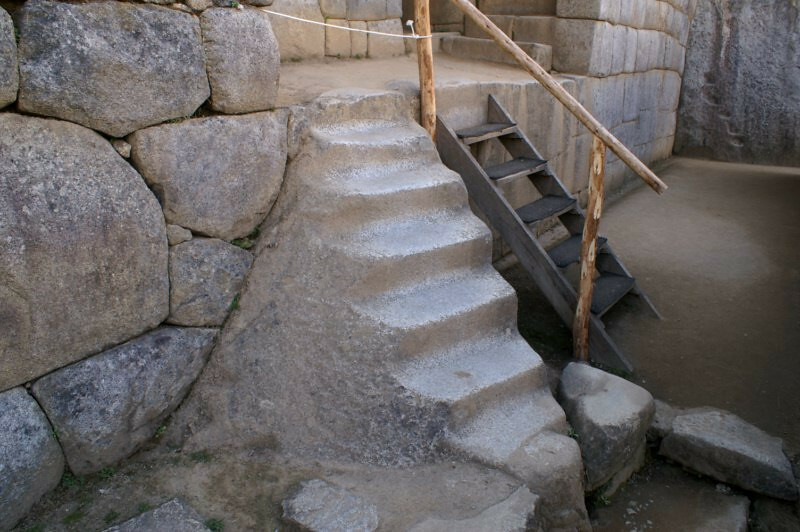 Steps on the main plaza. Alfonso told me how a few years ago the military and city police exchanged gunfire across the plaza due to some policy issues, similar to what happened in Ecuador recently. Bullets holes can still be seen in the surrounding buildings. 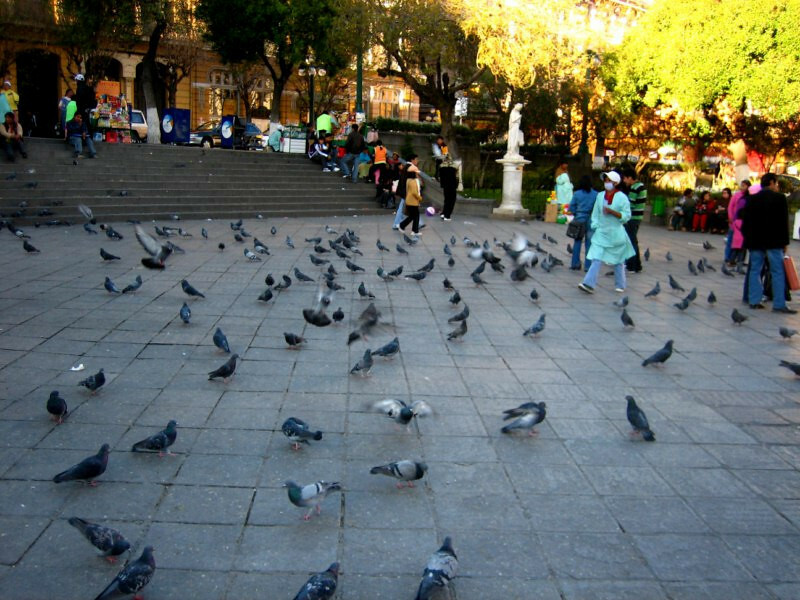 Pigeons, lot of them everywhere with kids running around making them take flight. 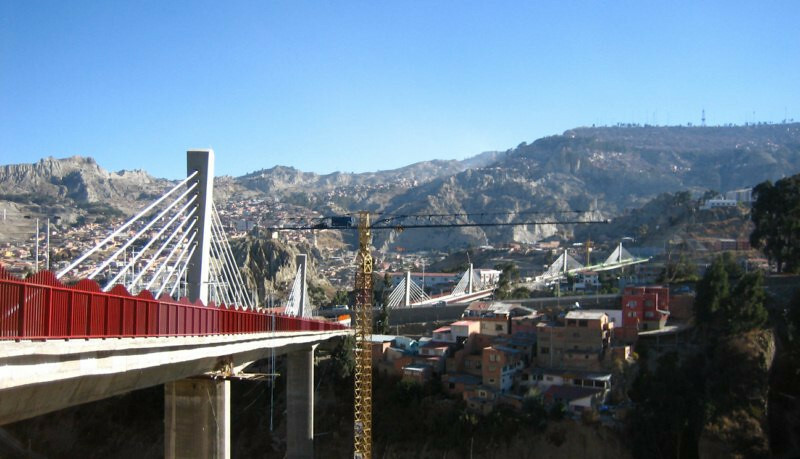 The roads are pretty confusing around La Paz, so I just went 2-up on Alfonso’s KLR and got a nice view of the city that way. 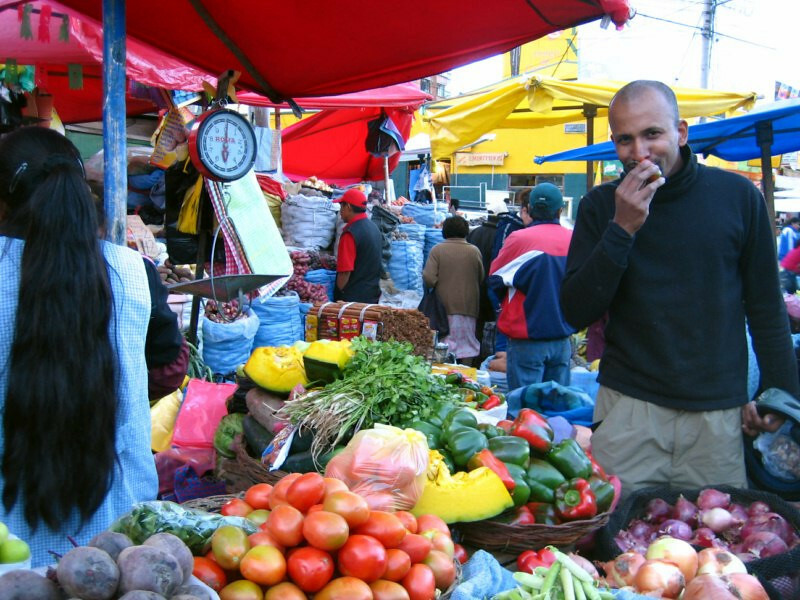 Buying spices in preparation for a chicken curry for Alfonso and his family. He works in computer security and did some work for the US embassy. Impressed to find such a wide array of fresh spices, along with pealed garlic. 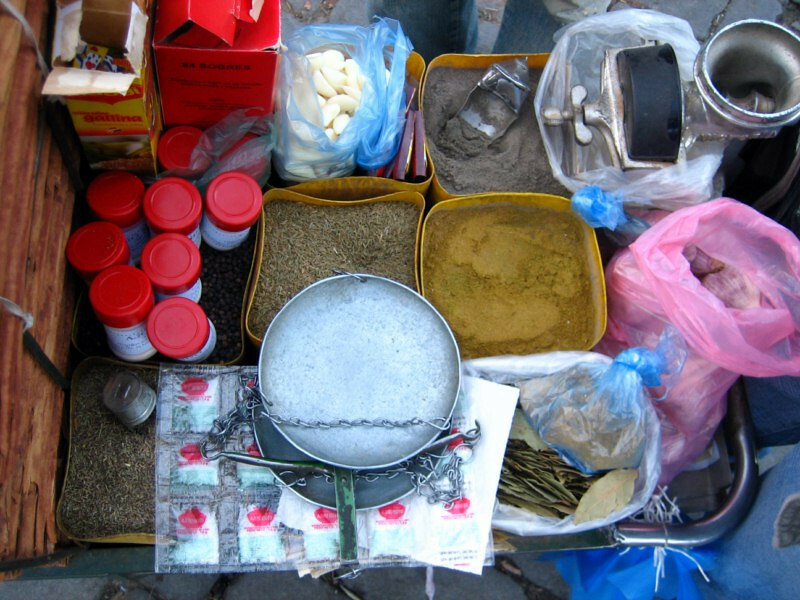 It’s a good sign that people are cooking with spices up here and I was told Bolivian food was bland, bah. Selecting some fresh chillies at the Rodriguez market. 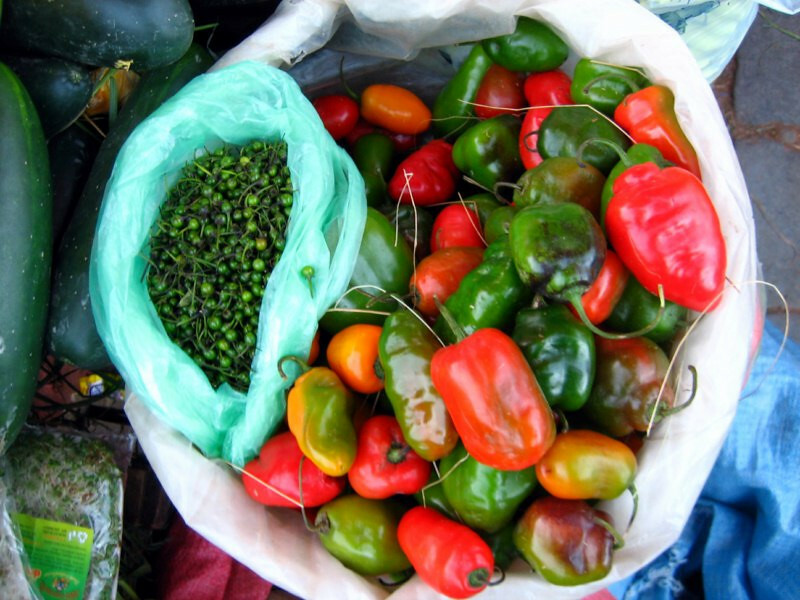 The red chillies are hotter than the green but the small guys pack the biggest punch. 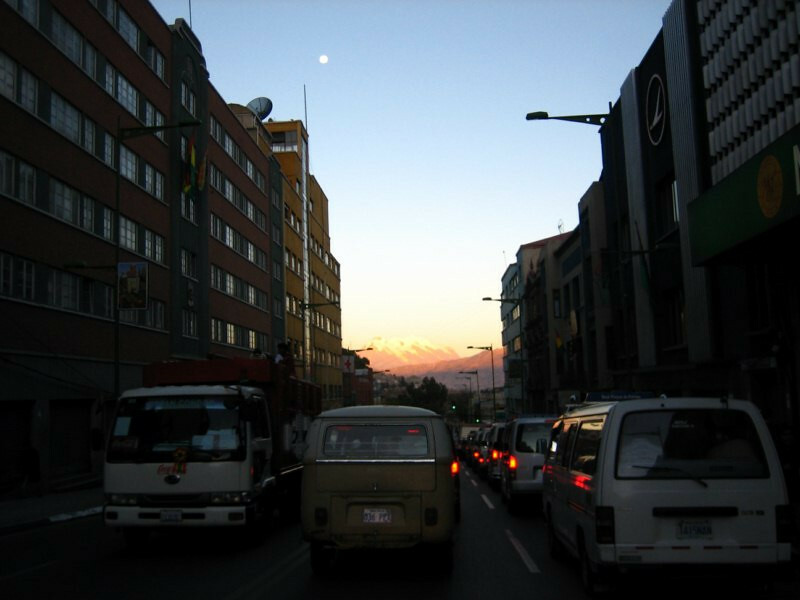 Illimani shining in the setting sun’s light between a valley of buildings. Following the moon back to Alfonso’s home. 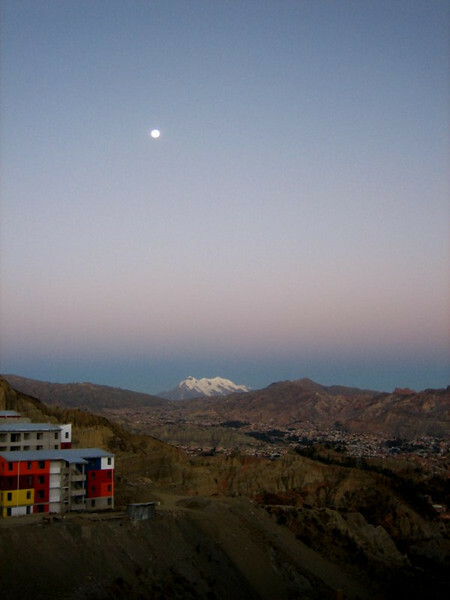 A full moon and Illimani shining over La Paz. Colorful building adds a nice juxtaposition. The galciated peak provides drinking water for the city and they’ve started to take notice now that the glacier has been shrinking and the city is concerned about near-future water supplies at this altitude. 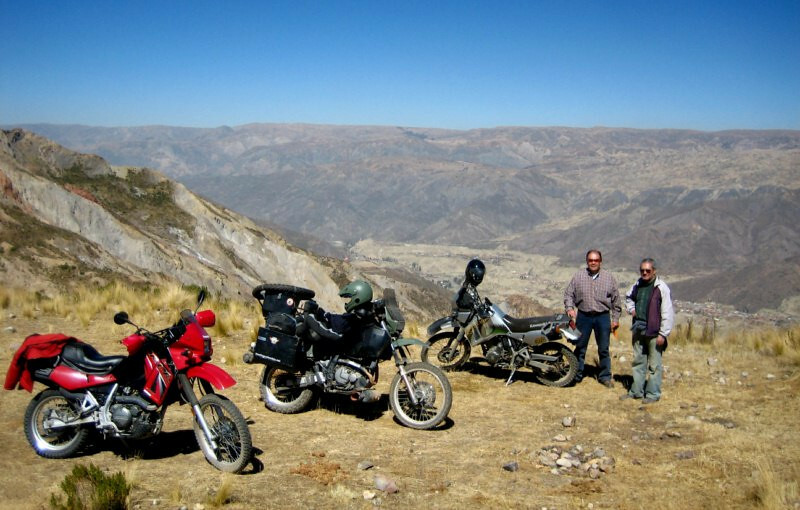 Taking a ride into the surrounding hills with Alfonso and his riding friend, Gonzalo. They have fun rides like this just a few kilometers from town with snow peaks in the distance. 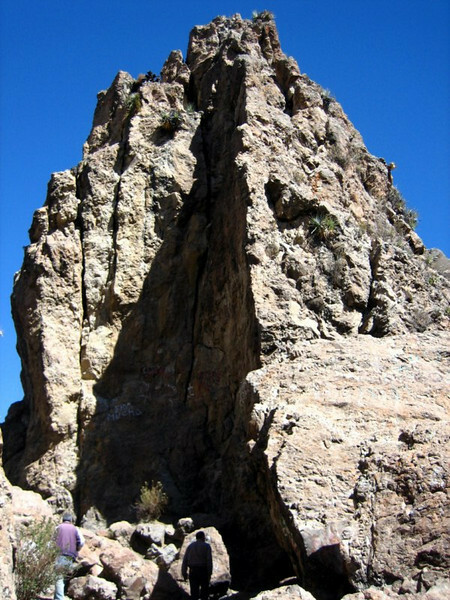 Our destination: Devil’s Tooth, a horny rock formation. Scaling up to the peak. The slate rock was loose and made for tricky footings with motorcycle boots. View from the top of the city and its surrounding ridge. 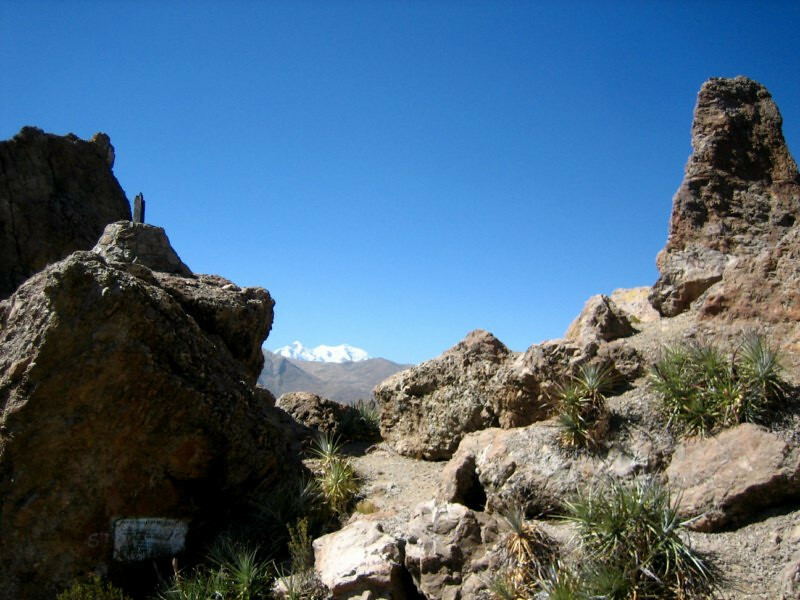 View of Illimani from the top. Alfonso and I with a view of the city. 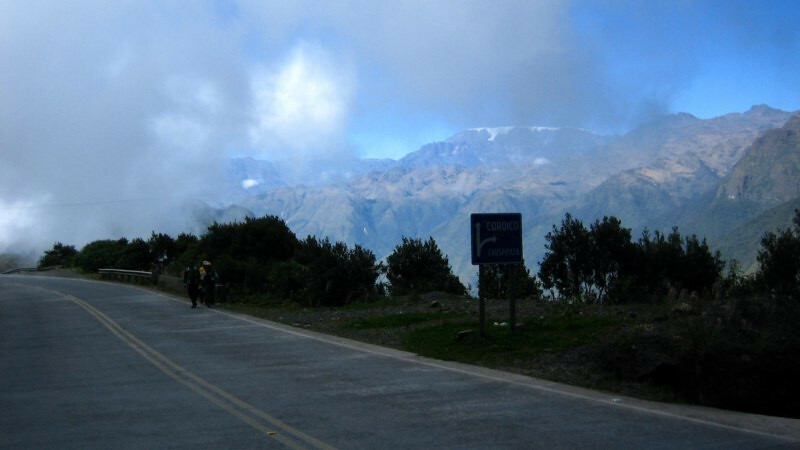 Our three bikes are the little dots in the foreground with Illimani peaking out in the background. sanDRina enjoying the company of 650cc thumpers. And besides, everyone thinks my bike is a KLR because of the color scheme. Looks more like some devils teeth from this view. Hoodoo rock formations, similar to Bryce Canyon in Utah. The city is full of geologic wonders and almost feels like it could be a national park. 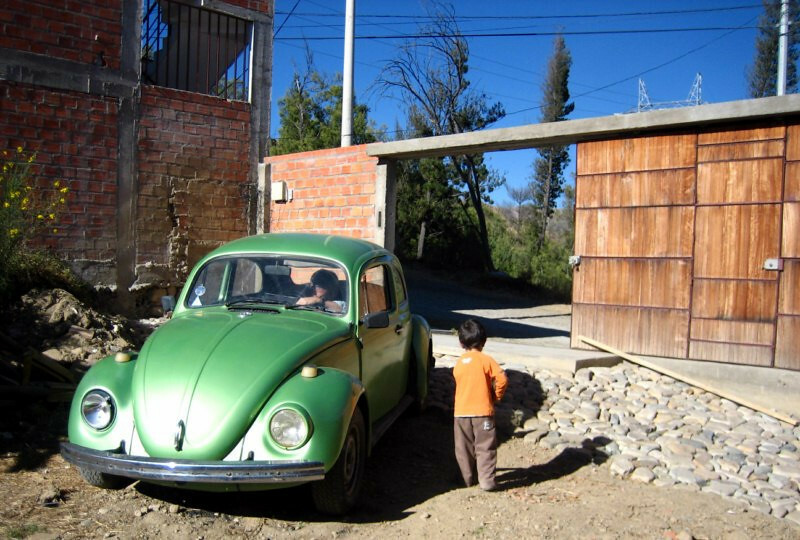 That afternoon, Alfonso’s daughter came over for lunch with her son in her green bug. 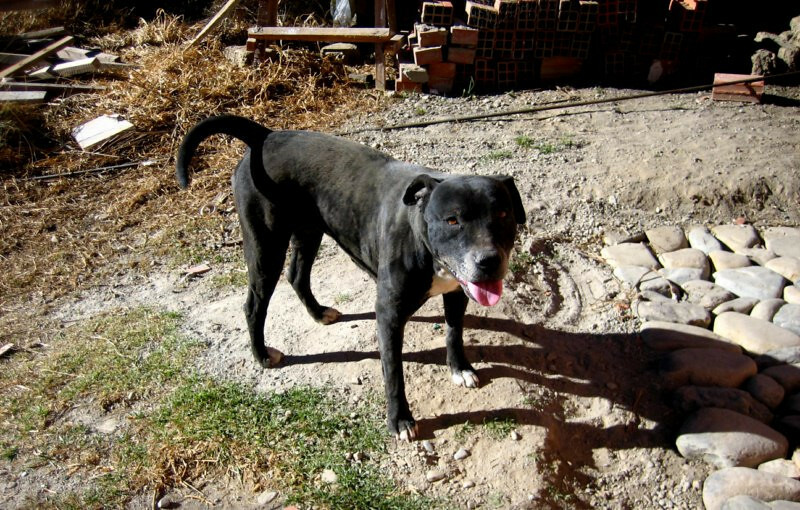 And his cute pit bull, Achira who was fun to play around with. They are such docile dogs covered in a bad reputation. 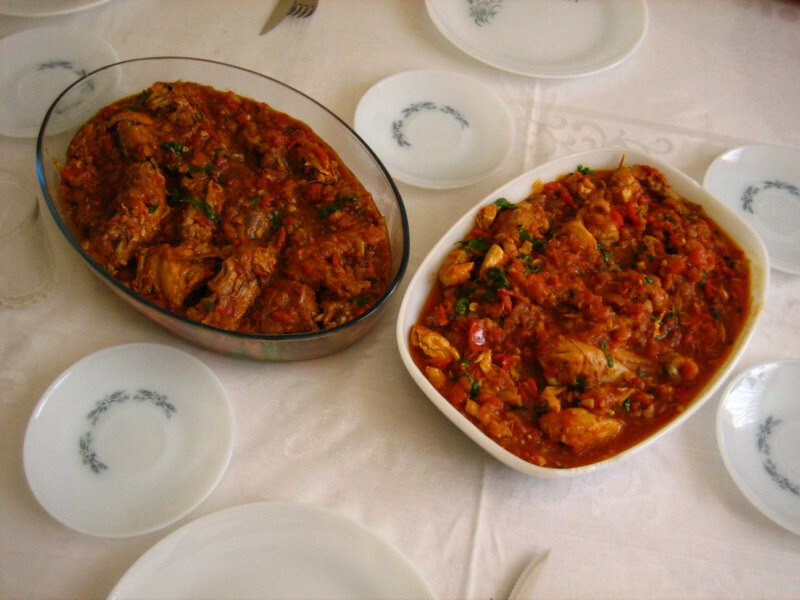 The chicken curry that I prepared for Alfonso and his family. 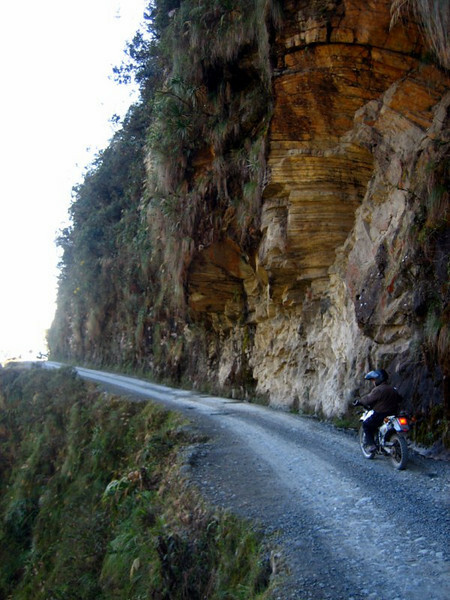 Heading out north of the city the next day for a ride along the Death Road, Camino del Muerte. 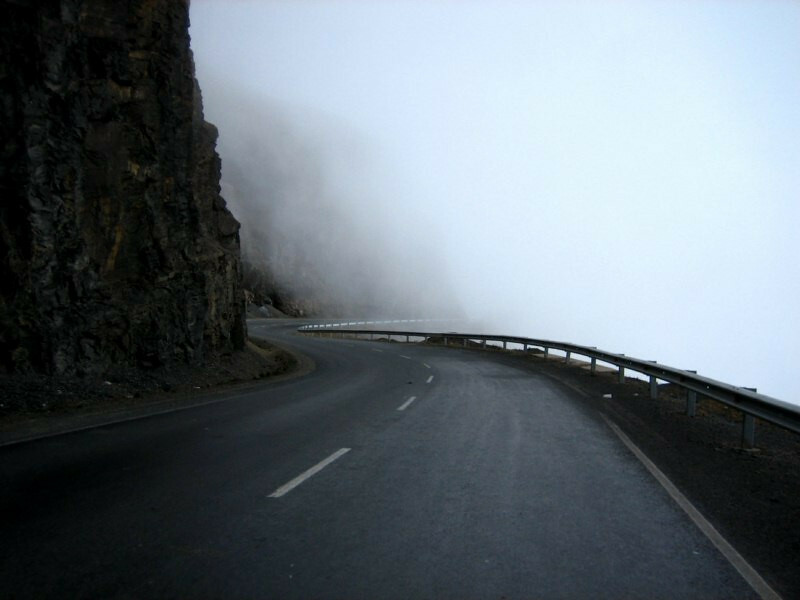 We got an early start and it was blistering cold as the road climbed up to 4,300 m (14,100 ft). We saw these two guys walking their bike back down and stopped to help. They had a flat, so I used my air compressor but the tube was ruptured, so they continued pushing it back down. We saw them later in the day on our way back, zipping by. At the summit near 4,600 m (15,080 ft). A light snow dusting on the peaks with grand views from the guard-railed road. Heading down to warmer climes. 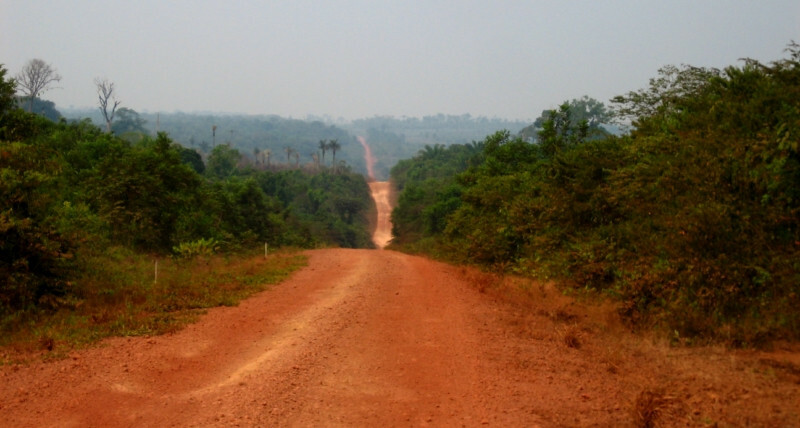 The road continues dropping all the way to the Amazon. 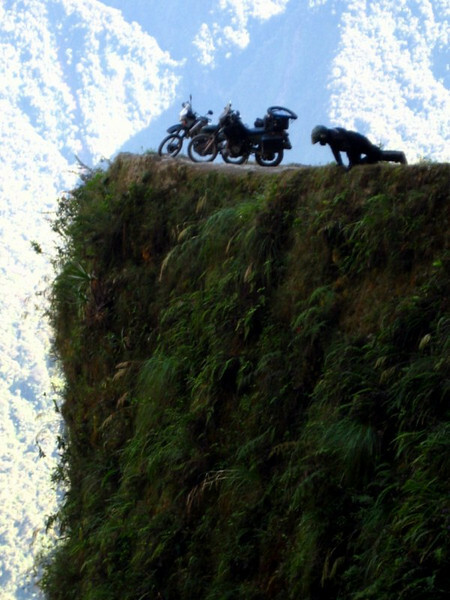 At the inconspicuous start to the Death Road. 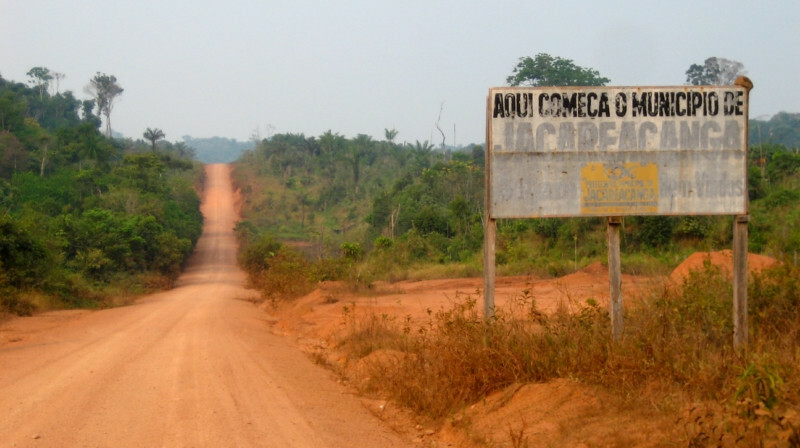 Since the new road’s been built, there’s very little traffic on the old road to Coroico. 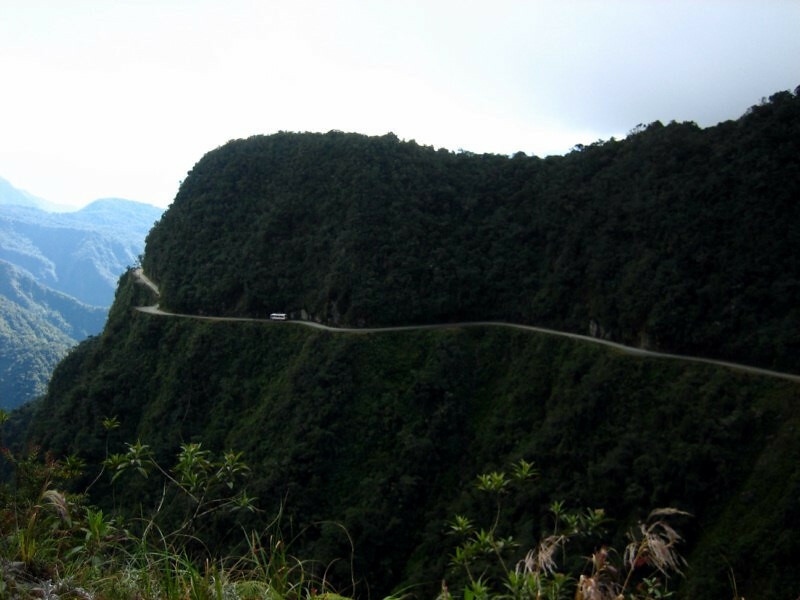 The road to Coroico winding its way along the twisted cliffs. 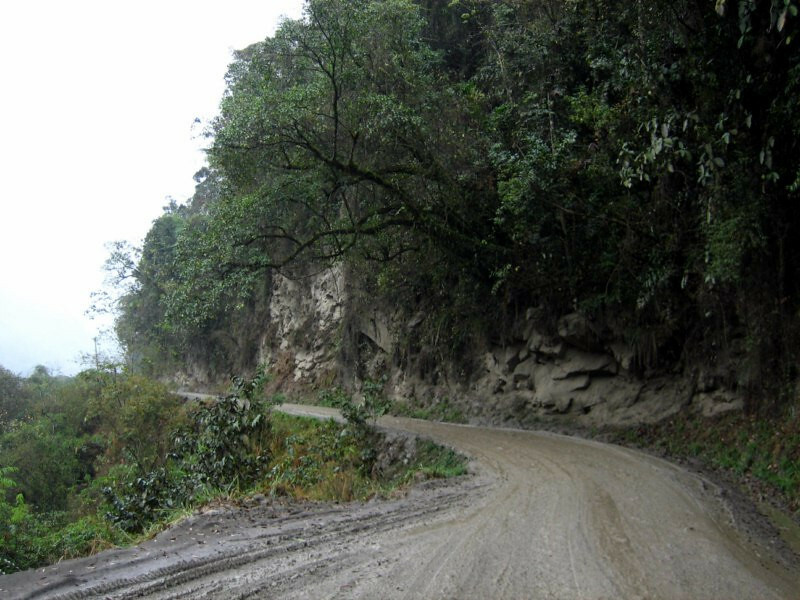 It was very similar to the roads in northern Peru from Chachapoyas to Cajamarca – single track dirt road with no guard rails. 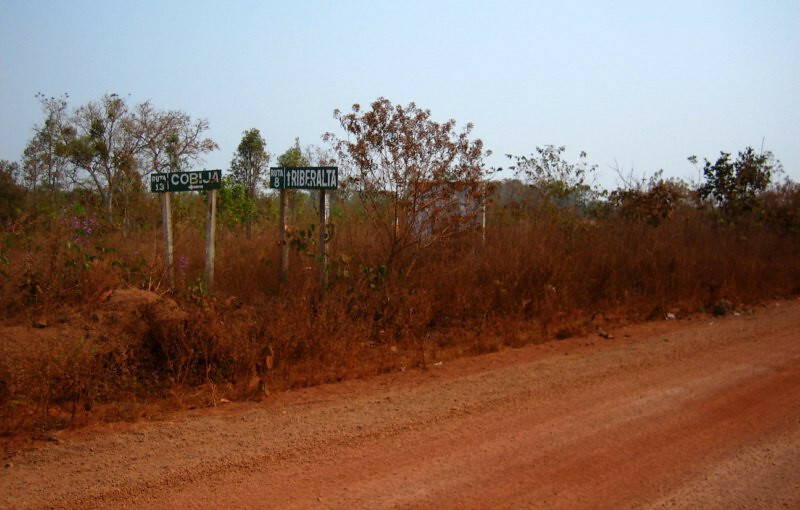 And the numerous accidents on this road earned it its famous name of the World’s Most Dangerous Road. 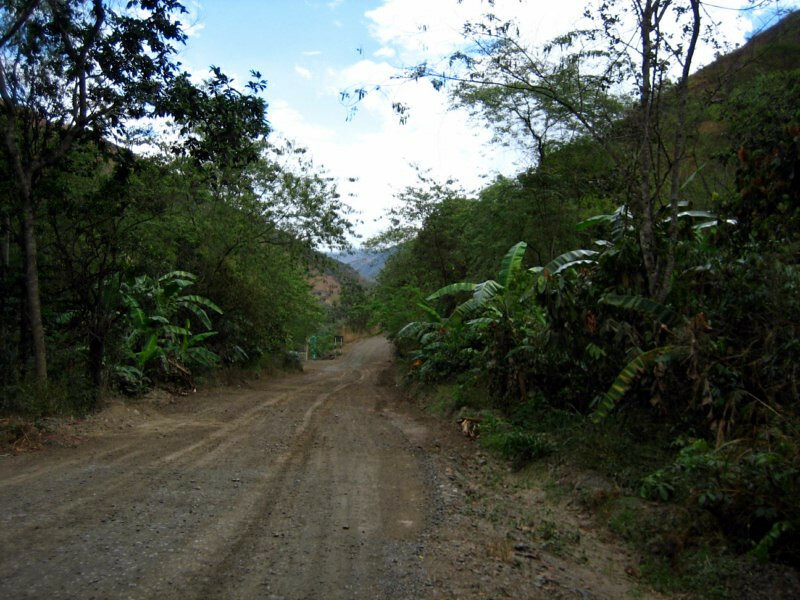 Well, not anymore with no traffic, but Alfonso tells me there’s another similar road quickly gaining notoriety as the new camino del muerte. Whatever it’s called, it’s a nice ride with great views. The sun was bright over head, so excuse some of the over exposure. Following the contours of the cliffs, slowing winding downhill. A well-designed road, but just not safe enough for crazy two way traffic. The bikes perched on a ledge. 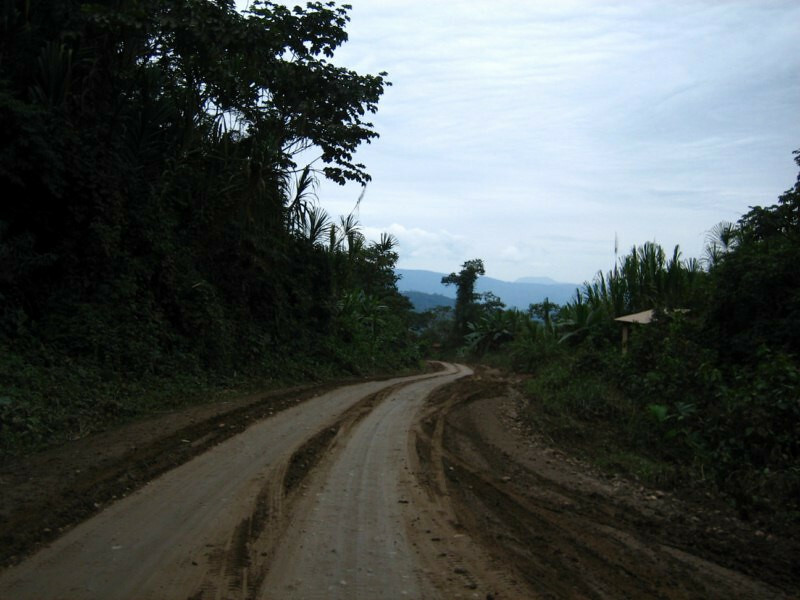 I think I can see an old van… The unacceptable regular high loss of life finally lead to the construction of the new wider road to Coroico. Looking up at the new road with its many bridges making for a straighter path. Enjoyable ride and we only came across a few vehicles. 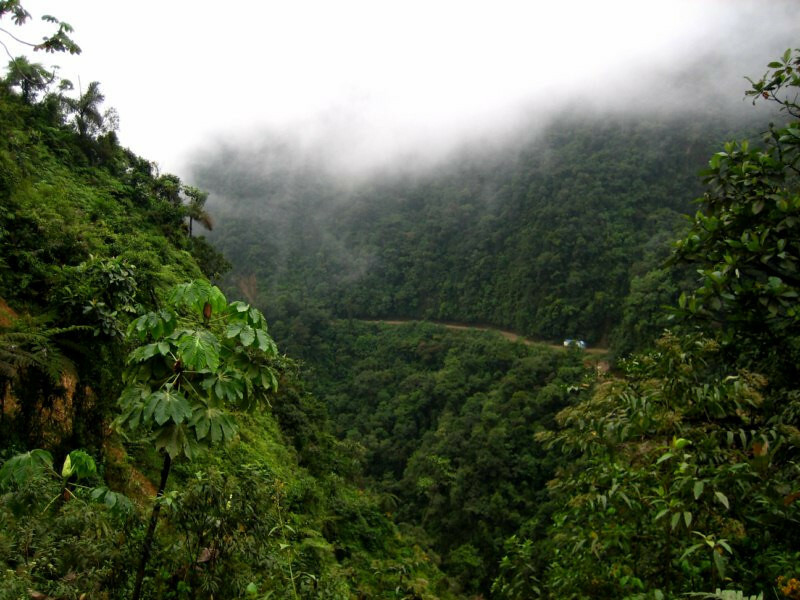 The inconspicuous turn off for the old Death Road, heading to Chuspipata, then Coroico. 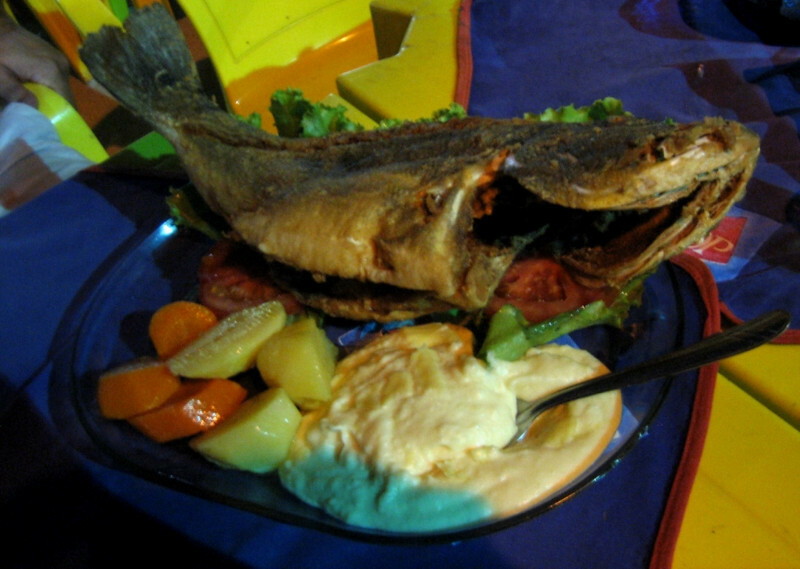 Having some lunch of freshly fried trucha (trout). 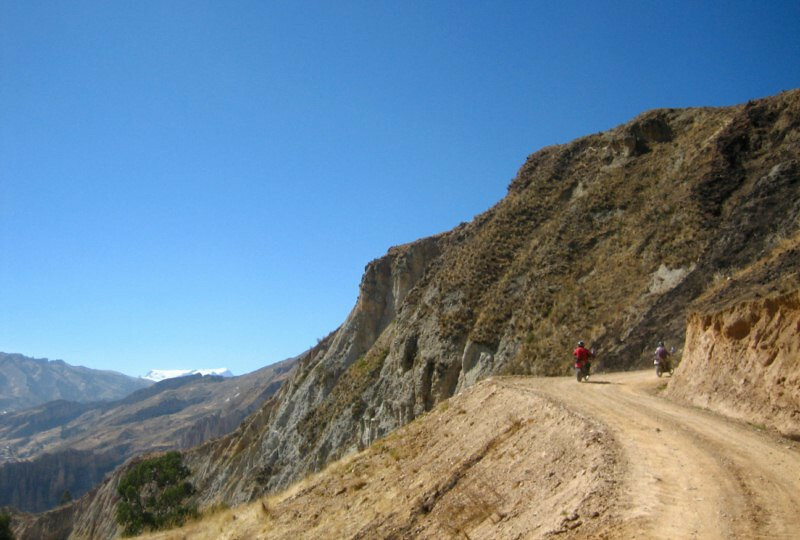 Riding back up to the pass and into La Paz. Getting the corners of my panniers reinforced at a welding shop to prevent future cracks. They’re sturdy panniers, but I’m putting them through lots of abuse with bike tip overs. 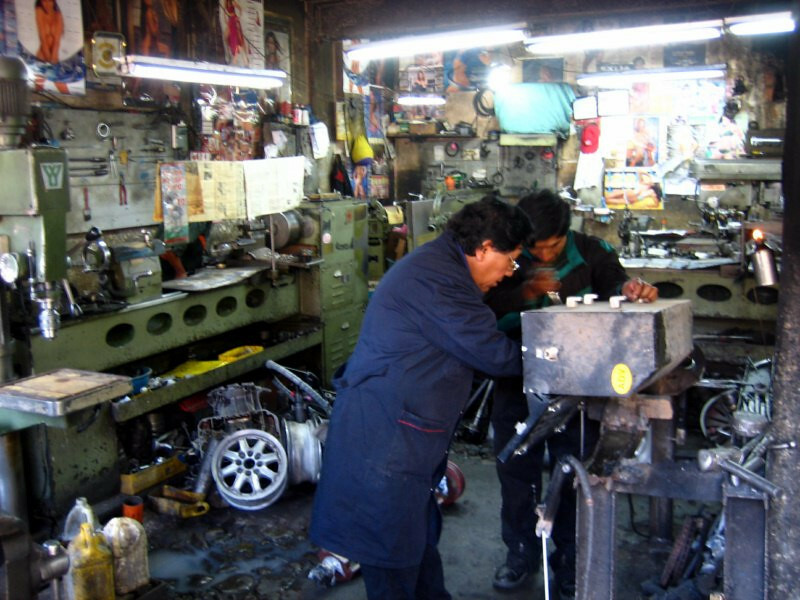 And a nice thing for guys is that in all Peruvian and Bolivian workshops, the walls are plastered in scantily-clad models showing off their merchandise. Yes, make love to the bearing. 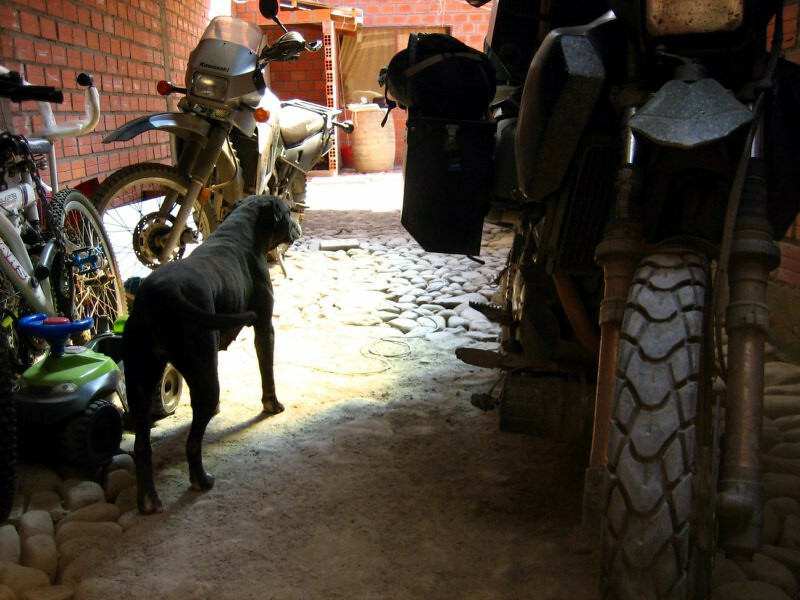 Achira watching over the bikes as I got sanDRina ready for a supposed tour of southwest Bolivia. 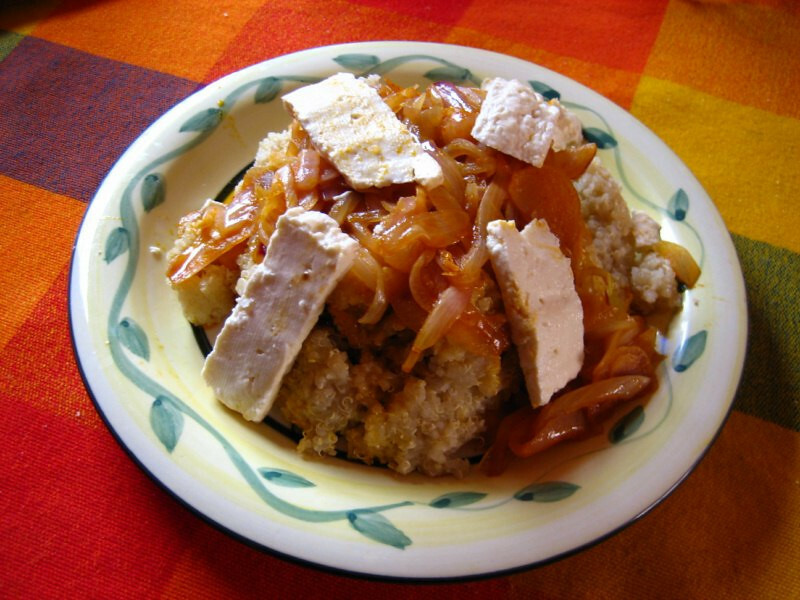 A hearty meal before hitting the road of quinoa, onions and cheese. 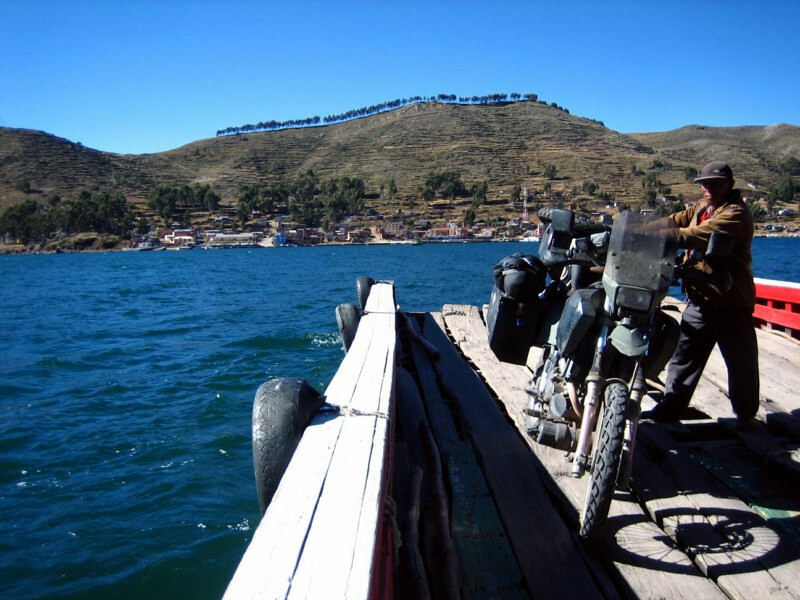 A taste of riding in Bolivia, around the immense and beautiful Lago Titicaca, the world’s highest, largest lake situated at 3,800 m (12,500 ft). 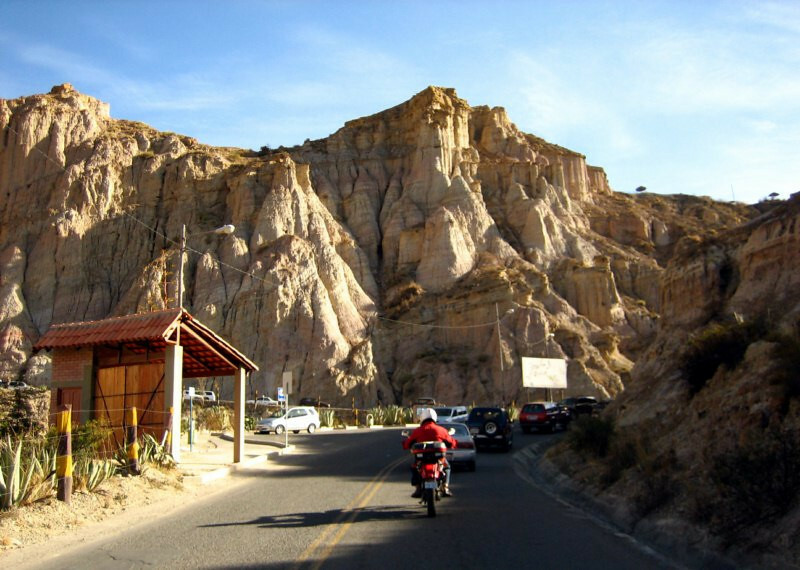 From Cusco, I was heading south to the canyons around Arequipa, but I had a mechanical breakdown with rear wheel bearings failing sooner than they should, but it turned out into a nice experience in the town of Andahuaylillas. 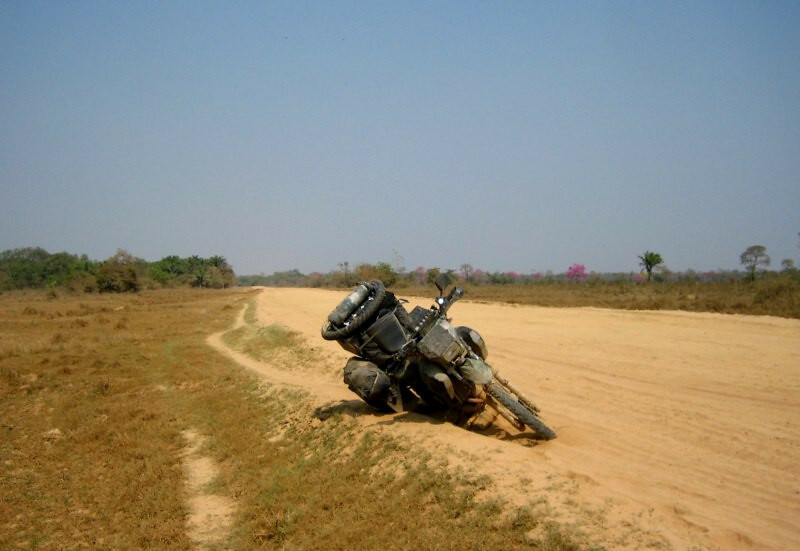 …discovered that the rear wheel bearings had failed. Hmmpf. I felt I was being proactive before the trip by replacing all the bearings with new ones from All Balls. 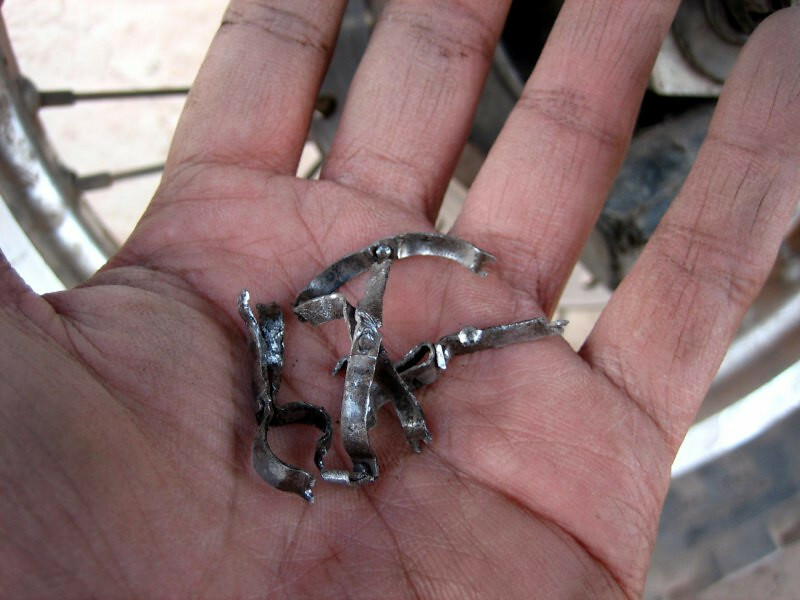 These failed only after 24,000 kms (15,100 miles). Yes, they’ve probably suffered a lot with the weight and the rough roads, but I expected them to last much longer. And therefore, was not carrying any spares. The mangled braces that are meant to the keep the ball bearings in their race. 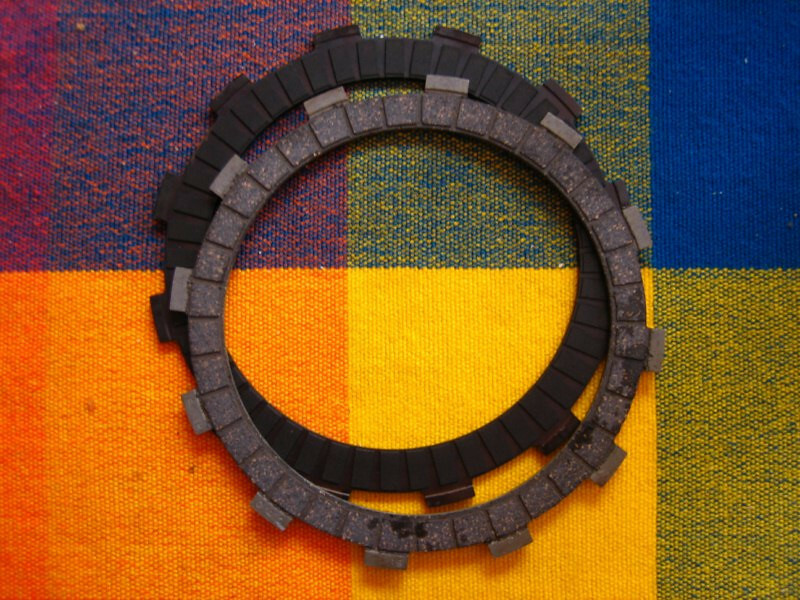 I asked around town and the nearest place to buy bearings would be in Cusco. I tried hailing down a few trucks to give me a ride. Just as it was getting dark, Helmut here came through on his Toyota Landcruiser pickup truck. 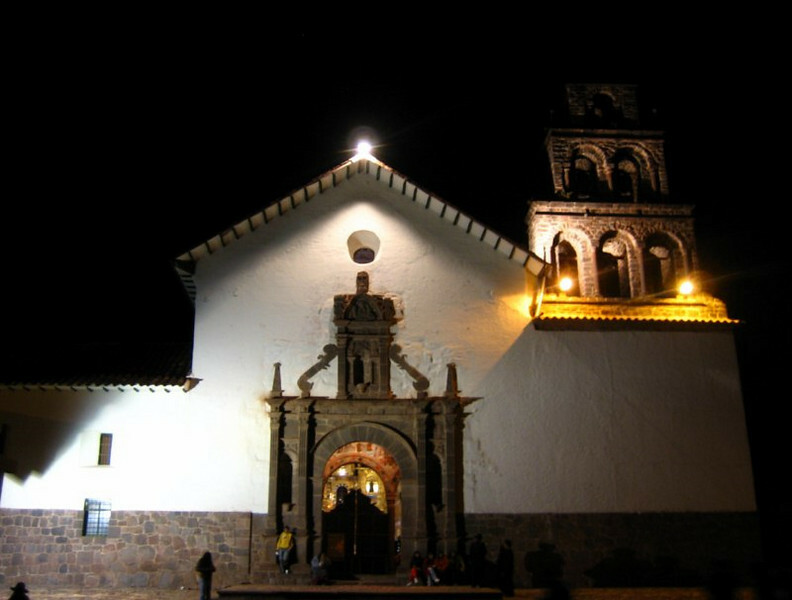 After explaining to him my situation, he said I could stay the night at his house and tomorrow, he’d take me to Cusco. Even if a situation looks tough, it’s only a matter of time before something good happens. 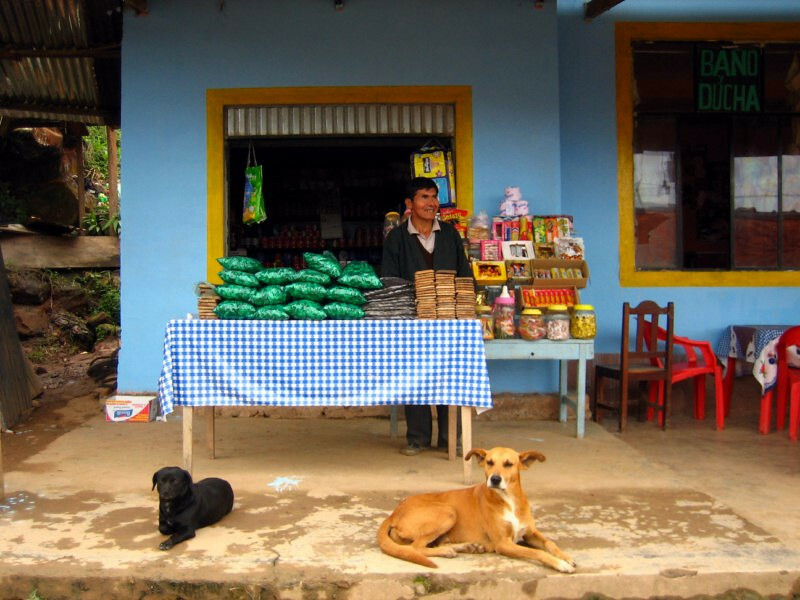 Helmut lives in the nearby town of Andahuaylillas. It’s a sleepy little town and his house is right by the town square. 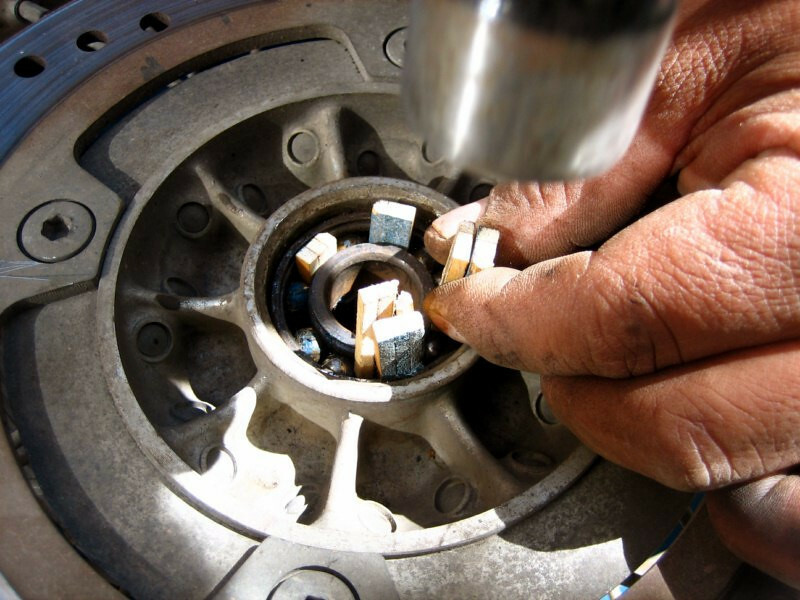 The next morning, one of Helmut’s workers, Henry, helped me remove the old bearings. I decided to change out all the rear wheel bearings (3), just in case. Because if one failed, the others might not be far behind, experiencing the same forces. 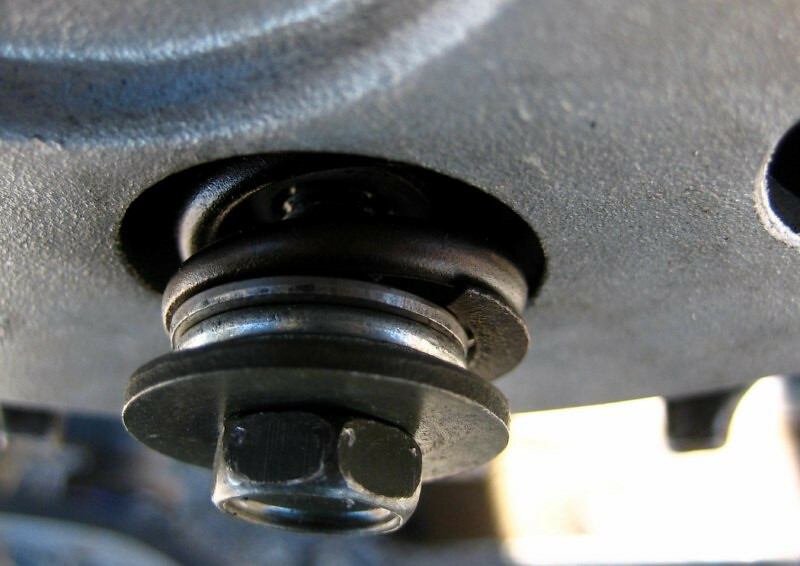 Since some of the ball bearings had already fallen out, in order to remove the bearing, he used this simple trick of hammering in wood pegs to keep the remaining balls spread around the bearing. Worked like a charm. 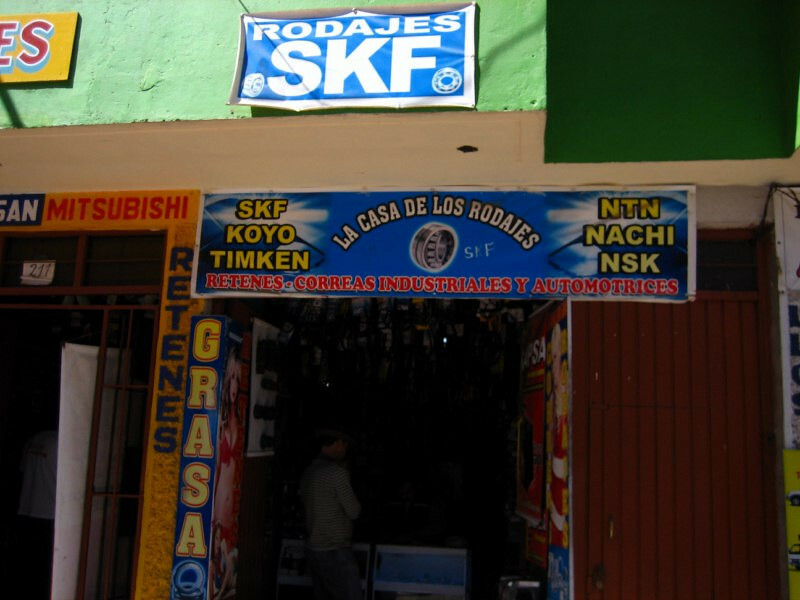 Heading straight to the Casa de los Rodajes (House of Bearings) in Cusco, where I got a set of SKF bearings, a well-known industrial supplier. I also got a spare set of all wheel bearings. 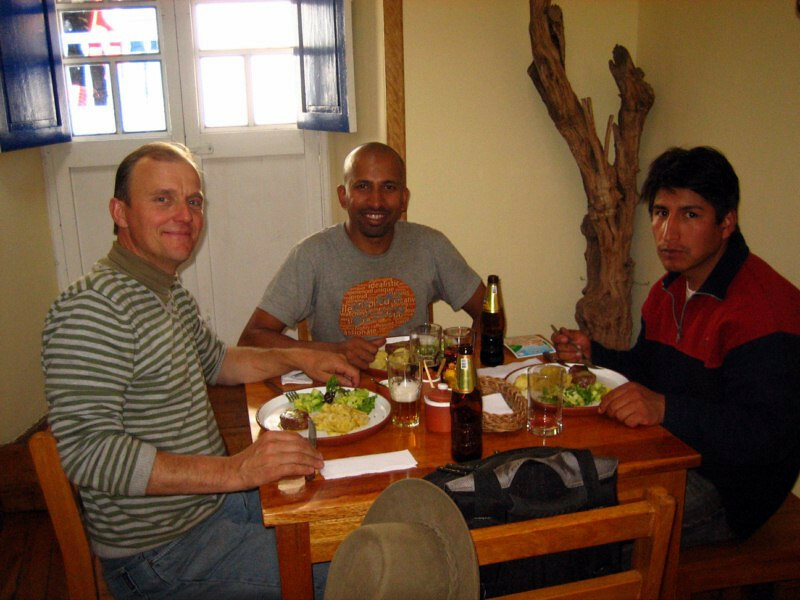 Having lunch with Helmut and Henry in the San Blas barrio of Cusco. Helmut is from Germany and came here around 25 years ago to monitor an aid project with communities in the jungle and decided to stay. 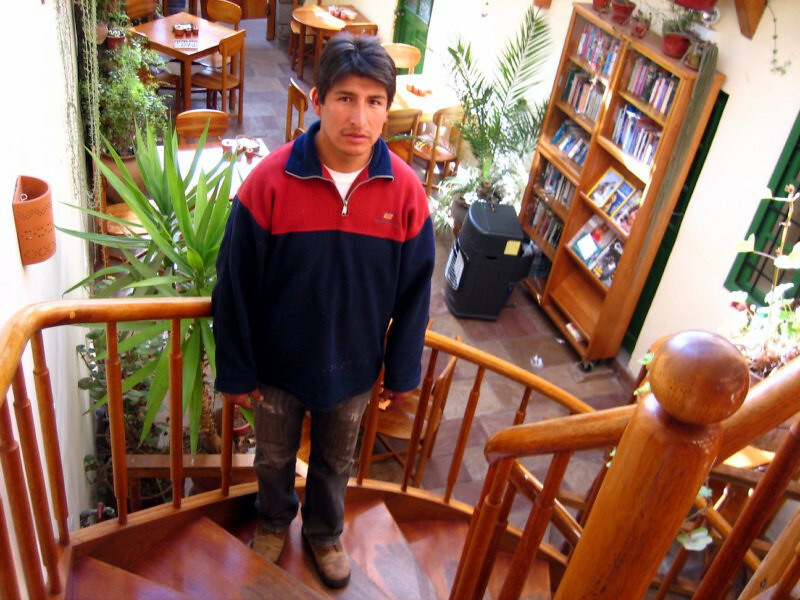 He’s a carpenter and runs a small business doing jobs for the hotels around the area and restaurants, such as the one we’re at now, Granja Heidi, an Alpine cafe. Helmut and his team made all the furniture. 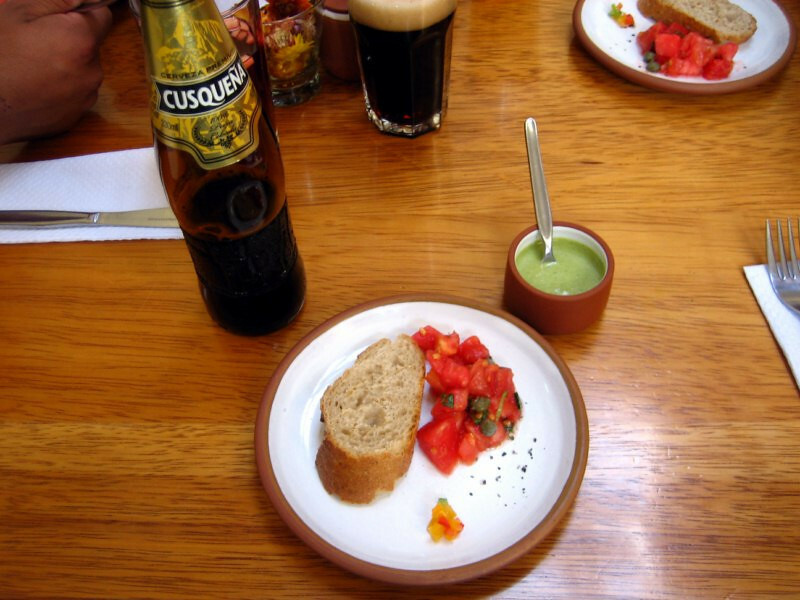 Starting the meal with some bruschetta and Cusquena beer, a tasty, malty dark beer. 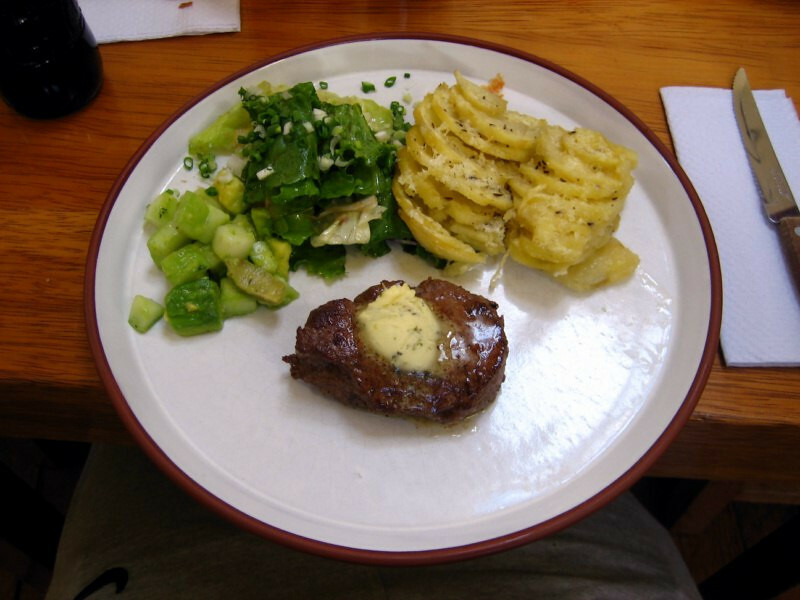 Meal of the day of grilled steak with cheesy potatoes and some stir-fried veggies. The plate is huge, making the food look small. Henry standing on the circular steps that he made 10 years ago. 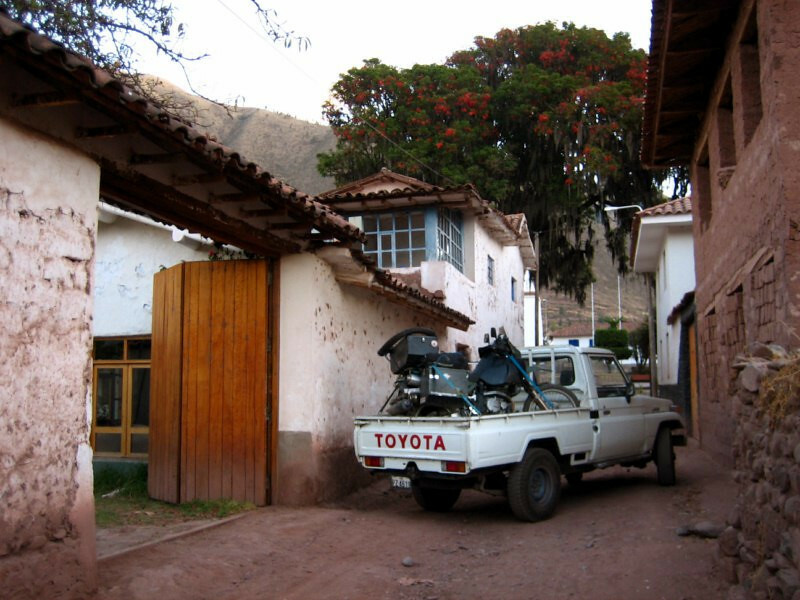 Exchanging jeeps at Helmut’s second house in nearby Huari. He bought this 300 year old house that came with some farming land and he’s started growing his own crops. 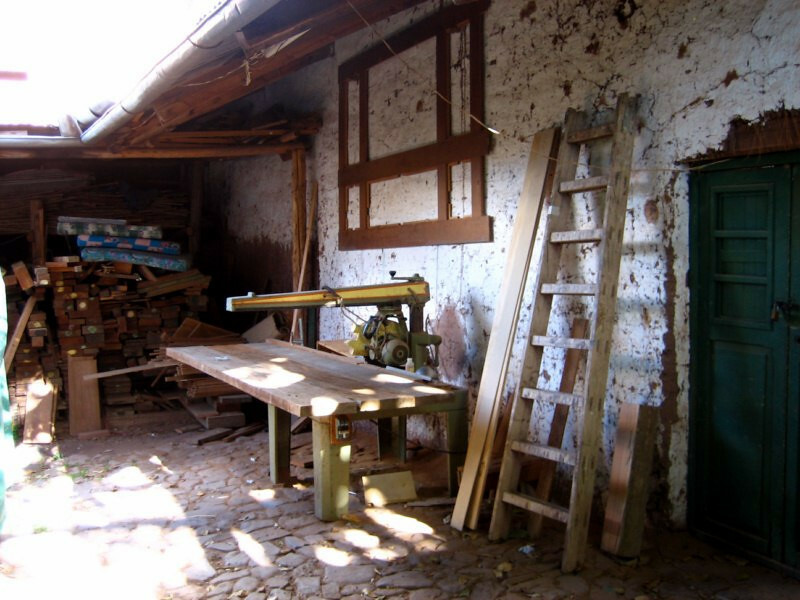 The area is also used to store wood for his upcoming projects. He helps out some rural communities with his work and actively seeks to employ them to get some prosperity flowing into their towns. He also heads off into jungle to work on development projects from time to time. 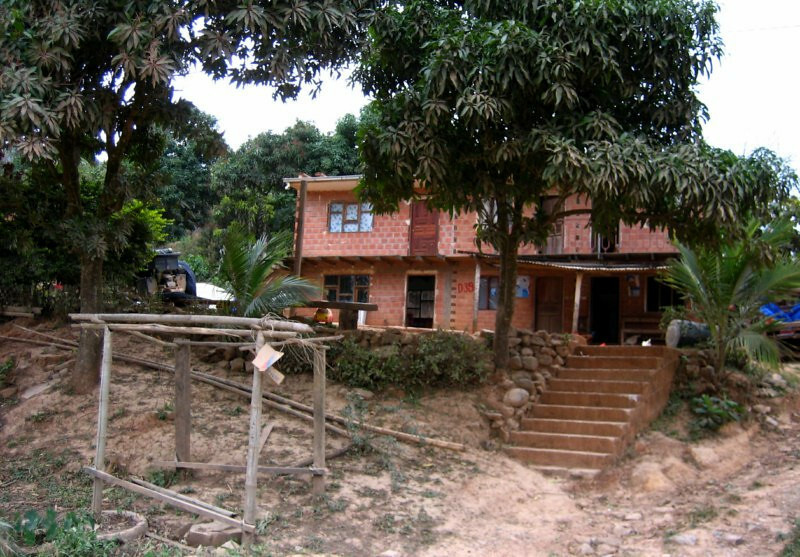 A more modern house at his second property. 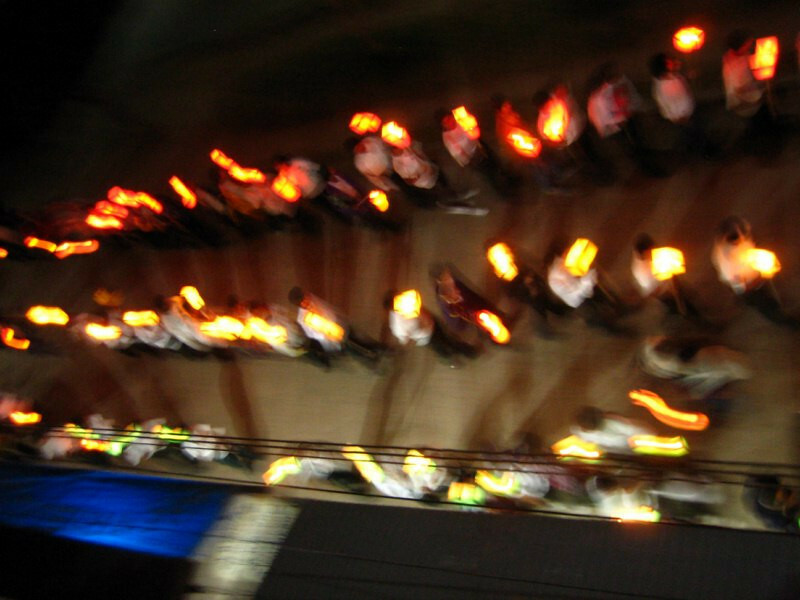 We were walking around the town of Huari and came across this celebration in front of the church. Having a hot corn-based drink with some alcohol, which went well with the chilly evening. Helmut likes to cook and has a very inviting kitchen. You can see why I enjoyed my stay here. The boy at the sink is Julio, a kid from a rural community who stays with Helmut for free as long as he attends school and helps out around the house. Cutting lots of vegetables for a tasty soup. 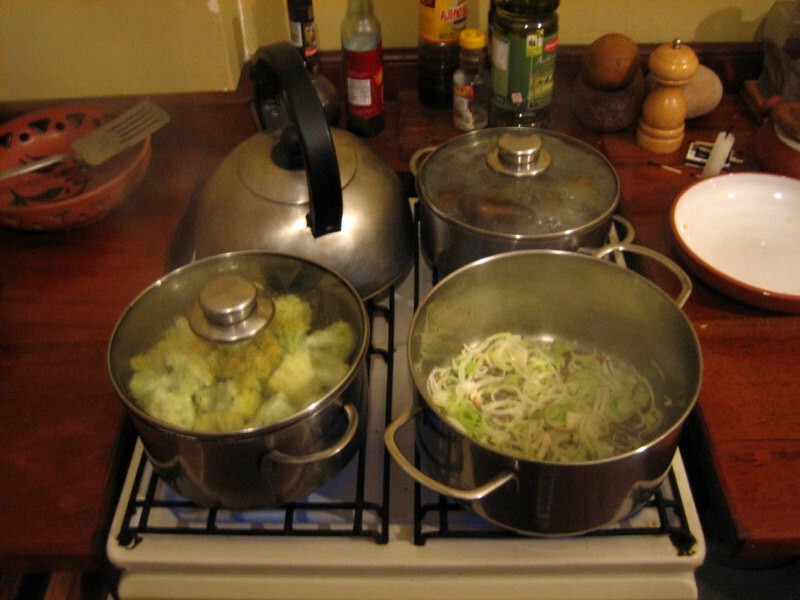 All four burners going, heating water, cauliflower, beet roots and onions. Timely preparation of the soup, because I fell sick the next day. I think it was because I ate some stale potatoes and could only manage to keep soup down until the fever broke the next day. 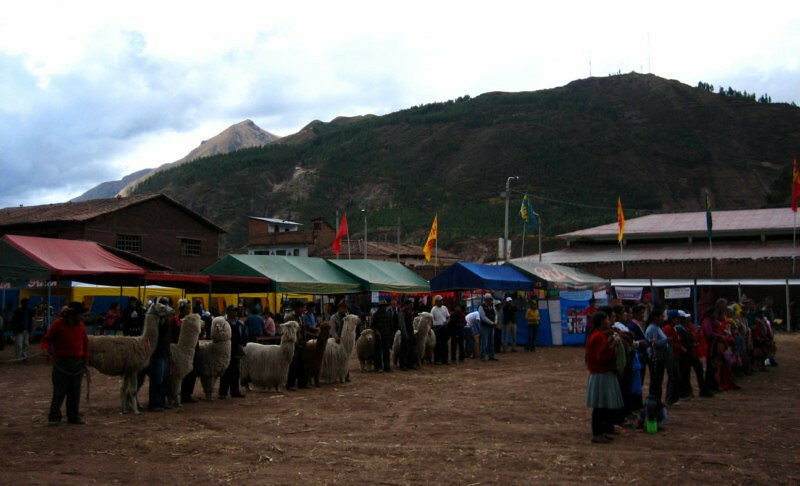 Checking out the local annual fair at Huari of the Virgen del Carmen Expo Feria. 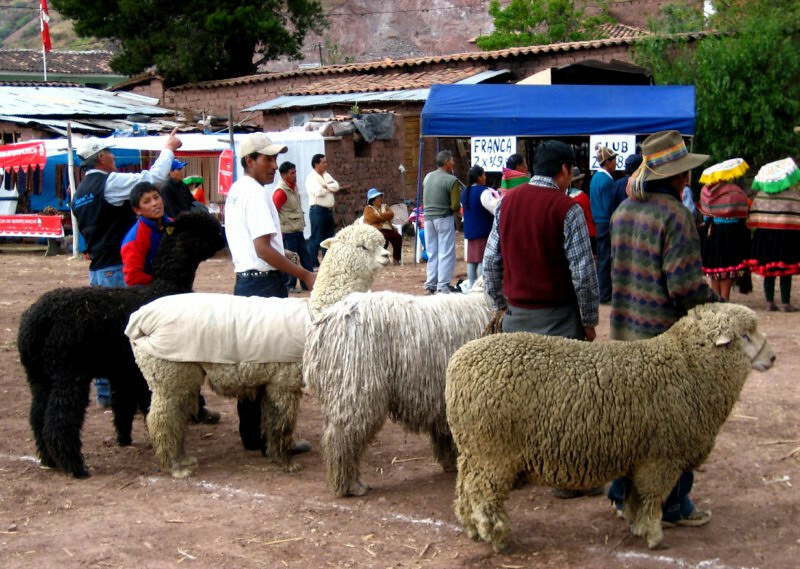 All the Andean domestic animals were on display. But first, some grub. Everything was deep-fried, from the chicken to the sausage and the bread. The white on the right is cheese and the yellow in the middle is roe, fish eggs. 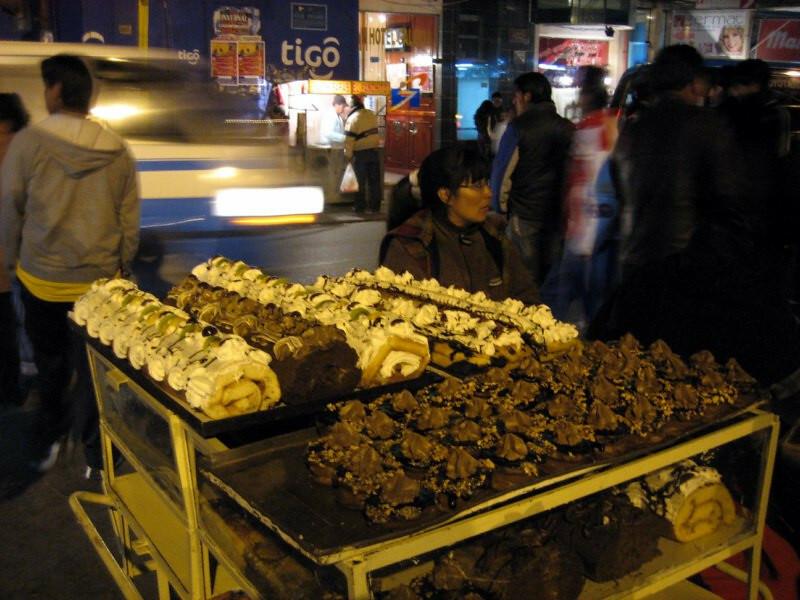 Buried underneath is all kinds of internal organs, all deep-fried. Looks better on a plate. The dish is topped with sea-weed. 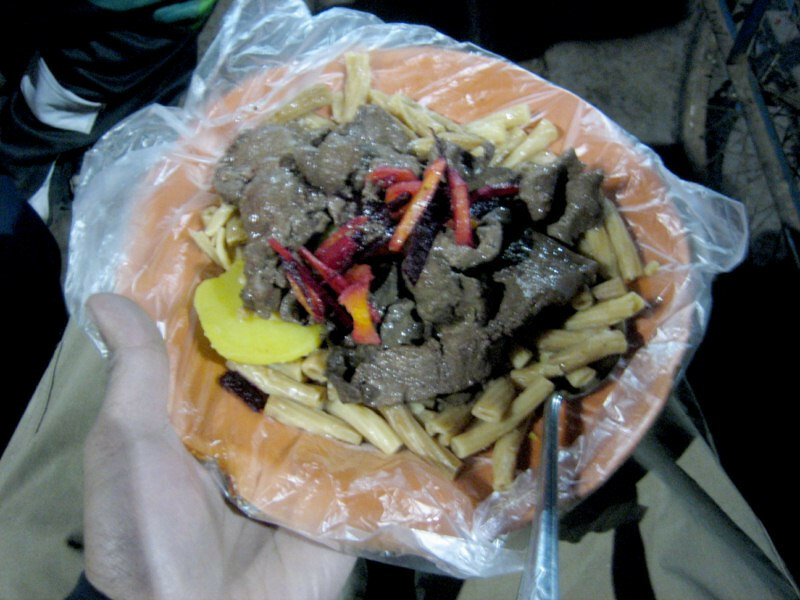 I’m surprised it’s part of the local diet at 3,050 m (10,000 ft). 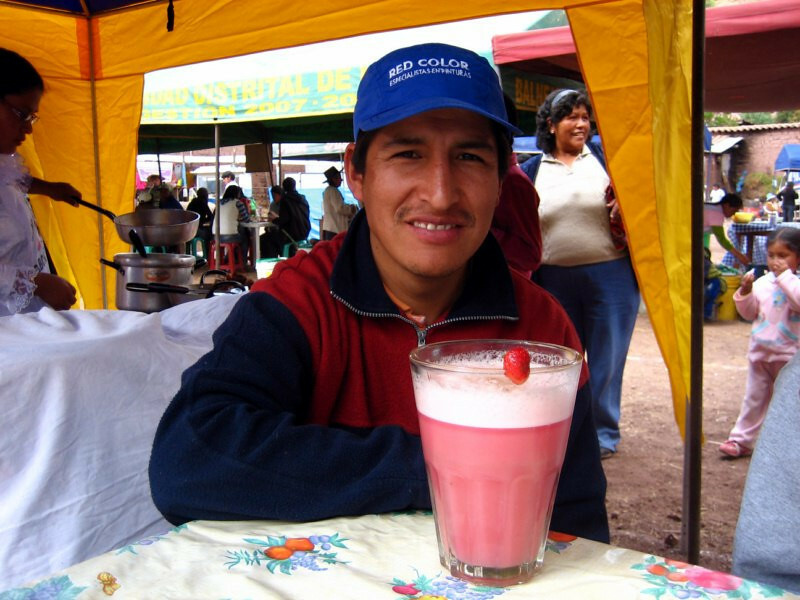 Henry having a man-sized glass of Chicha, the local alcoholic beverage made from fermenting dark corn. It’s not that strong at around 2% alcohol, so that’s why you’re served a large quantity of it. Helmut and all his workers enjoying a day at the fair. On the agricultural side of the fair; I guess there was a contest to see who could bring in the most varied types of potatoes. Each one is a different kind. 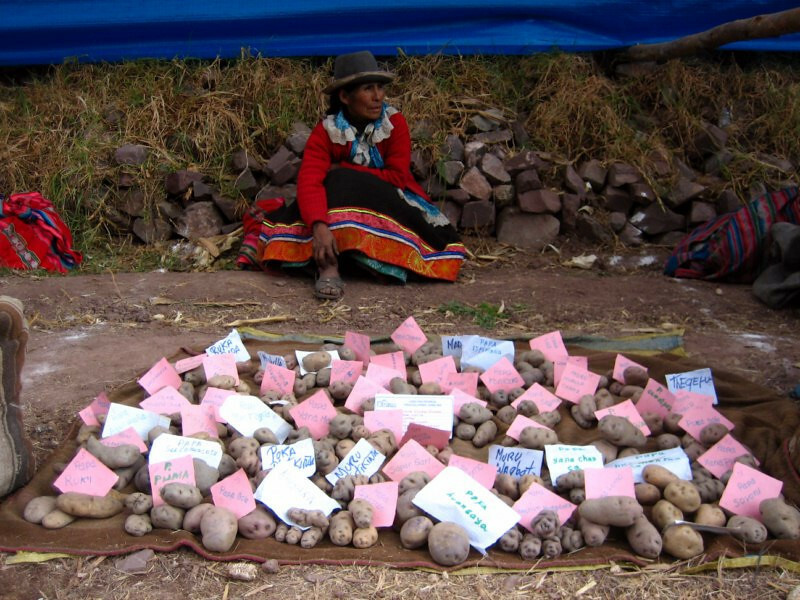 Very fitting since the potato was first domesticated in southern Peru around 3000 BC and was the staple food of most civilizations here and only brought to Europe when the Spanish arrived in the 16th century. 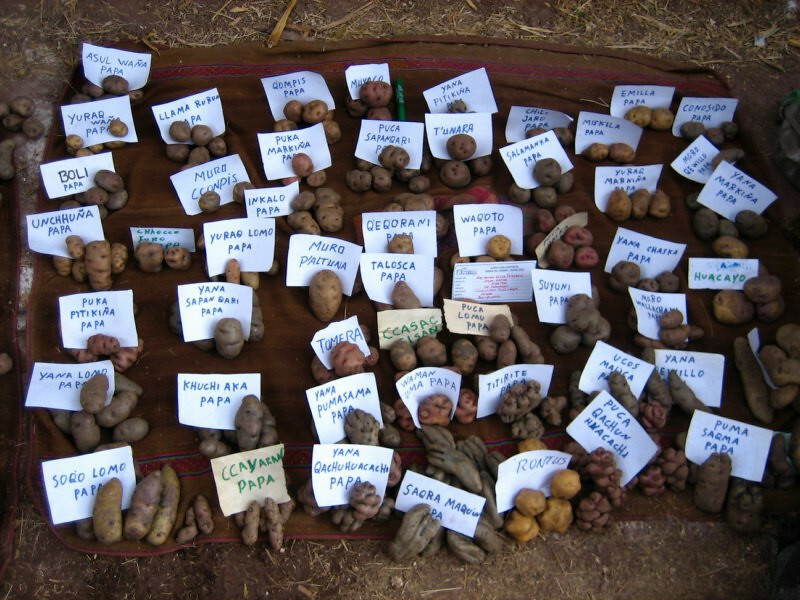 They aren’t kidding when they say there are over 4,000 kinds of potatoes grown in the Andes. Seeing nature’s vast biodiversity within a single species first stand sure makes me question the limited choice that we’re presented with in the supermarkets of the world. 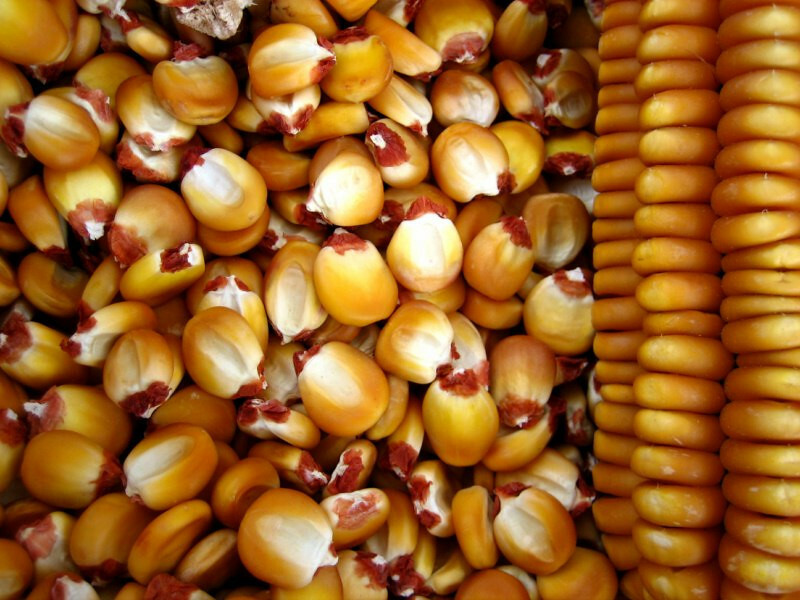 Besides potatoes, corn or maize is also important to the diet here. 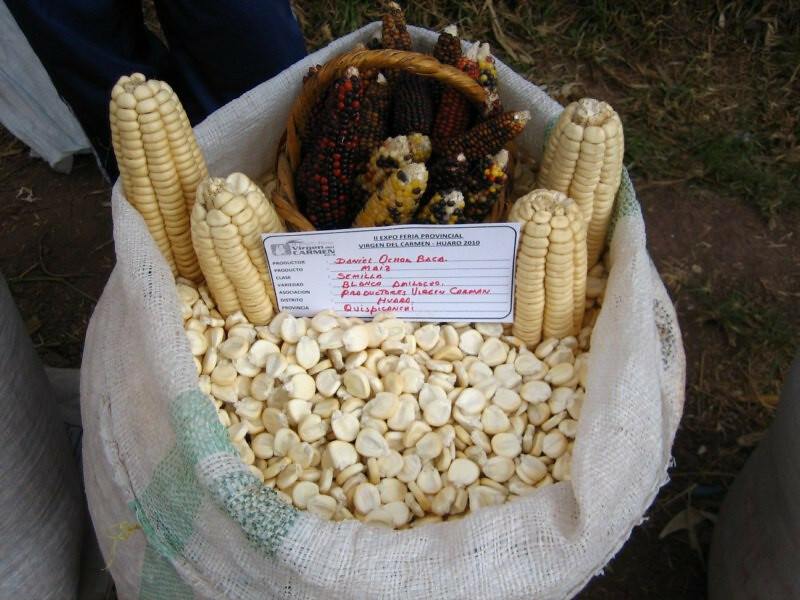 Farmers showing off their different varieties of maize. 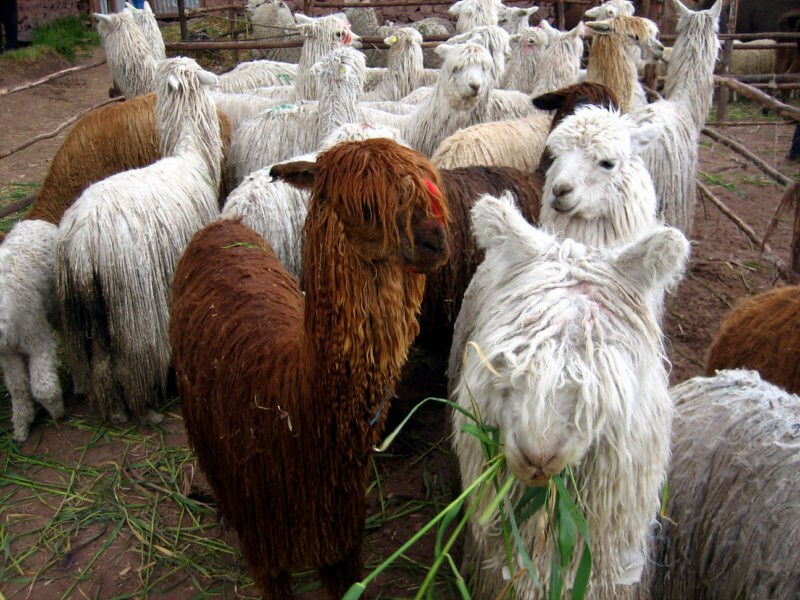 Alpacas, a relative of the llama and this variety with the cool dreads is called Suri. 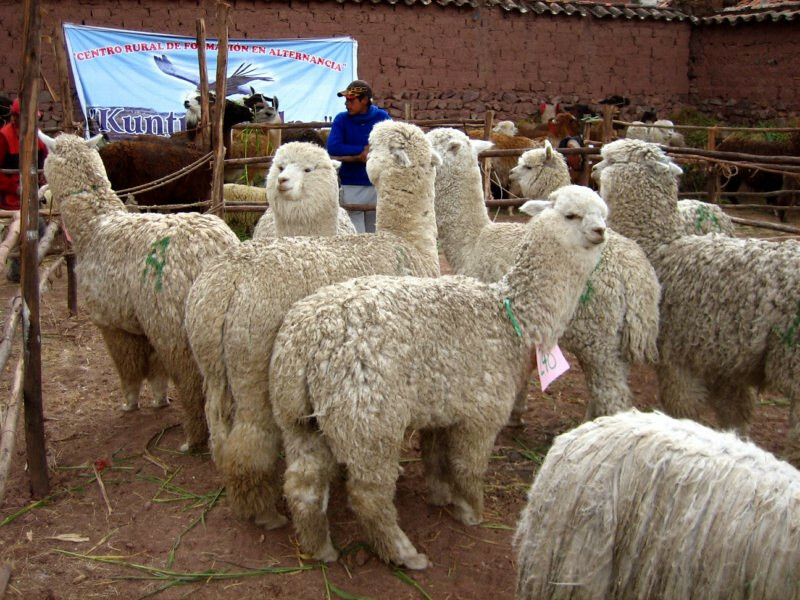 The regular variety of Alpacas growing a different kind of wool. Universal displeasure from visiting a dentist. Getting the teeth in shape before the beauty pageant. This guy’s got a funky face pattern. 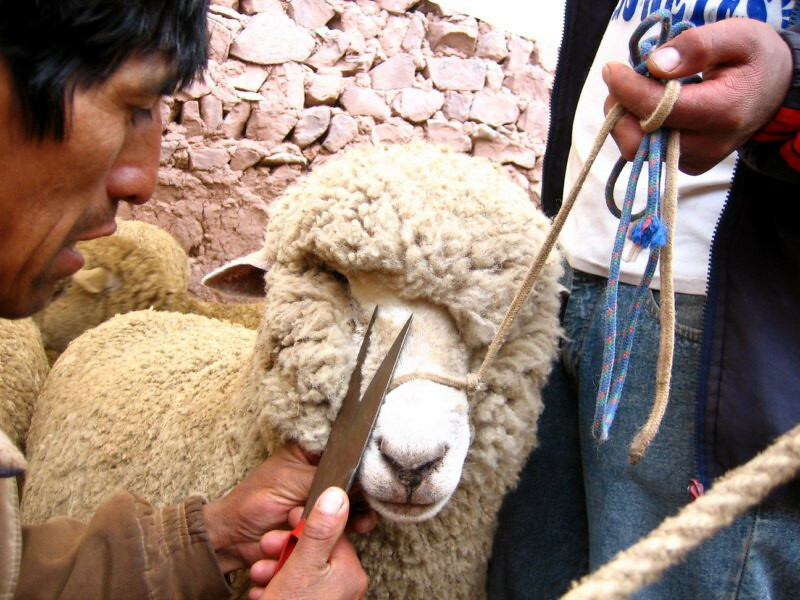 Getting a trim from the barber and surprisingly the animal didn’t get it in the eye with the amount it was fidgeting around. The beauty contest amongst the animals. 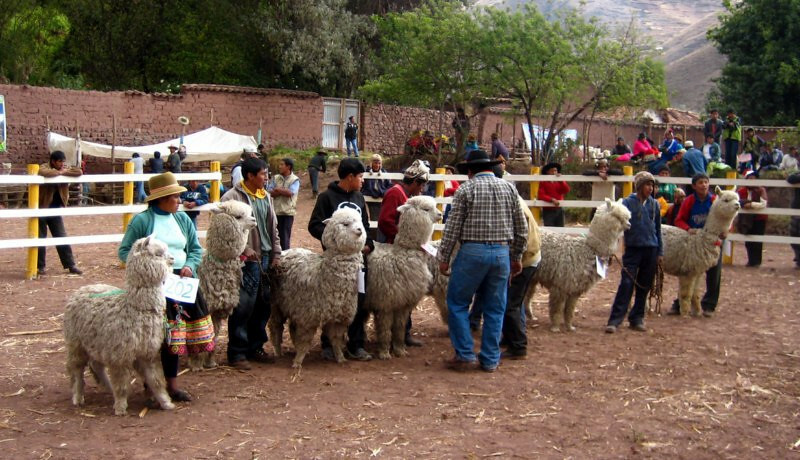 The one with the red sash is the reigning Alpaca champion. The next round of contestants lining up. This animal did not want to move, clearly displeased at being disqualified during the first round. The judge choosing who should move ahead to the next round. He was looking at the quality of the fur. 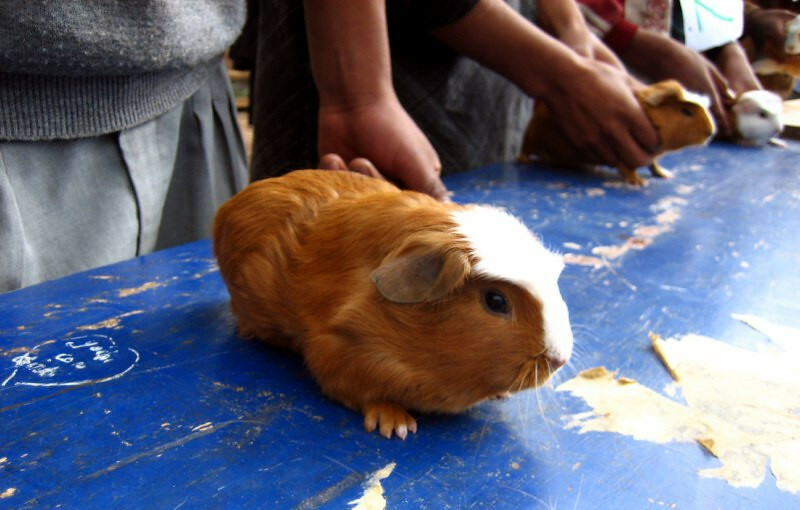 And of course, the most important Andean domestic animal in the small realm, the guinea pig, cuy. 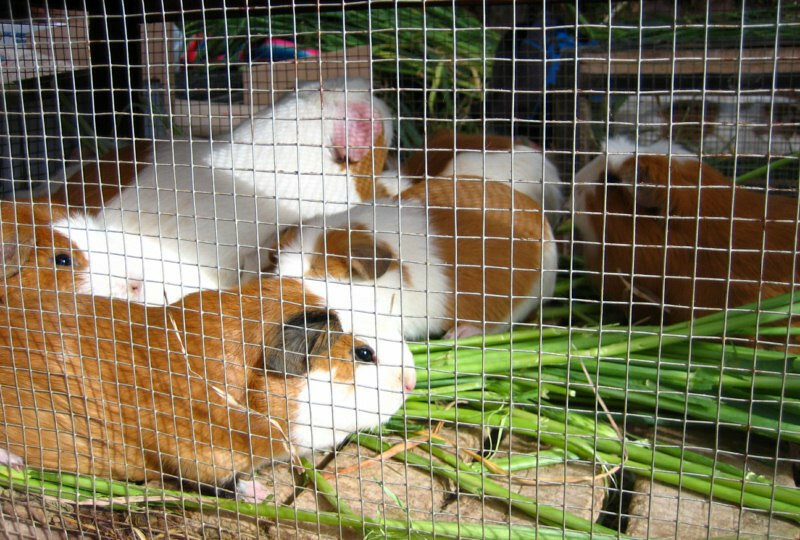 Breeders lining up their best cuy on the judging table. A judge inspecting this little guy. 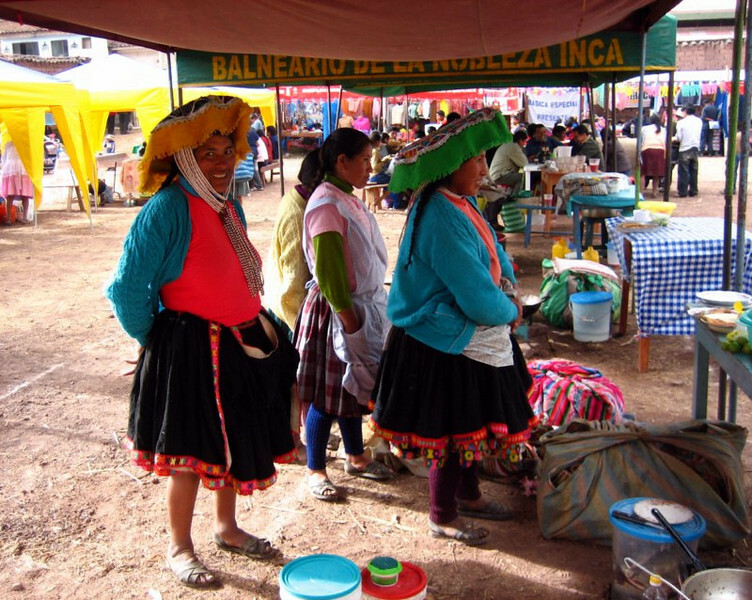 Women wearing traditional clothes of the region at a booth. We strolled over from the fair to Helmut’s second house. This is the patch of land that he’s cultivating. 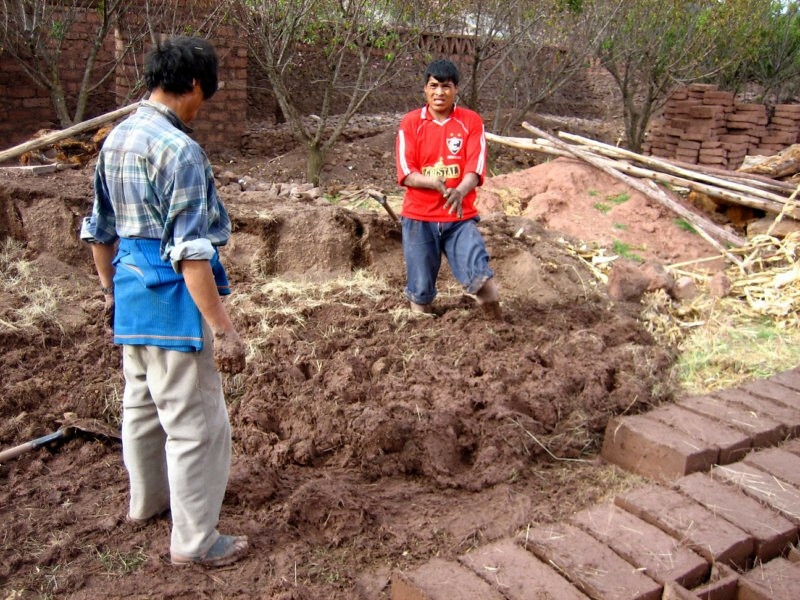 He’s building a small house on the property to house workers when they come from the jungle and a building technique common in this area is mud and straw bricks, just sun-dried and not kiln-fired. 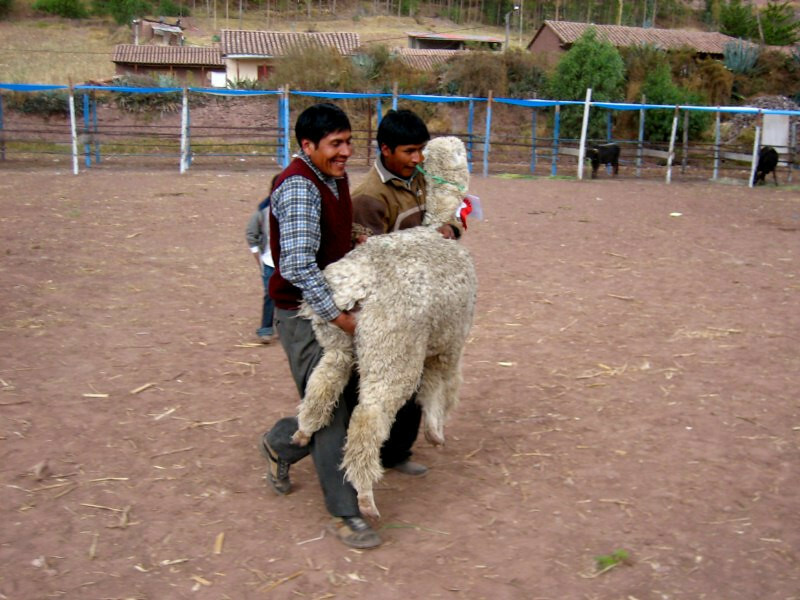 I guess they’ve been doing this since the Inca days. Mashing the mud and straw mix before it gets shaped into a brick. The house under construction. 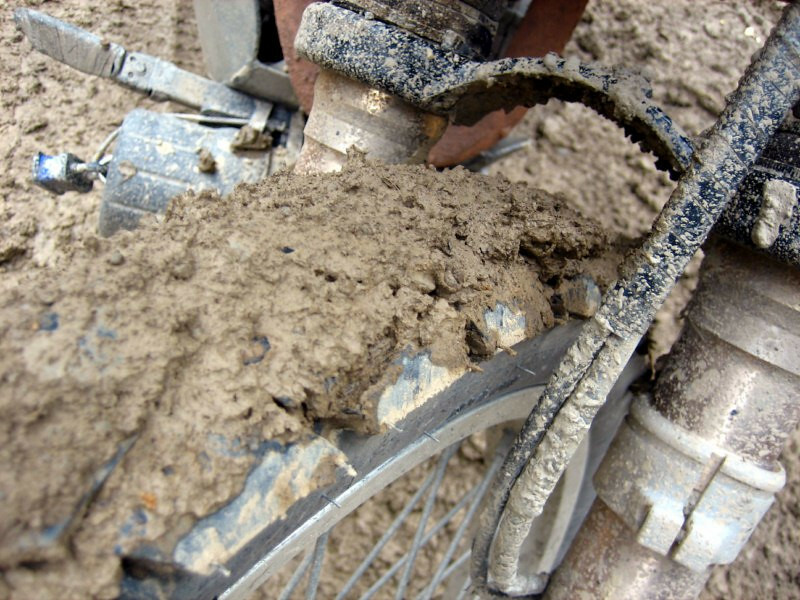 And the mud also works as good insulation for the cold. 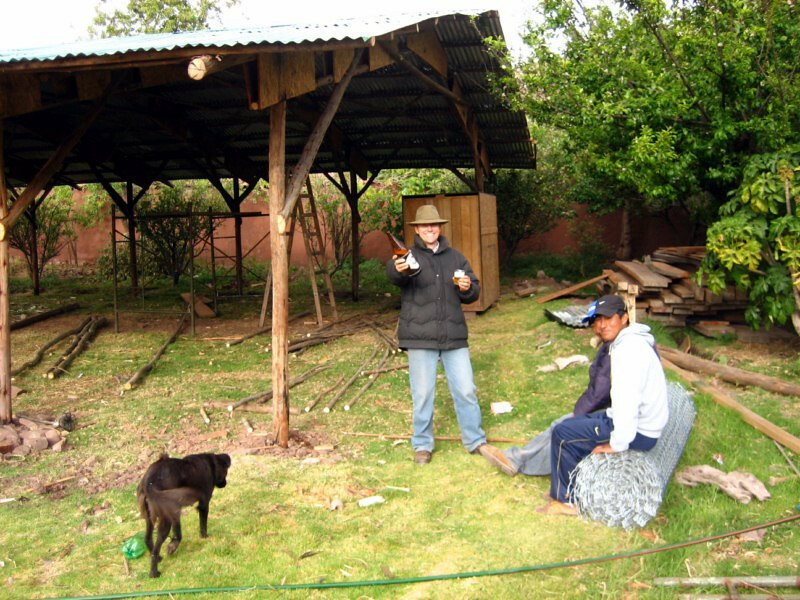 Helmut and the guys just finished putting up this shed to house lumber and an inauguration ceremony in these parts involves all the workers giving an offering to the ground, Pachamama (the sacred Earth for the Incas) and then having a small swig yourself. Here, the offering was some beer that was poured at the four corners and I can easily imagine the past cultures offering whatever liquid was valued at their time. The 300 year old house on Helmut’s property. It’s unsafe to live in right now since the foundation is crumbling and he said it’s more expensive to keep this house up, rather than to build a new one. He said a Spanish general used to live here according to the local history. 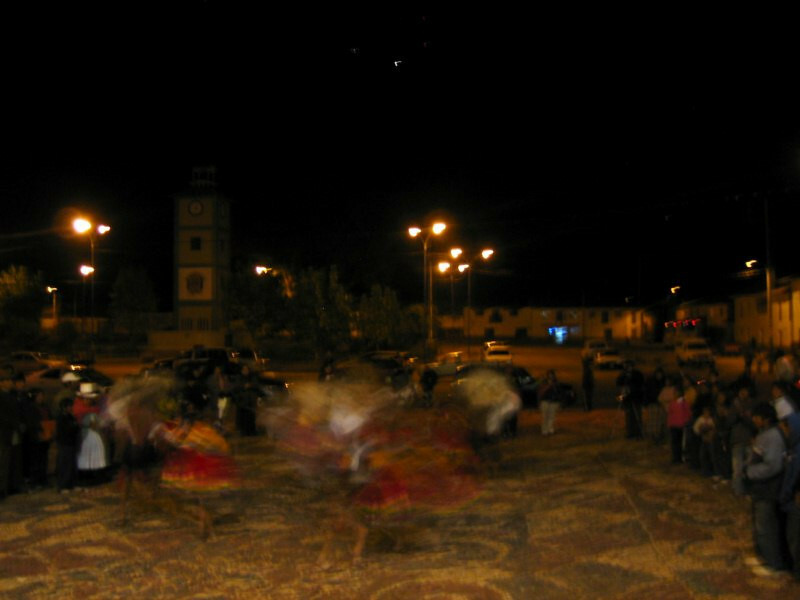 That evening was a special affair in Huari. An old organ, dating to the 16th century, from a nearby church was carefully restored by specialists and tonight was its showing to the public. 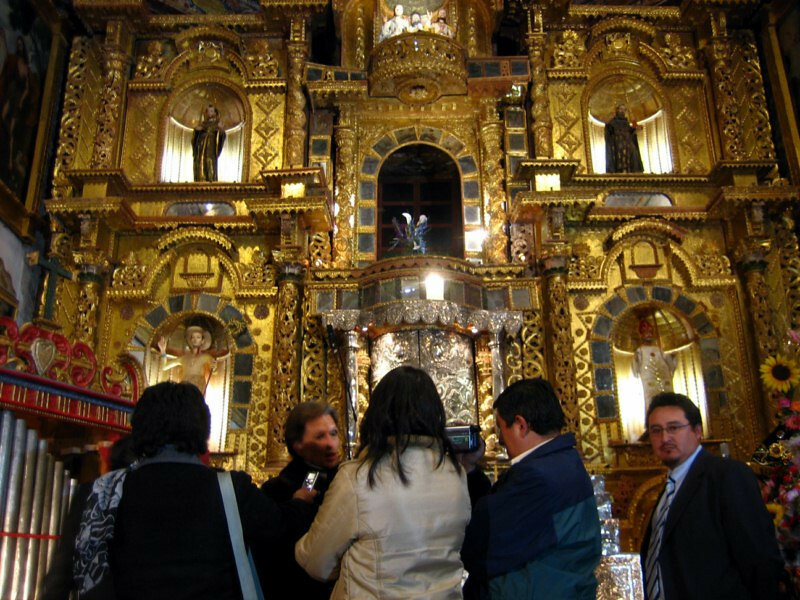 A organist from Argentina came to inaugurate the organ and lots of dignitaries were at the show as well, people and groups that had sponsored the restoration. The performance was about an hour long and quite interesting. The organ is the red object that’s in the lower left on stage, under the grand, gold-leaf covered altar. The French government was one of the major backers through the World Monuments Fund and so the French Ambassador to Peru was here for the show (the fair lady being interviewed by the local media). 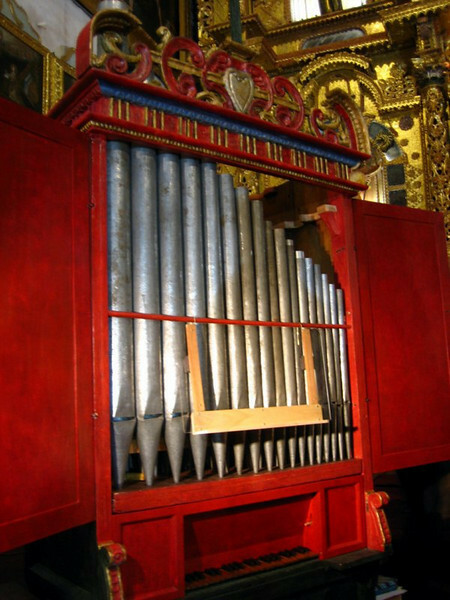 The organ from the 16th century that was restored and brought back to life. 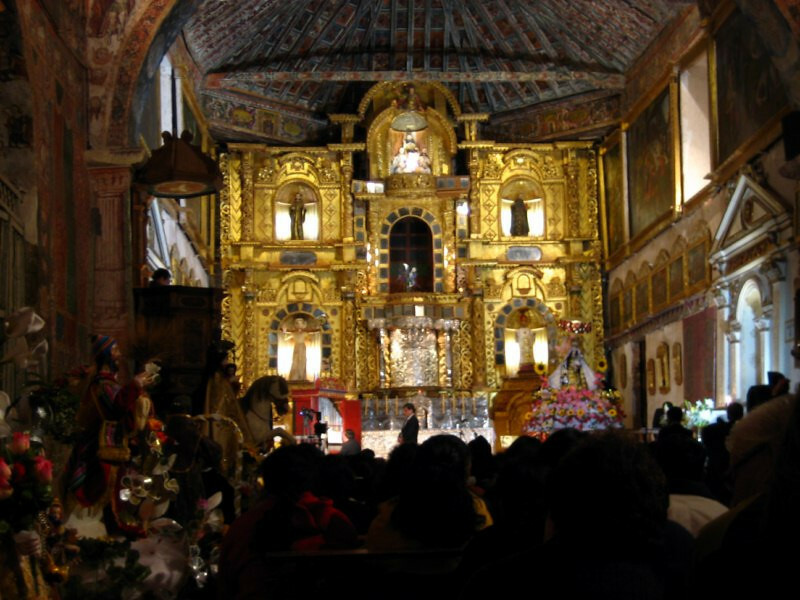 The church itself at Huari is quite a sight. 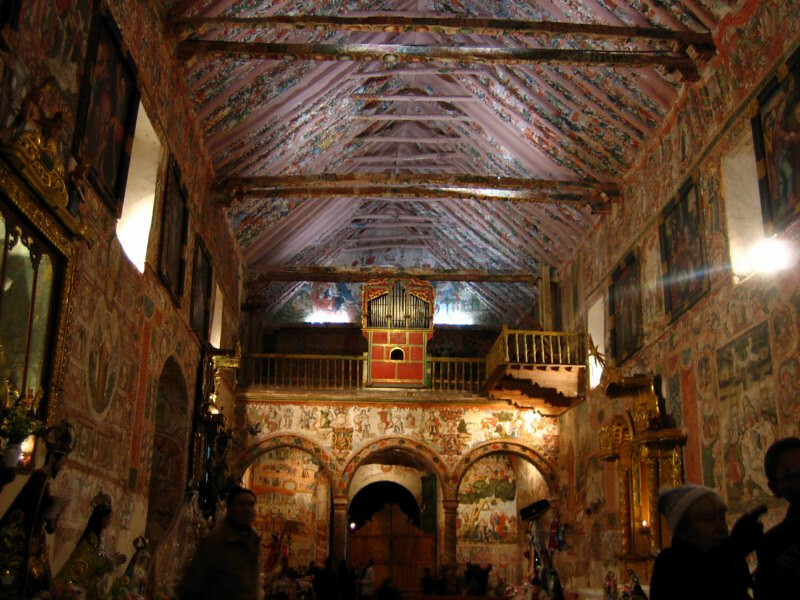 All the walls were painted telling various biblical stories. 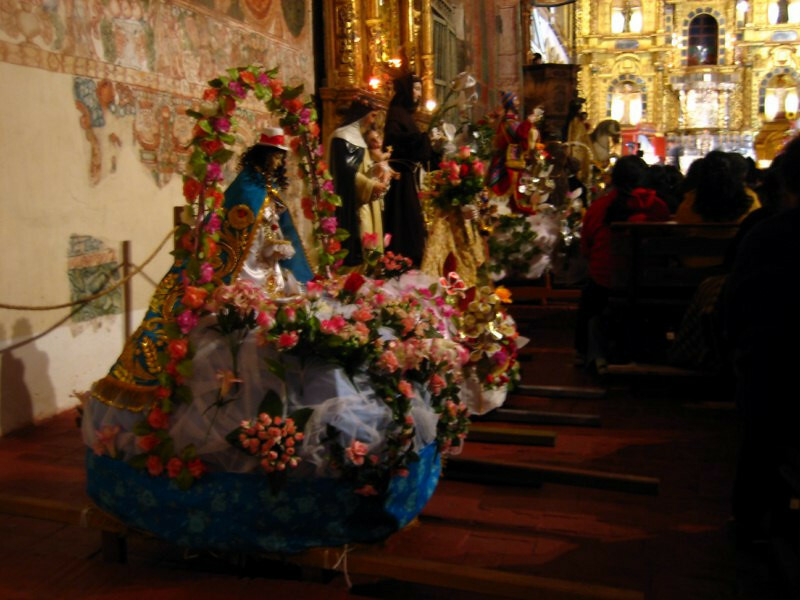 Statues of the Virgin Mary and Jesus ready to be carried around during festivals. 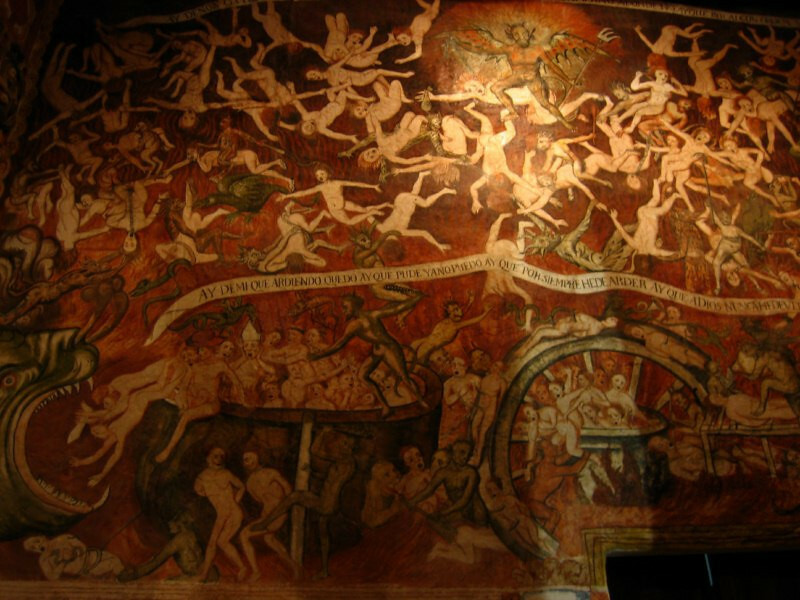 A grand fresco by the entrance depicting a gruesome Hell and encouraging all sinners to repent before entering the house of god. 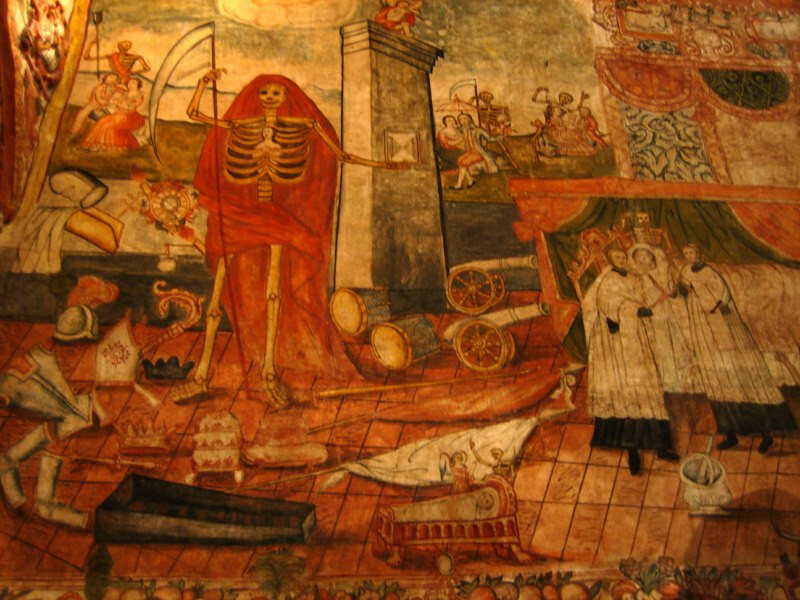 I would say most of the frescos were quite macabre with lots of death motifs. I guess scare-tactics worked quite efficiently in converting the pagan masses to Christianity. 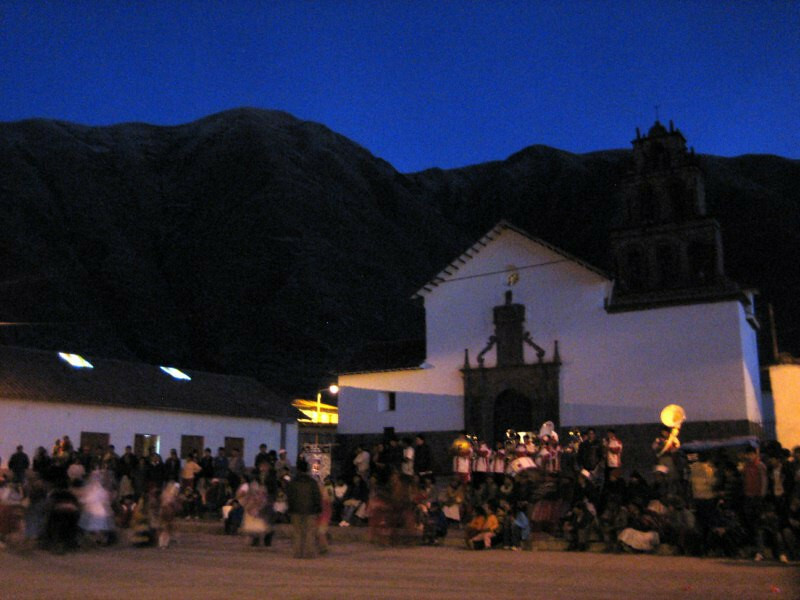 After the performance, hors d’oeuvres were served along with pisco (Peru’s brandy) as the local kids put on a dance outside. The front yard was surfaced and decorated with colored pebbles. The bland exterior of the church being modest of the rich visual treat on its insides. I still hadn’t gotten around to putting in the new bearings and poor sanDRina was without a rear wheel for a few days. 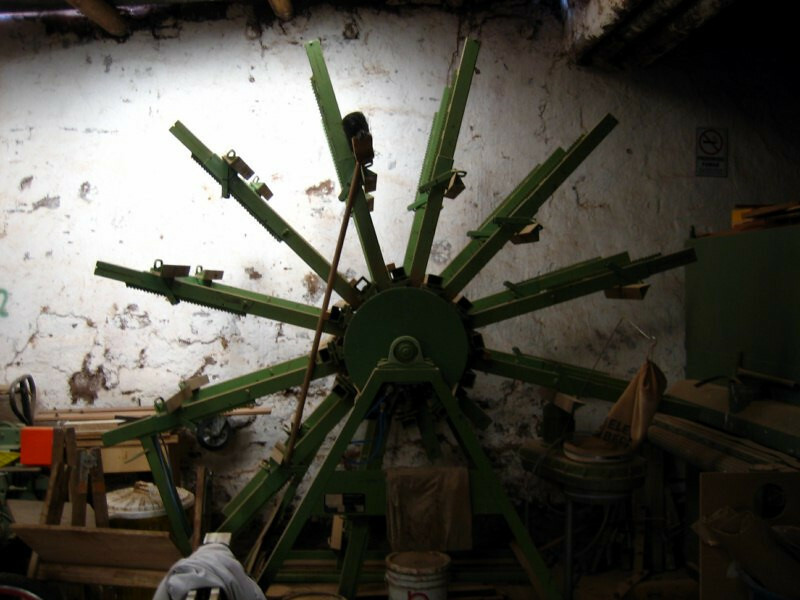 A machine used to dry wood that’s been adhesively bonded. The pieces are put on each arm and then spun around. 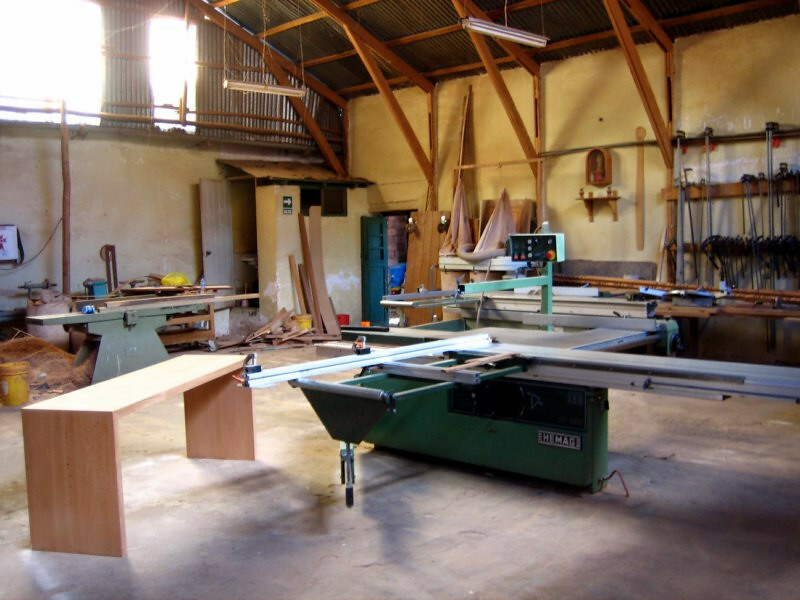 His main shop area where furniture construction takes place. 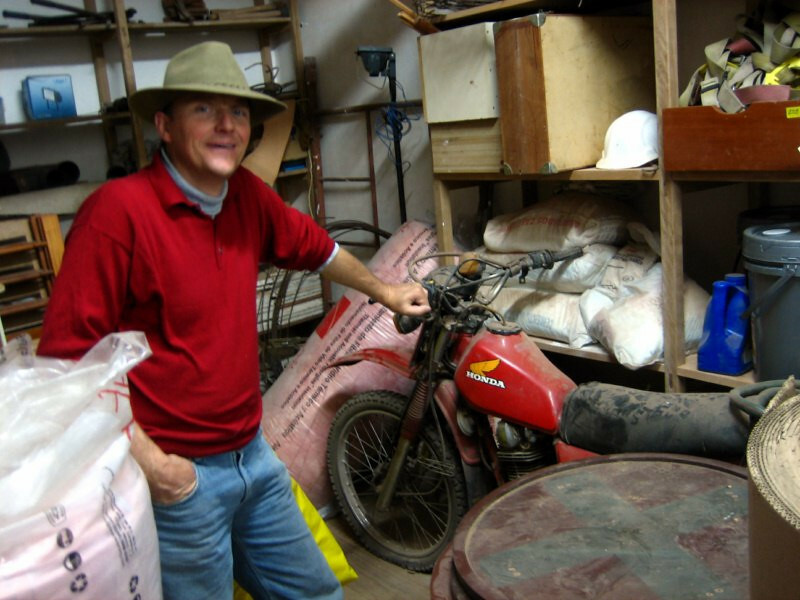 Helmut showing me his neglected Honda 200 cc bike. He said he was now inspired to get it out of storage and have it running again. 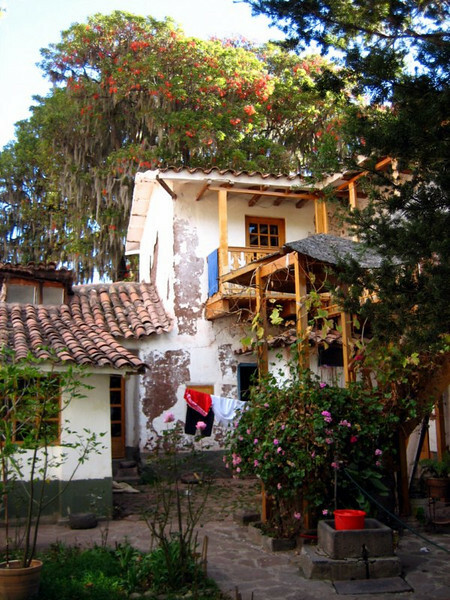 Helmut’s beautiful house in Andahuaylillas. It’s about 300 years old also. 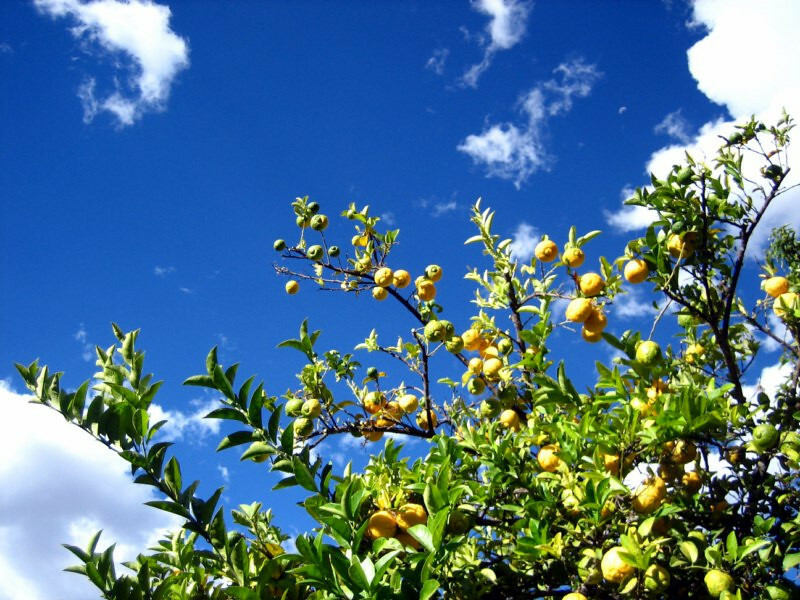 The grounds were well-kept with flowers and various fruit trees. Lime tree shining in the sun. 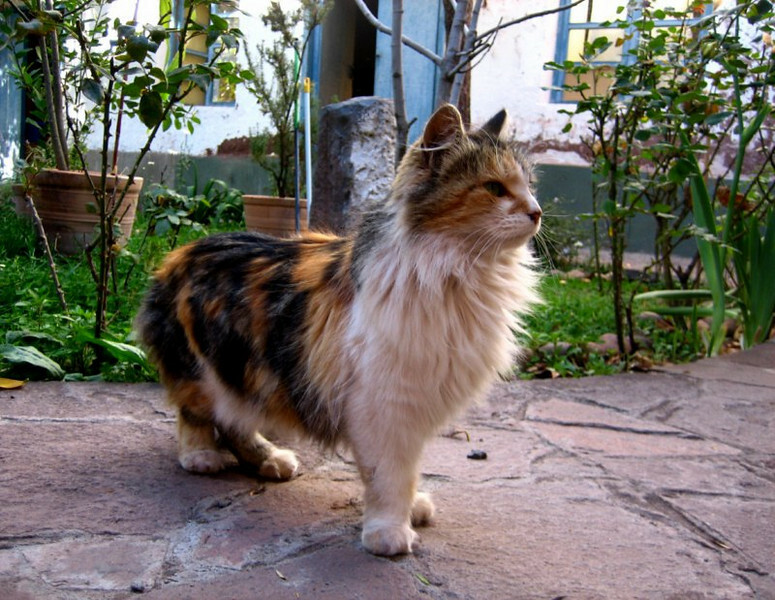 One of his cats, Sasha that was very mean to his dog, pouncing on his face if he got close. 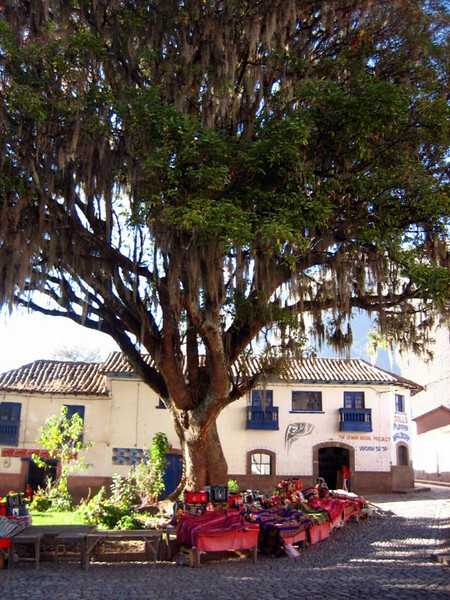 A shady tree in the central plaza outside. 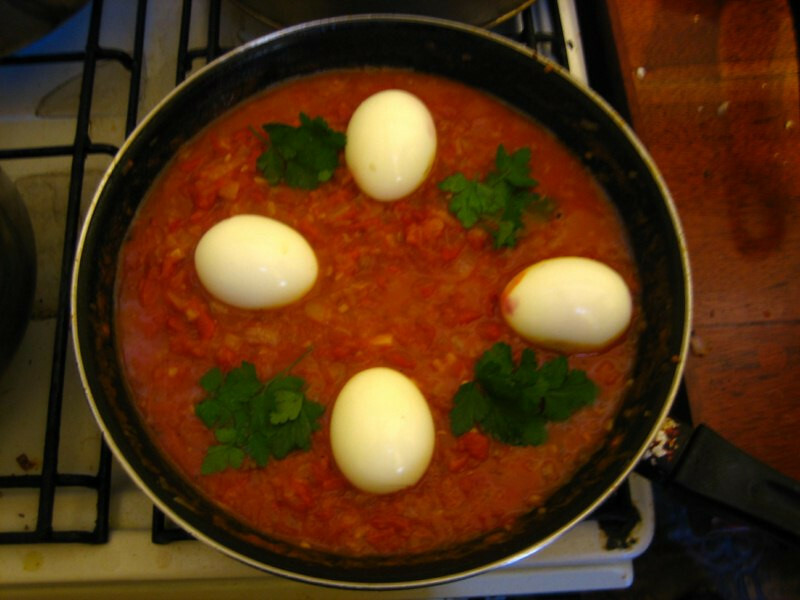 That evening we made an egg curry when his girlfriend from Cusco came over. 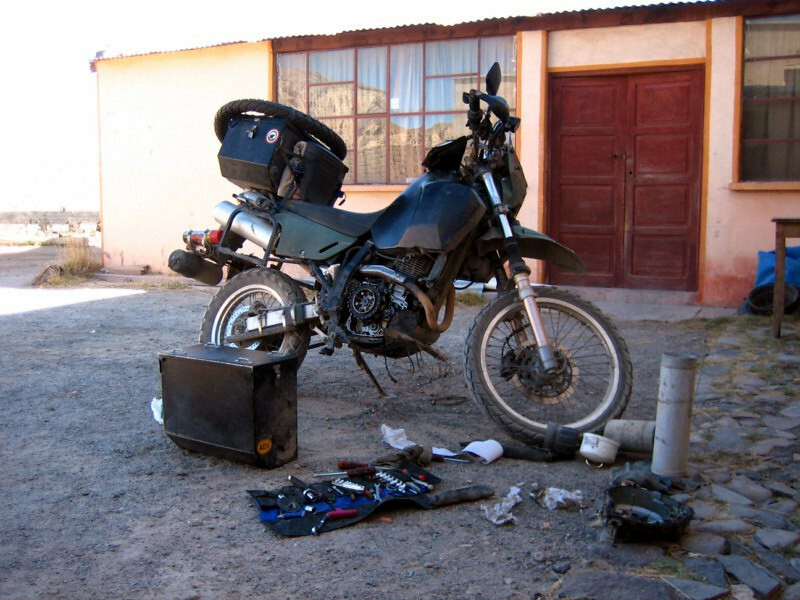 Finally installing the new SKF bearings and putting sanDRina back together, ready to head into Bolivia. 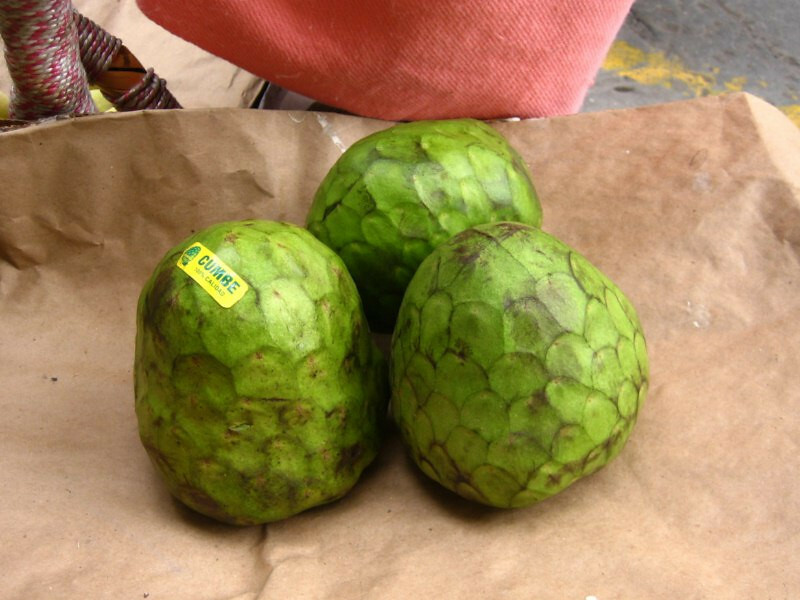 Buying one of my favorite fruits, called Chiri Moya here and referred to as Custard Apple in India. The flesh is sweet and tasty. 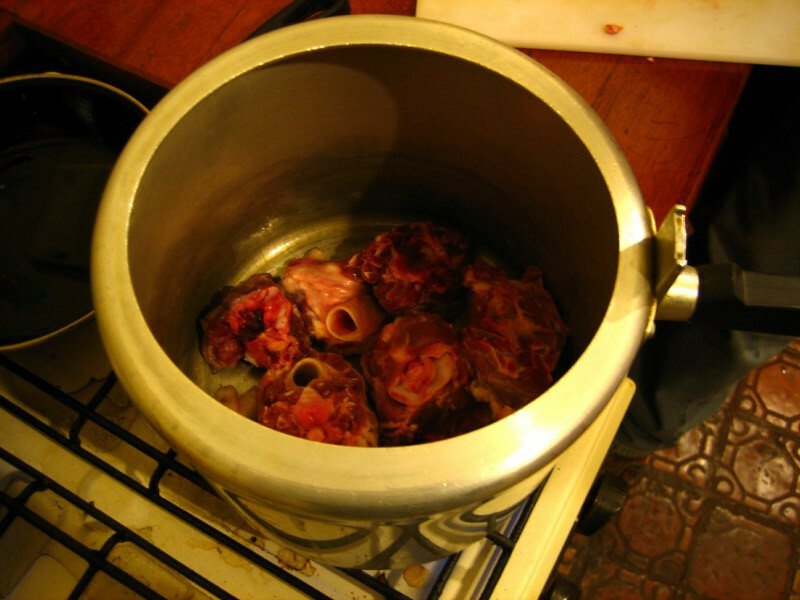 Preparing a mutton (sheep) soup for my last night at Helmut’s. 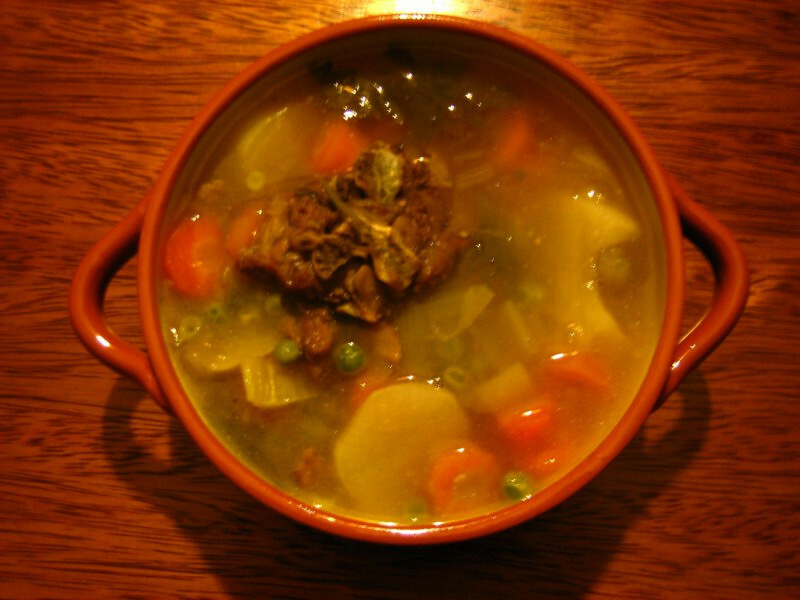 Hearty and very tasty. 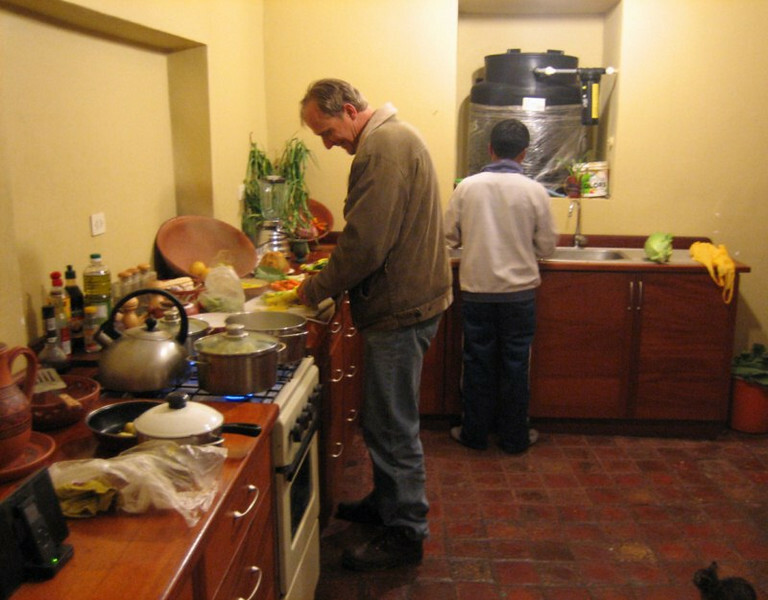 We had lots of good, stimulating conversation at the dining table and whilst he spoke decent English, we conversed mainly in Spanish, since he was more fluent and comfortable with that. I enjoyed my stay and he said like-wise. It’s the unexpected events that make this trip a journey. 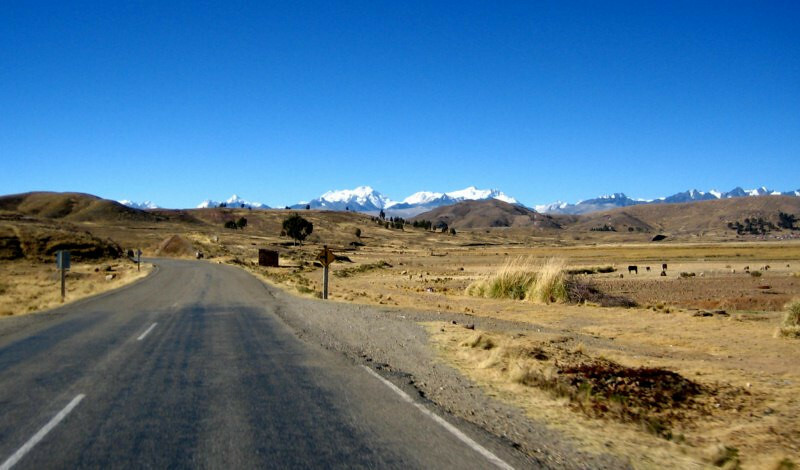 Happy to be back on the road and rolling smoothly along the altiplano south to Puno. 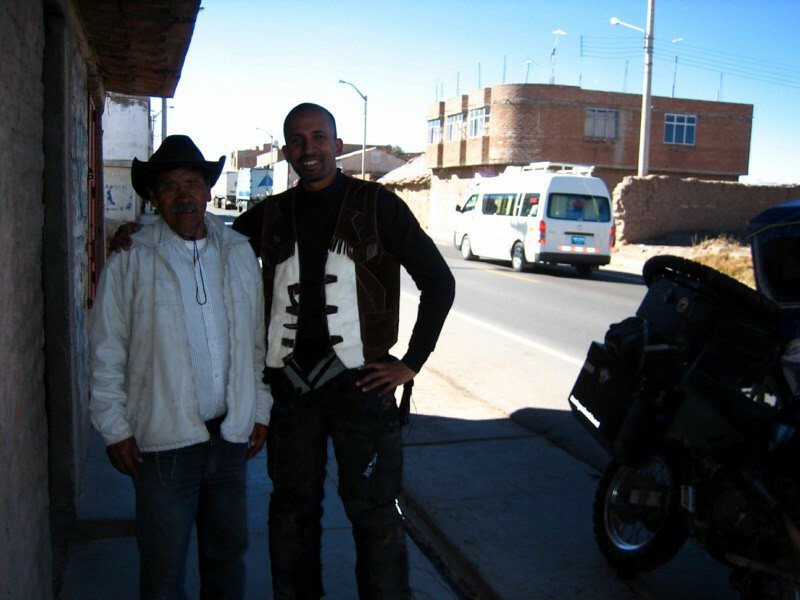 I stopped for lunch near Juliaca and the restaurant proprietor’s father wanted to show me his leather cowboy vest after seeing all my biking gear. Looks pretty good, eh? 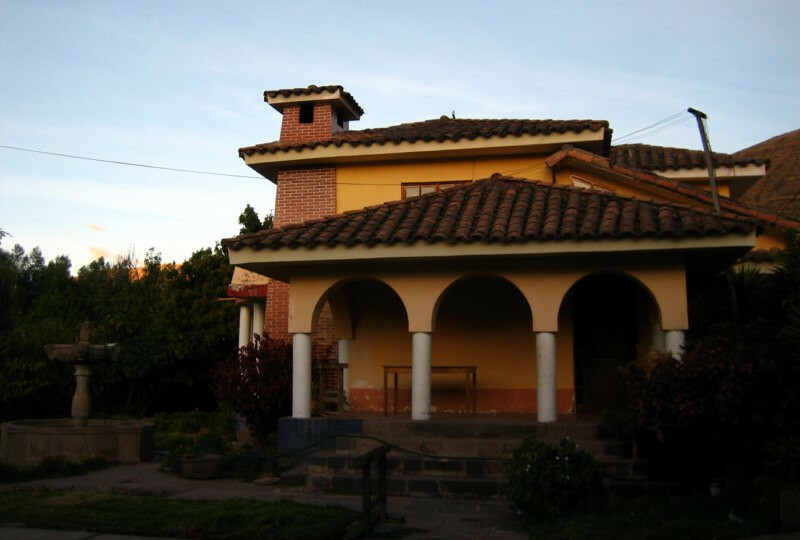 Spending a night at Lizandro’s in Puno, through CouchSurfing. It was cold at around 3,800 m (12,500 ft). 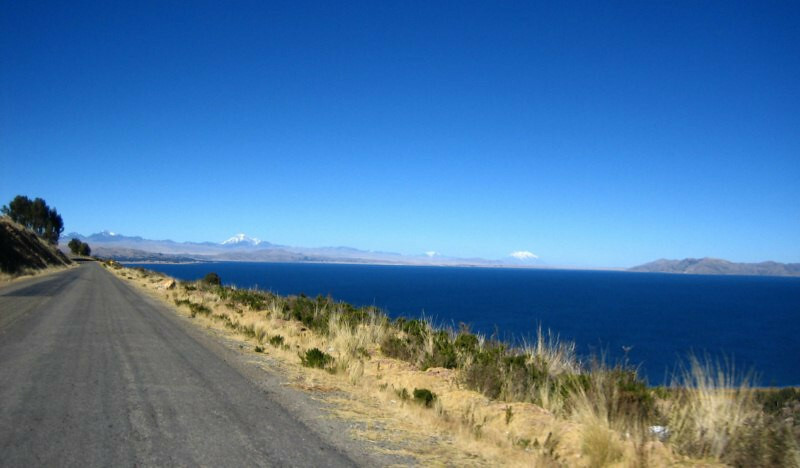 Taking the beautiful ride along Lago Titicaca towards the Bolivian border with snow peaks from Bolivia visible in the distance. 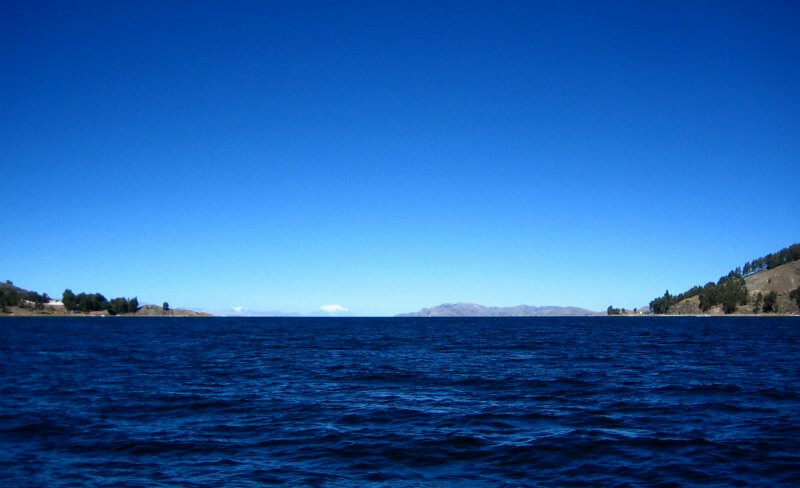 Panorama of the immense Lago Titicaca. 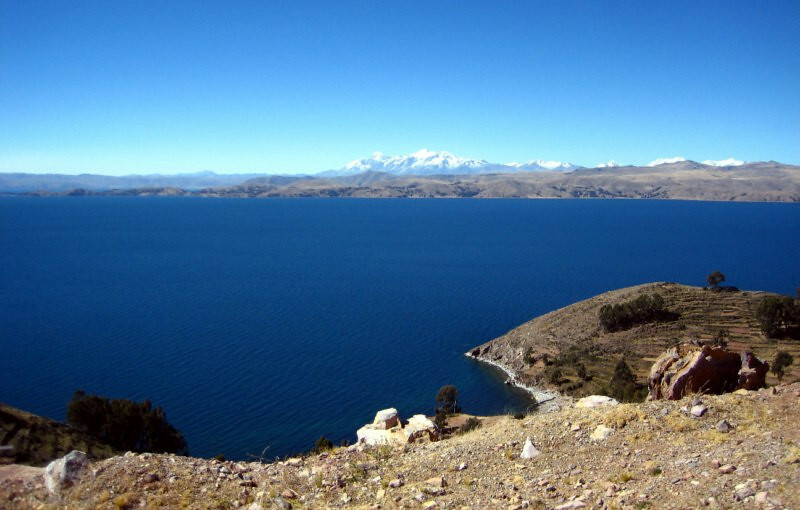 It’s the world’s highest, largest lake at an altitude of around 3,800 m (12,500 ft) and is the largest lake in South America. Geologically speaking, the whole altiplano was once under water and this lake is all that’s remaining. 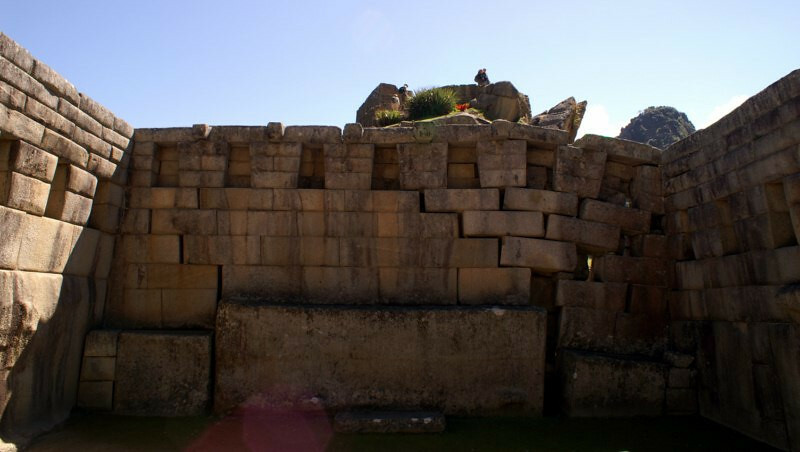 It was very sacred to the Incas with their myths saying that their civilization was born through the sexual chakra (energy focus) that is Lago Titicaca. The lake is fed by glacial melt and rainwater and has slowly been dropping in volume, due to the reduction in size of all the glaciers in the area and shortening rainy seasons. Fisherman heading out to his nets. 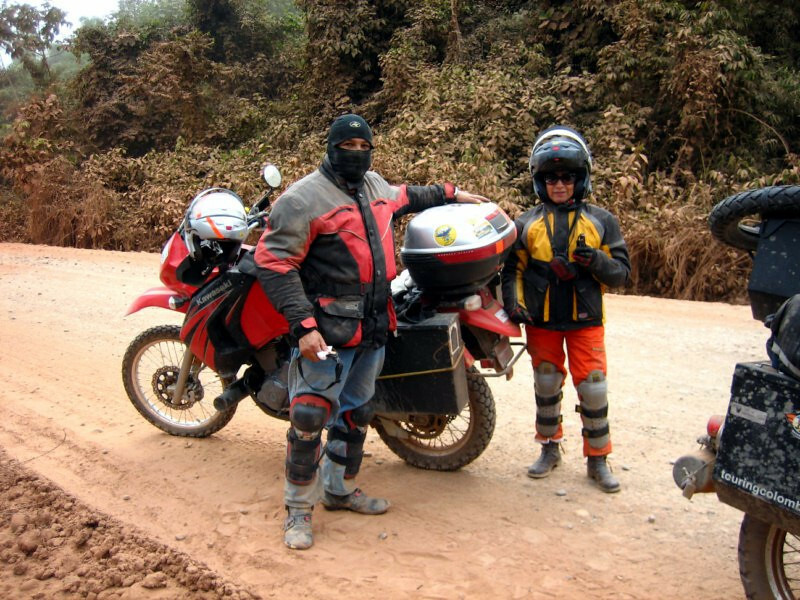 At the end of Peru, nearing the border with Bolivia. 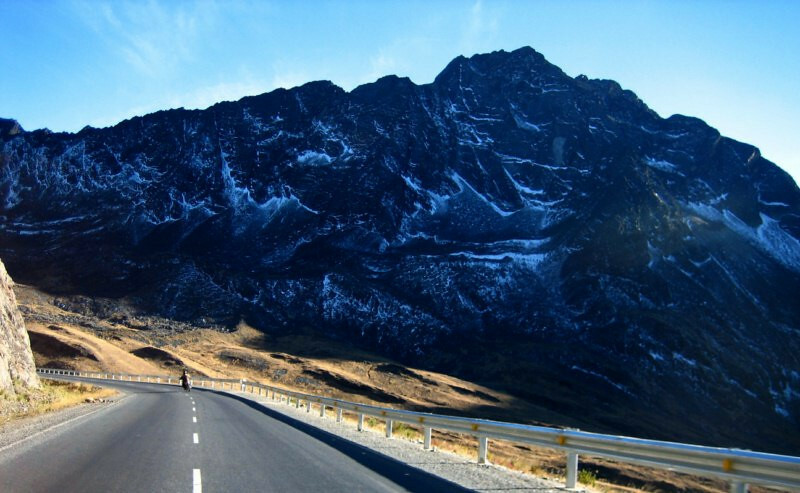 I knew I would enjoy Peru and its diverse landscape dominated by massive snow peaks. 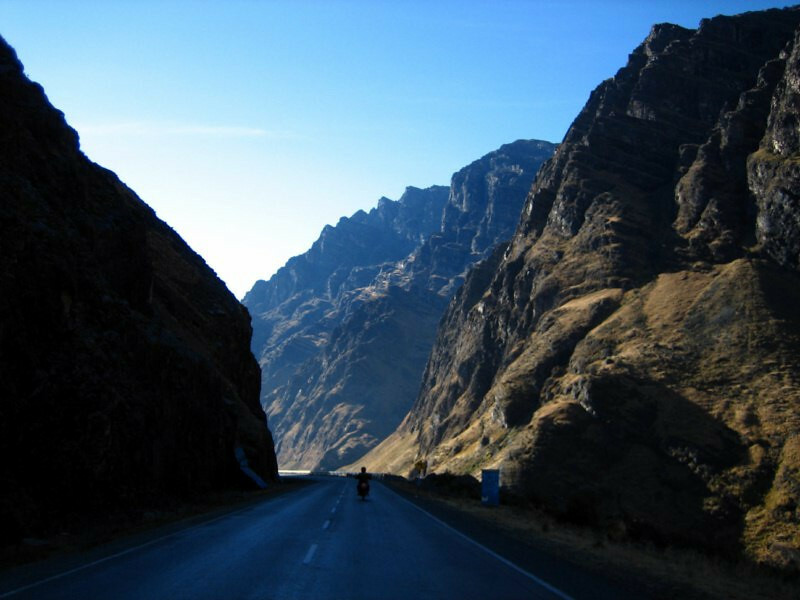 The awe of the Andes really sets in after traversing this grand land. The unexpected encounters along the way also made this a special experience. 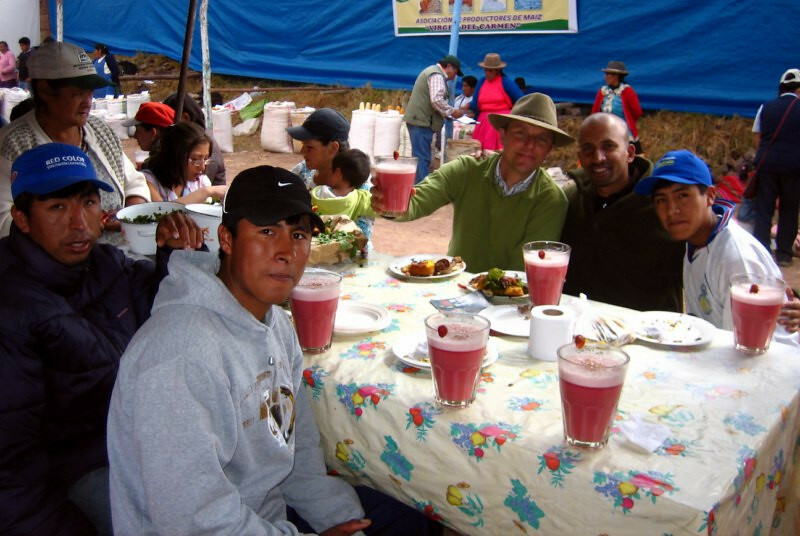 At the farm I was staying at in Cusco, I became friends with Carlos from Lima and he was looking for someone to head to Machu Picchu with and knew the back route to get there without taking the expensive trains. 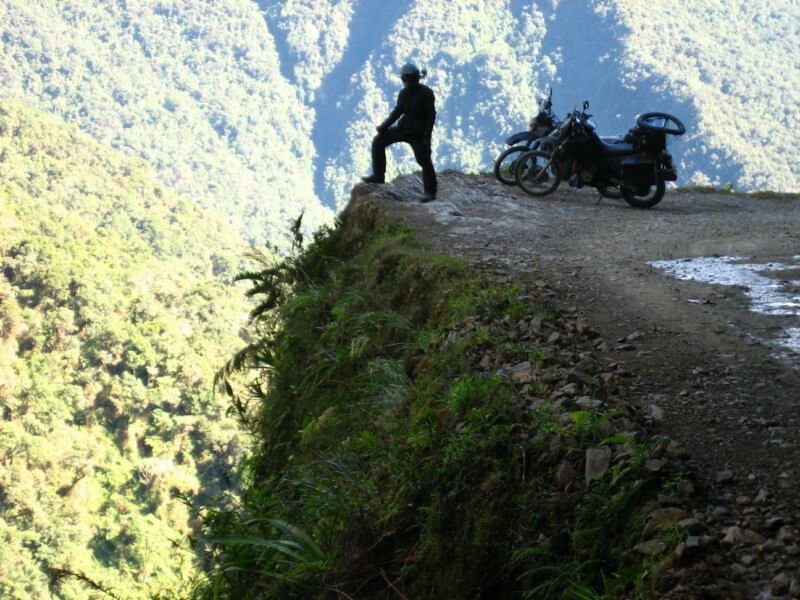 I was up for it and left the bike at the farm and we backpacked it to Machu Picchu. 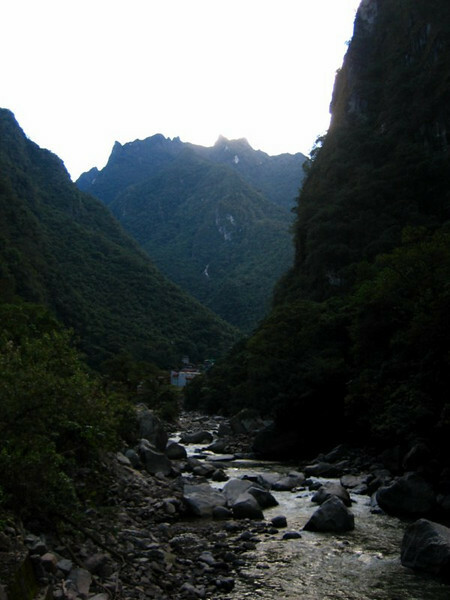 Getting an early start for the day long journey to the town of Aguas Calientes at the base of Machu Picchu. 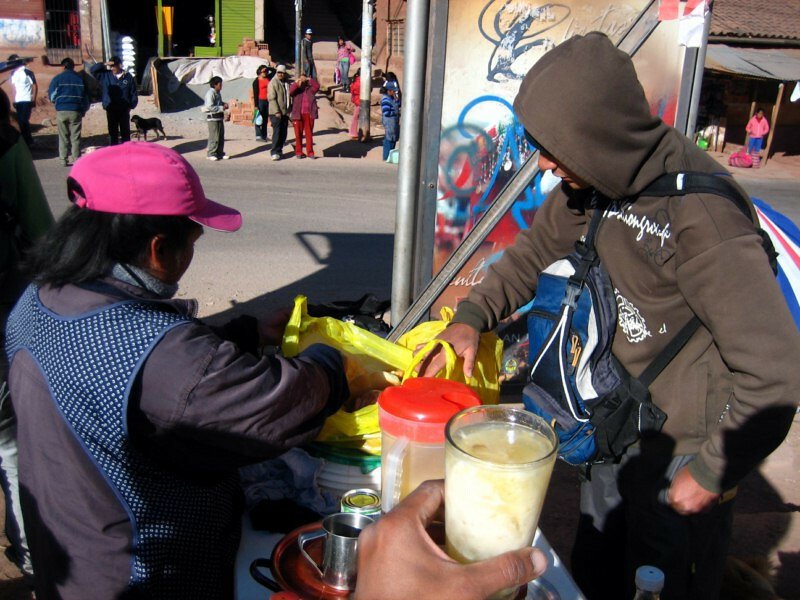 That’s a drink from quinoa (Andean grain) that was quite filling near the bus stop. 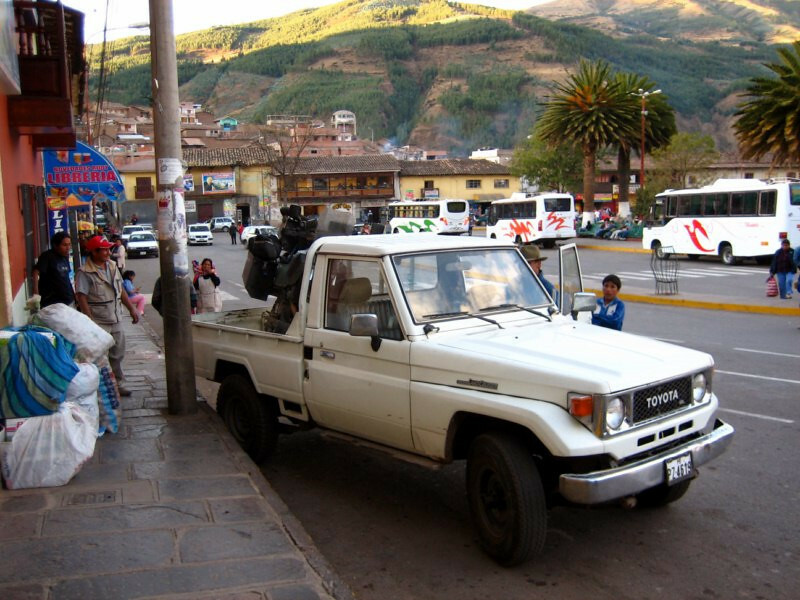 We first caught a mini-bus to Urubamba. 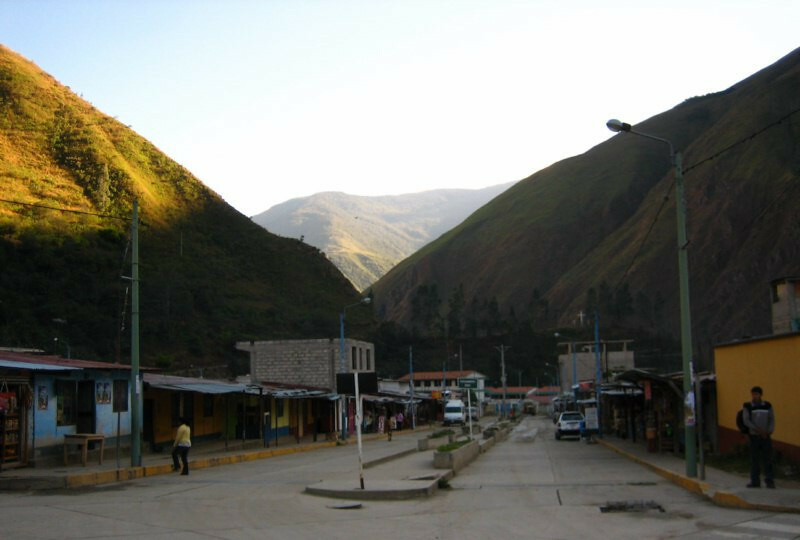 From Urubamba, we caught the bus heading to Santa Maria and Quillabamba. 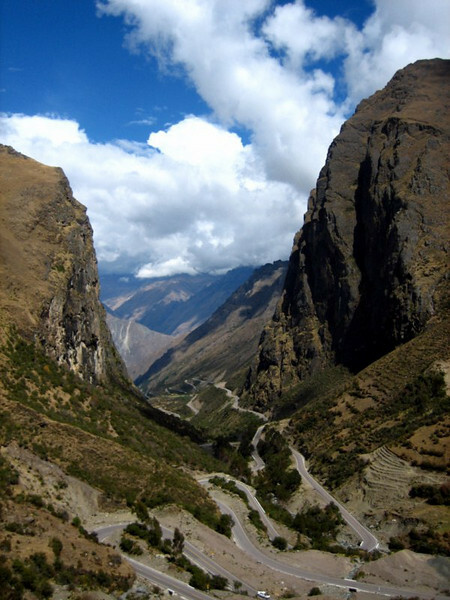 This is past Ollantaytambo and the scenery was quite pleasing. 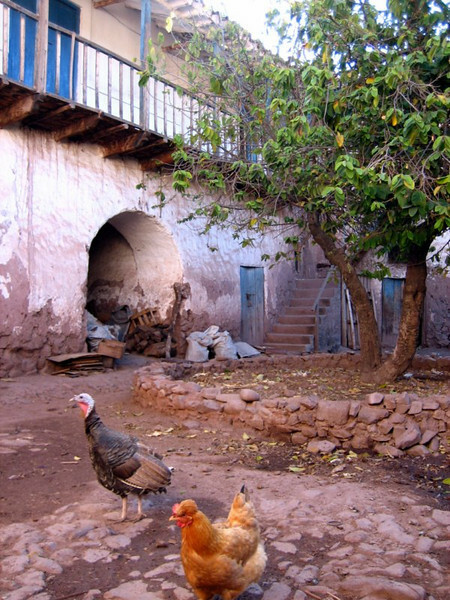 Terraced farms. The downside to being in a bus was not getting as many photo opportunities compared to the freedom on a bike. 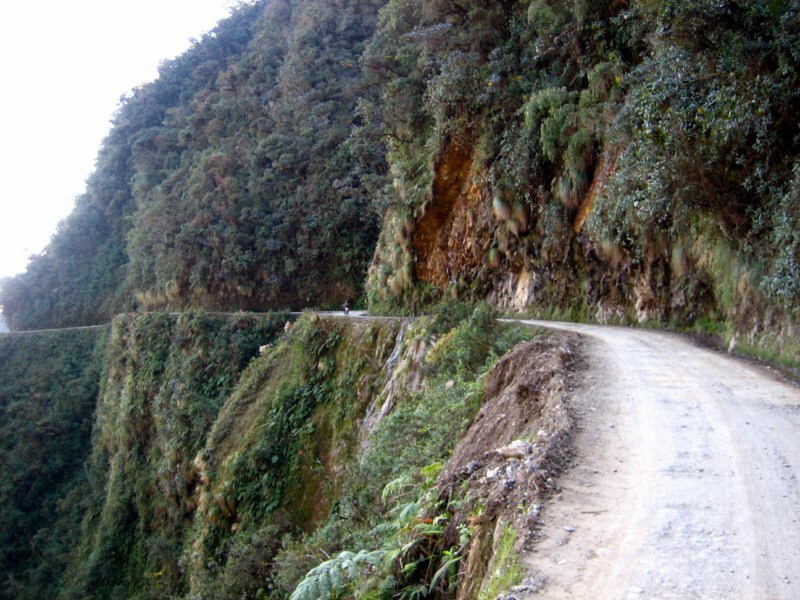 The road climbed up high, probably close to 4,000 m (13,100 ft). Close to the summit after passing through this high valley. 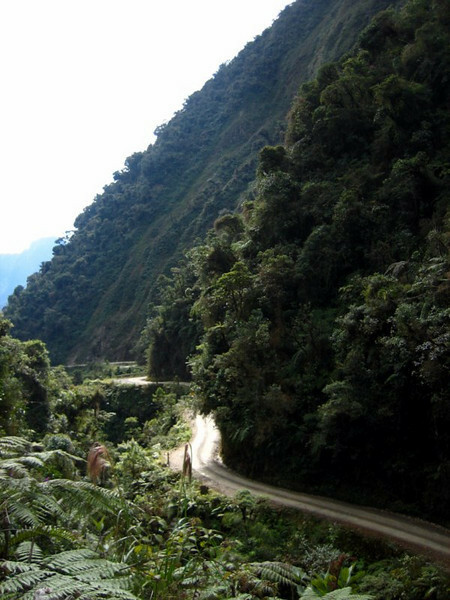 Coming down the eastern side of the Andes, which was more lush. Taking photos from the back window of the bus of the dirt road, which got muddy with some rain. 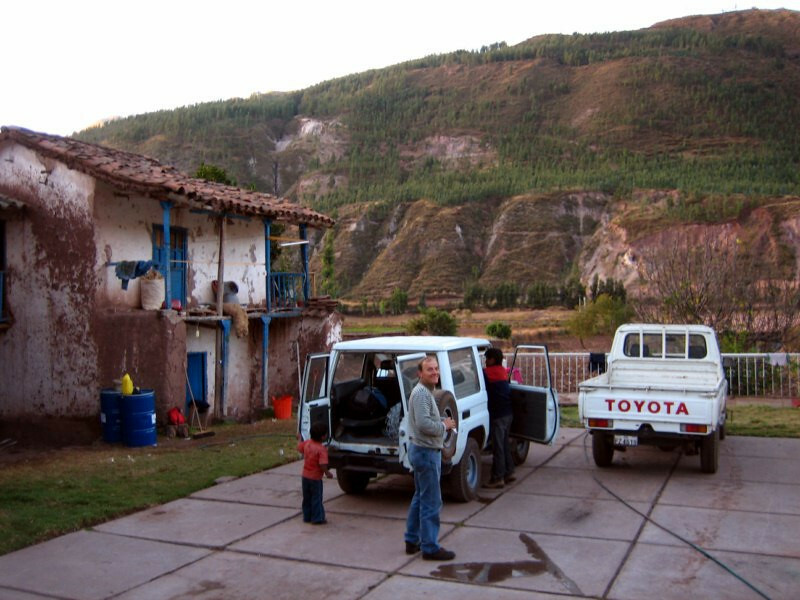 Getting off at the small town of Santa Maria, where we then took this first white station wagon inside to Santa Teresa. 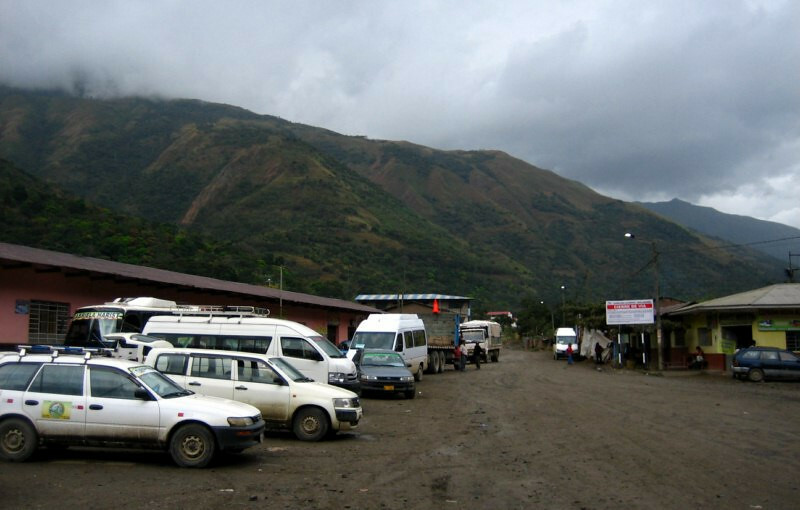 The rural transport comprises of mini-buses and station wagons, second-hand imports from Japan that are converted from right to left-hand drive. Heading out of Santa Maria. 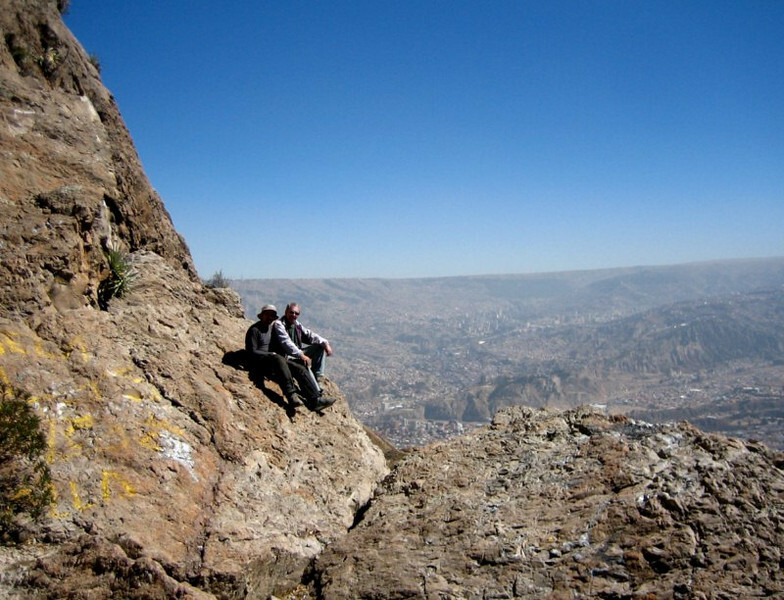 We had dropped quite low in elevation by now, close to 1,500 m (4,900 ft). I don’t know exactly because I didn’t have my GPS with me. Our driver, who was actually very tame and drove sensibly, instead of the maniacs who usually drive like they’re in a rally race. The drive was beautiful along this rocky cliff. 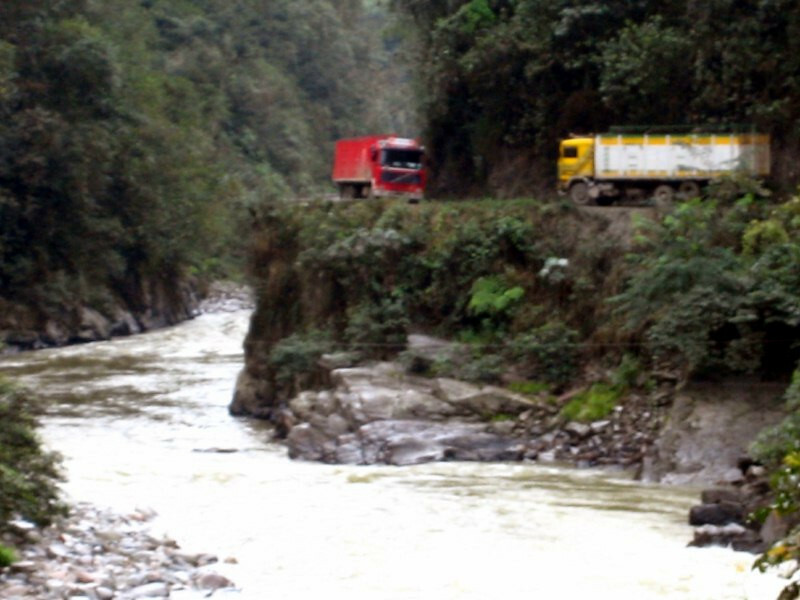 The road was running along the Rio Urubamba, the same river running around Machu Picchu up ahead. Meeting on-coming traffic and there was a bit of power-play to see who would back up to let the other guy through. We won. 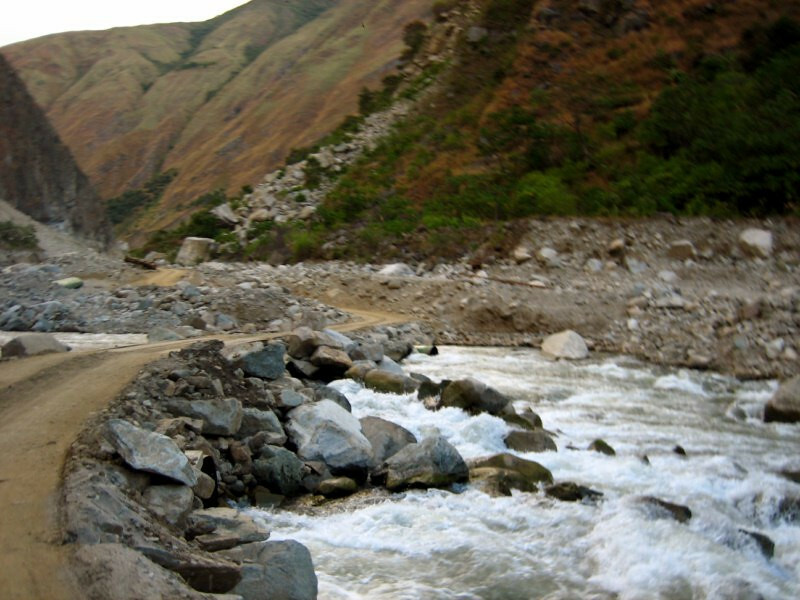 Waterfalls were flowing across the road and there were a few deep crossings, but nothing the Toyota couldn’t handle. Slowing down for some one-way narrow bridges. Waterfalls over rocks. The driver was very nice and stopped whenever we wanted to take pictures. Getting into Santa Teresa. The drive from Santa Maria was quite enjoyable and worth it to come this way. Having some late lunch in Santa Teresa with Marie from France. 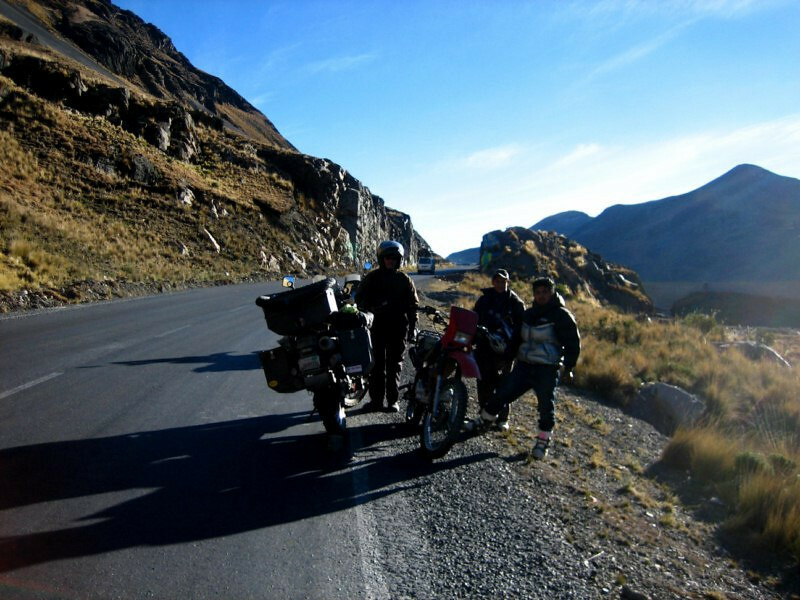 We rode with her from Santa Maria and would be going to Aguas Calientes with her. 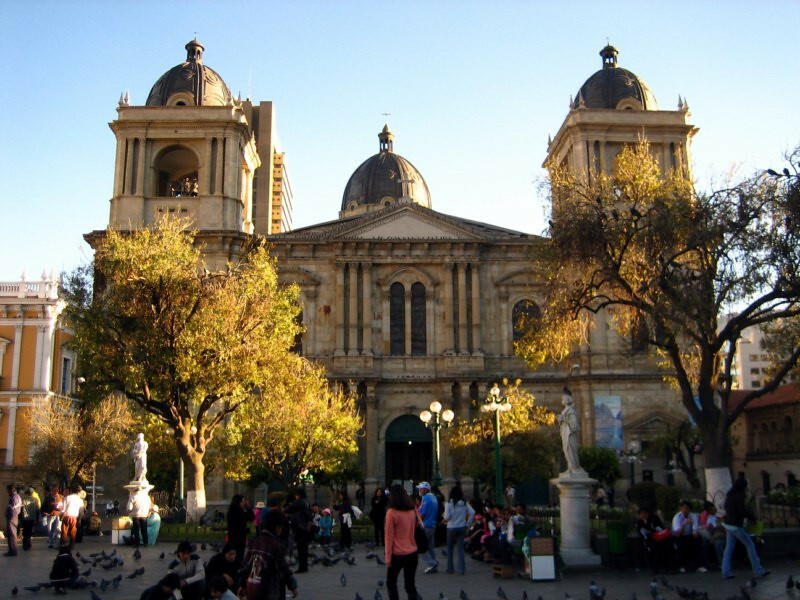 She’s doing an international business internship in Lima. 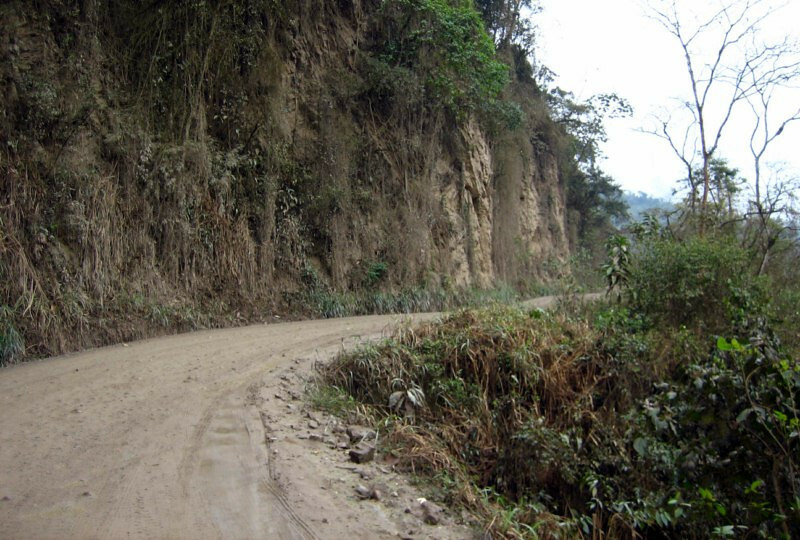 Taking a collectivo (mini bus) to Hidroelectrica over the bumpy, rocky road. 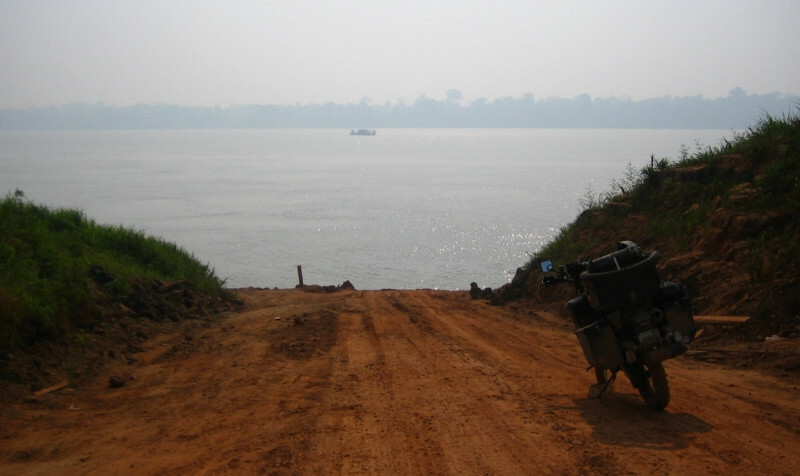 It was a nice ride along the river and the crossings were quite low in some places, probably inundating the road during the rainy season. 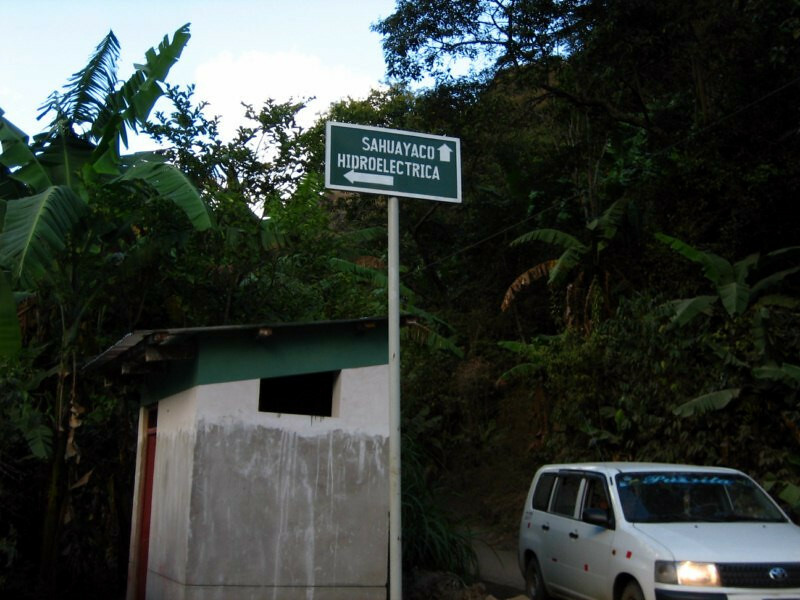 Arriving at Hidroelectrica, the closest roads get to Aguas Calientes. 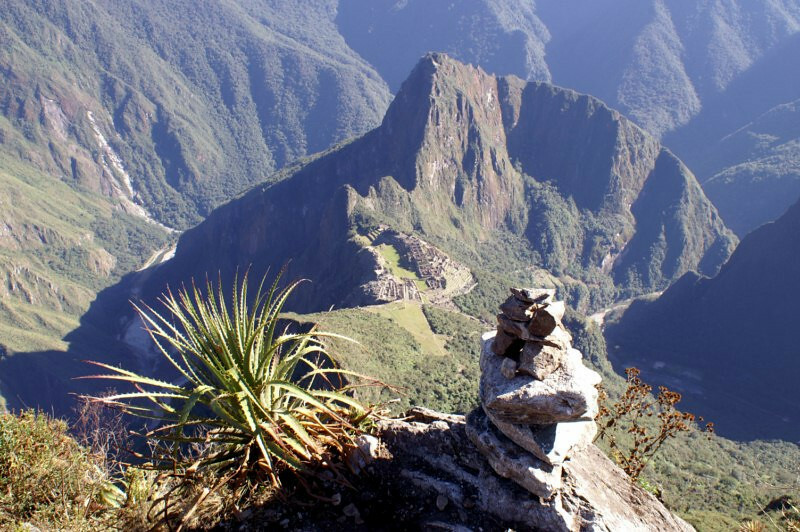 The peak up ahead is Mount Machu Picchu. 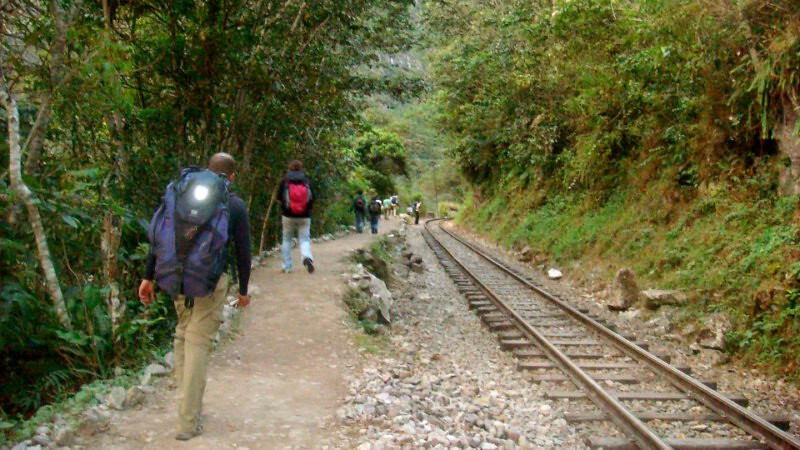 …the trail flattened out and followed the railway tracks into Aguas Calientes, about 20 kms (12.5 mi) away. 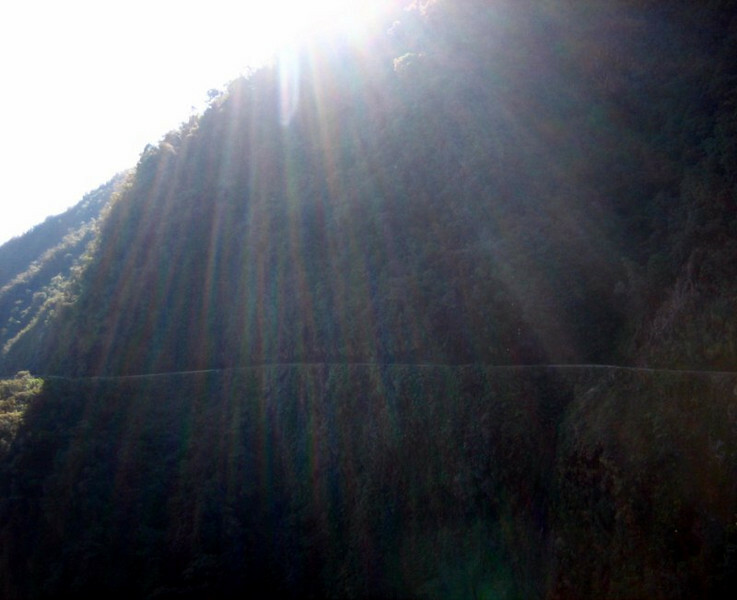 Crossing Rio Urubamba. The train leaves much later and actually rolled into town just when we got there. 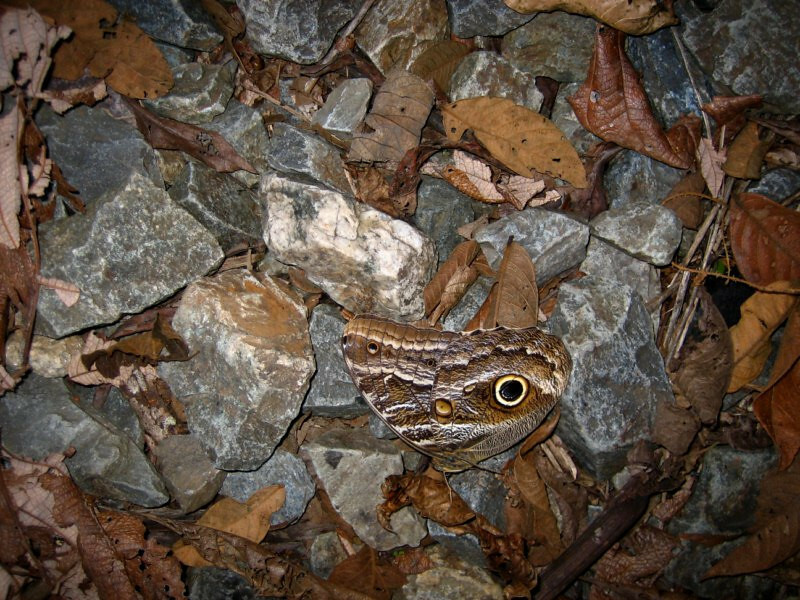 A wing from a butterfly among the dried leaves and rocks with a nice camouflage design of an eye to scare away predators. It was about a two hour hike and it was fully dark by the time we arrived in town. 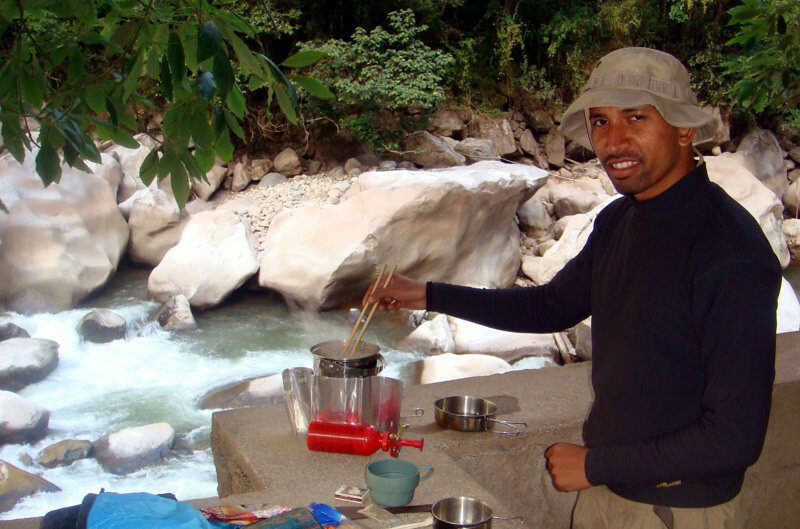 Carlos and I camped outside town and we’re making dinner here of spaghetti with tomato sauce and tuna. 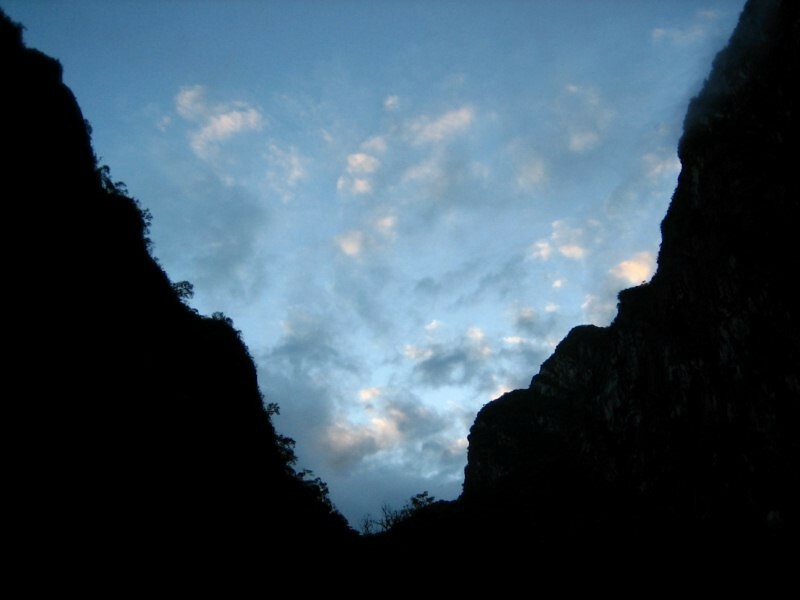 The campground is in a stunning location with vertical cliffs enclosing it. Ethereal clouds rising with the sun. 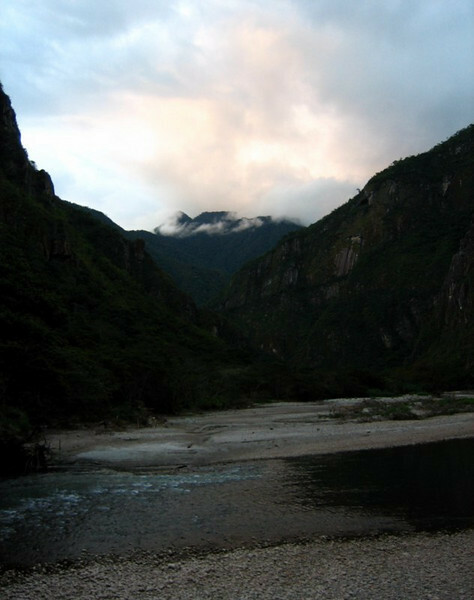 Looking across the river to the mountain on top of which Machu Picchu sits. 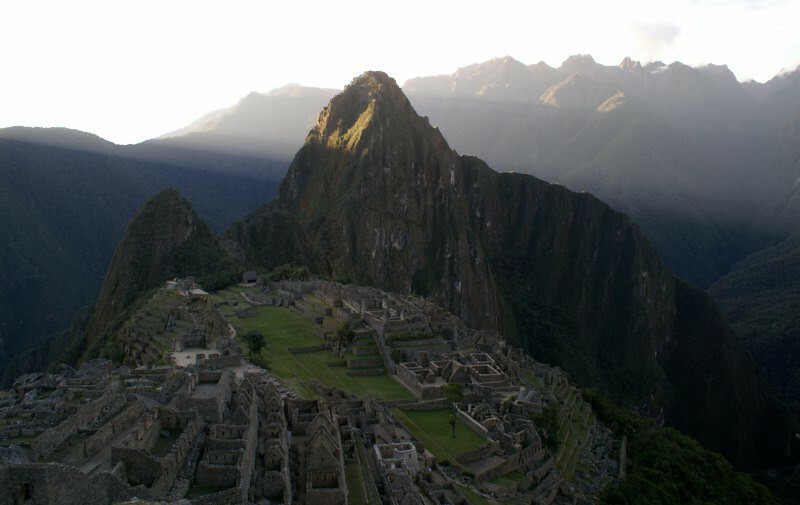 We wanted to be in Machu Picchu for sunrise, so we were taking it easy today in town and going to head up tomorrow morning. 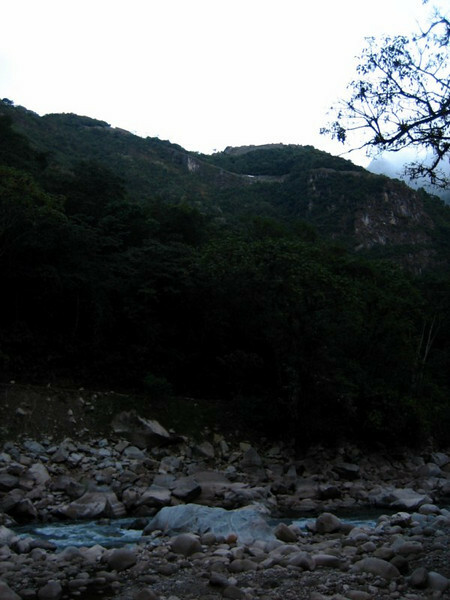 Looking up the river towards Aguas Calientes. 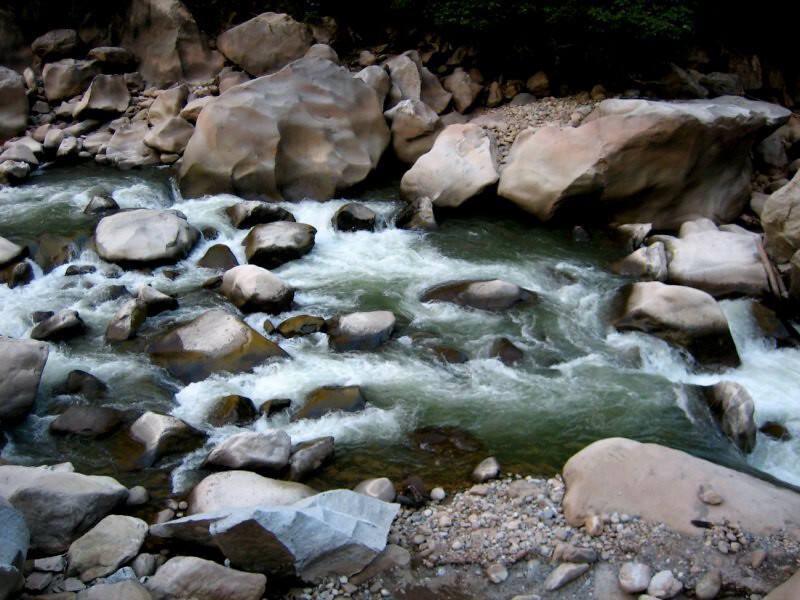 The fast-flowing Rio Urubamba cutting and shaping massive granite blocks. 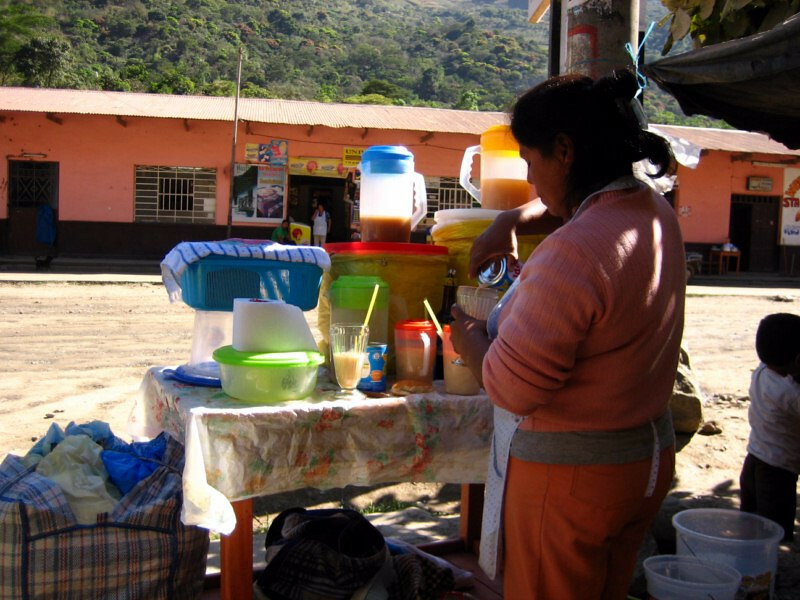 The tourism overrun town of Aguas Calientes, whose main business is tourists heading up to Machu Picchu. 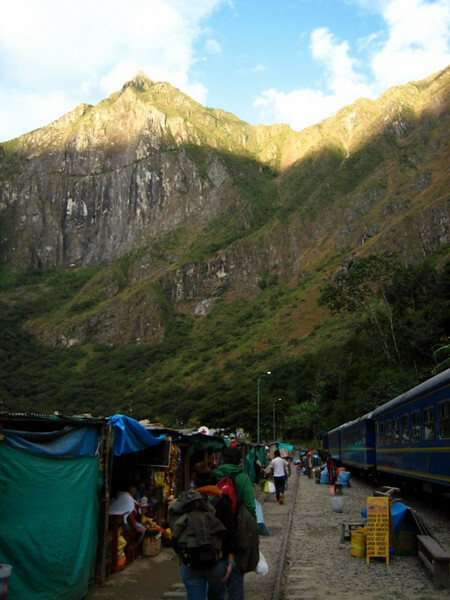 This is also where the $156 round-trip train ride from Cusco comes to. Taking the buses and hiking costs around $20 round-trip. Making some lunch in a park by the river before we caught the World Cup football finals match between Spain and The Netherlands. 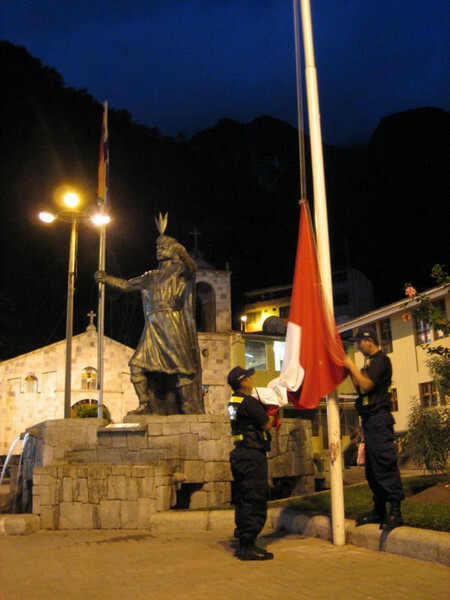 The police ceremoniously lowering the national Peruvian flag and the Inca flag in the central plaza as darkness fell. 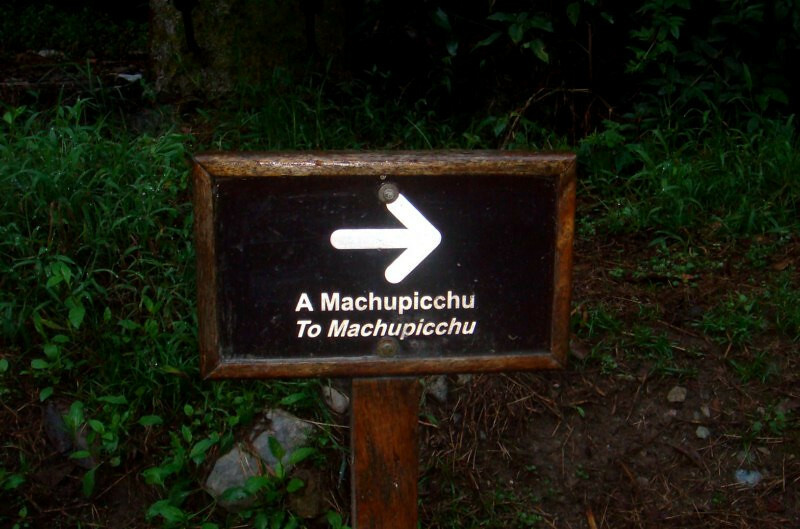 We got up at 3 am the next day and started the two hour hike up the mountain to Machu Picchu in the darkness. 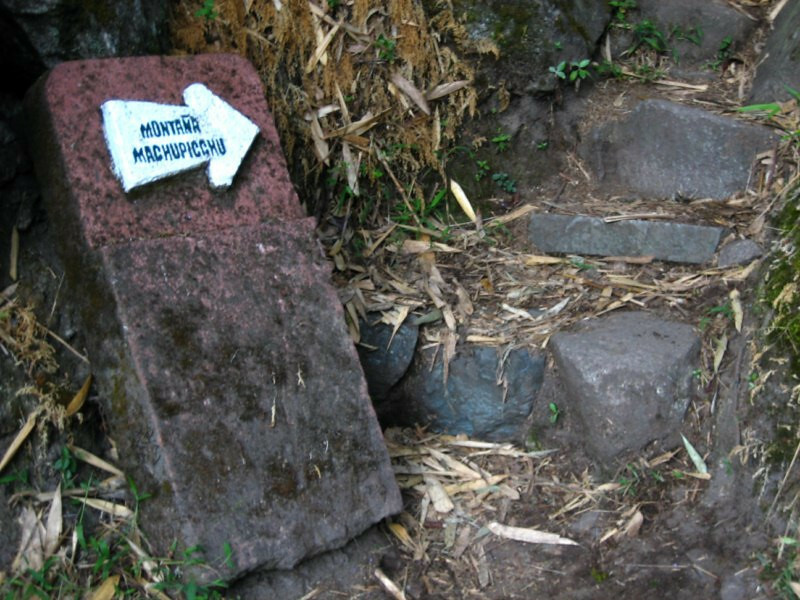 Signs indicated which way the trail went, but basically you just keep going up. 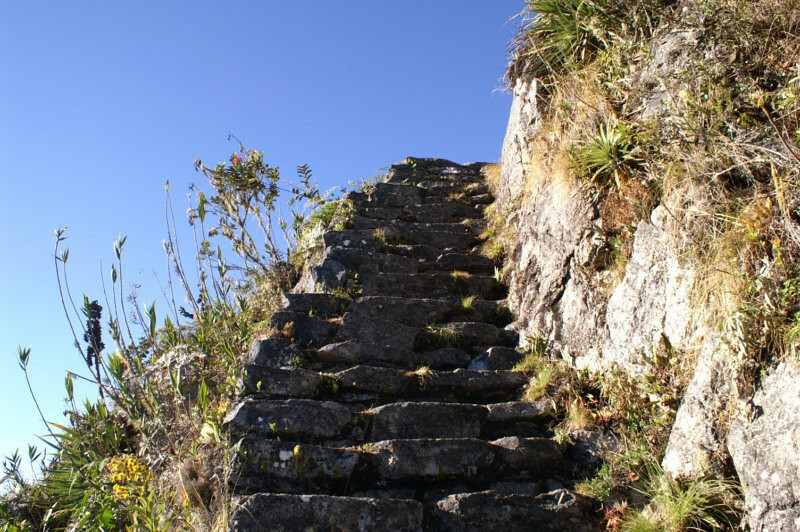 The stairs leading up the mountain to Machu Picchu. (These pictures were taken later in the day.) We had flashlights but we could navigate just with the starlight. There was no moon and the clear skies allowed plenty of starlight to illuminate the ground. 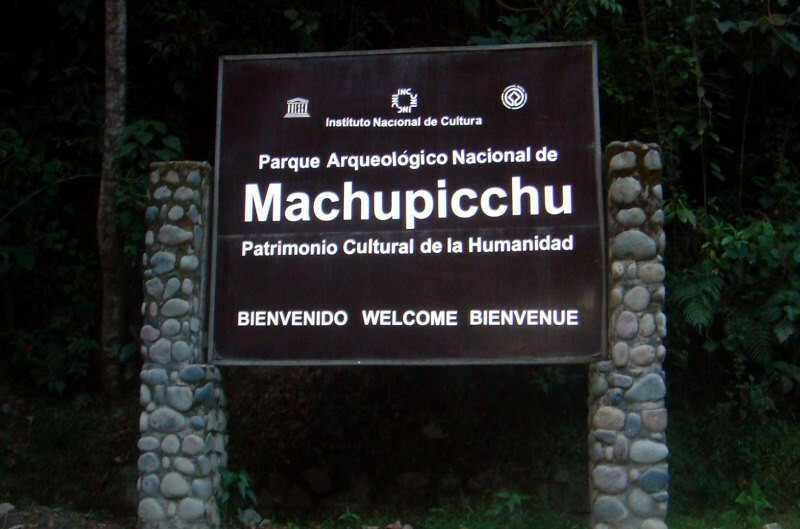 We reached Machu Picchu and it was still dark at 5 am. A picture of some stars.  The glob near the middle is the Pleiades cluster, also known as the Seven Sisters. I got this picture with a 30 second exposure (maximum) on my SLR. The first rays of the new sun. We could see so much more than I was able to capture on film and it was a lovely experience to see the valley change from being visible just under starlight to the blinding power of our one nearby star, the Sun. 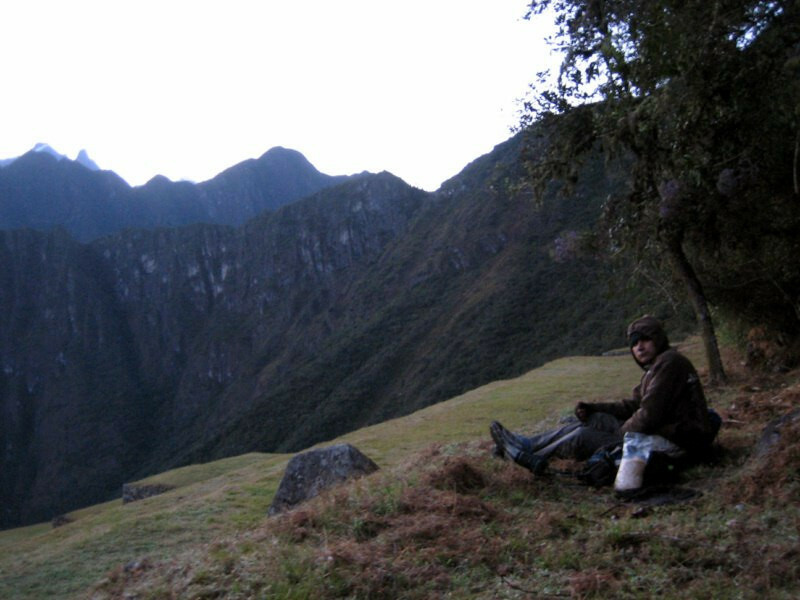 Carlos, waking up from a nap on one of the agricultural terraces at Machu Picchu, where we waited for the sunrise. It got very cold just before dawn. 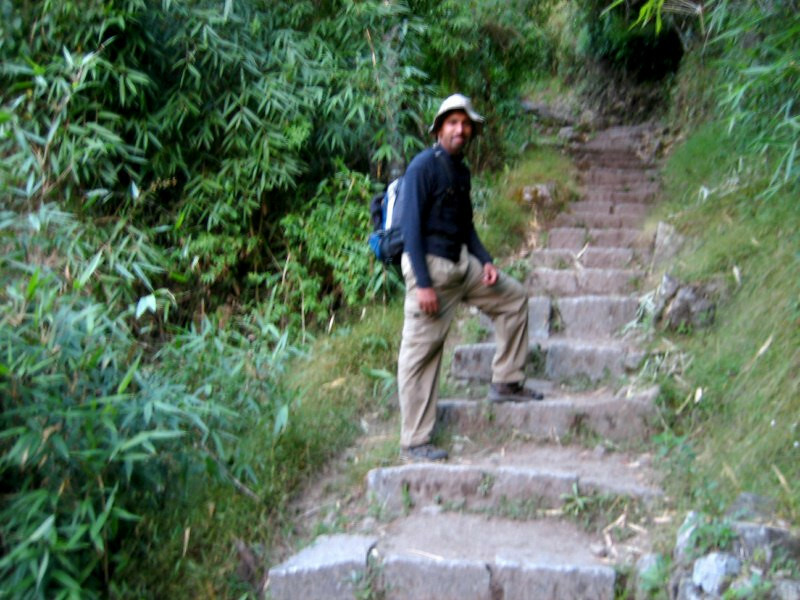 We decided to climb further up to Mount Machu Picchu for a 360 degree view of the area. Looking back at the ruins from halfway up, where the sun hadn’t shone yet. 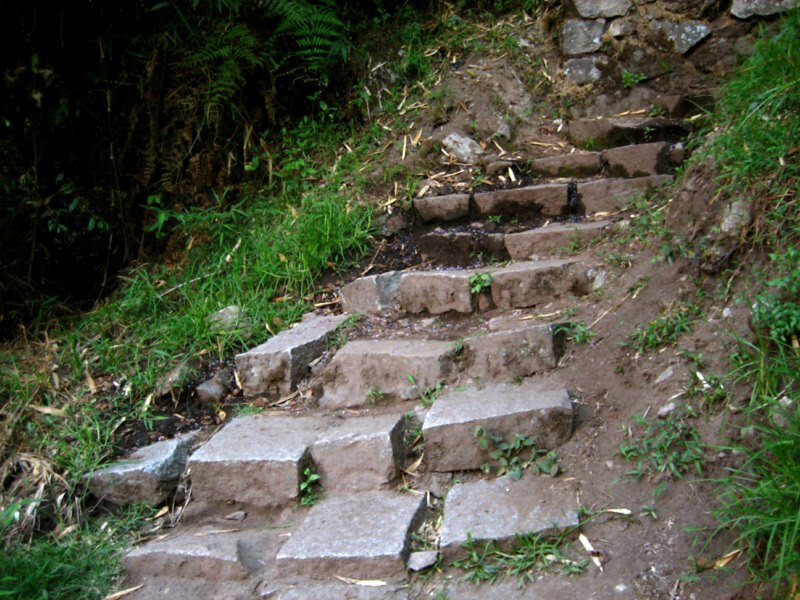 The steps were a bit dicey in some sections, but it made for an interesting climb. A view from almost near the top with the sun now shining on Machu Picchu and what sticks out the most for me is the head of the Inca. 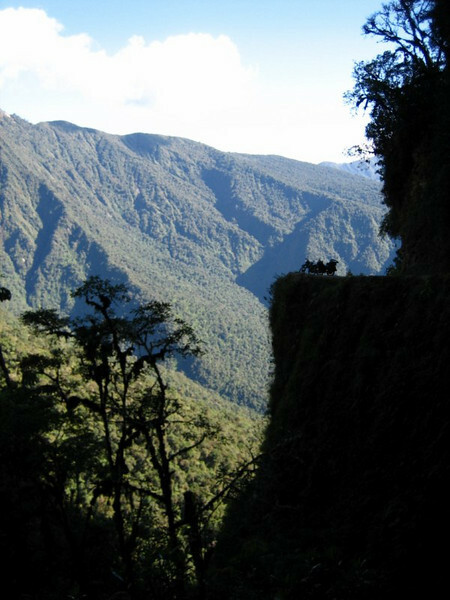 We’re looking at the profile with the Inca lying on his back – the nose is Wayna Picchu (the peak close to the ruins) and the shadowed area to the right is the left eye. Steps getting us ever closer to the summit. 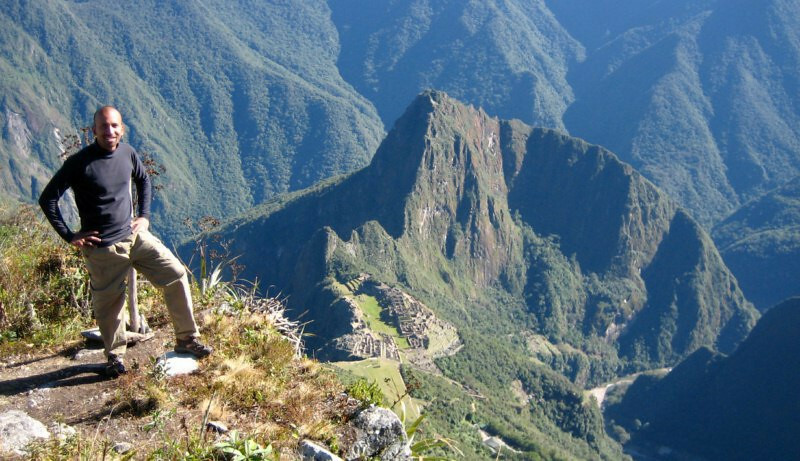 At the summit of Mount Machu Picchu at 3,050 m (10,000 ft), a 1,525 m (5,000 ft) climb from Agua Calientes. No, that’s not the gay-pride flag. 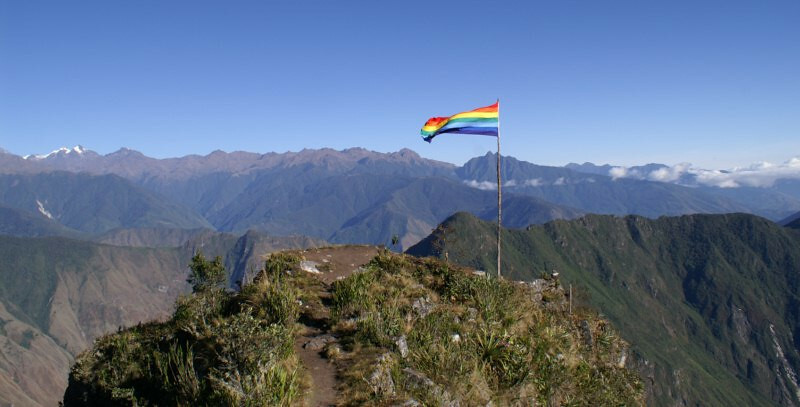 It’s the flag of the Incas, developed in the 1970s to represent the arco iris (rainbow), which was sacred to the Incas. This flag pole looked really small from the ruins, but it’s actually about 15 m (50 ft) tall. 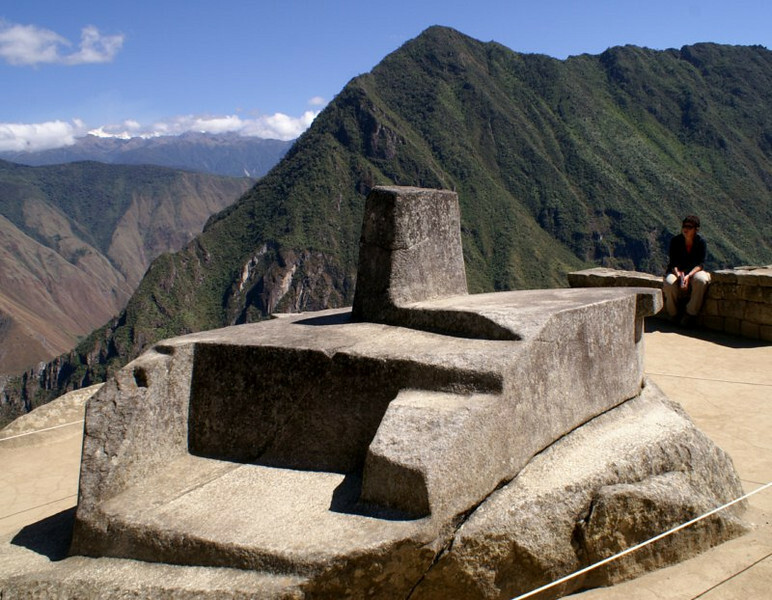 With Machu Picchu down below and the head of the Inca from the summit. 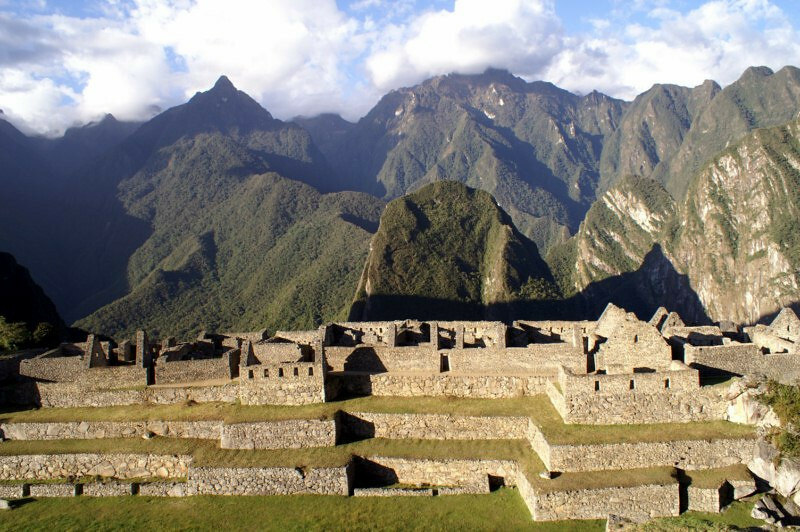 Panorama looking behind Machu Picchu at some of the snow peaks in the distance. Panorama looking at Machu Picchu and the valley it sits in. 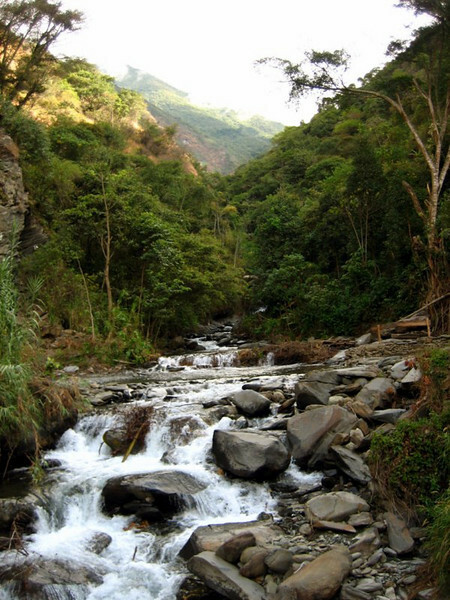 The Rio Urubamba flows around the whole mount, except the side connecting it with the summit I’m on. 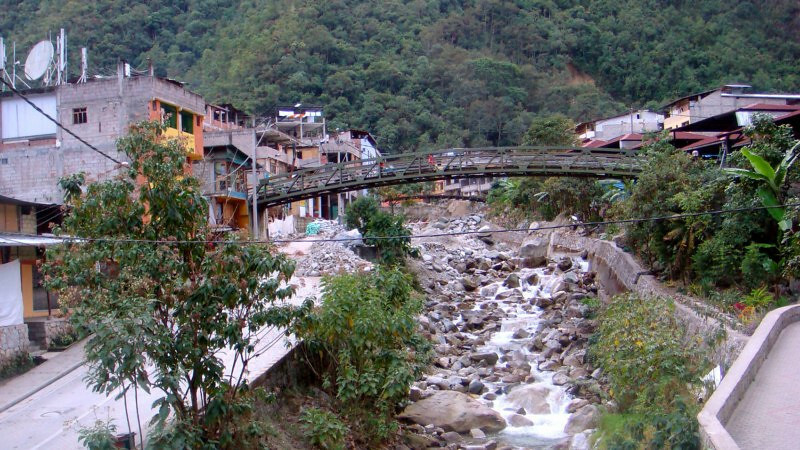 The town of Aguas Calientes is on the right, deep in the valley. Framing the ruins and the Inca head between some plants and rocks, which is all that’s left now here. 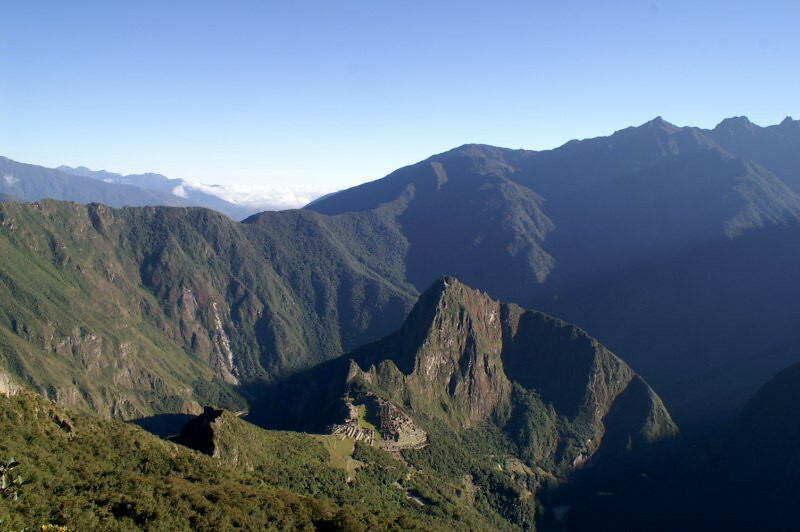 A wider panorama of Machu Picchu (center), with Hidroelectrica on the left. 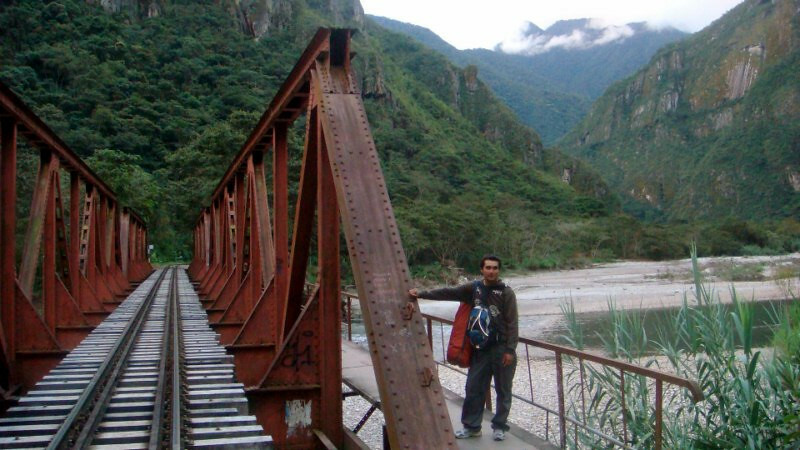 So, we hiked from there all along the river to Aguas Calientes on the right, about 20 kms (12.5 mi) away. 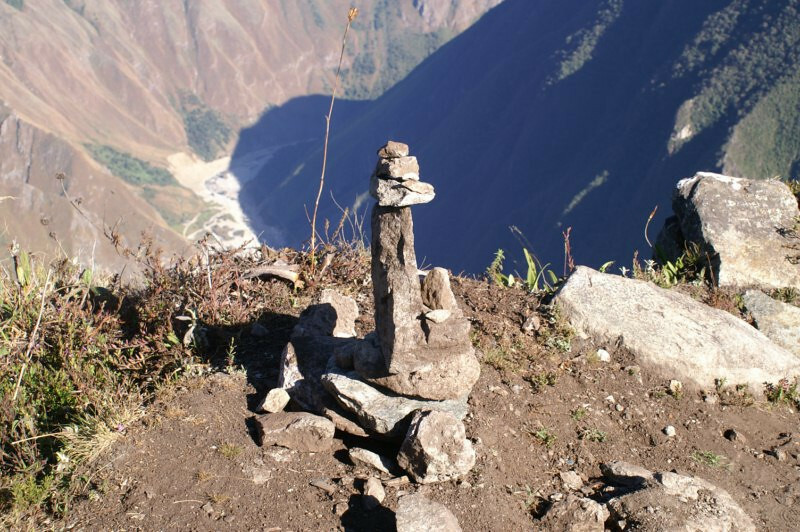 A stone sculpture at the summit. 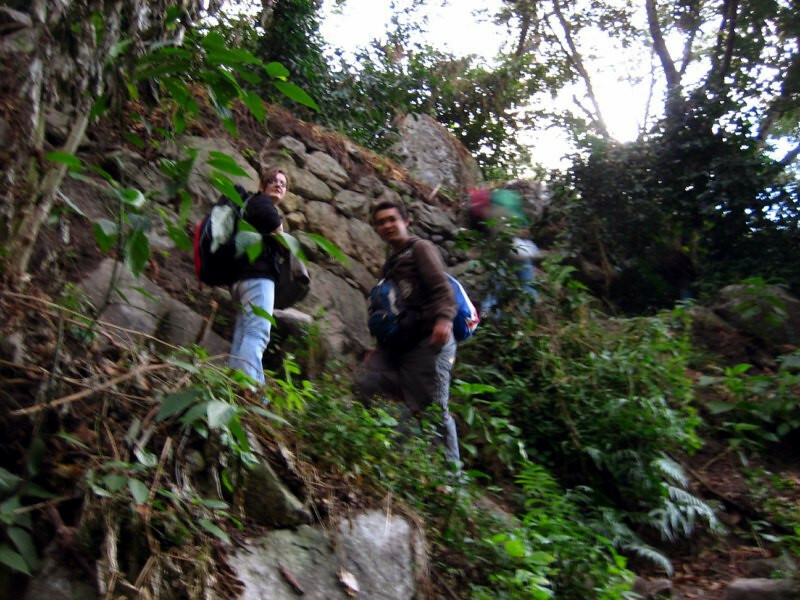 Heading back down to the ruins. Happy to make it back down. Now to see the actual ruins. 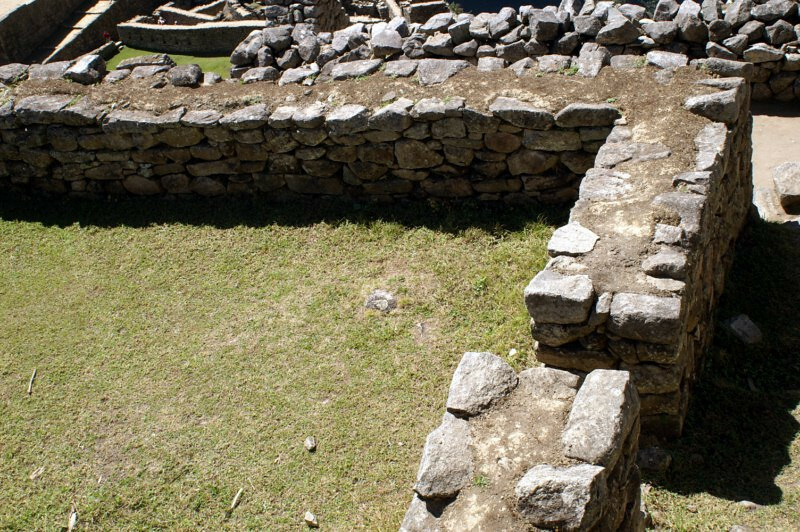 The terraces at the edge of the city, which were probably used for agriculture. 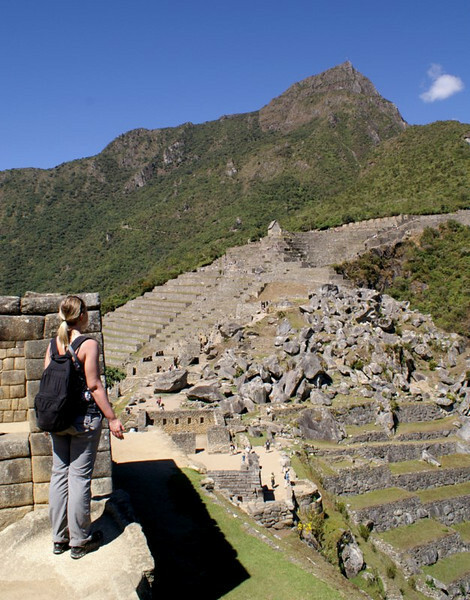 The postcard shot with the ruins of Machu Picchu and the peak of Wayna Picchu. 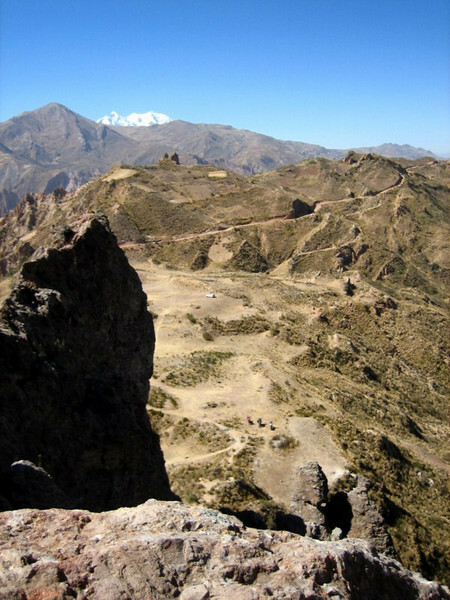 Panorama of the ruins with Rio Urubamba deep in the valley below and Hut of the Caretaker of the Funerary Rock on the right. Residential quarters with the main city. 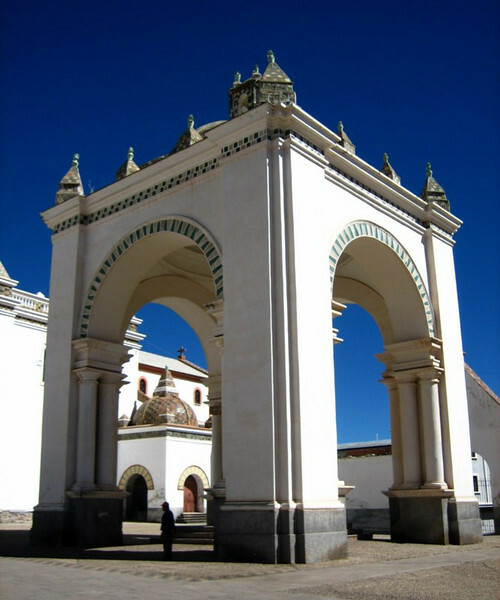 The entrance into the sacred part of the city. 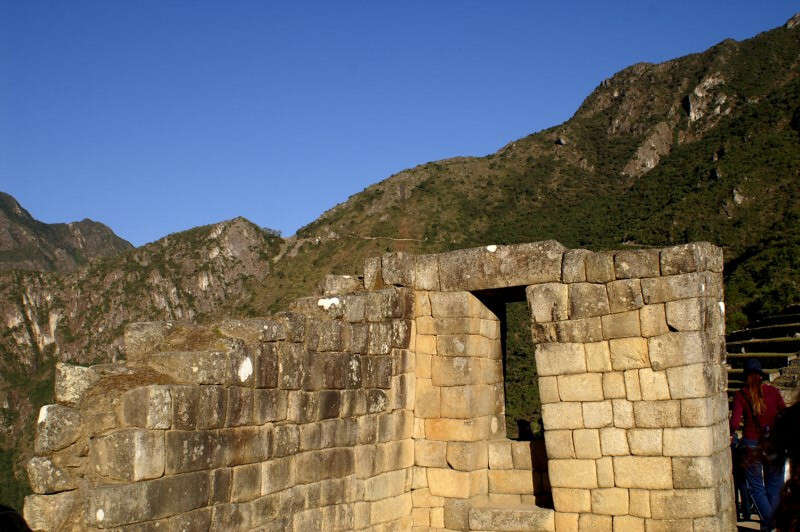 A framed window with the path leading to the Sun Gate behind in the mountain-side. 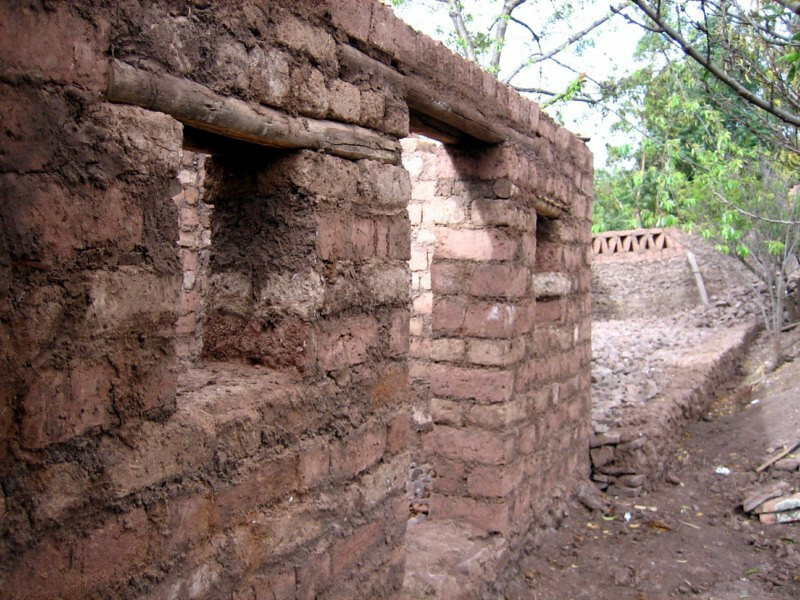 Foundation walls showing that the interiors of some buildings were mud-filled and not stone throughout. This might have helped as insulation against the cold. A street in the city with a view of Mount Machu Picchu. 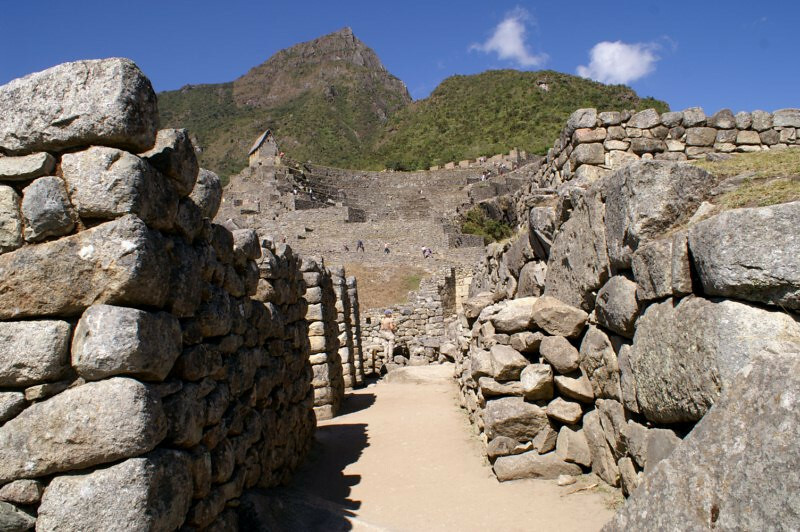 Looking across the central plaza towards Wayna Picchu. 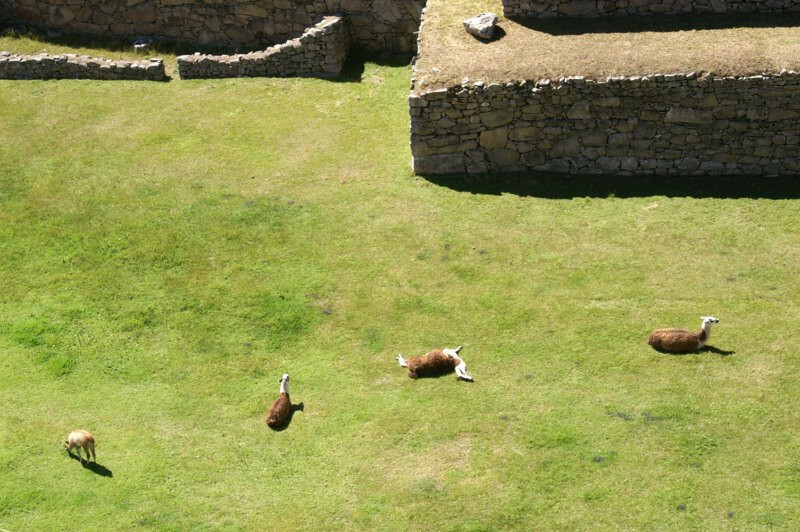 Llamas lazing around the grounds. They come and go as they want and they’re quite used to humans by now. Scattered granite slabs at the edge of the city, which were probably going to be used for further construction. 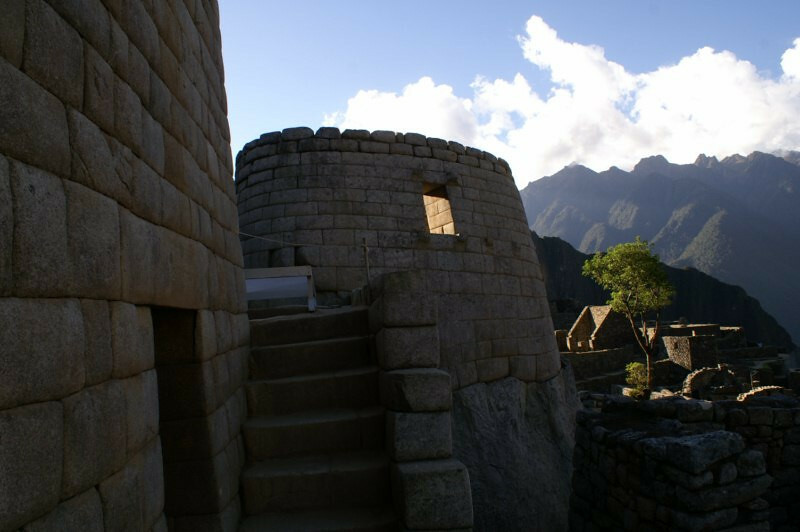 Just like in Cusco, impressive stonework abounds in Machu Picchu. 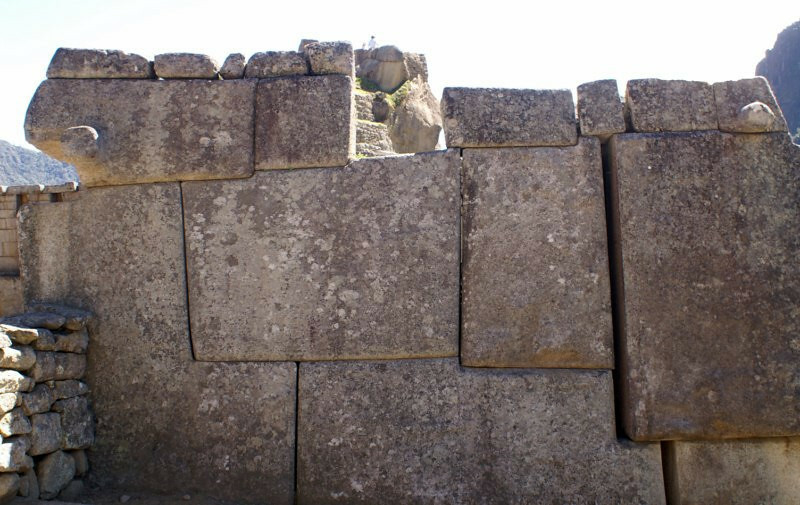 The theory on how they could cut through these massive blocks of granite is that they used water and wood pulp in natural cracks in the rock to further encourage cracking (as the wood expands with water). But I don’t know how they got such straight cuts with sharp angles. The Principal Temple. Loose ground or an earthquake probably caused the shift in the rocks on the right. Another example of tight masonry with no mortar. They say you can’t even get a blade of grass between the cracks. A sacred rock since it resembles the mountains behind it. 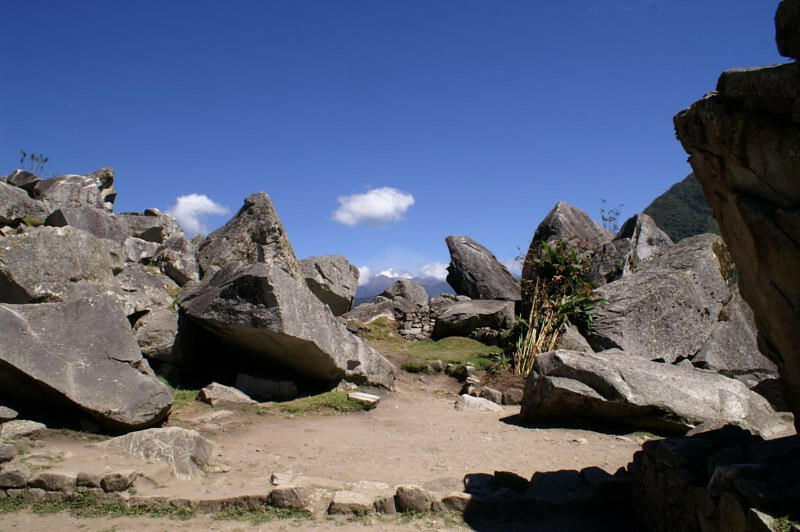 They say the rock was not moved but found in this position and with no man-made cuts it had the shape of the background mountains. Another sacred rock since it too resembles the mountain peak that it frames. 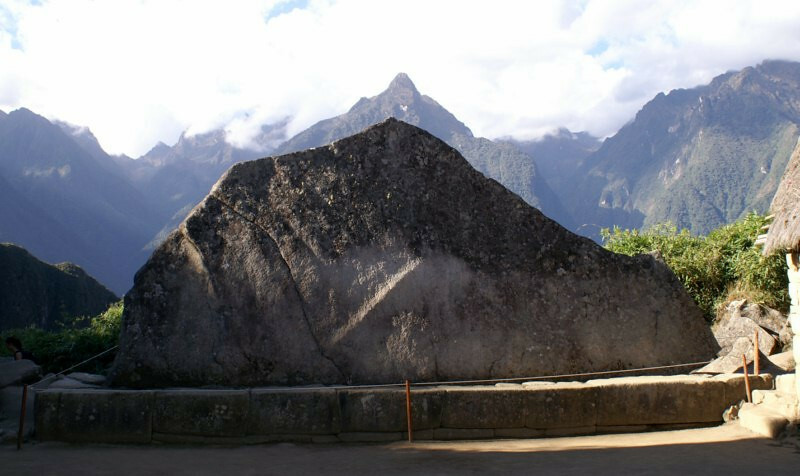 Intihuatana, hitching post of the sun, a carved rock of prime importance to the Incas. 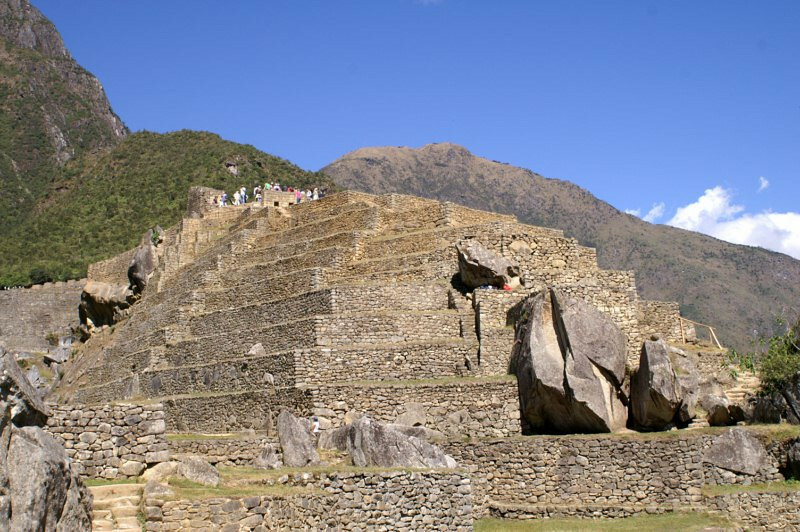 The Spanish destroyed most sculptures related to sun worship since they wanted to wipe out the blasphemous paganism and impose their Christianity. 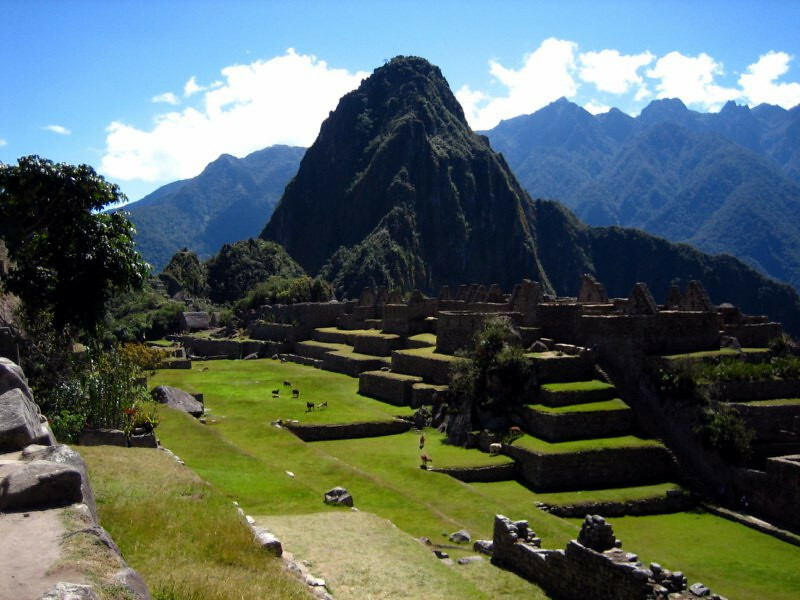 Intihuatana and Machu Picchu survived because the Spanish didn’t know about this hard to get to site during their years of conquest. 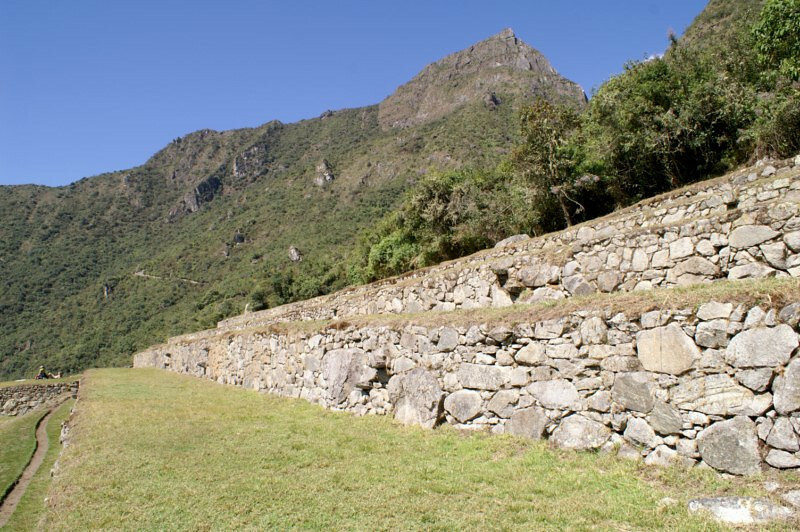 After the Incas abandoned the site probably in the 16th century, Machu Picchu was forgotten and taken over by the forest until her discovery in 1911 by Hiram Bingham. 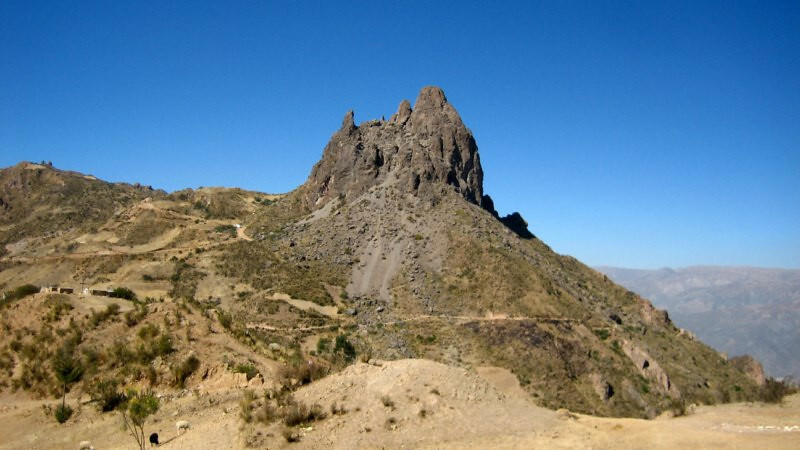 The stone was found at the top of this natural pyramid and carved into its present shape. 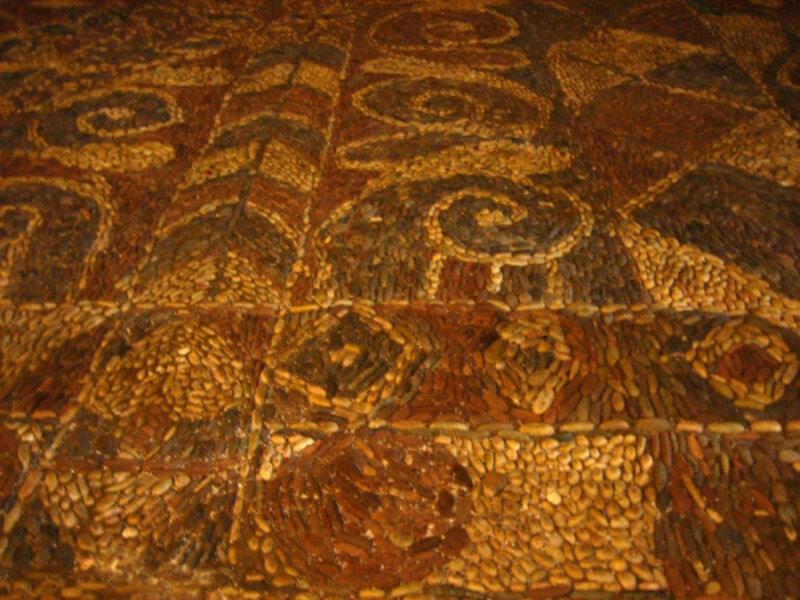 It’s believed to be a power center connected to one of the Earth’s chakras (focus of energy). 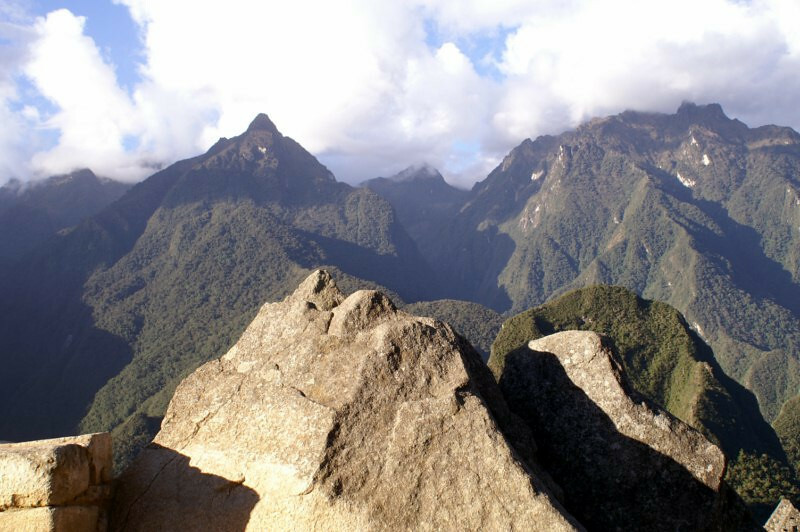 The four sides of the tip of Intihuatana point to four mountain peaks surrounding the site. Initially thought to be a sundial, it’s more related to the changing seasons with the solstices and equinoxes. 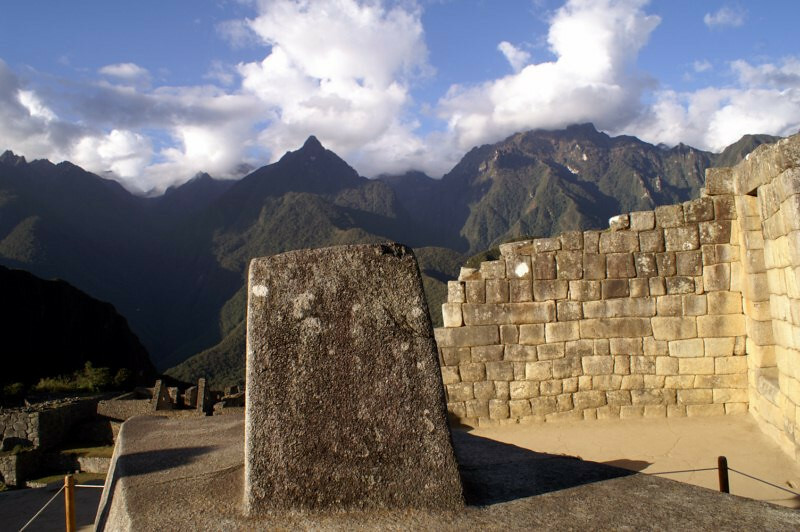 A girl following a tour guide’s instructions on how if she stood at this corner, near Intihuatana and faced south and the peak of Mt Machu Picchu, and if she opened herself up and focused intensely on the peak, energy would flow into her, leaving a tingling in the fingers. I tired it and didn’t feel anything. Roof-less buildings blending in with the surrounding mountains. 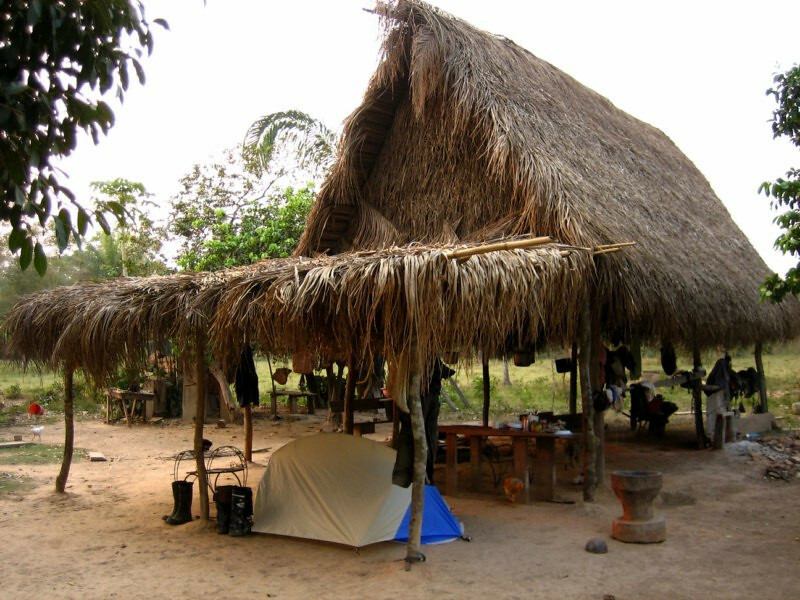 The roofs were probably made of thatched grass. The natural pyramid, upon which the stoned terraces were built on. 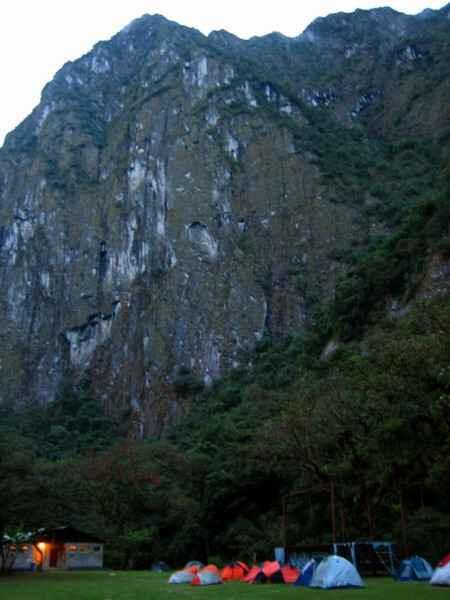 Intihuatana sits at the top. 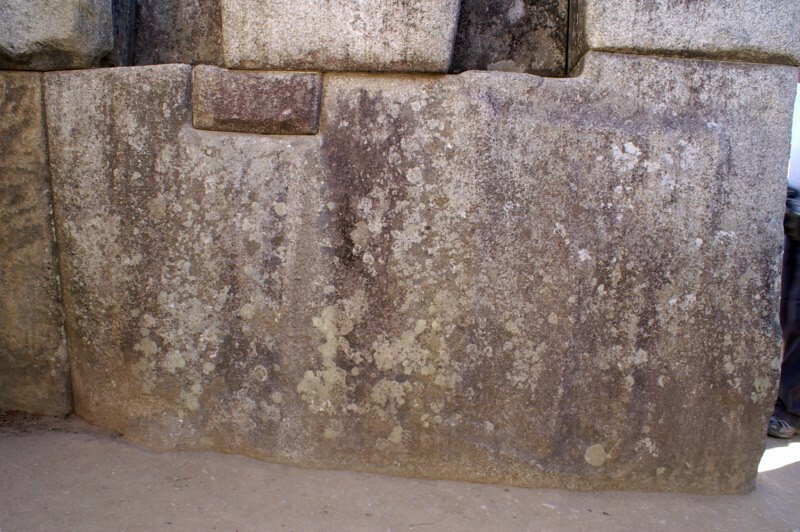 The un-used granite blocks indicate that 1) the mystery of how all these stones were brought here was that they used whatever rocks they found in the area and 2) construction was still on-going when the site was abandoned. 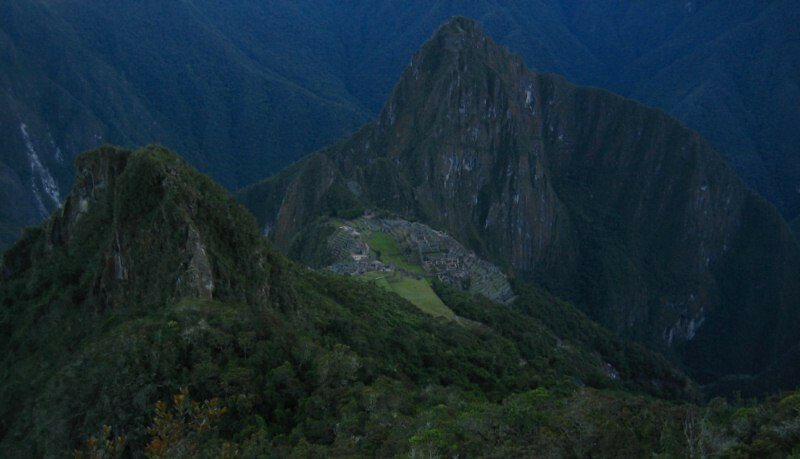 A wider view with the pyramid and sacred sites on the right under Mt Machu Picchu. 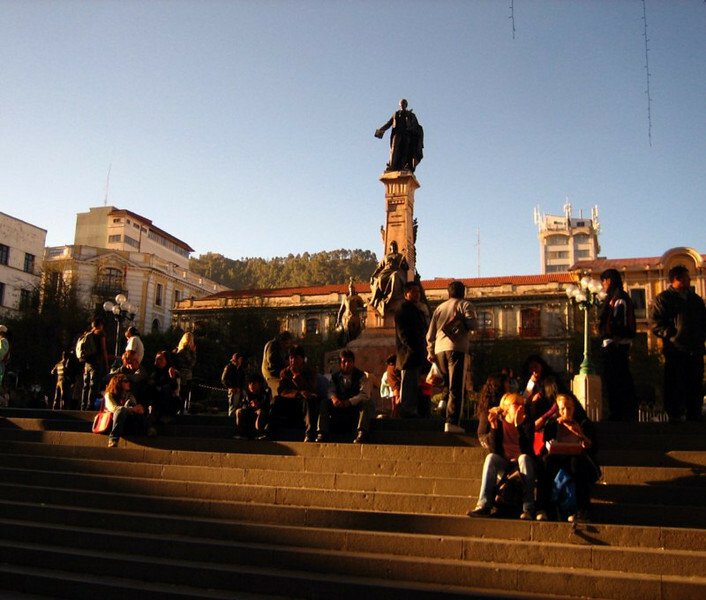 There was an obelisk in the center of this grassy plaza and in a show of indigenous pride, Alejandro Toledo, the country’s first native Quecha-speaking president wanted to host his inauguration ceremony at Machu Picchu in 2001, so they removed the obelisk for his helicopter to be able to land. Doesn’t seem right. 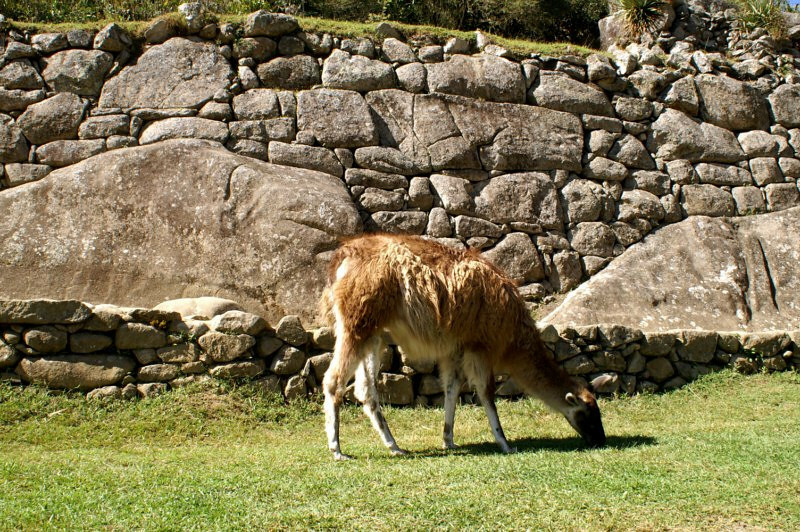 A llama, up close on the grounds of Machu Picchu. 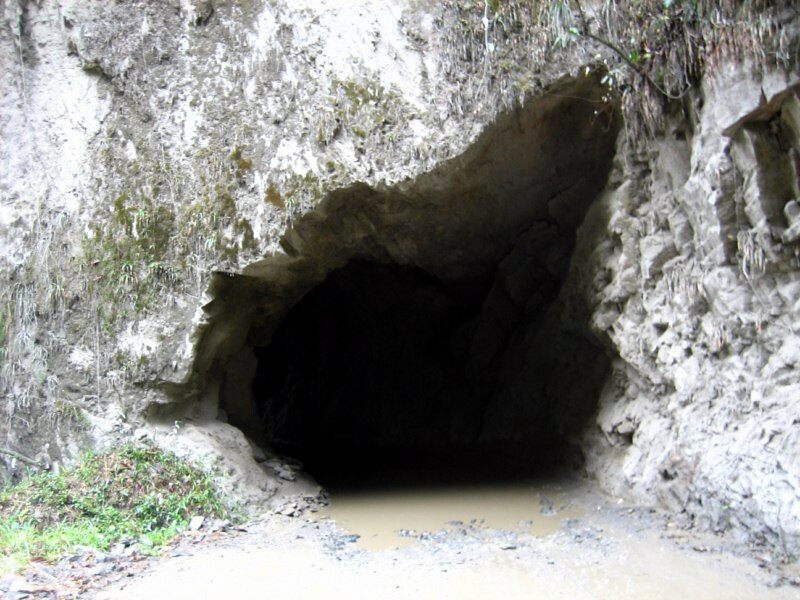 His ancestors probably roamed this area during the Inca days. 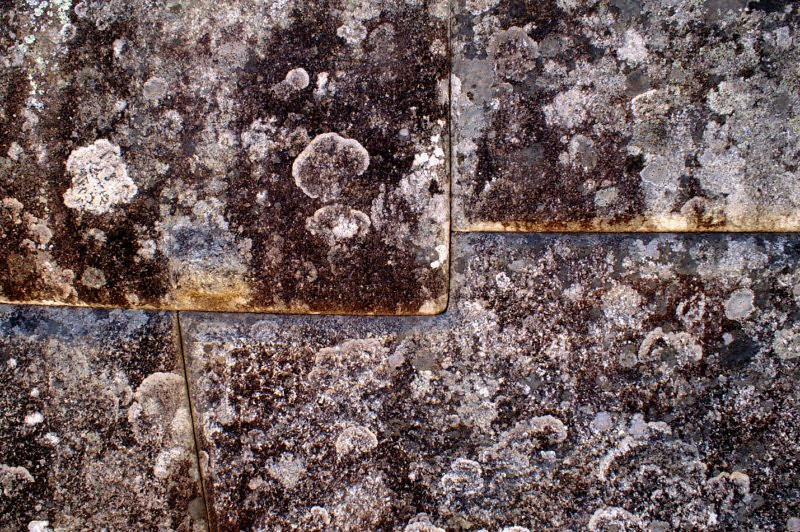 A granite block outside the principle site in the process of being split along its natural cracks. 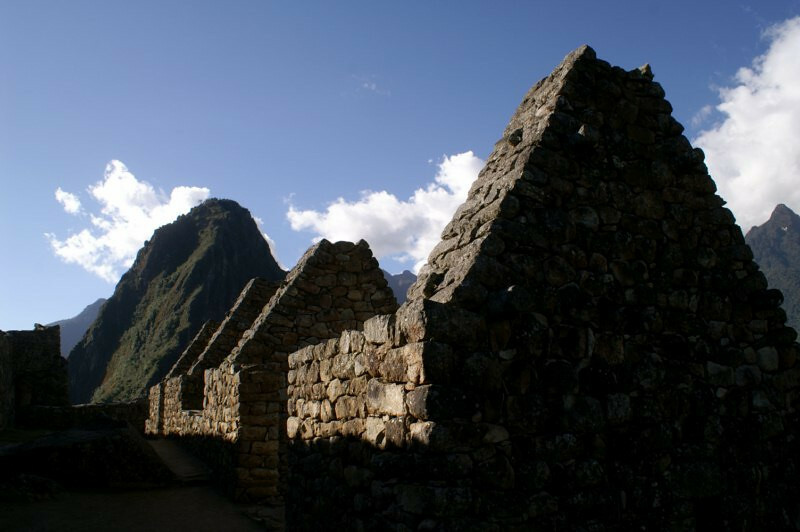 Roof-less buildings with Wayna Picchu showing the shape. What’s left of the water supply to the city; today’s it’s a small trickle. 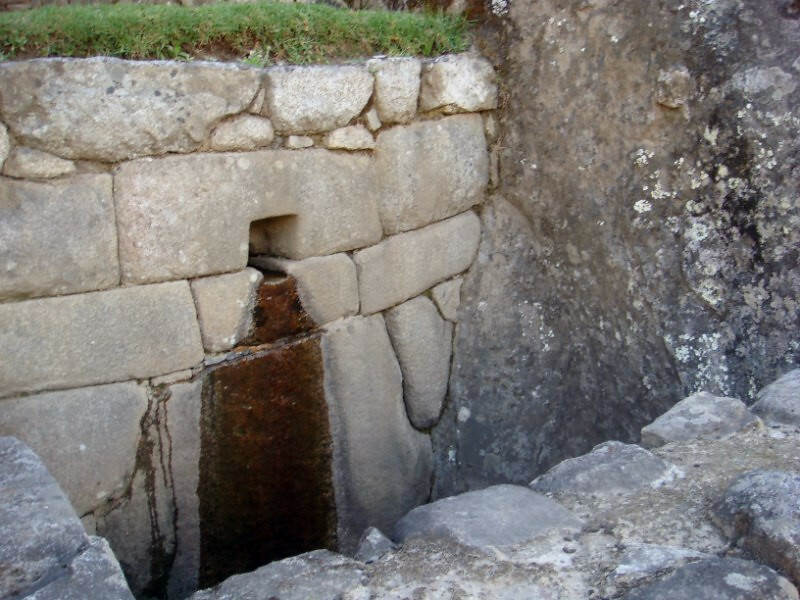 They’ve found intricate water channels bringing water from rivers to satisfy the city. 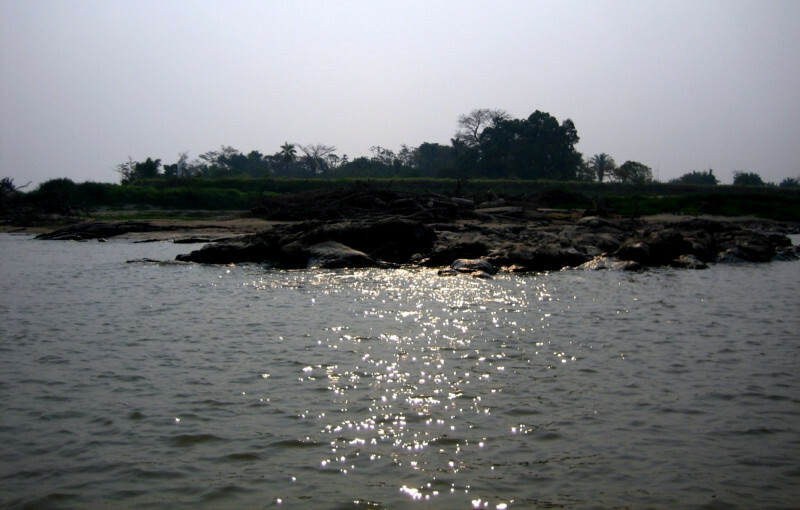 Water is also thought to be important in their rituals. Temple of the Condor. Can you see it? 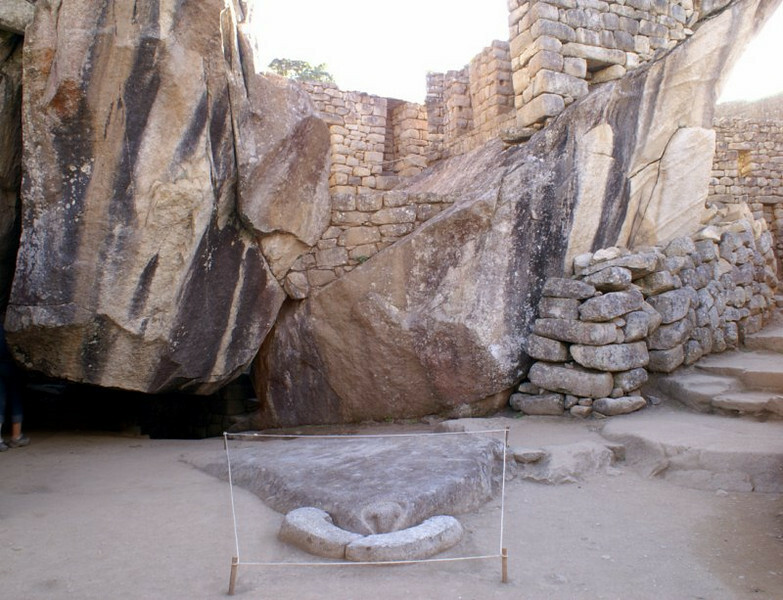 The wings of the condor (similar to an eagle) are the two big granite stones behind, spread high. 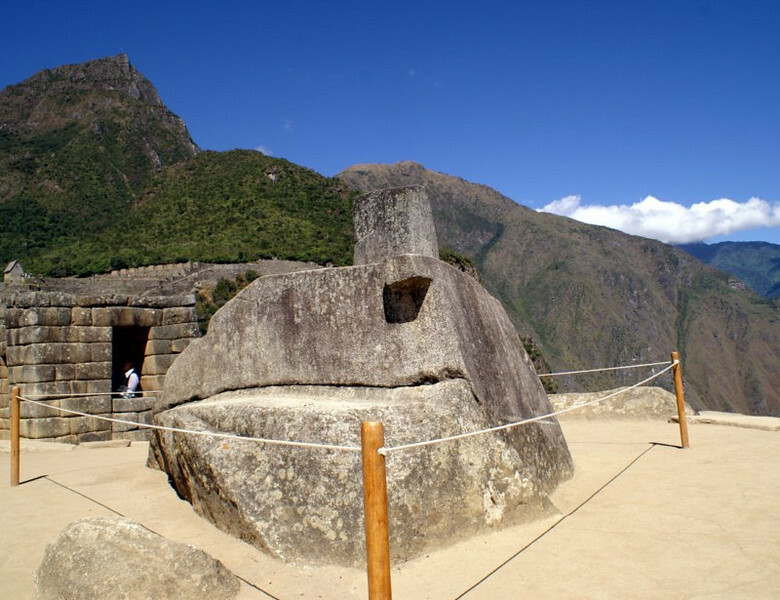 The body of the bird is the flat stone on the ground and the Incas laid some white stones to represent the white collar around the bird’s neck. 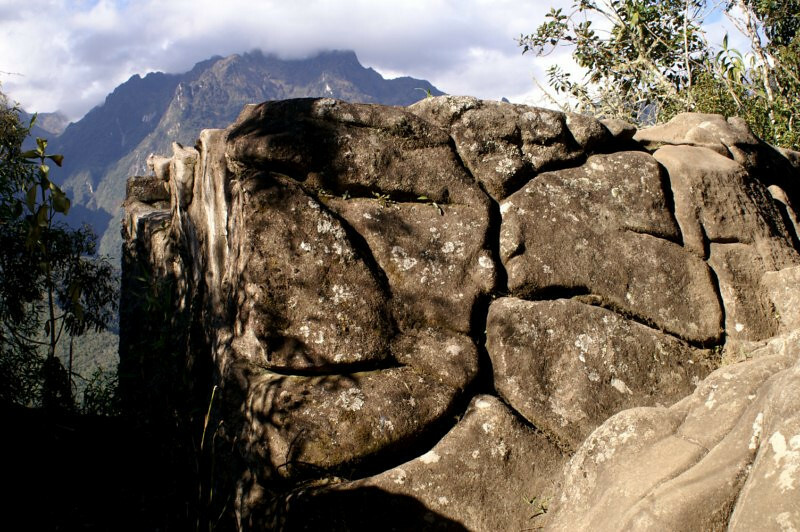 And like other sacred sights at Machu Picchu, this too was found by Incas as it is naturally and only the white patch was added. 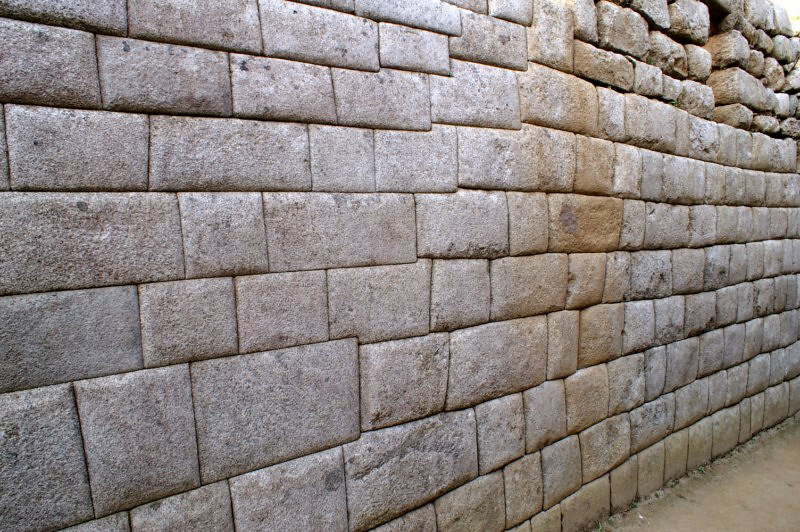 The walls of the Temple of the Sun. 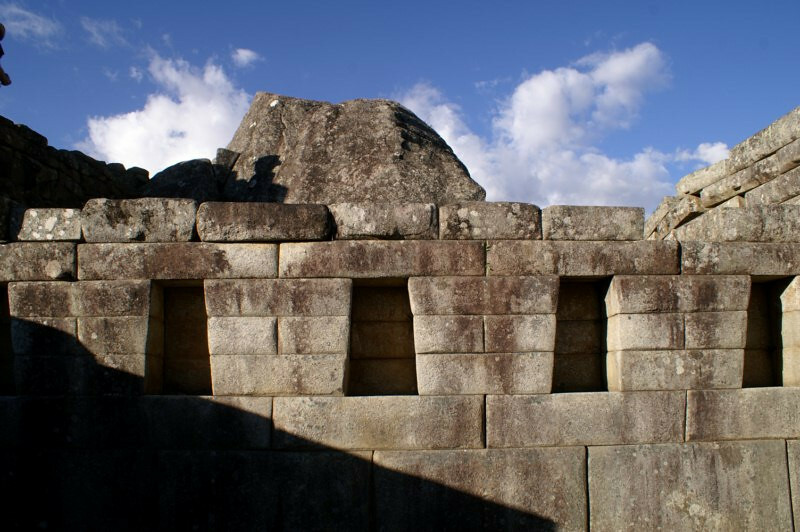 A nearby tour guide pointed out how the perfectly straight cut lines, on the left, signify a sacred part of the temple and further to the right, the cuts are more rounded, signifying a less important structure. They must’ve valued their stone-cutters; similar to modern-day society’s engineers, I think. 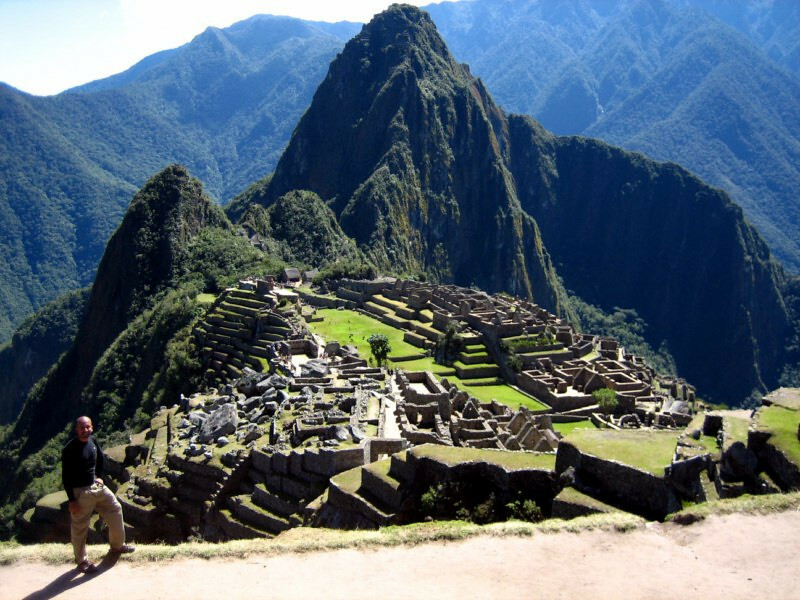 The most sacred sight at Machu Picchu, the Temple of the Sun, central to the Incas. Also, this is the only round building on site, signifying its importance from the other rectangular buildings. 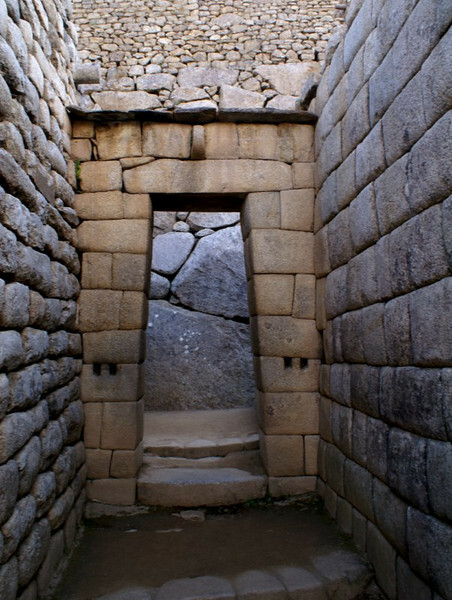 Stairway leading into the temple, carved out of a single block of granite. It was getting worn down from all the tourist traffic that they’ve closed it off and directed traffic to the wooden stairs. 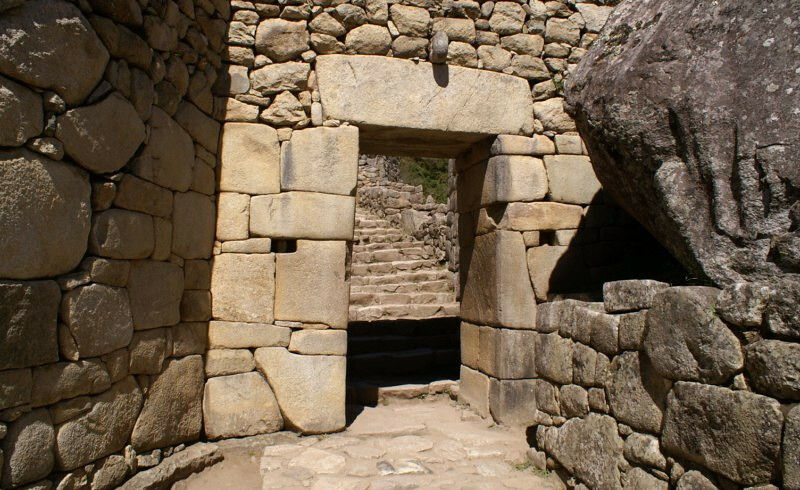 Entrance to the Temple of the Sun. Hmmm, rounded stones on one wall and straight-cut on the other. The temple was to the right. Strange inter-locking between stones. It doesn’t connect to anything behind it, so, why cut the channel and put a different rock in? They probably had good reasons. A room called the Sacristy, where if people in different windows hummed a harmonic vibration, like Omm, some sort of bouncing audio waves created an energy buzz in the room. Looking from the sacred side of the city to the residential side. They sure had a good view. 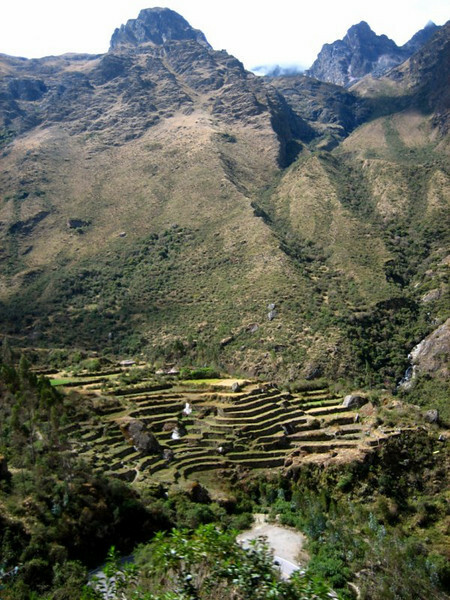 Agricultural terraces, under the watch of Mt Machu Picchu, going quite far down the steep cliff towards the river. 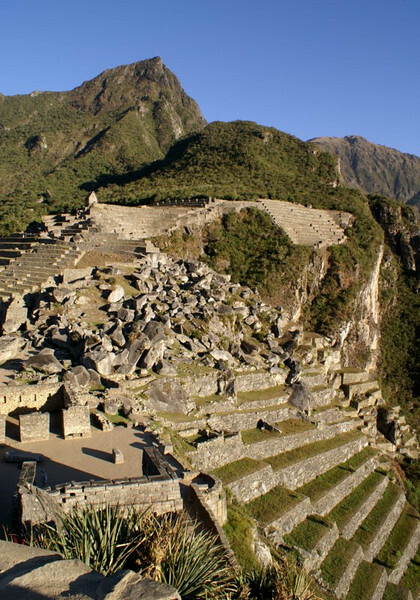 Some archaeologists argue that Machu Picchu was used as an agricultural experimentation area for the kingdom, due to the various climates that could be achieved along the cliffs around the city. 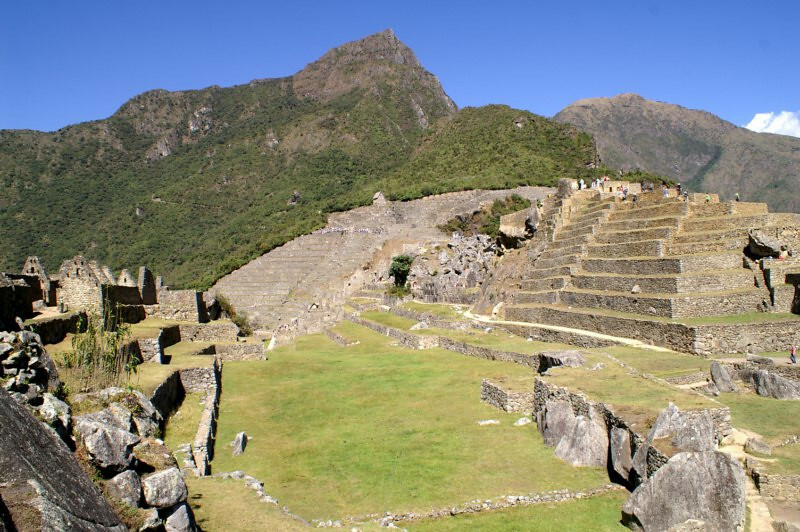 Terraces have been found around the mountain at various elevations. 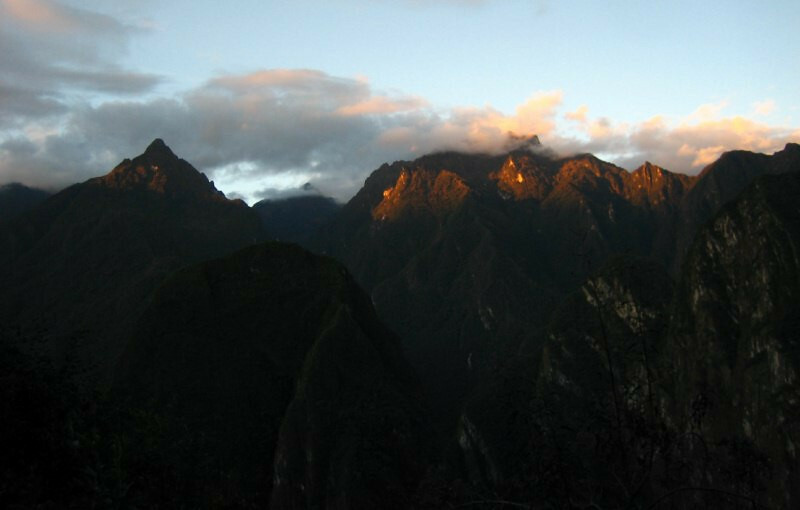 Machu Picchu at sunset with the nose of the Inca shining in the setting sun. Nice to spend a whole day at the site (waiting for nice lighting conditions). 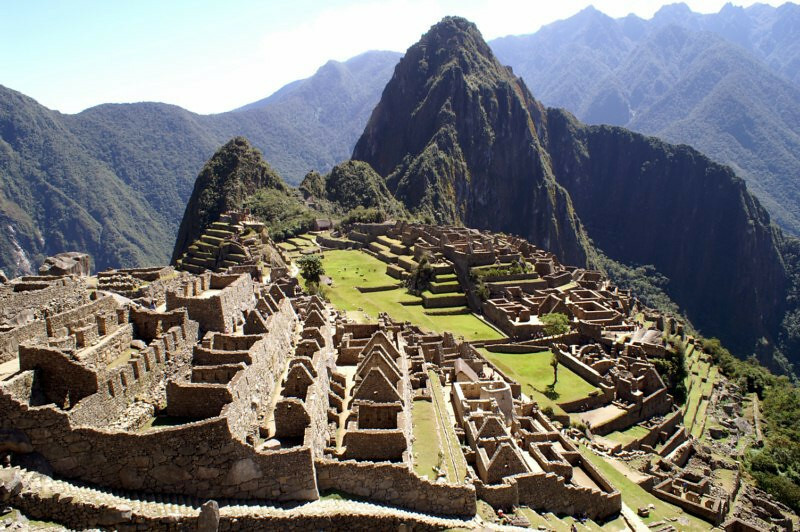 Even if you don’t like ruins, the location is quite spectacular and I can see why the Incas chose to build a sacred city at this site. 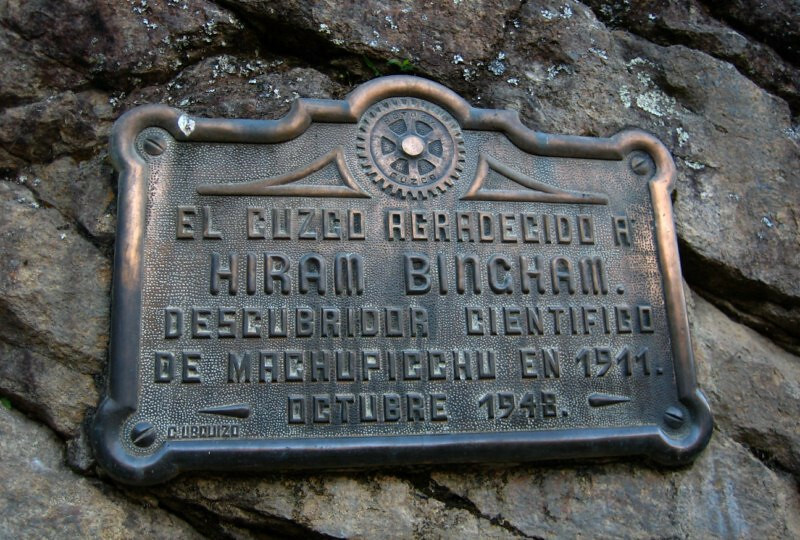 A plaque in remembrance of Hiram Bingham’s discovery of Machu Picchu in 1911. 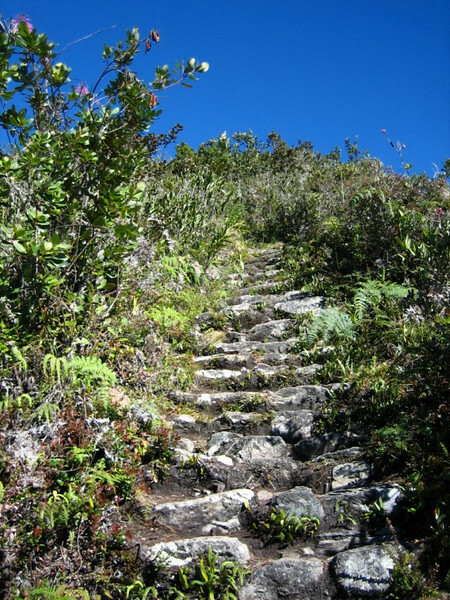 On way back down, we saw the steps that we climbed at night under the starlight. 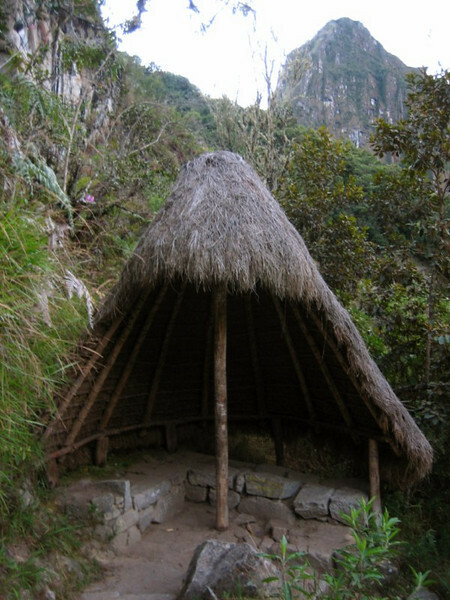 A rain shelter hut on the trail up the mountain. 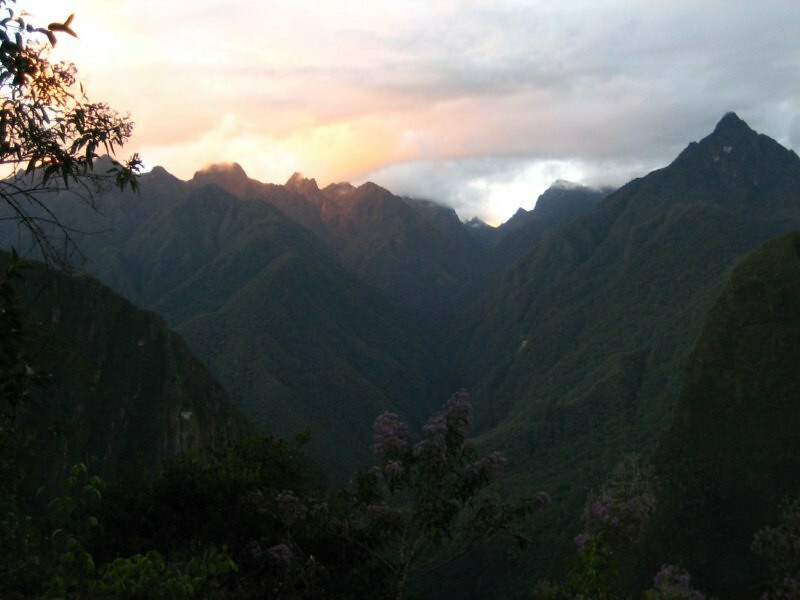 Sun setting over the Machu Picchu valley. Gorgeous colors to finish an exciting day where I climbed up and down a total of 3,050 m (10,000 ft) in elevation changes. 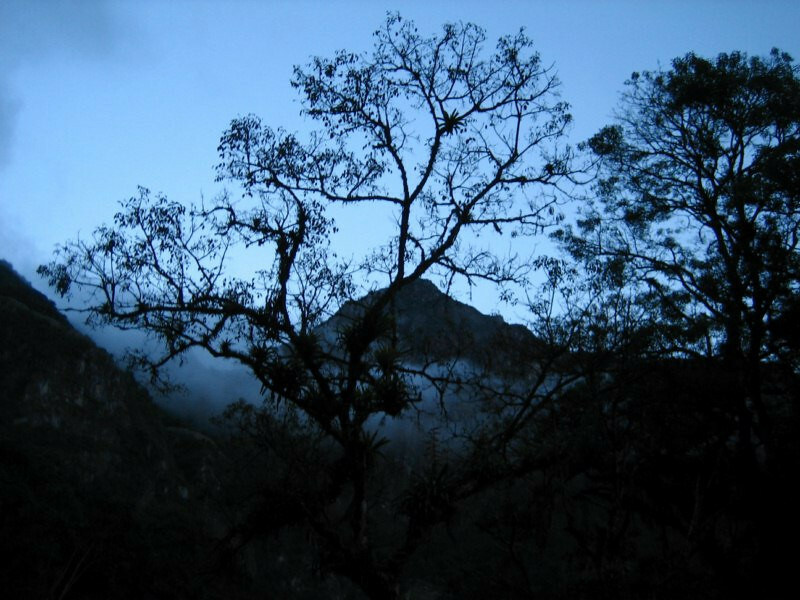 The next morning, getting an early start before dawn for the long journey back to Machu Picchu. 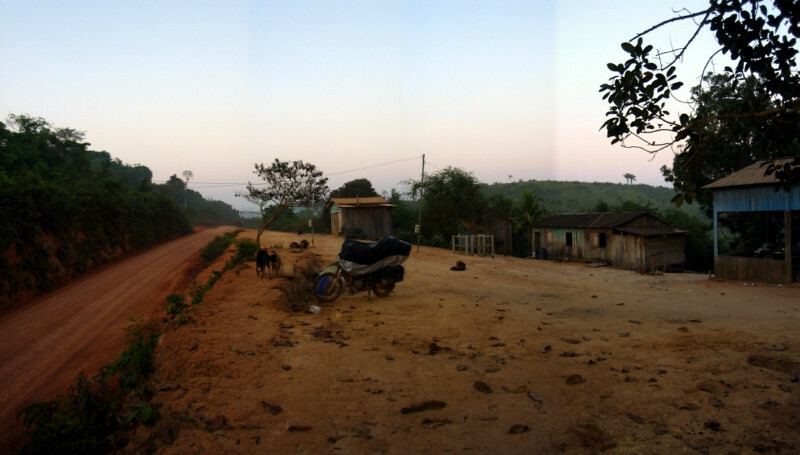 Arriving in Santa Teresa by breakfast. 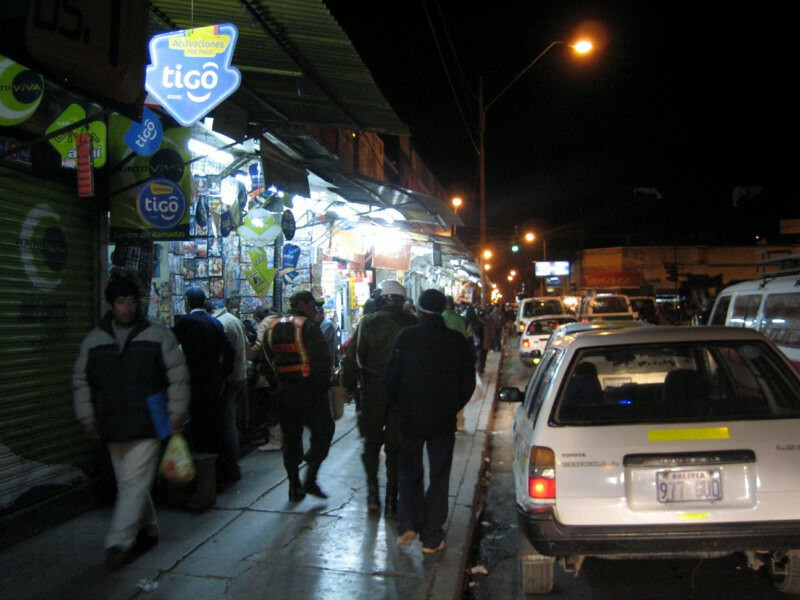 In Santa Maria on the main road, waiting for the bus to Cusco. 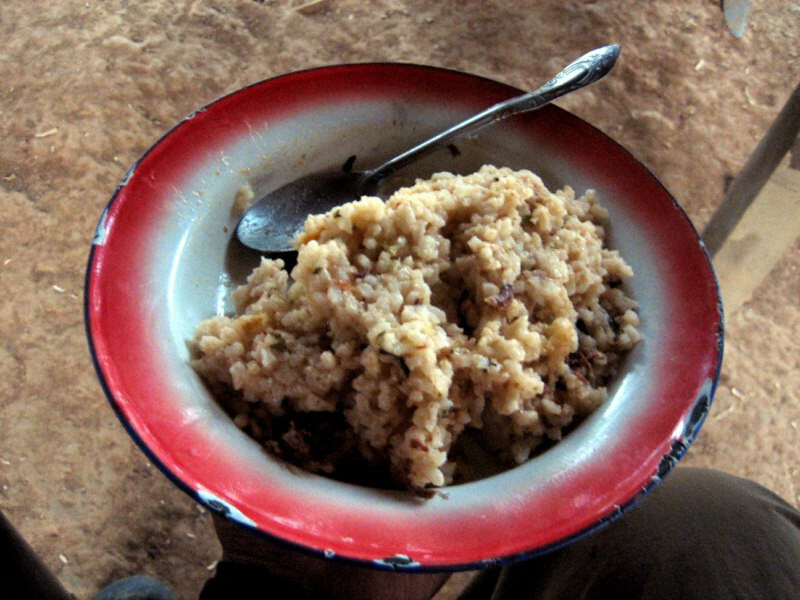 Having a hearty drink of quinoa for S/.1. Enjoying the beautiful scenery on the way back. 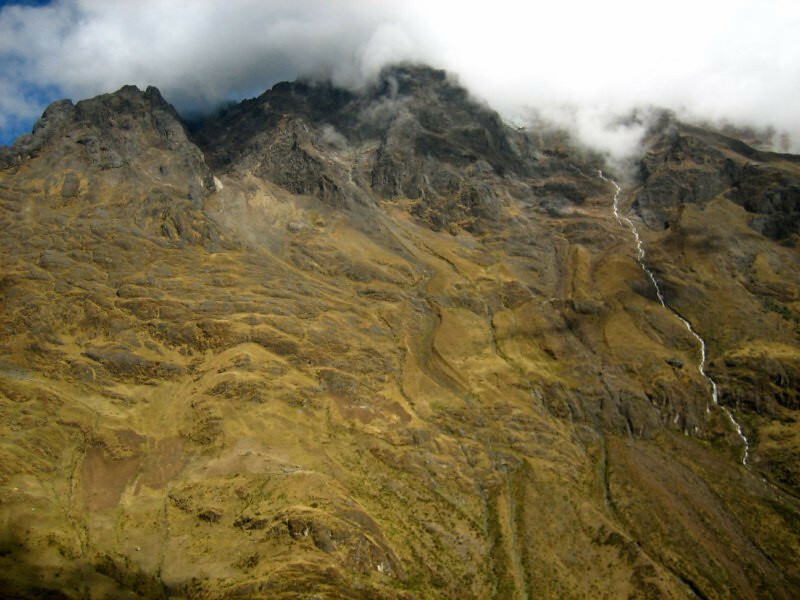 A stream coming from a glaciated-peak under the clouds. 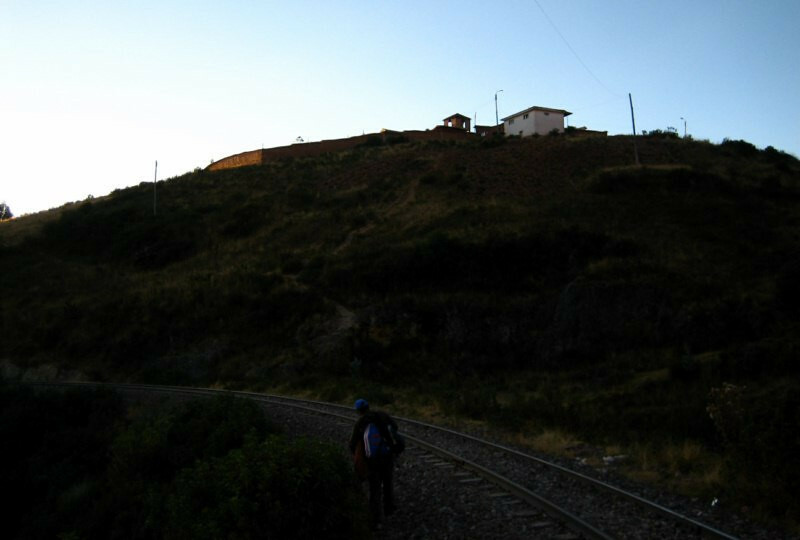 Walking back to the farm for one last night in Cusco, before continuing south.